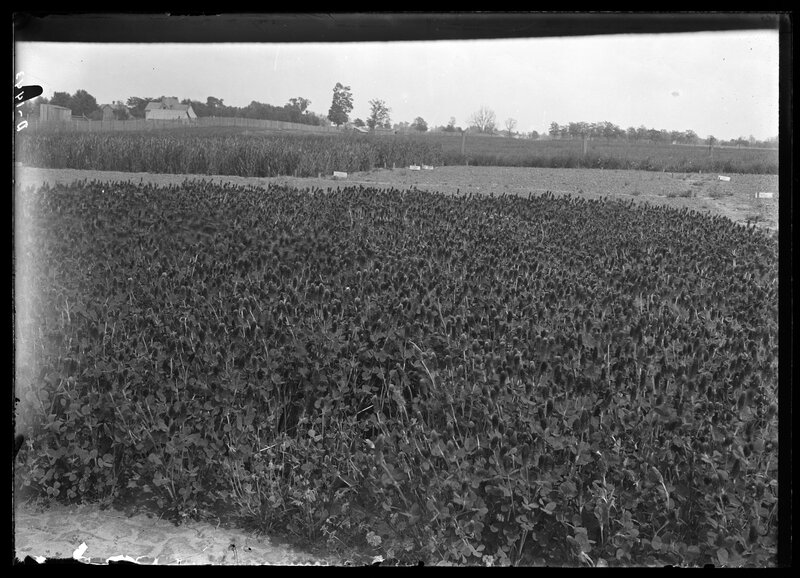 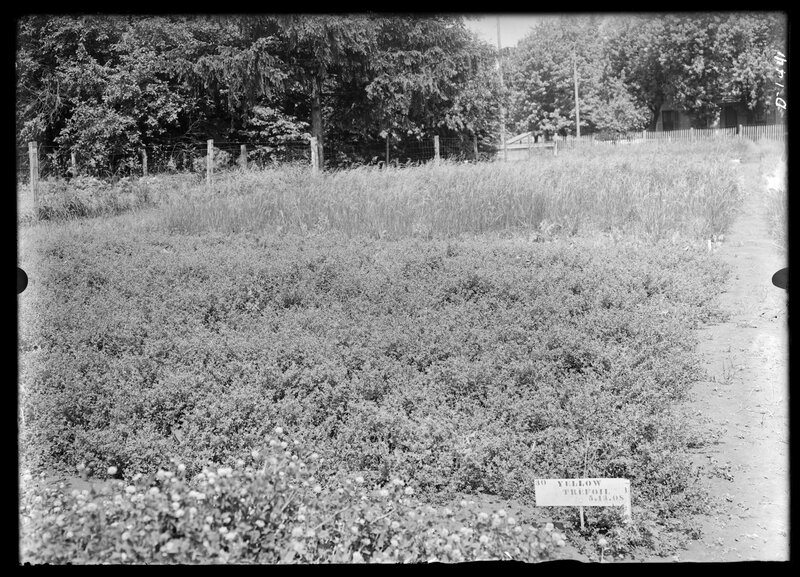 Field and laboratory images from the Departments of Entomology and Botany in the Agricultural Experiment Station at the University of Kentucky, 1895-1948. 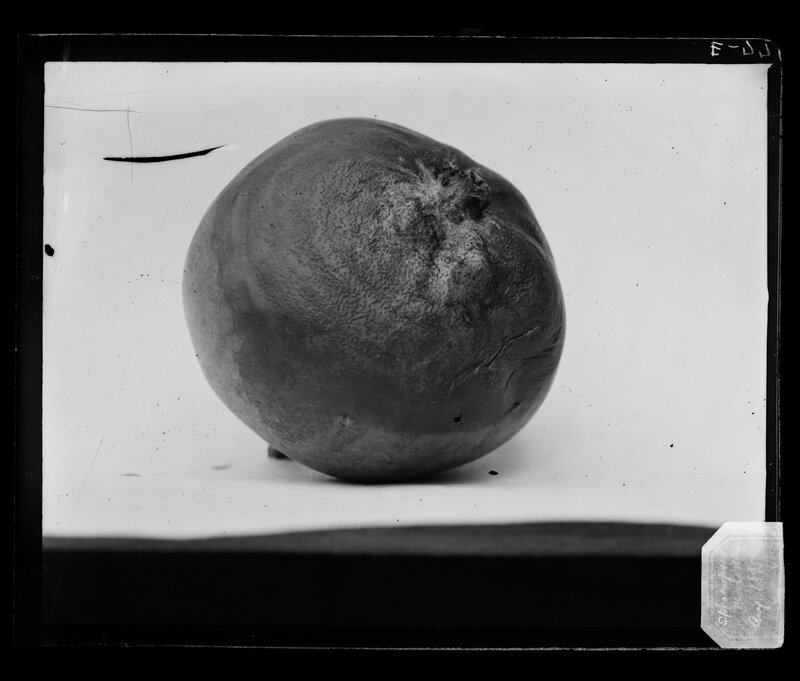 This collection is described at the item level and has been left according to the original numbering system and inventory. 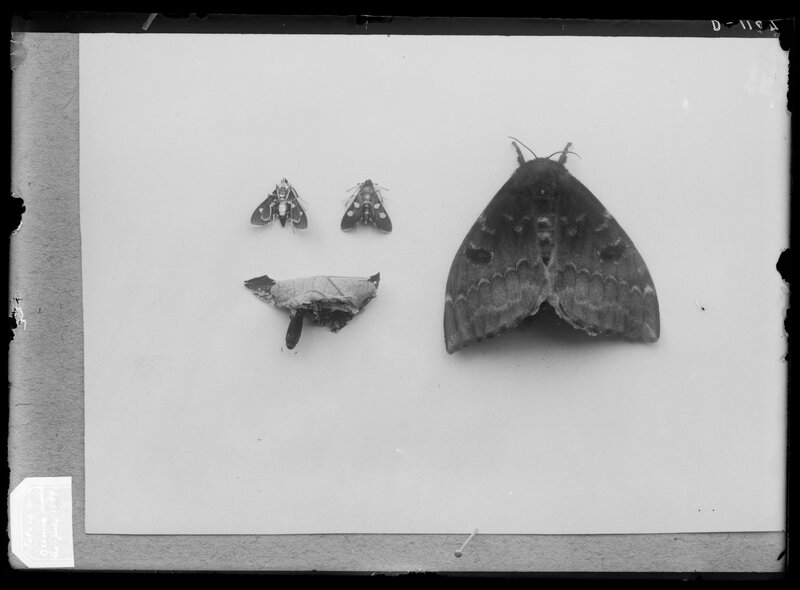 It is arranged into two series by old accession information. 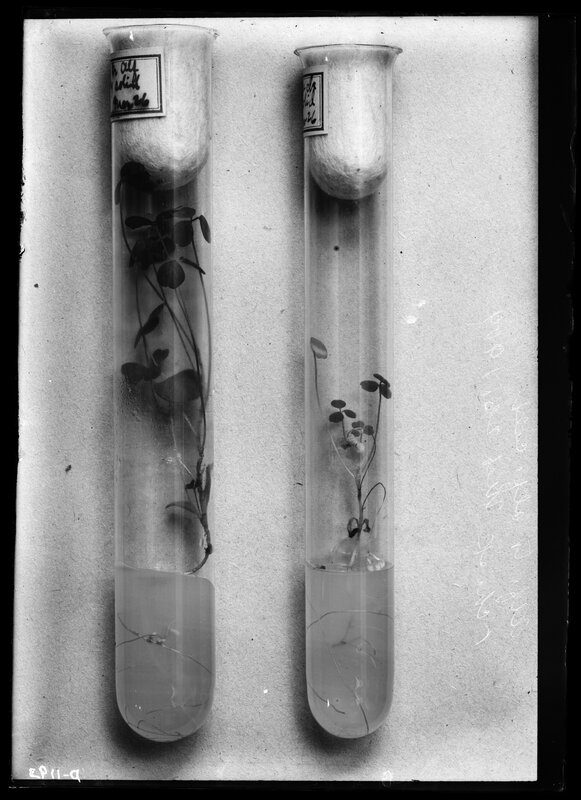 Note: The original envelopes that housed the negatives have been retained and are stored in two boxes at the end of the range of the collection. 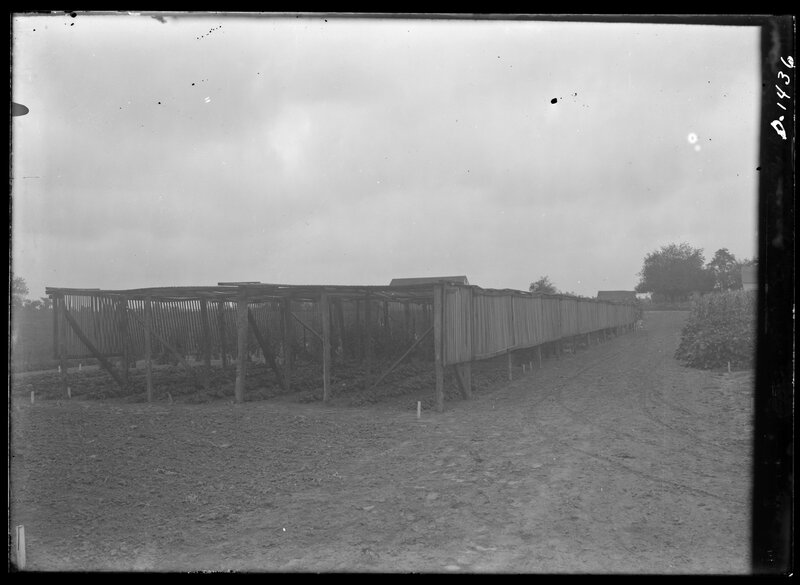 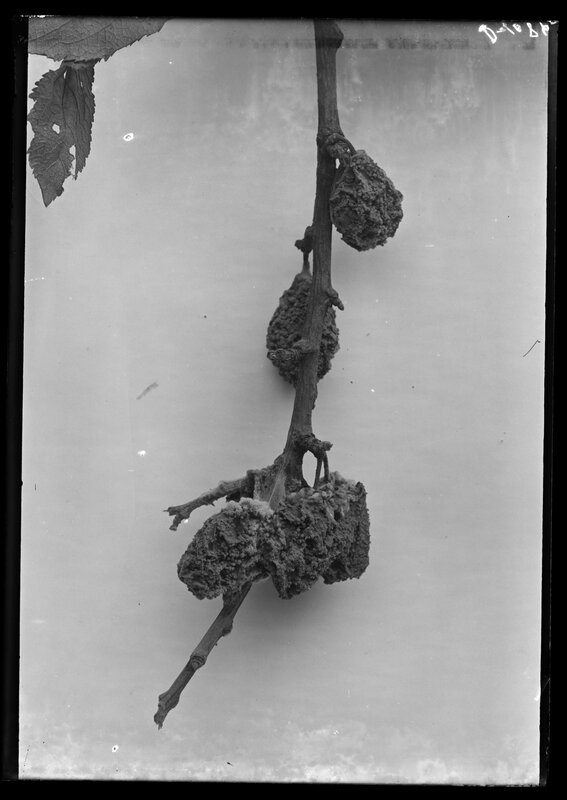 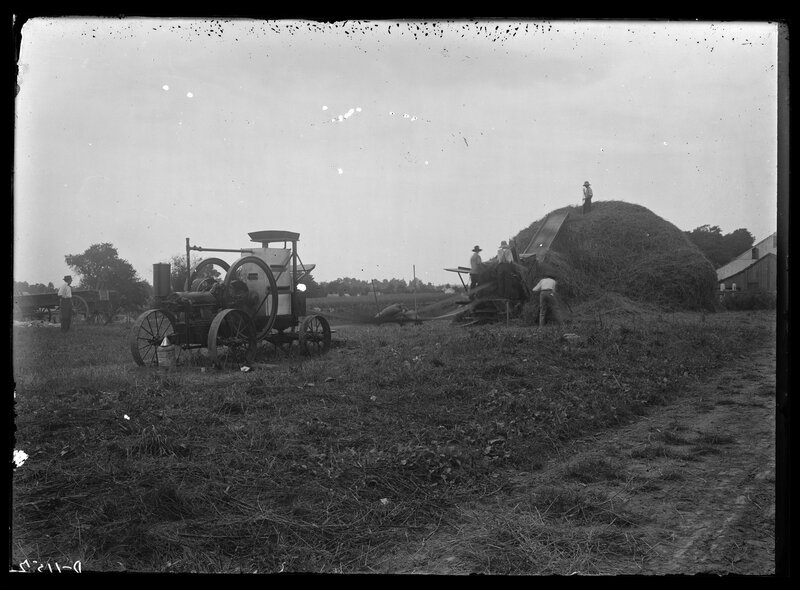 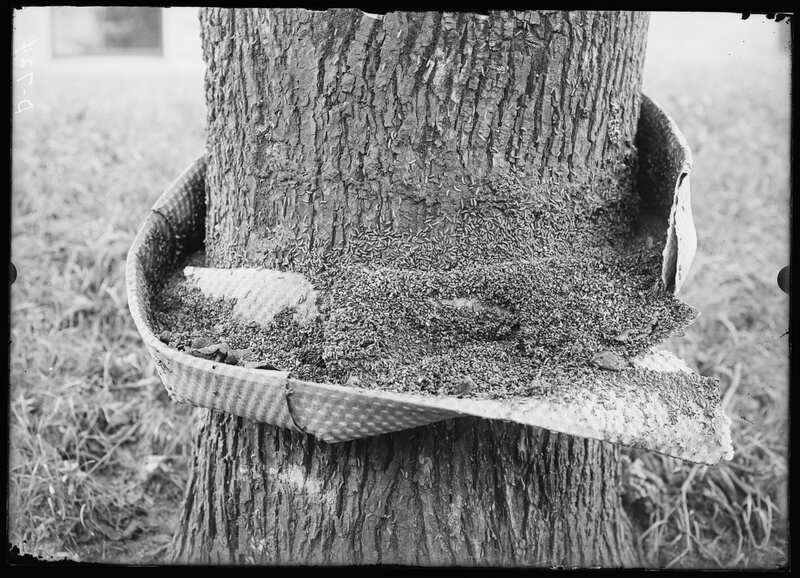 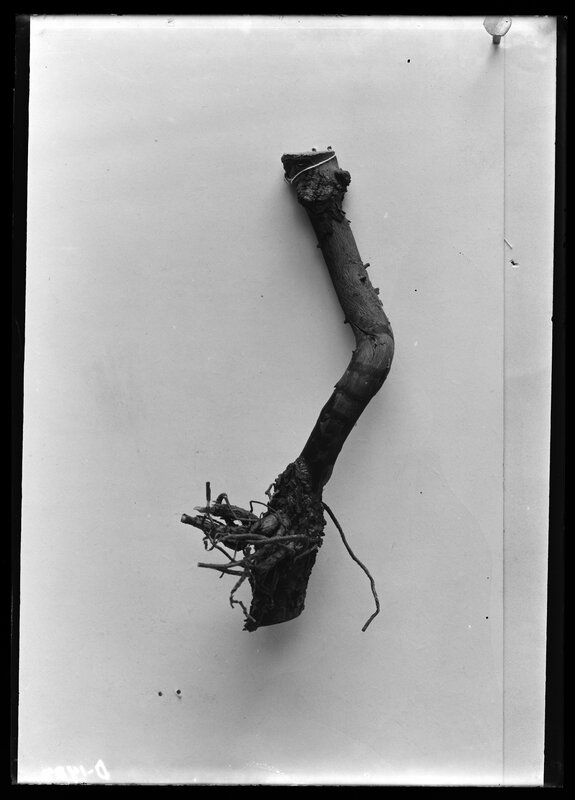 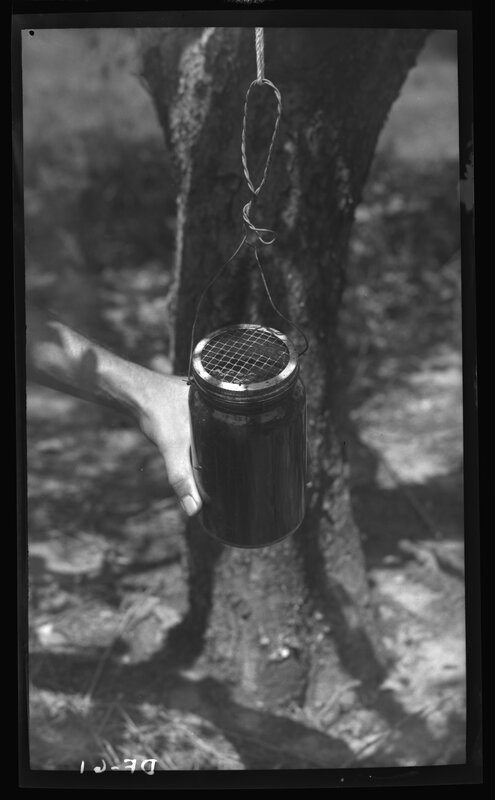 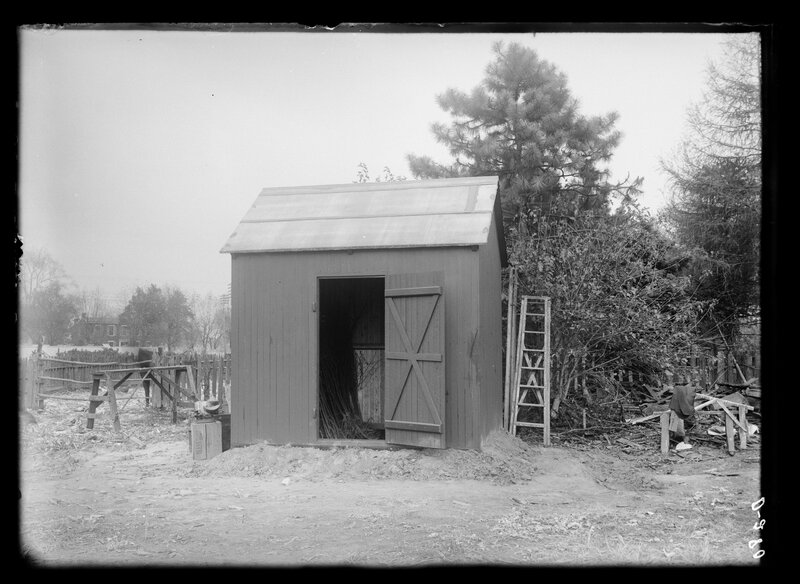 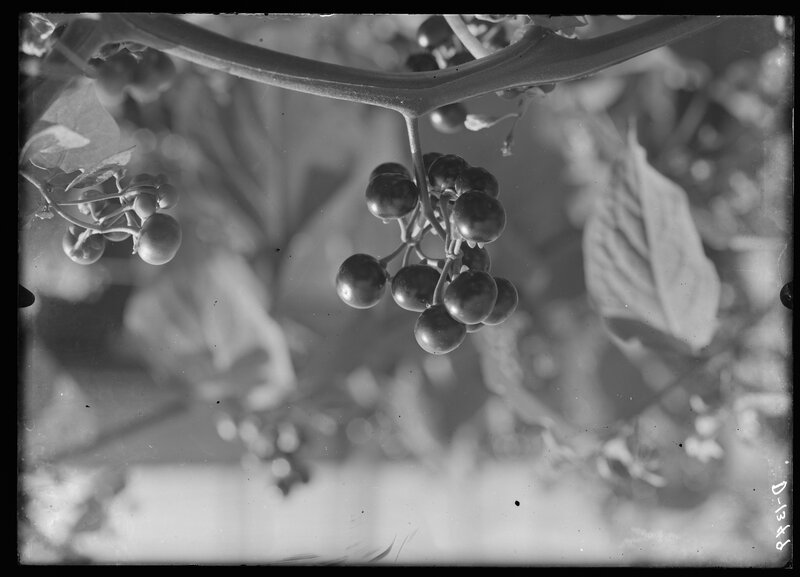 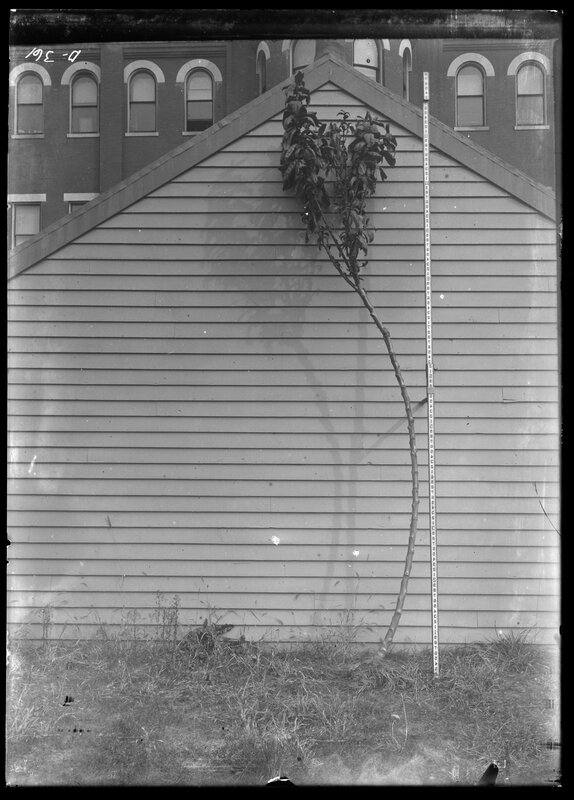 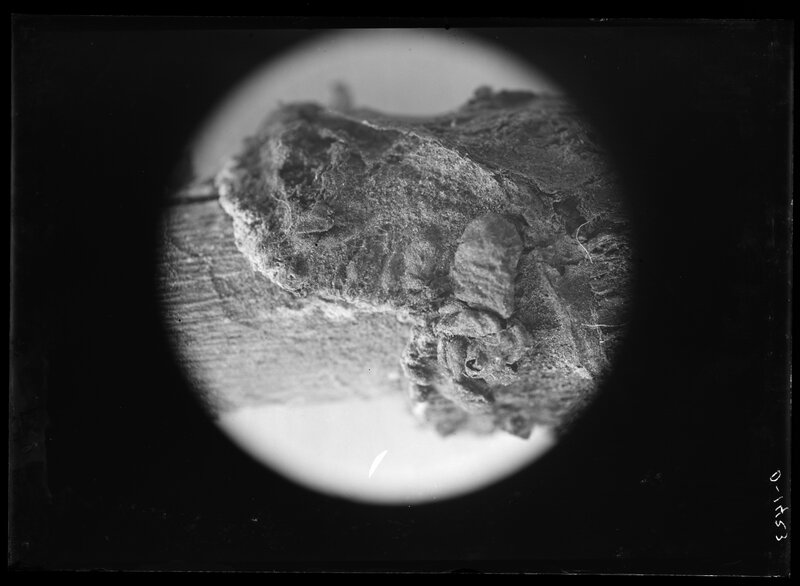 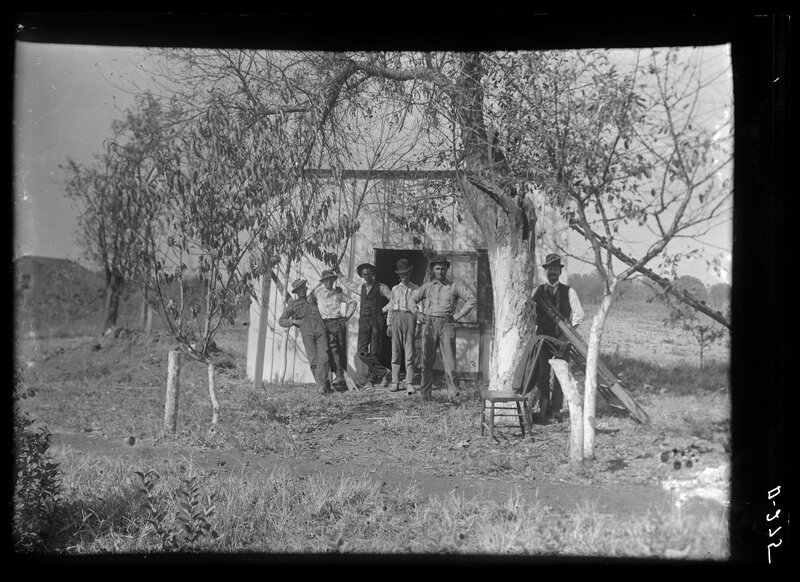 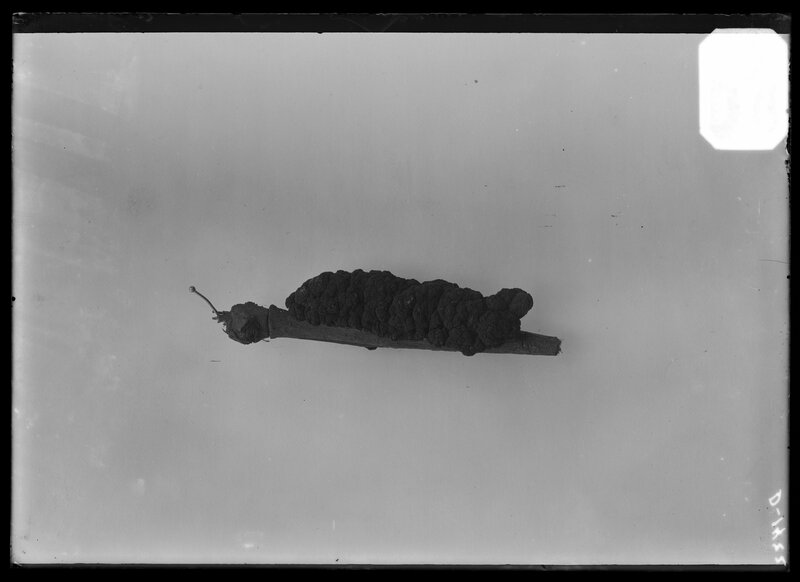 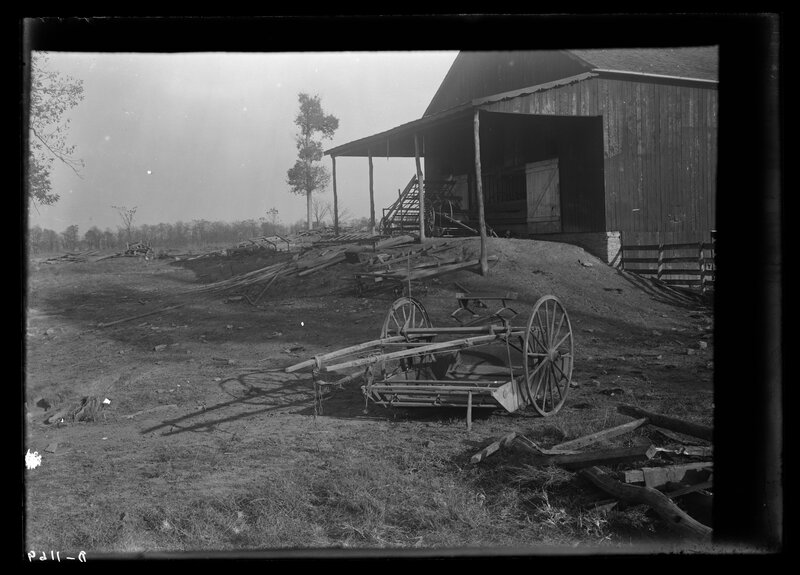 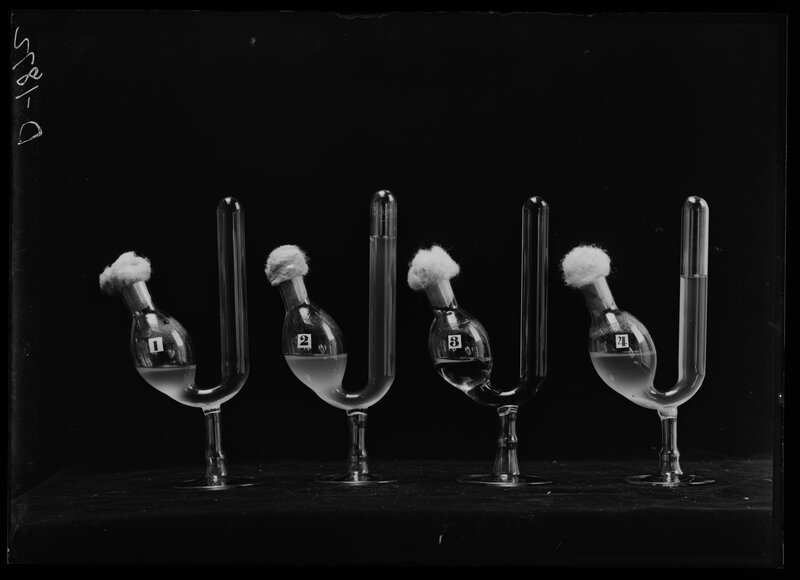 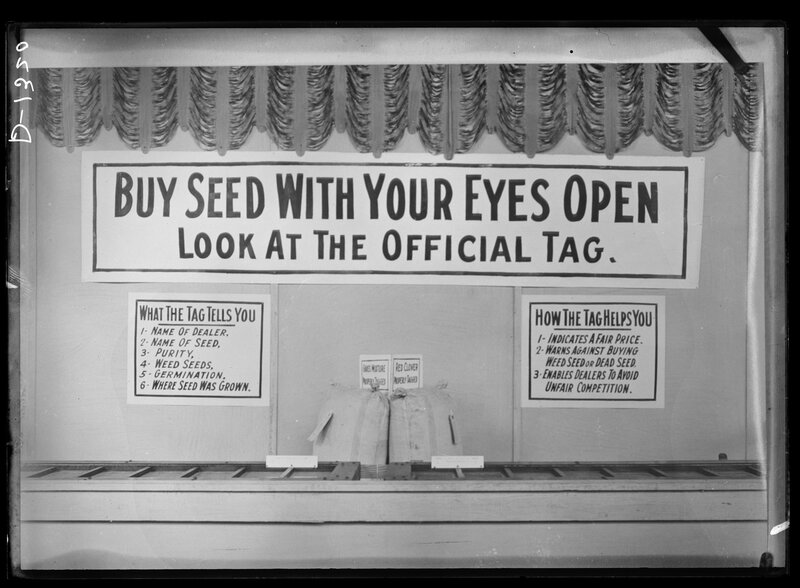 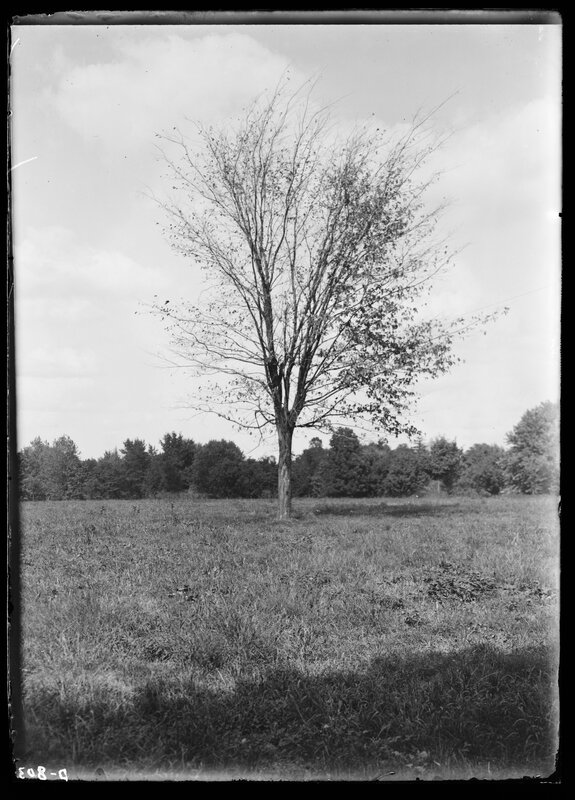 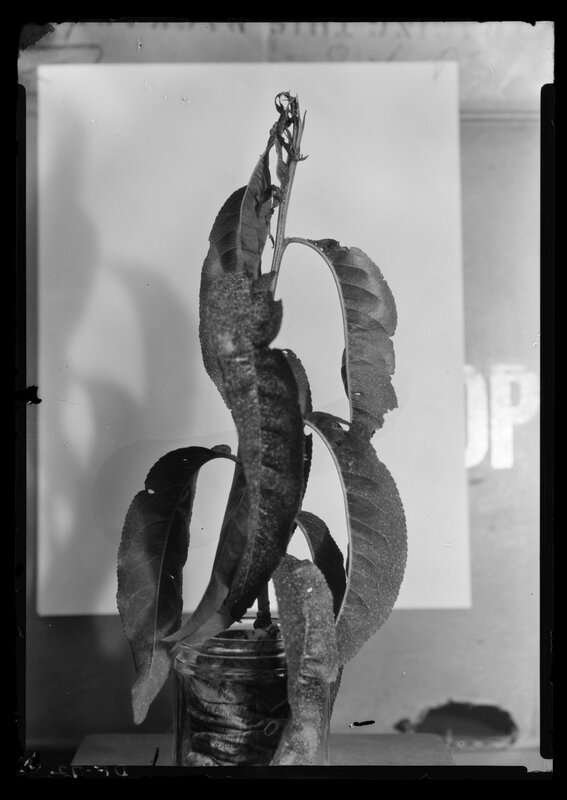 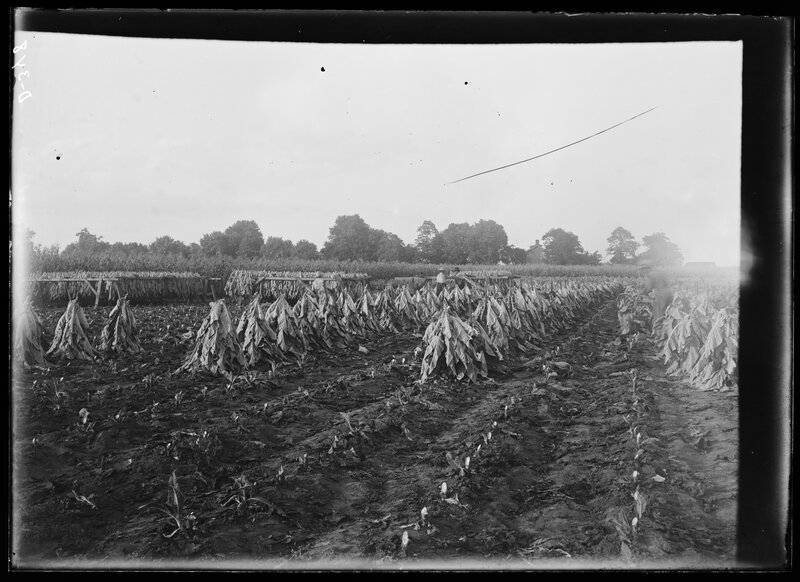 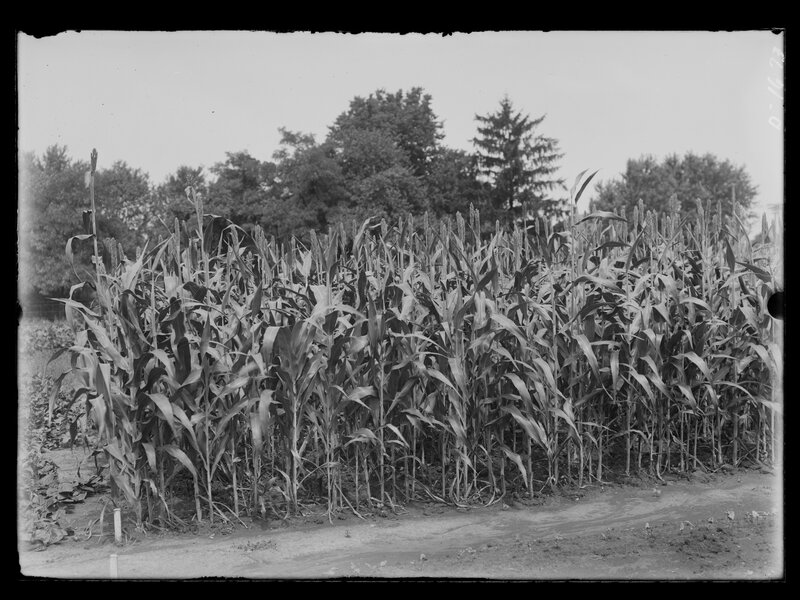 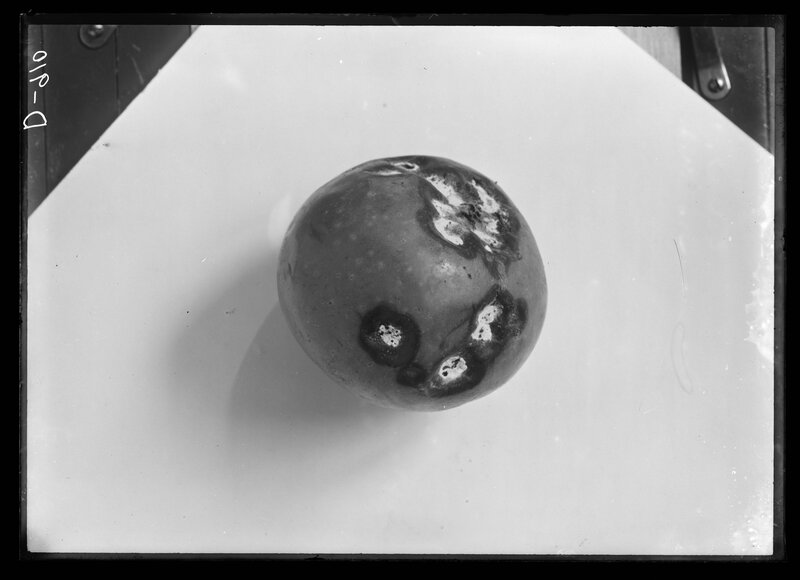 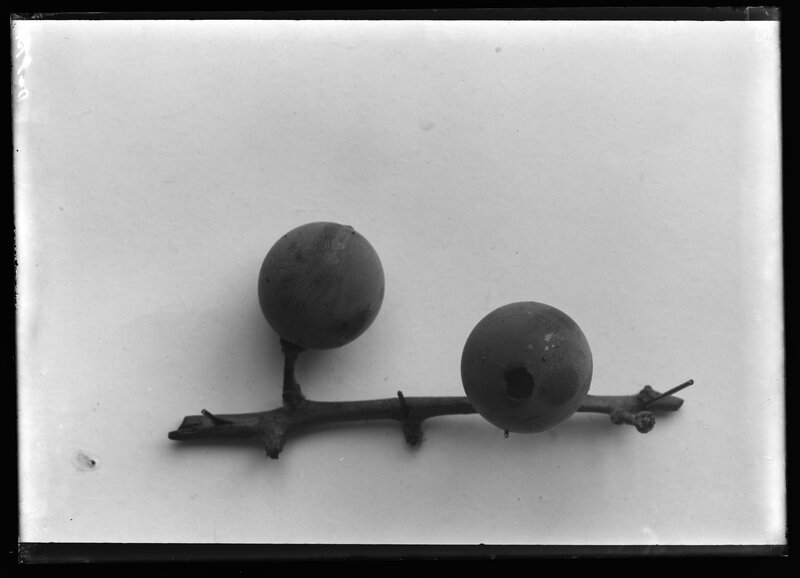 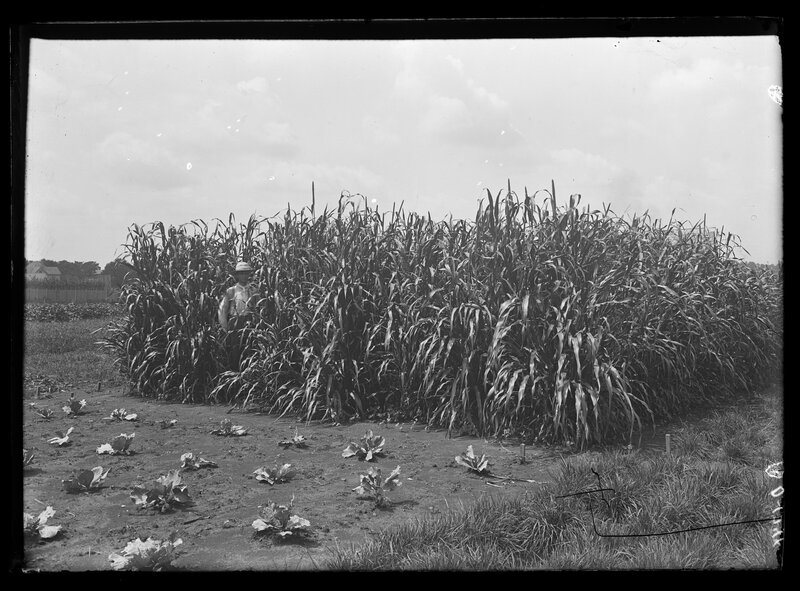 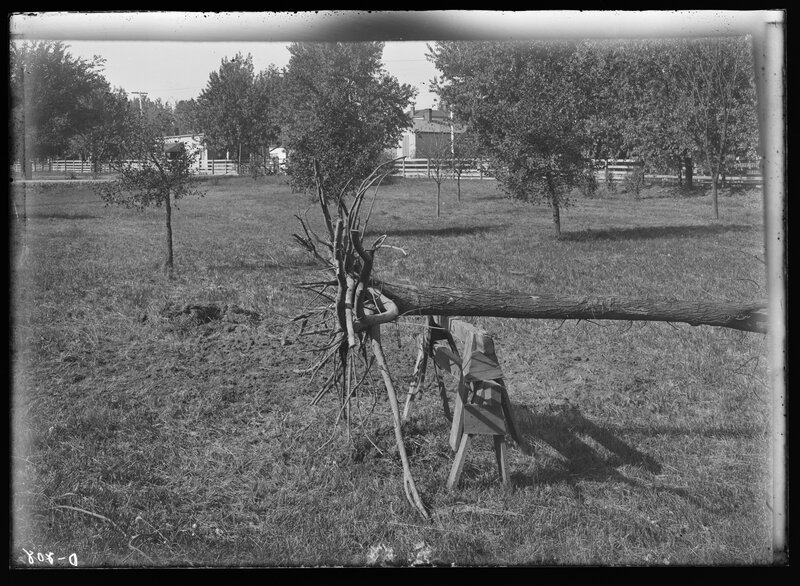 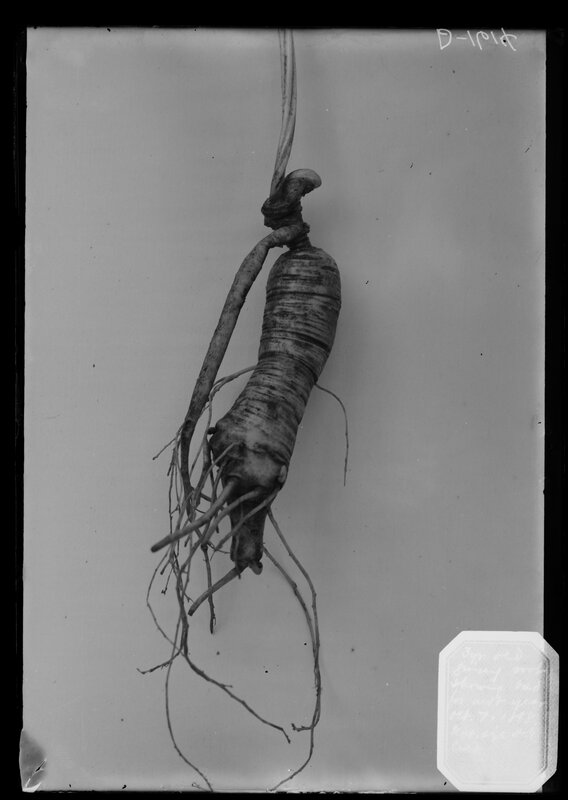 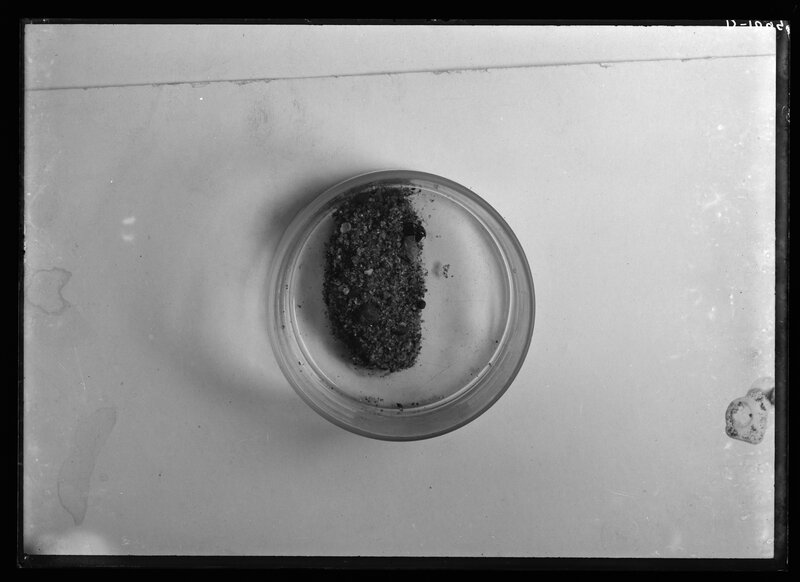 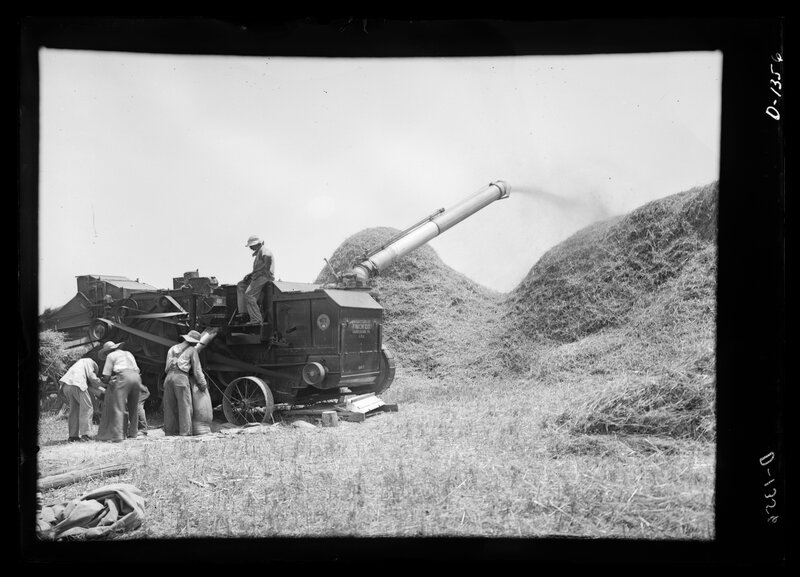 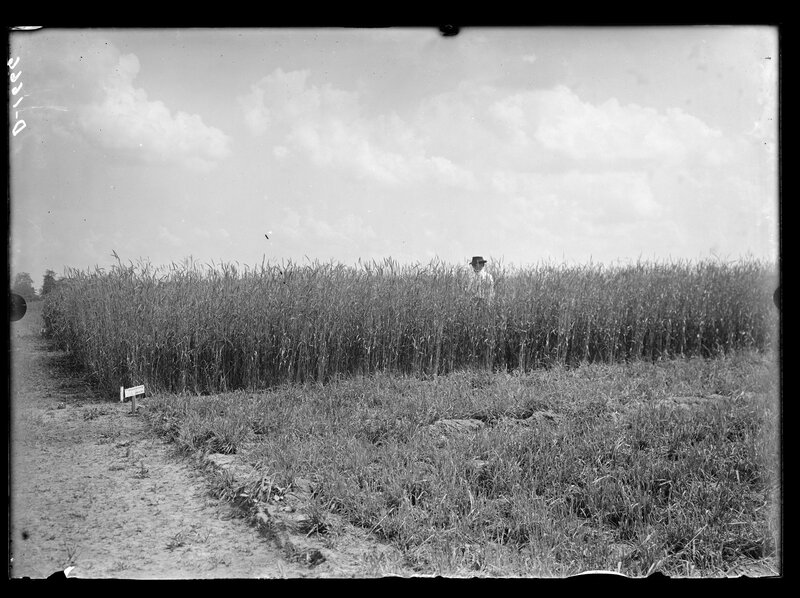 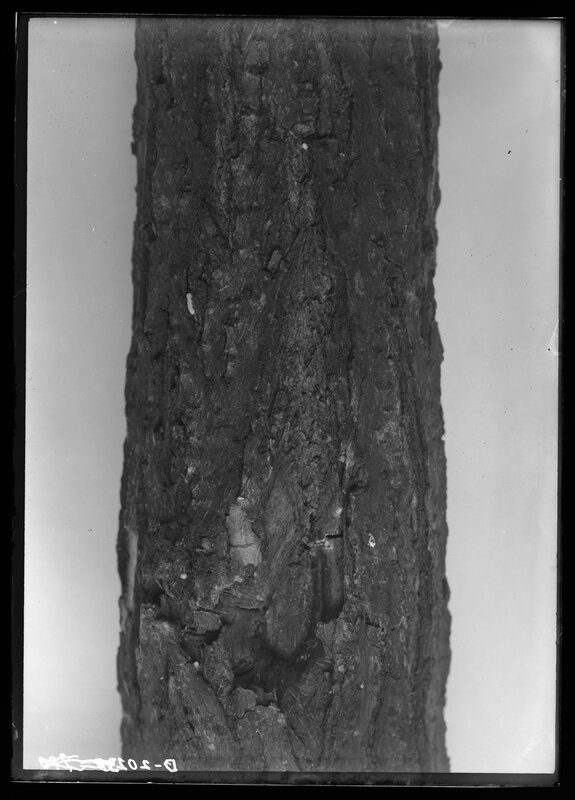 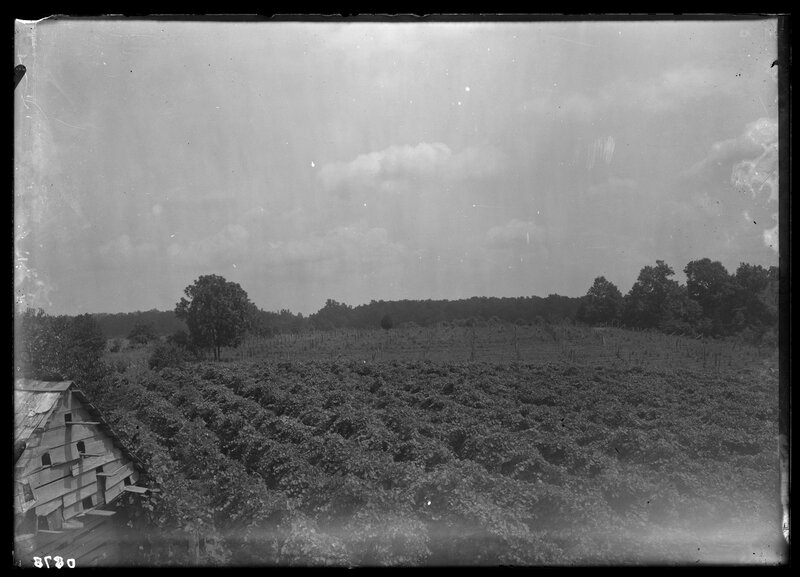 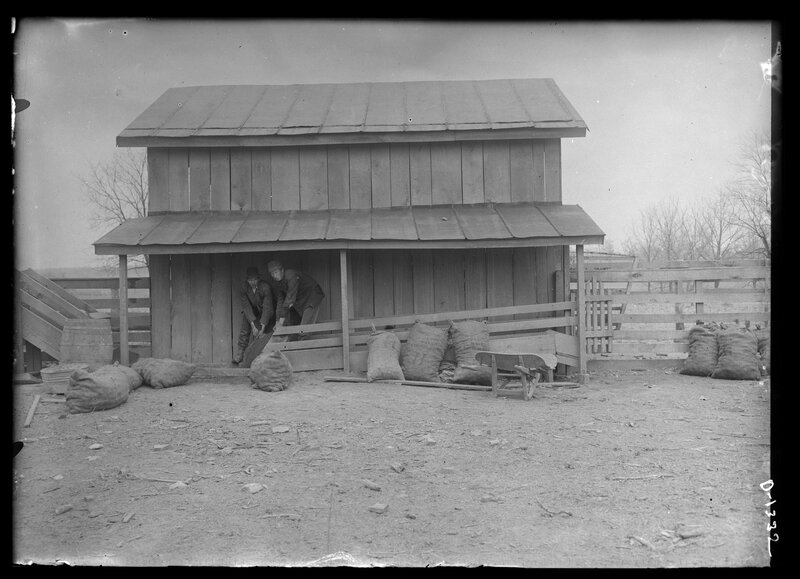 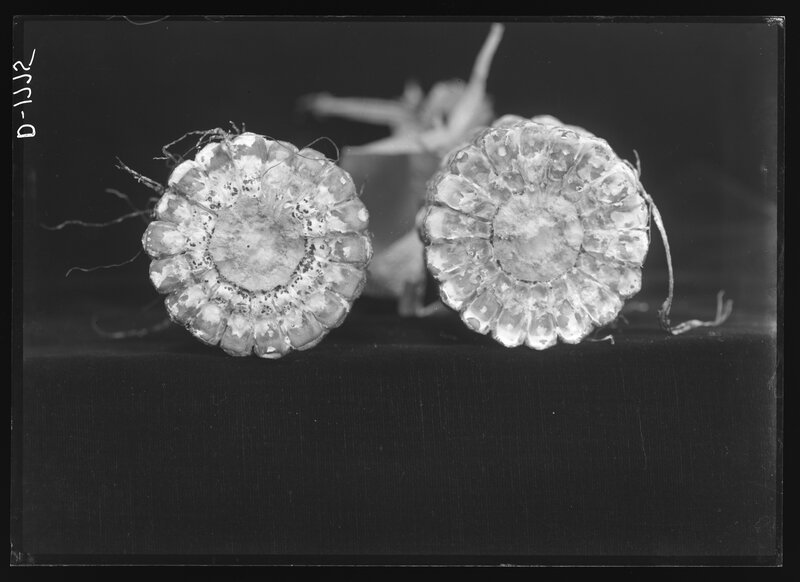 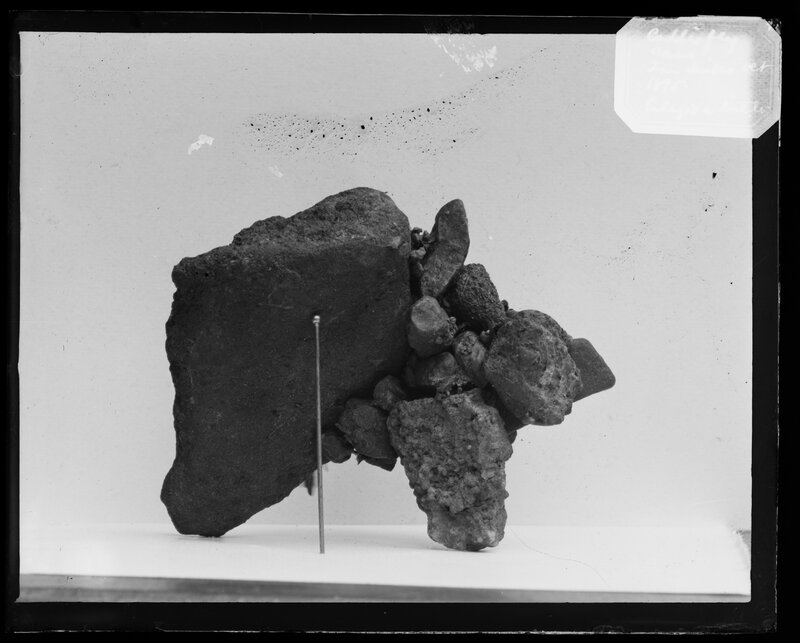 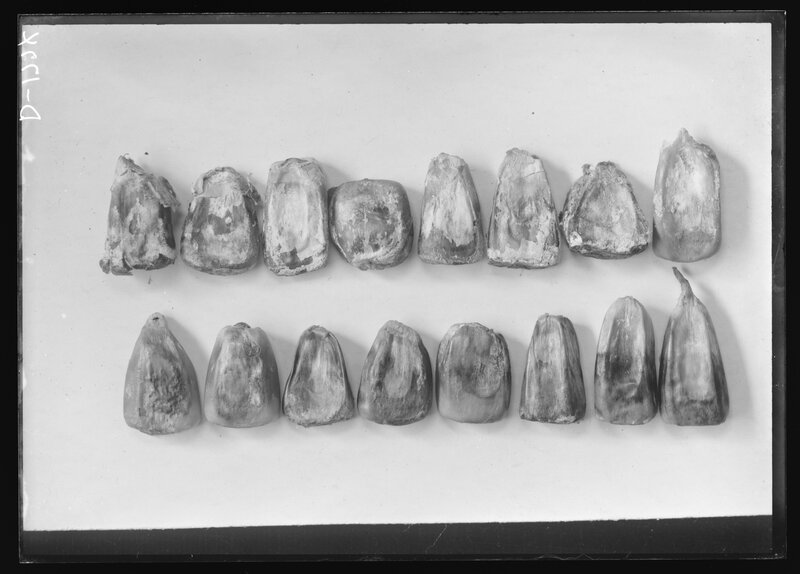 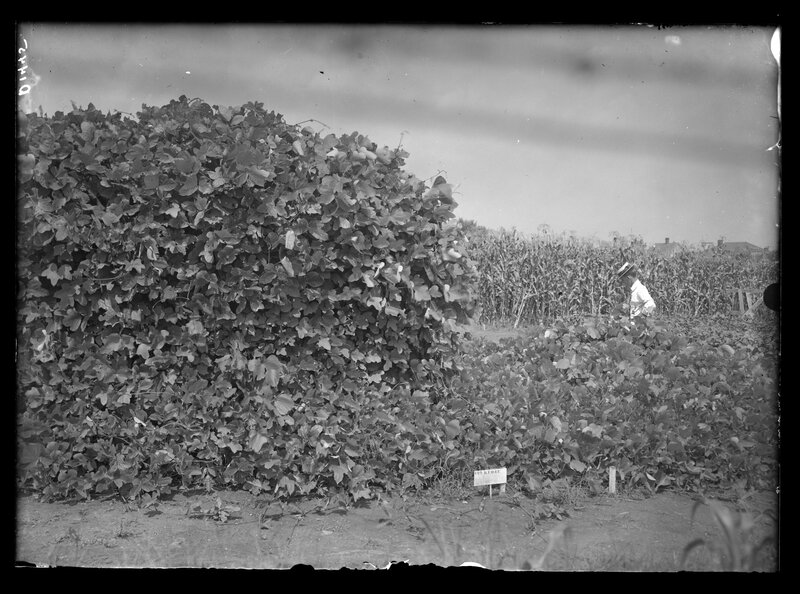 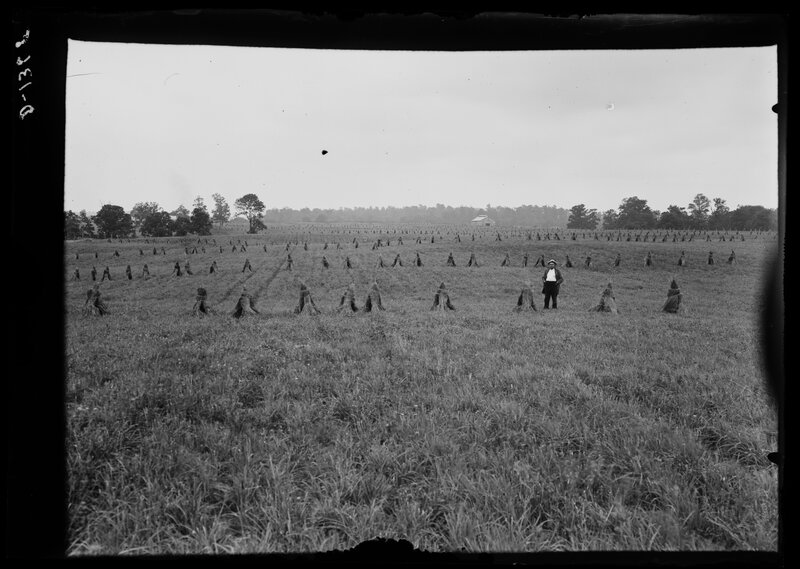 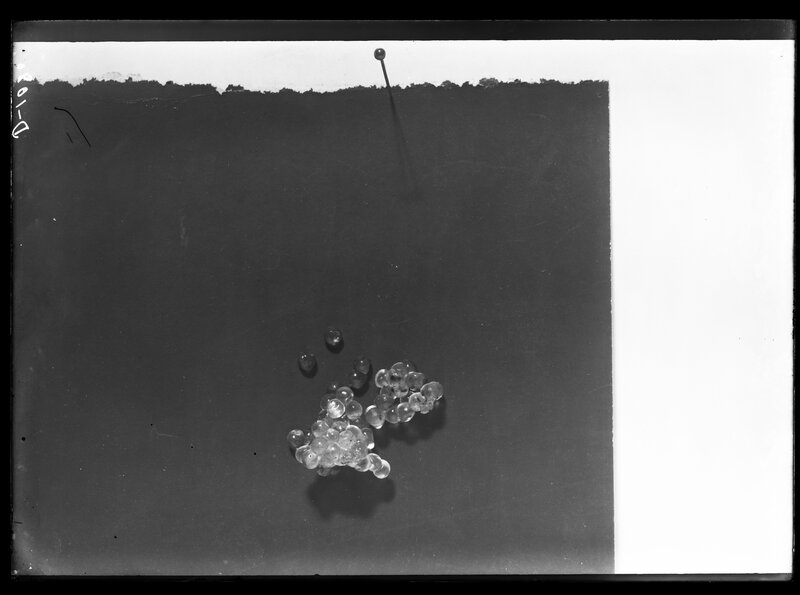 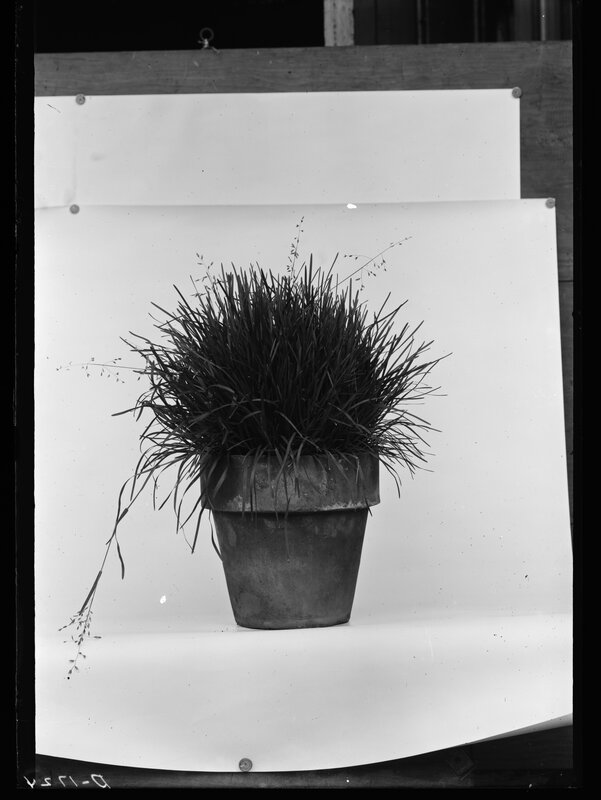 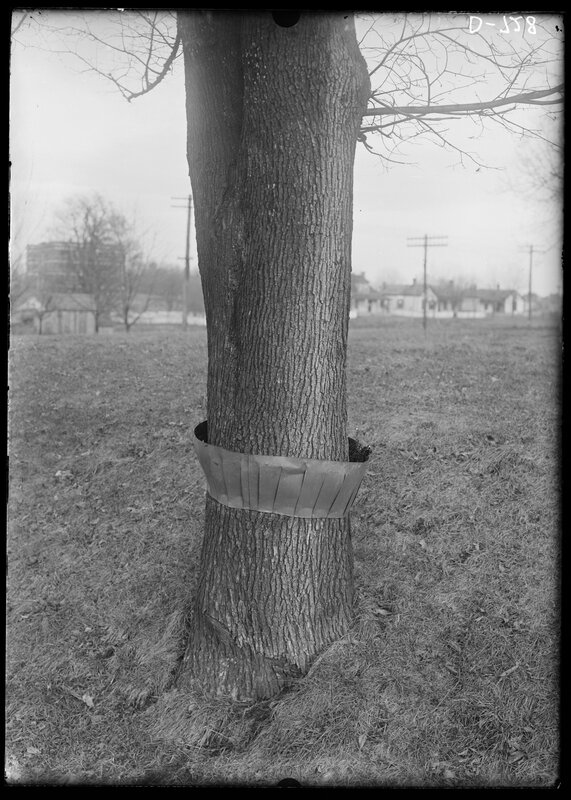 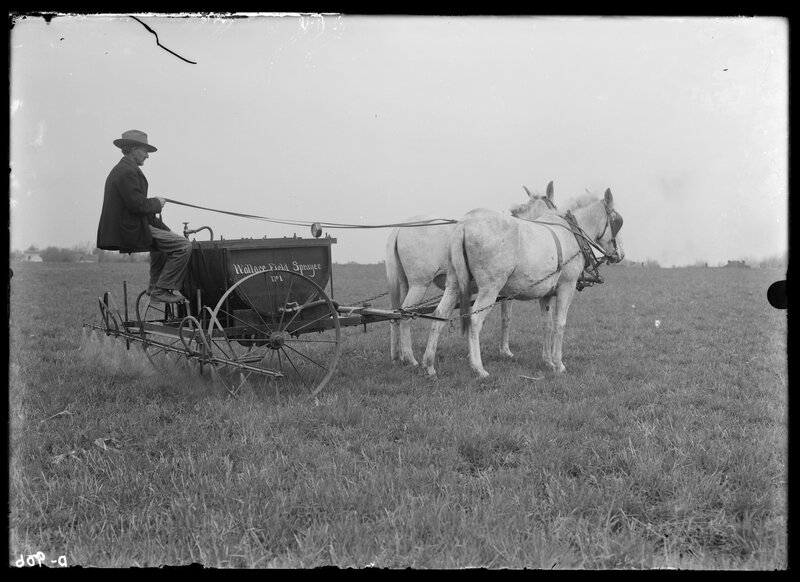 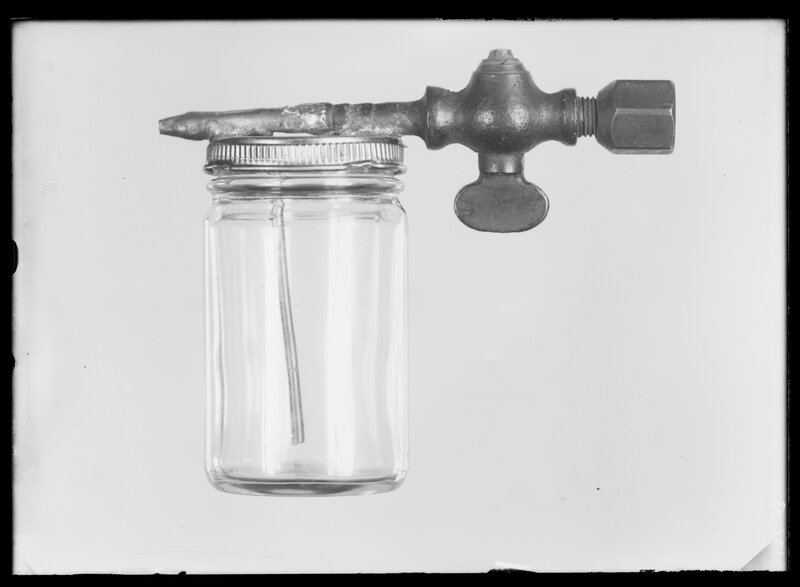 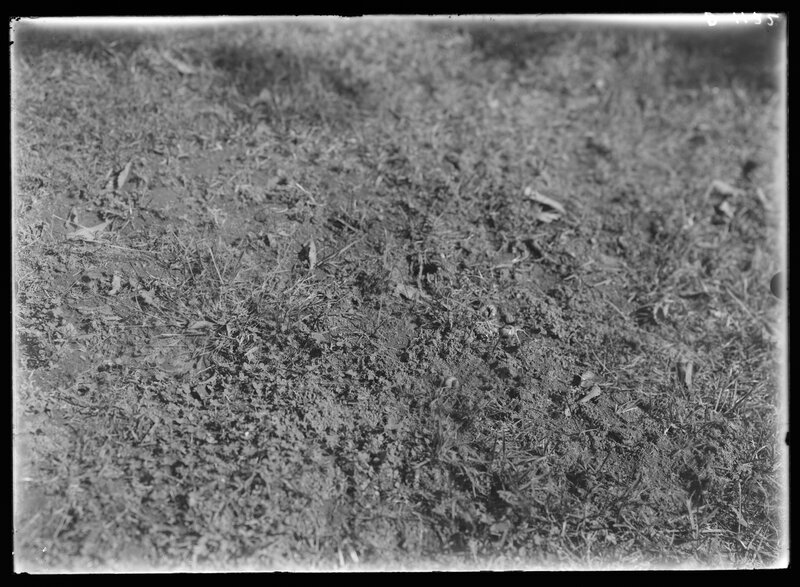 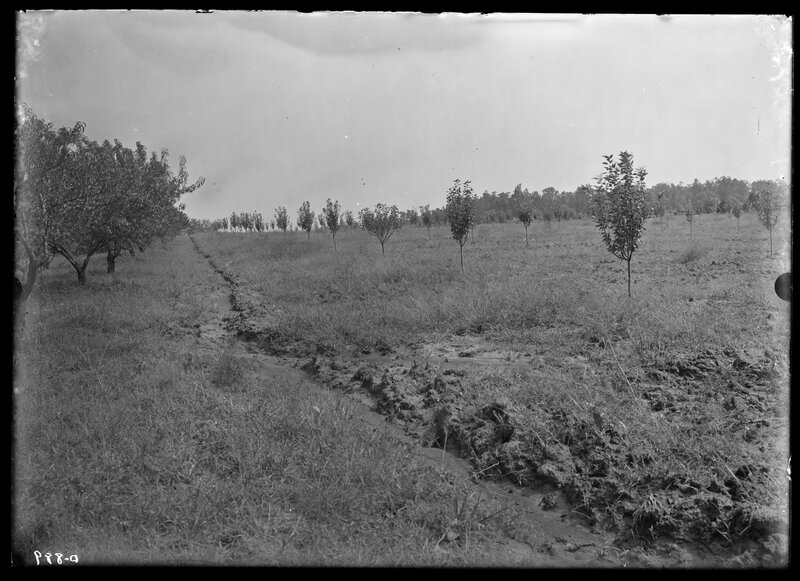 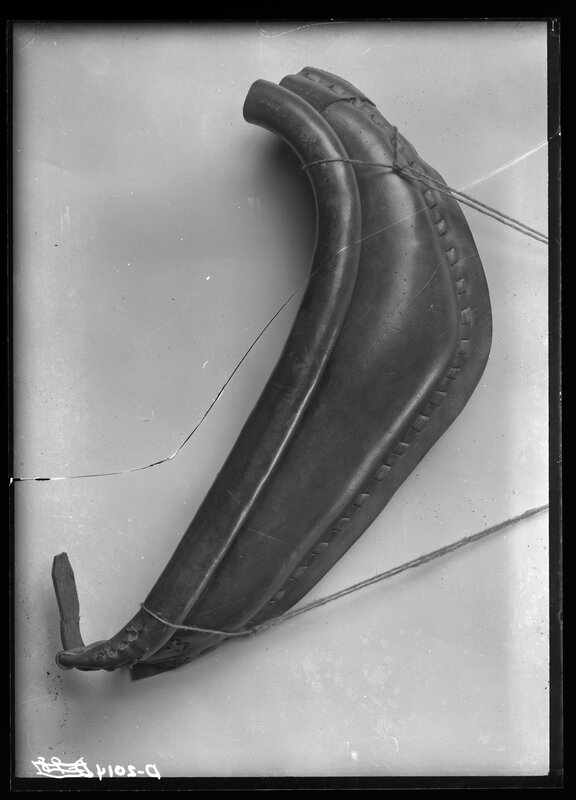 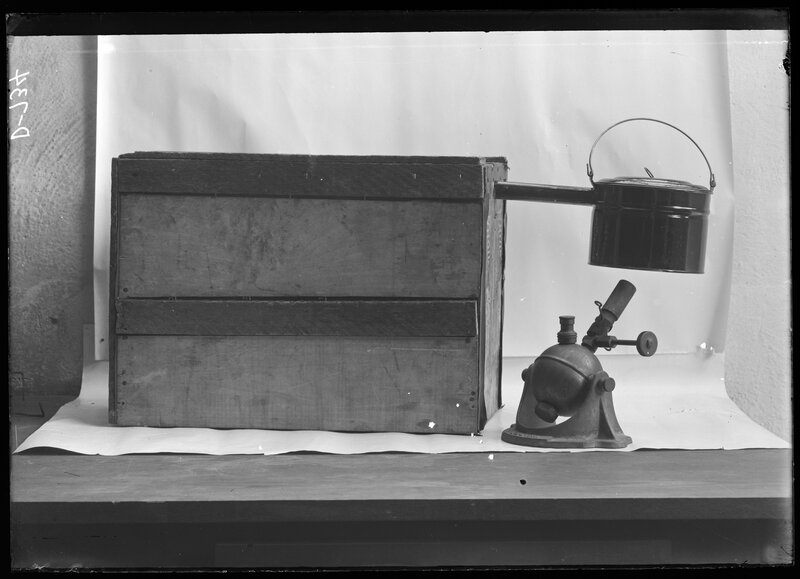 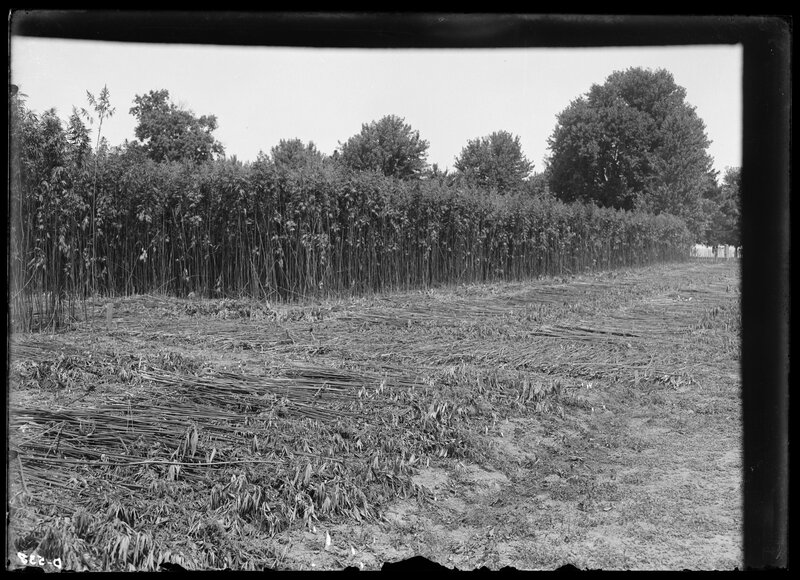 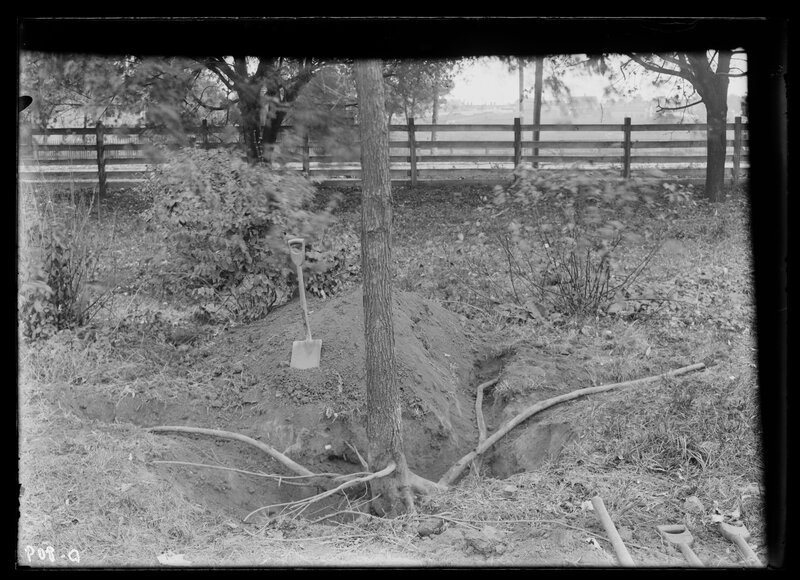 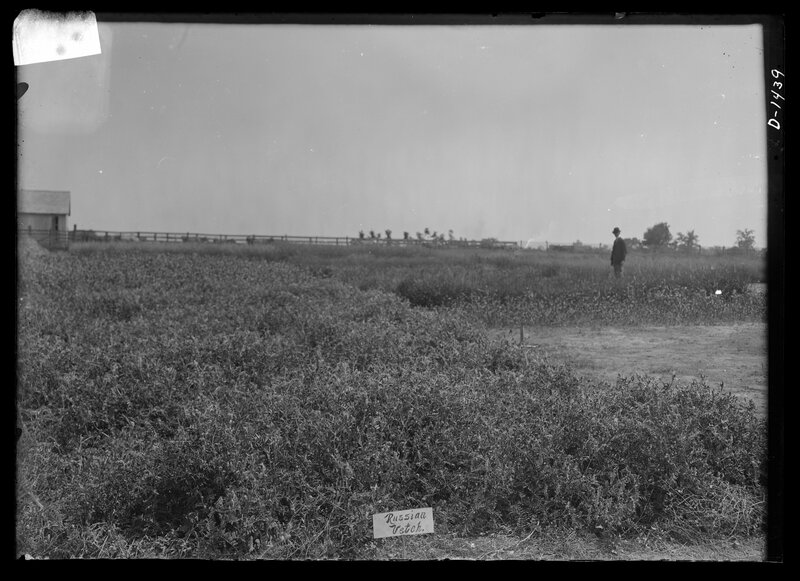 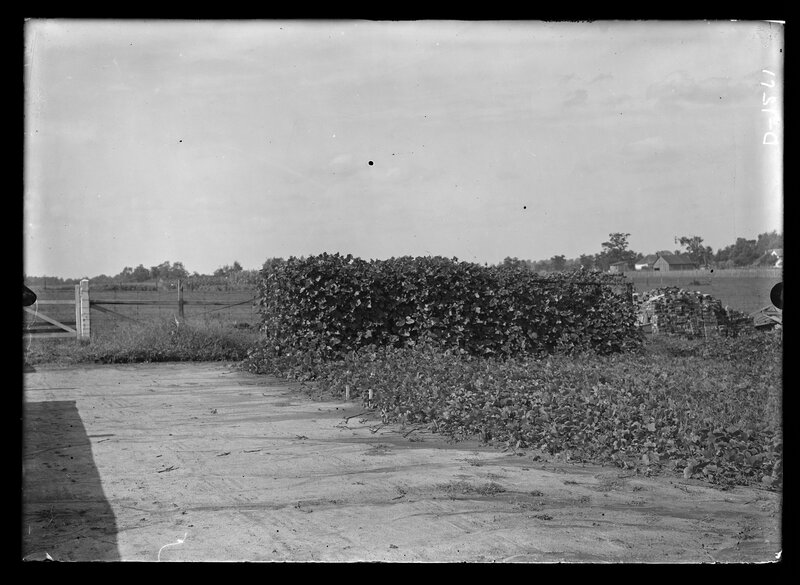 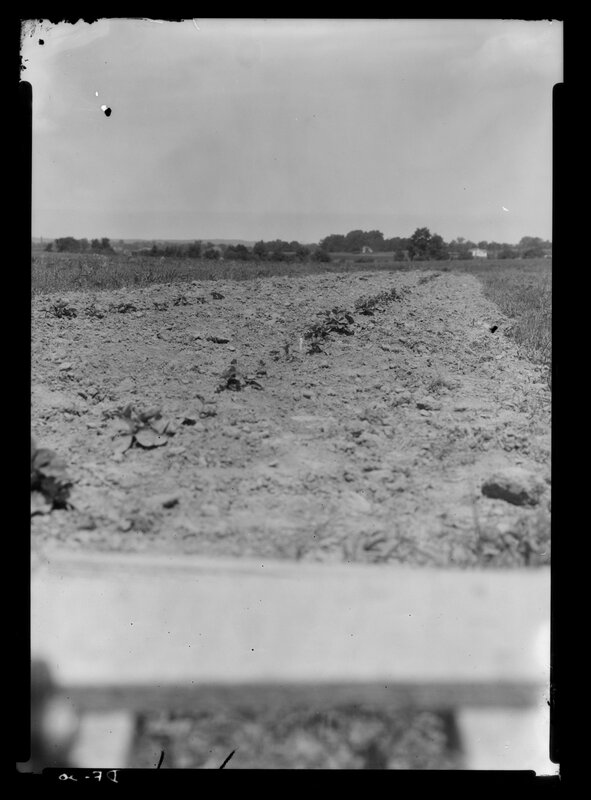 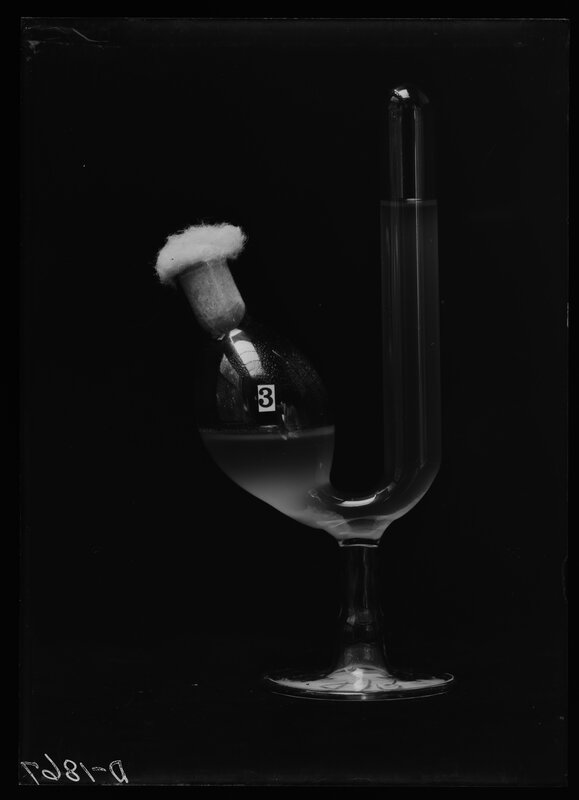 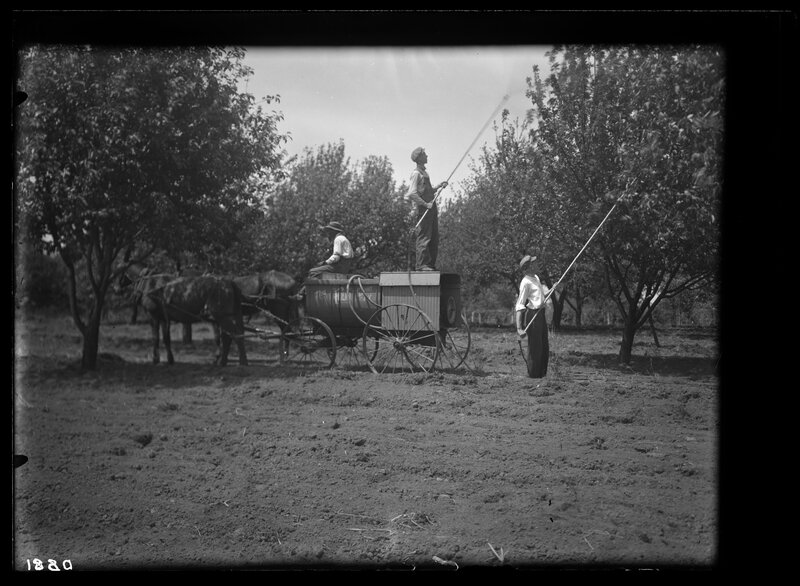 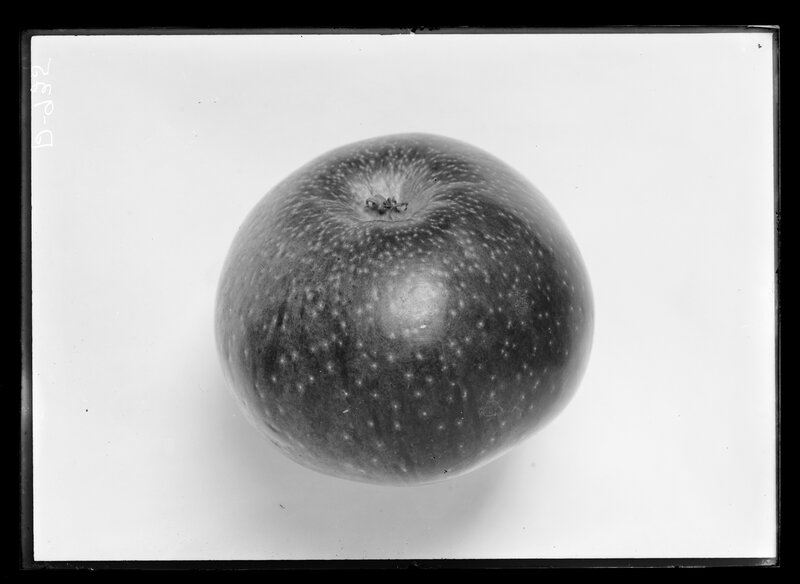 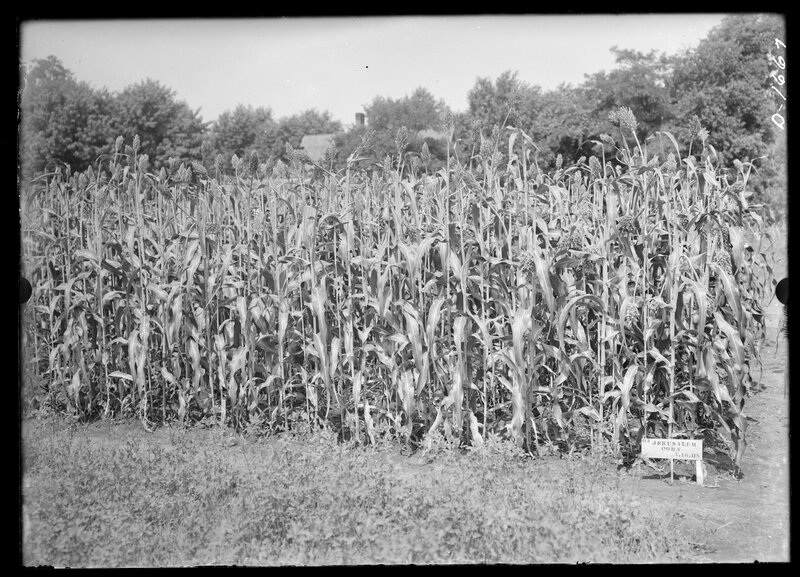 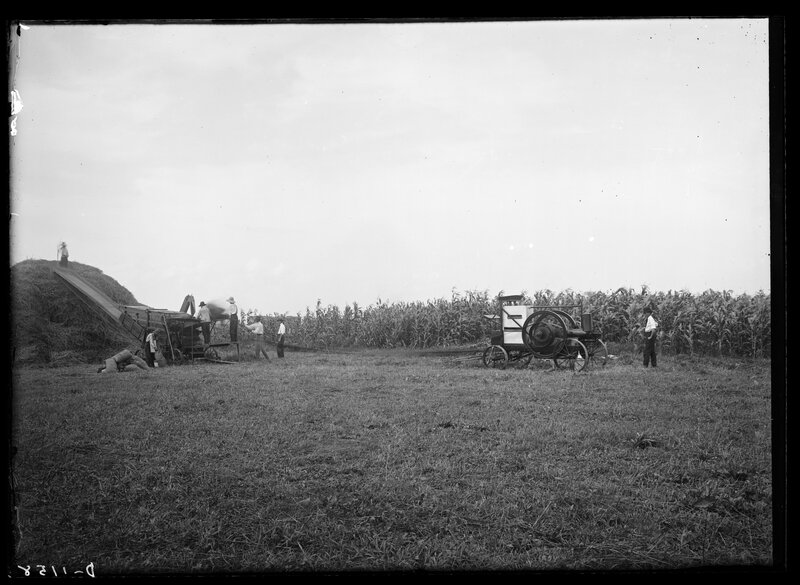 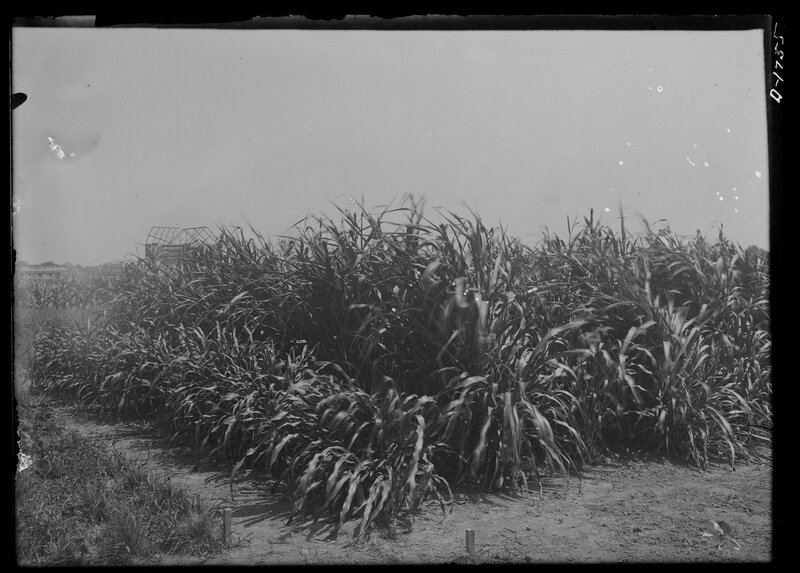 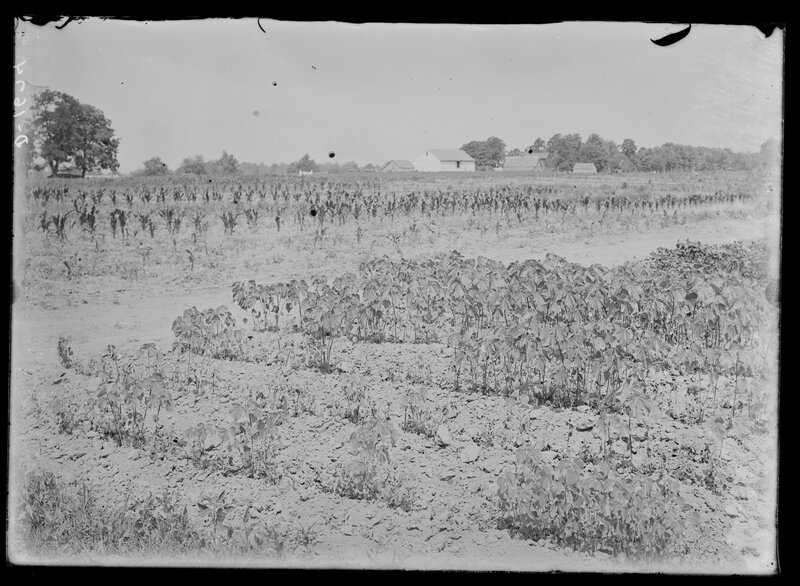 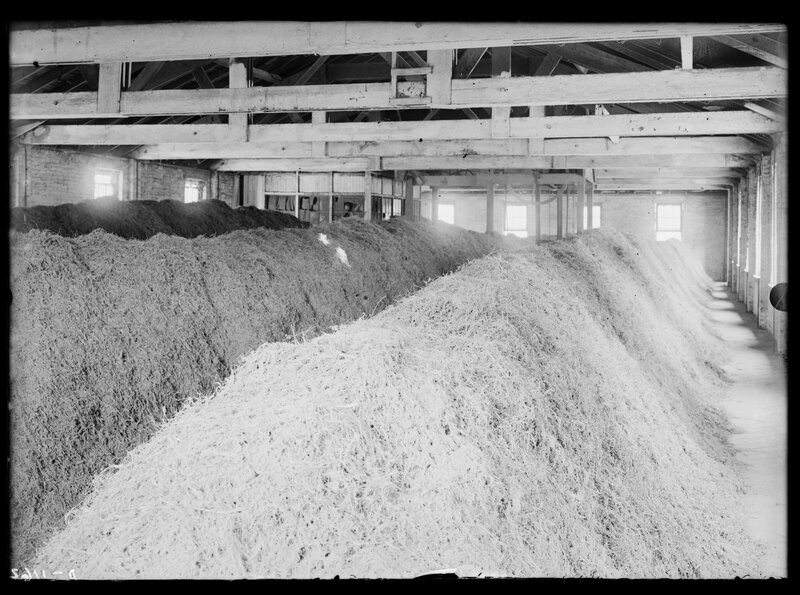 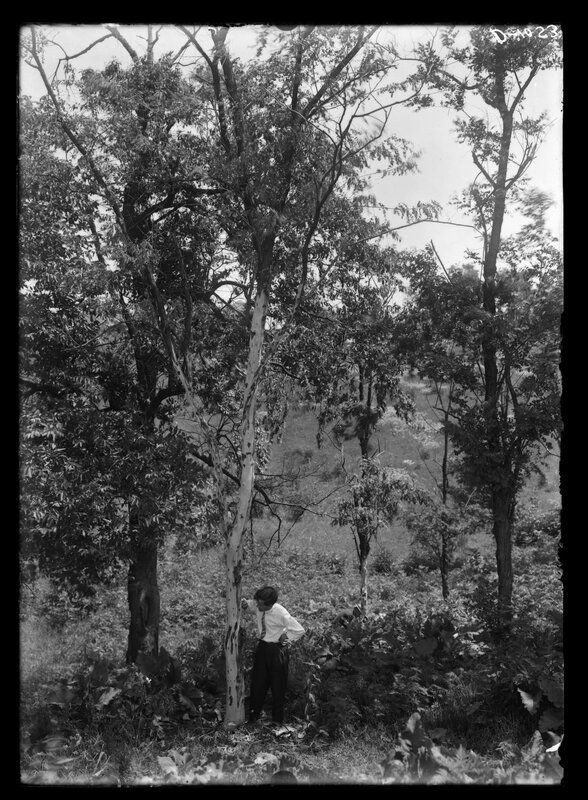 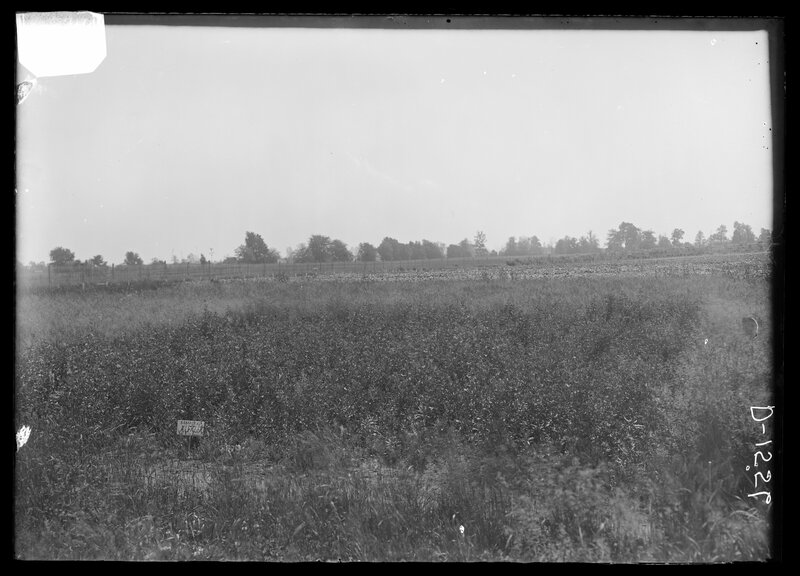 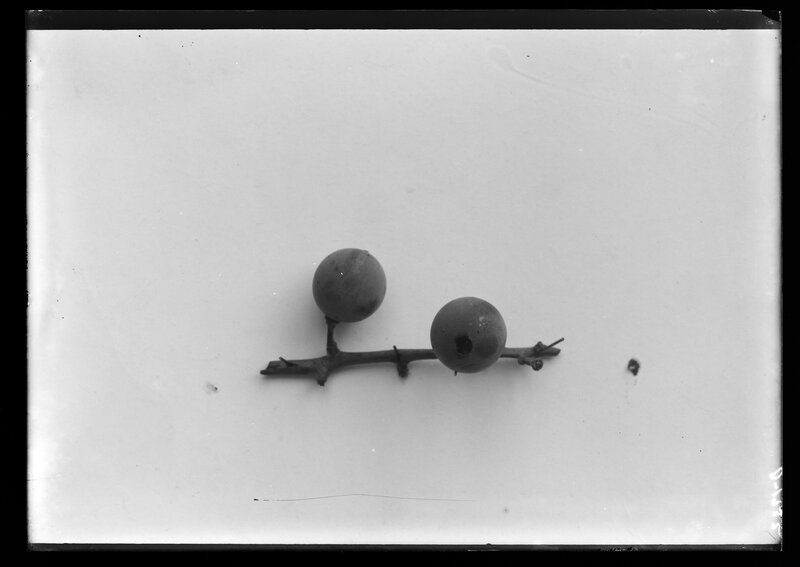 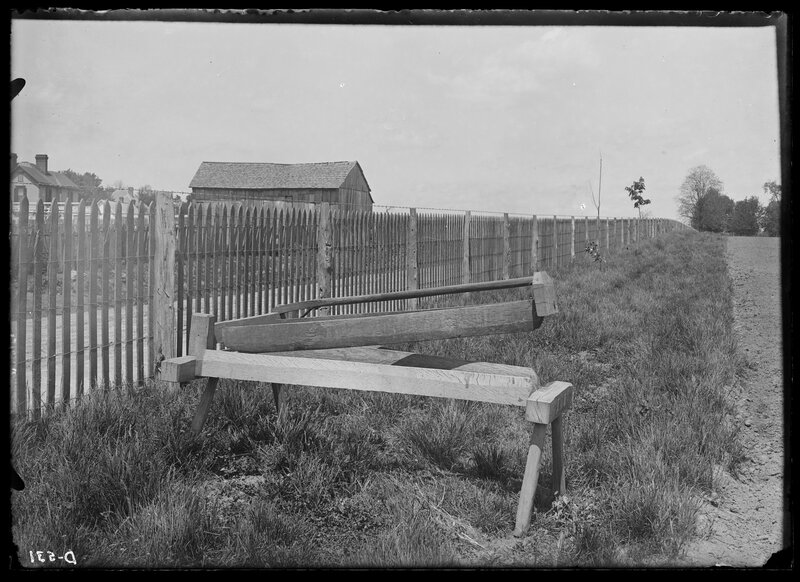 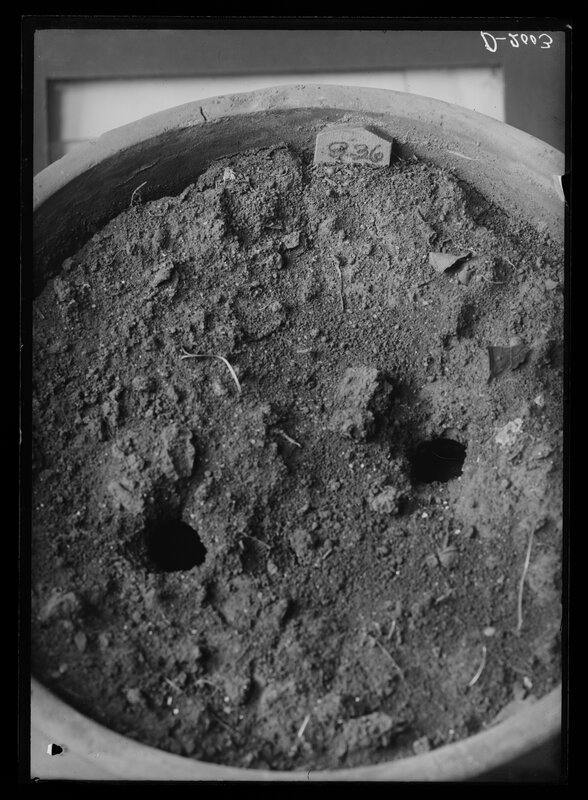 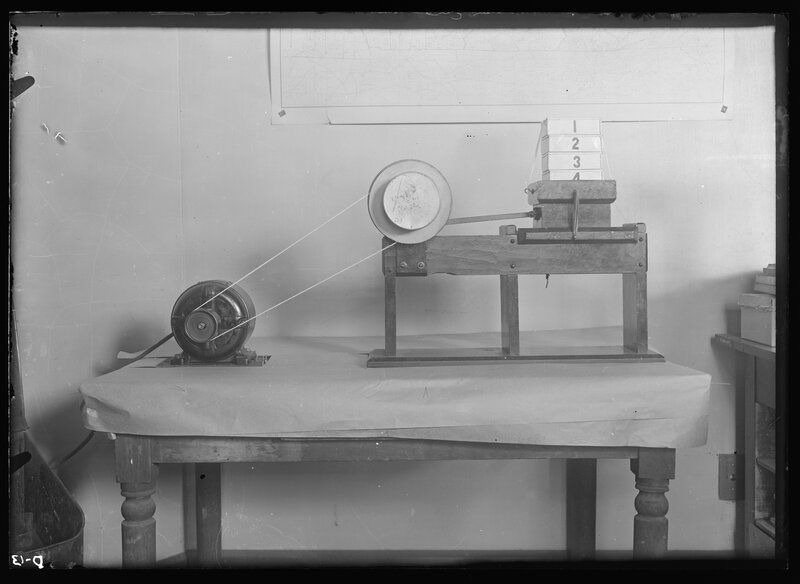 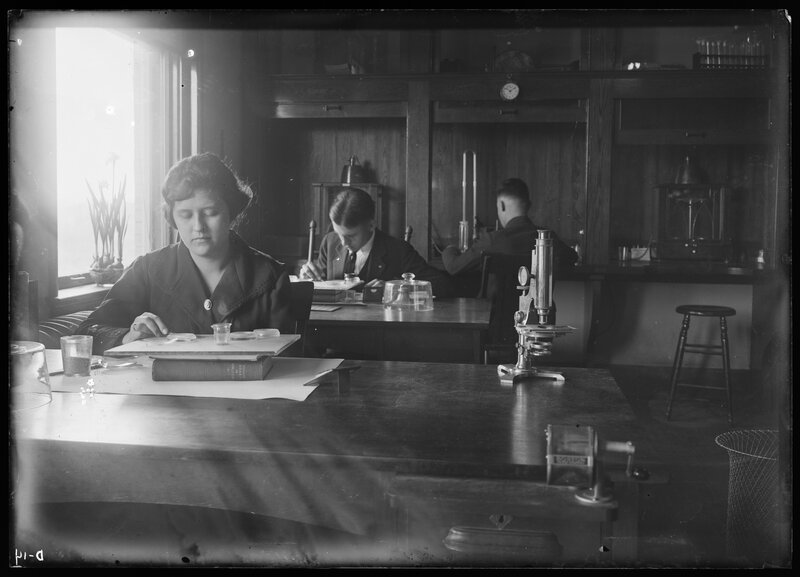 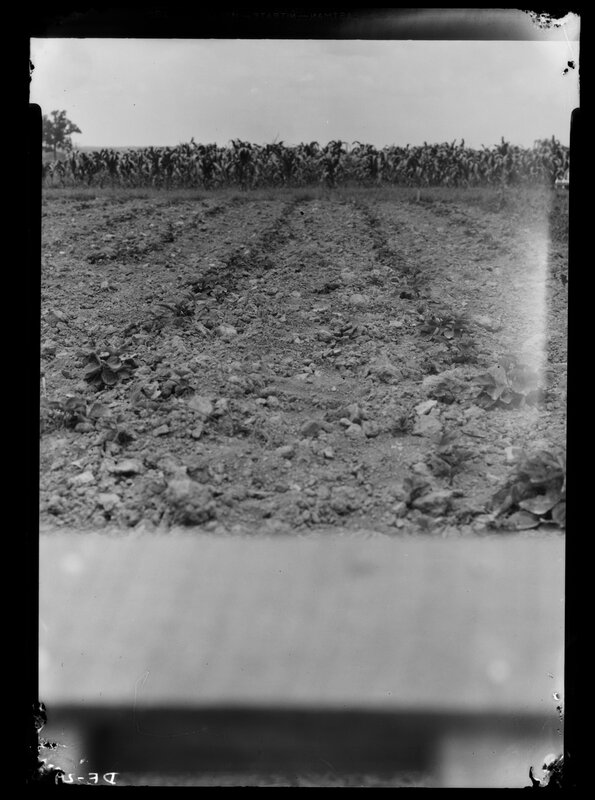 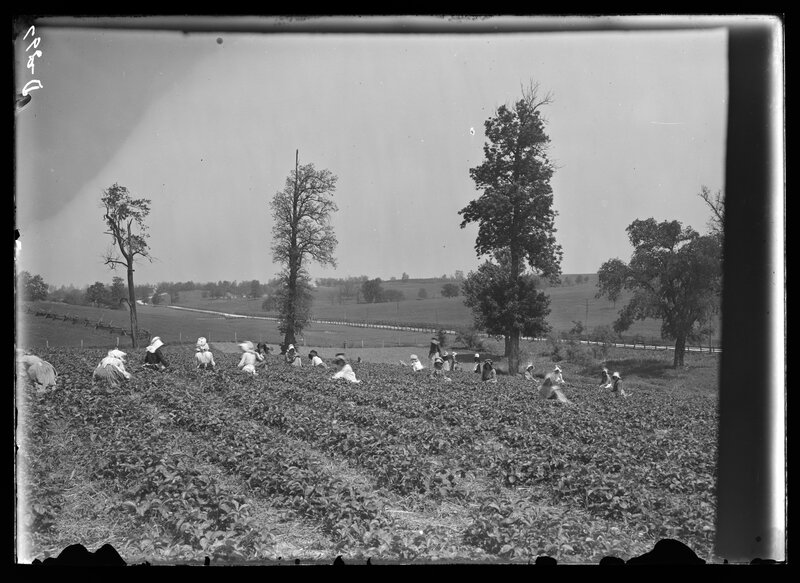 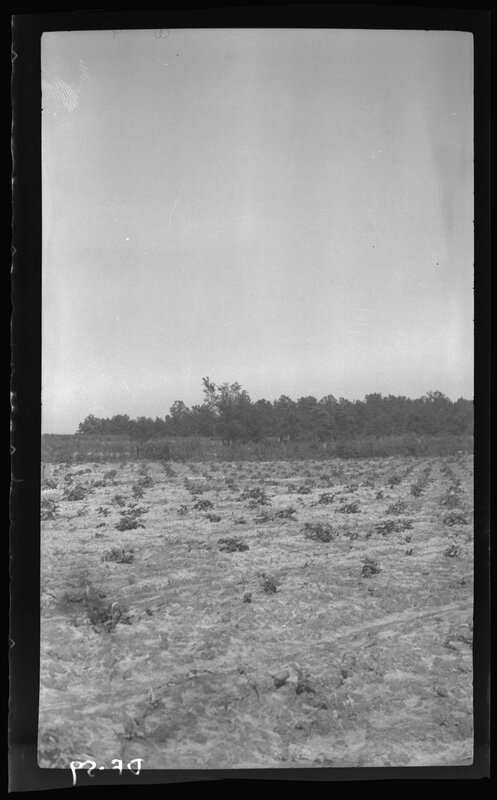 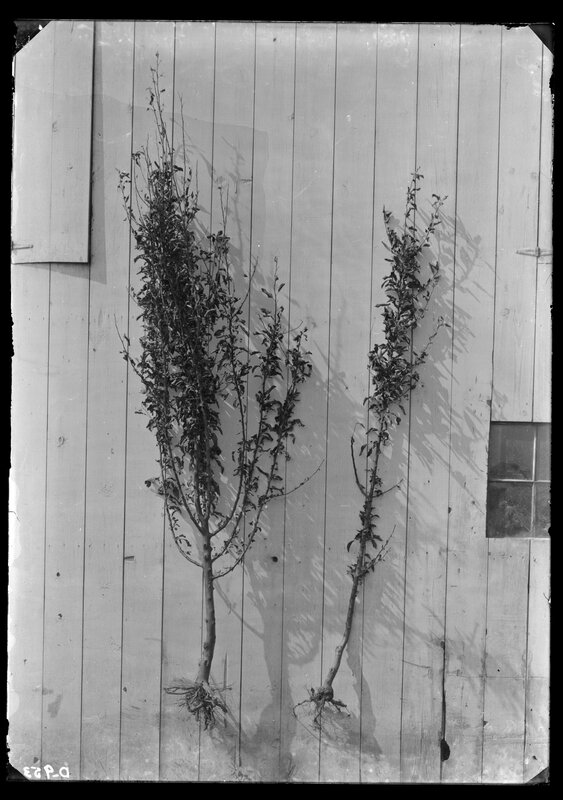 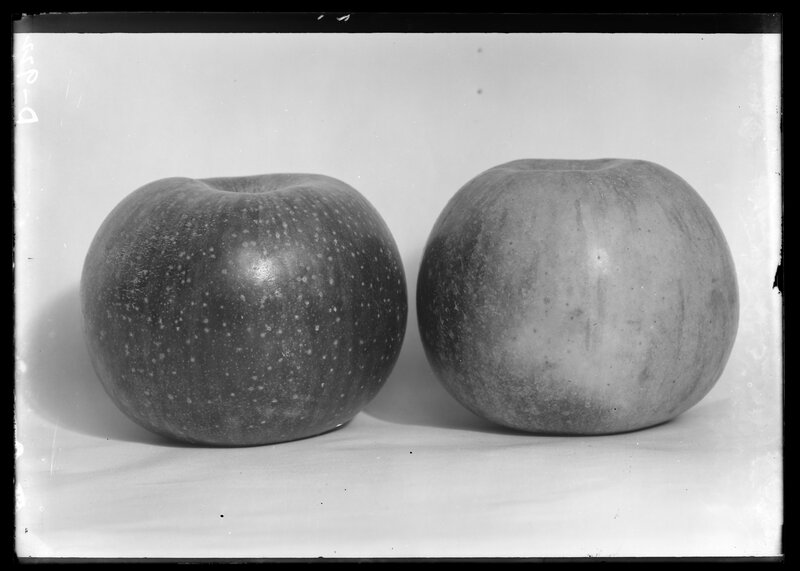 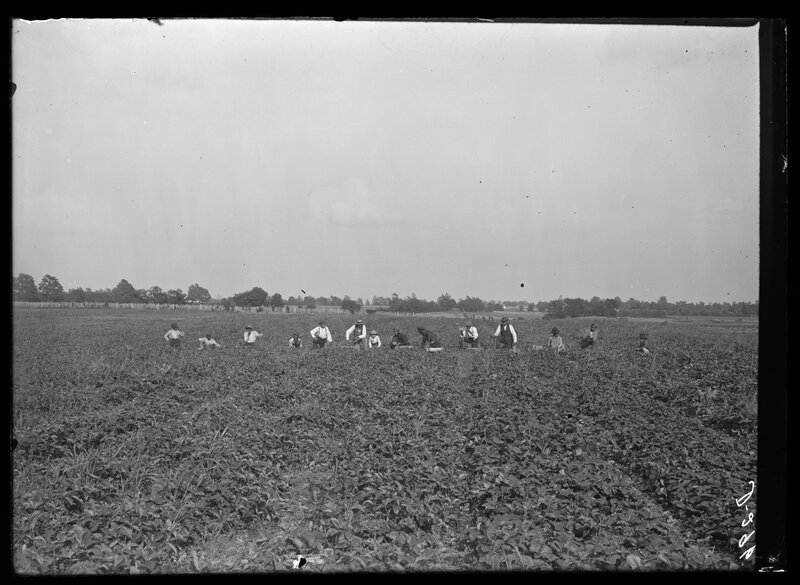 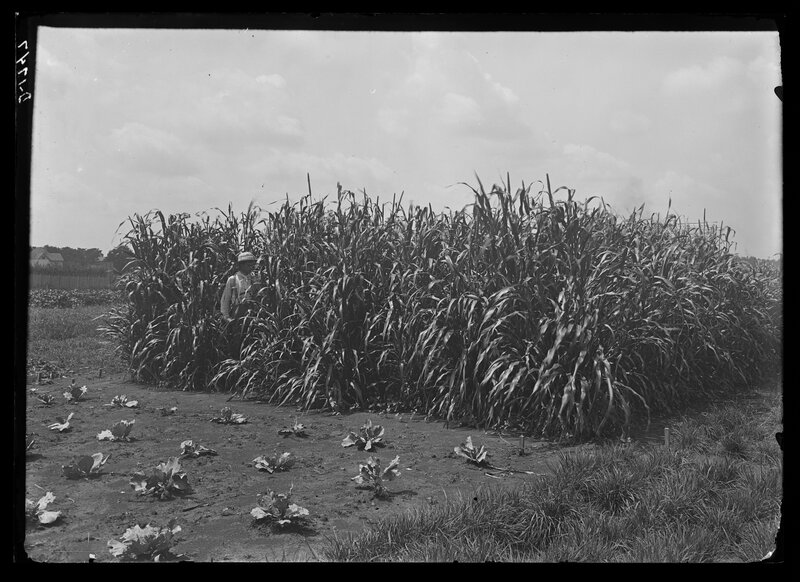 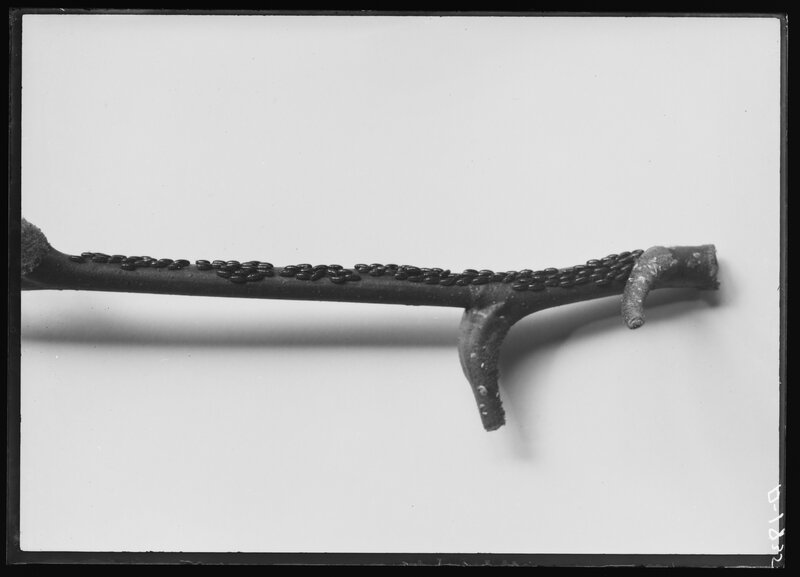 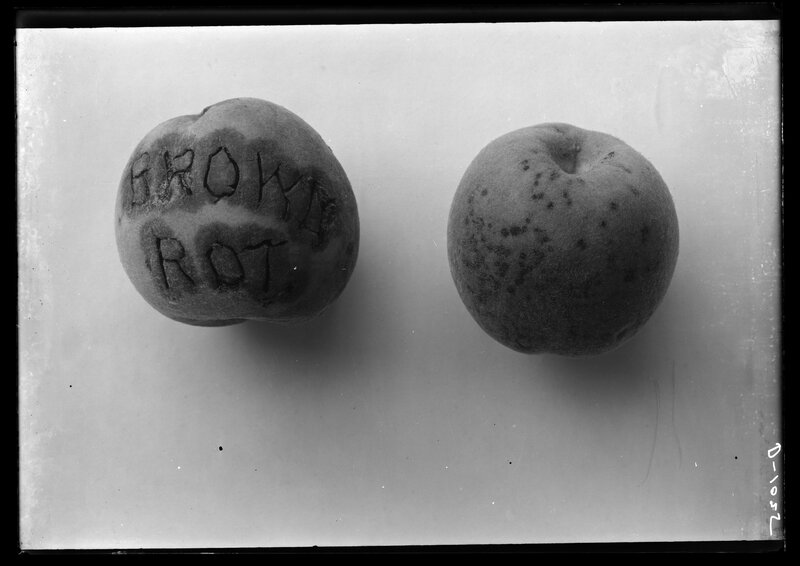 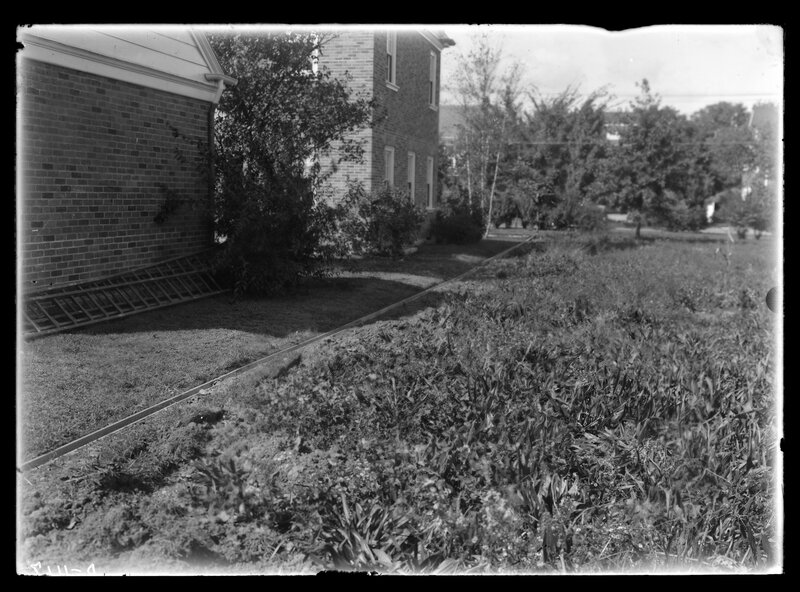 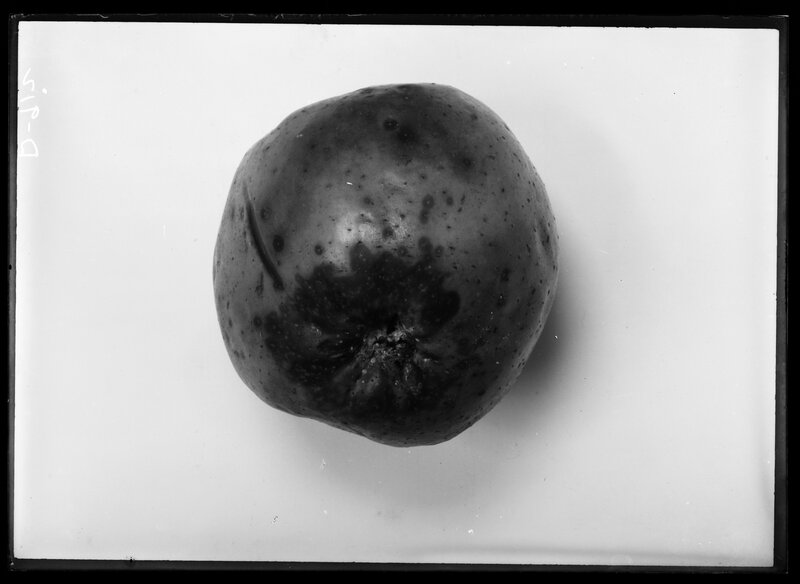 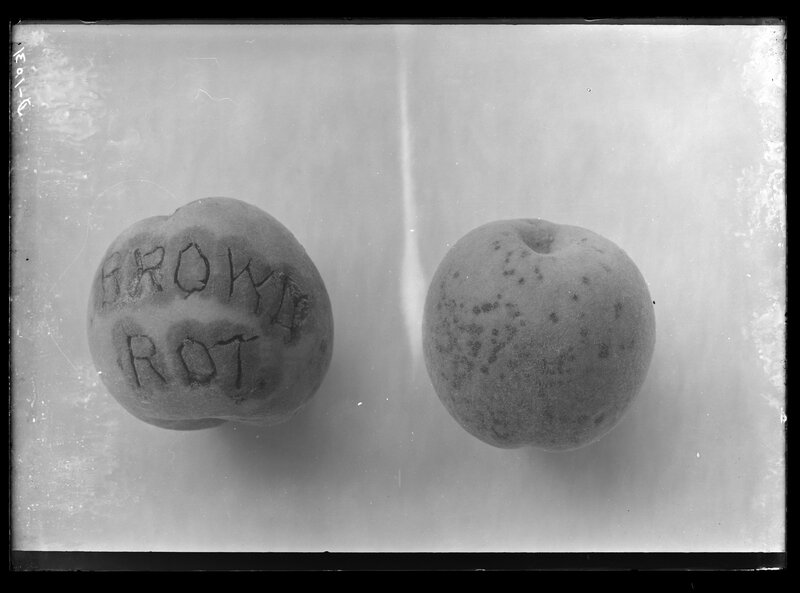 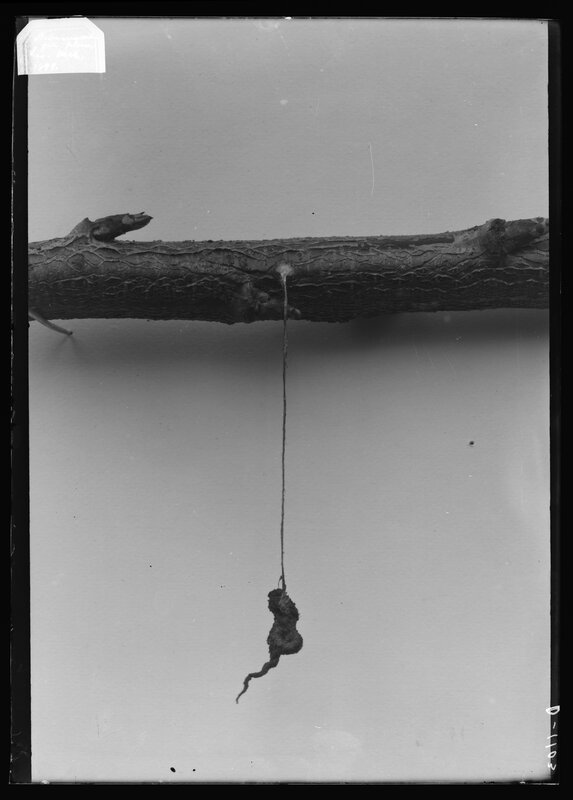 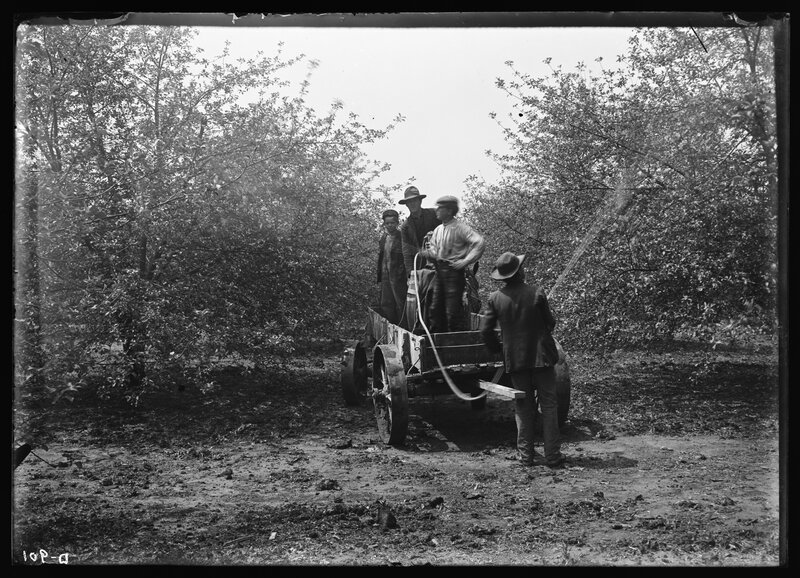 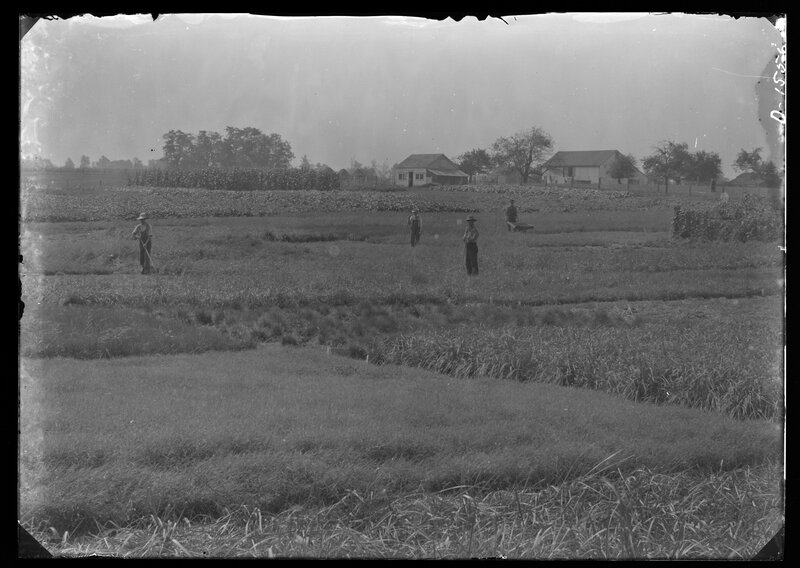 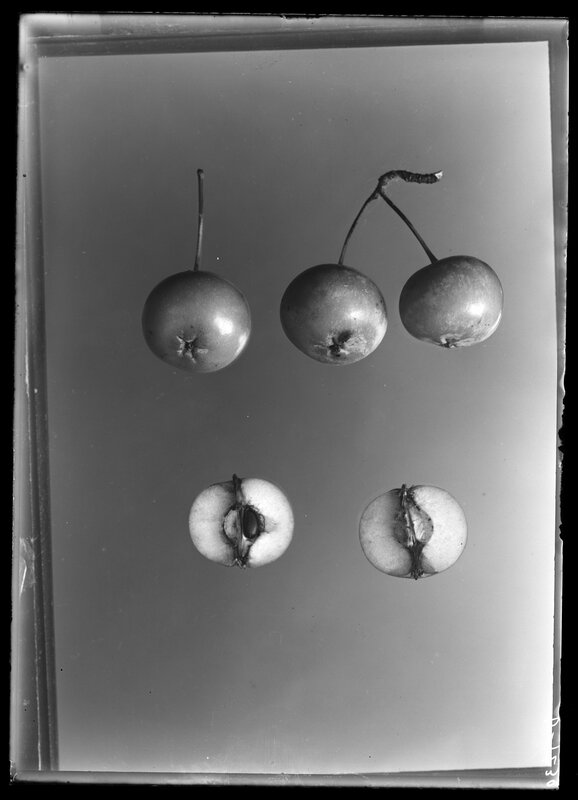 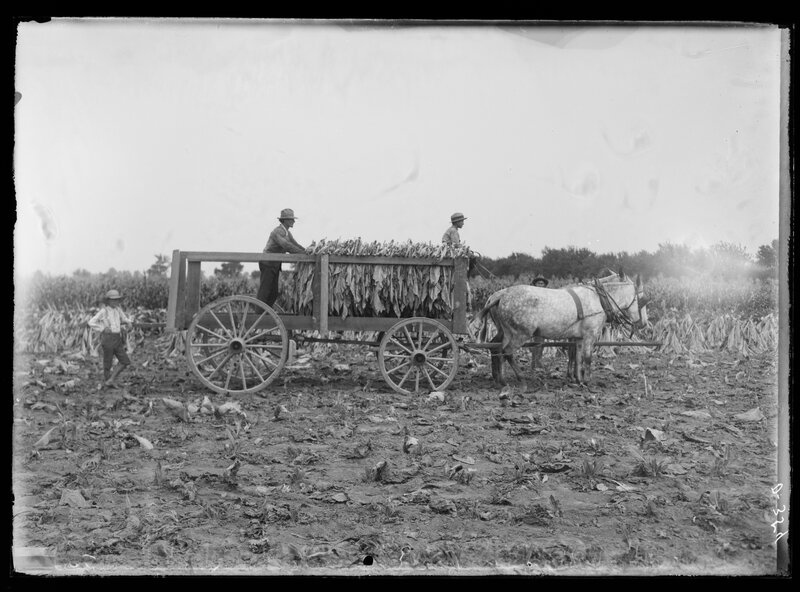 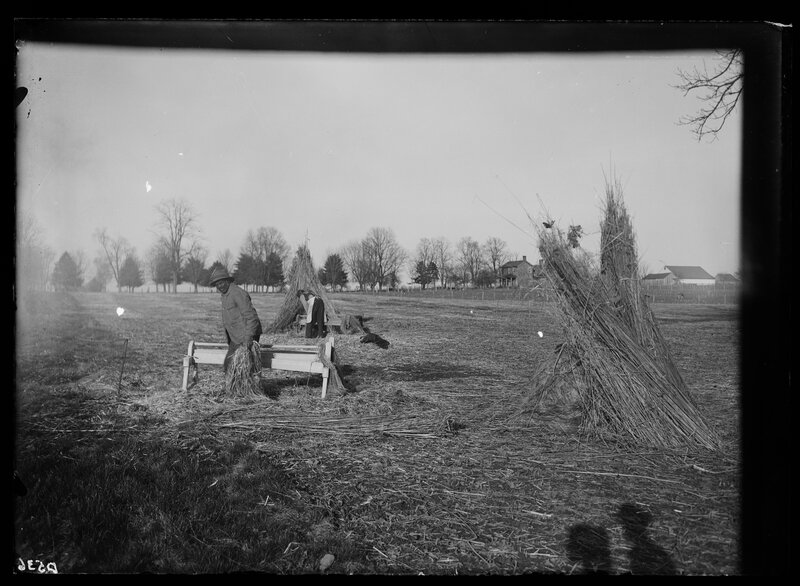 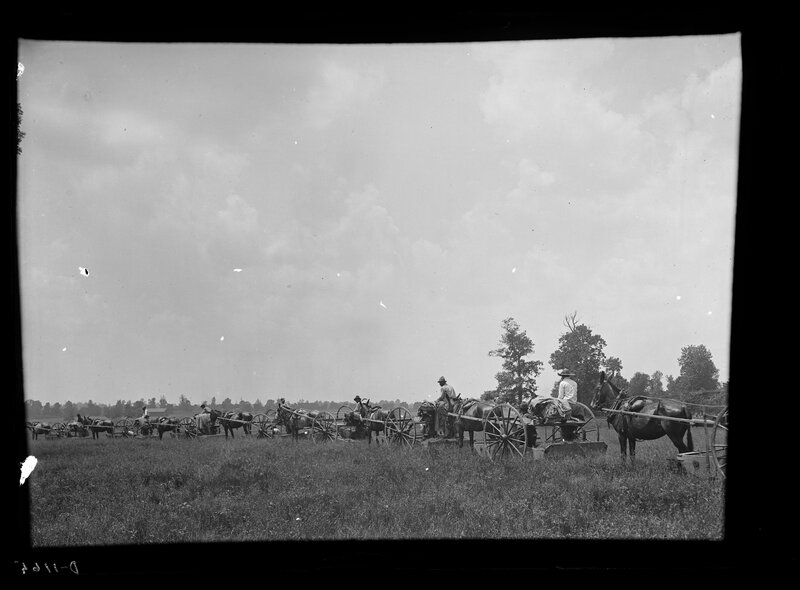 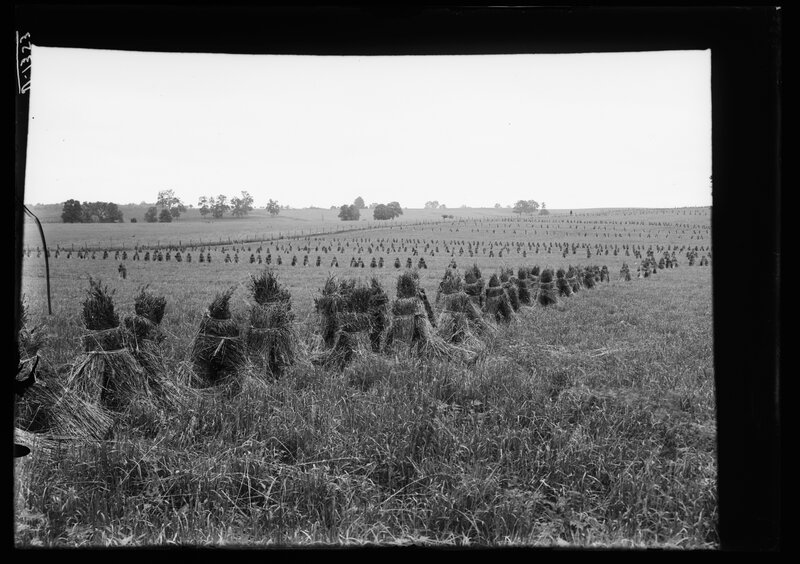 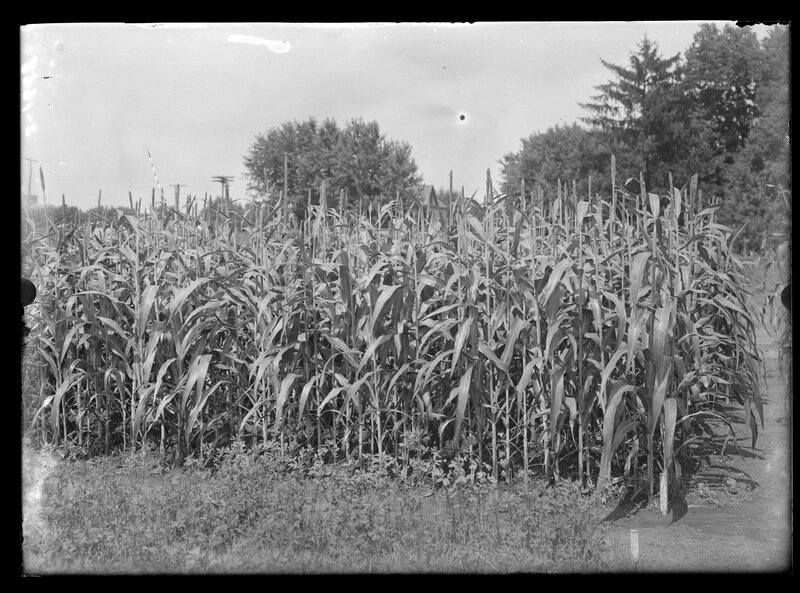 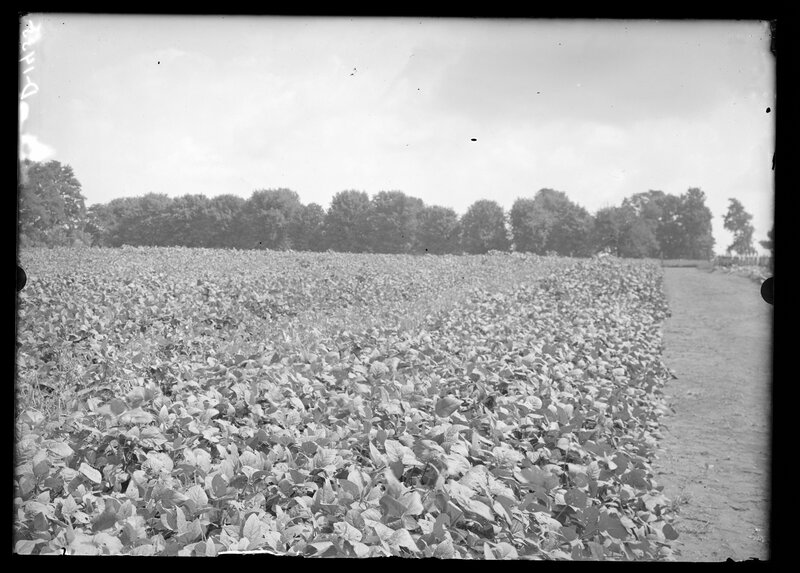 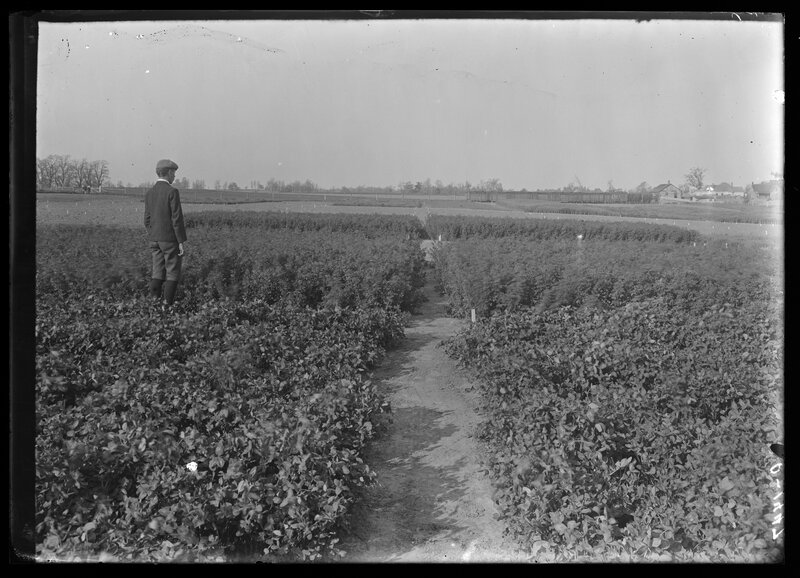 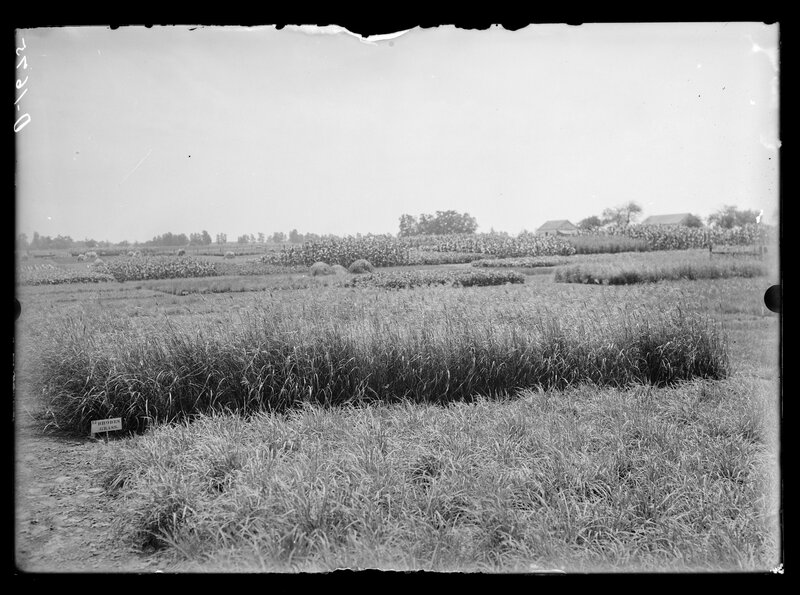 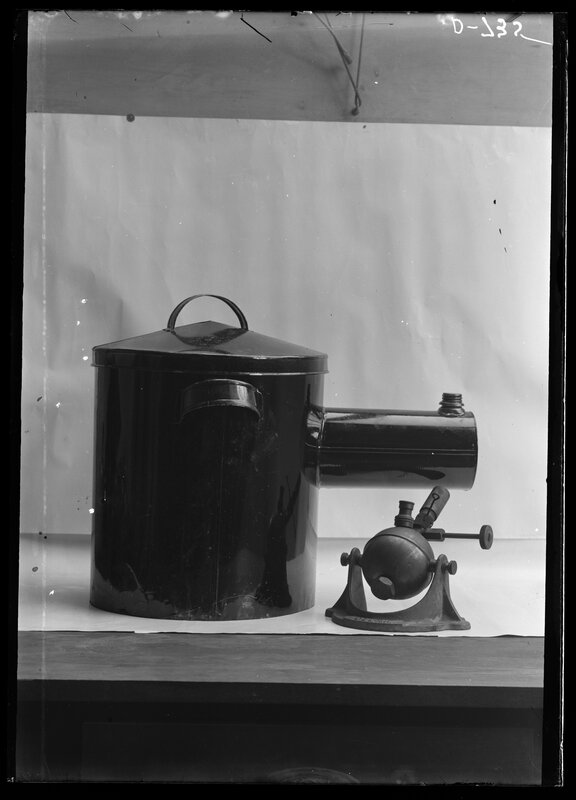 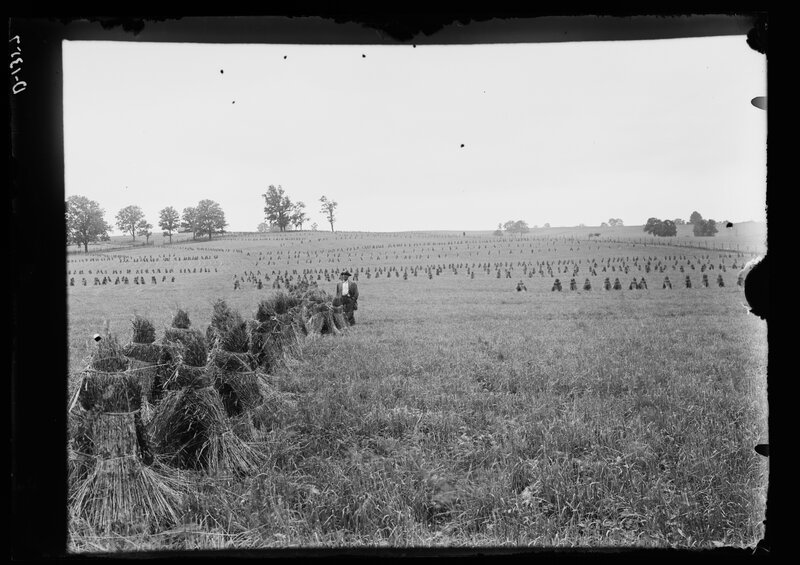 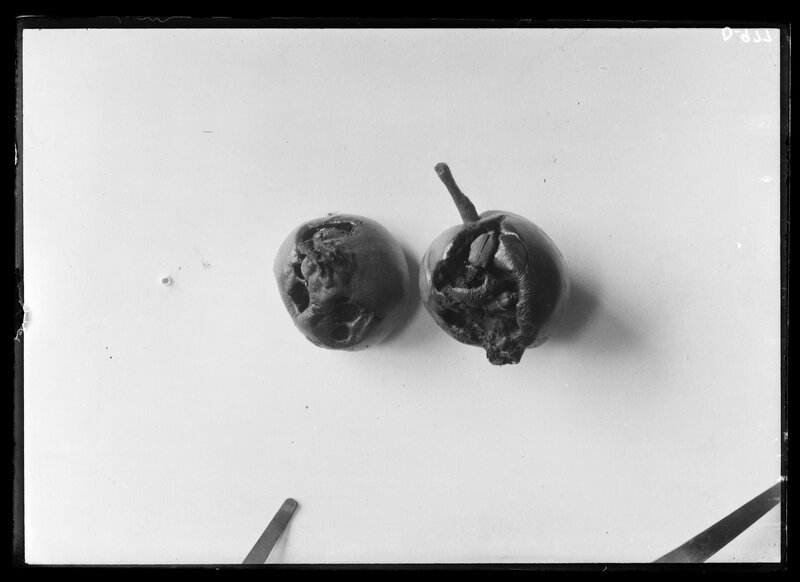 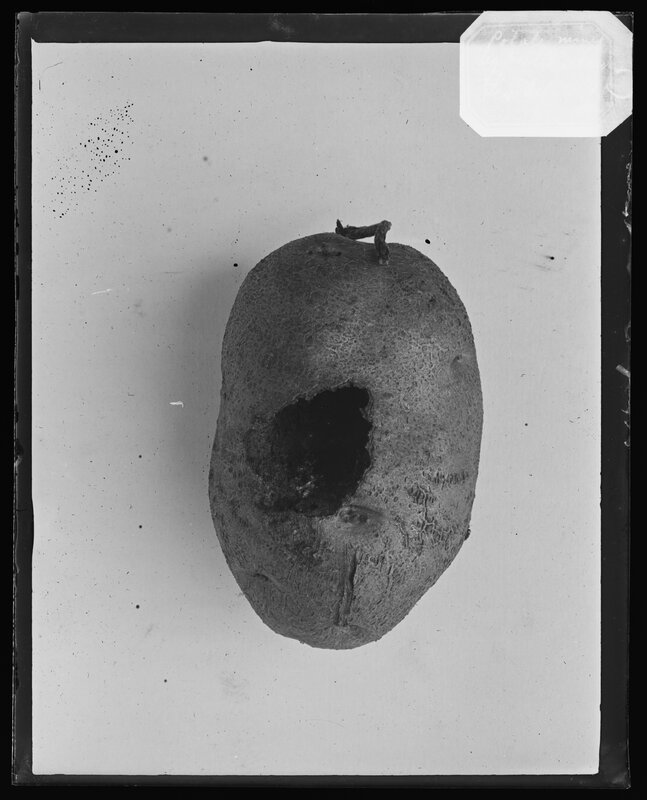 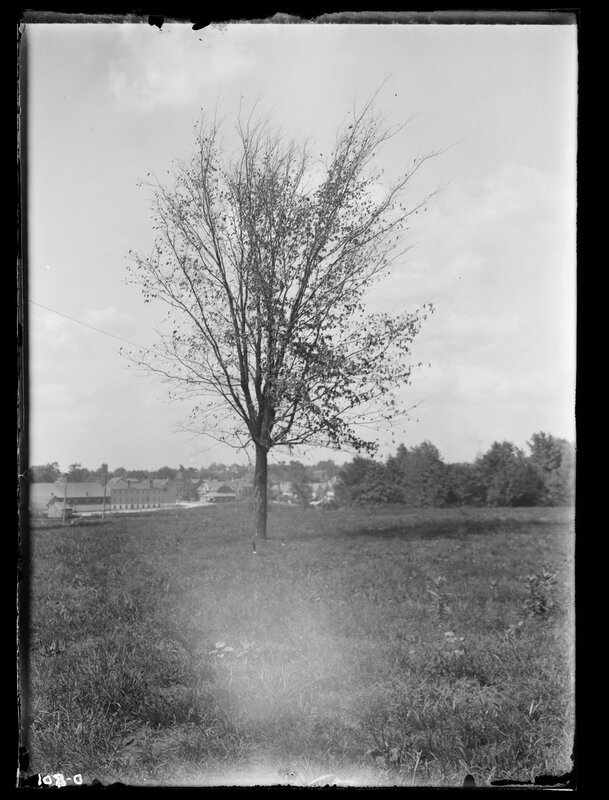 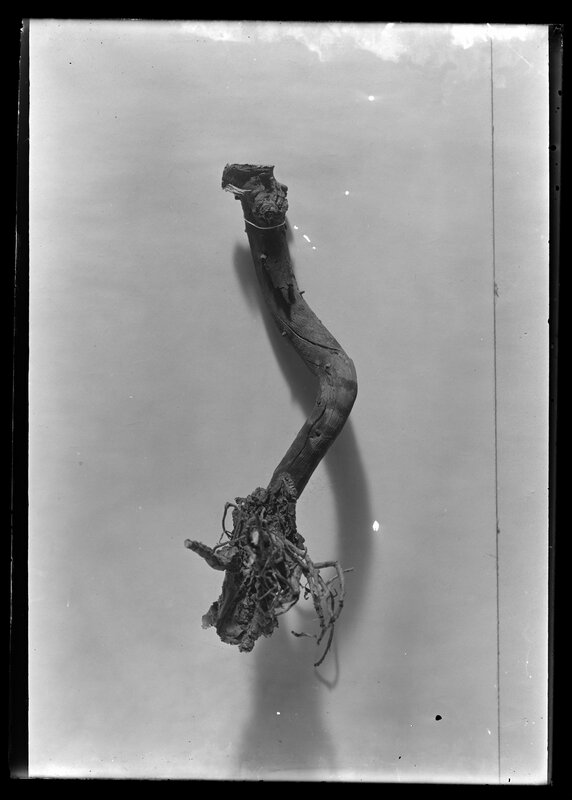 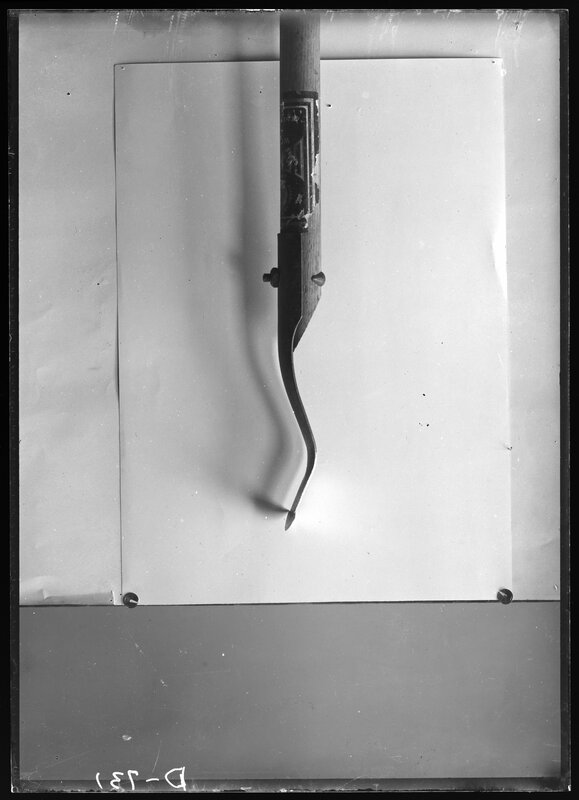 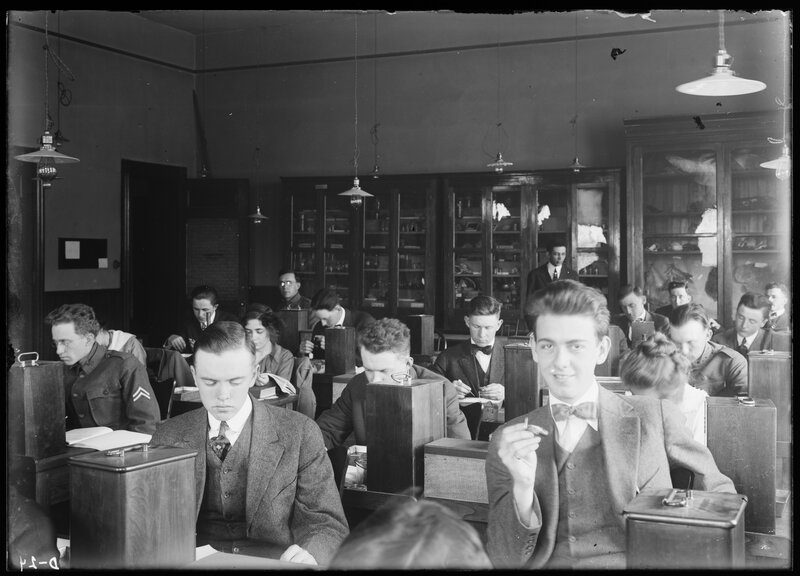 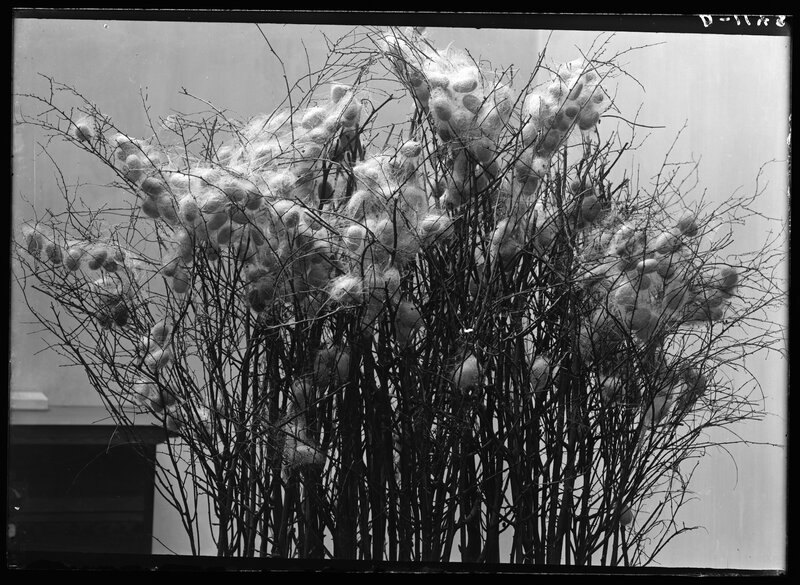 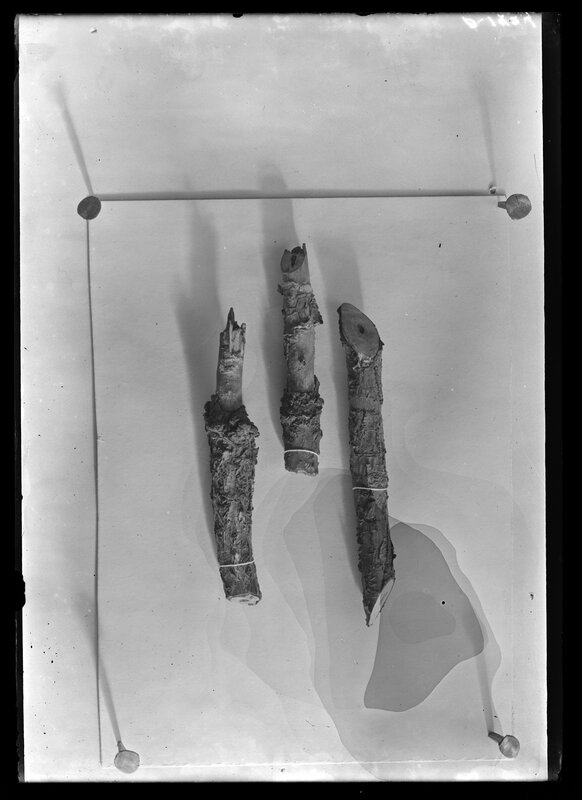 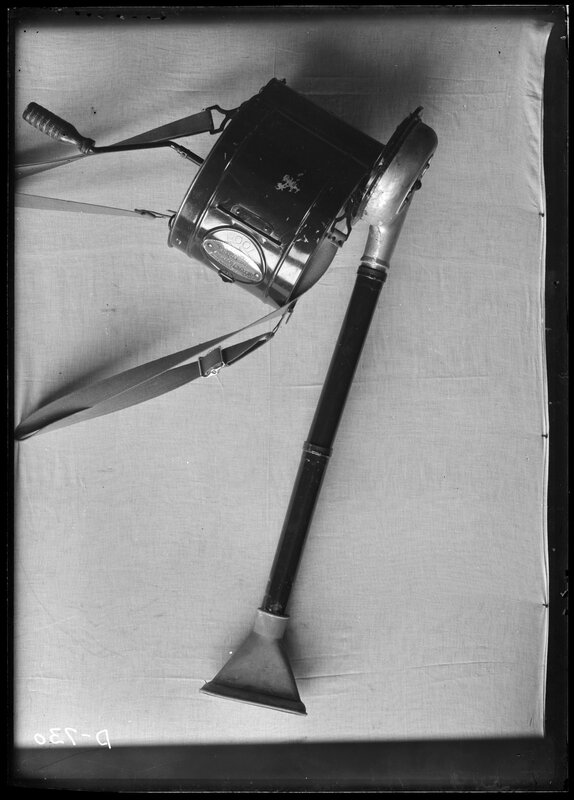 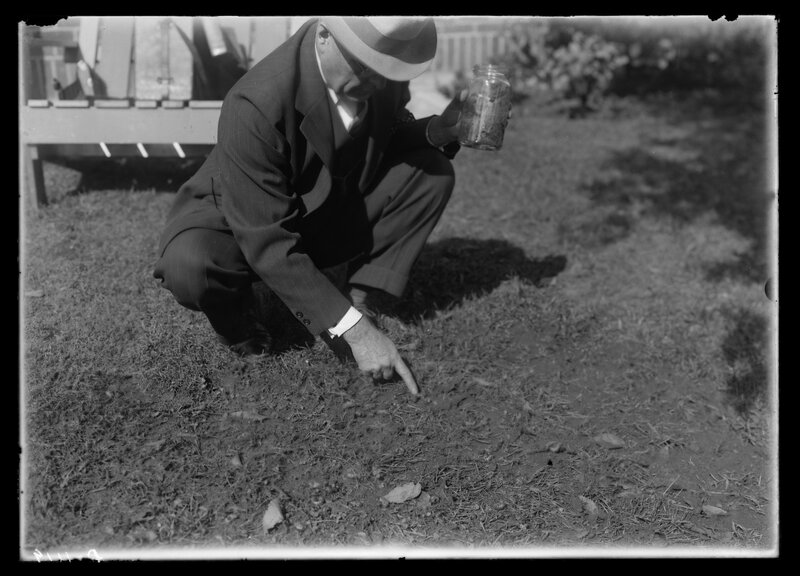 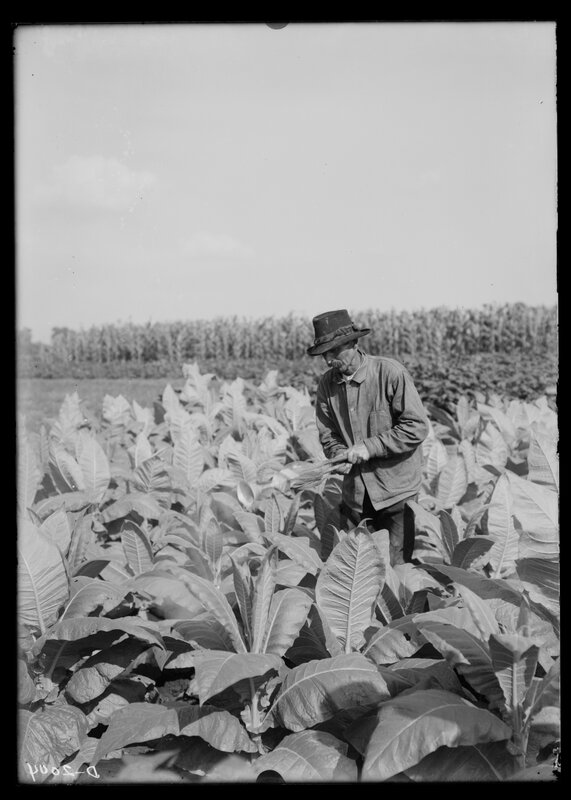 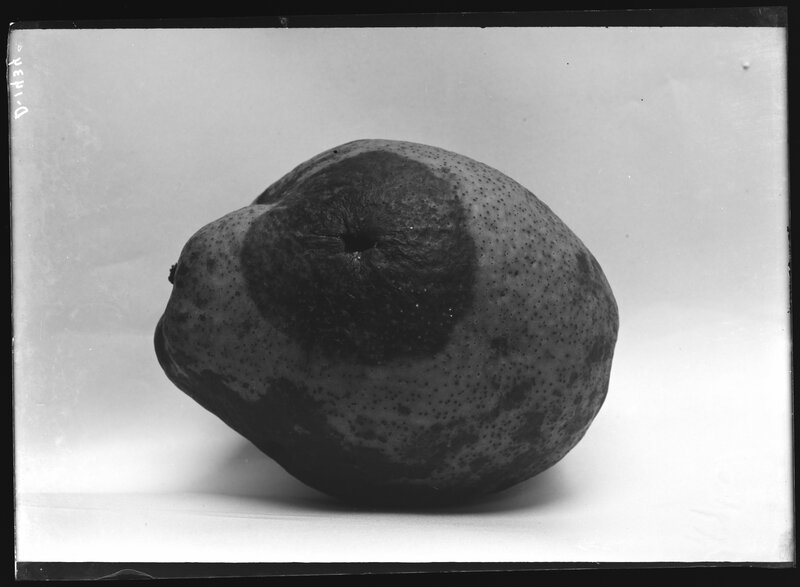 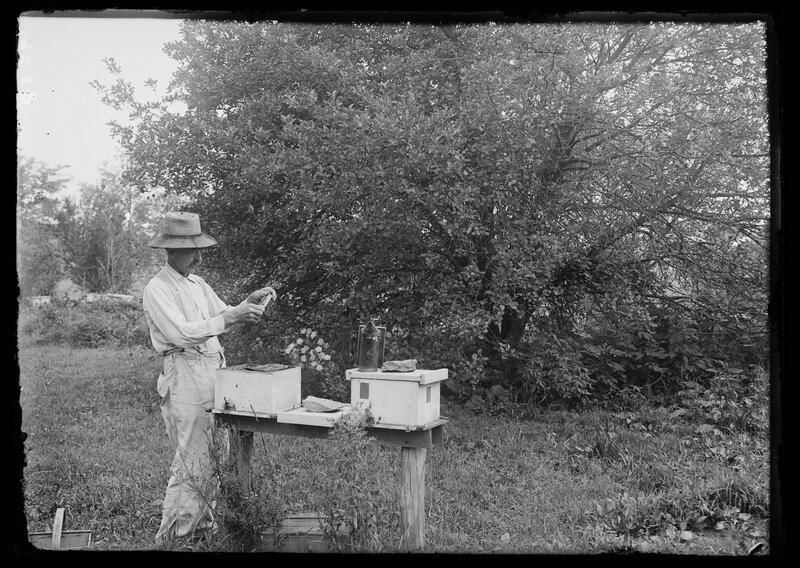 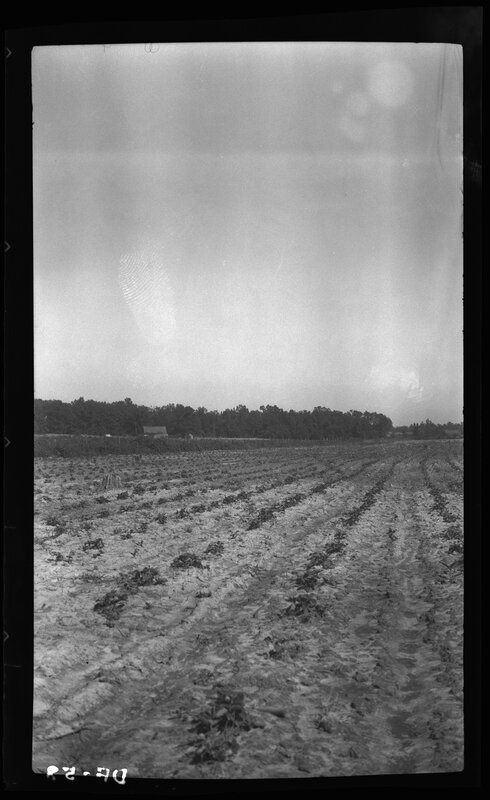 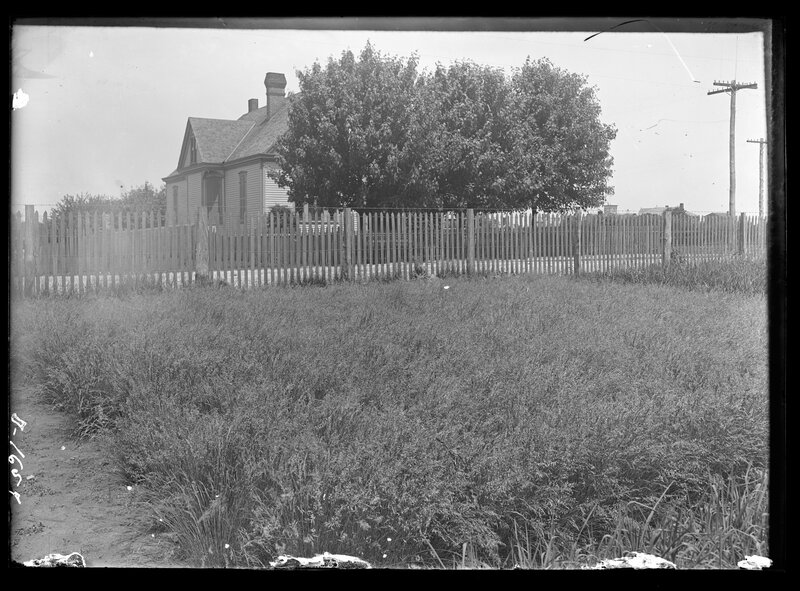 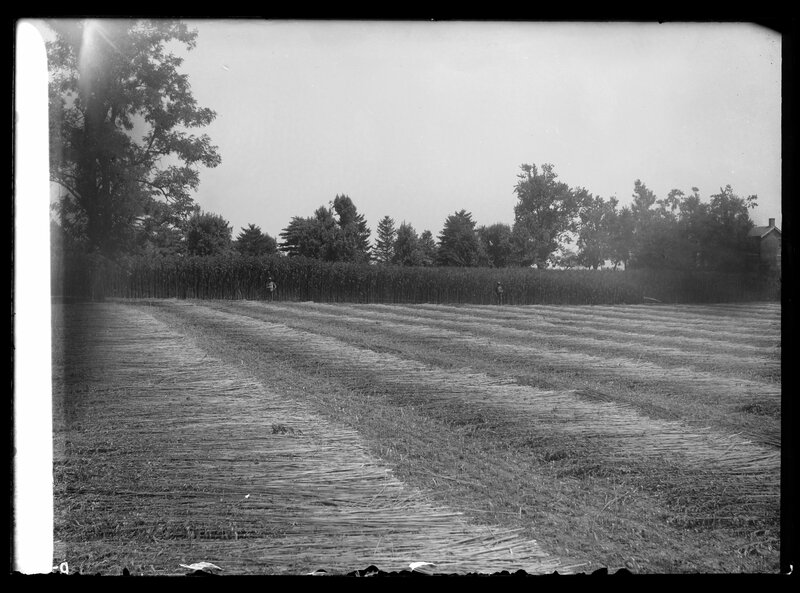 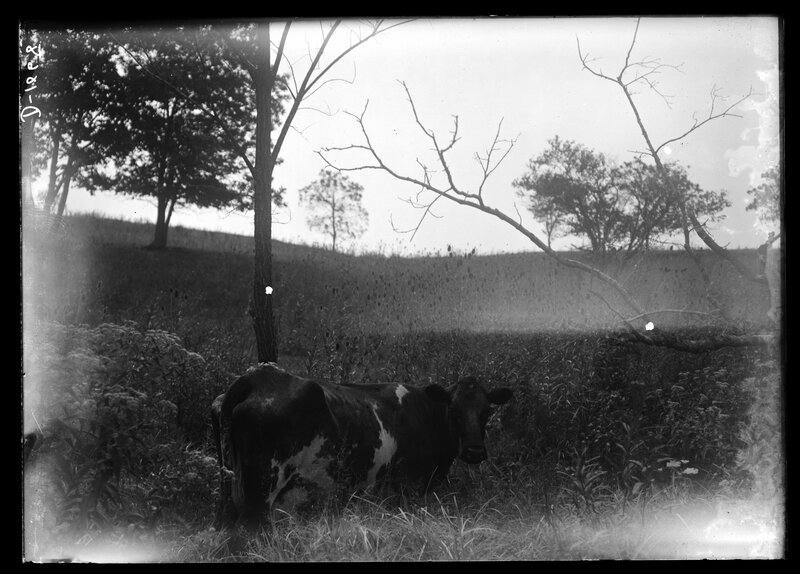 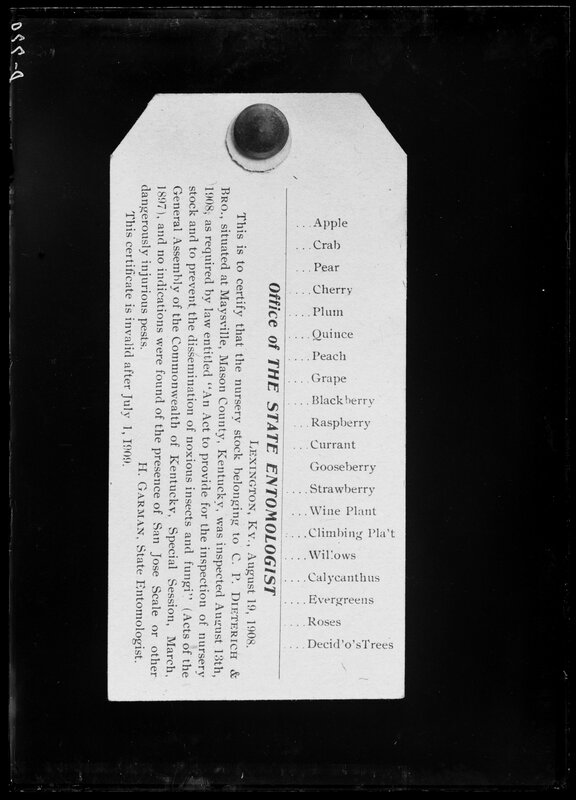 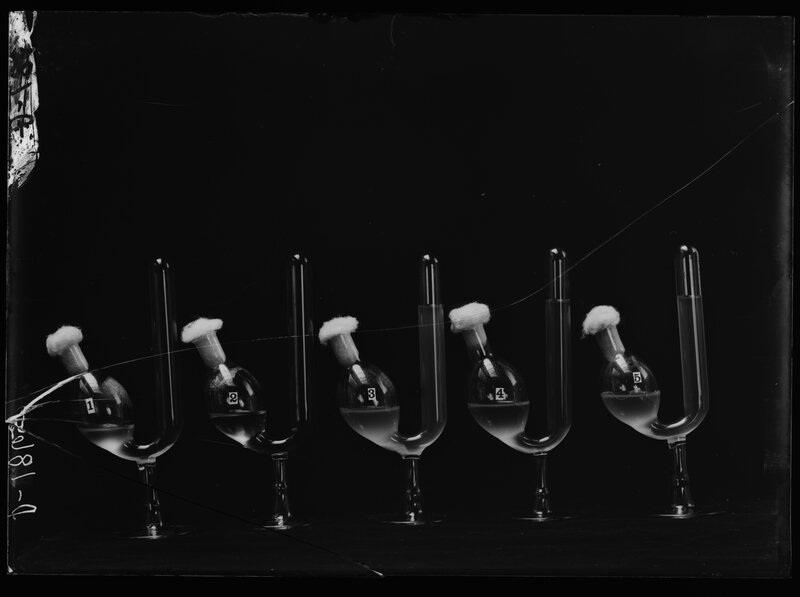 0000ua269: [identification of item], Agricultural Experiment Station (University of Kentucky) negatives, University of Kentucky Archives. 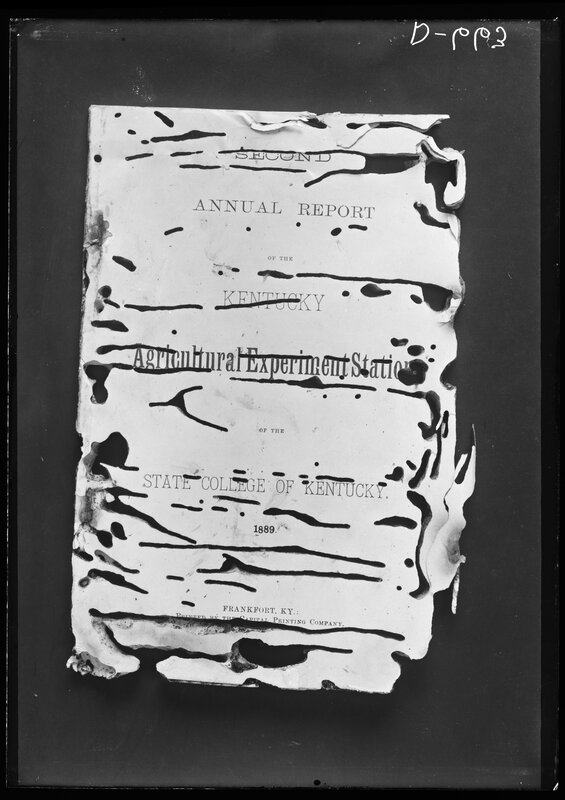 Less than a year after the experiment station was established, the Kentucky General Assembly enacted a law regulating the properties of fertilizers to be sold in the state, making the Experiment Station responsible for the analysis and labeling of the approved products. 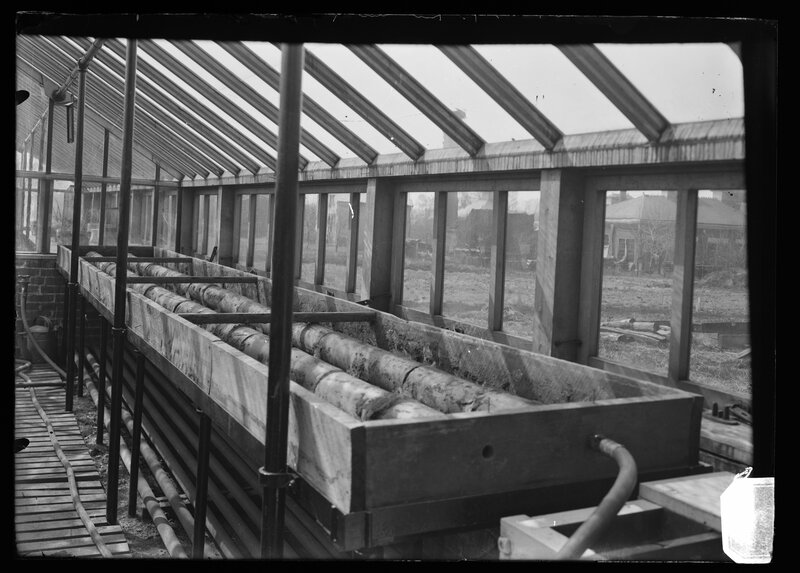 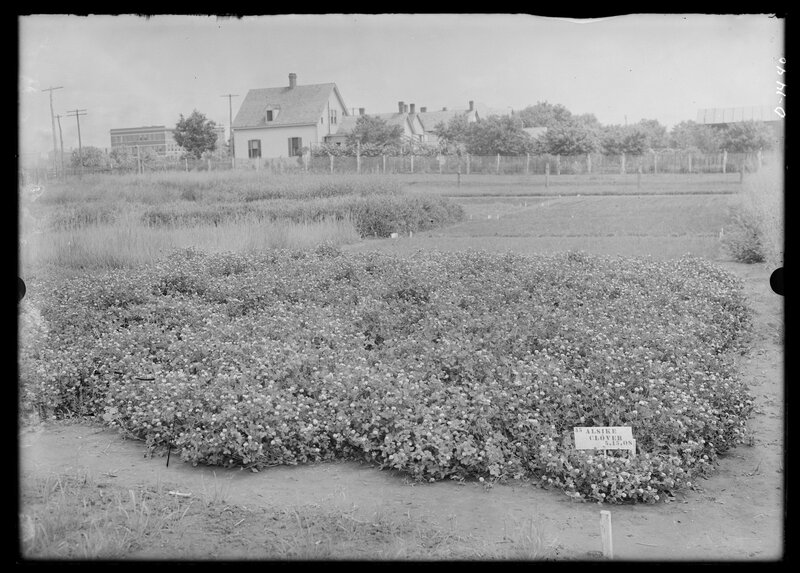 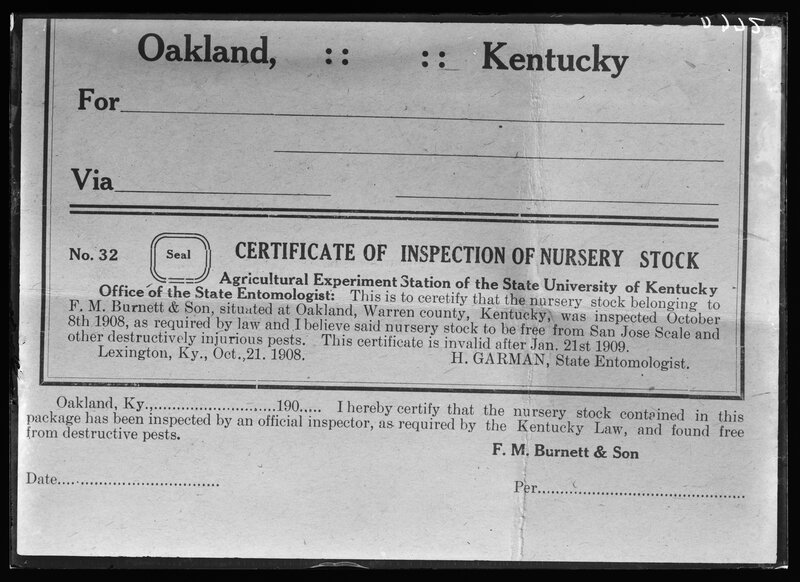 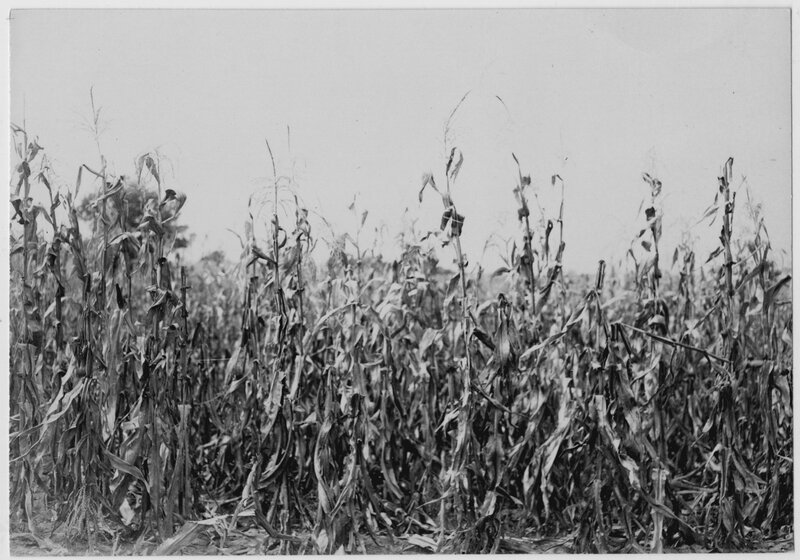 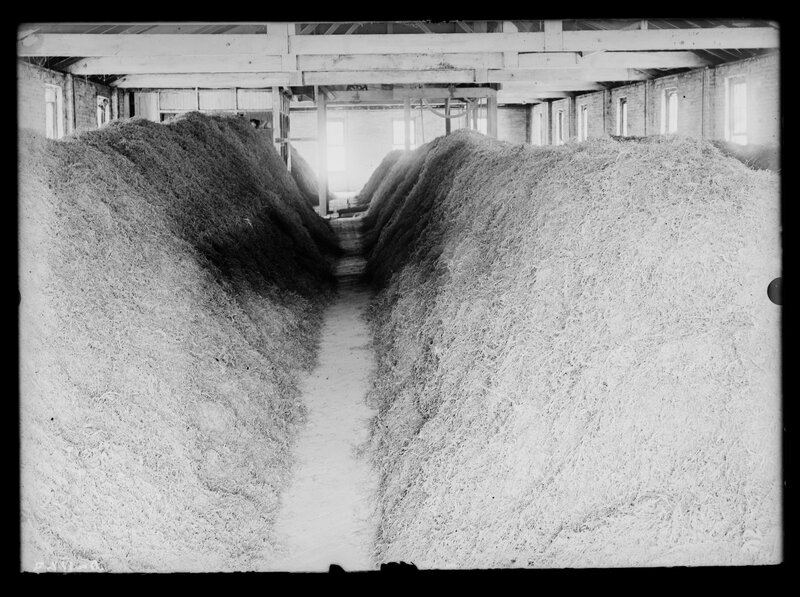 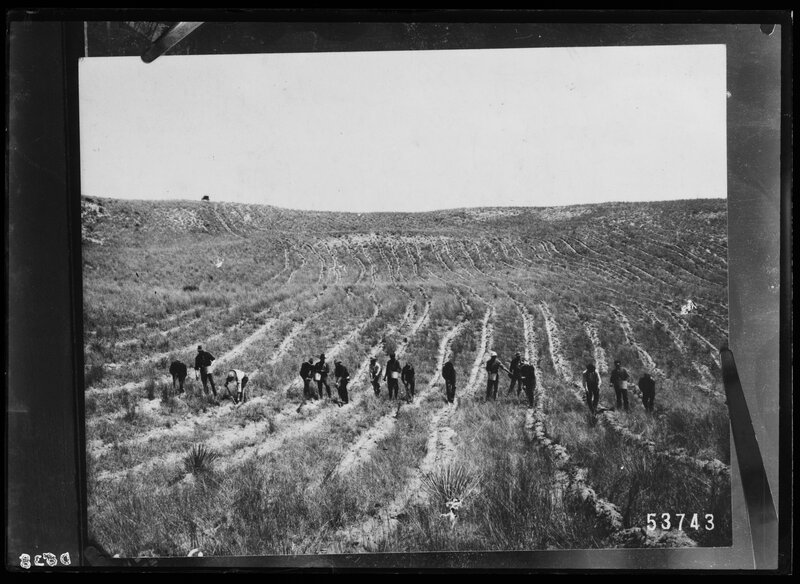 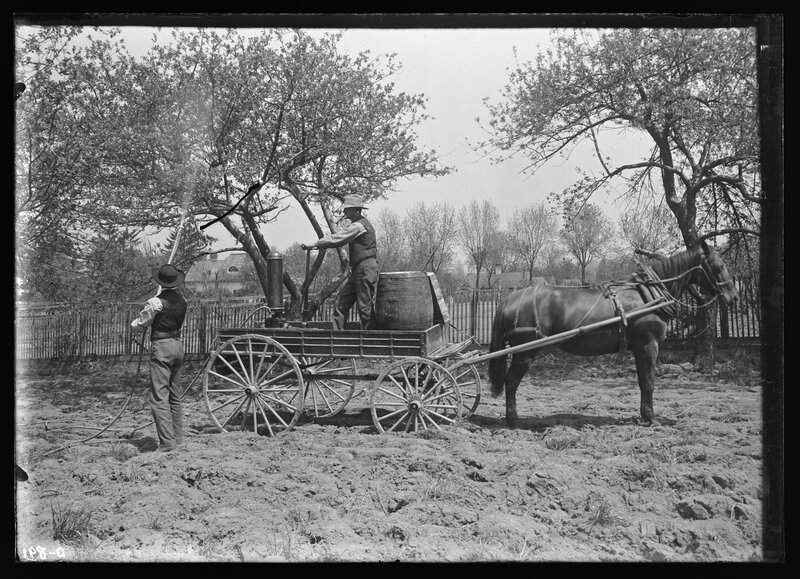 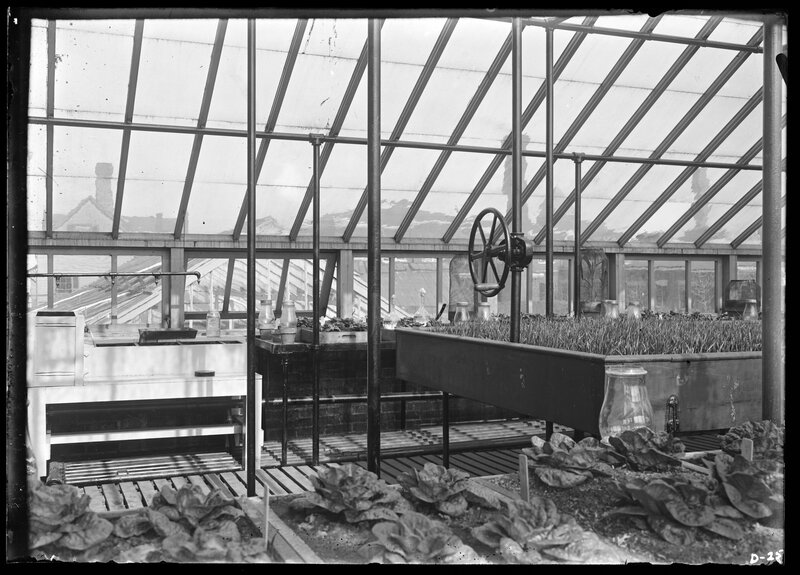 This was the first regulatory activity assigned to the Agricultural Experiment Station, but more responsibility would follow as other regulations were passed, so that by 1918, the Experiment Station was regulating fertilizers, livestock feed, seeds, nursery products, as well as foods and drugs. 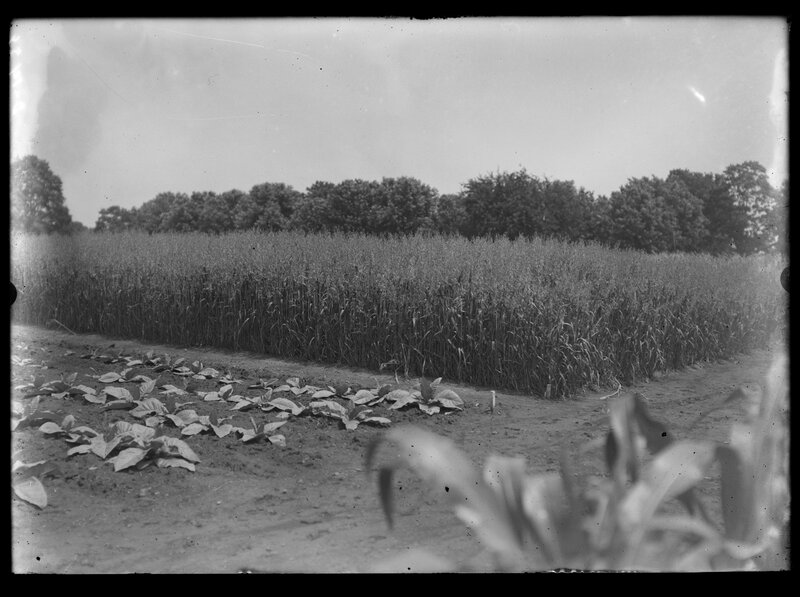 Through its involvement with regulation, and also through the publication of bulletins explaining the results of research, the Experiment Station began to gain the trust and respect of farmers throughout the state. 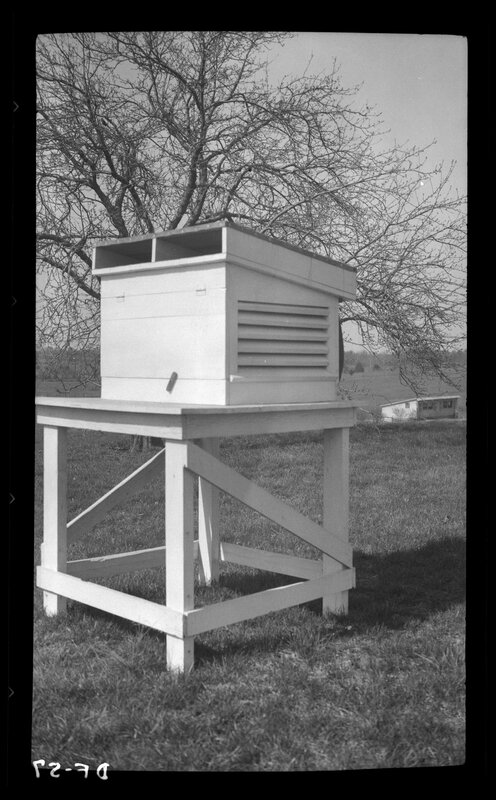 This relationship continued to develop and be maintained through the Experiment Station's involvement and partnership with the Kentucky Cooperative Extension service that operated at the county level. 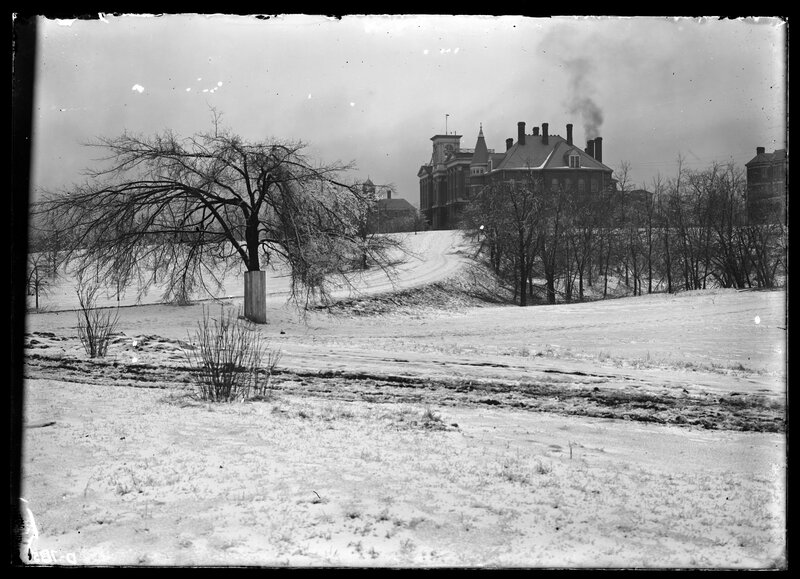 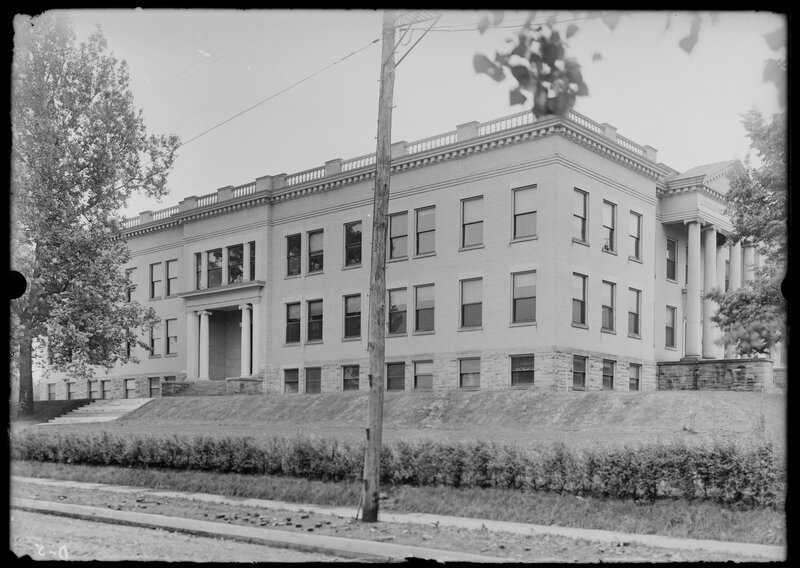 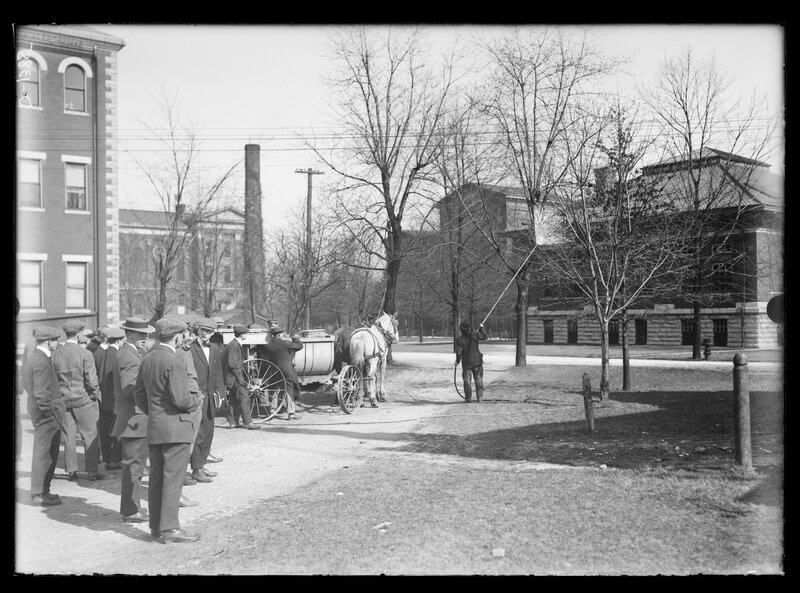 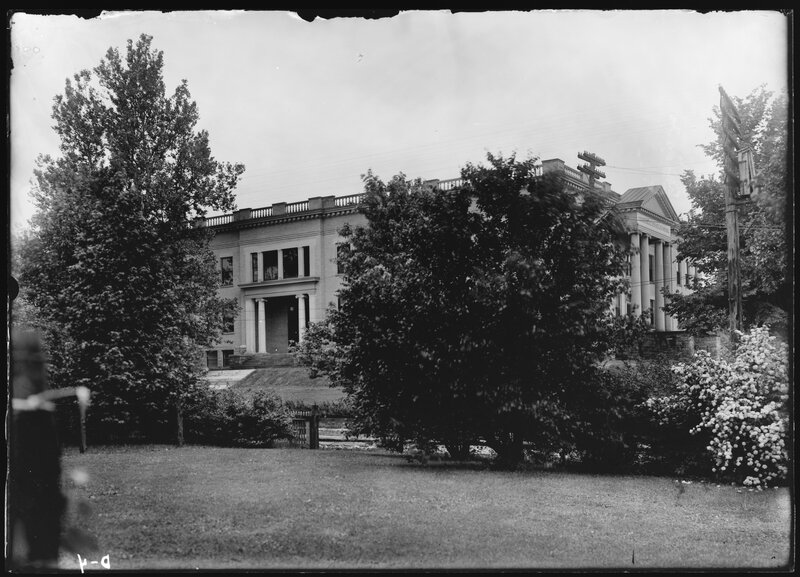 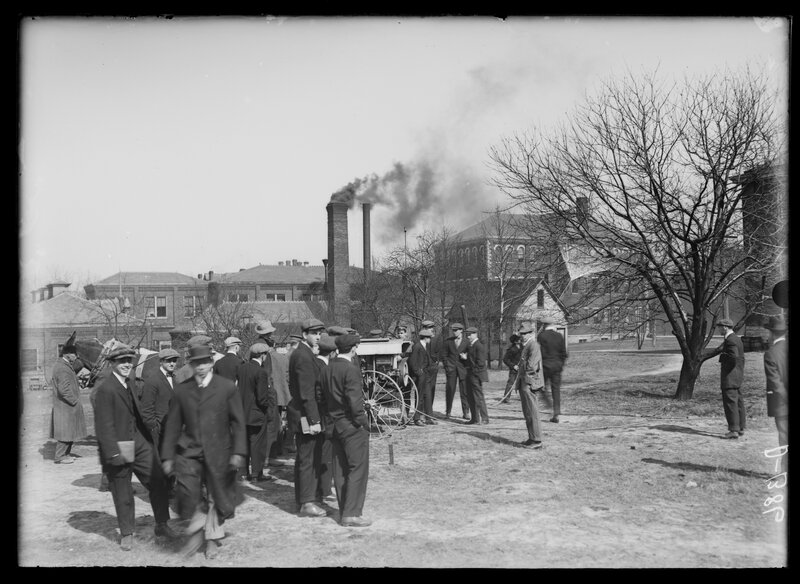 In 1910, the Experiment Station became part of the newly formed College of Agriculture of the University of Kentucky, being designated as the department for research and graduate work. 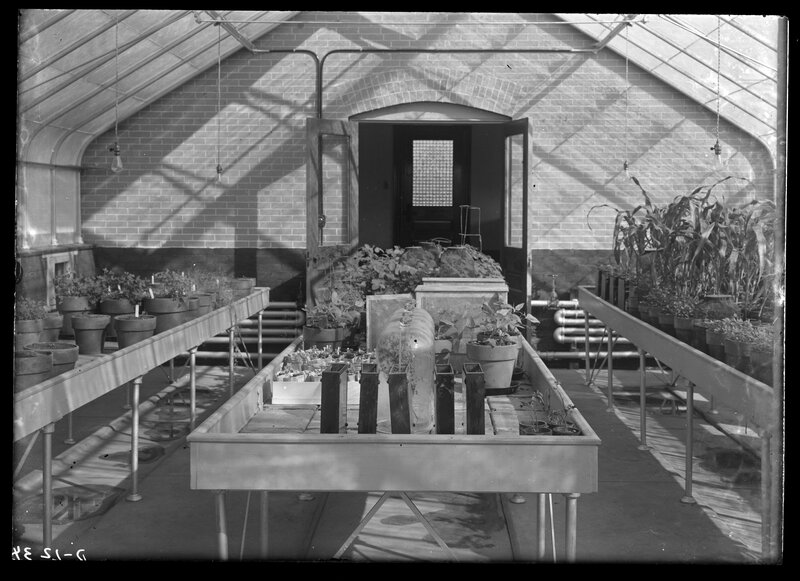 The College of Agriculture also contained the Department of Agriculture, the teaching and undergraduate area, and the Department of Extension Work, the precursor to the Cooperative Extension Service. 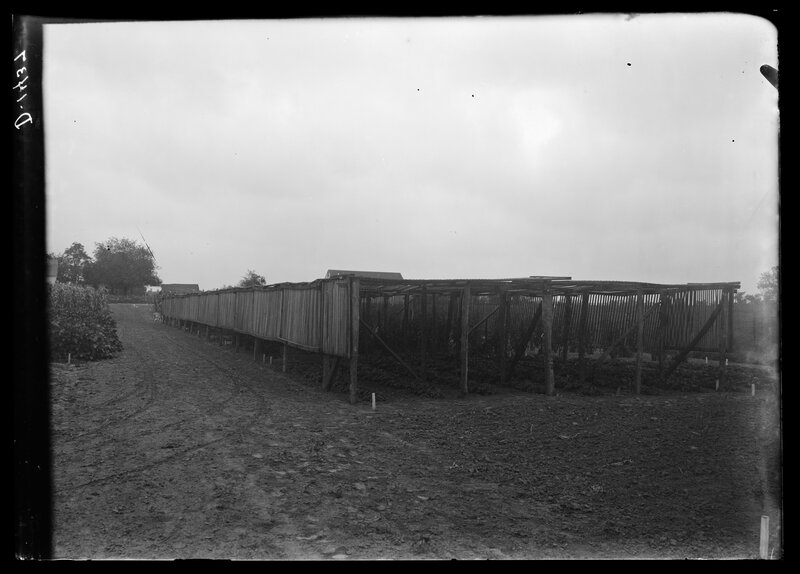 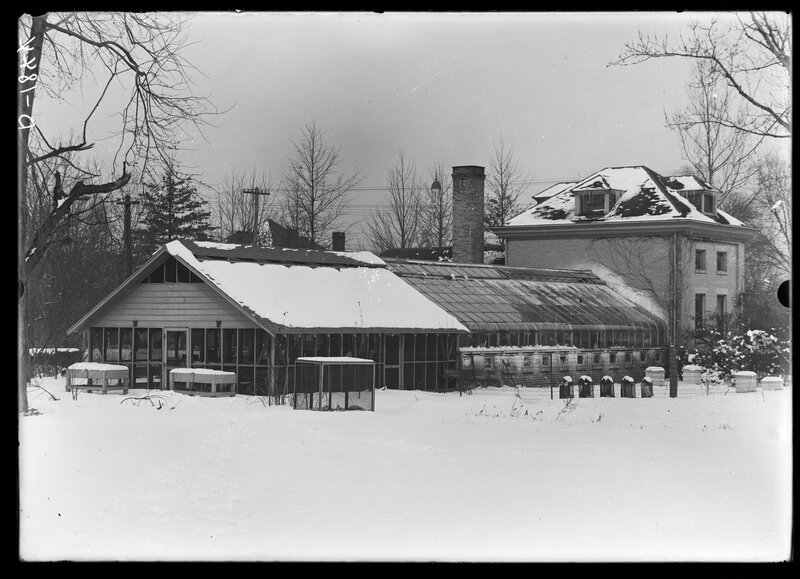 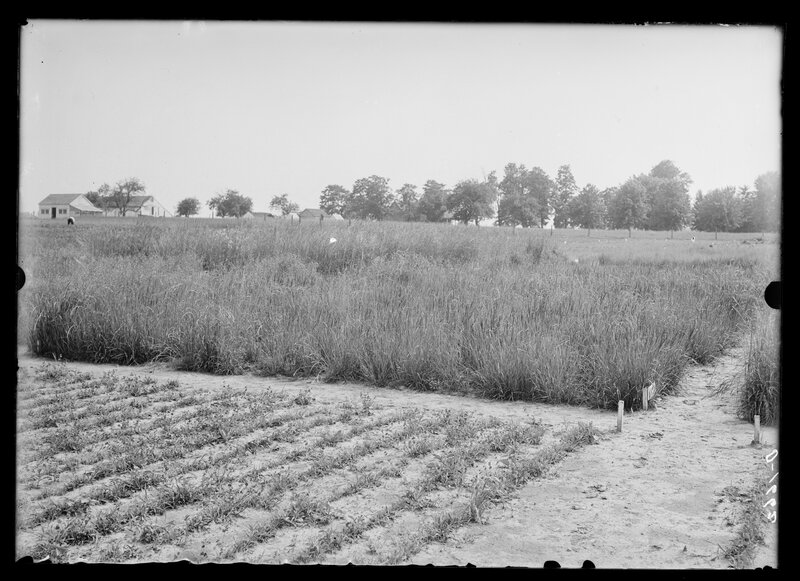 At its establishment, the Agricultural Experiment Station was given twelve acres at the edge of the campus to use as a research farm. 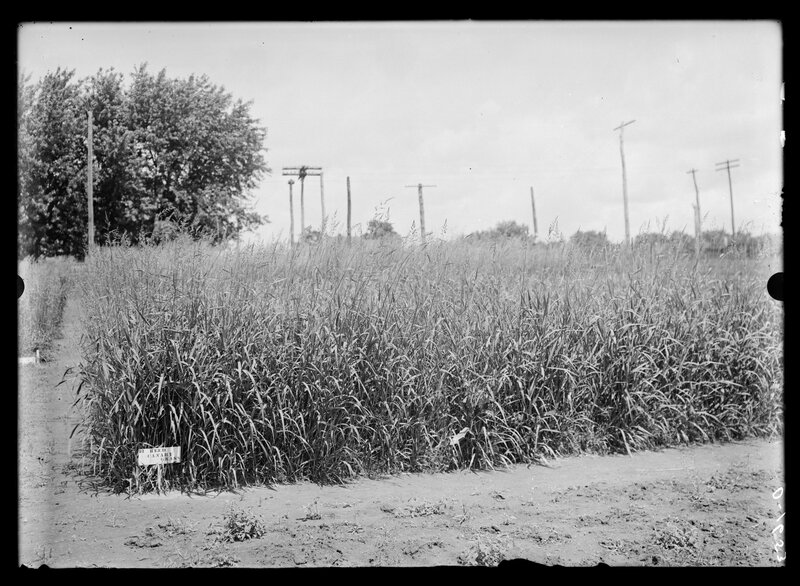 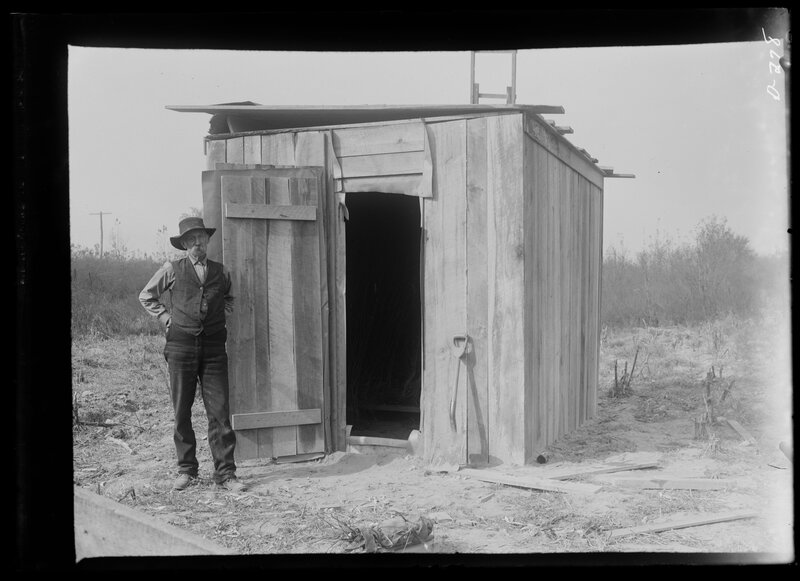 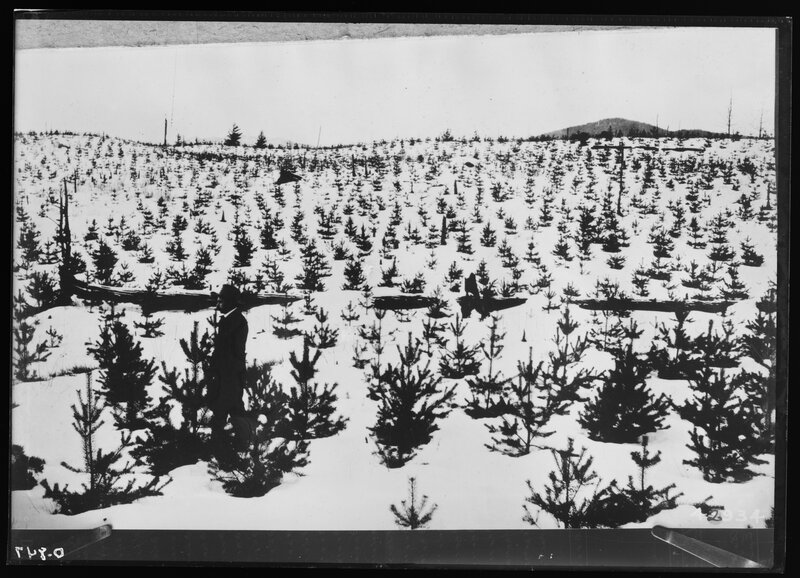 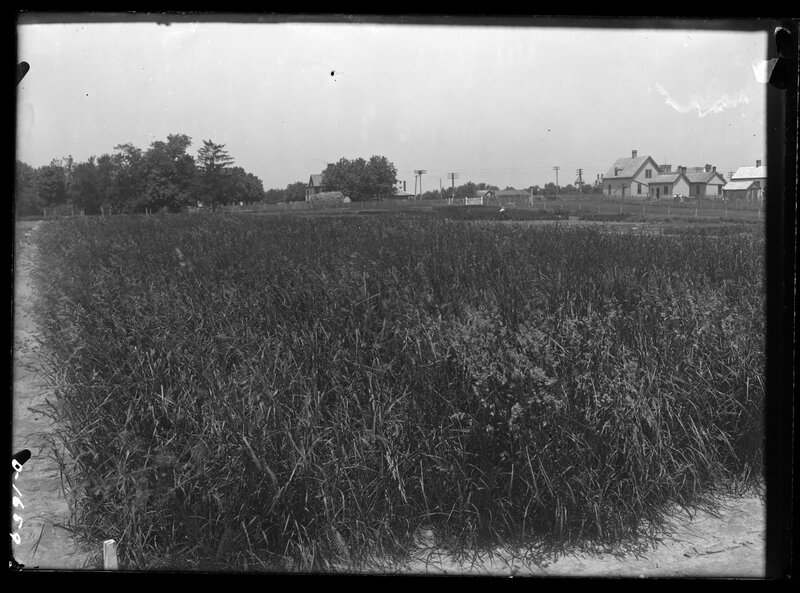 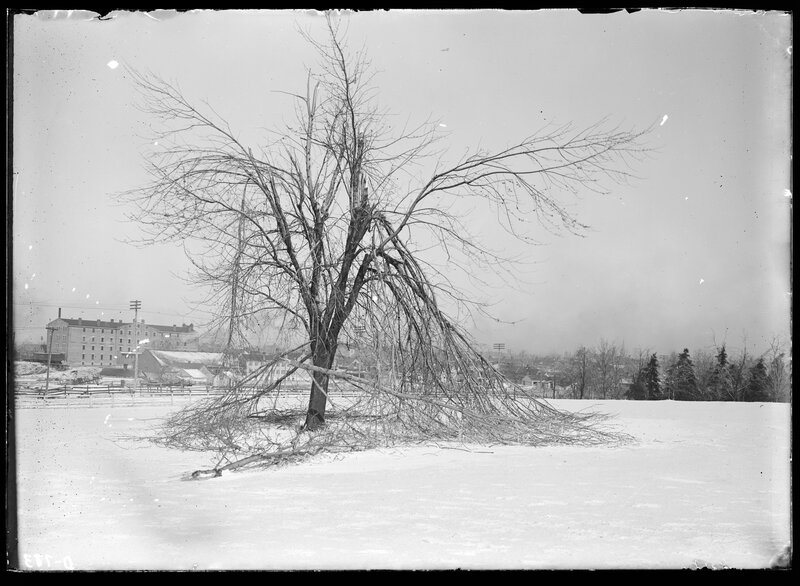 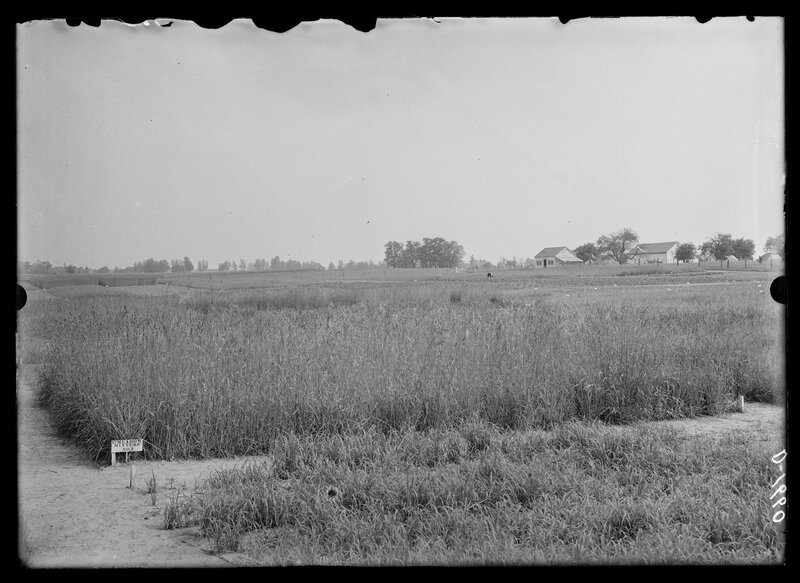 When that land proved insufficient, the Experiment Station began purchasing additional land adjacent to the campus, growing to 230 acres by 1908 and approximately 580 acres by 1930. 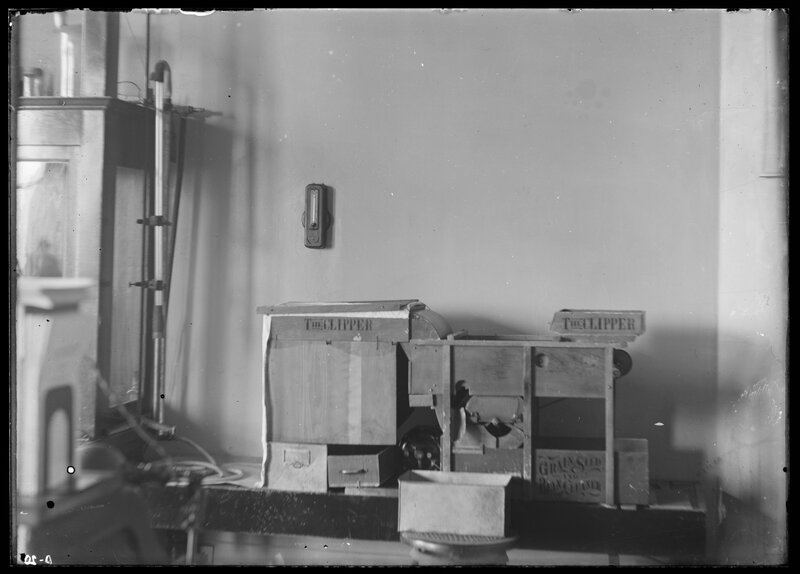 Also, the Experiment Station expanded into other parts of the state, obtaining two "substations" in 1925, one in Breathitt County in eastern Kentucky, and the other in Caldwell County in western Kentucky. 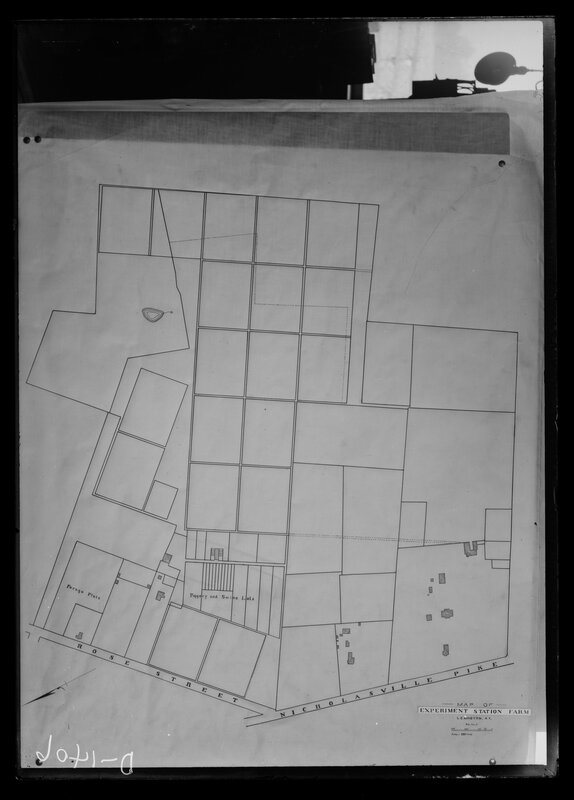 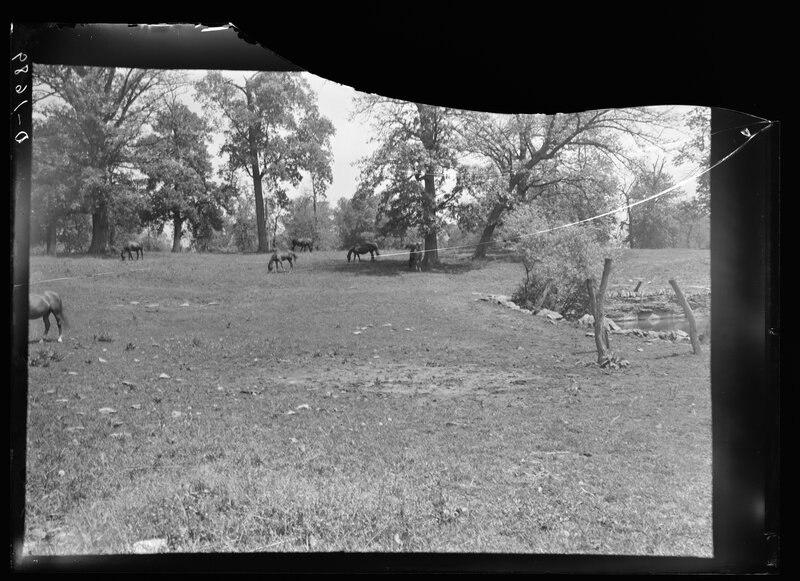 A 600 acre farm in Owen County was obtained in 1955. 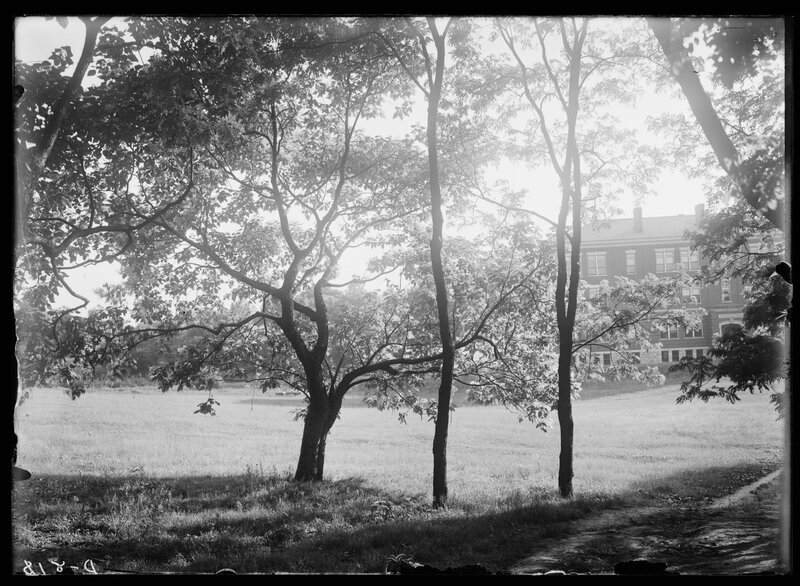 Although most of the original farmland located next to the campus has been transformed into buildings, dormitories, and a football stadium, the Experiment Station continues to research on several farms in Fayette County, as well as the locations in Breathitt, Caldwell, and Owen counties, and a facility in Woodford County obtained in 1991. 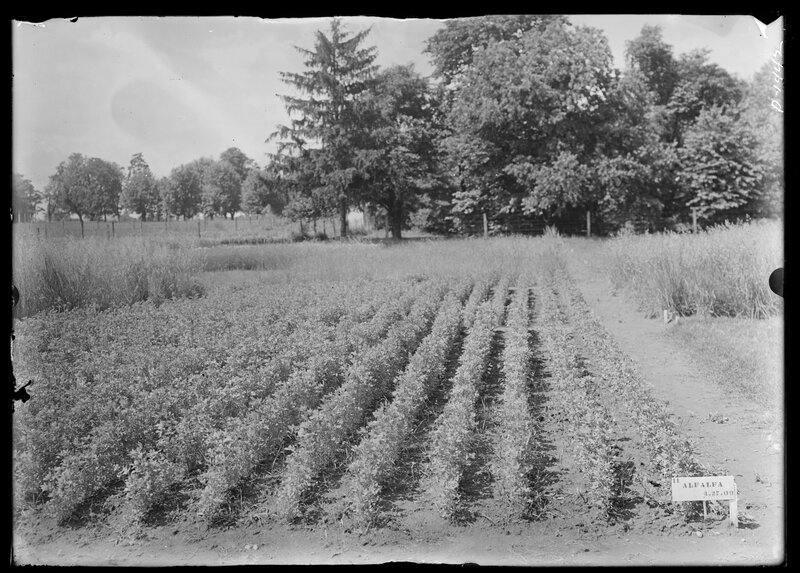 Since its establishment, the Agricultural Experiment Station has researched ways to improve crops, prevent diseases in both livestock and plants, and analyze and improve soils across the state. 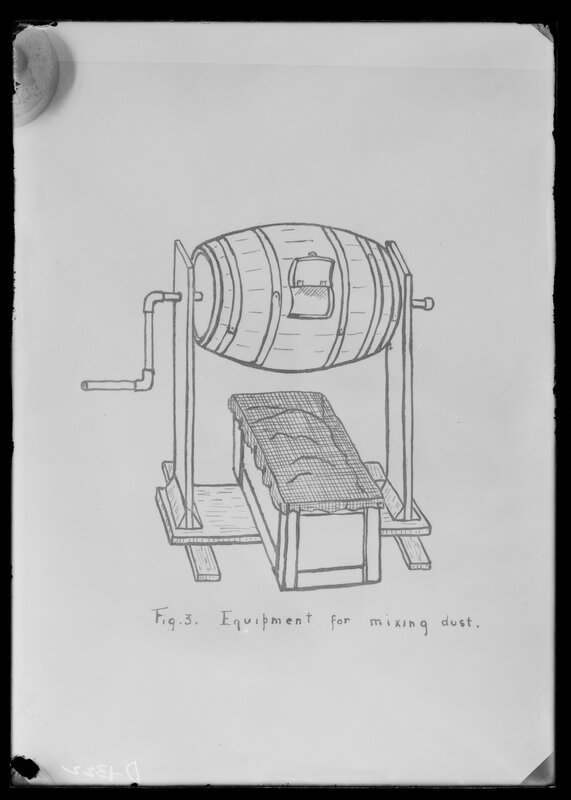 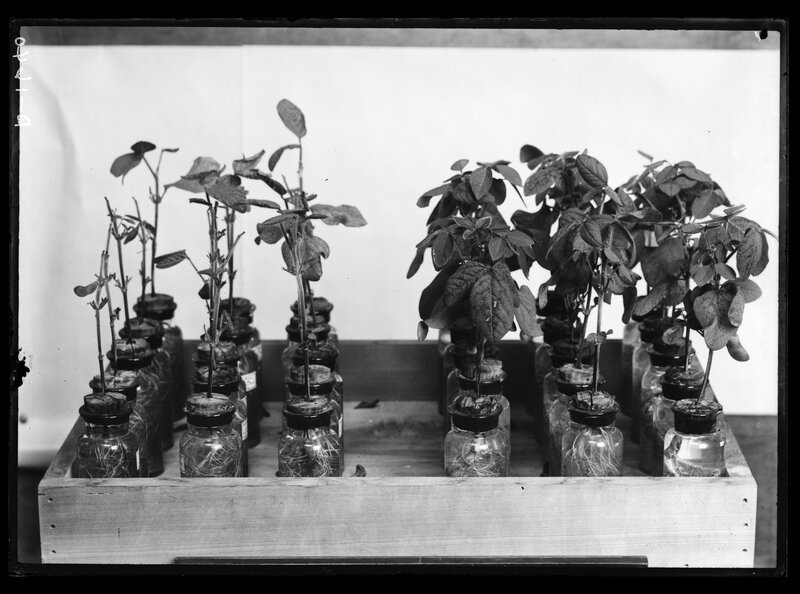 During times of crisis, such as World Wars I and II and the Great Depression, Experiment Station research was essential to increasing food production and ensuring the survival of farmers and farms statewide. 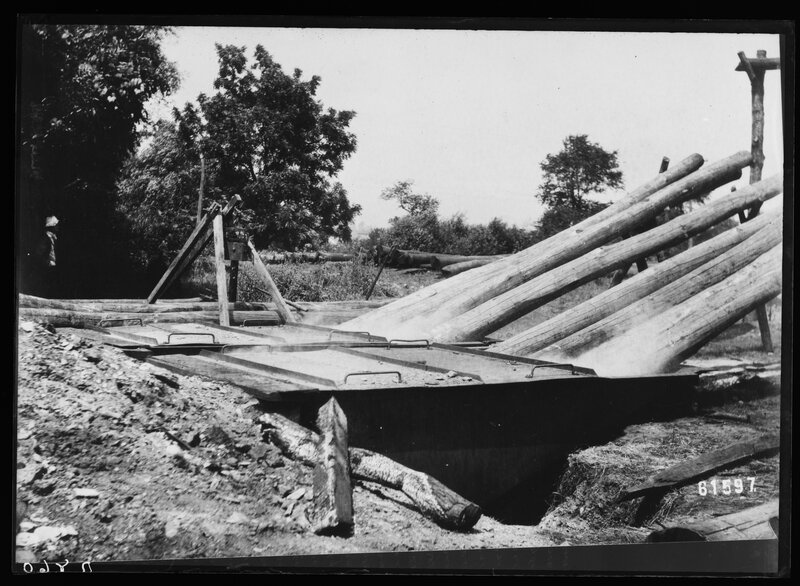 Additionally, the Experiment Station partnered with the U.S. Army Medical Corps and government organizations such as the TVA to provide research and technical advice and instruction. 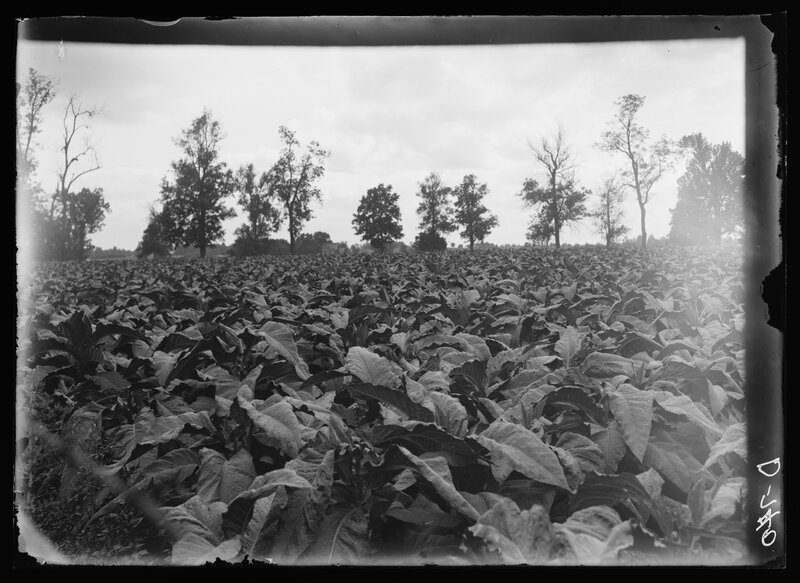 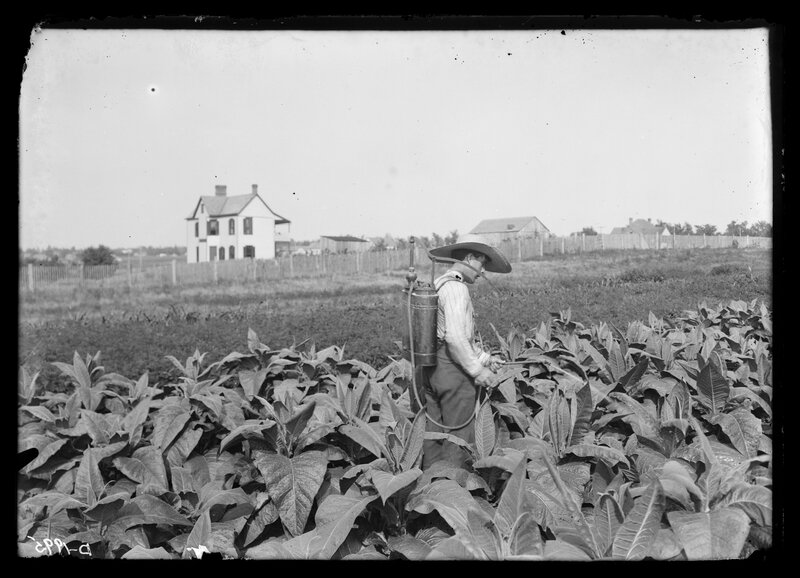 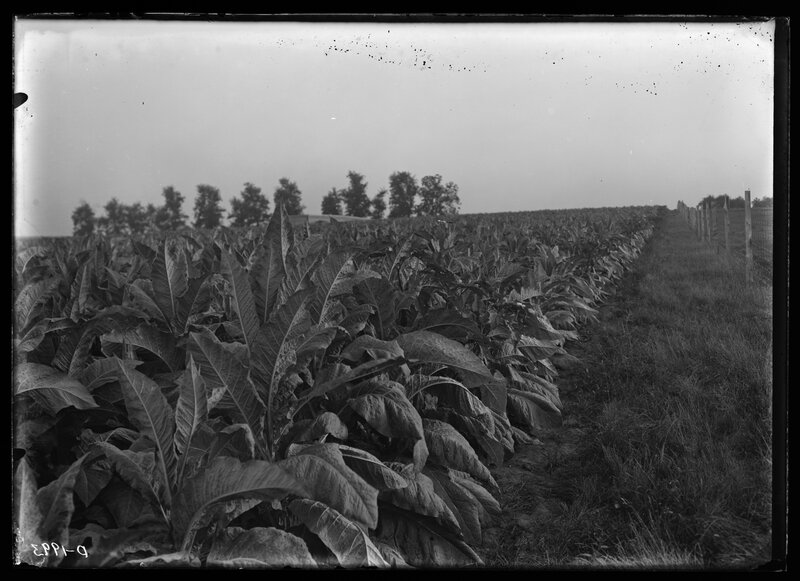 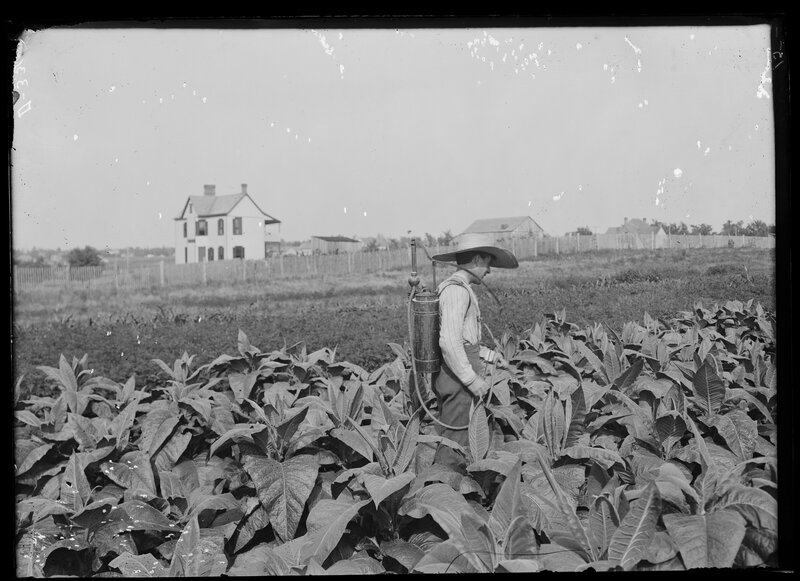 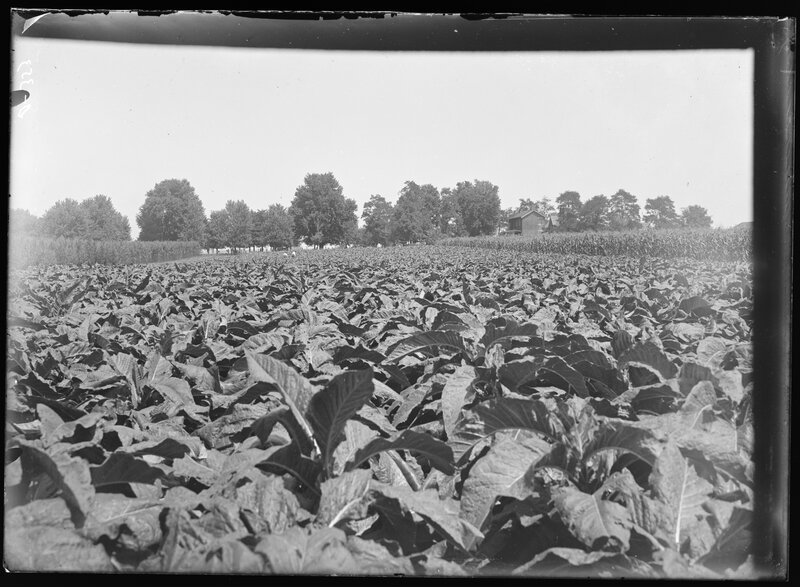 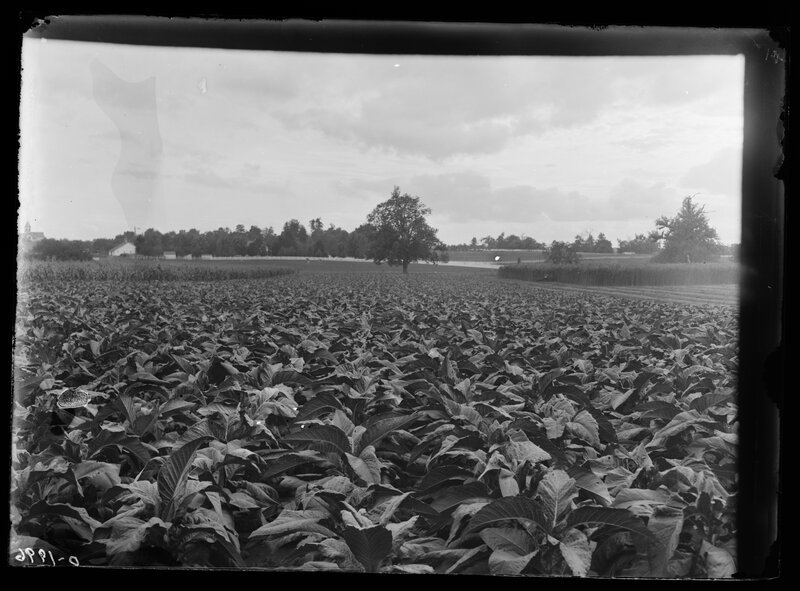 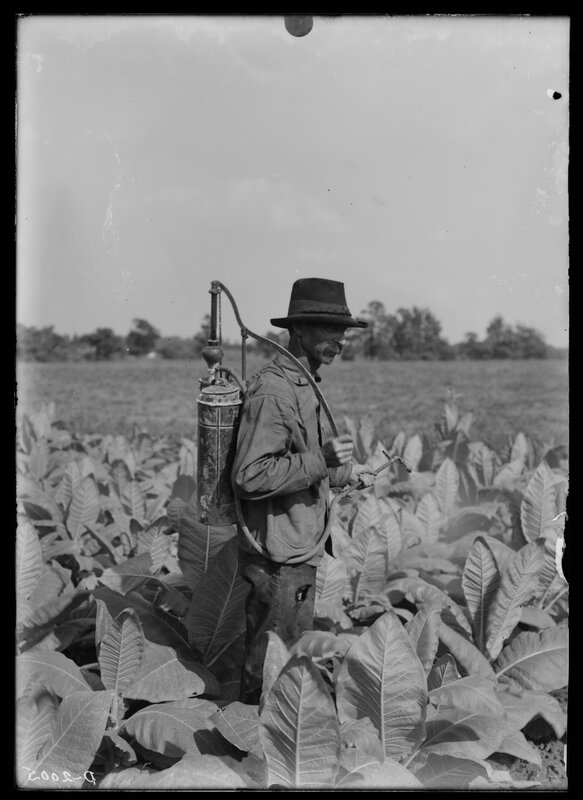 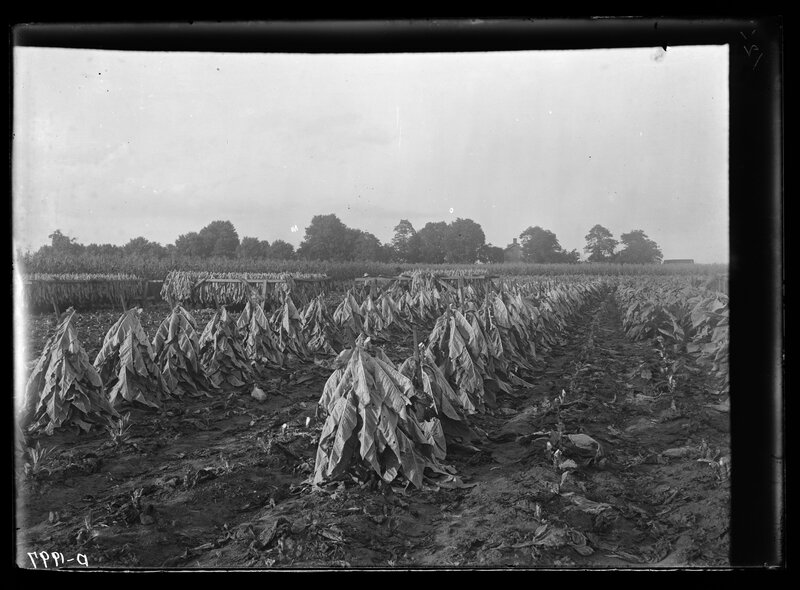 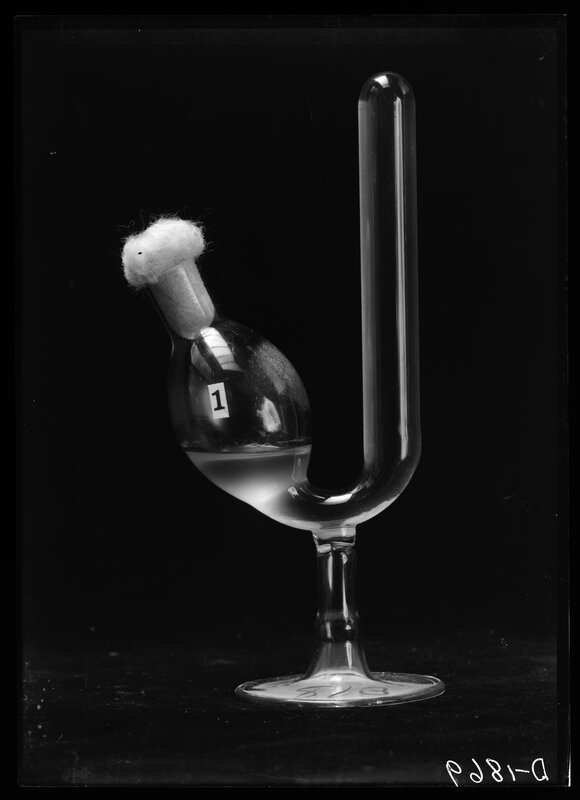 Over the years, tobacco research was and continues to be a major area of investigation for the Experiment Station. 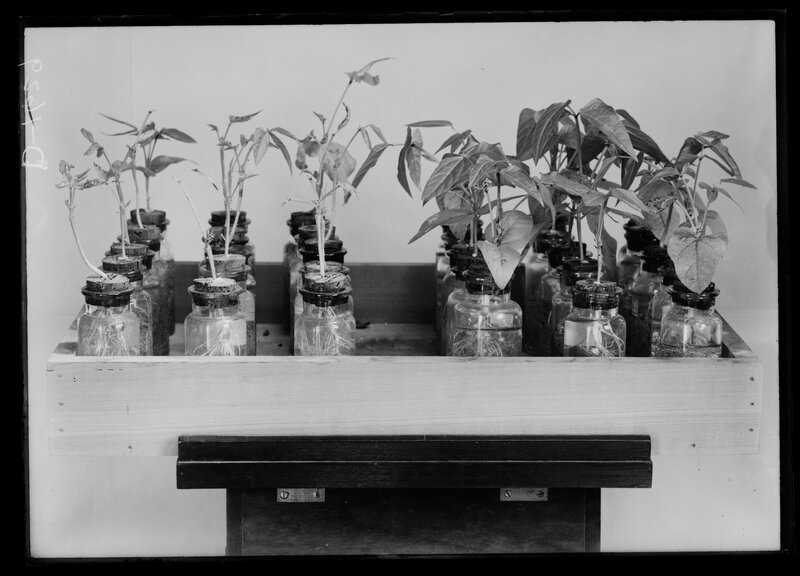 Today, other research areas include agribusiness, international trade, food processing, nutrition, community development, and the environment. 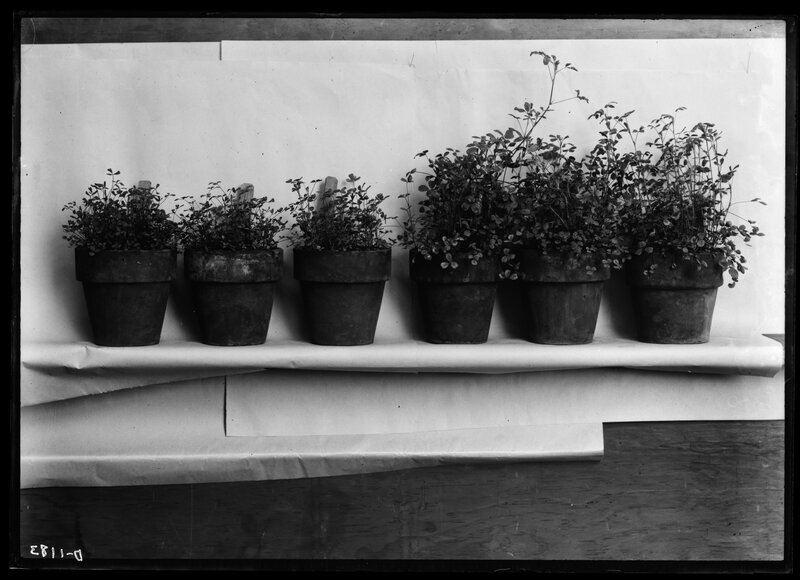 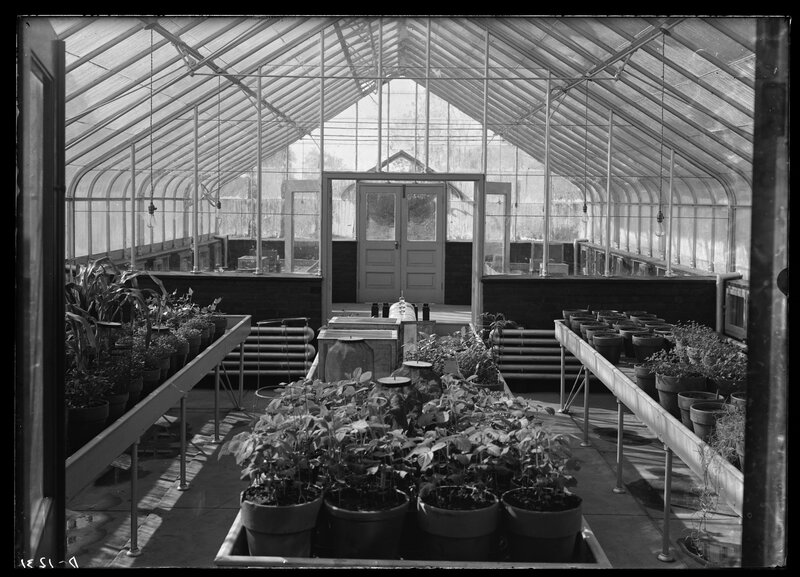 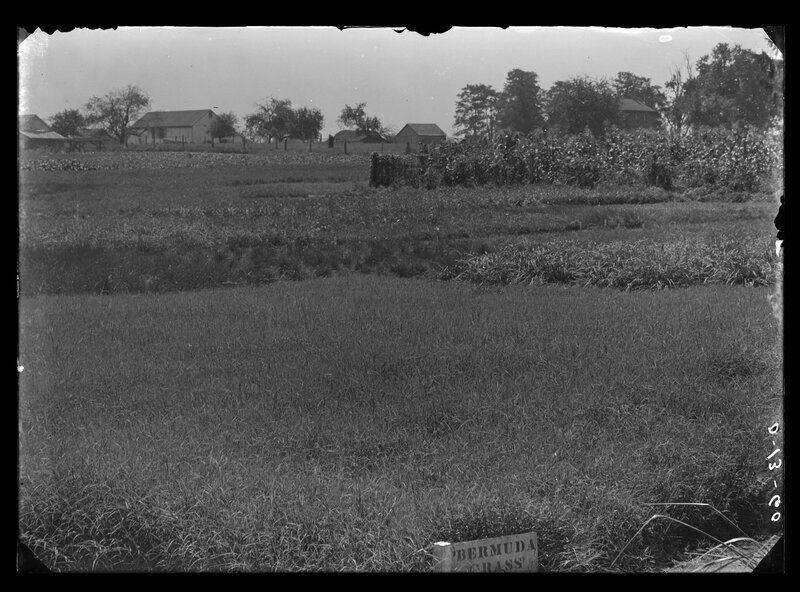 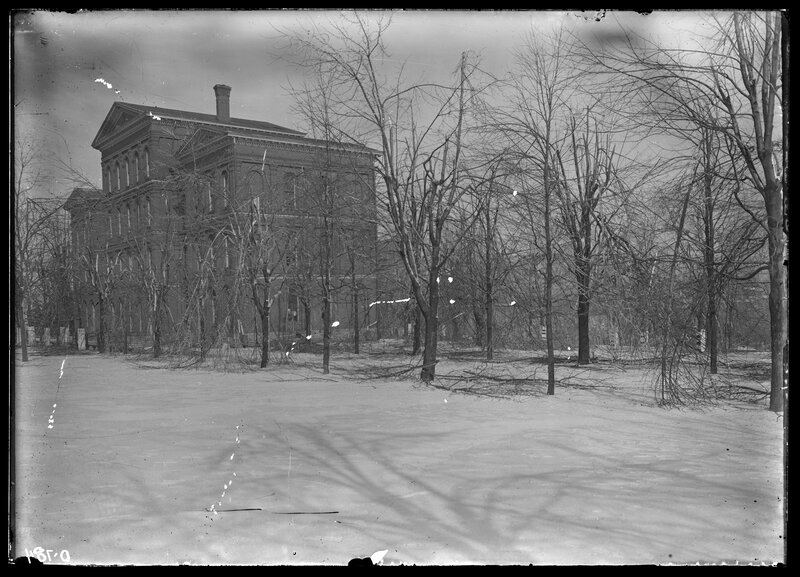 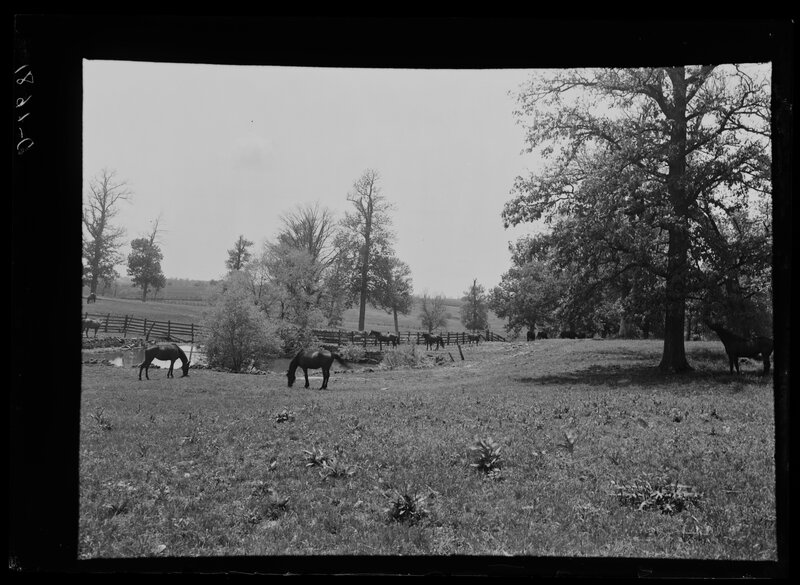 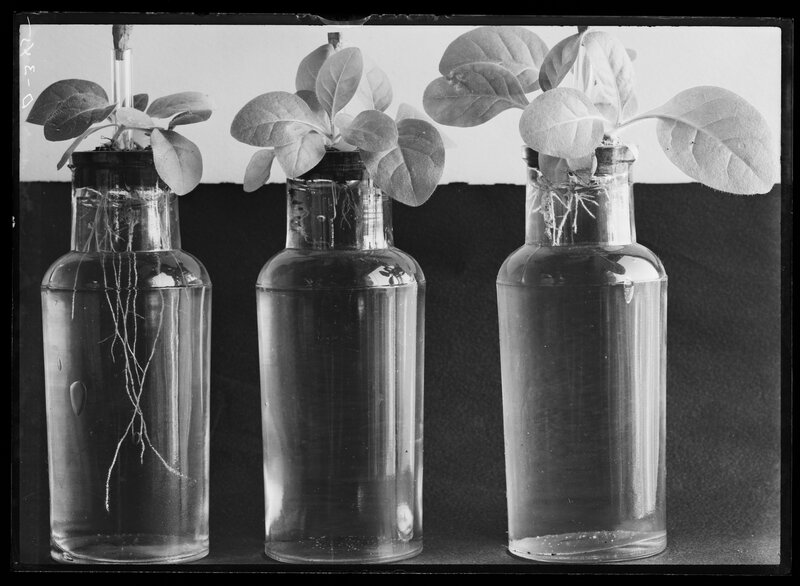 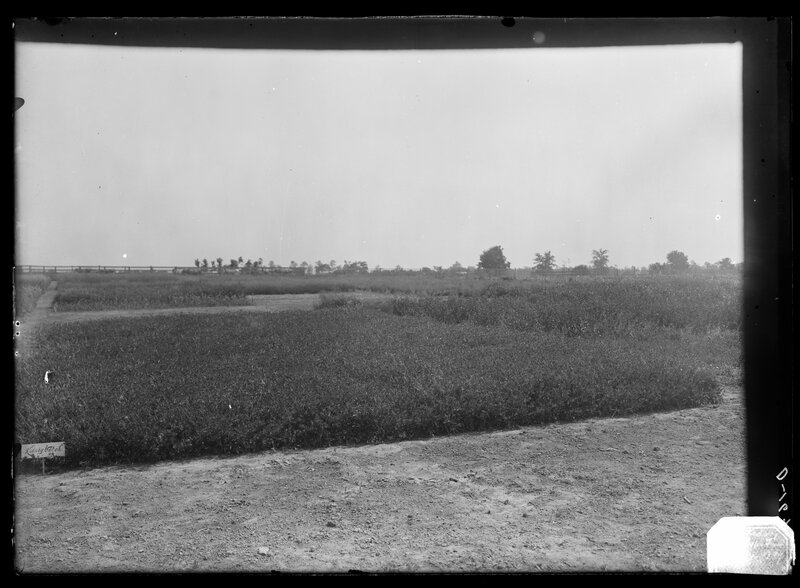 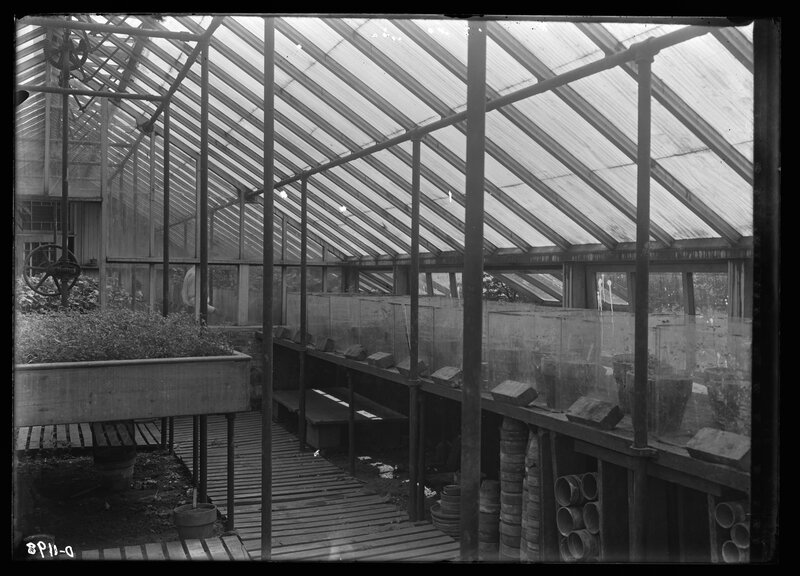 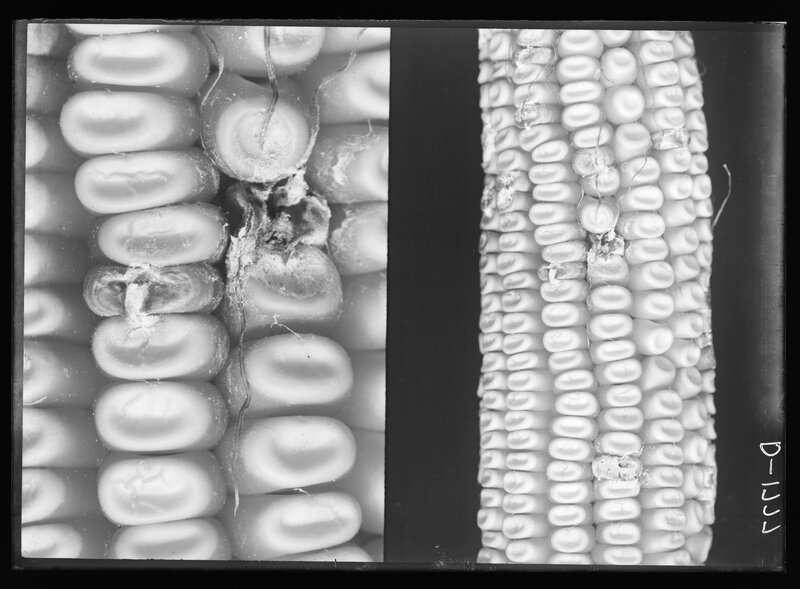 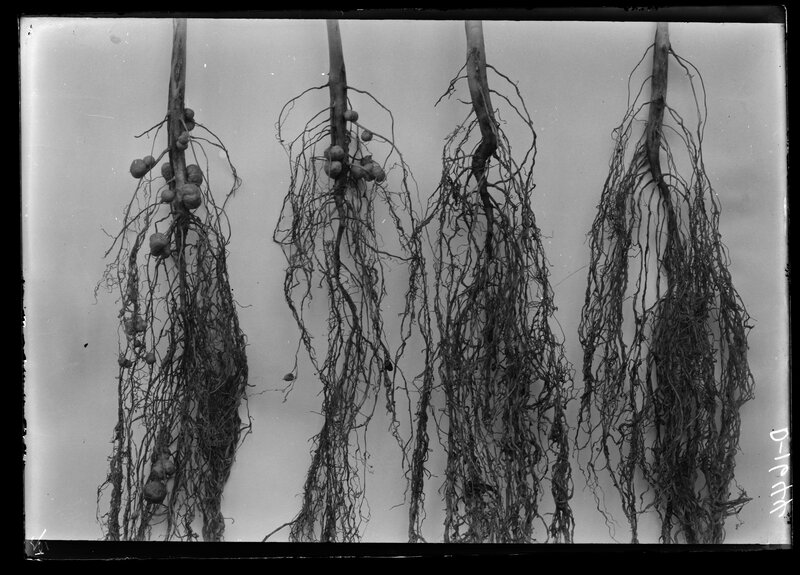 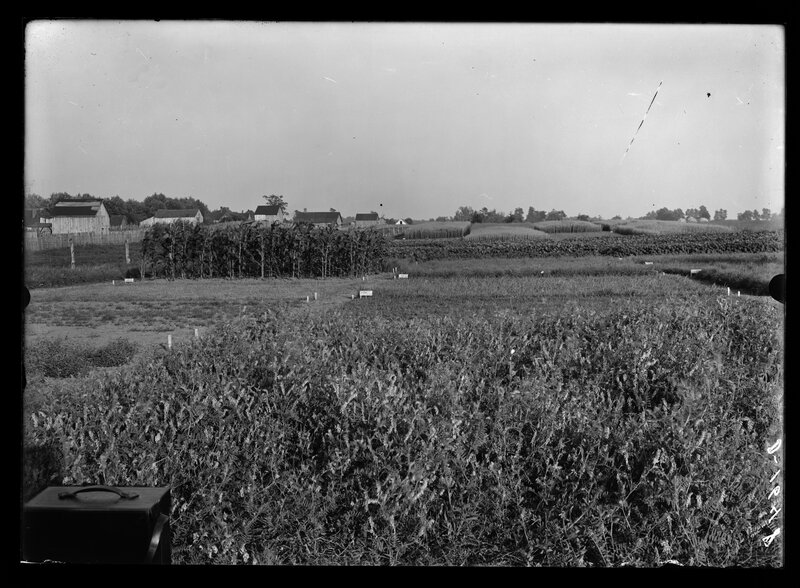 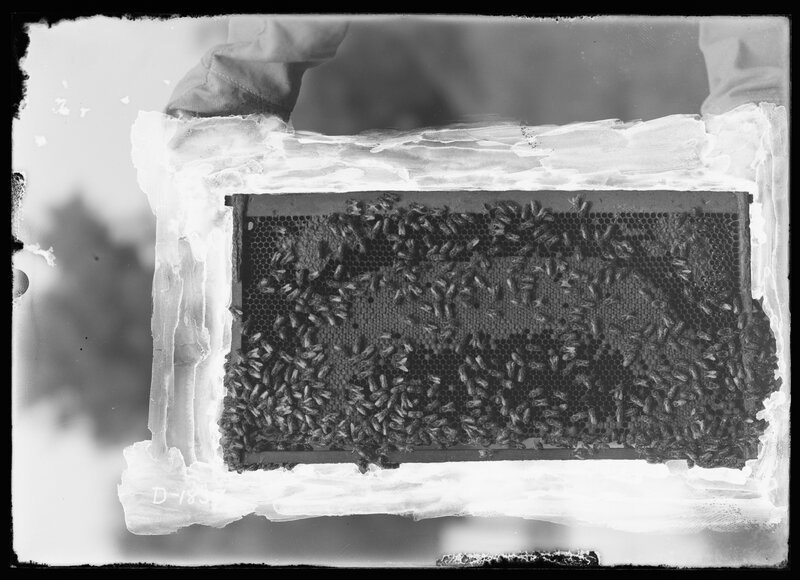 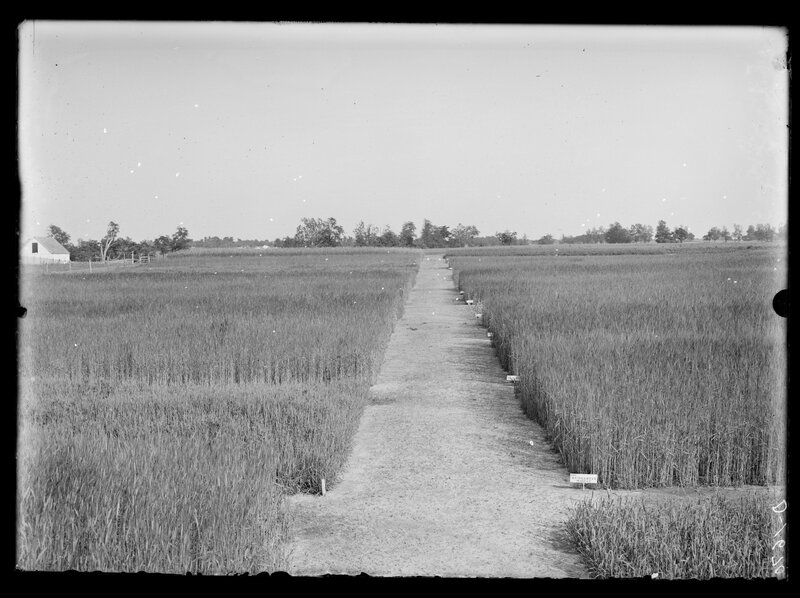 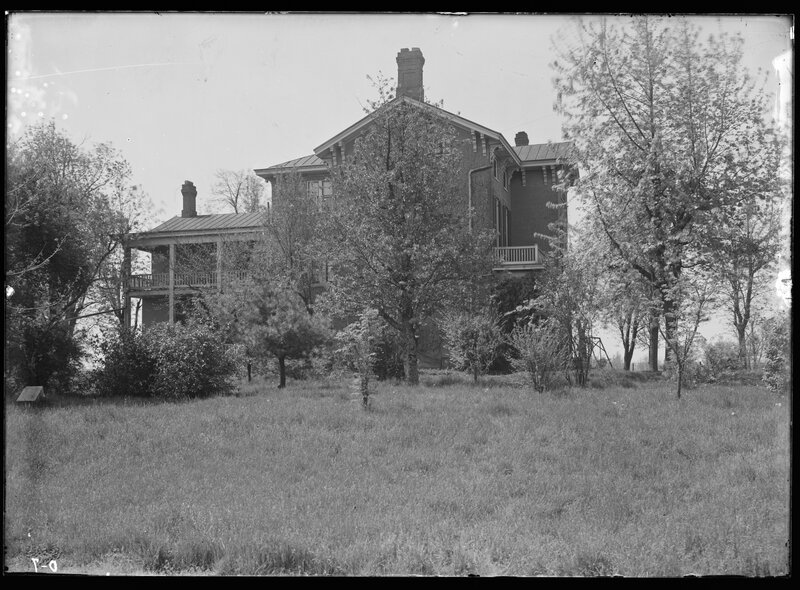 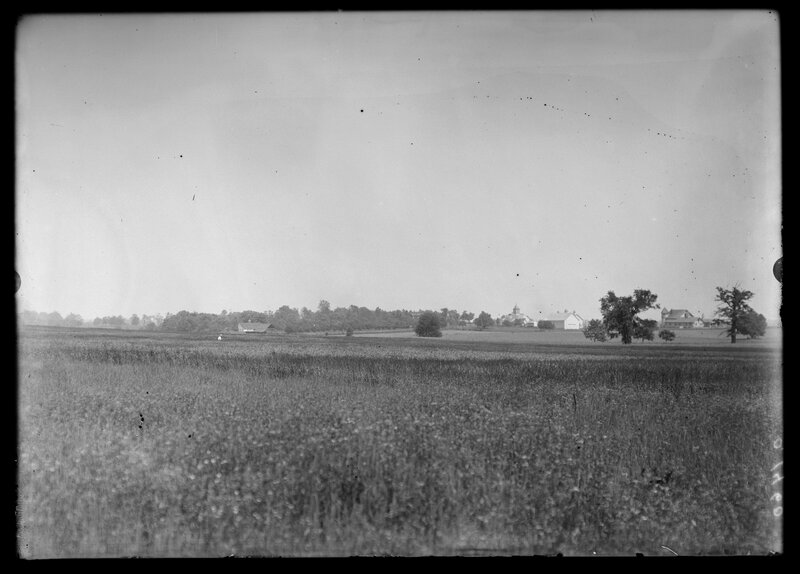 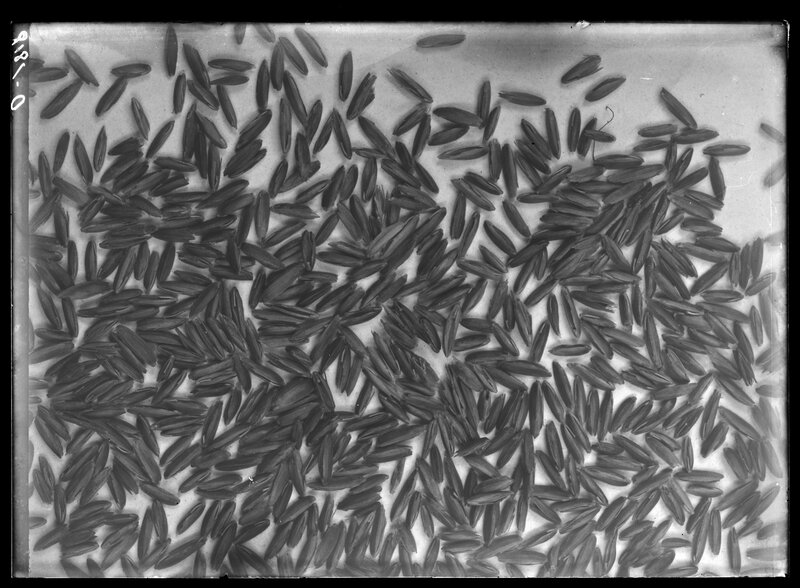 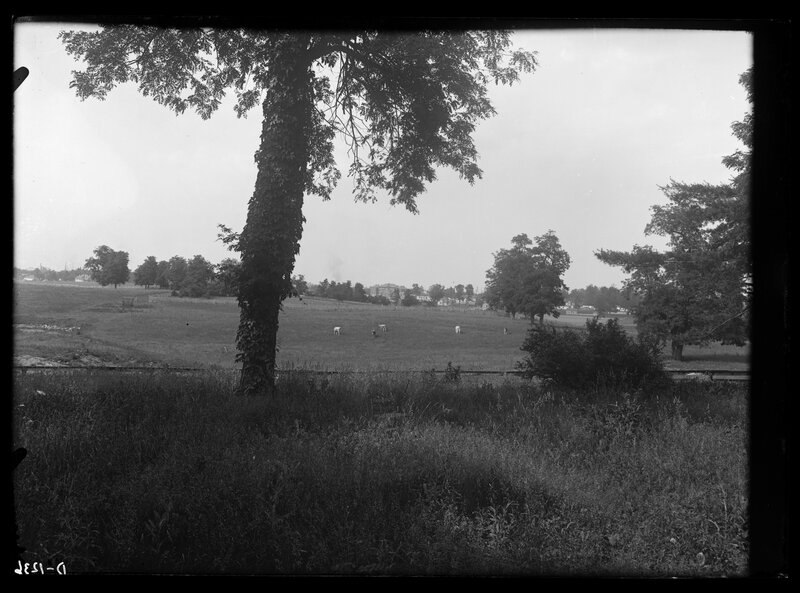 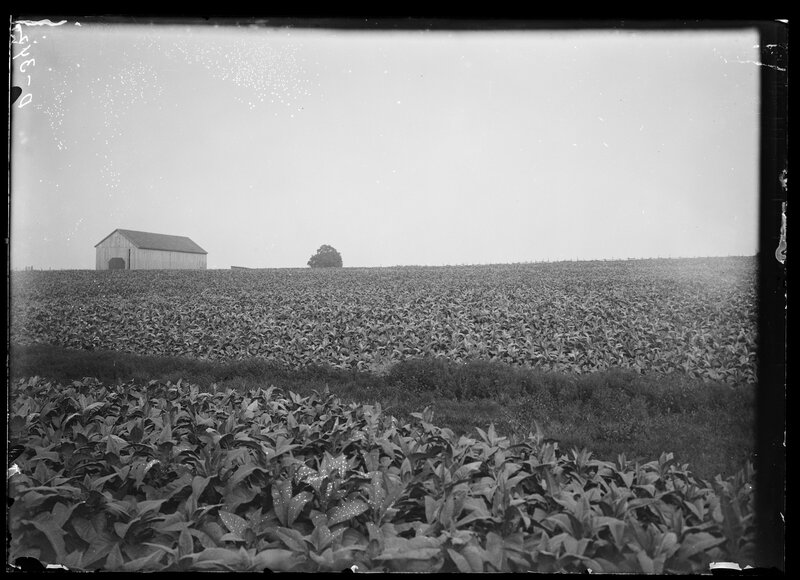 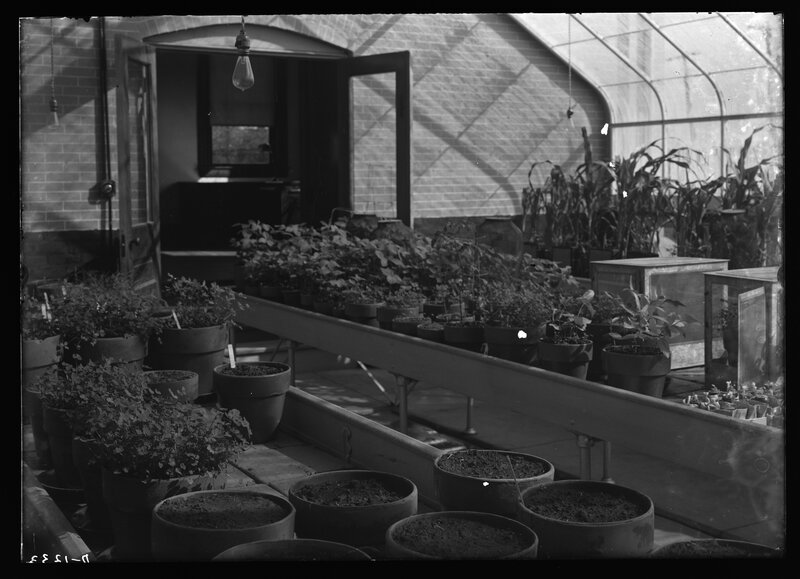 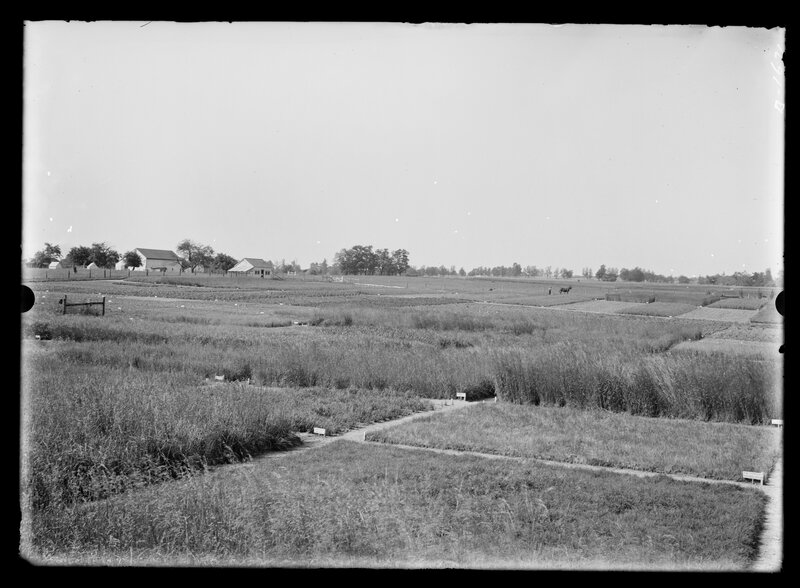 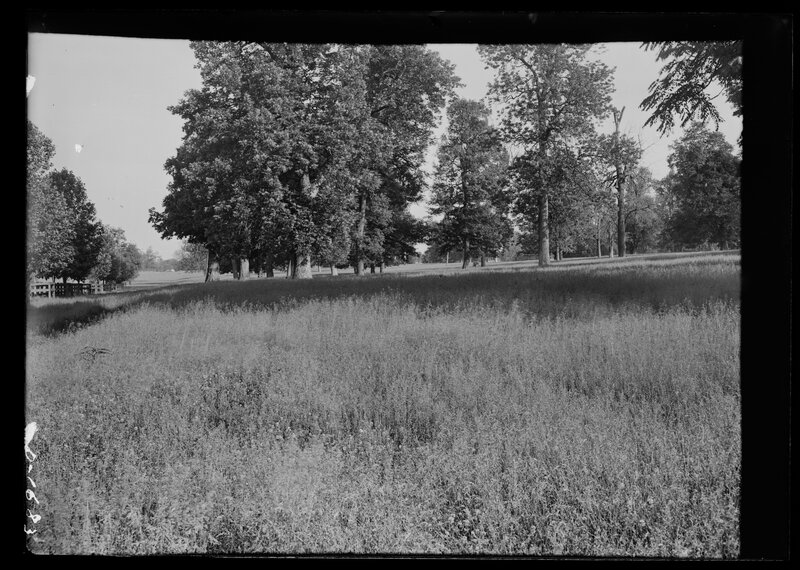 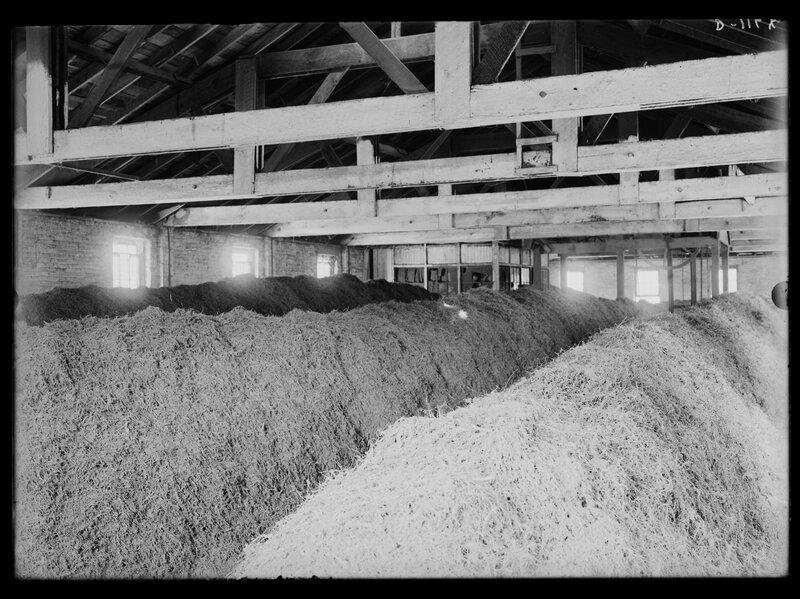 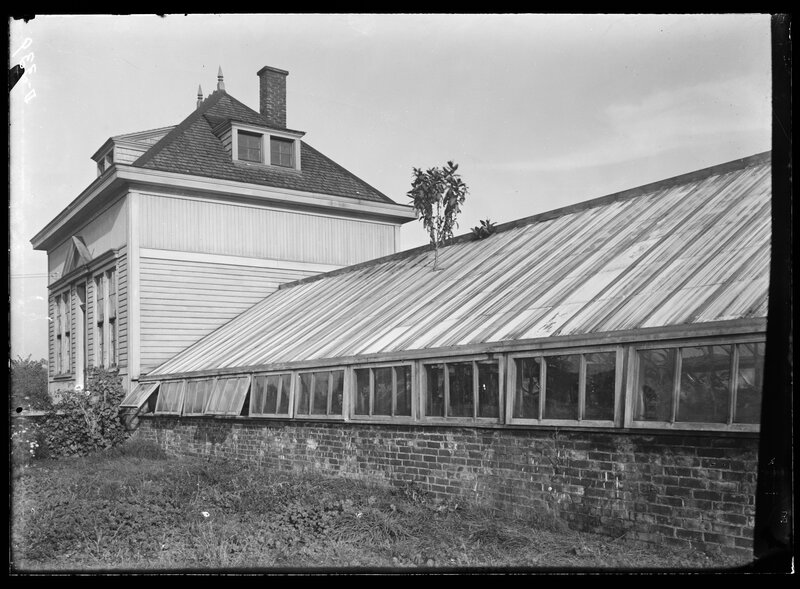 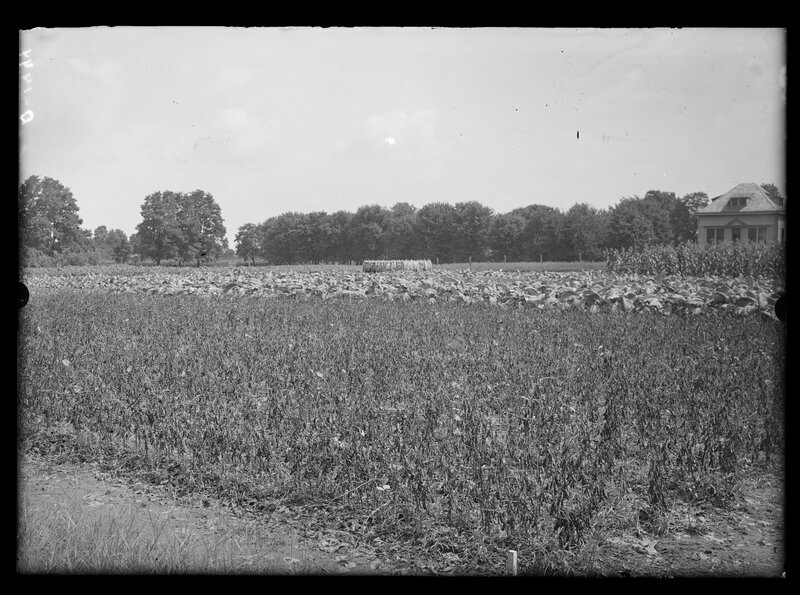 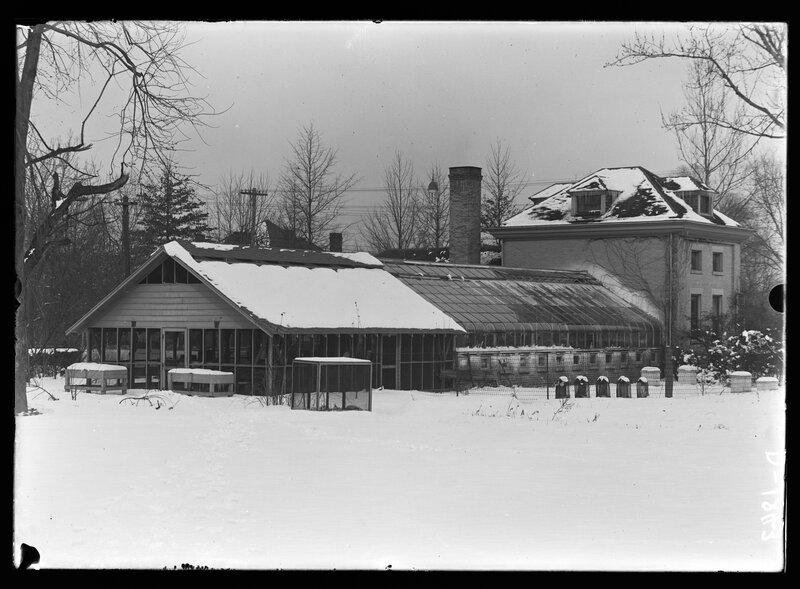 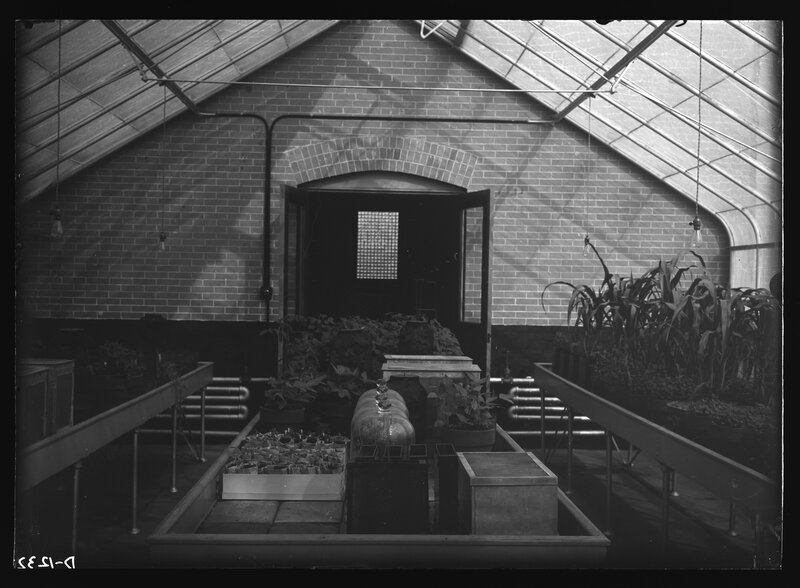 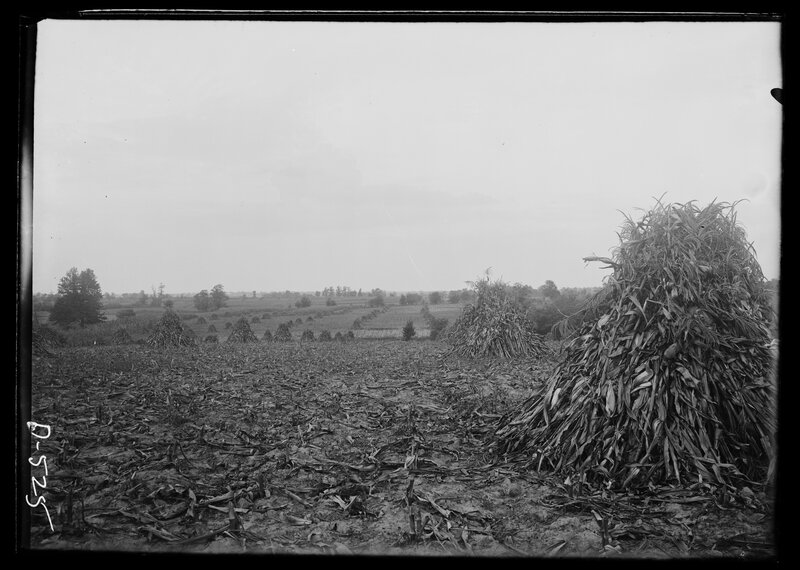 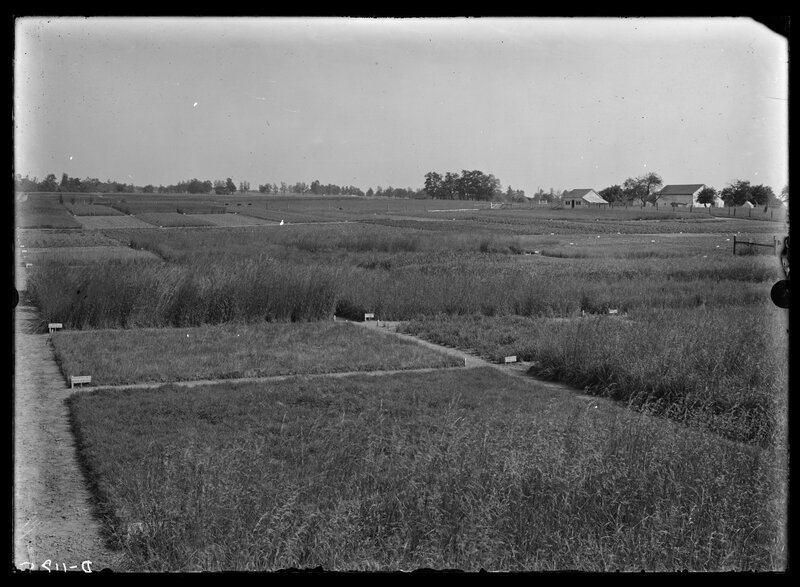 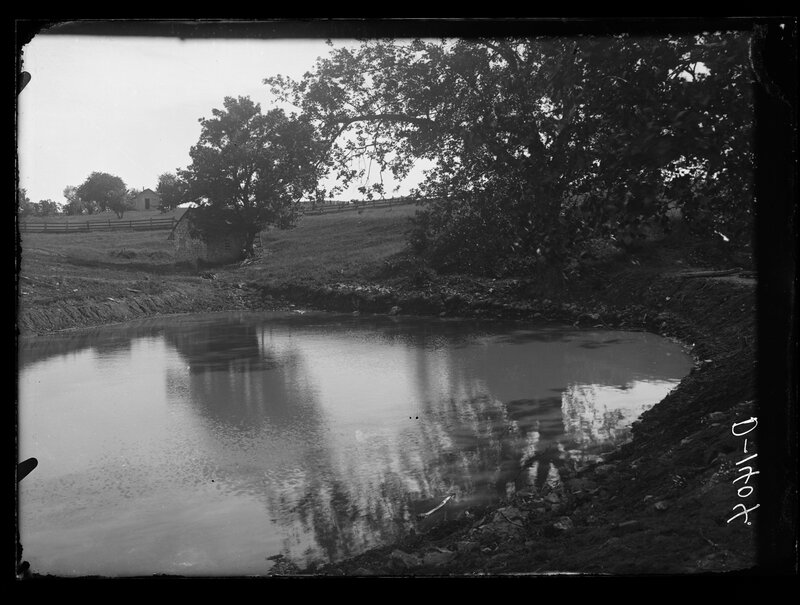 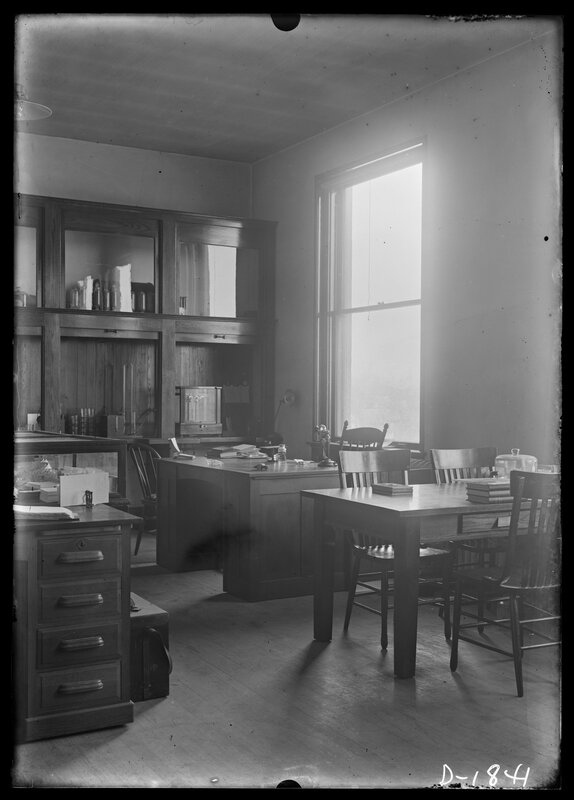 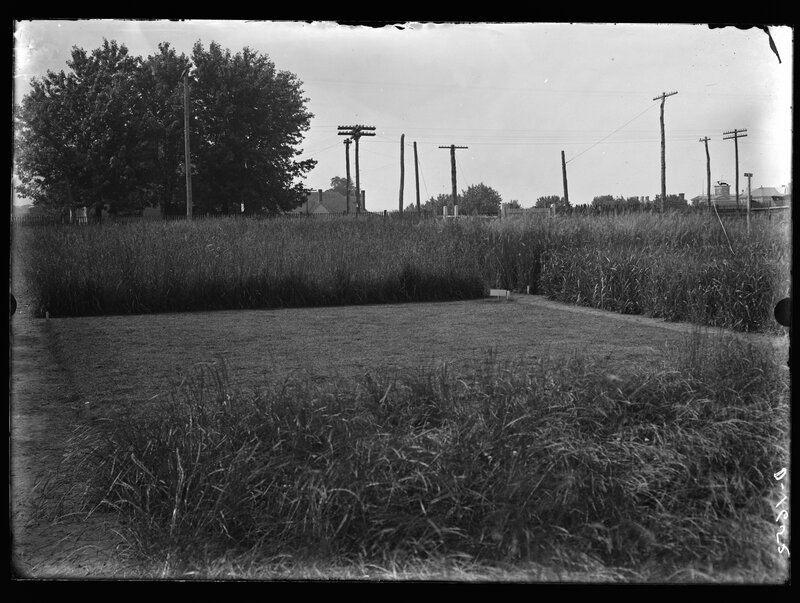 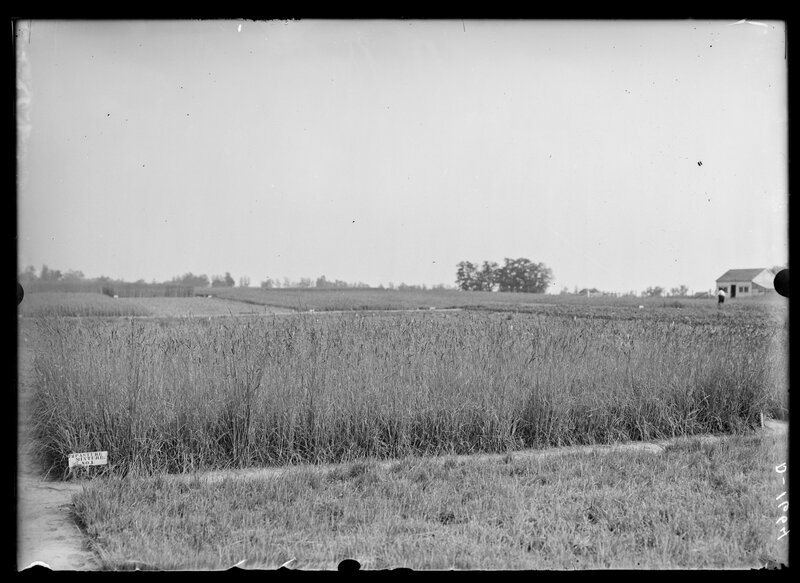 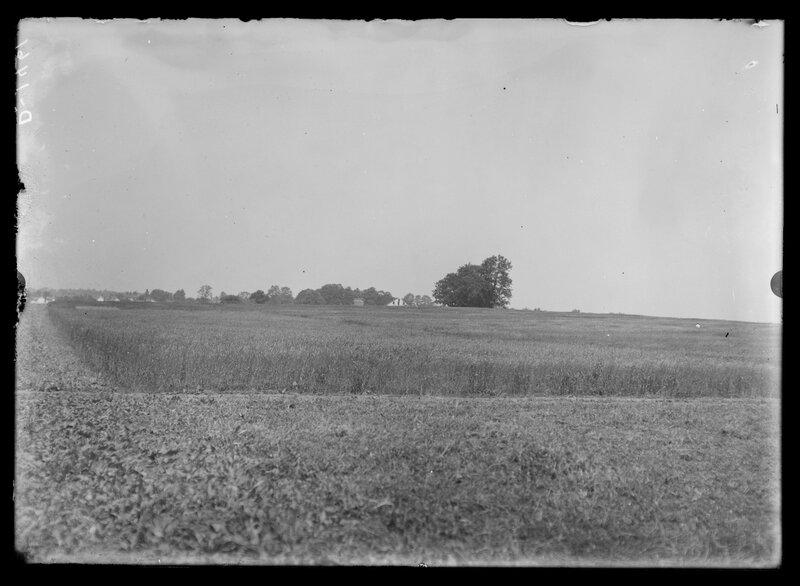 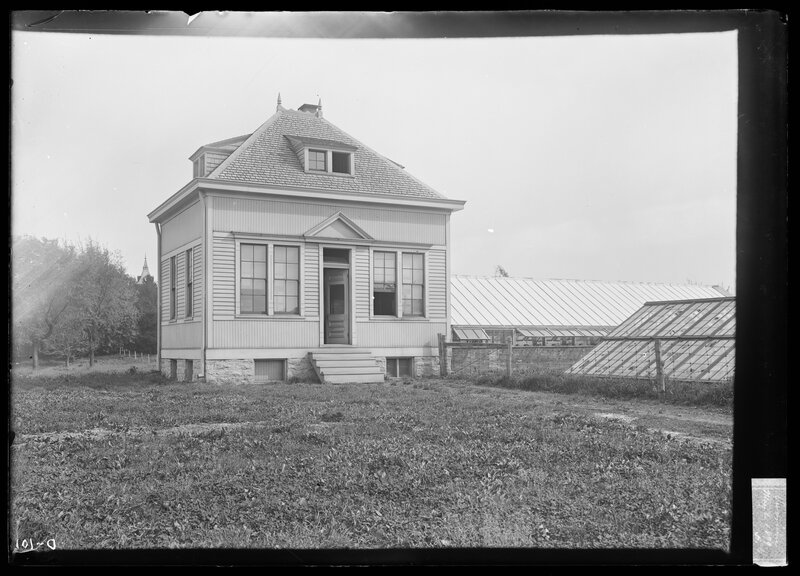 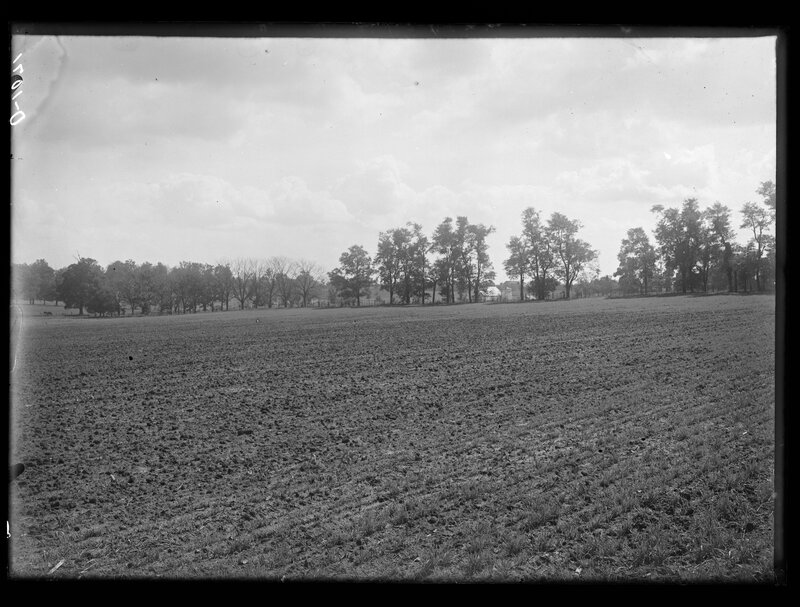 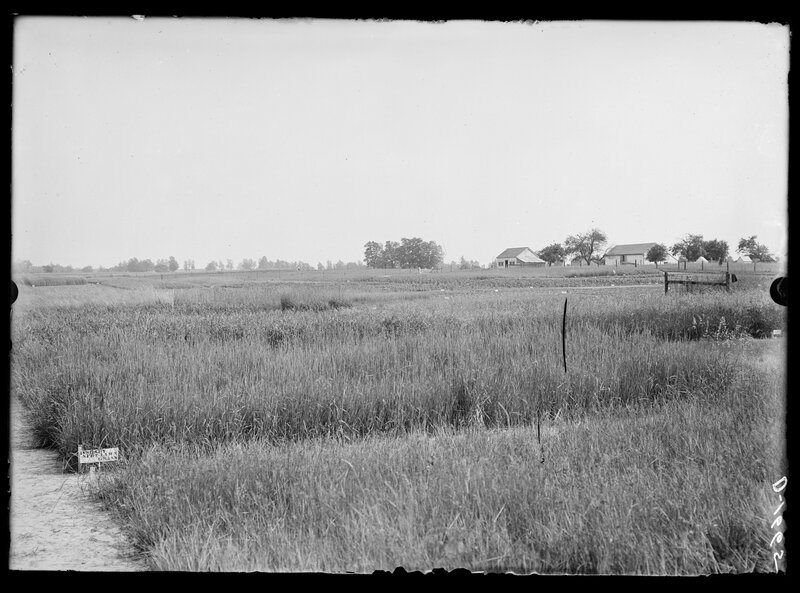 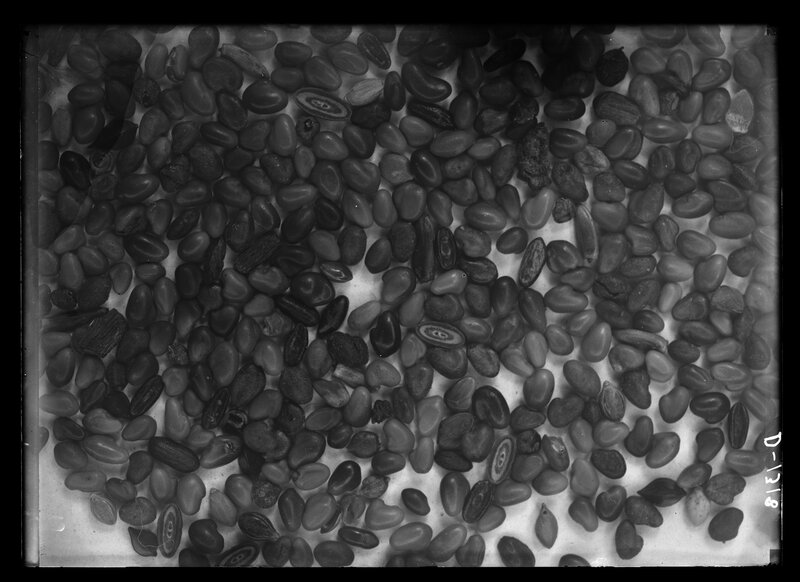 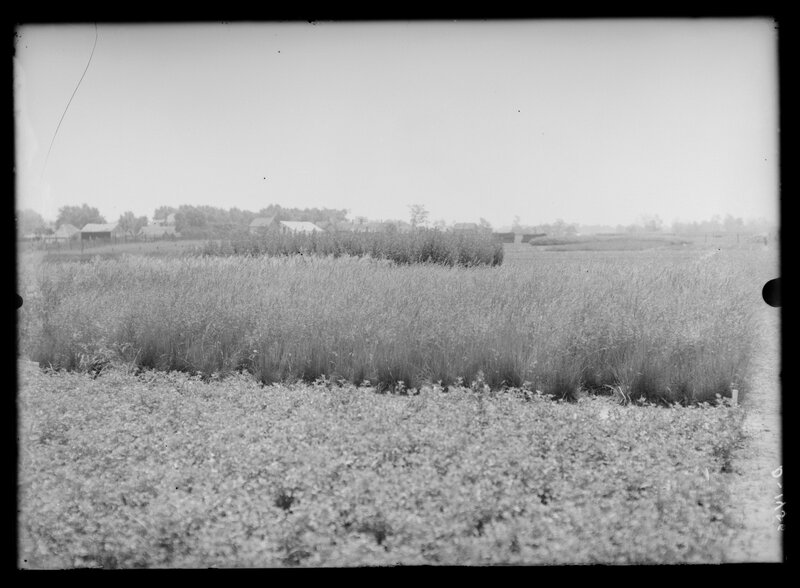 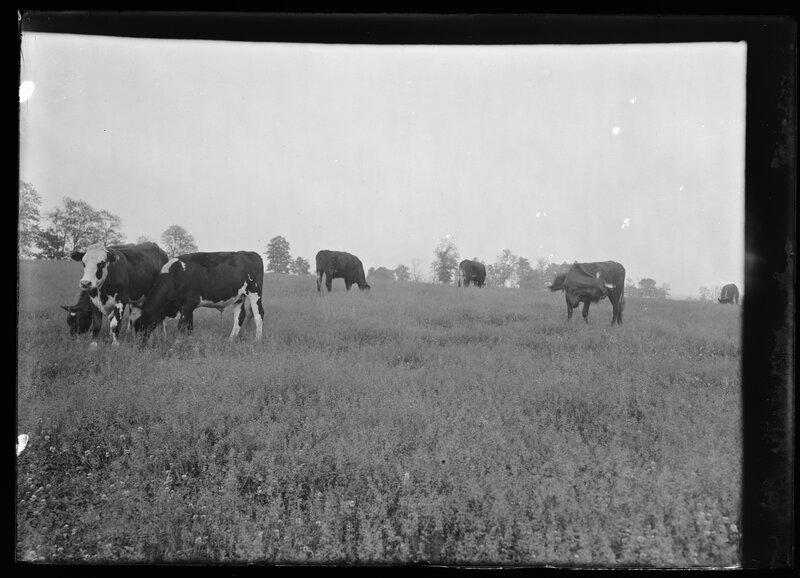 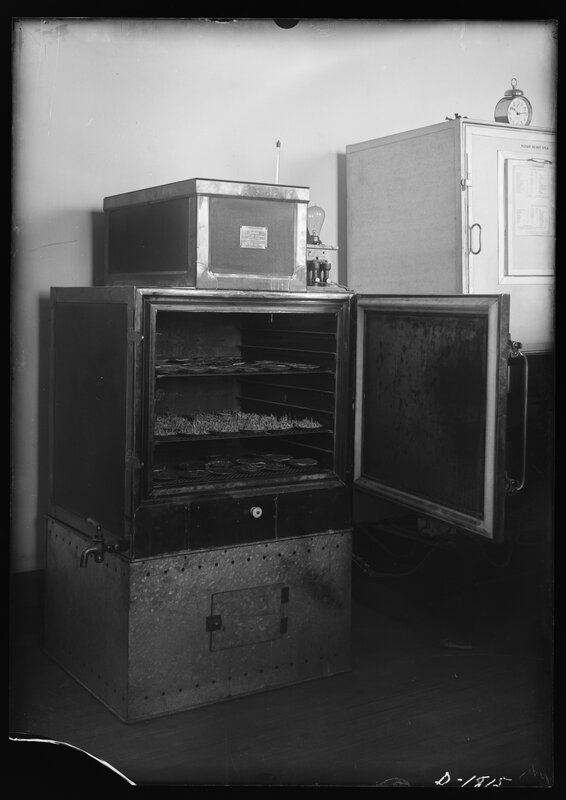 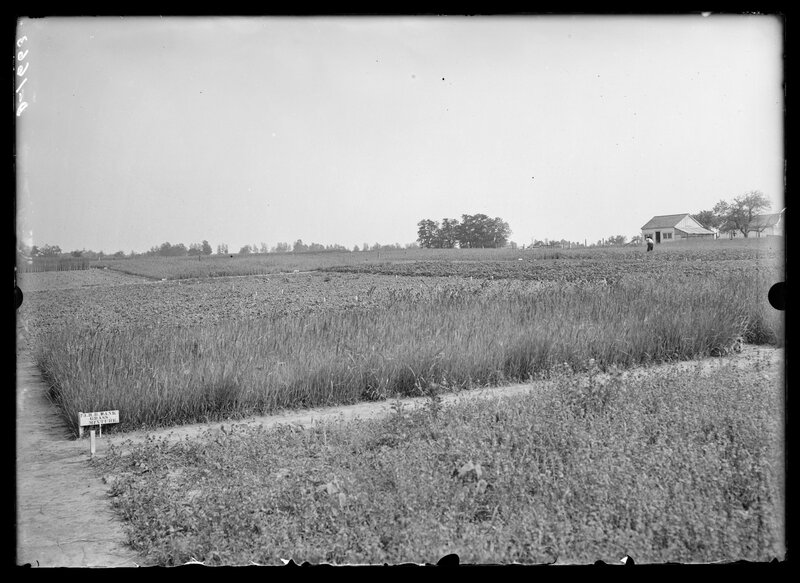 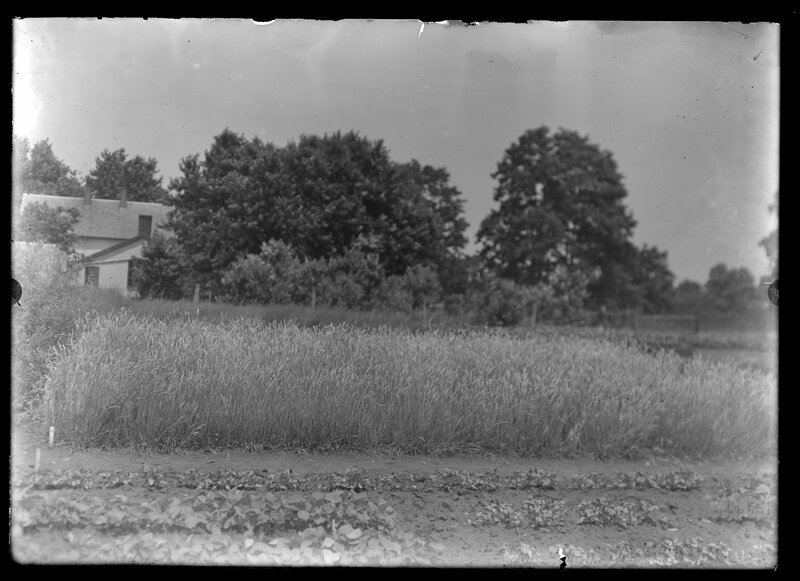 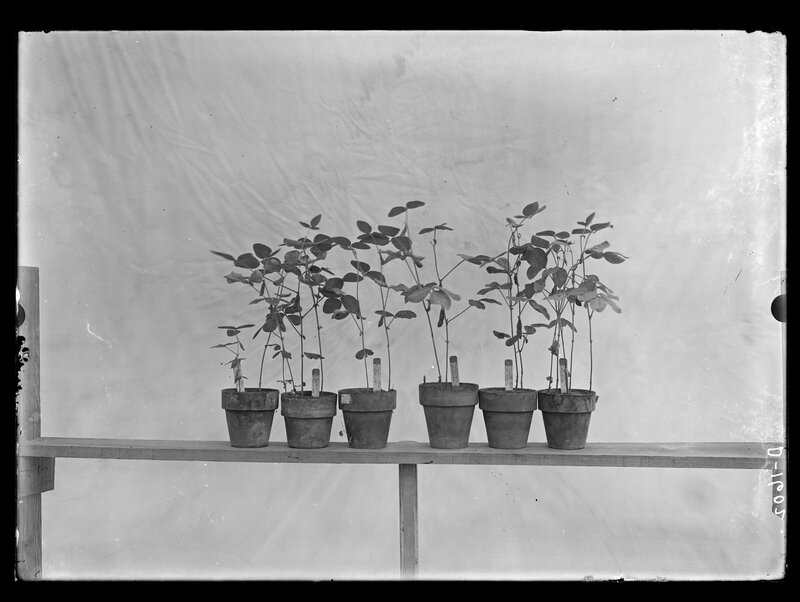 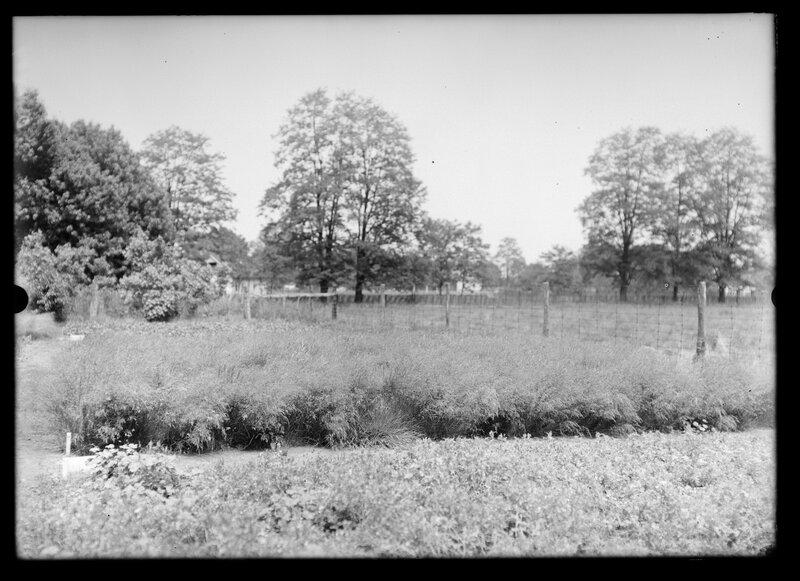 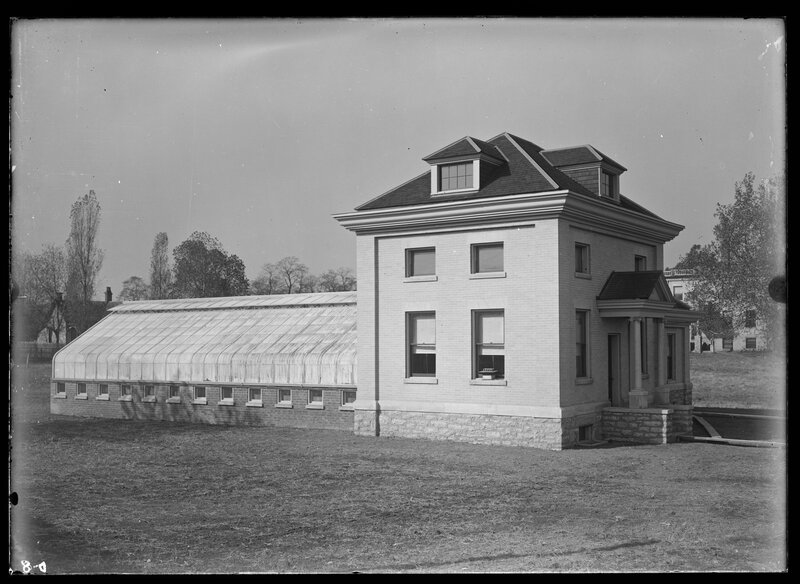 The Agricultural Experiment Station (University of Kentucky) negatives consist of field and laboratory images from the Departments of Entomology and Botany in the Agricultural Experiment Station at the University of Kentucky. 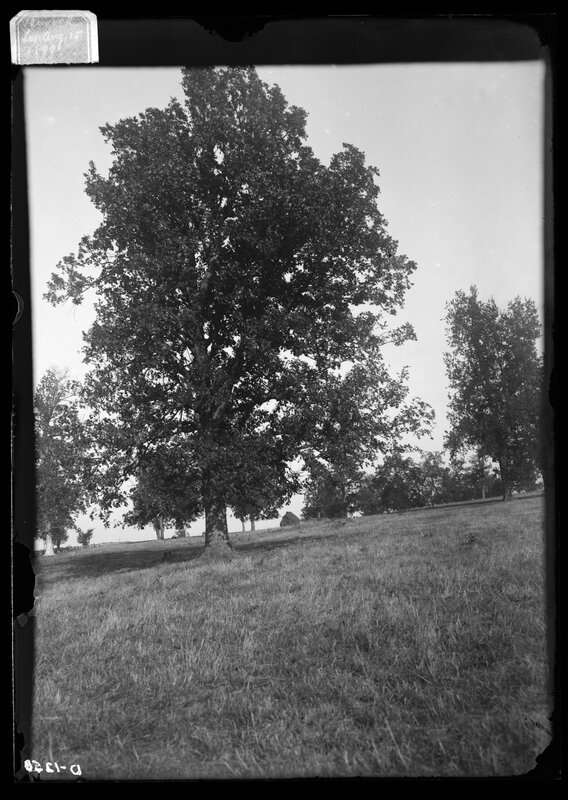 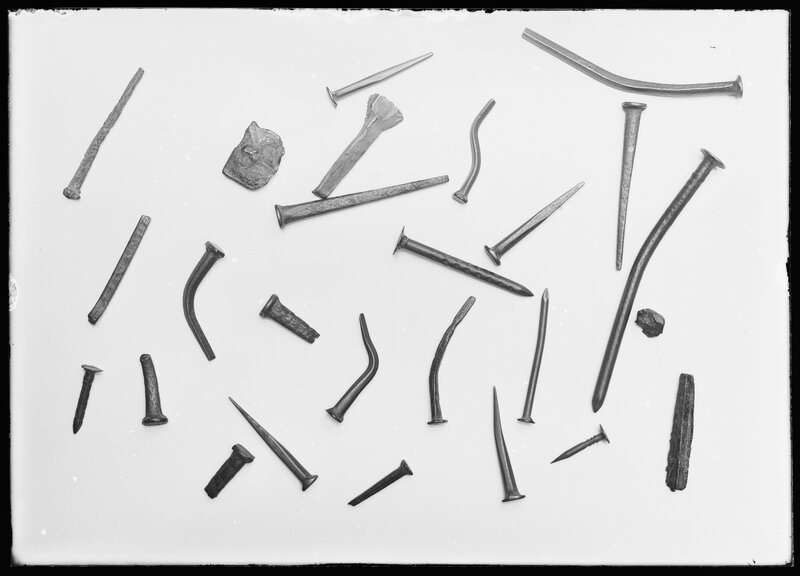 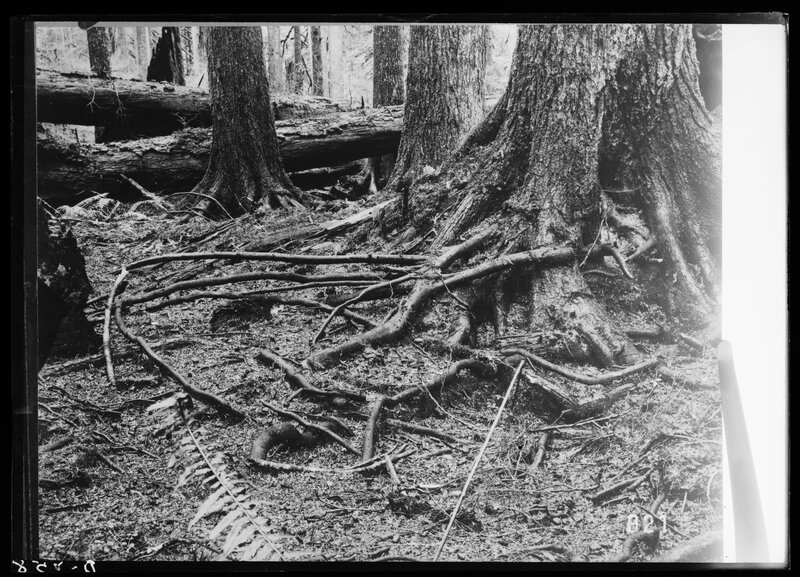 The images document plant and animal life in and around Lexington, Kentucky. 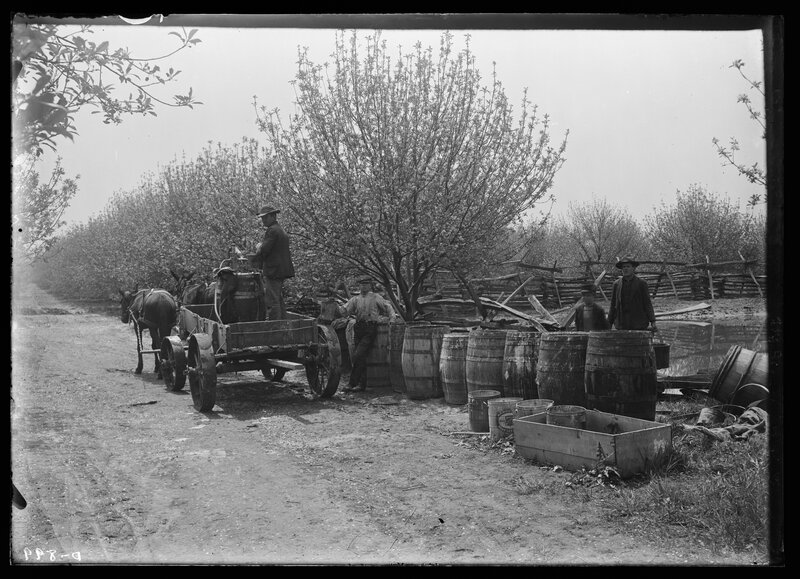 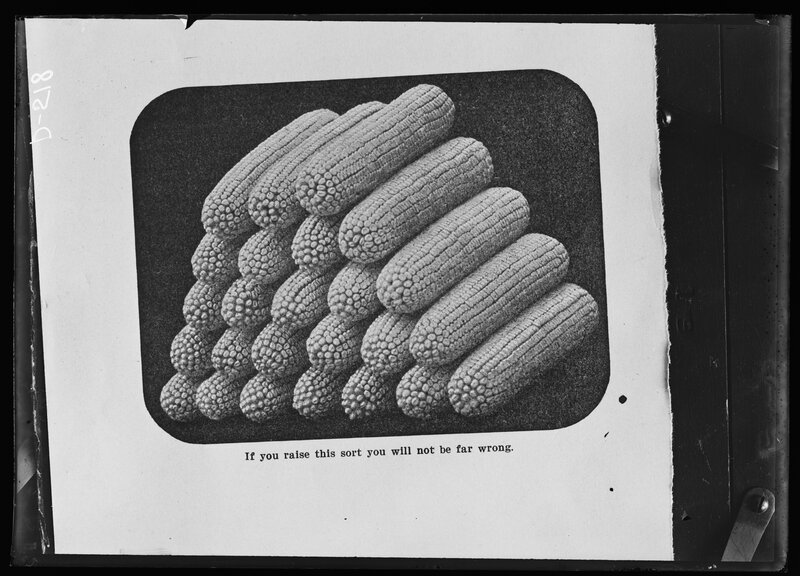 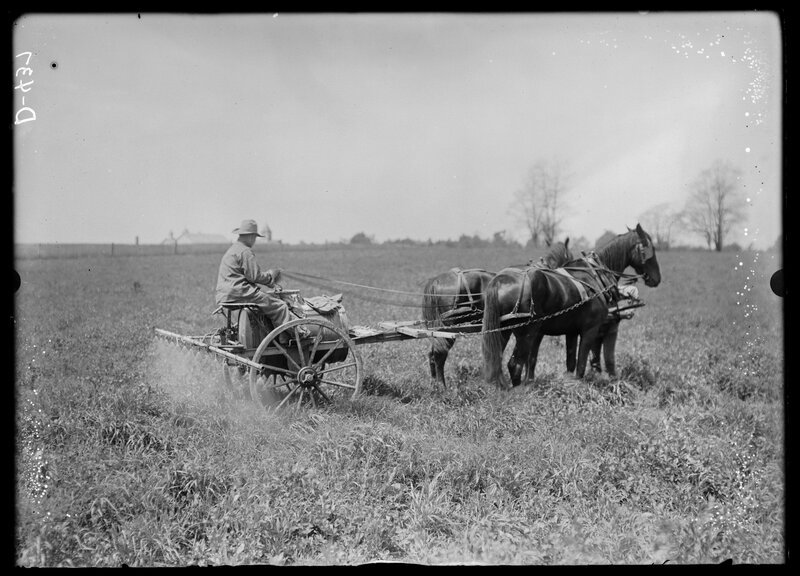 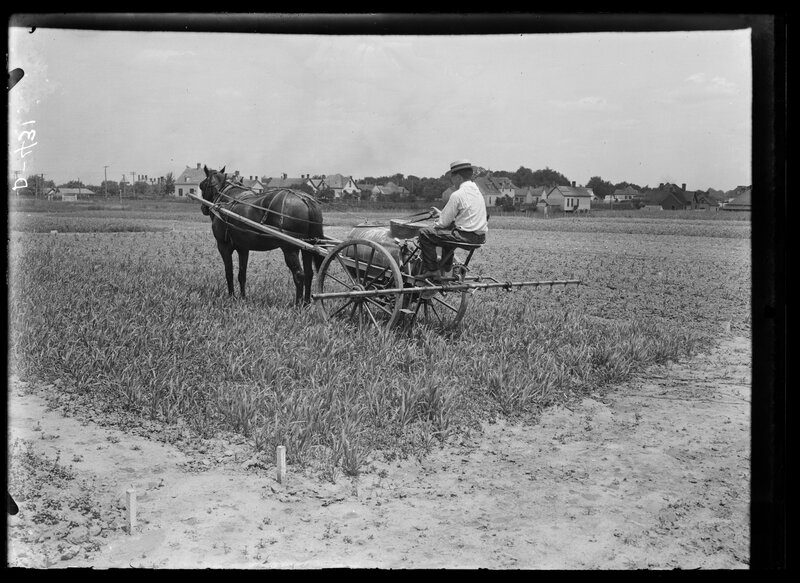 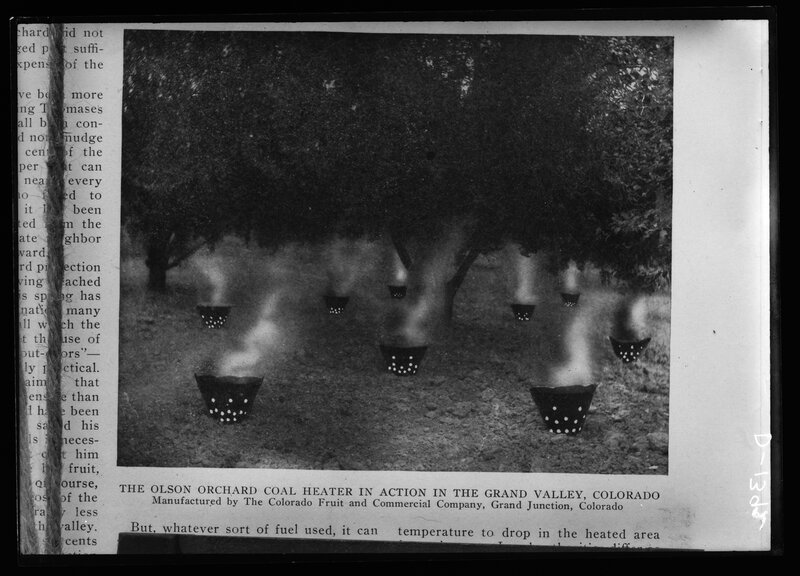 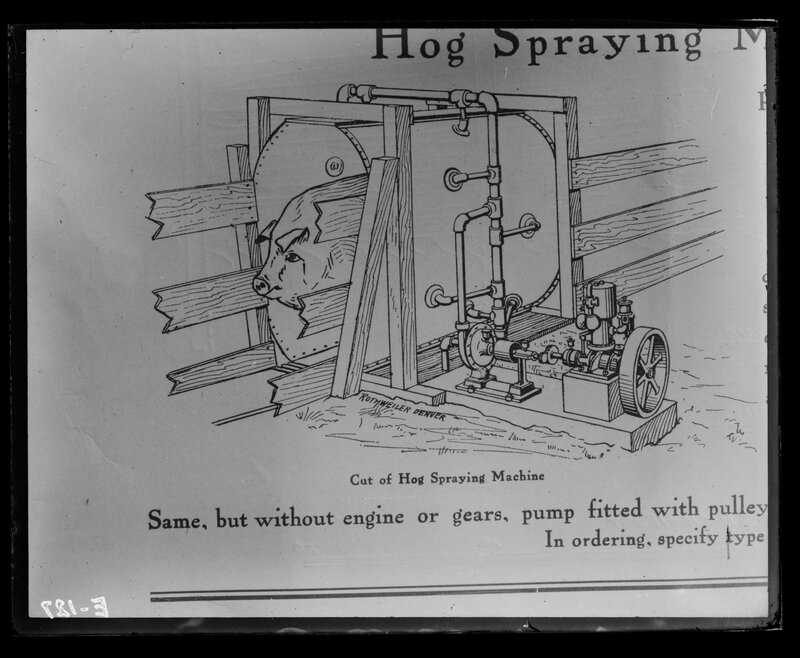 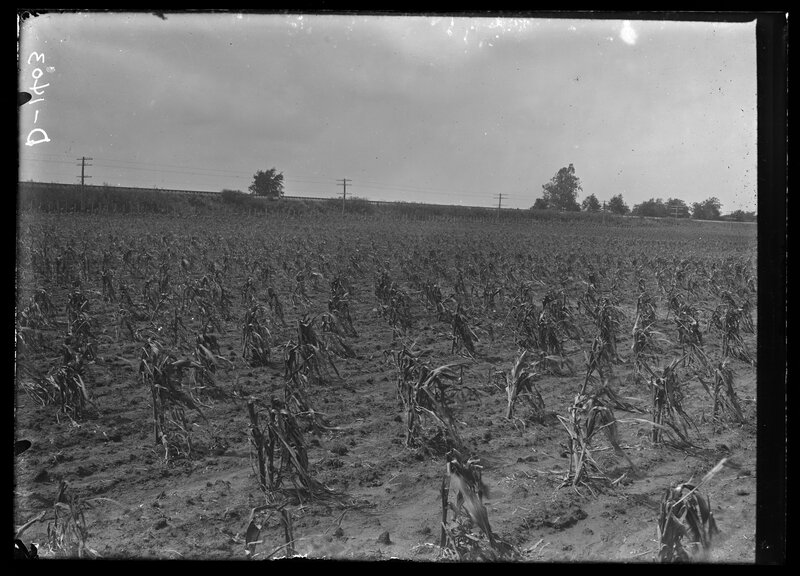 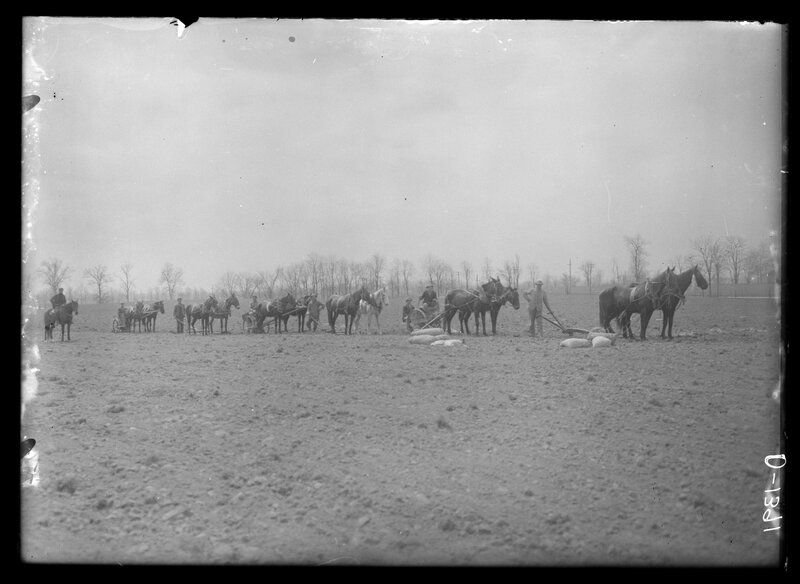 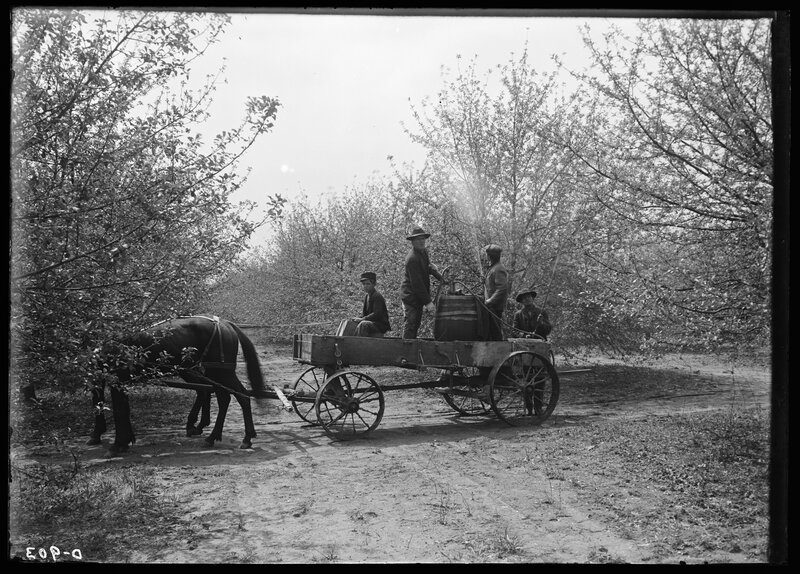 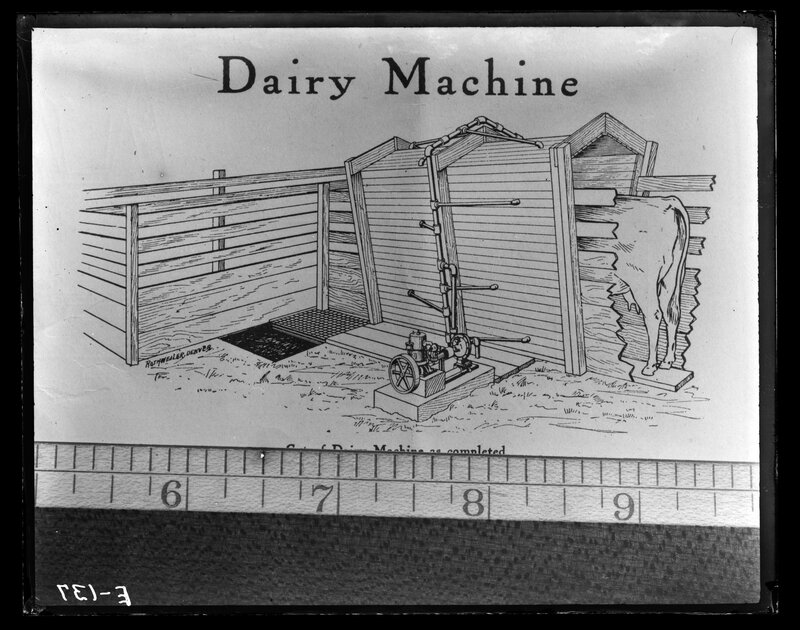 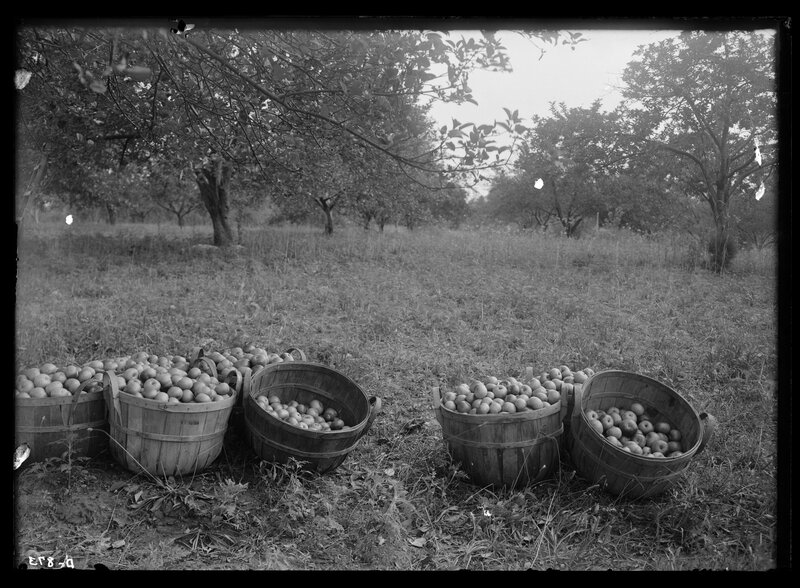 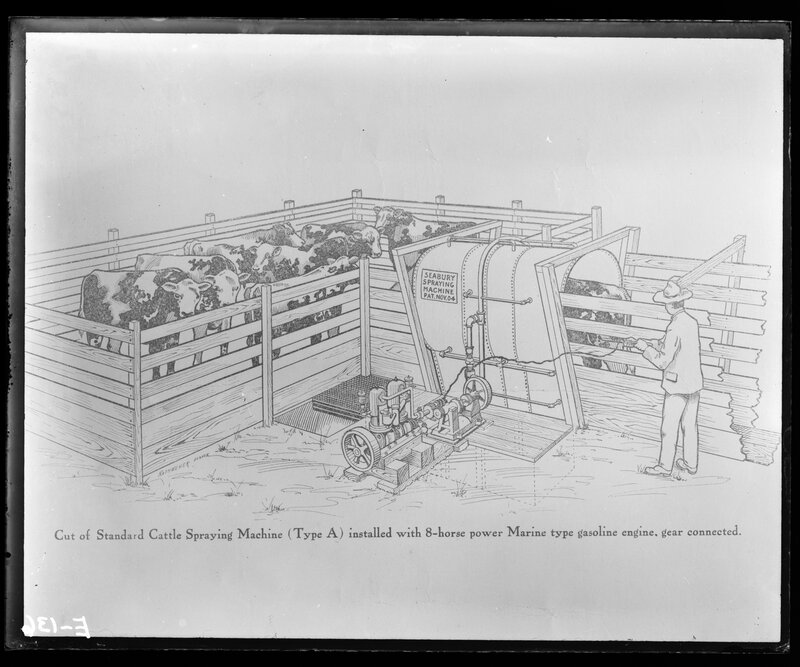 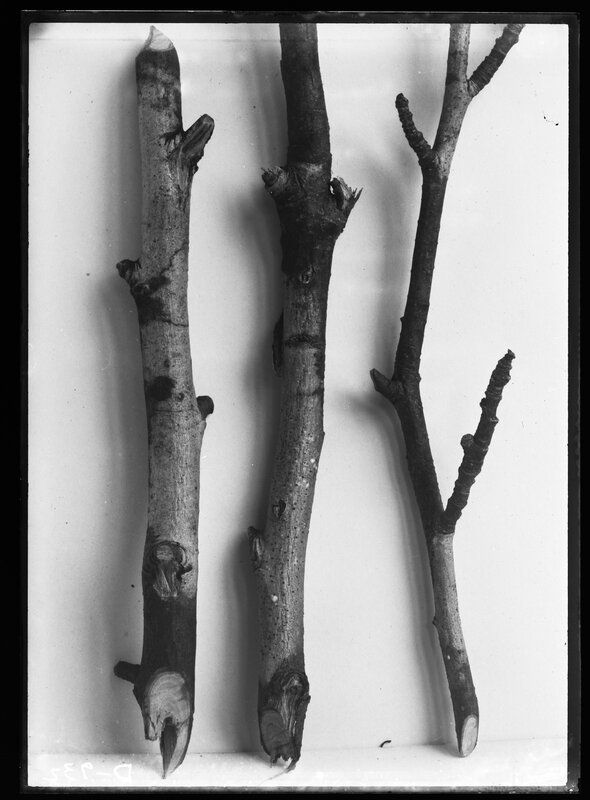 Many of these images were used in the Agricultural reports and bulletins. 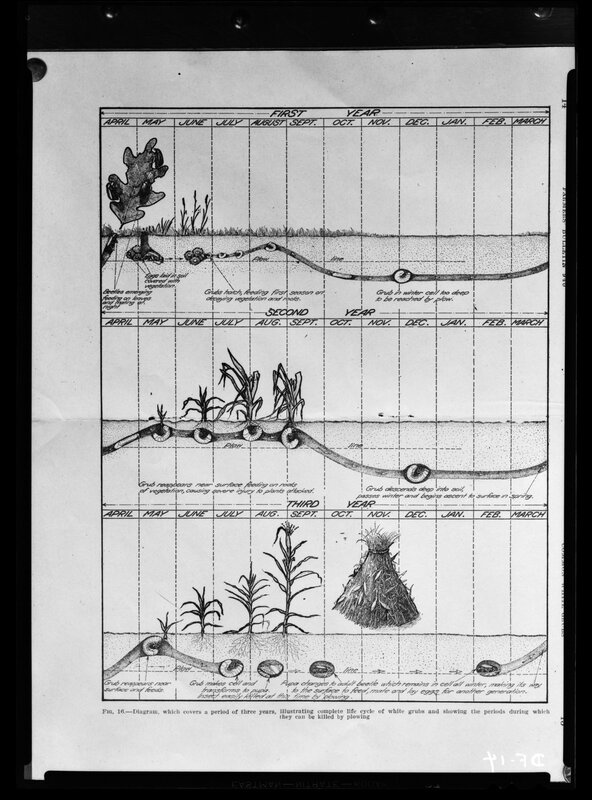 See the series level scope notes for more detail. 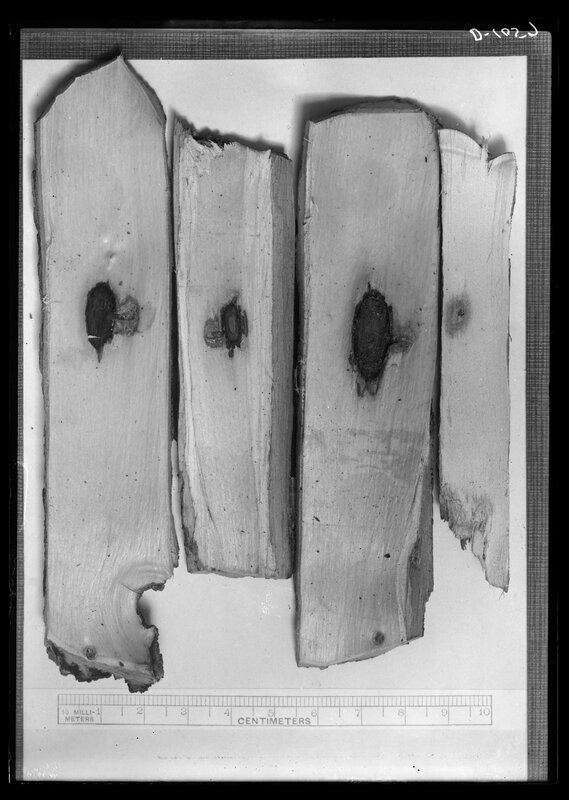 The materials in this collection, due to either their age or origin, reside in the public domain. 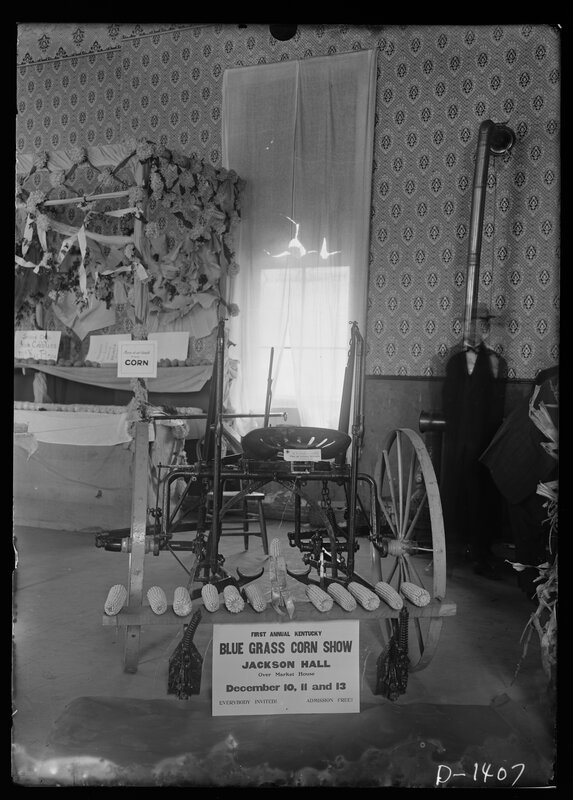 University of Kentucky Special Collections and Digital Programs retains physical property rights to this collection. 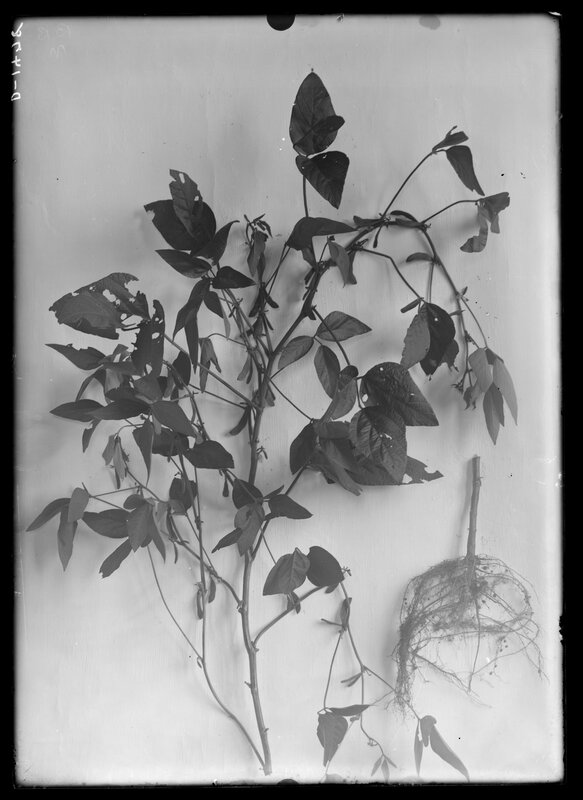 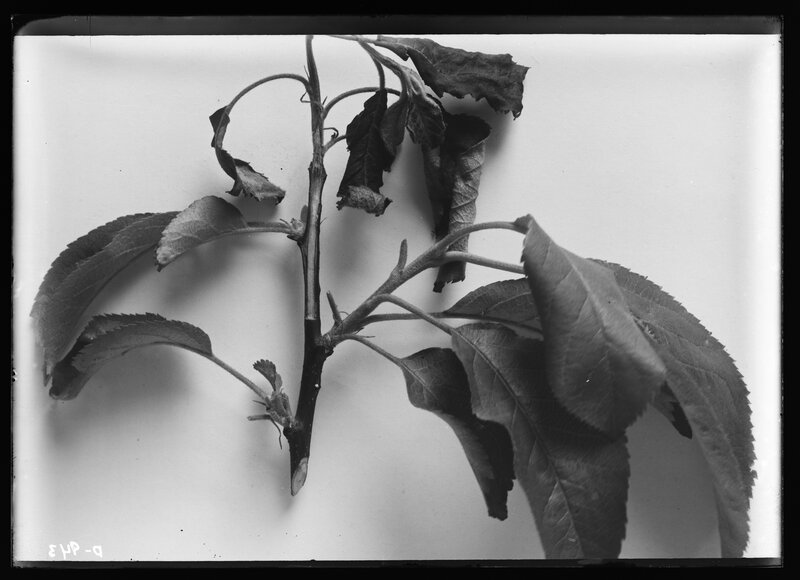 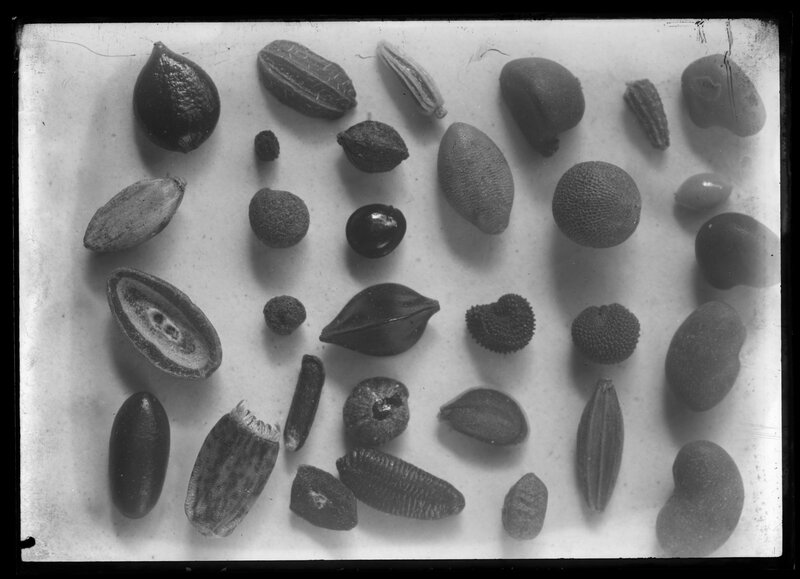 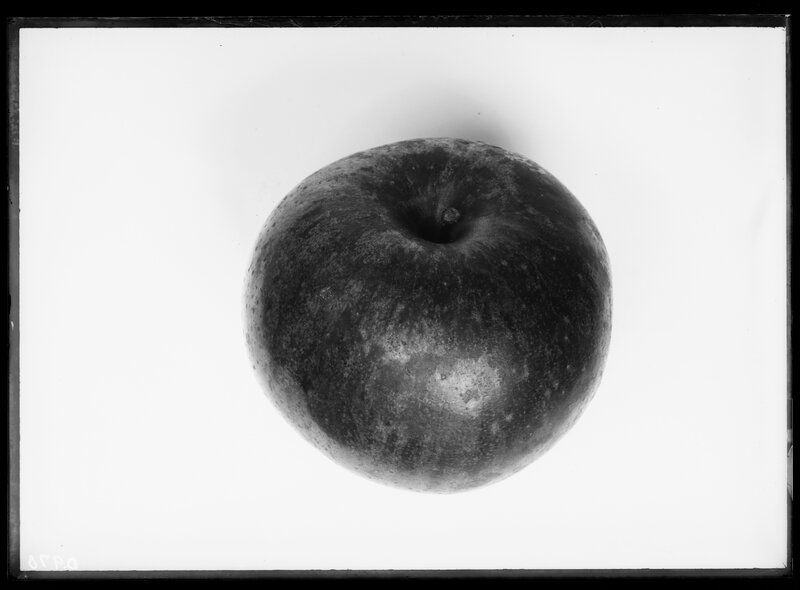 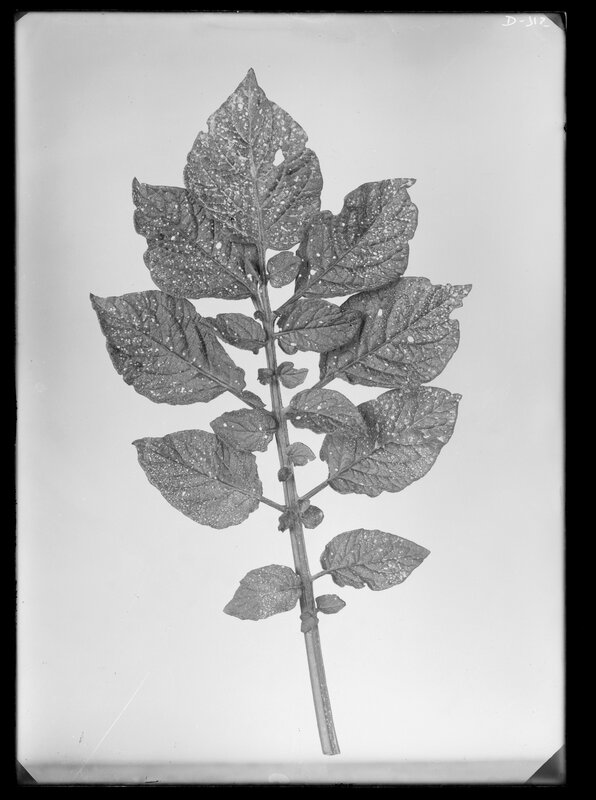 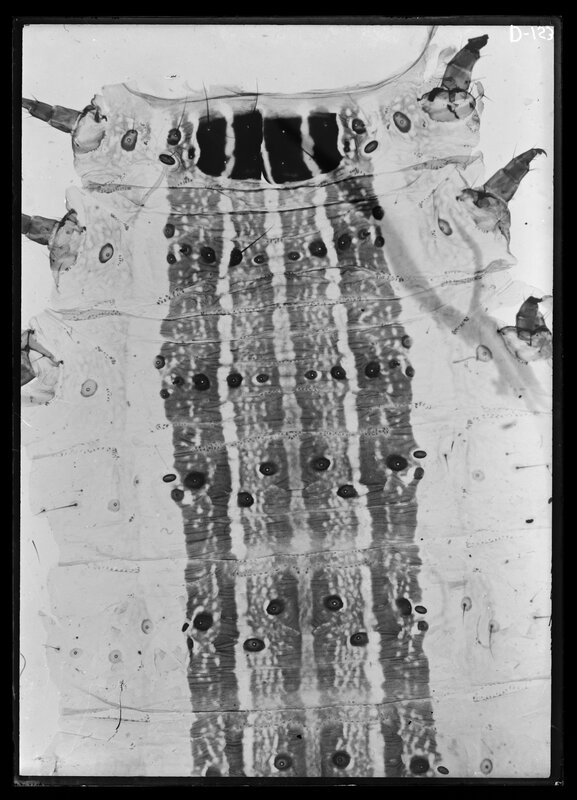 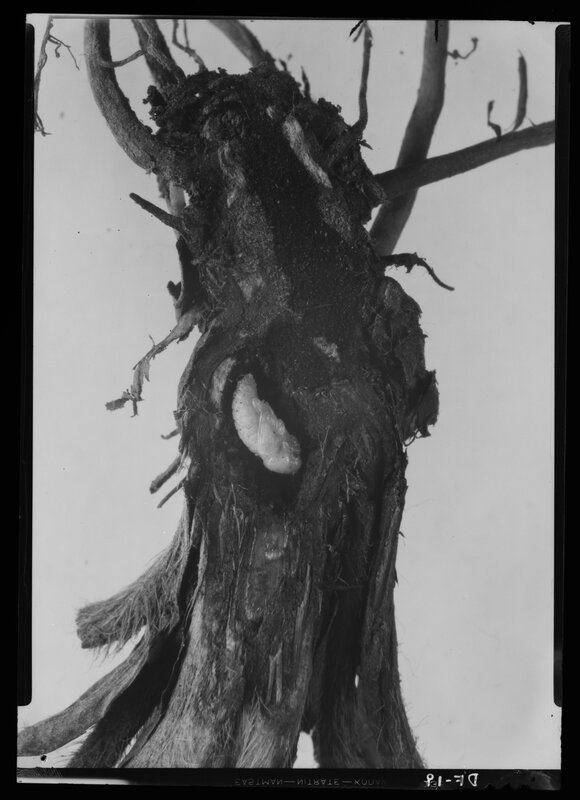 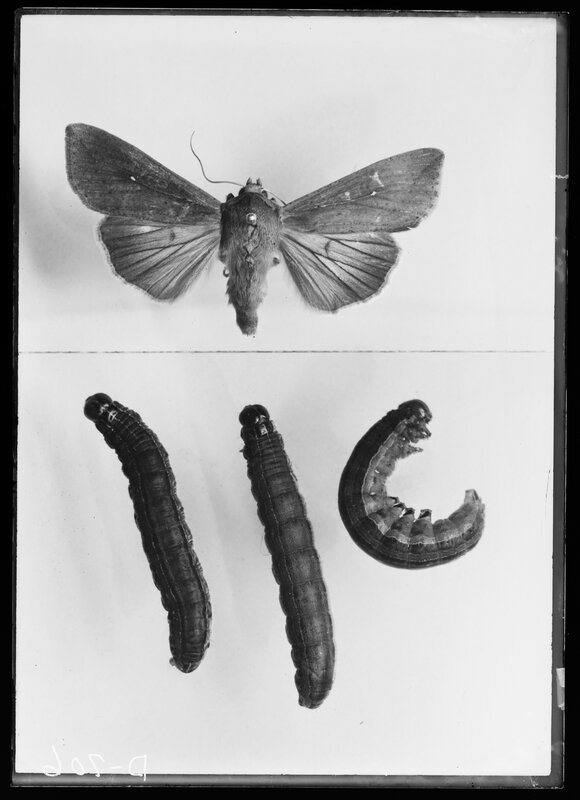 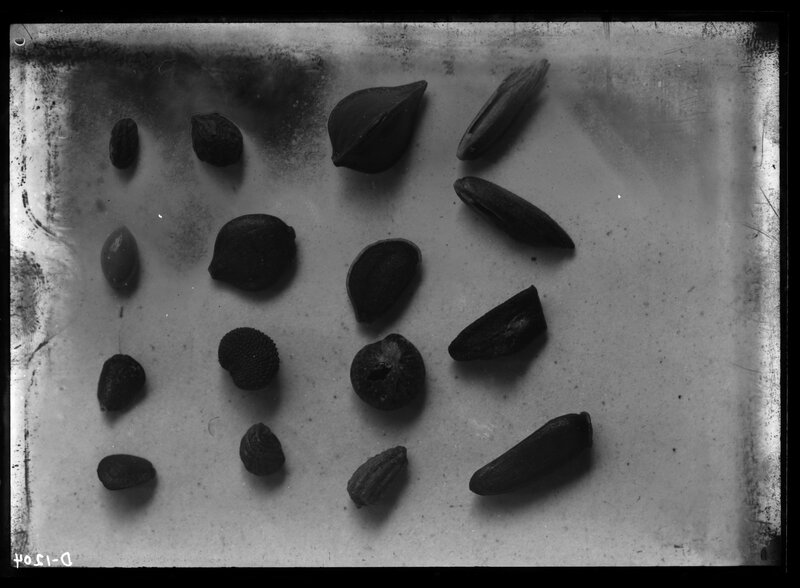 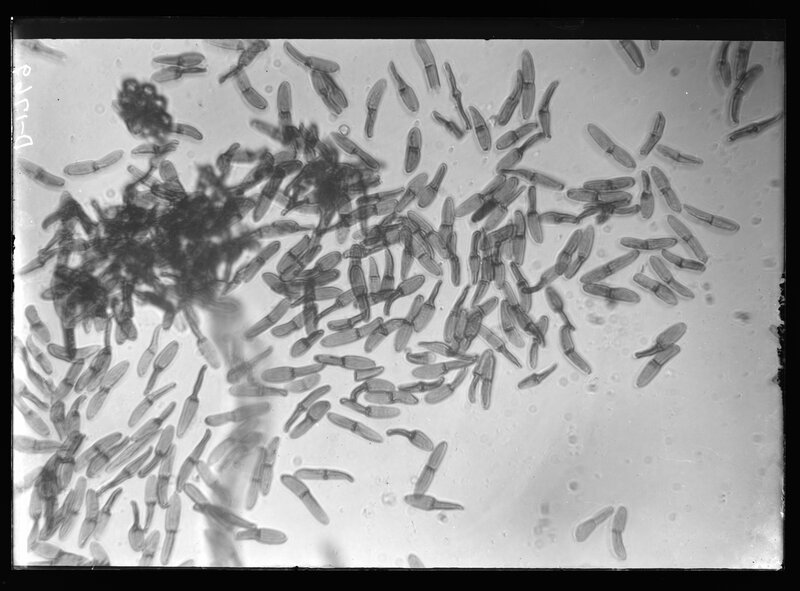 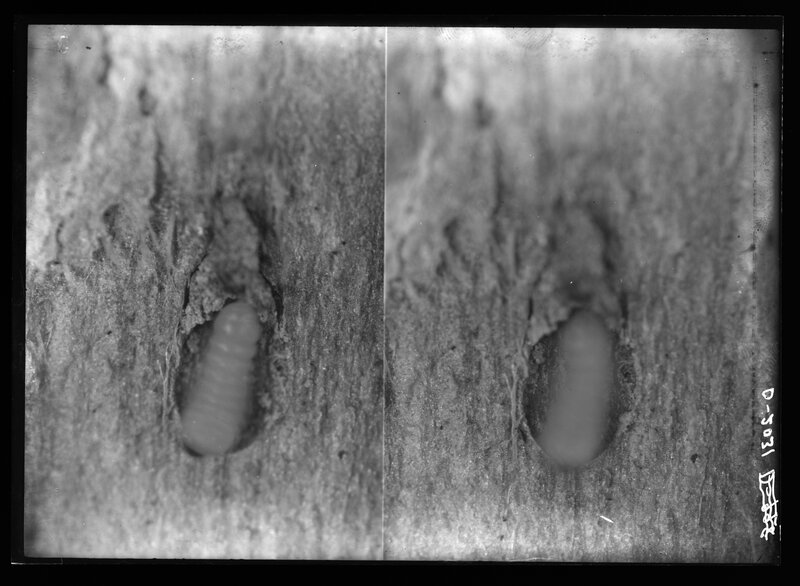 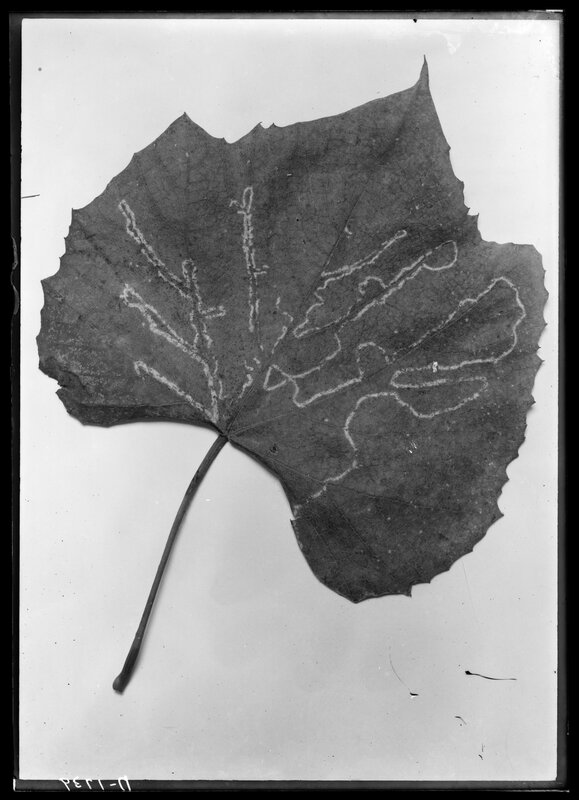 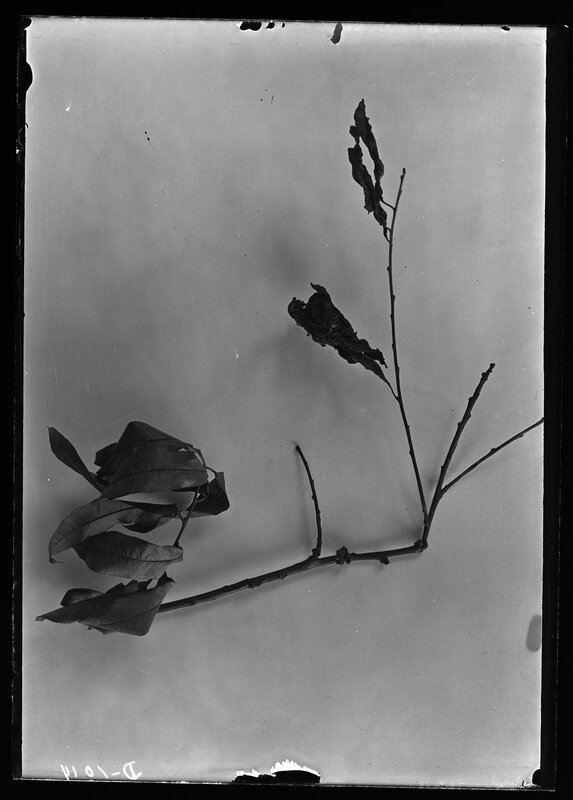 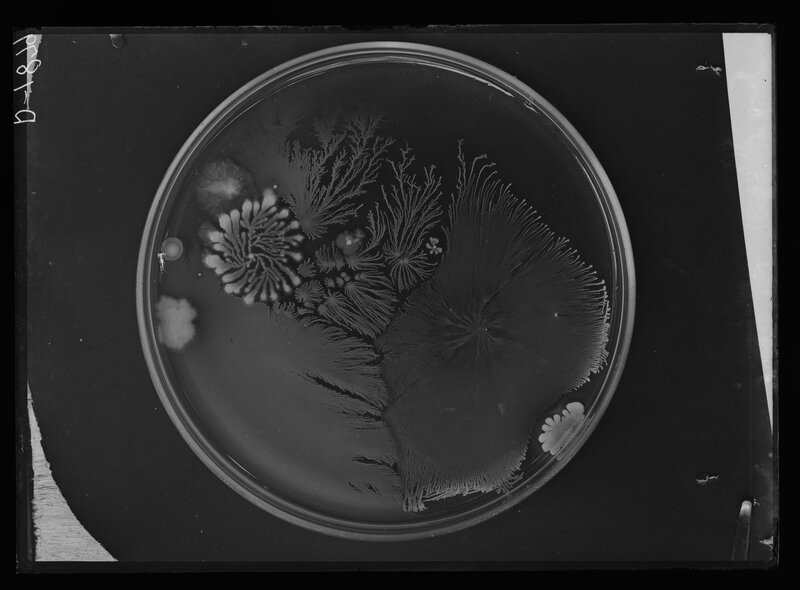 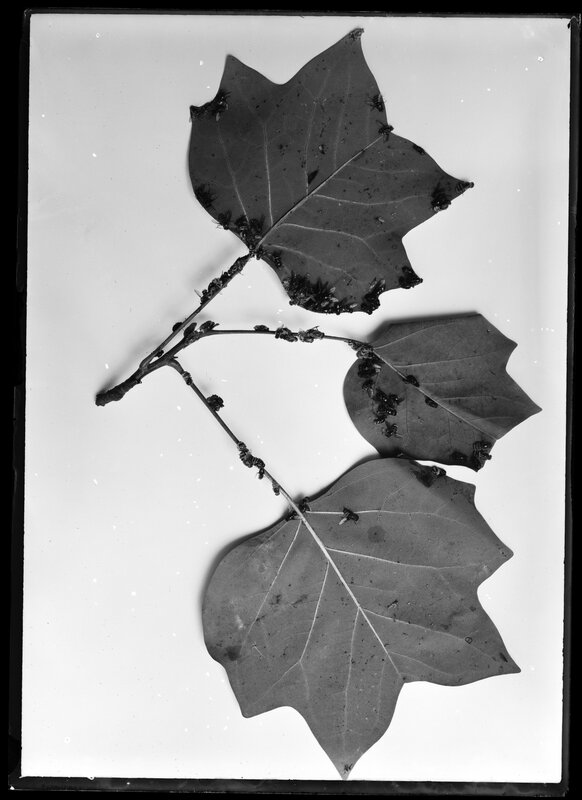 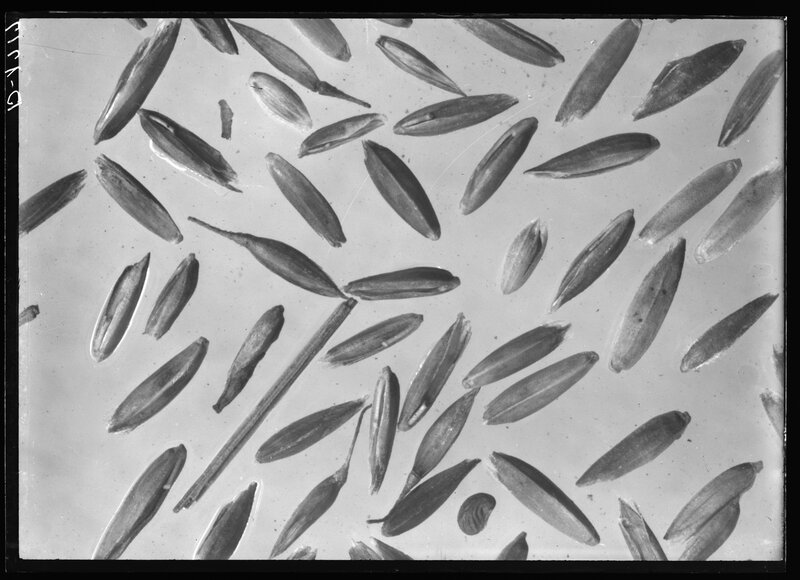 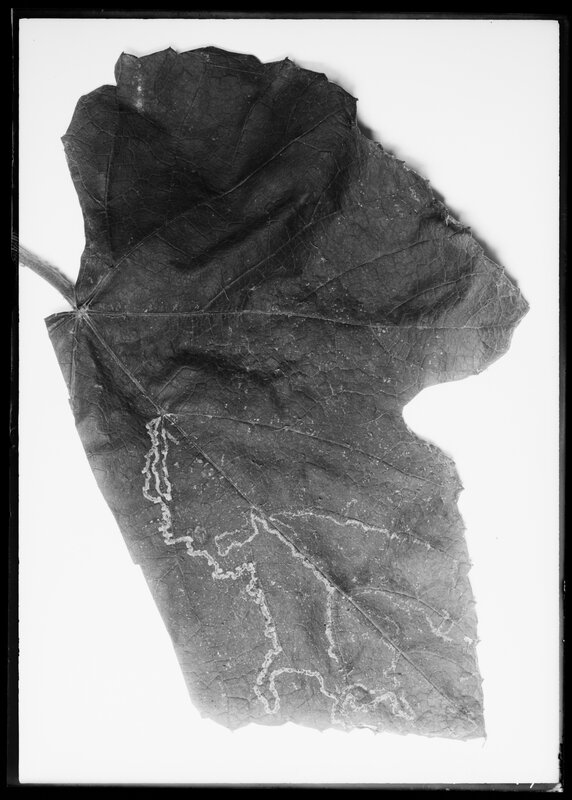 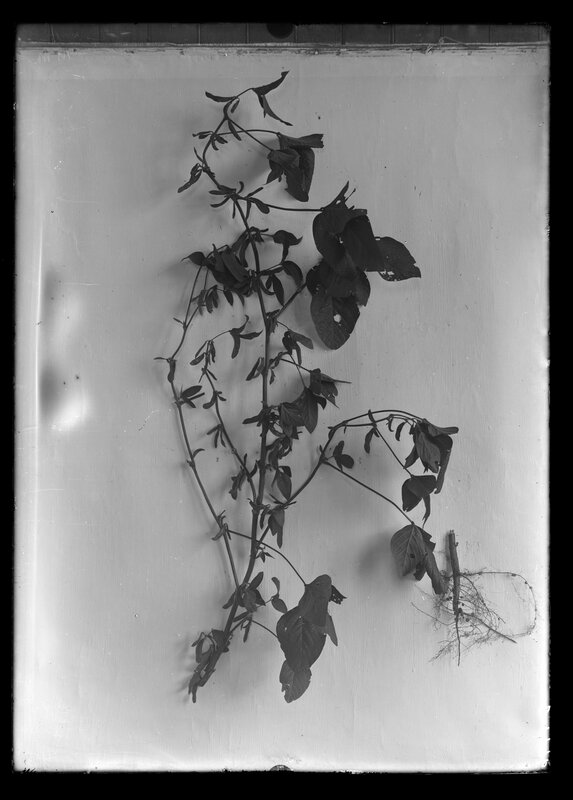 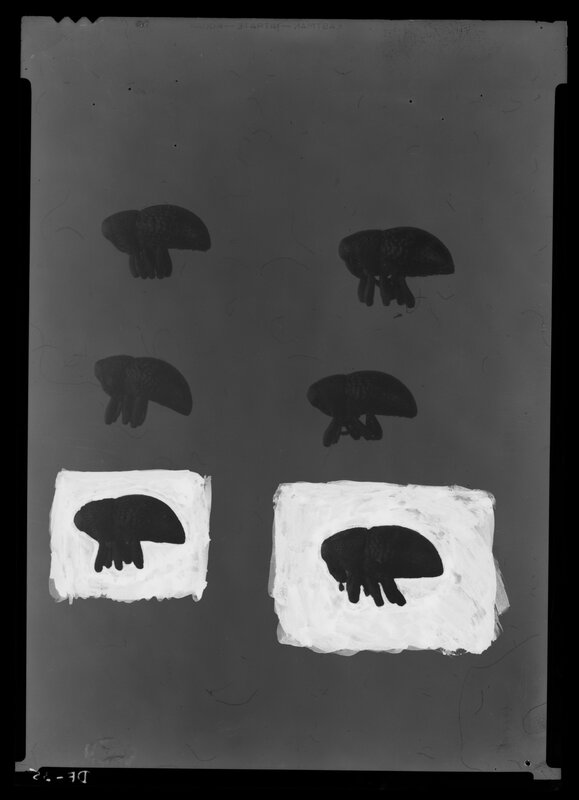 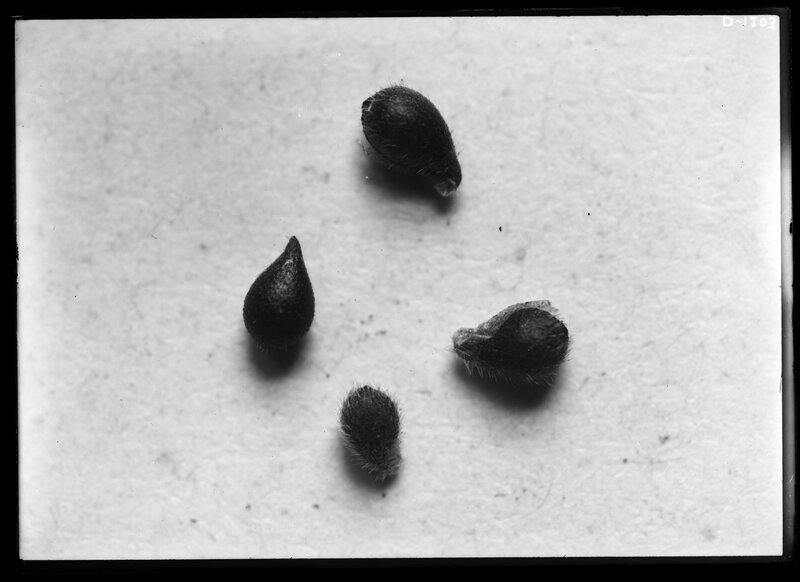 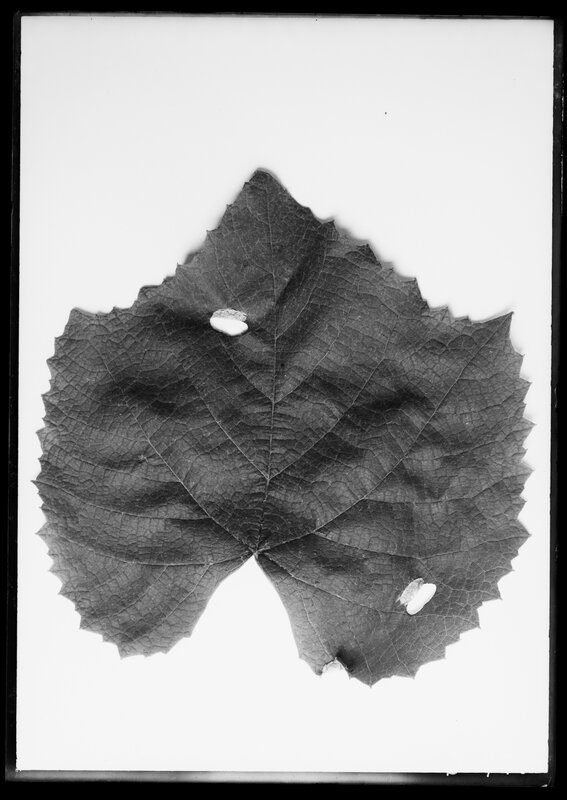 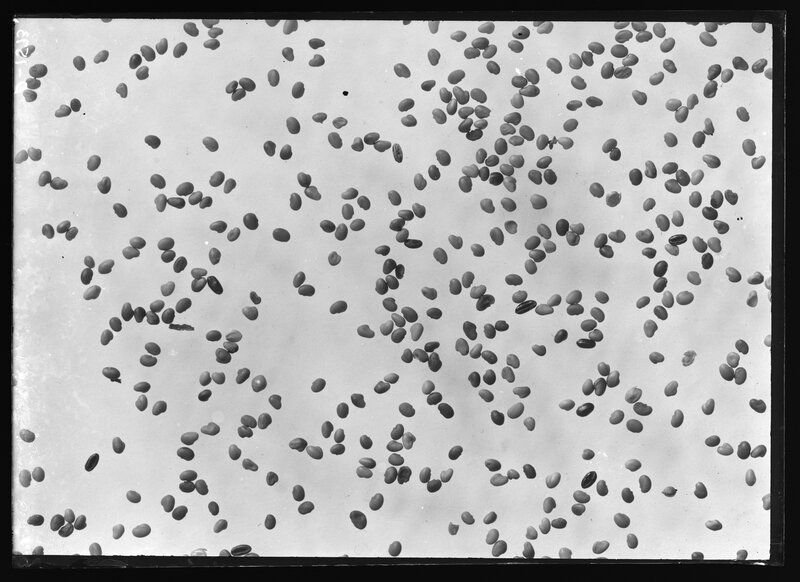 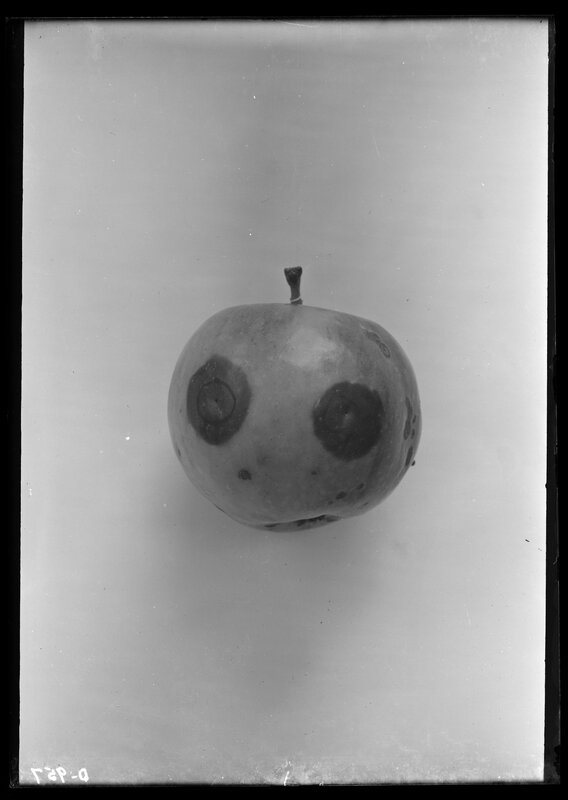 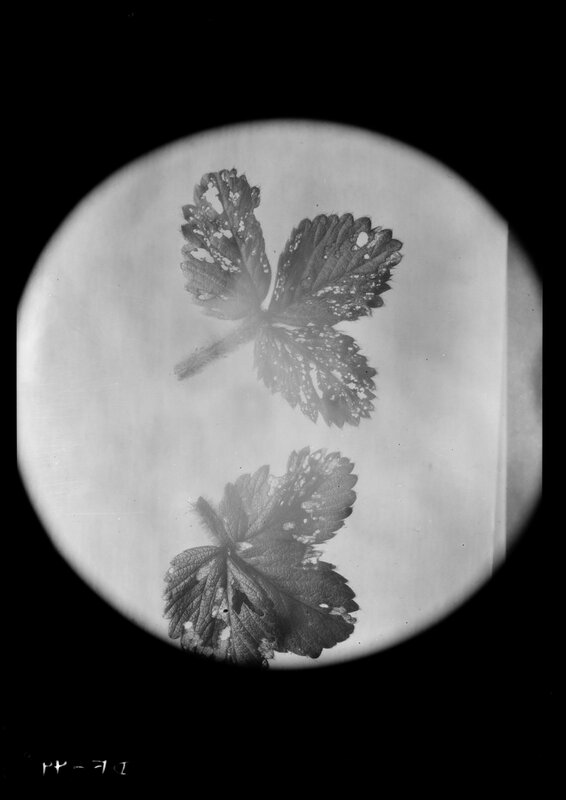 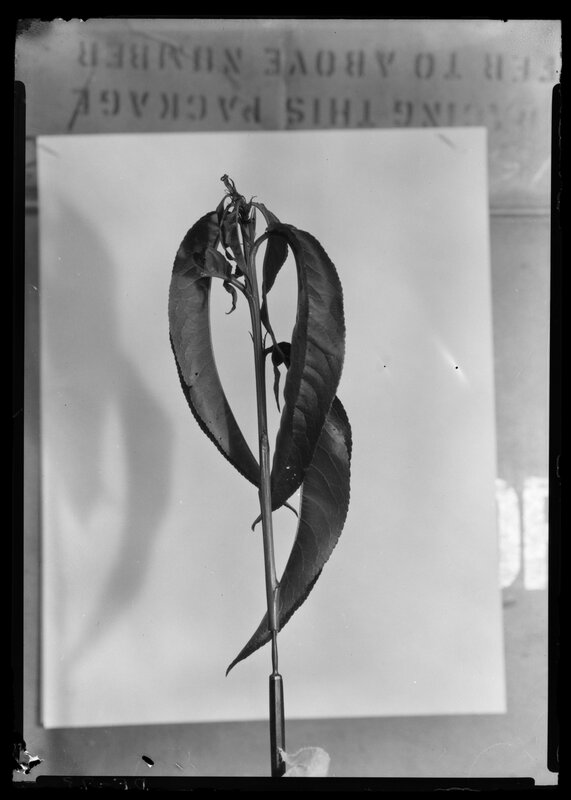 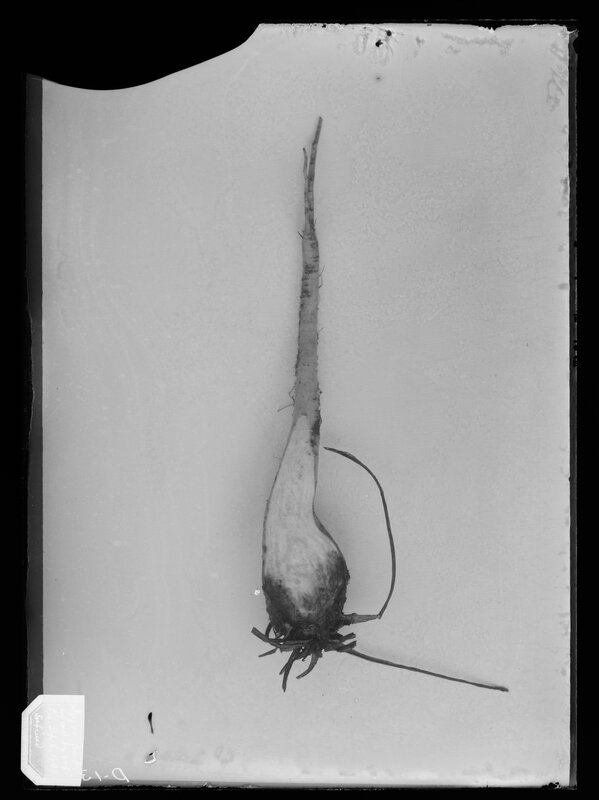 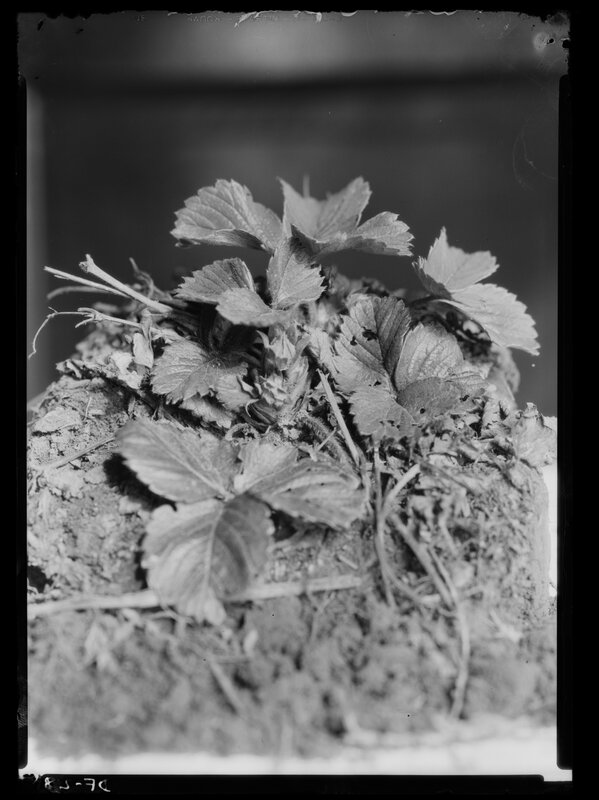 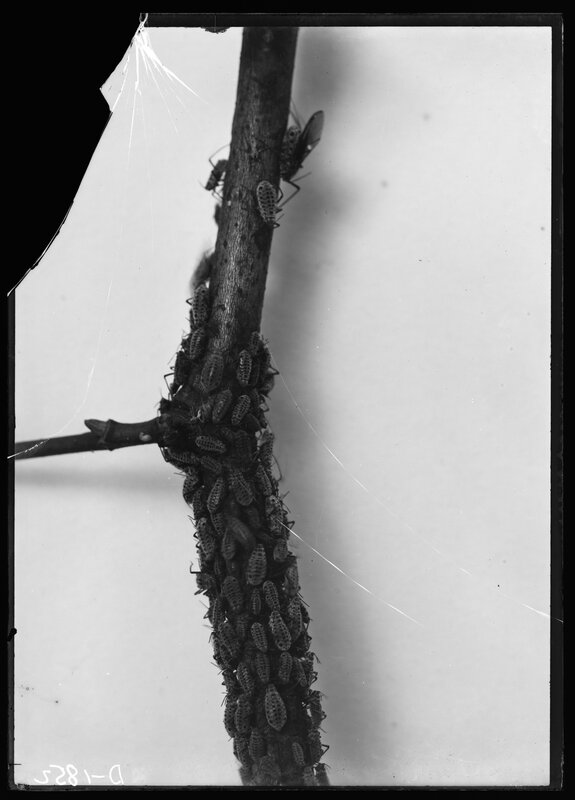 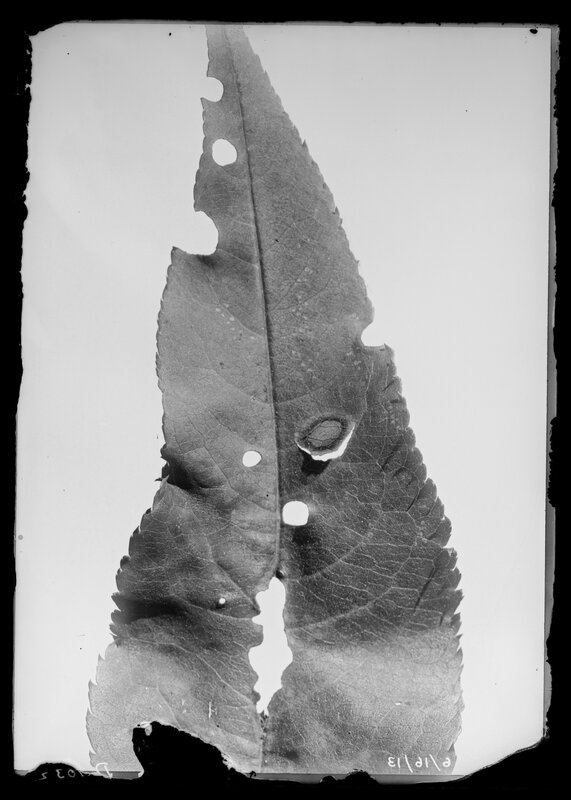 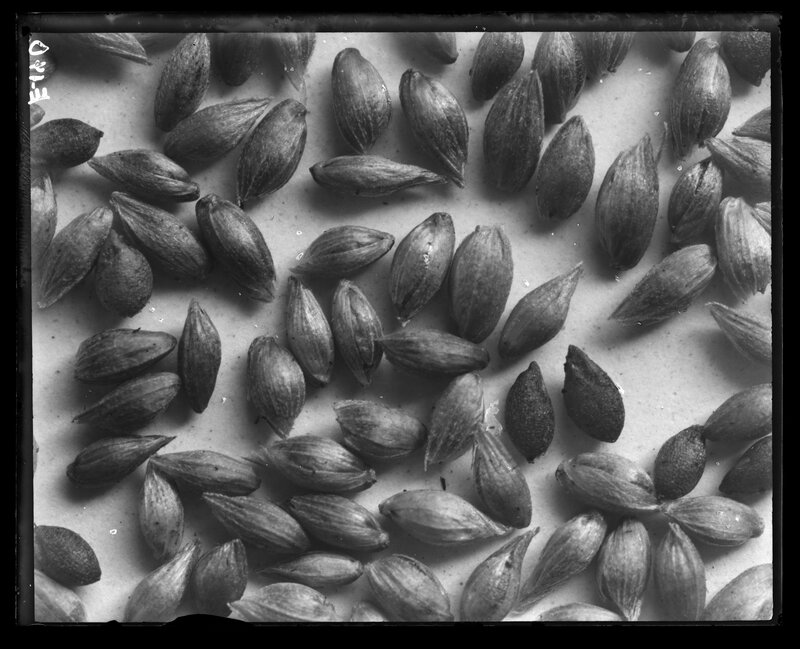 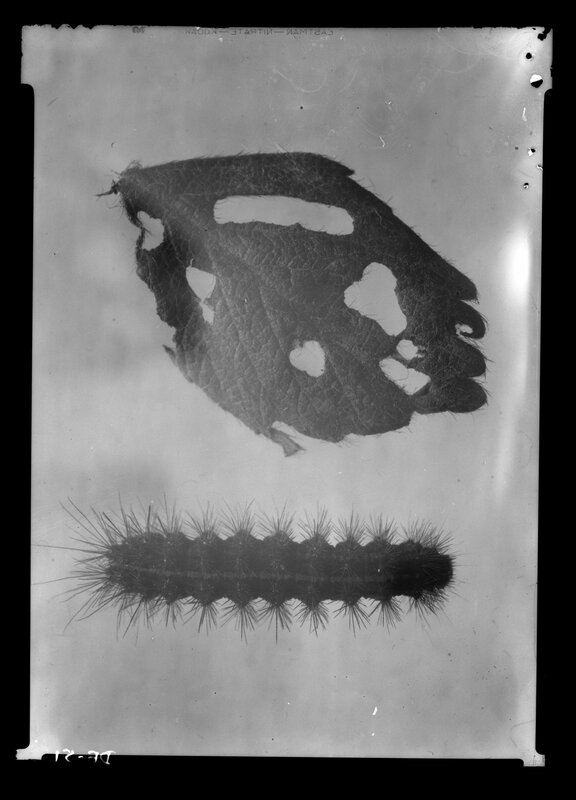 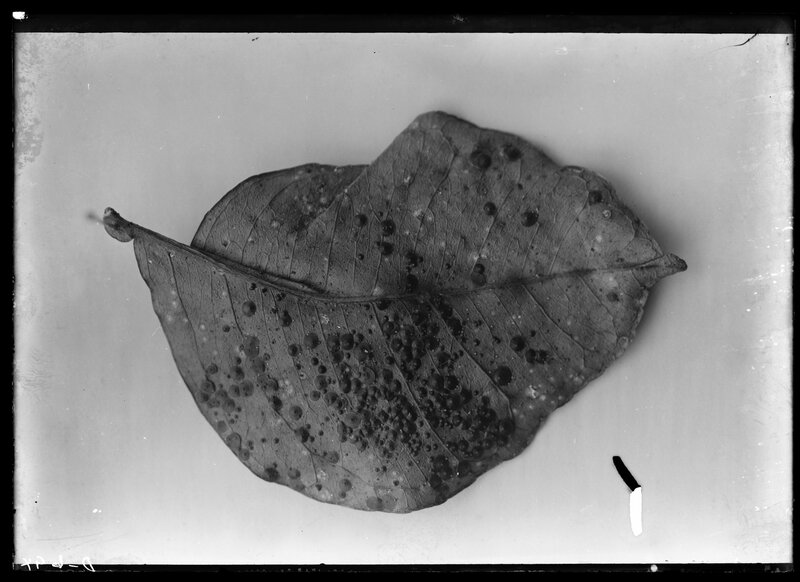 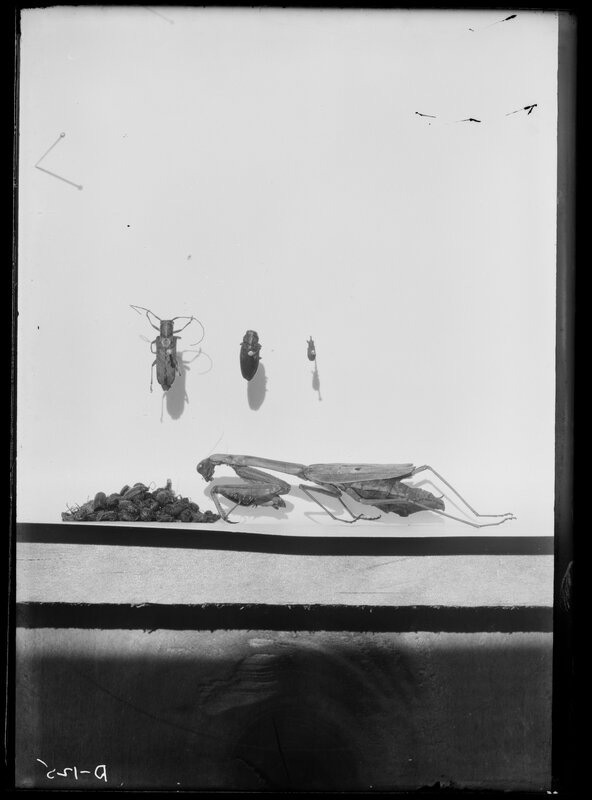 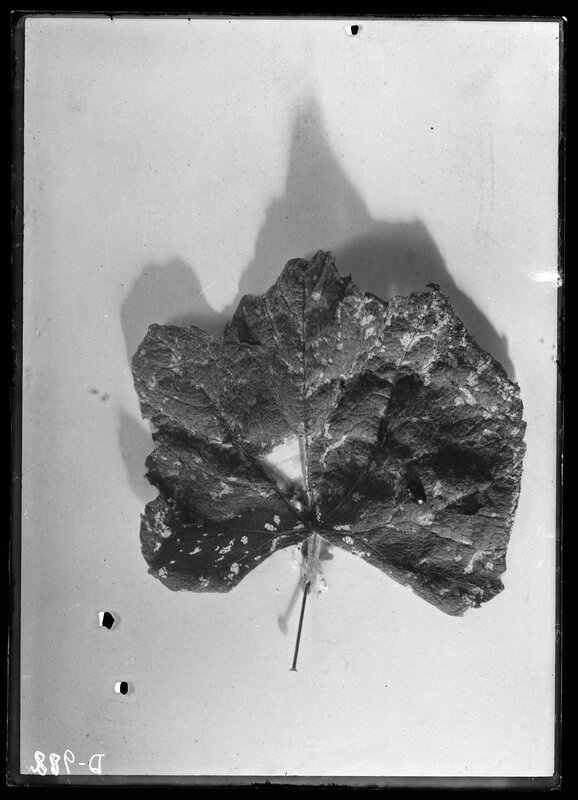 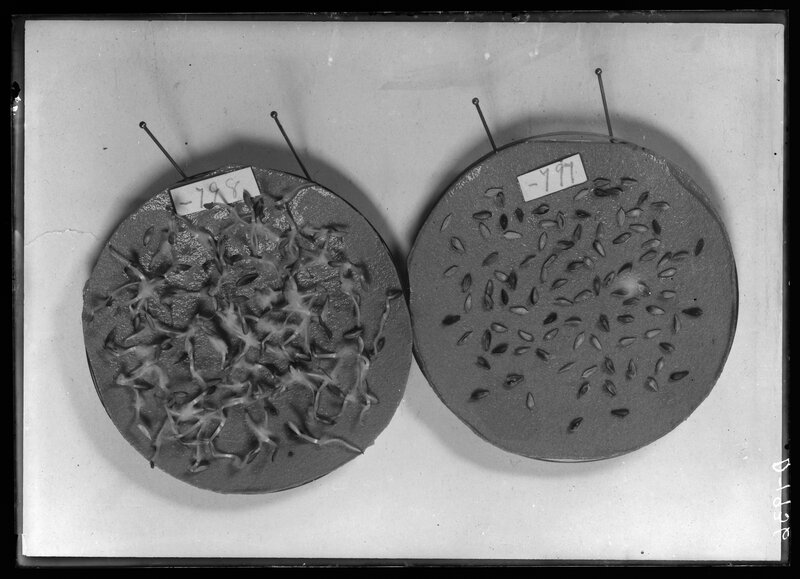 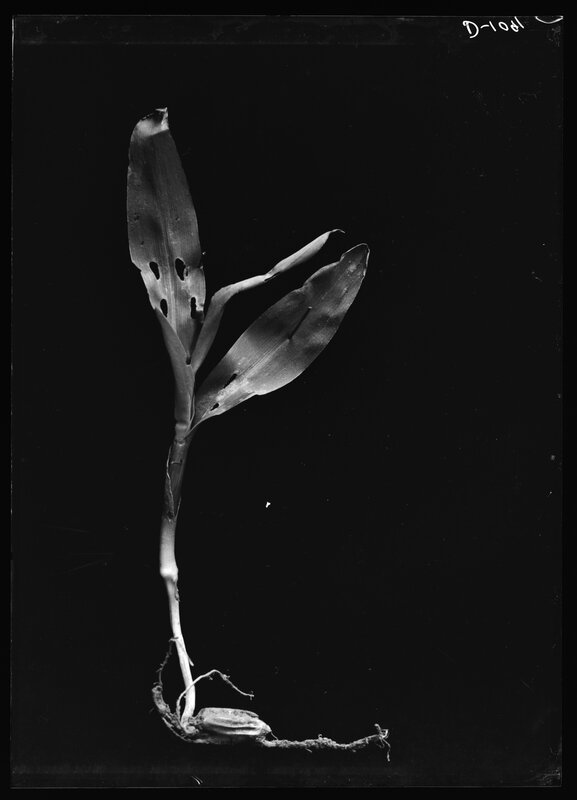 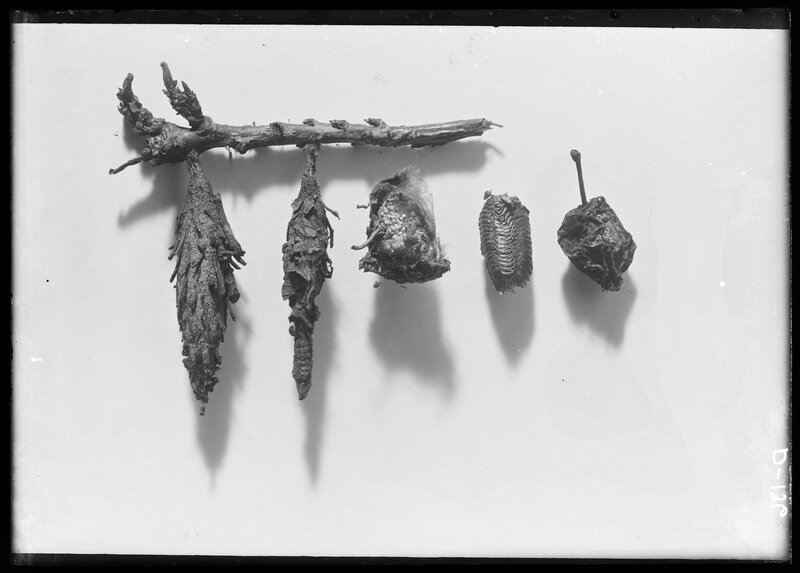 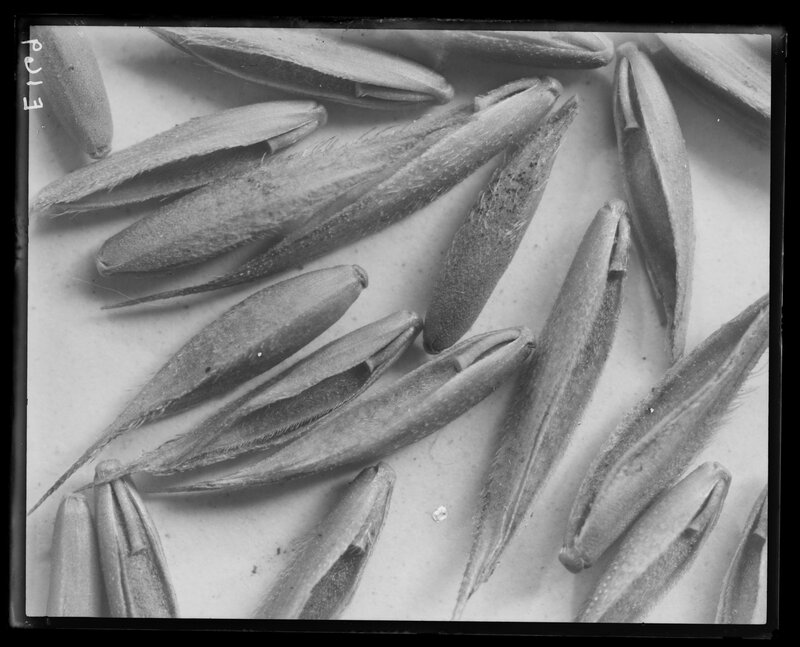 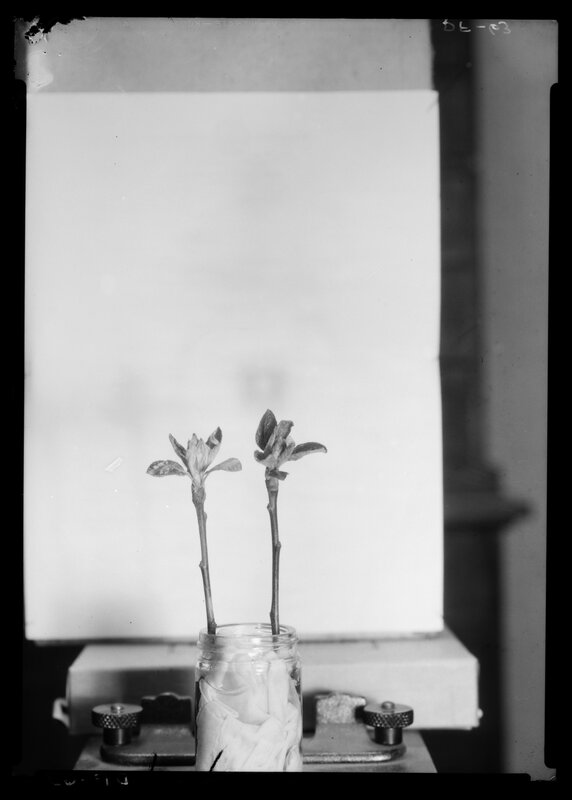 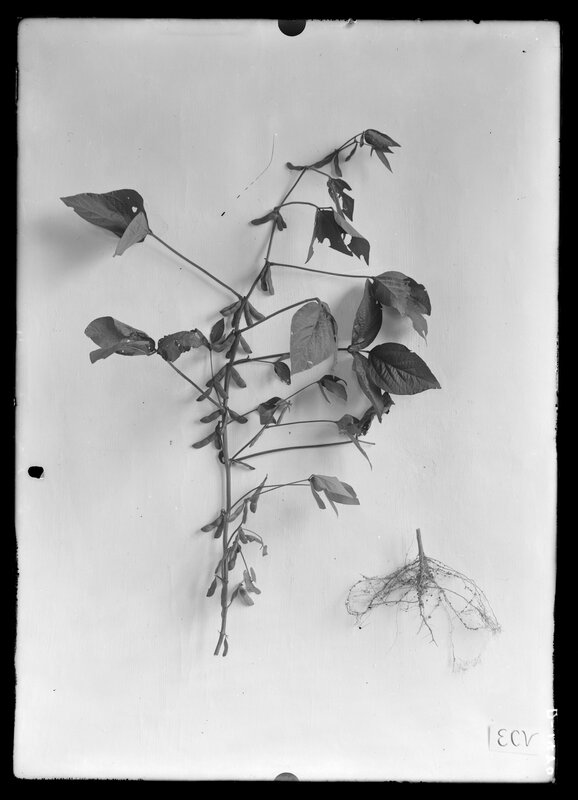 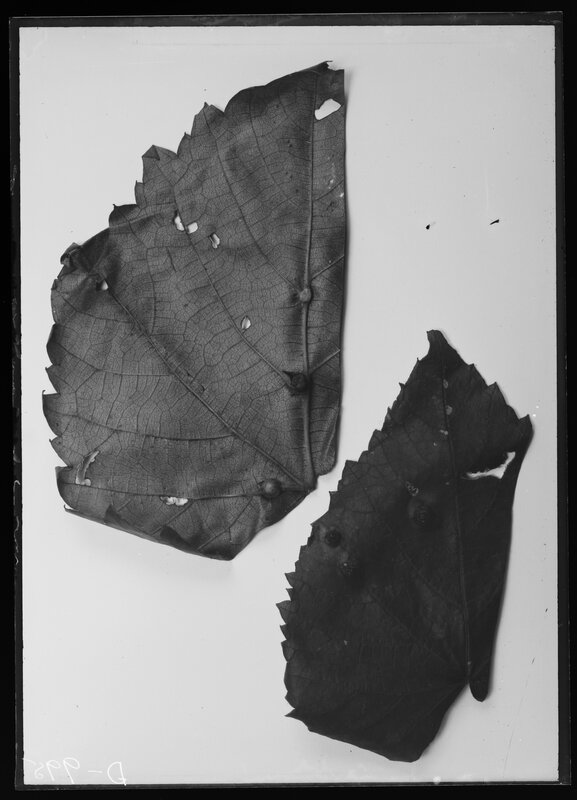 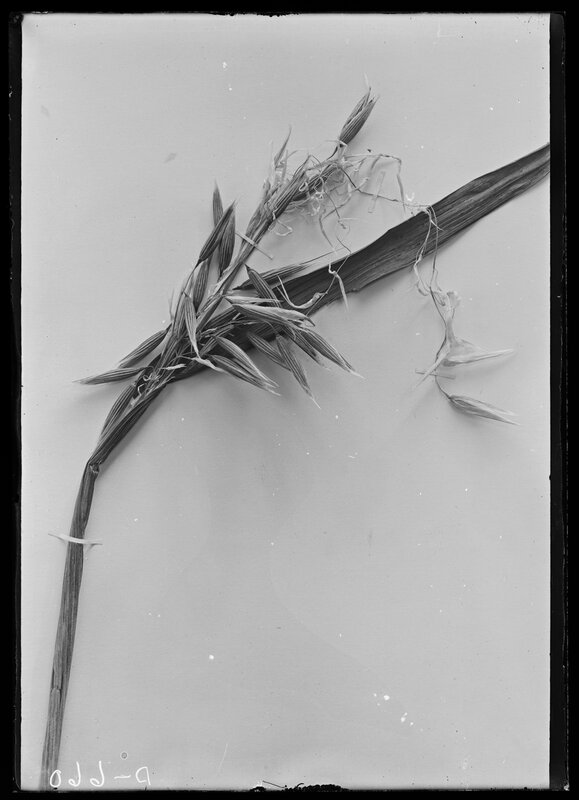 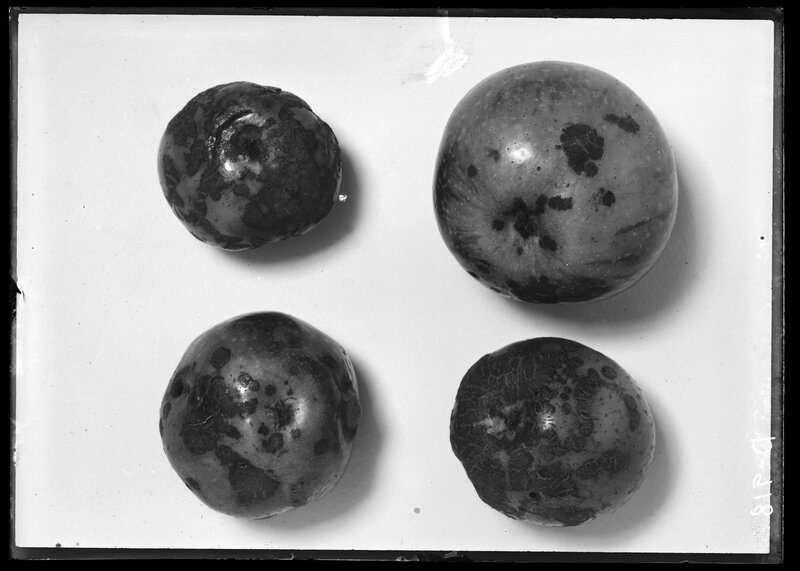 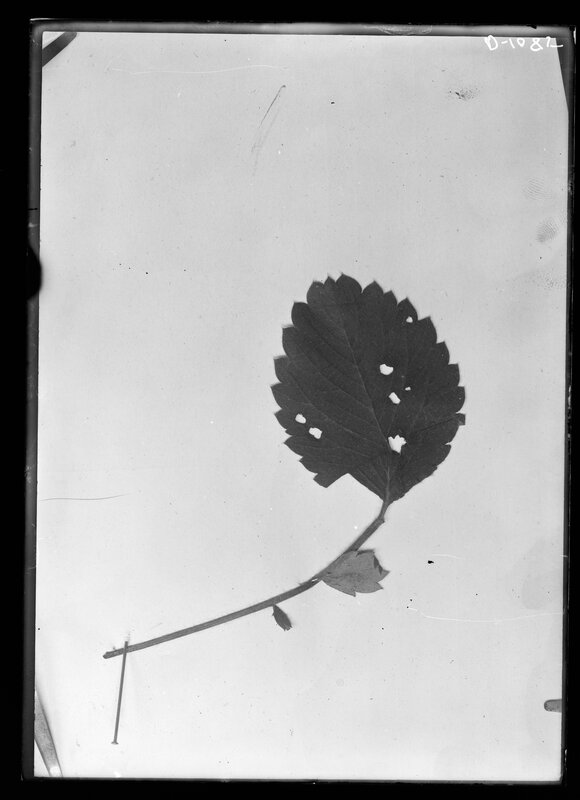 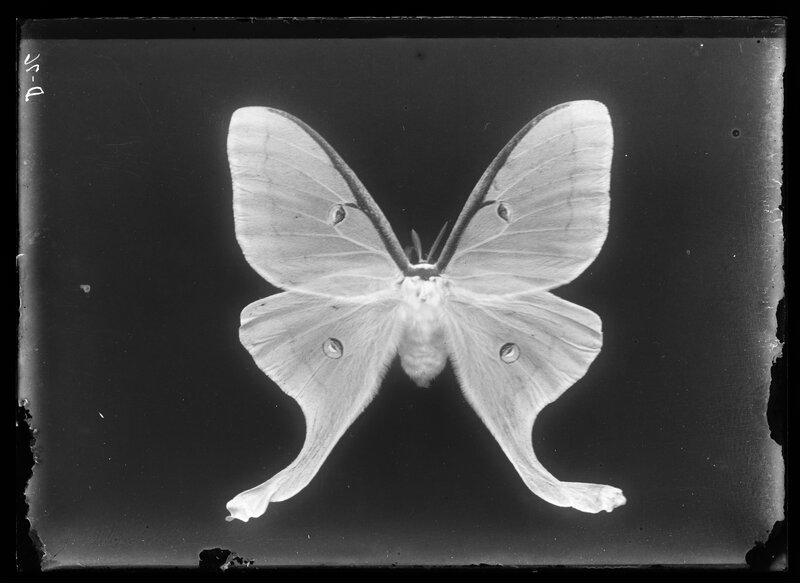 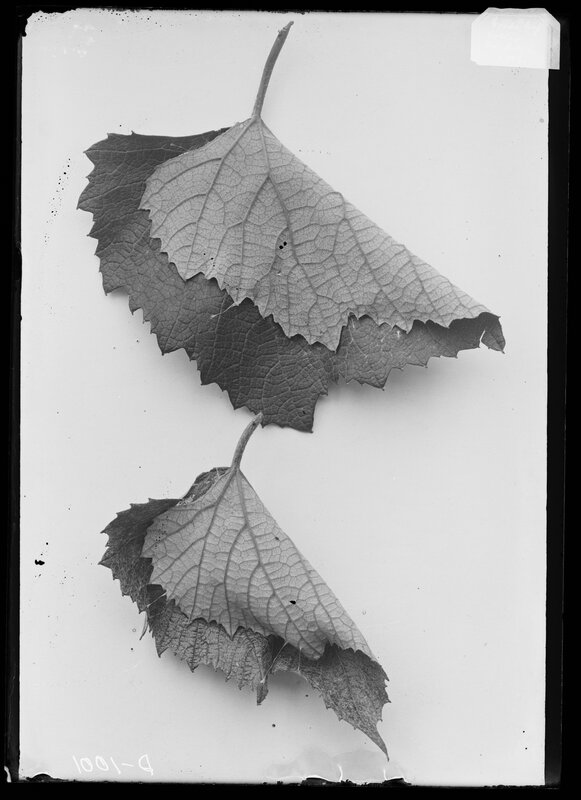 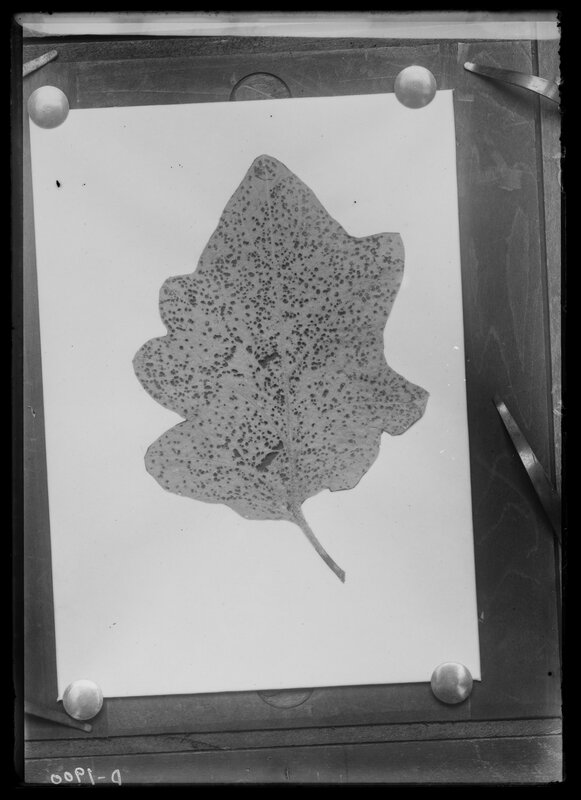 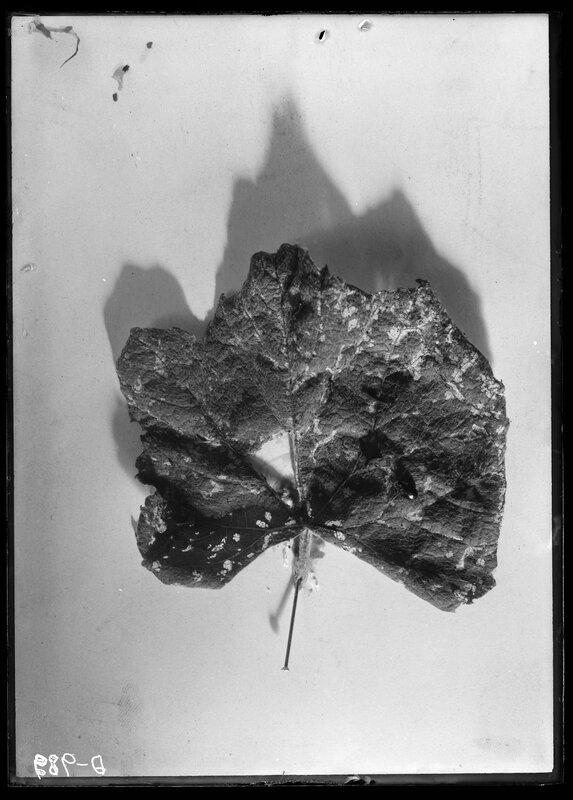 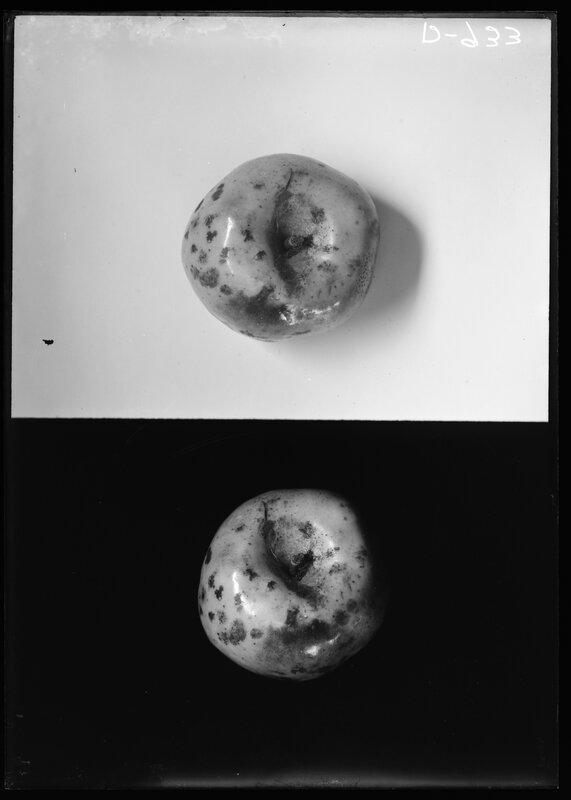 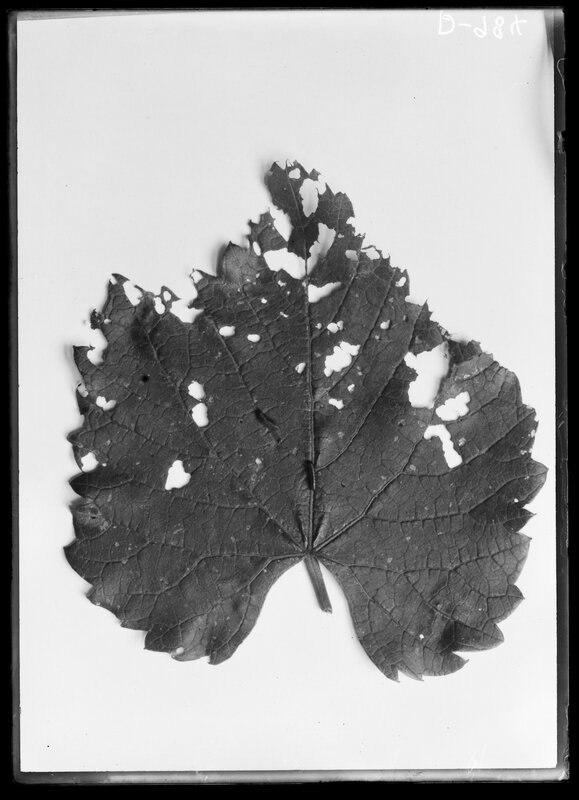 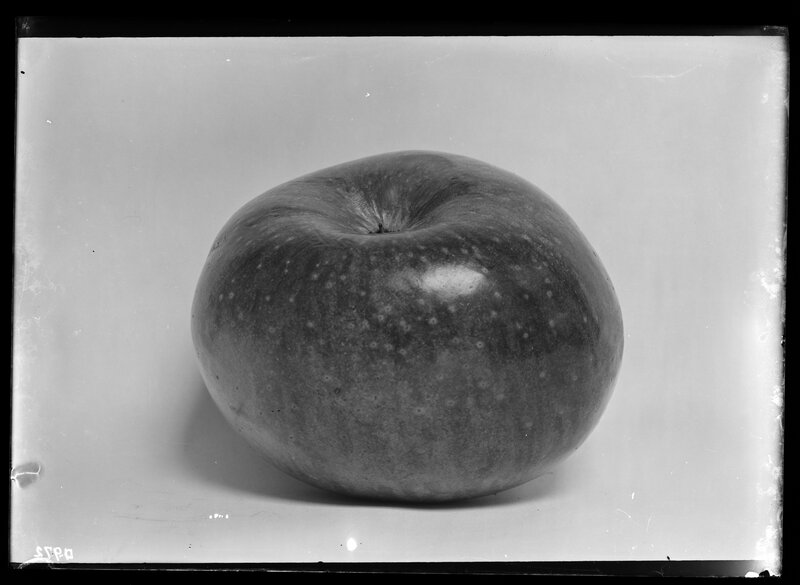 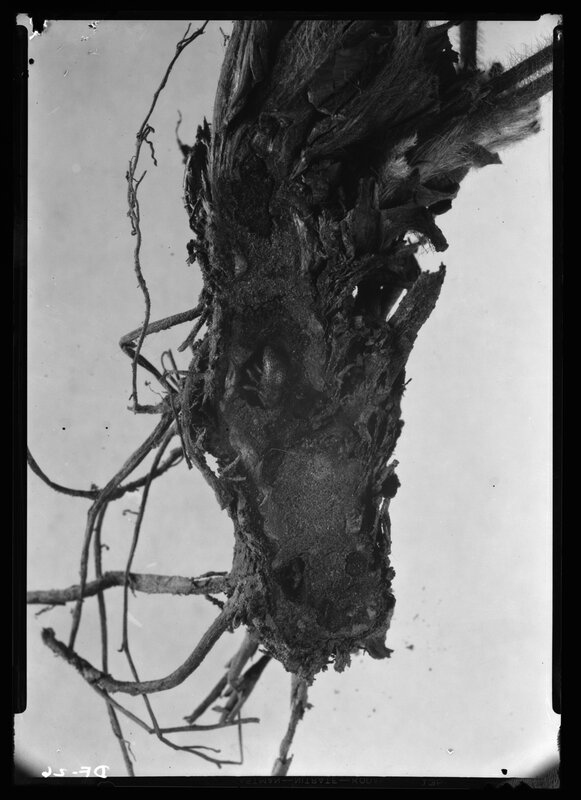 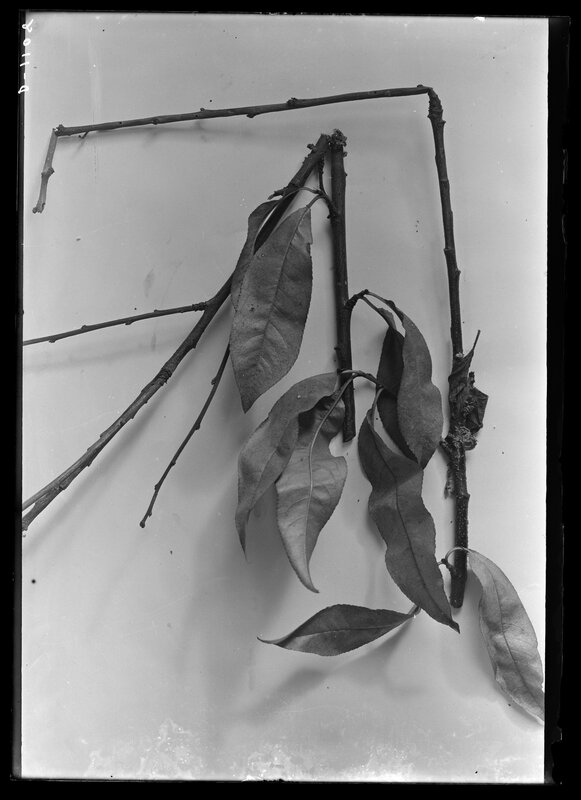 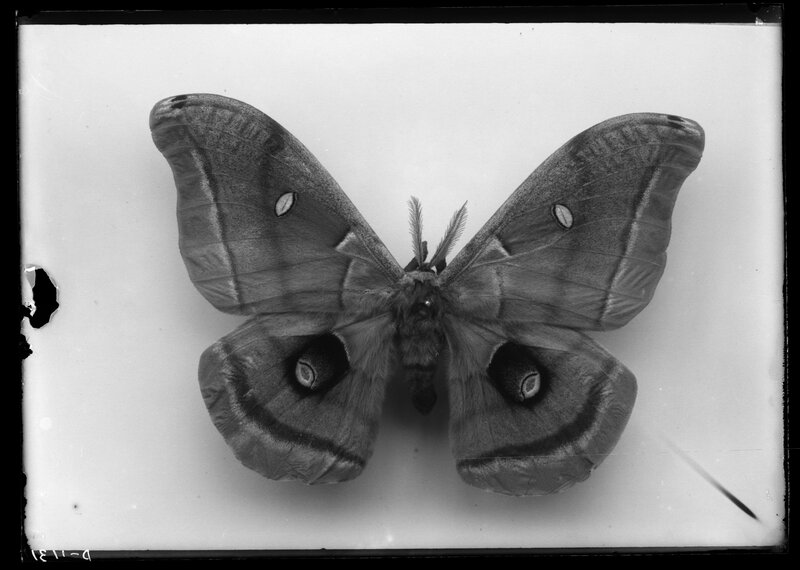 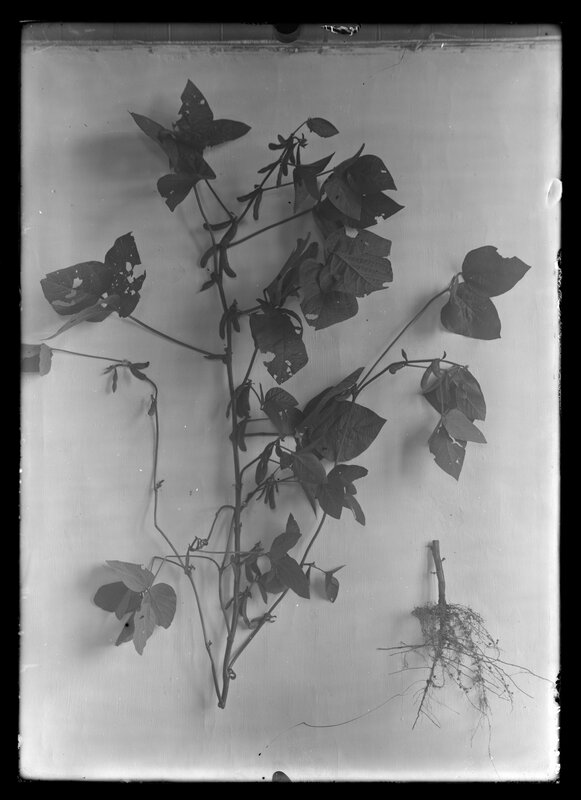 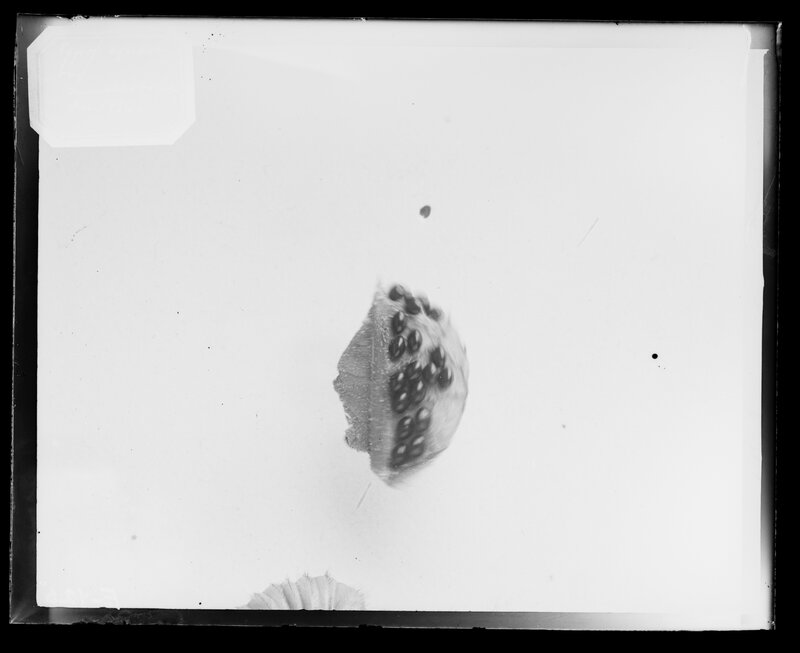 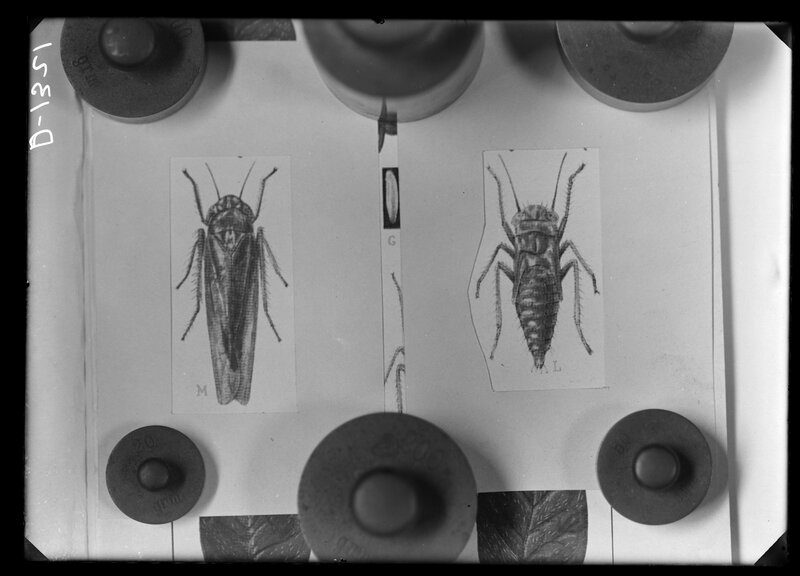 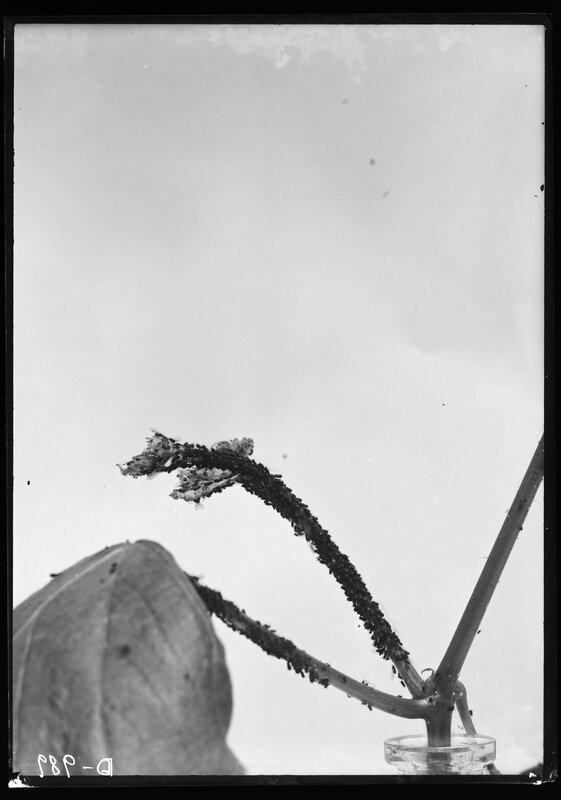 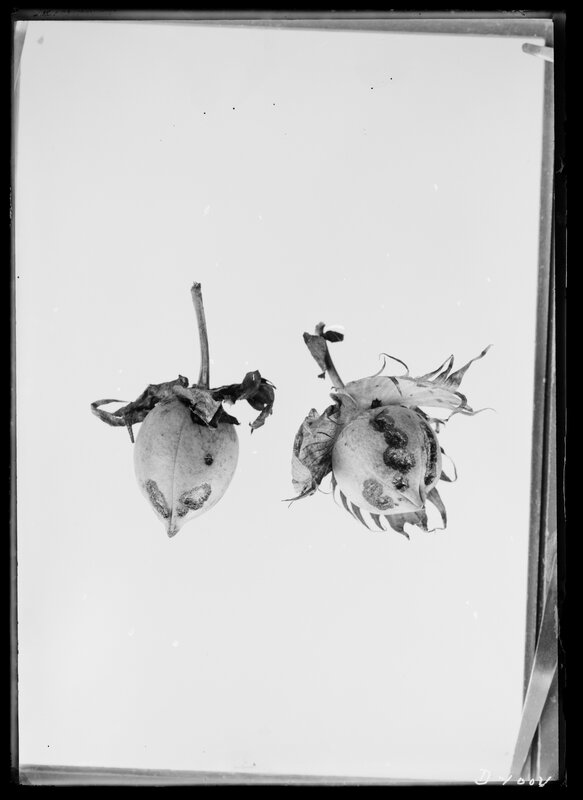 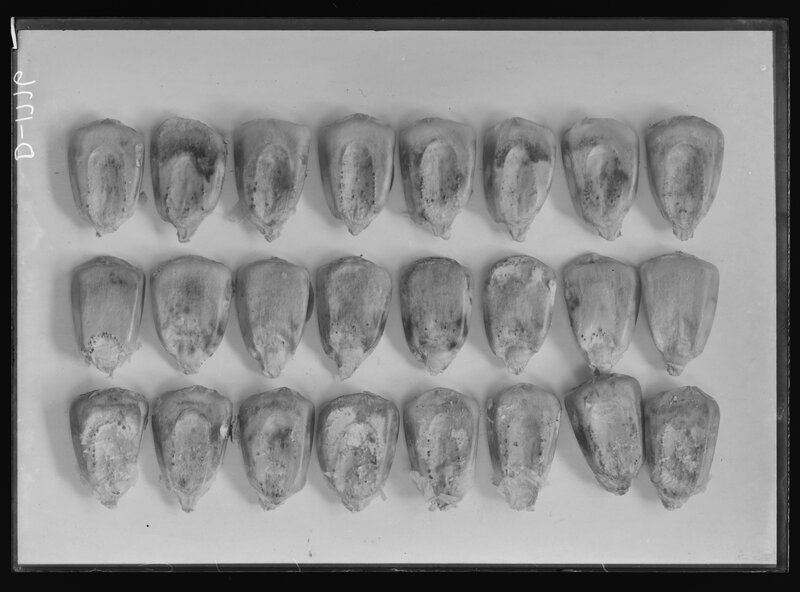 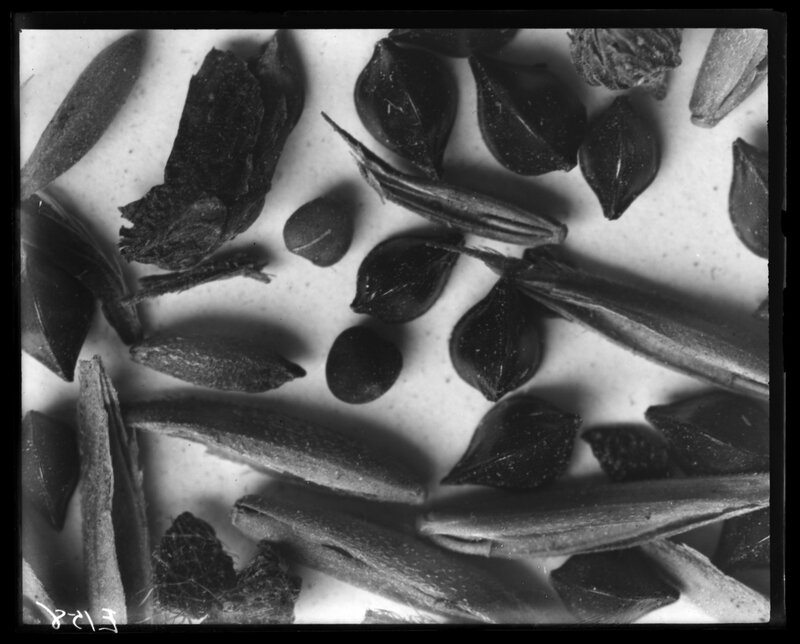 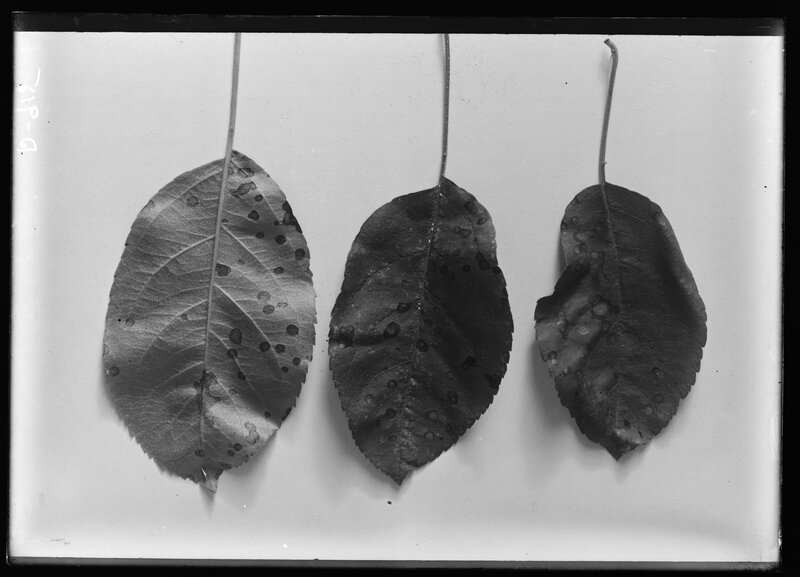 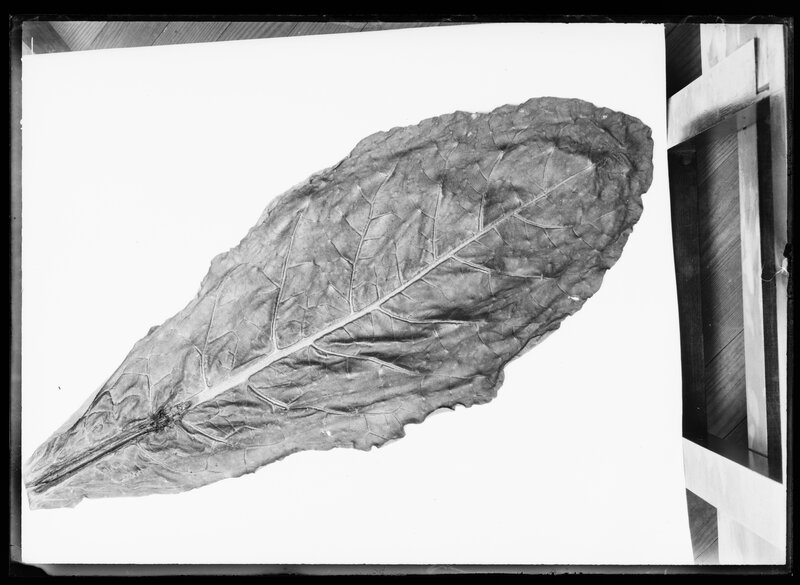 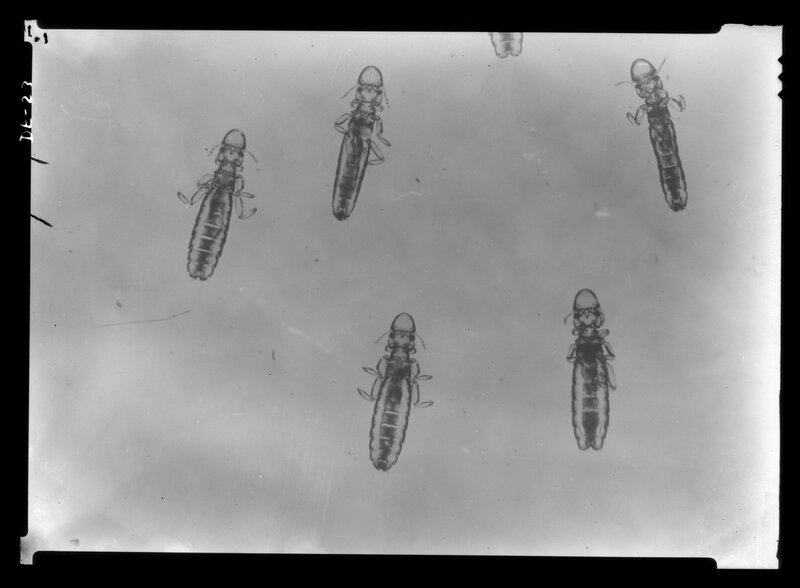 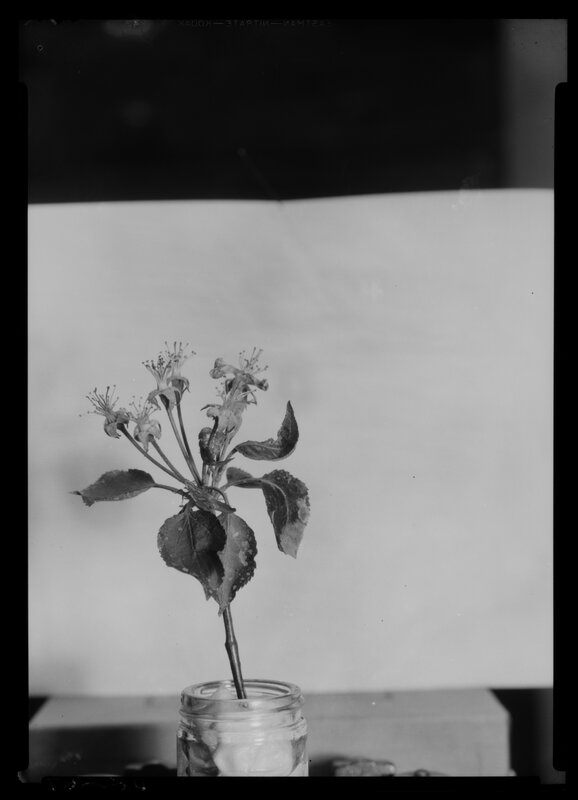 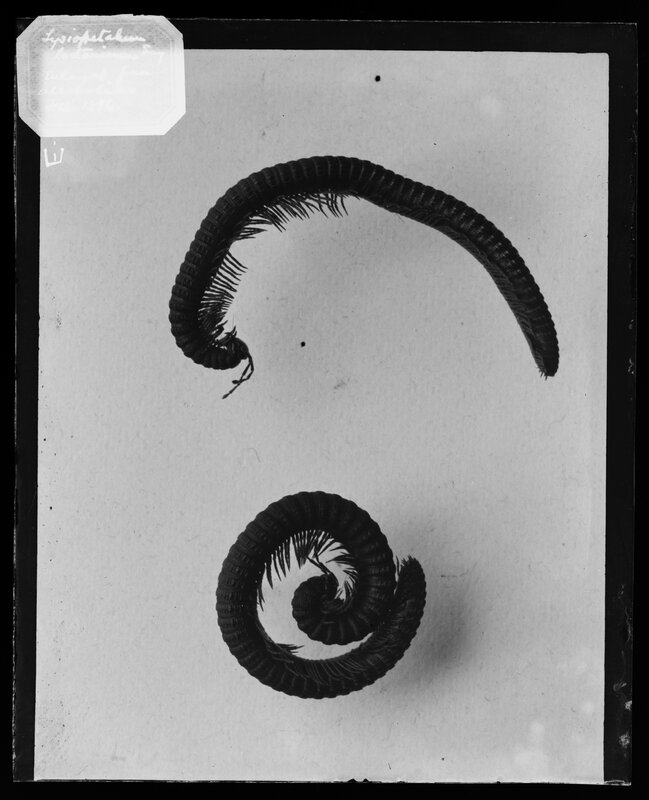 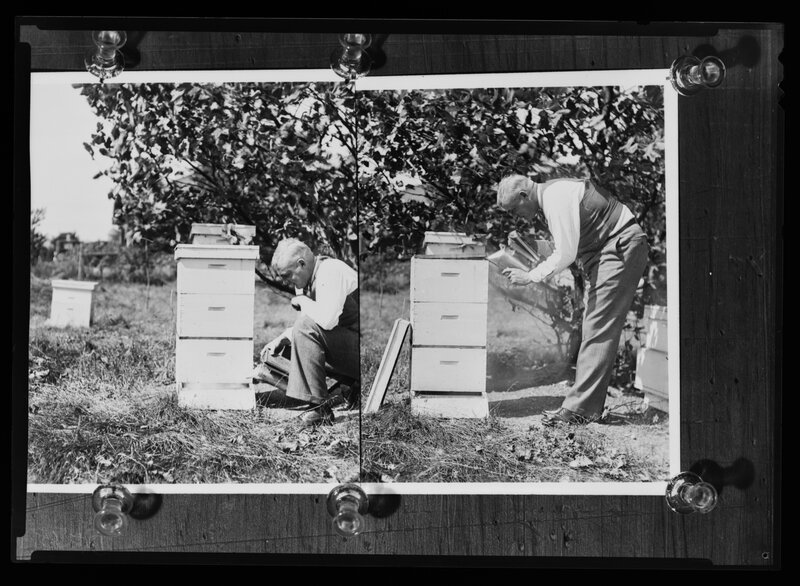 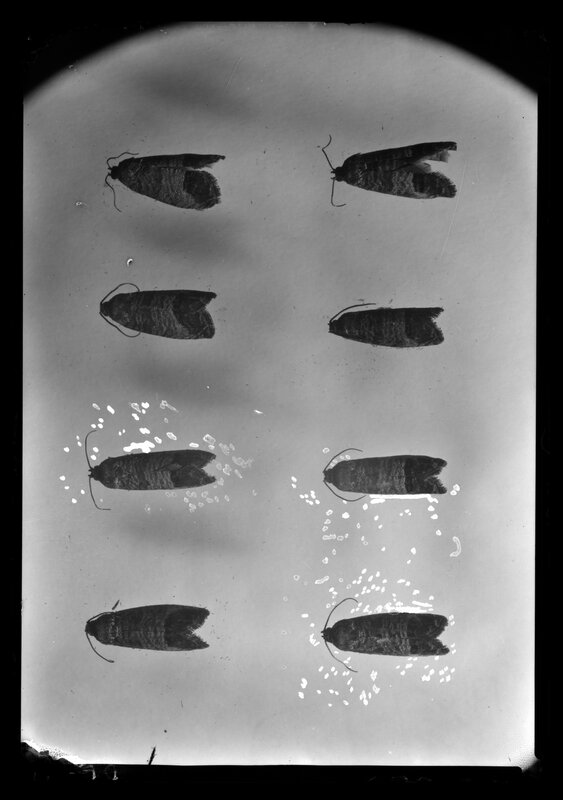 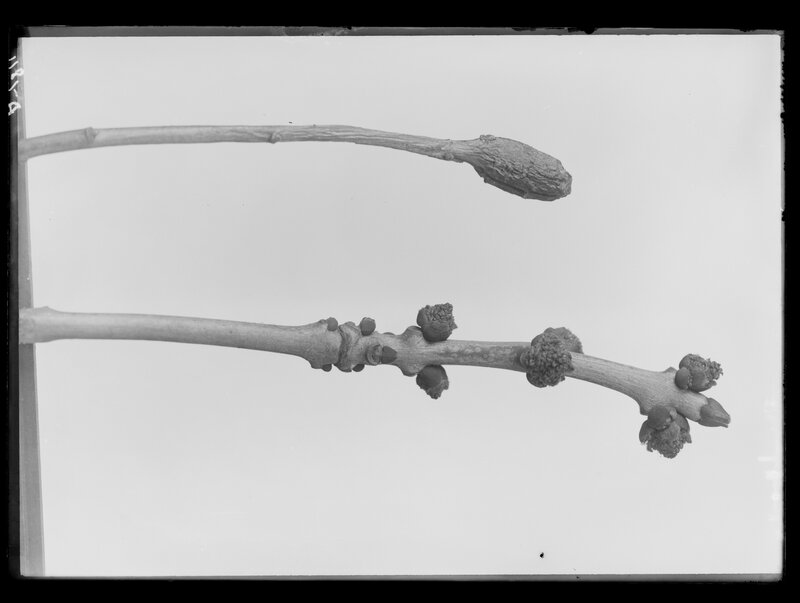 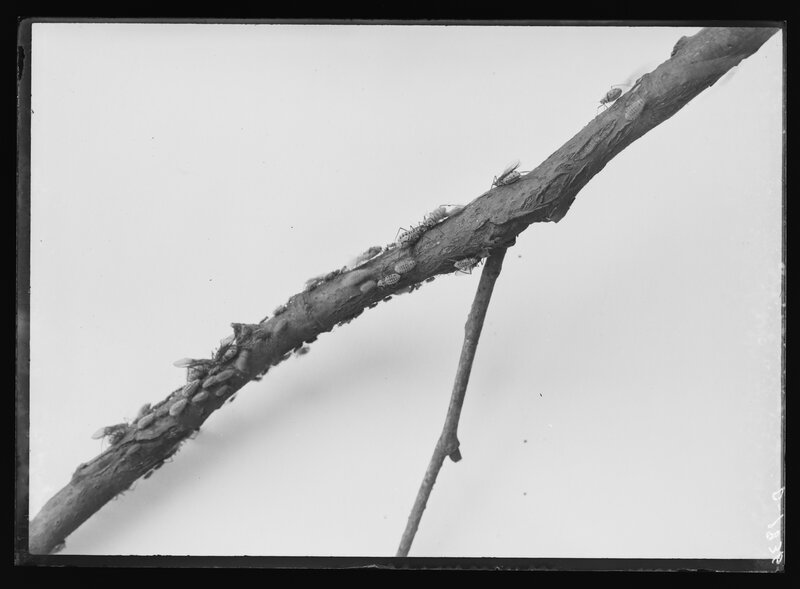 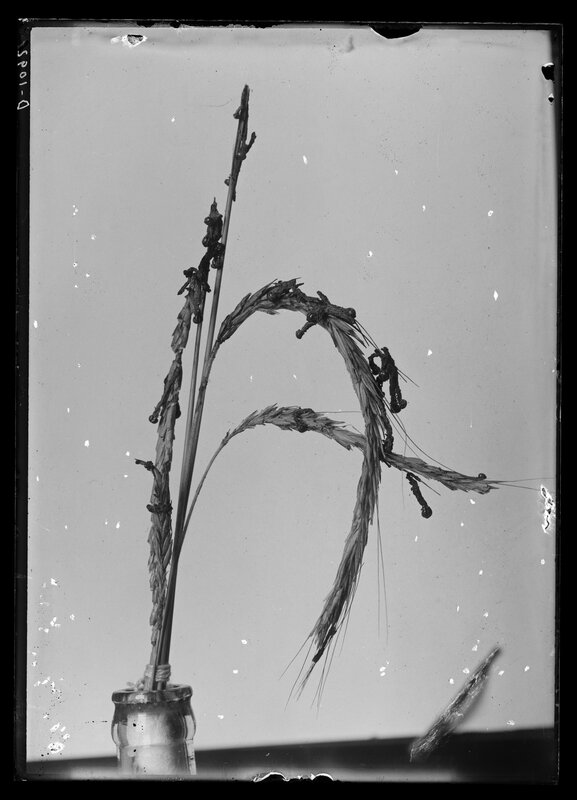 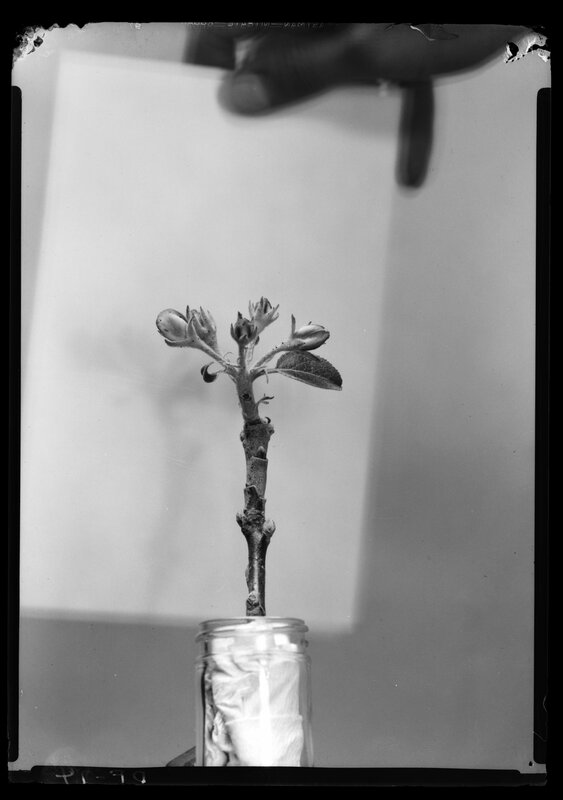 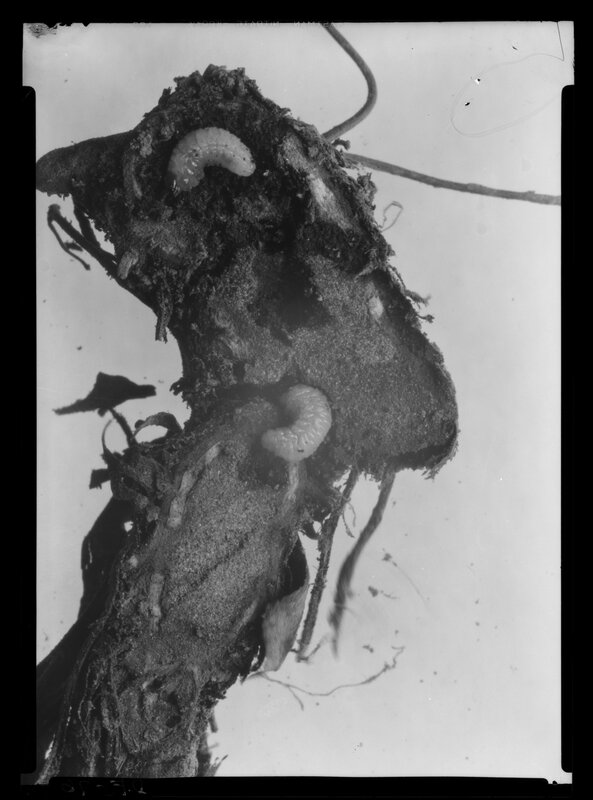 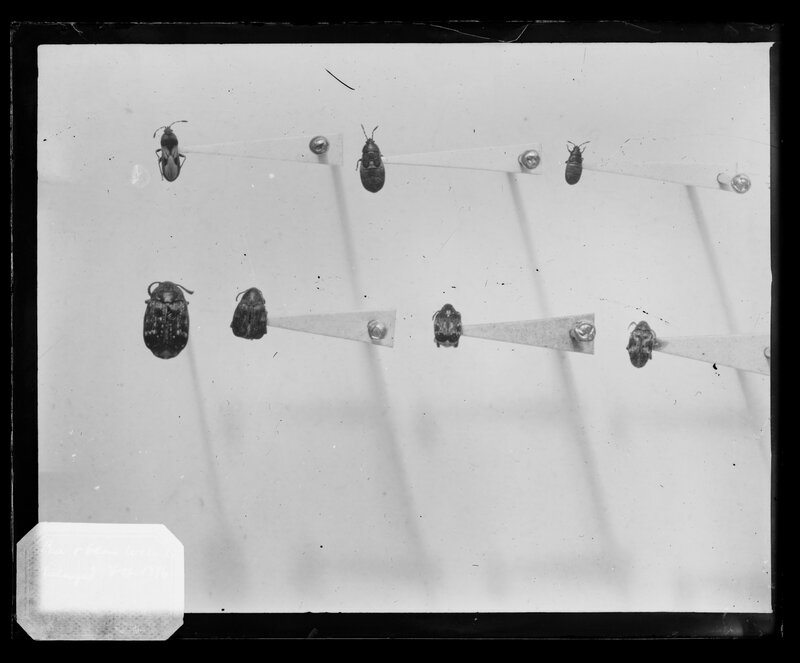 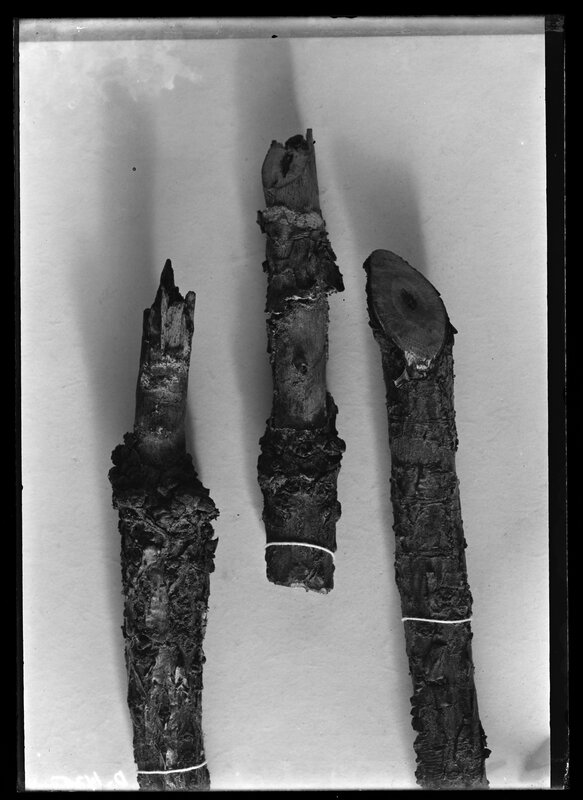 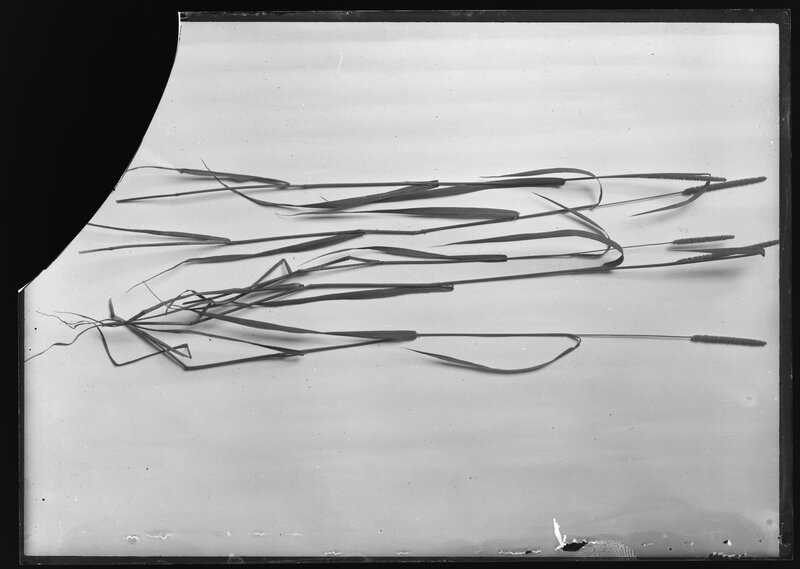 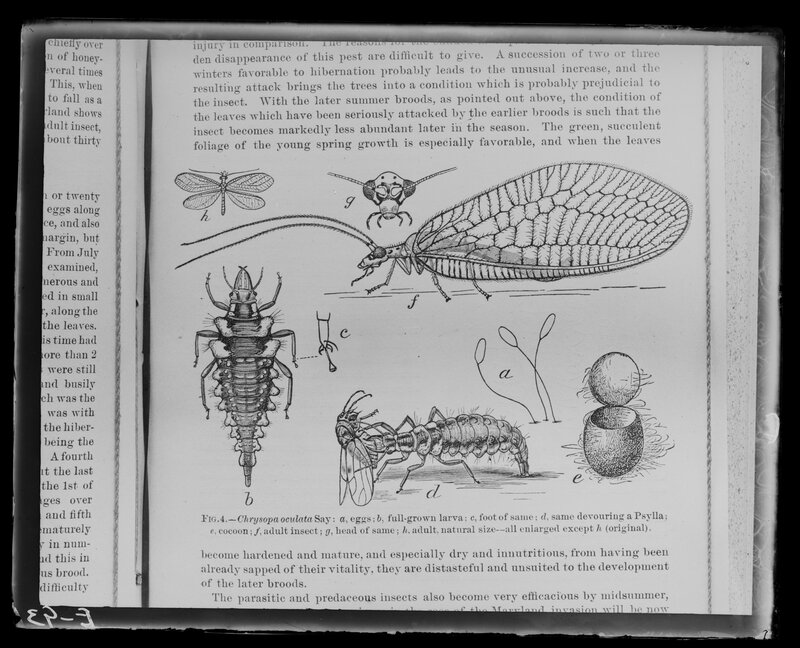 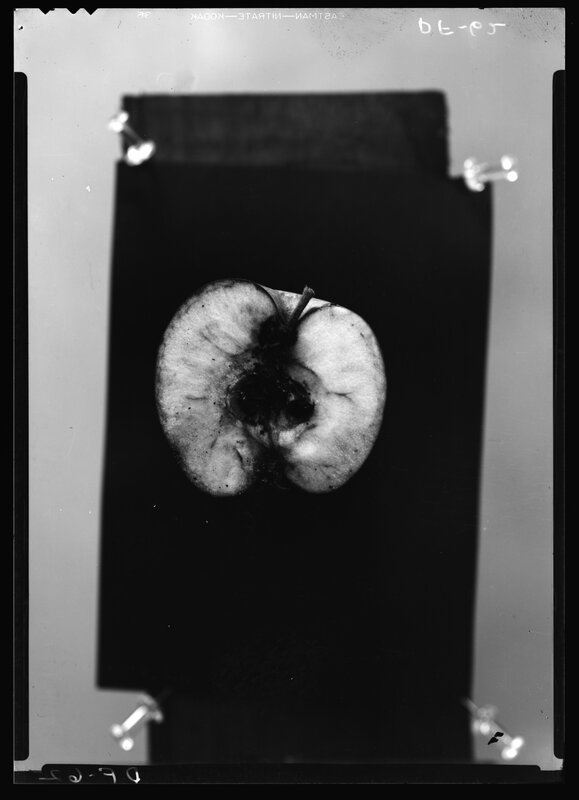 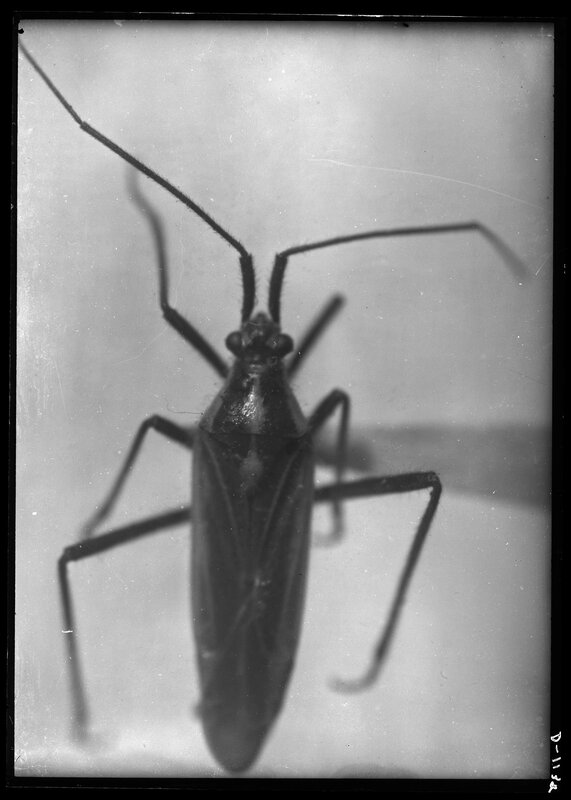 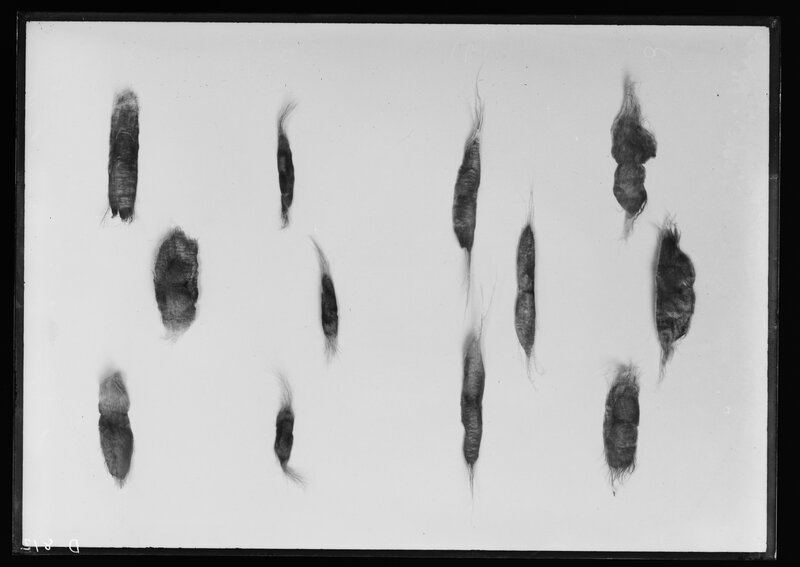 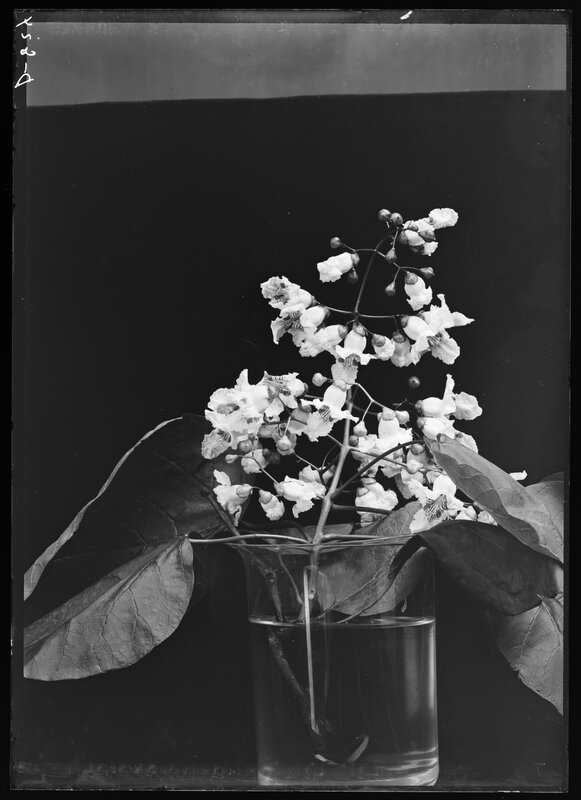 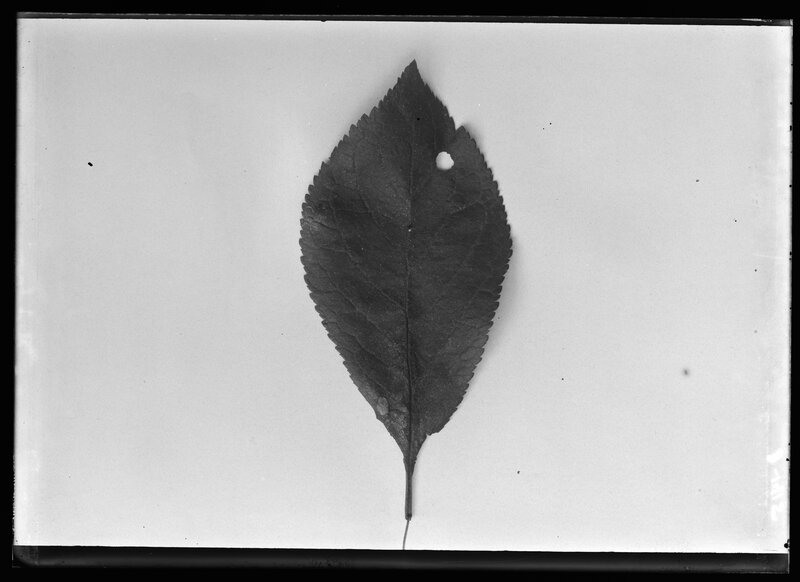 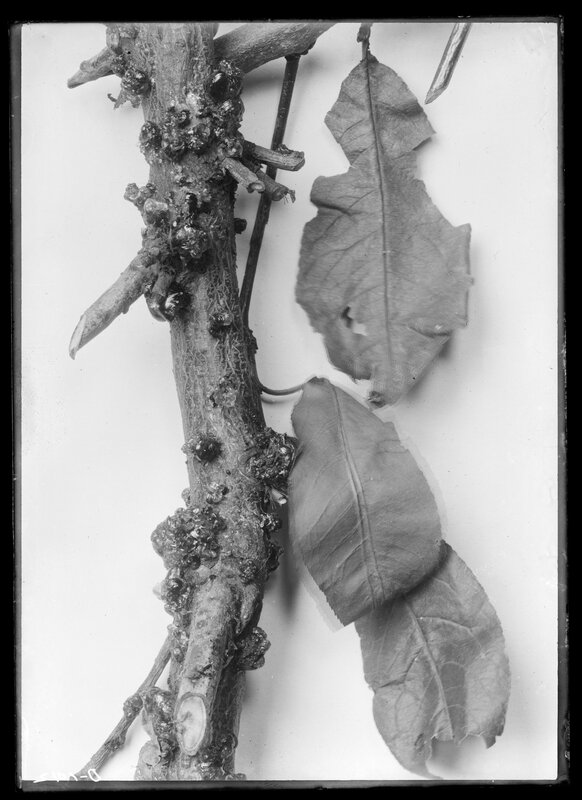 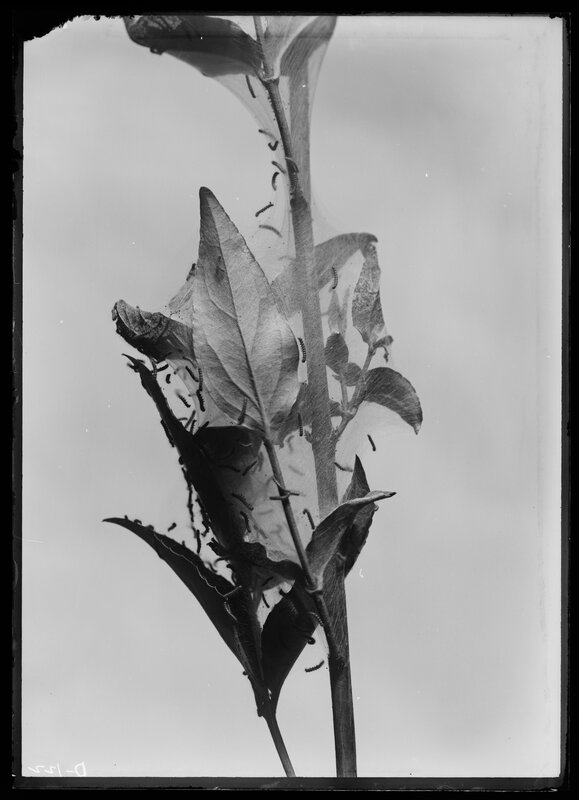 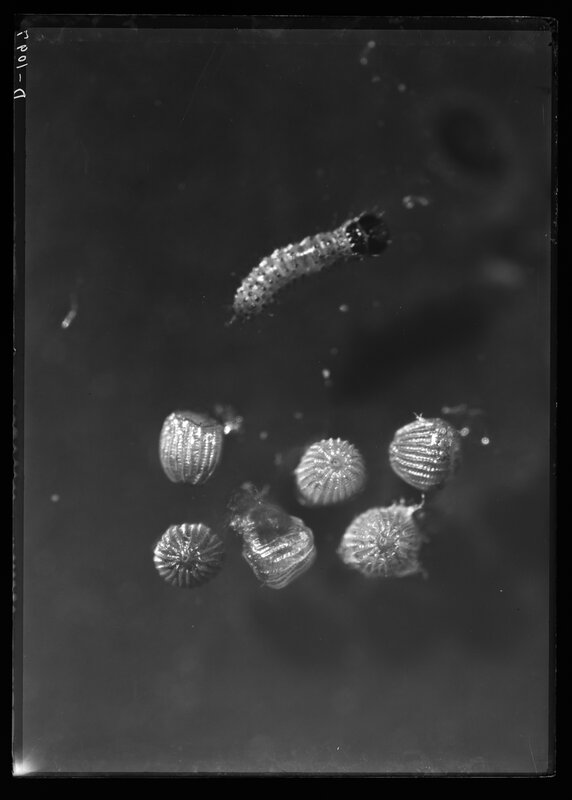 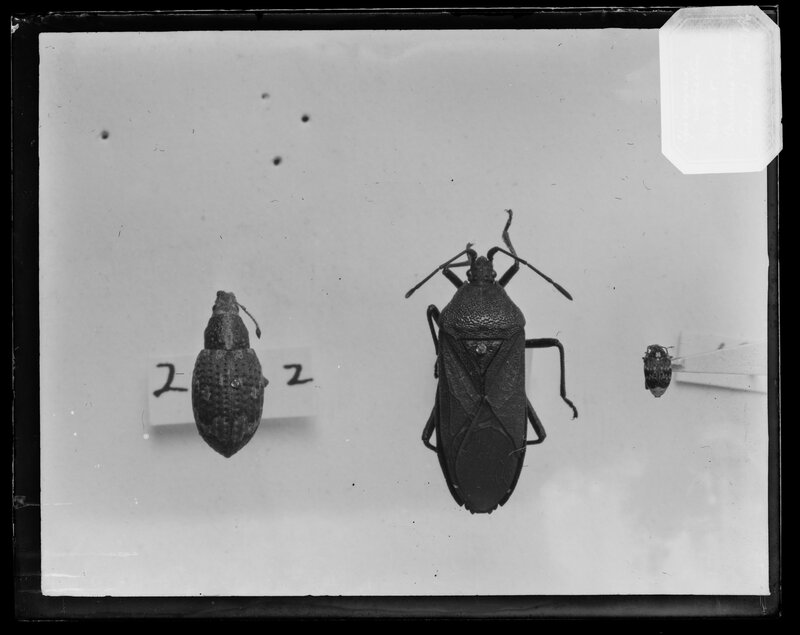 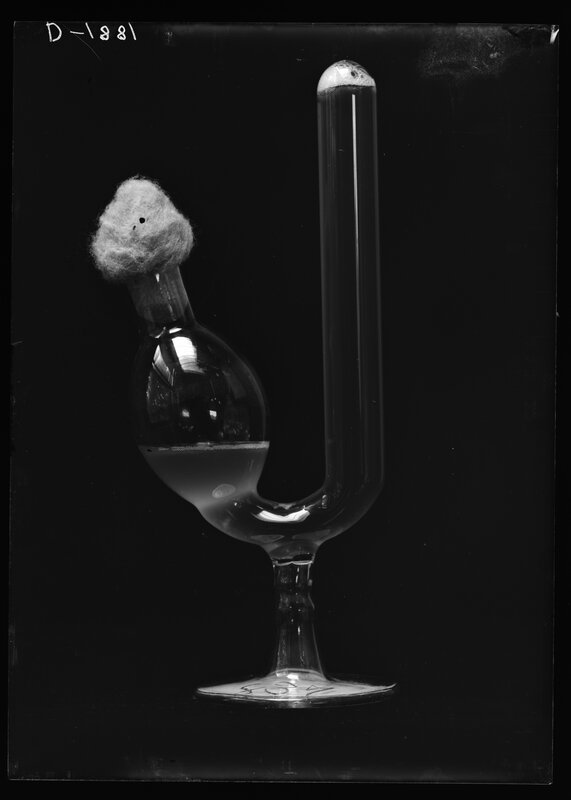 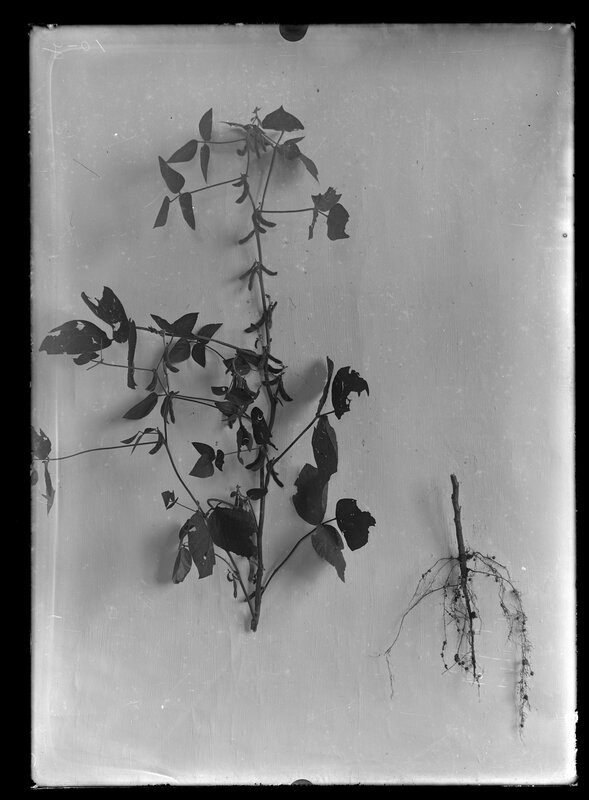 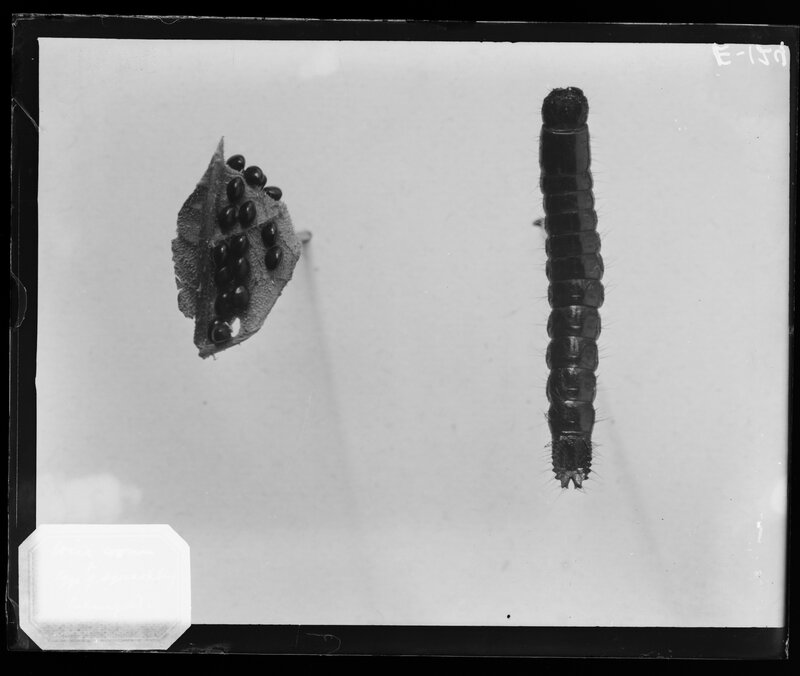 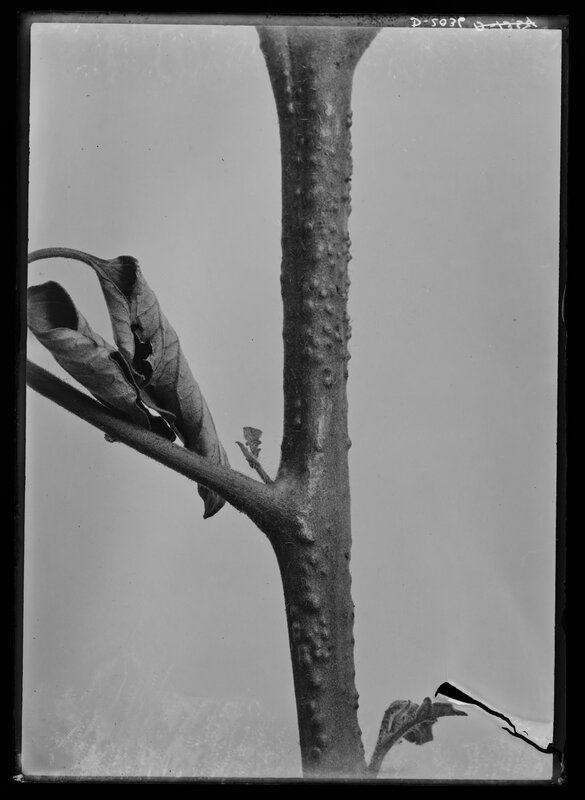 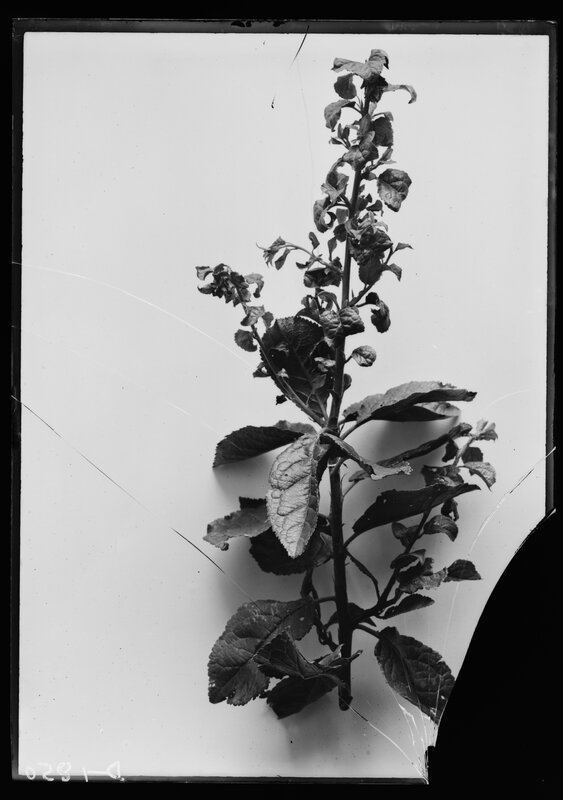 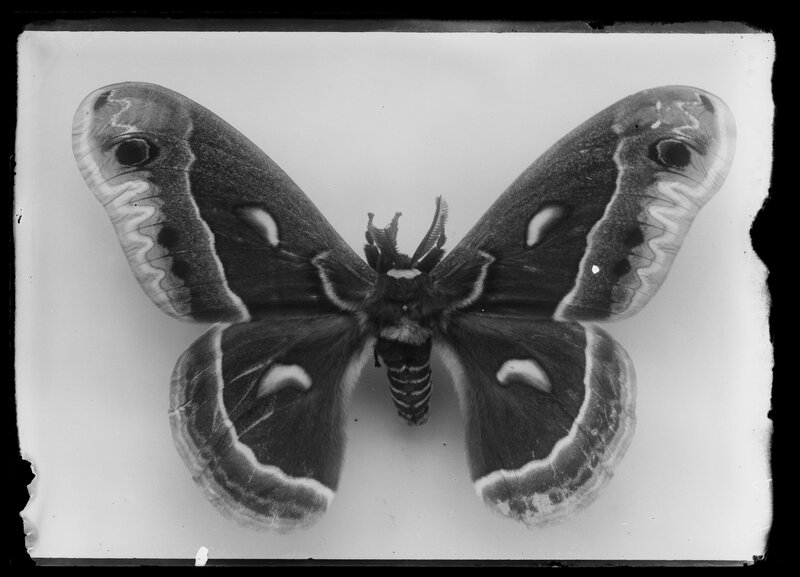 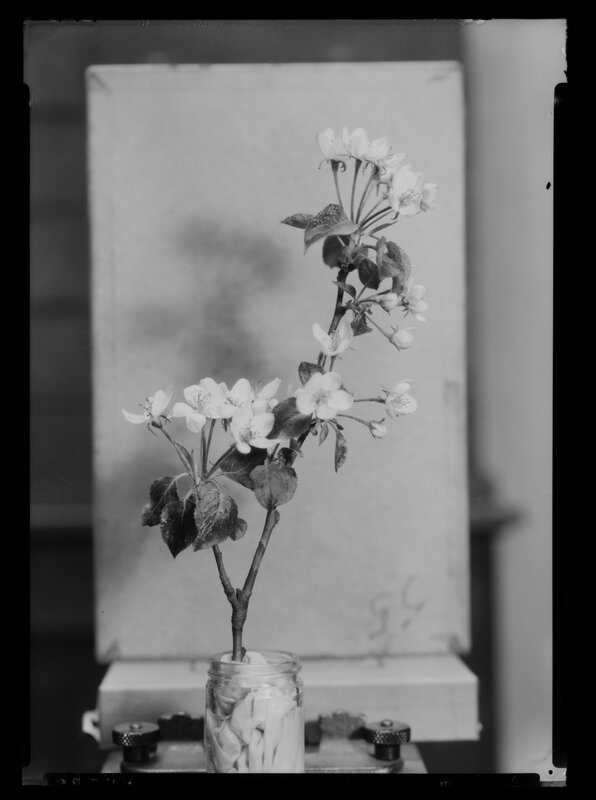 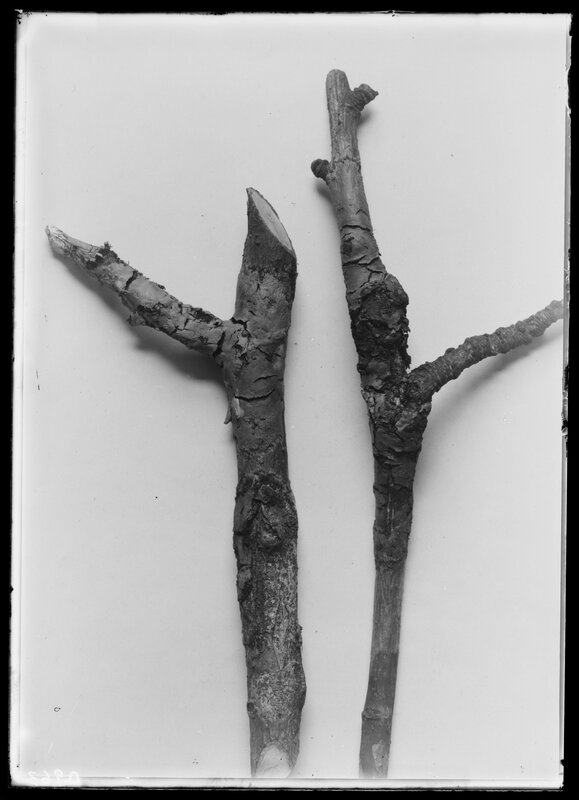 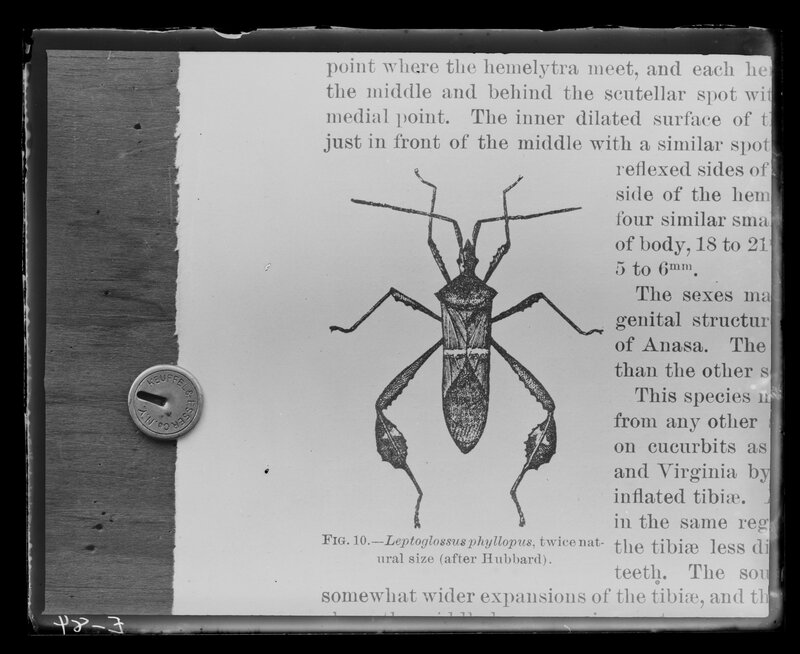 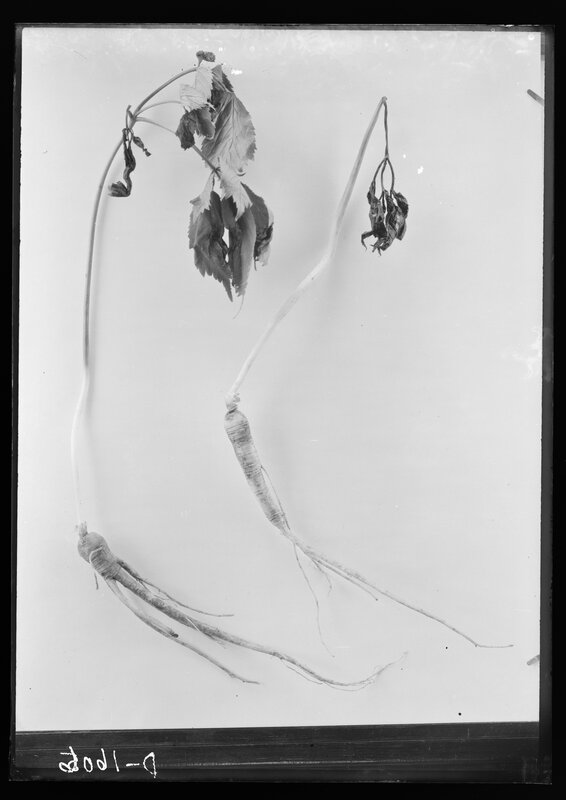 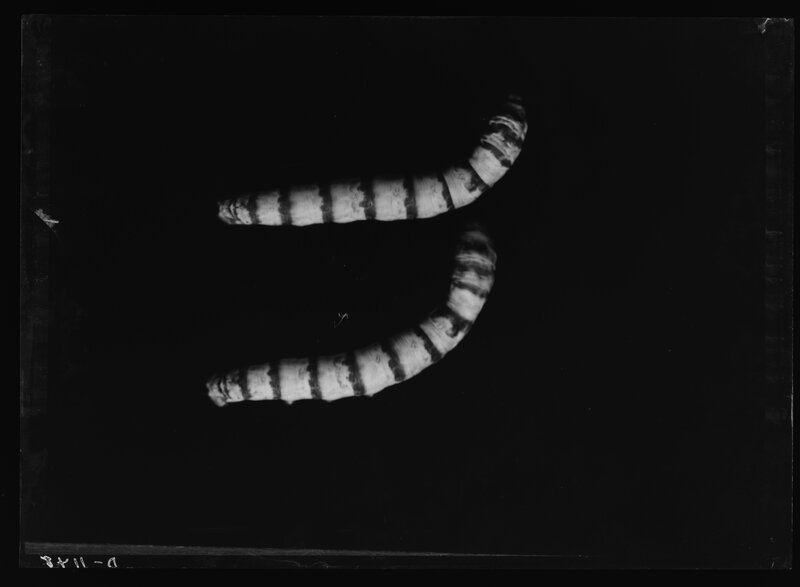 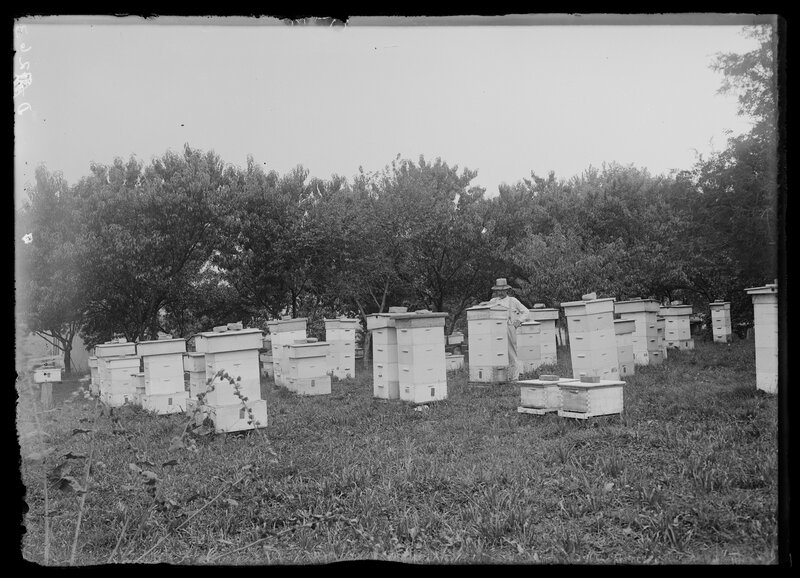 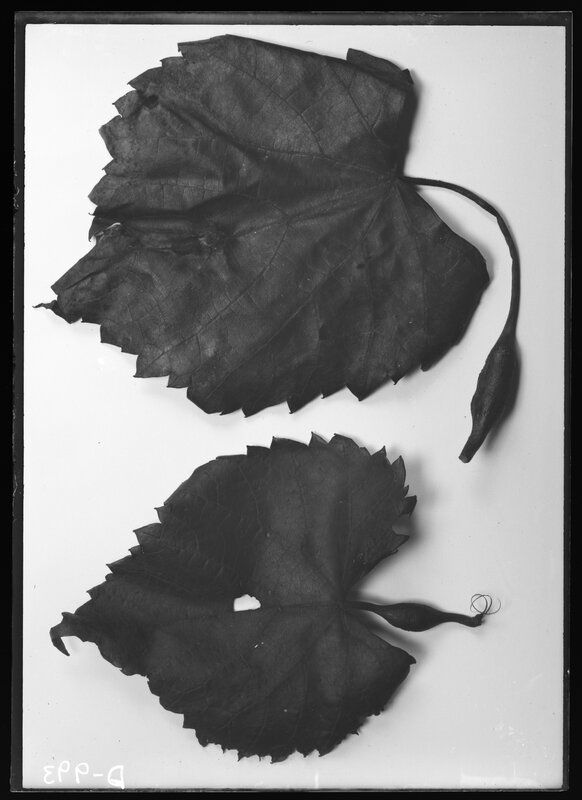 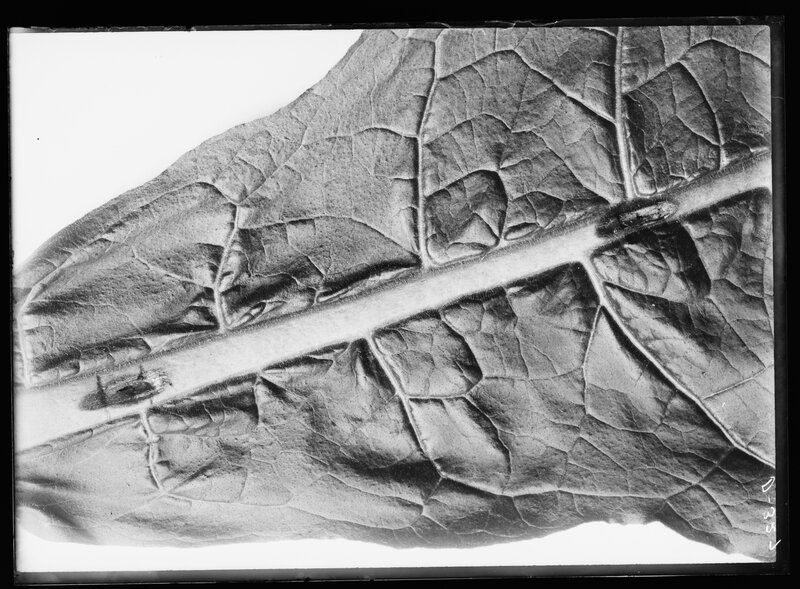 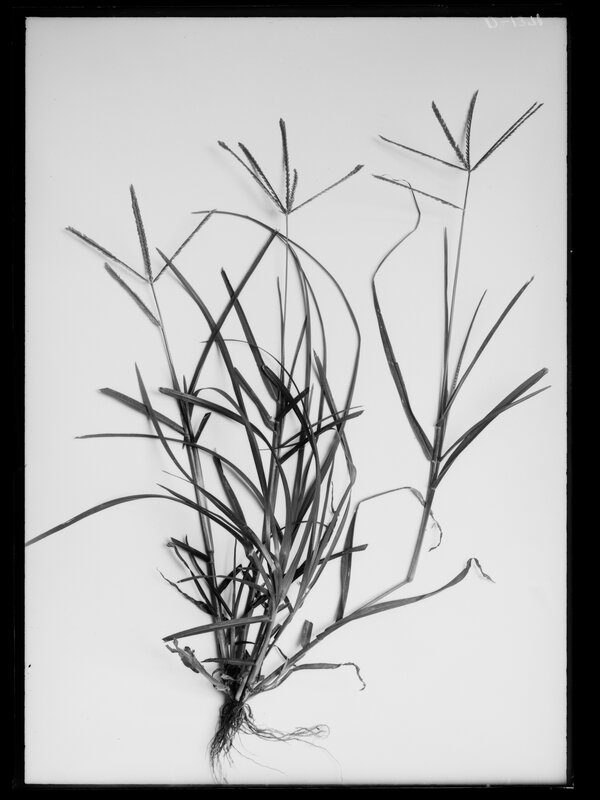 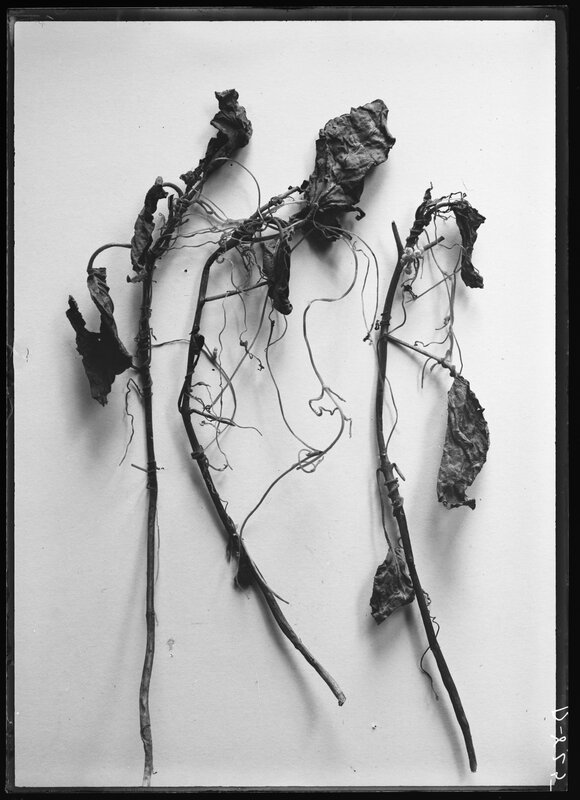 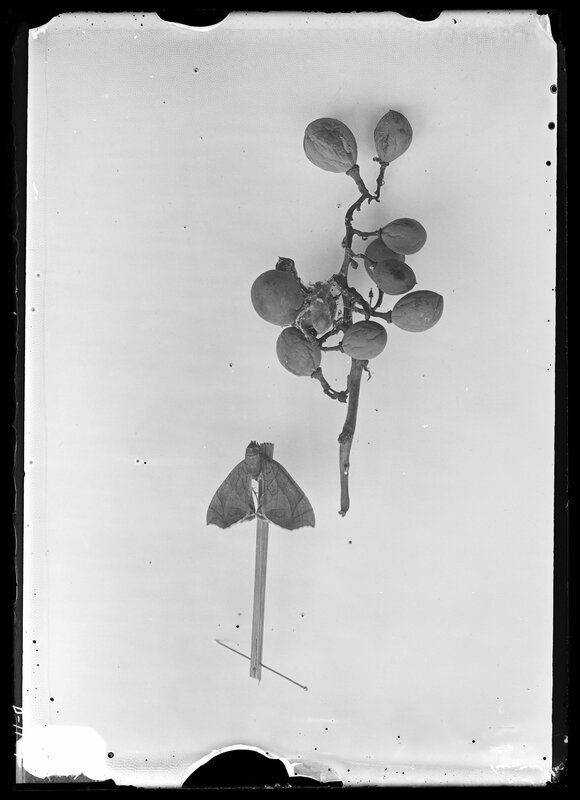 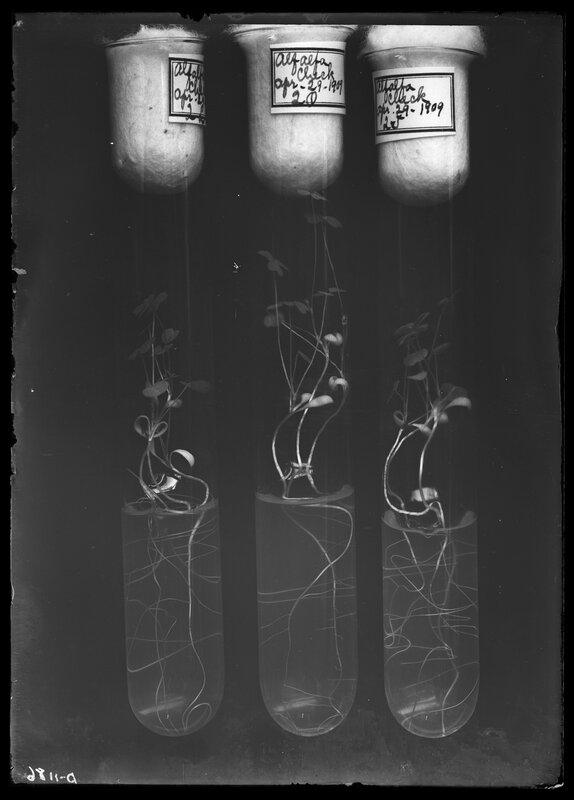 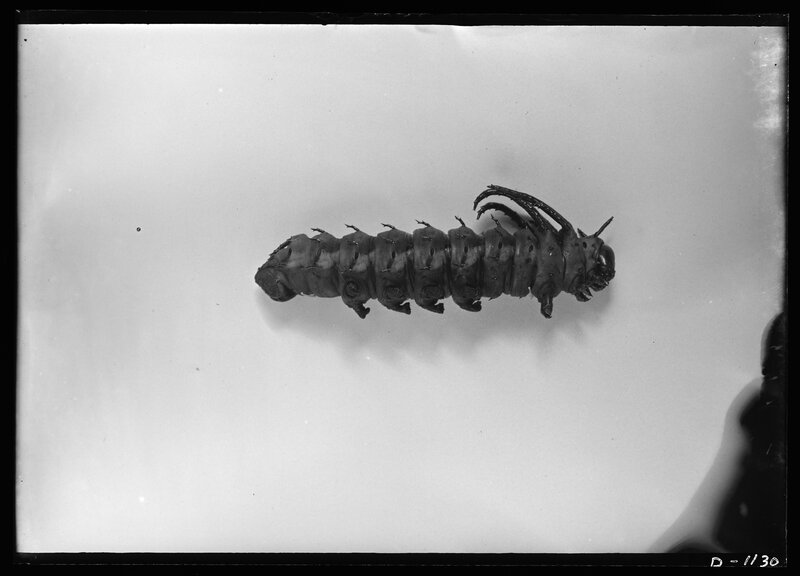 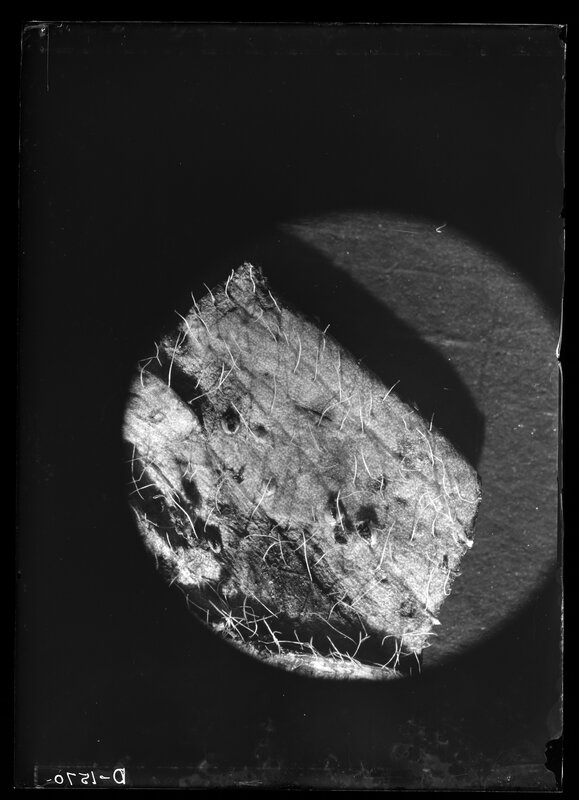 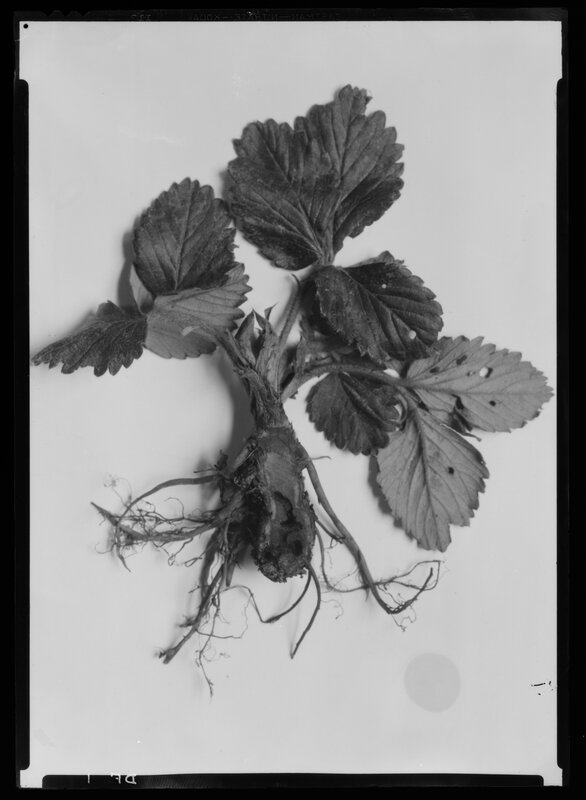 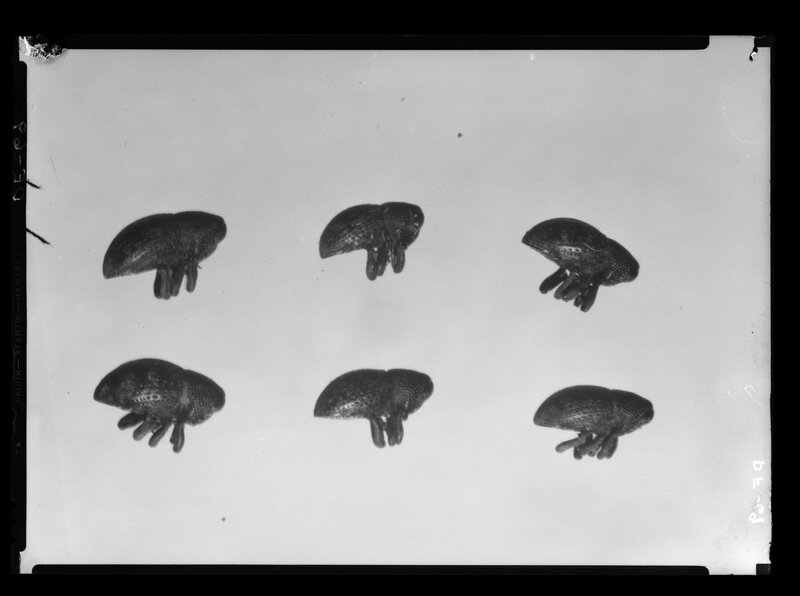 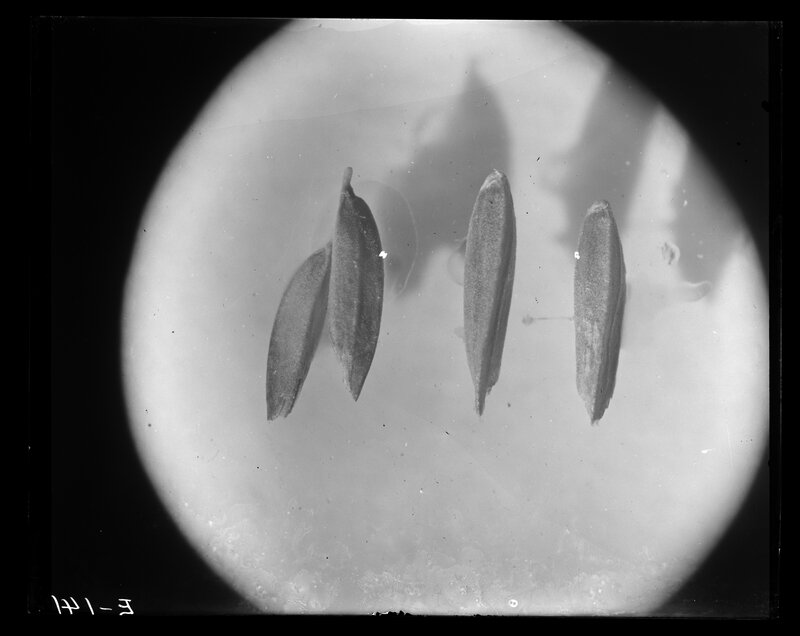 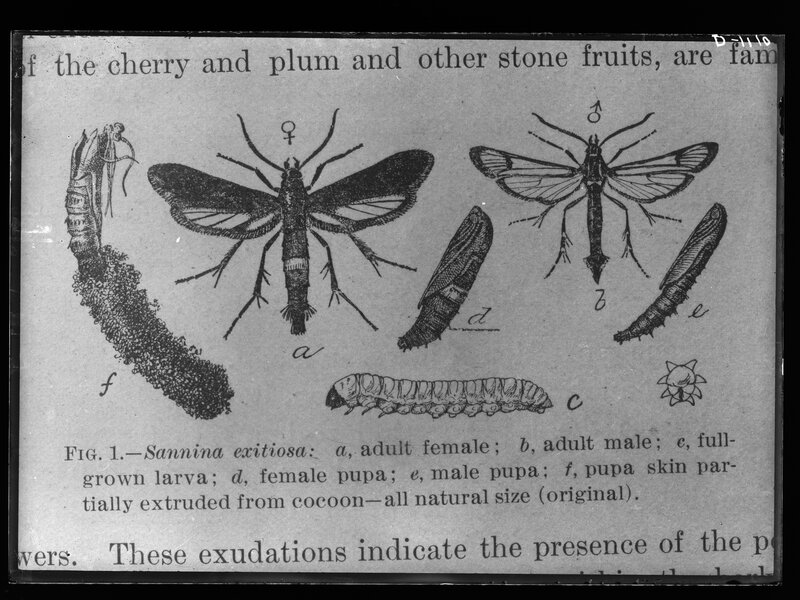 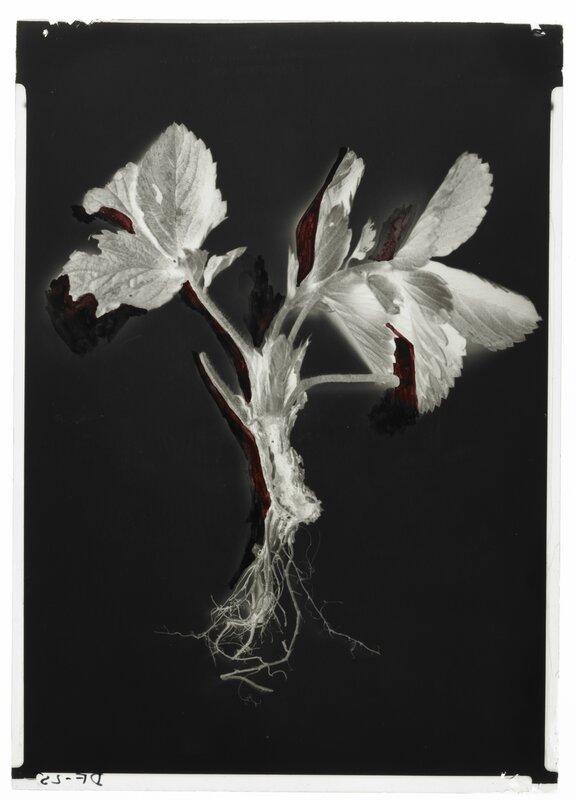 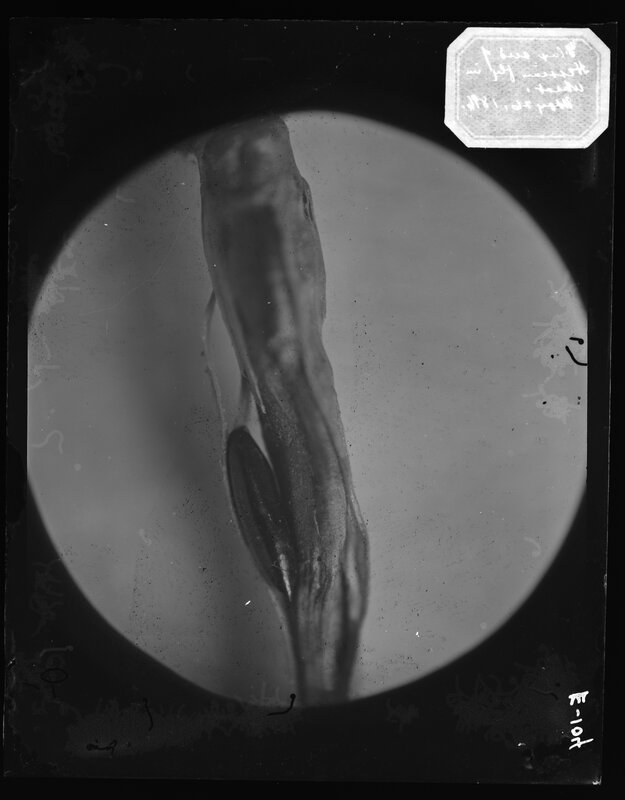 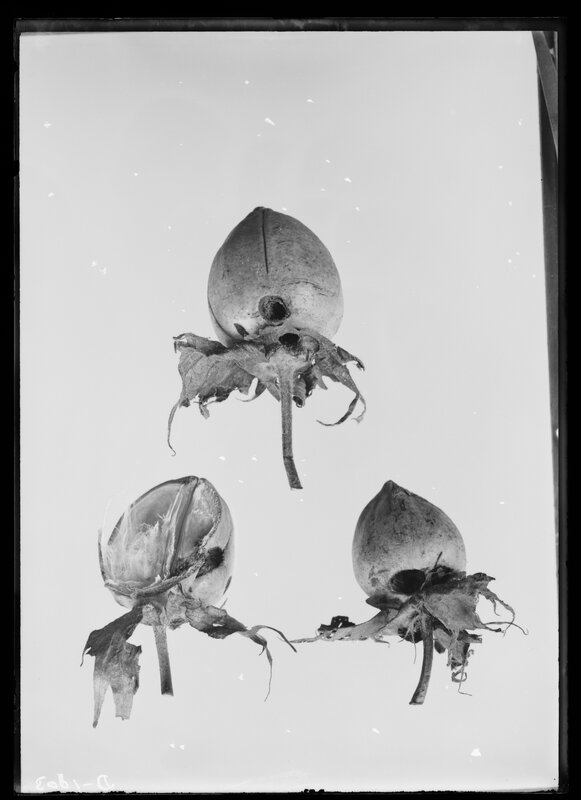 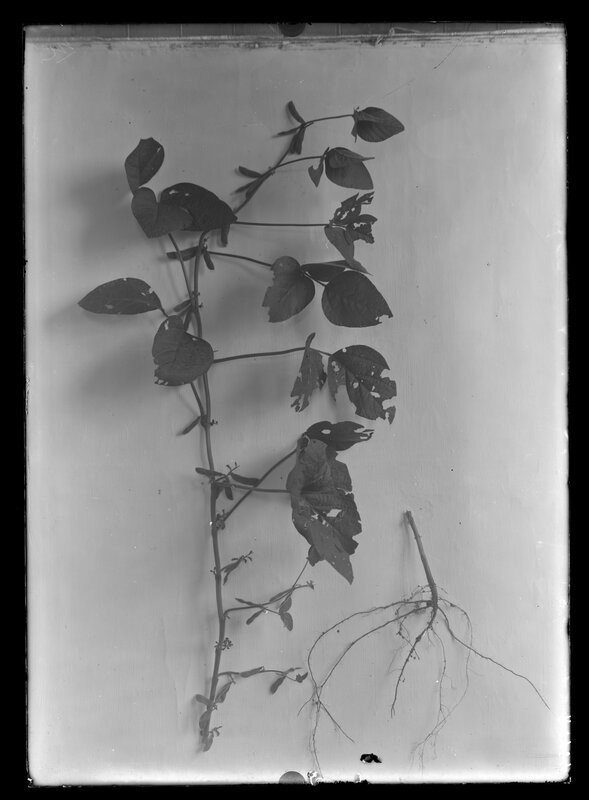 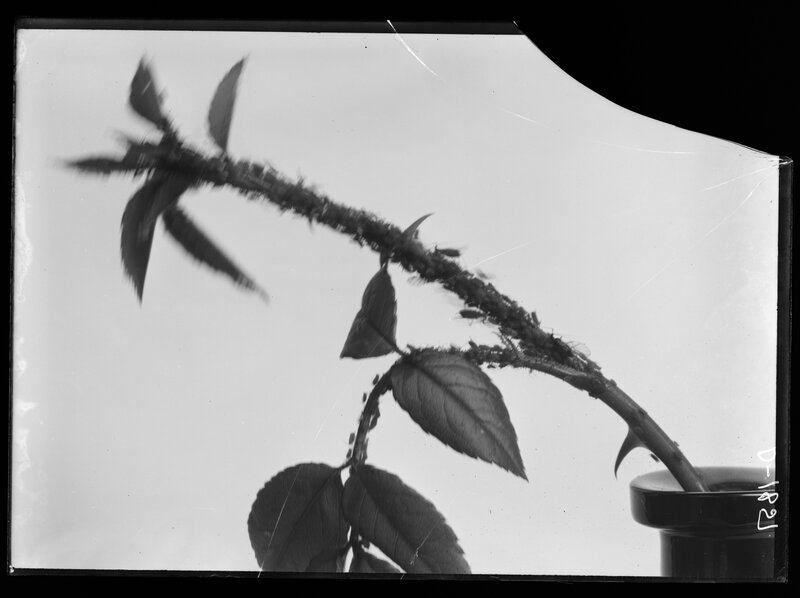 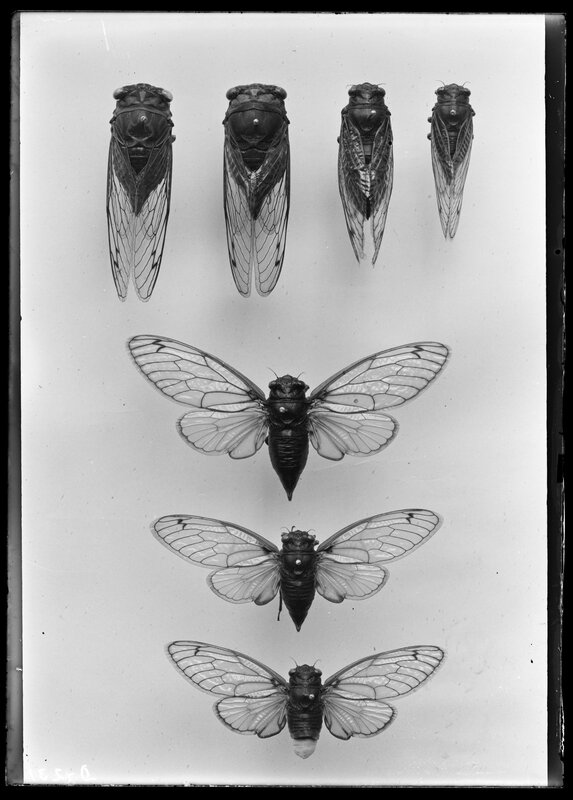 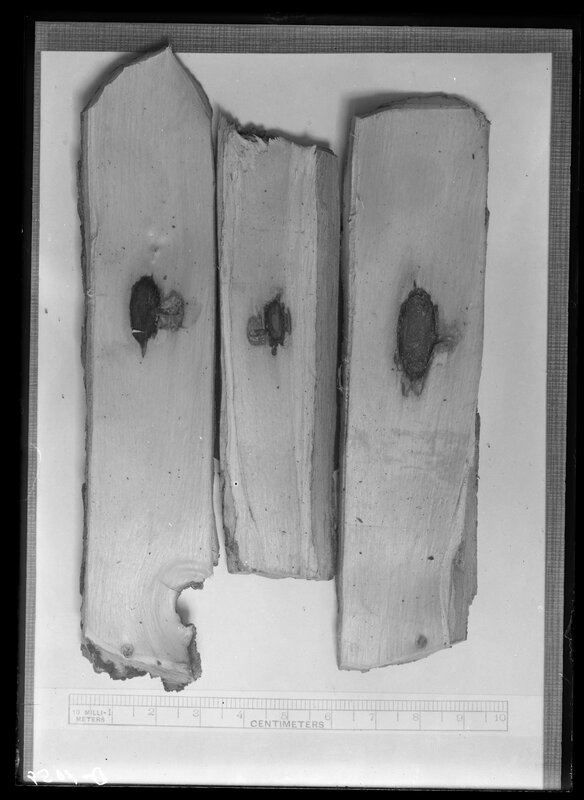 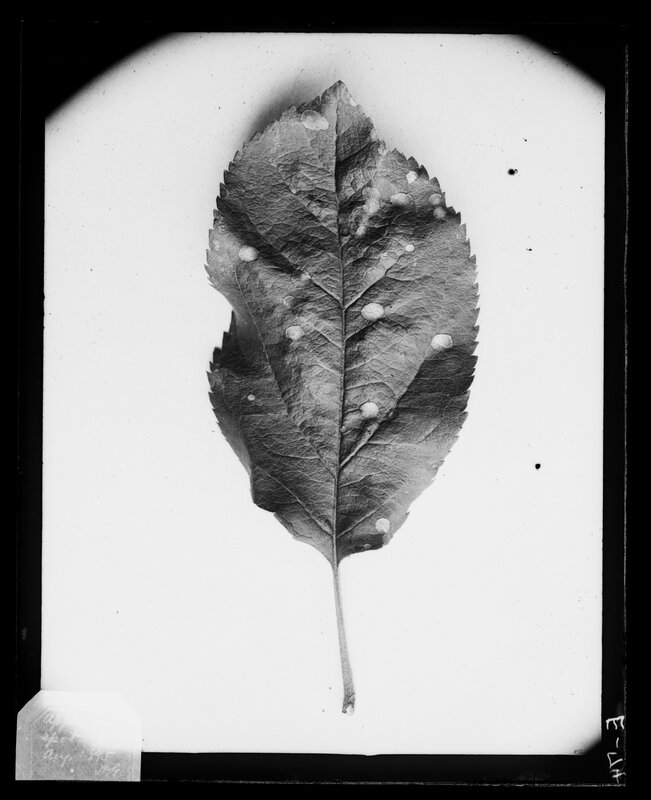 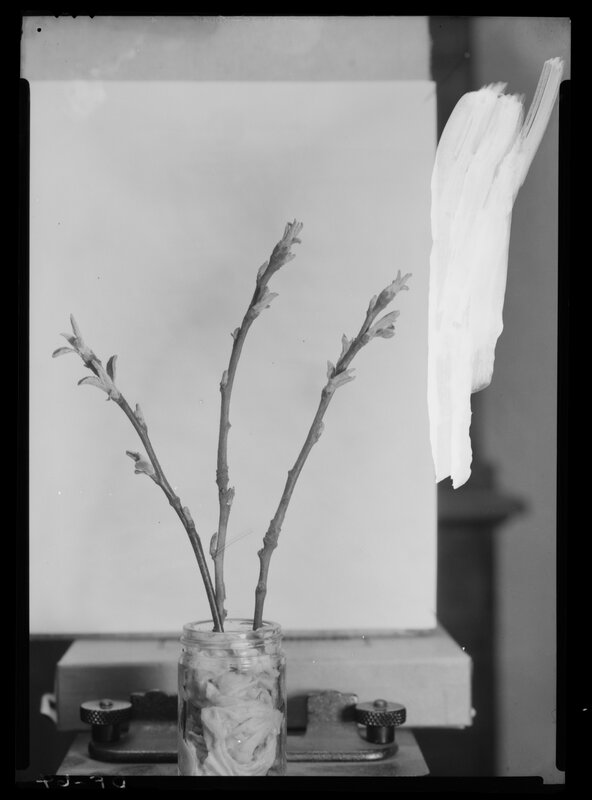 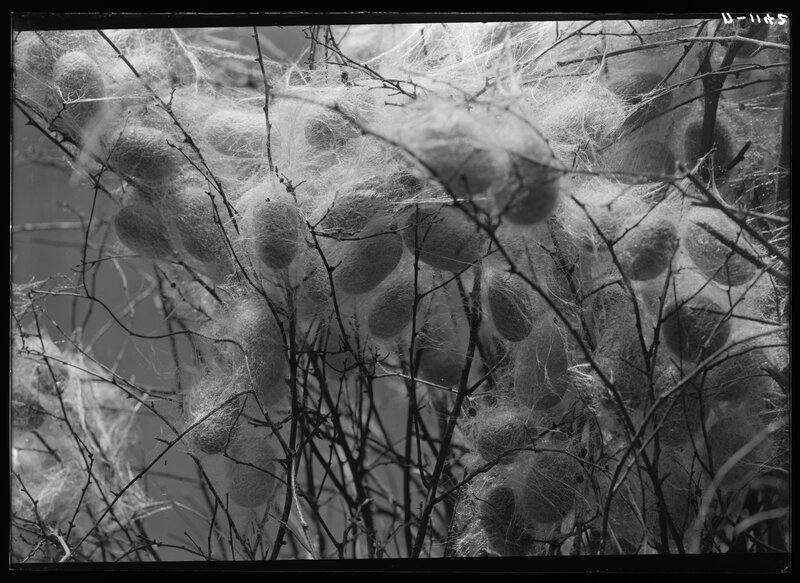 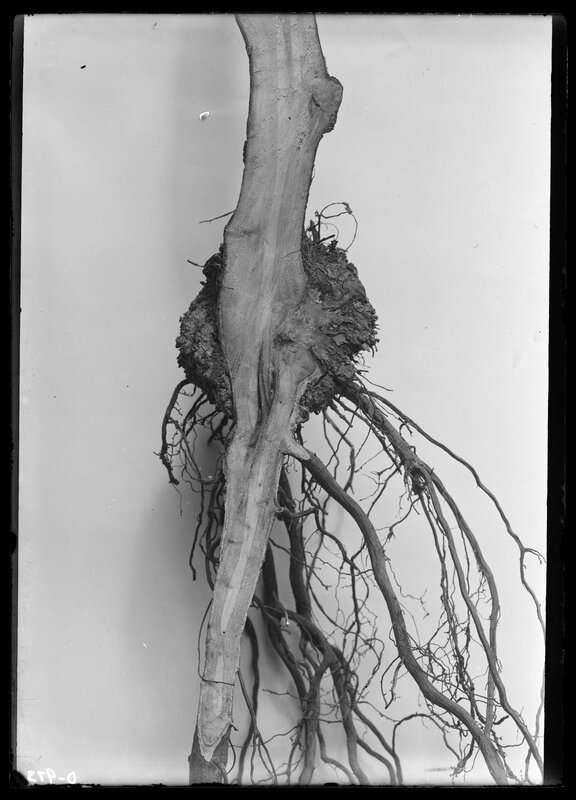 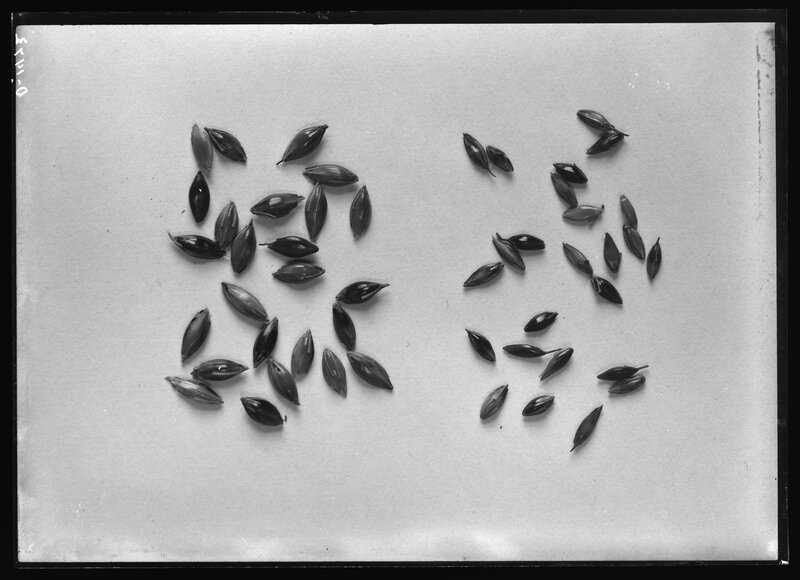 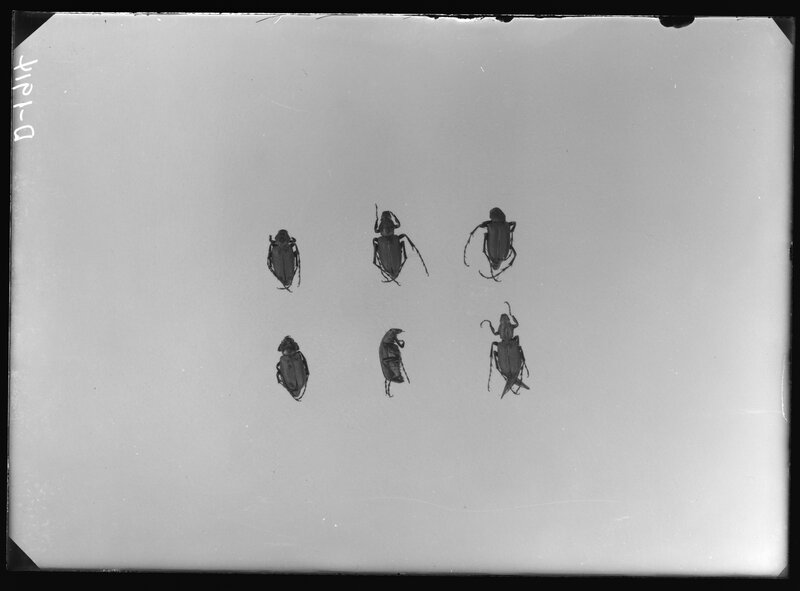 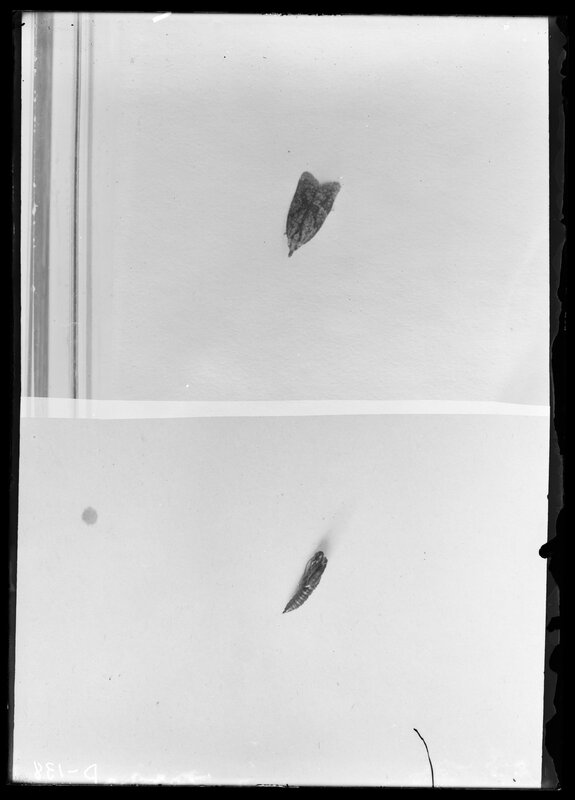 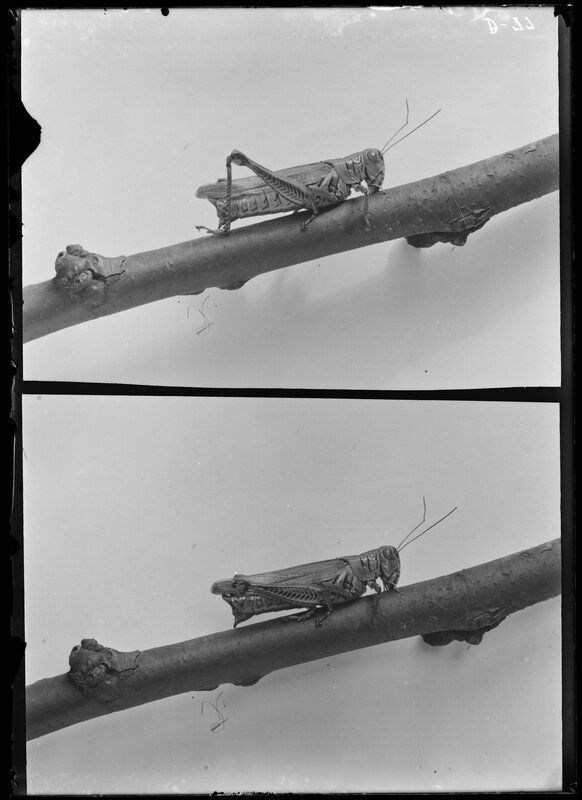 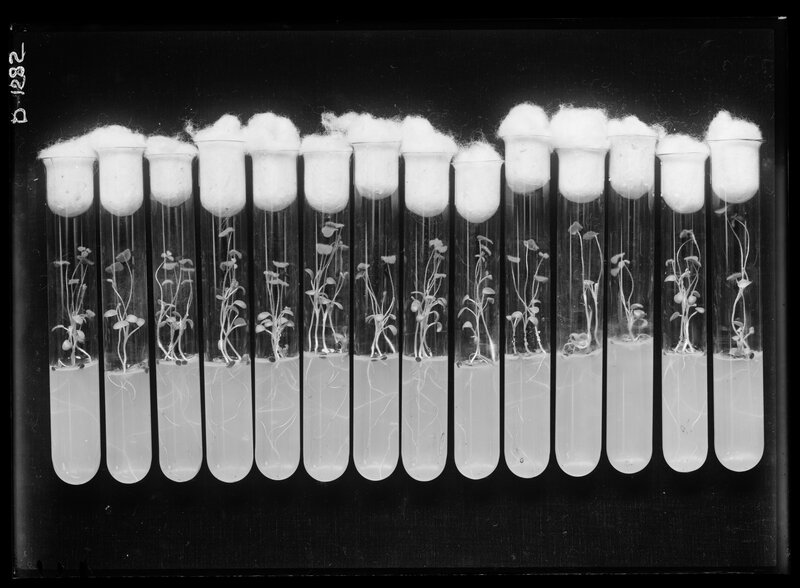 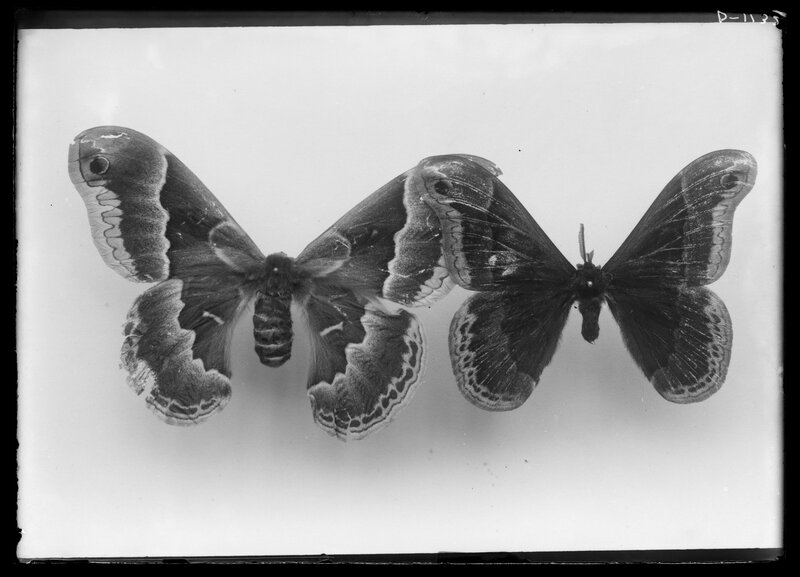 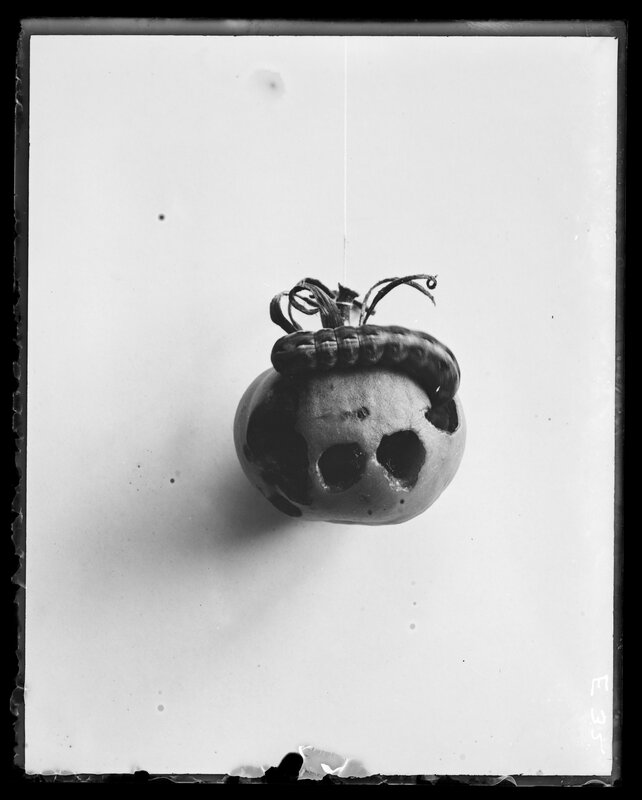 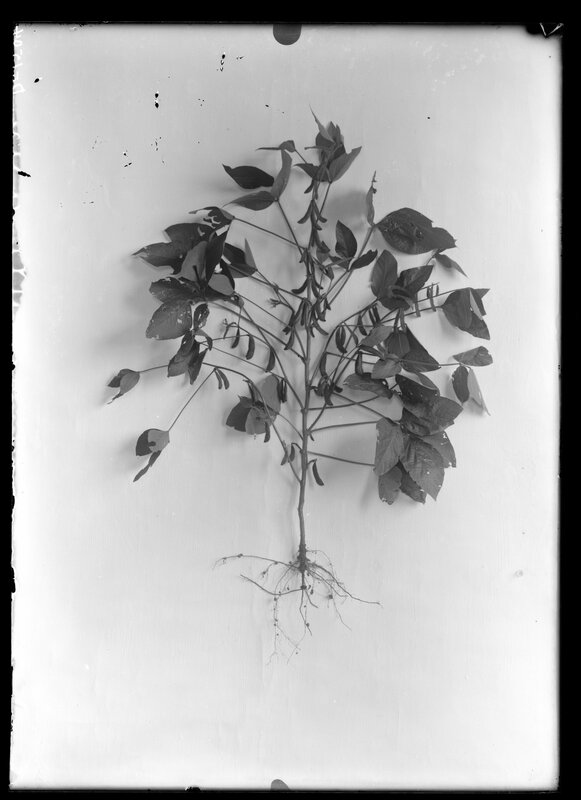 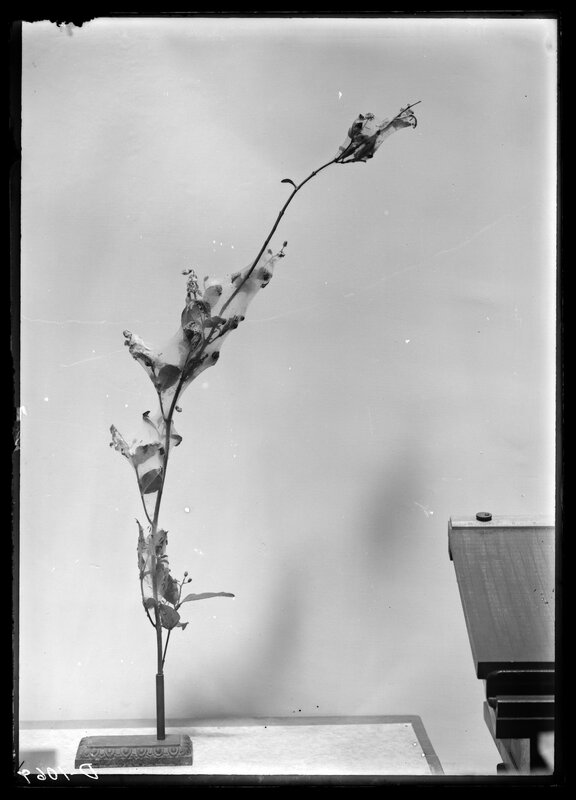 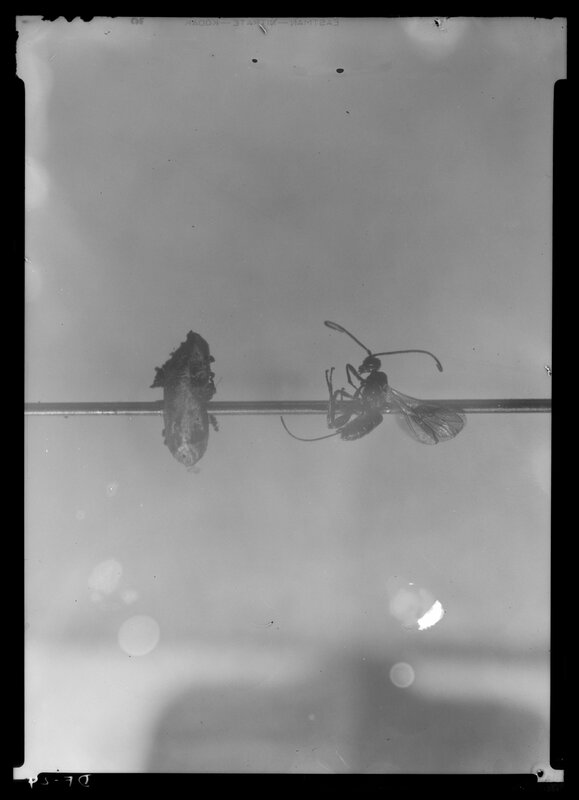 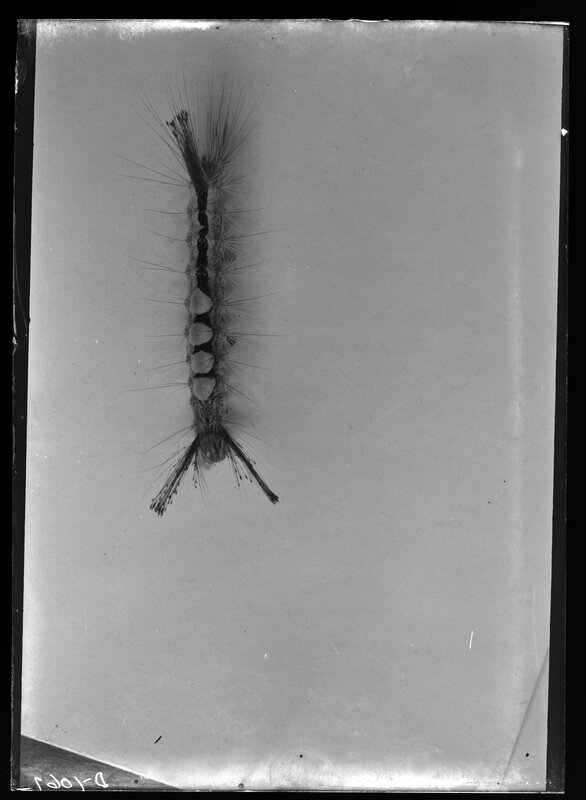 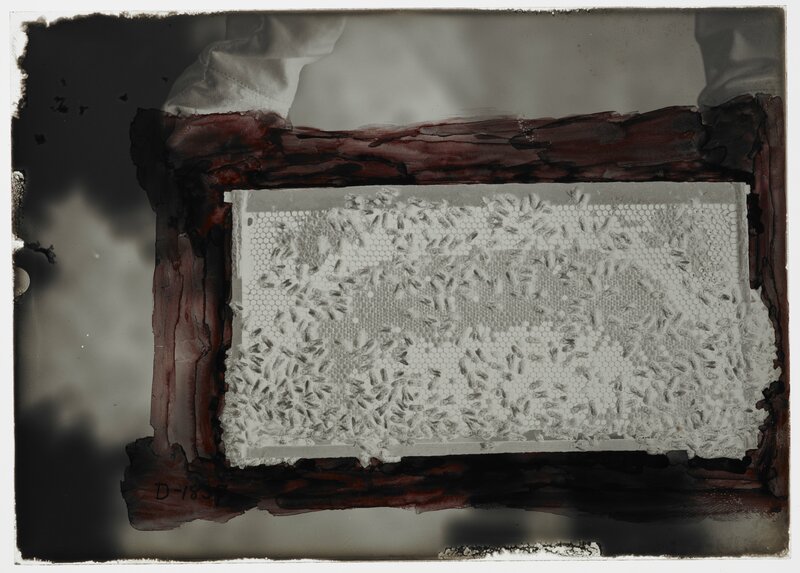 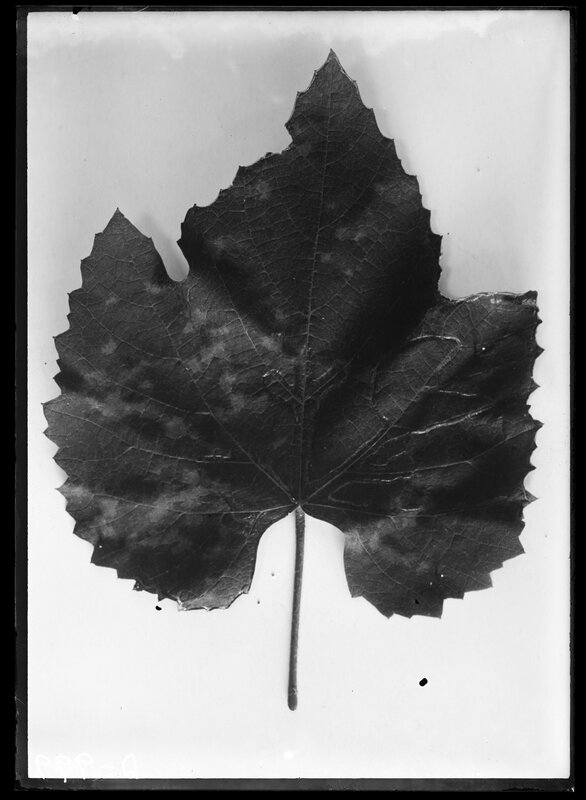 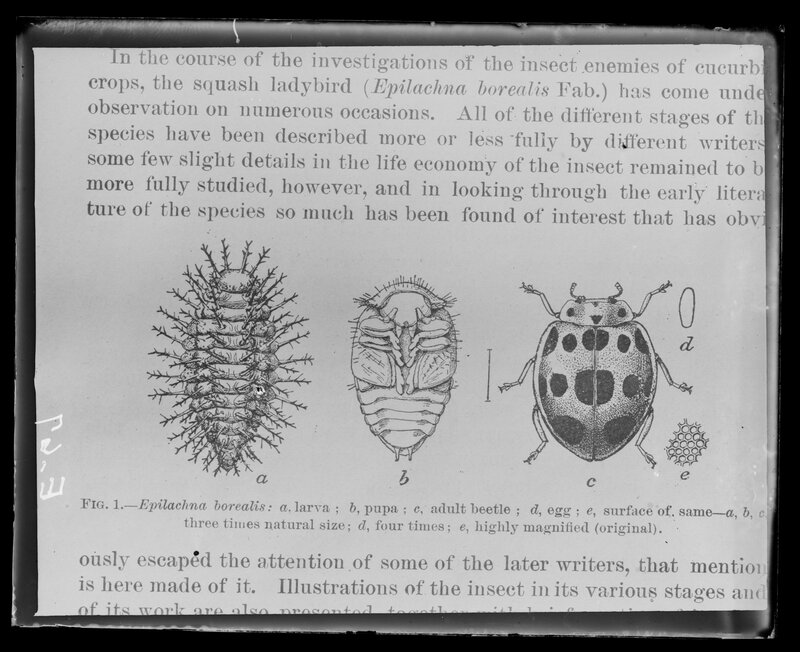 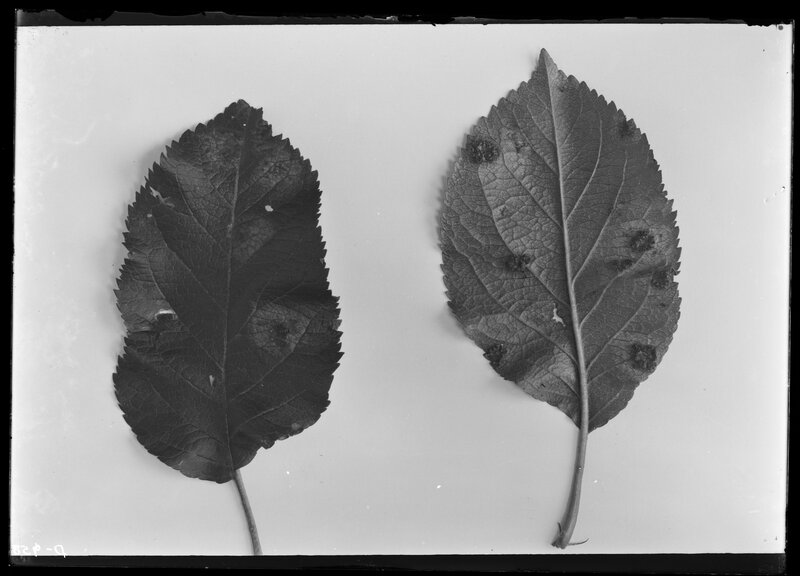 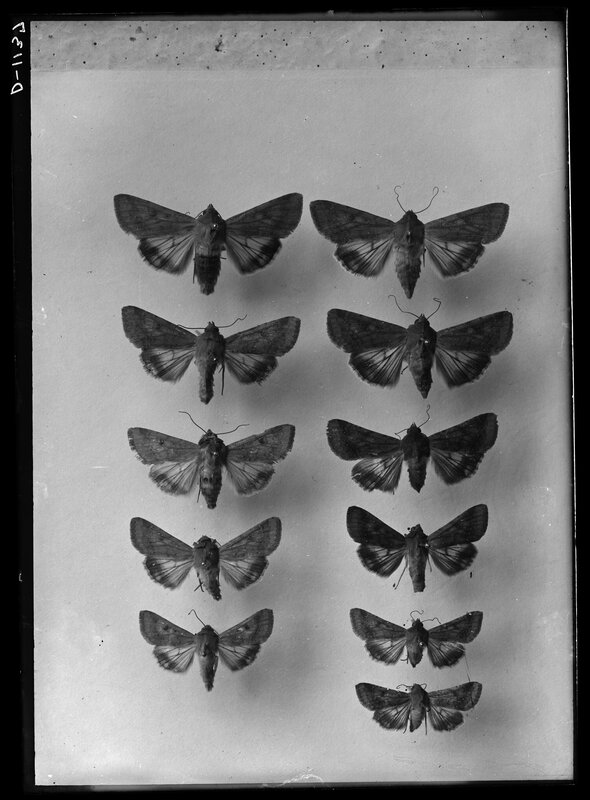 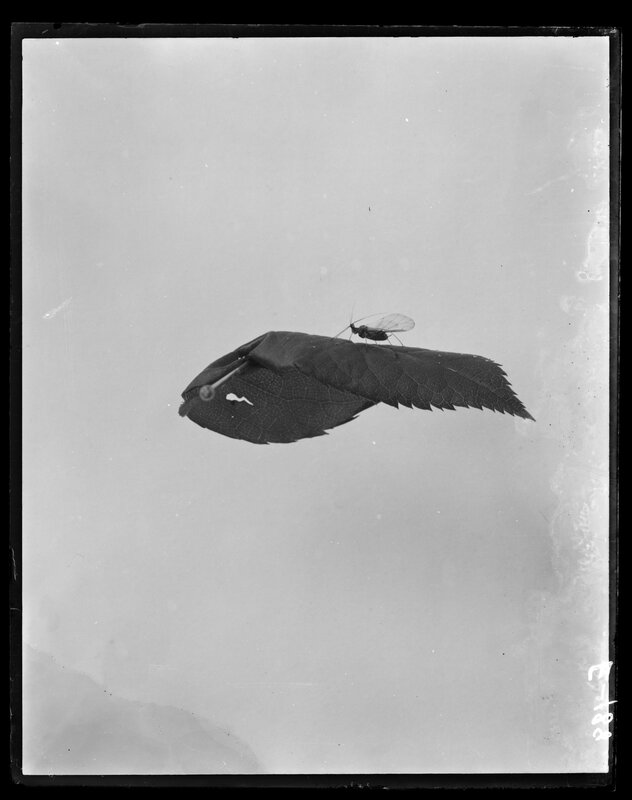 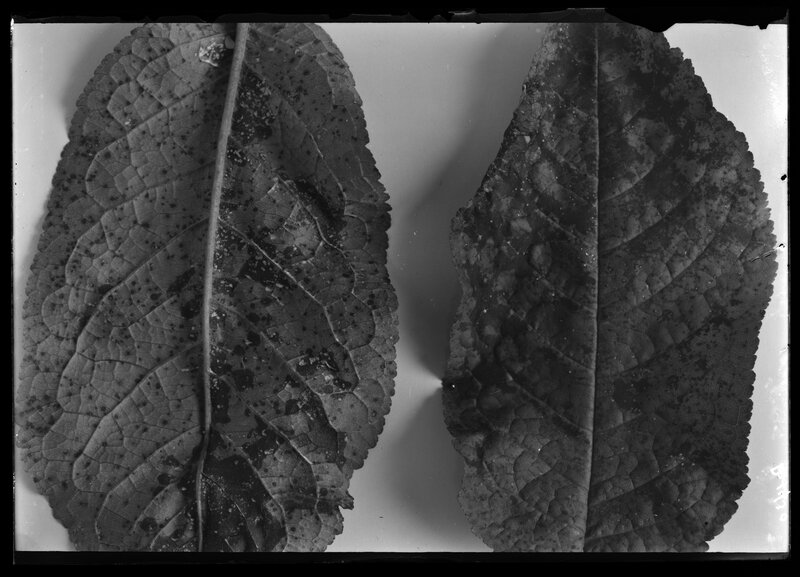 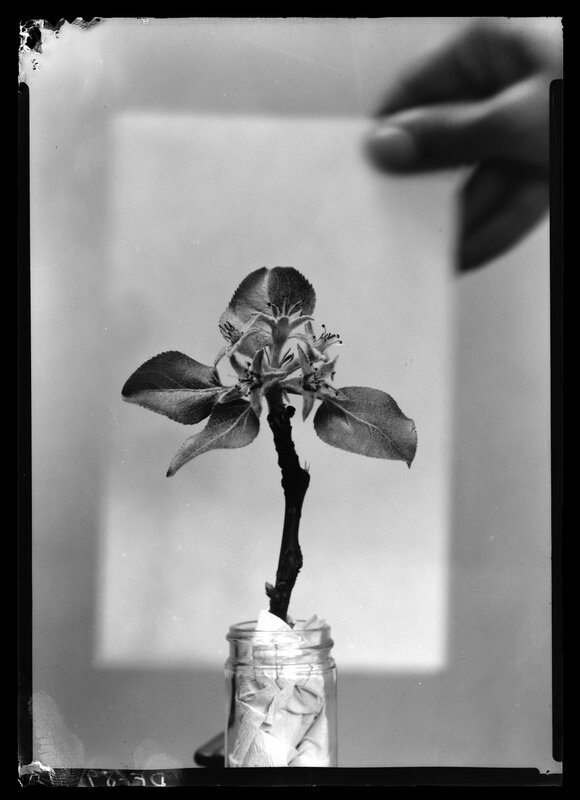 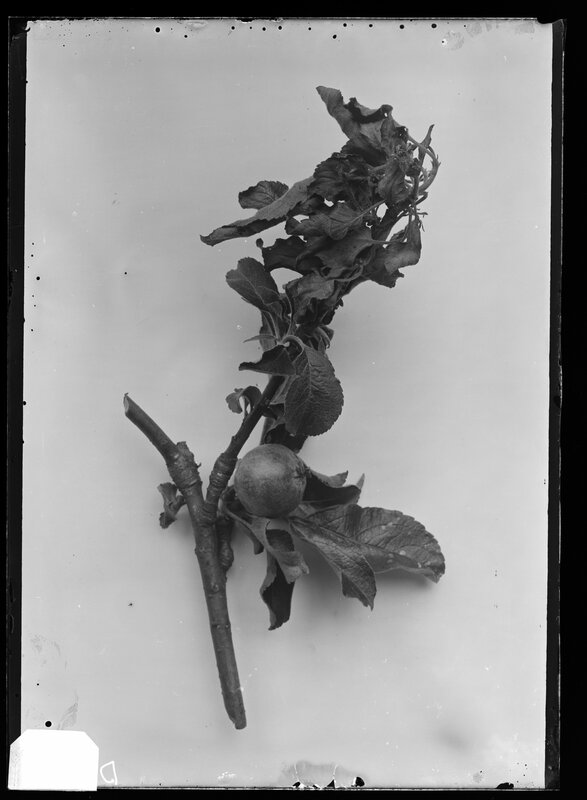 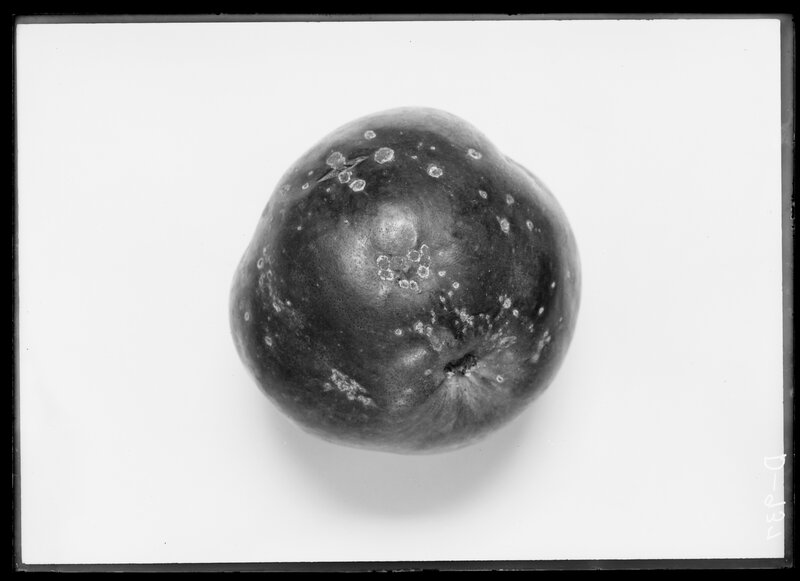 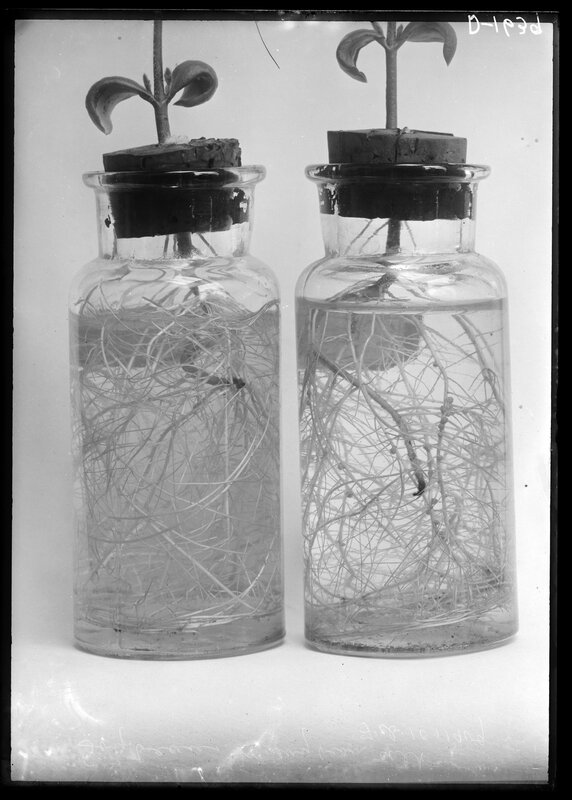 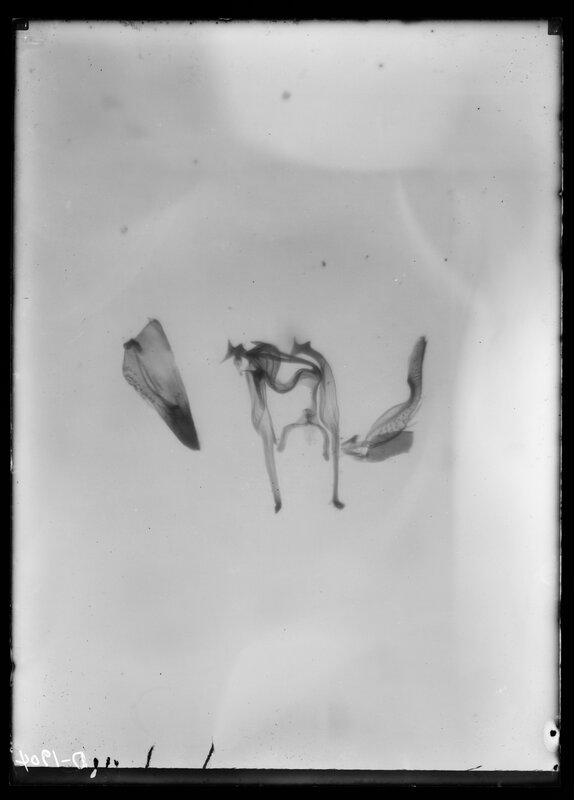 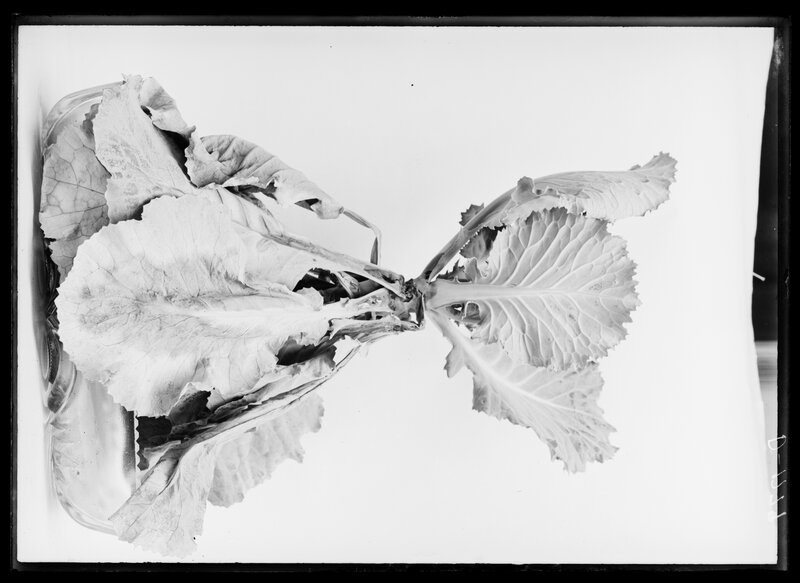 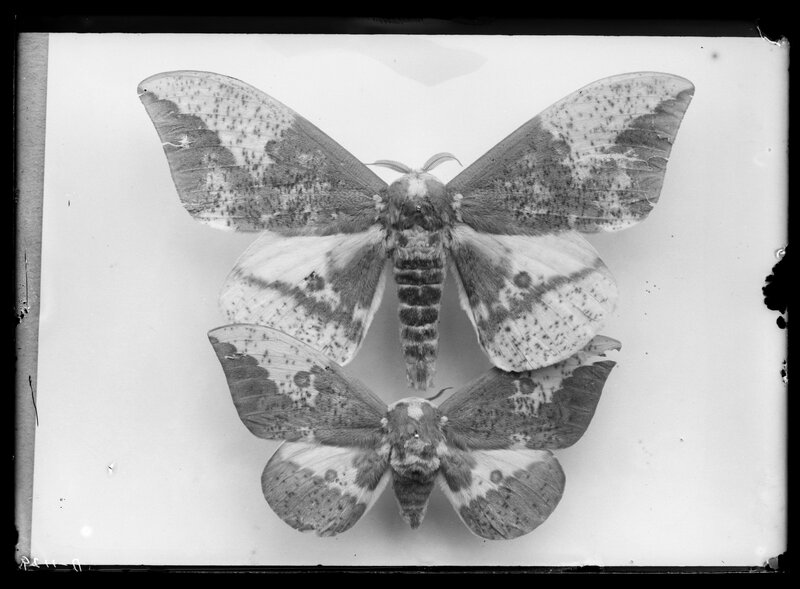 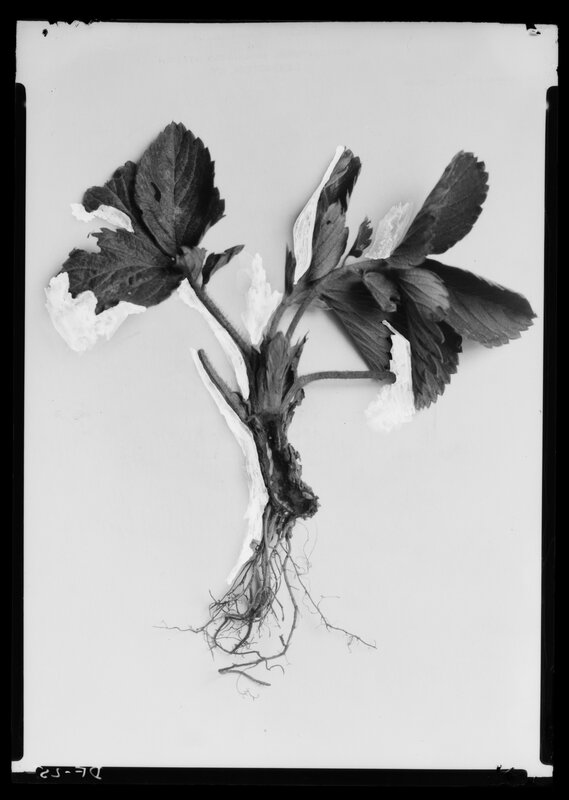 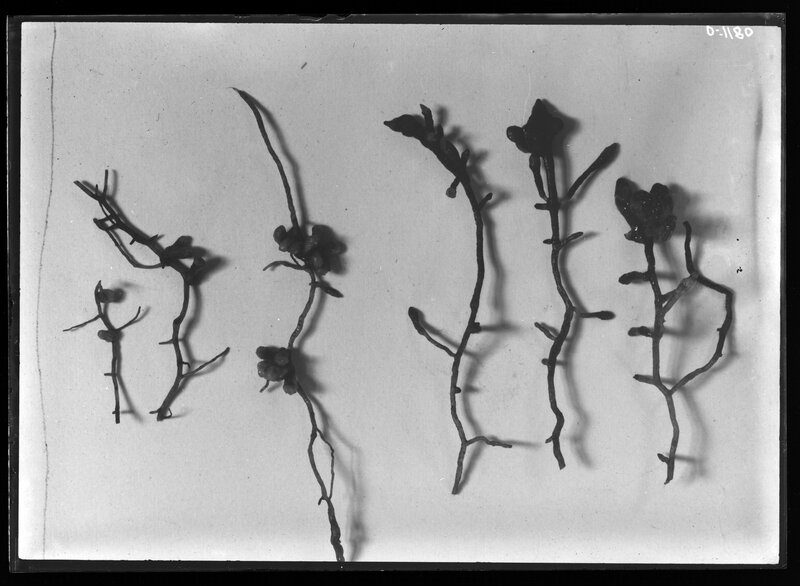 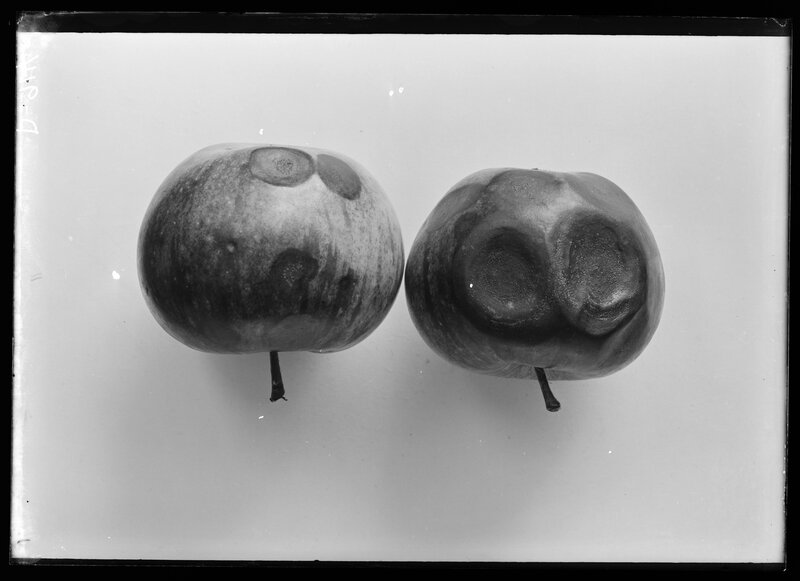 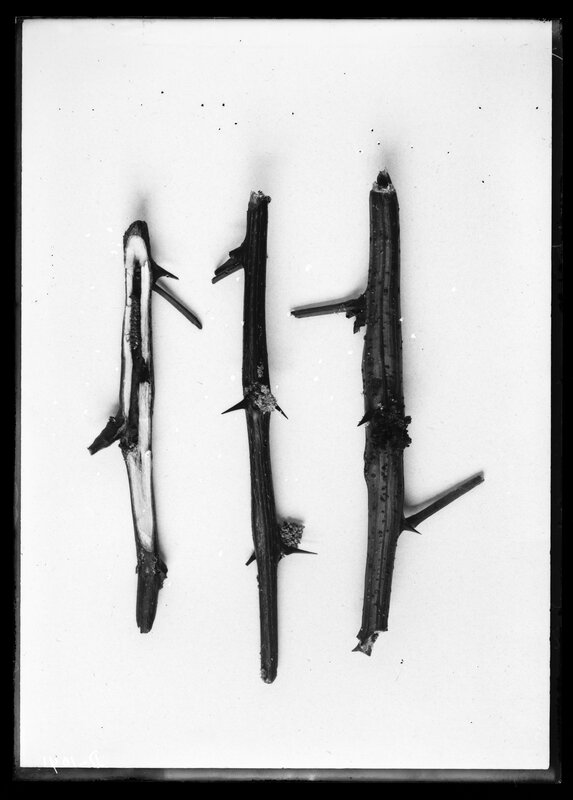 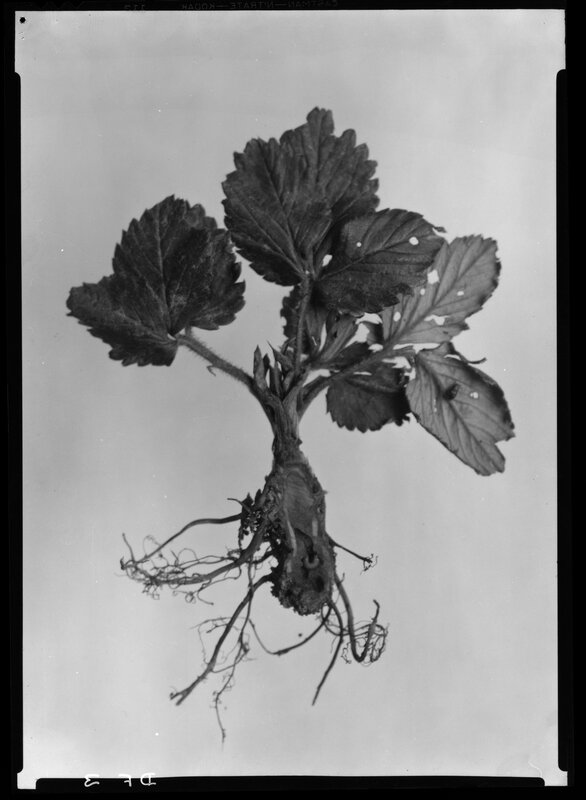 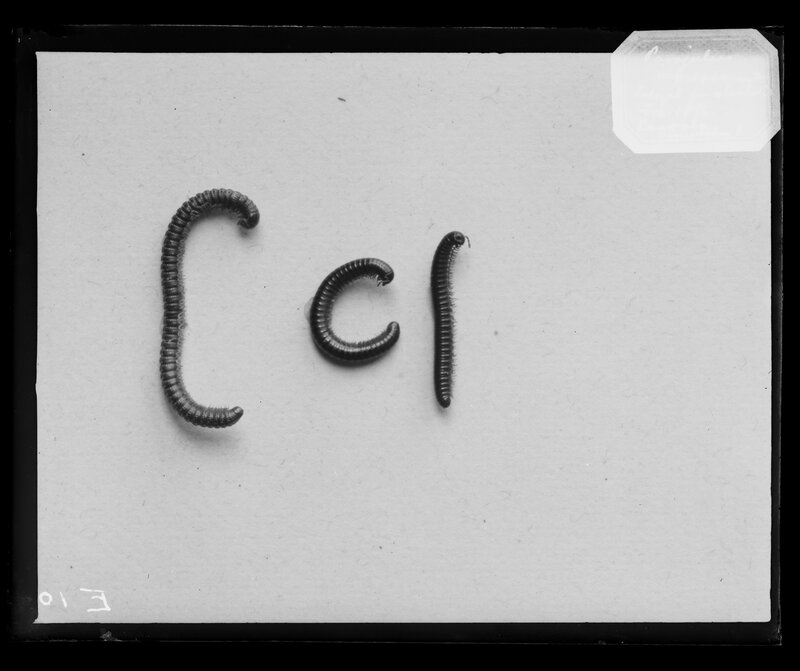 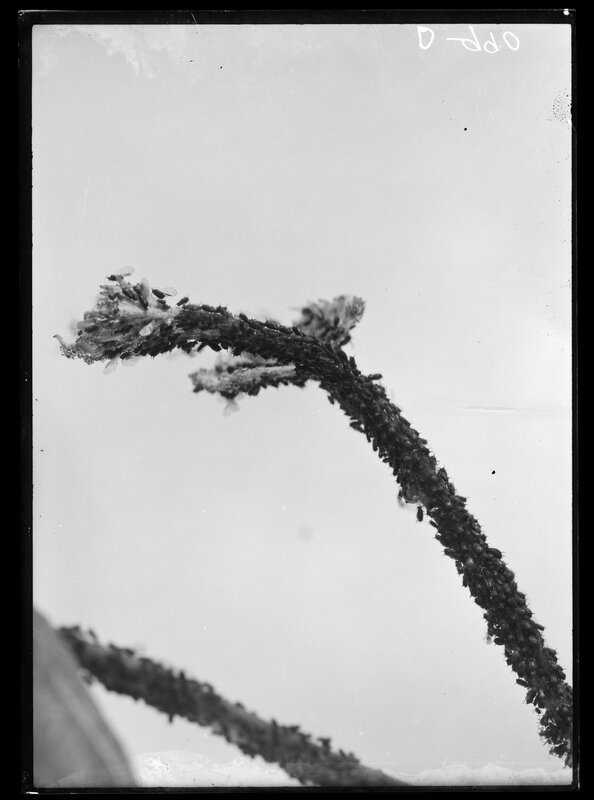 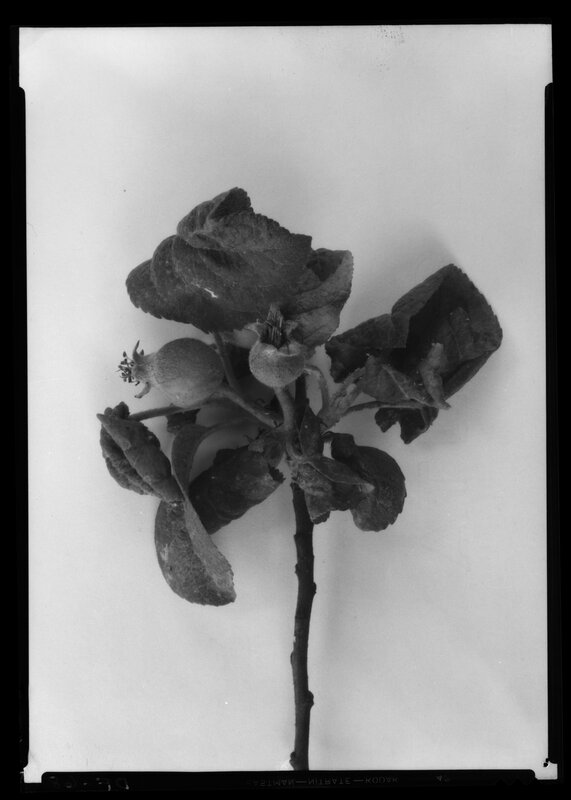 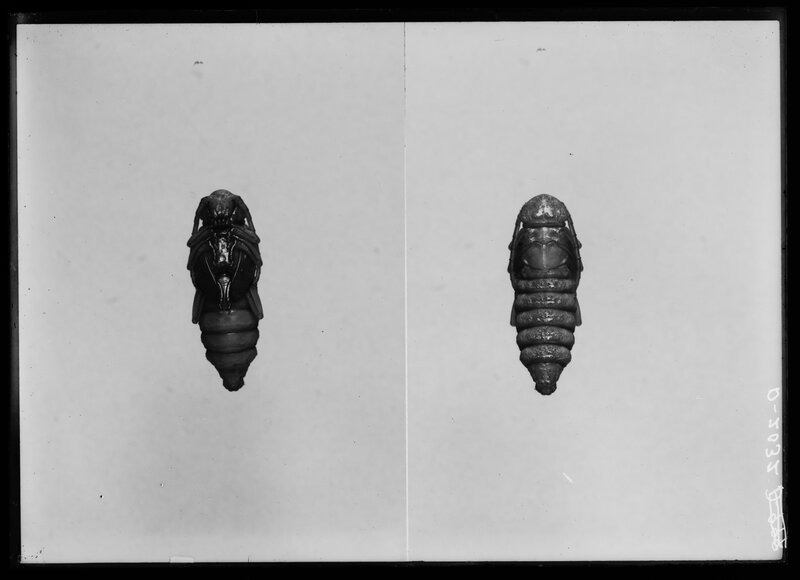 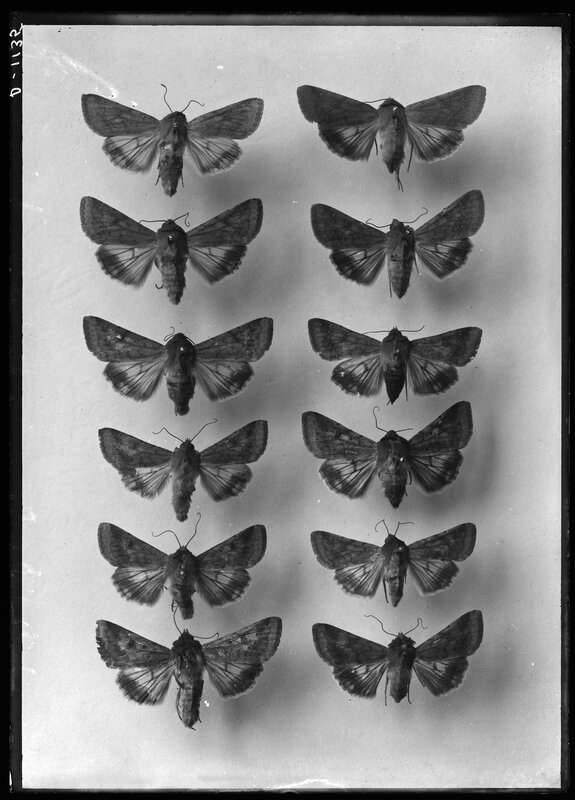 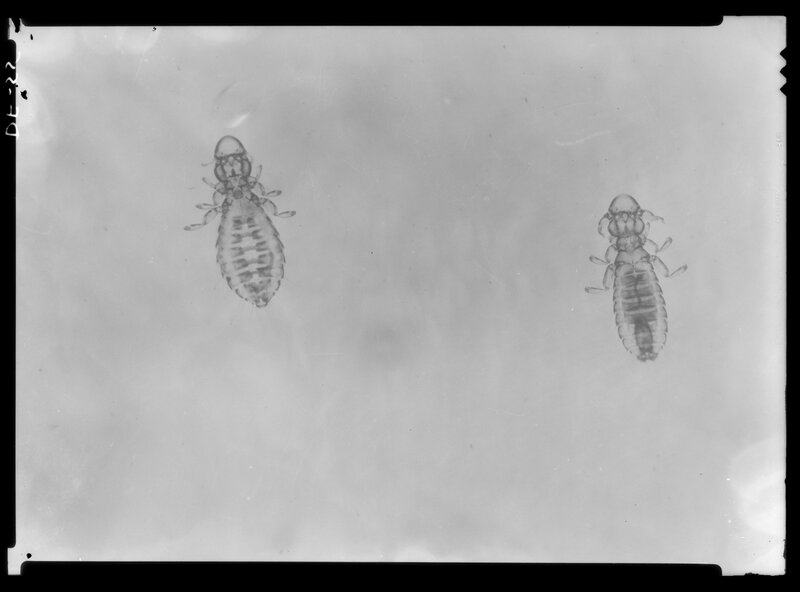 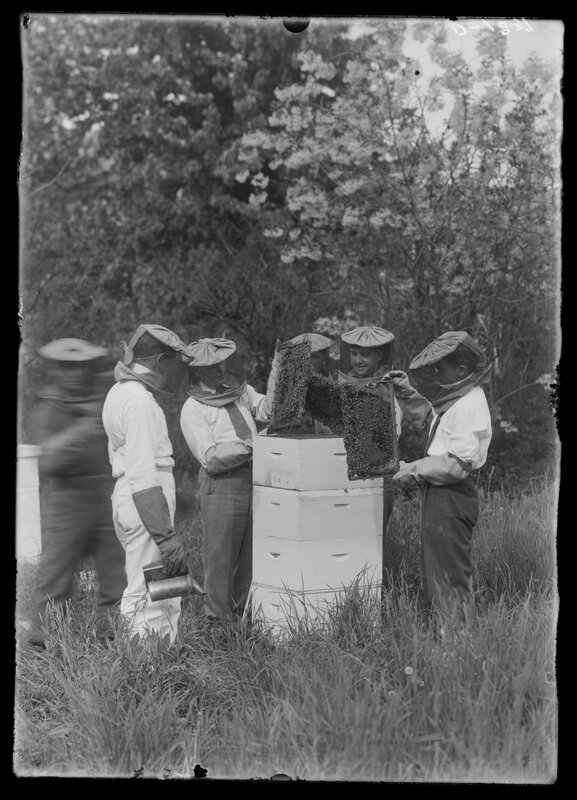 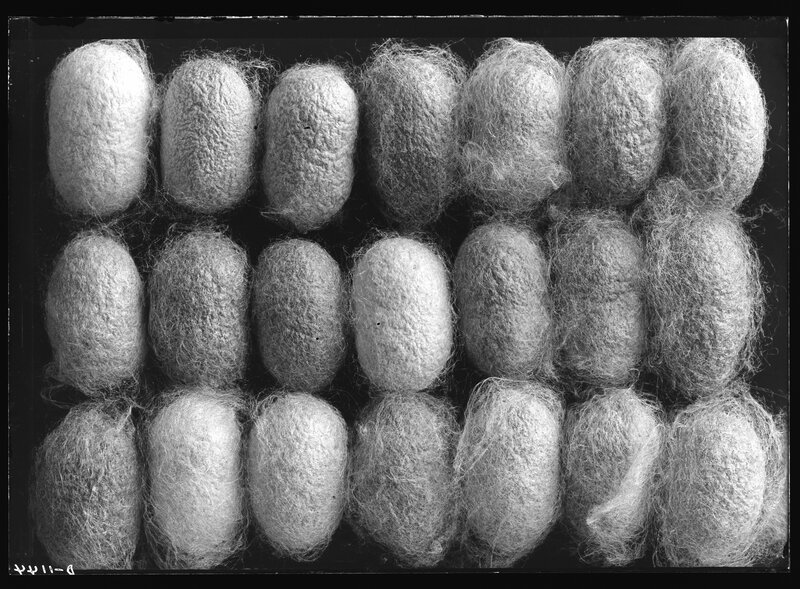 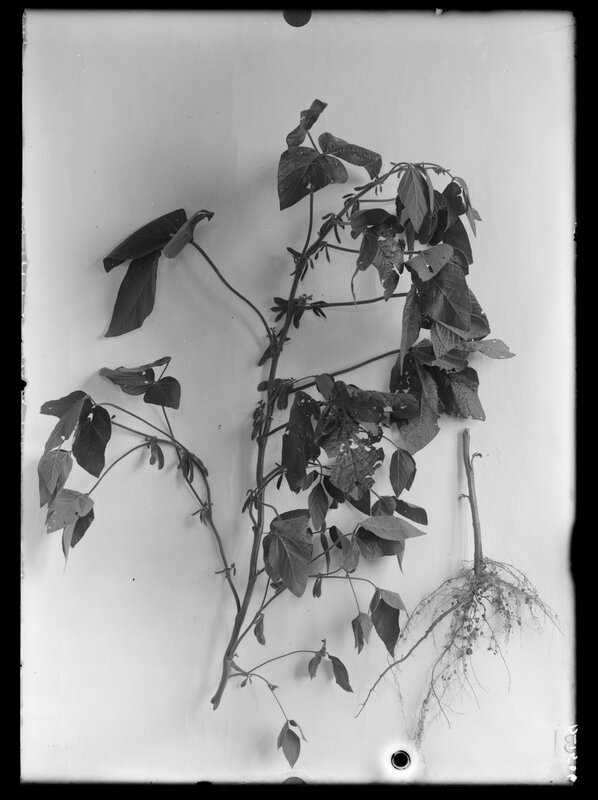 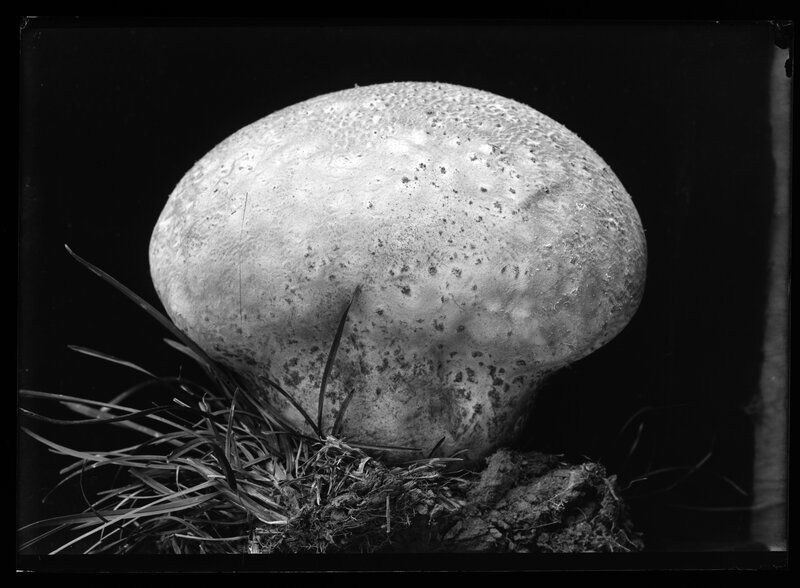 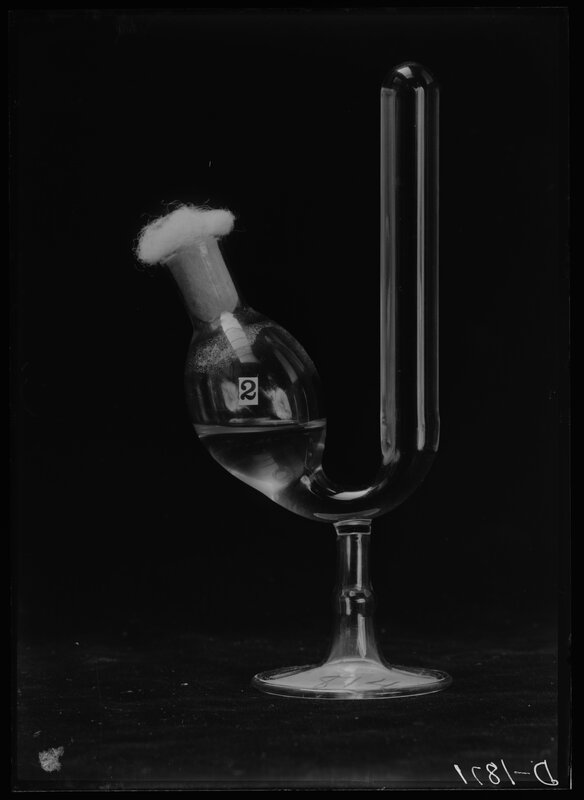 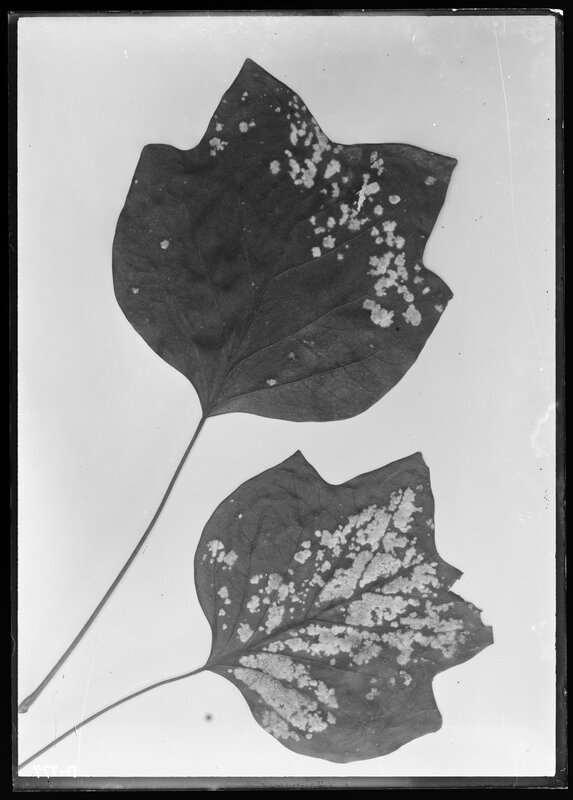 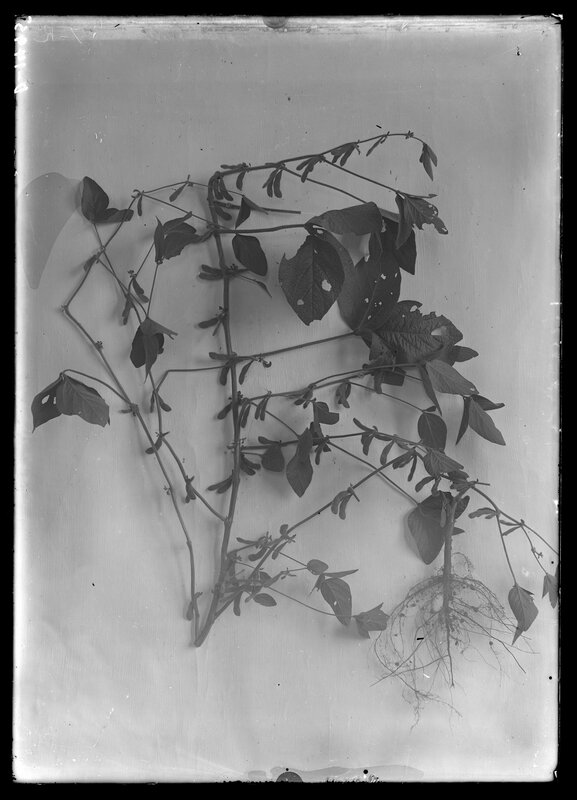 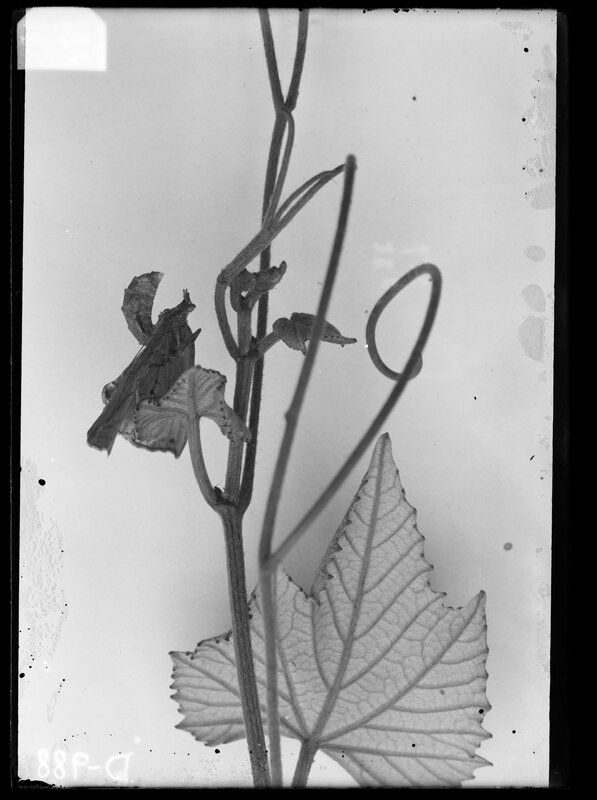 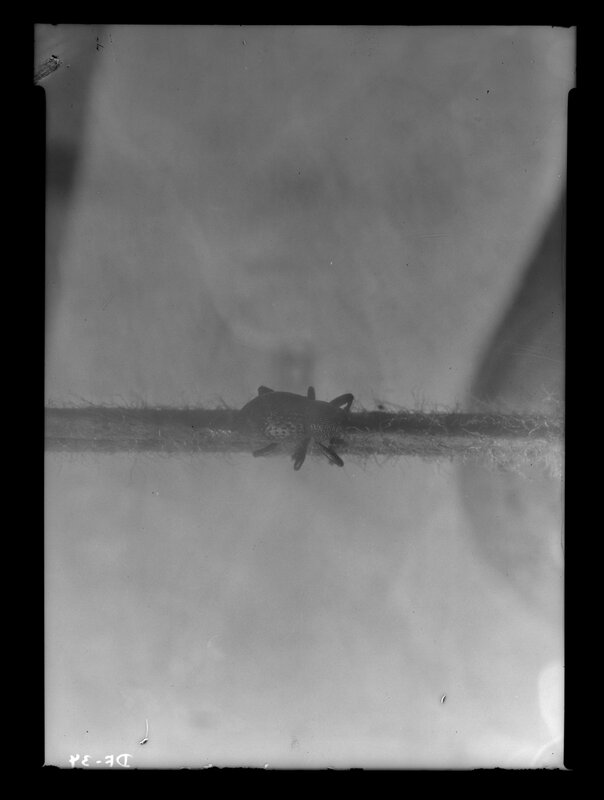 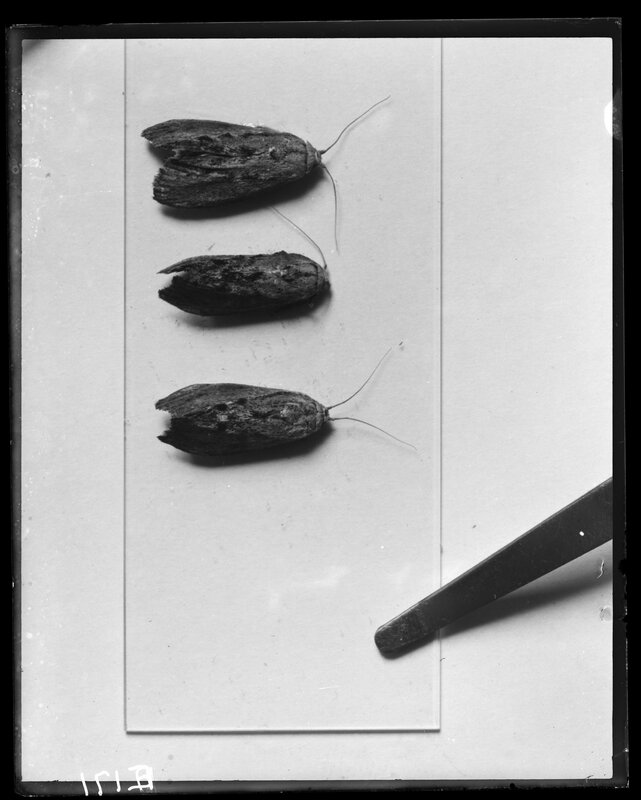 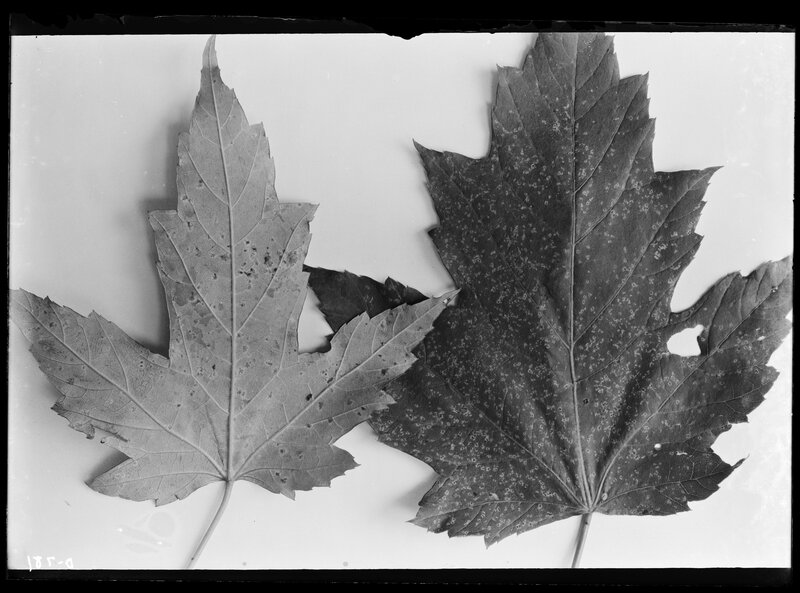 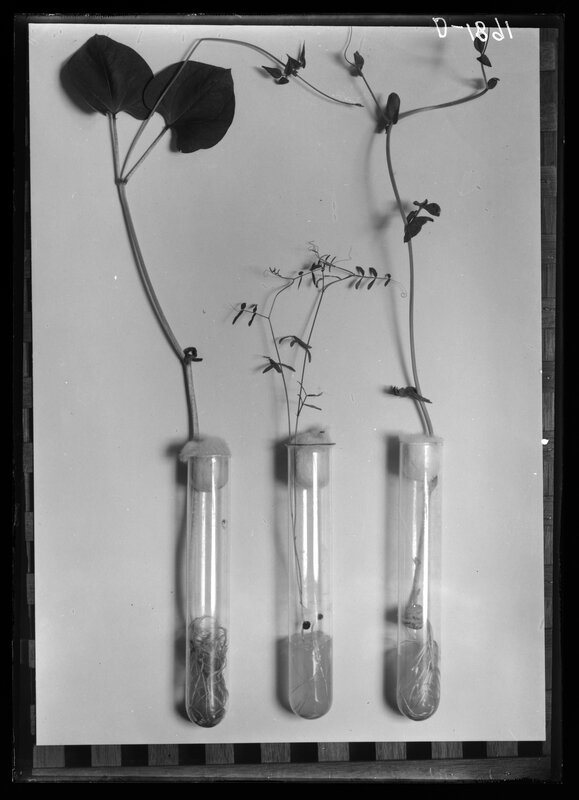 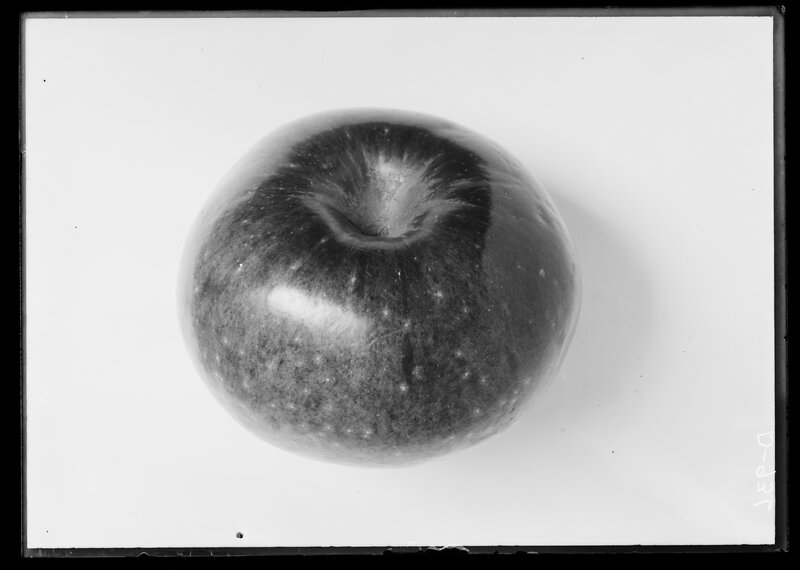 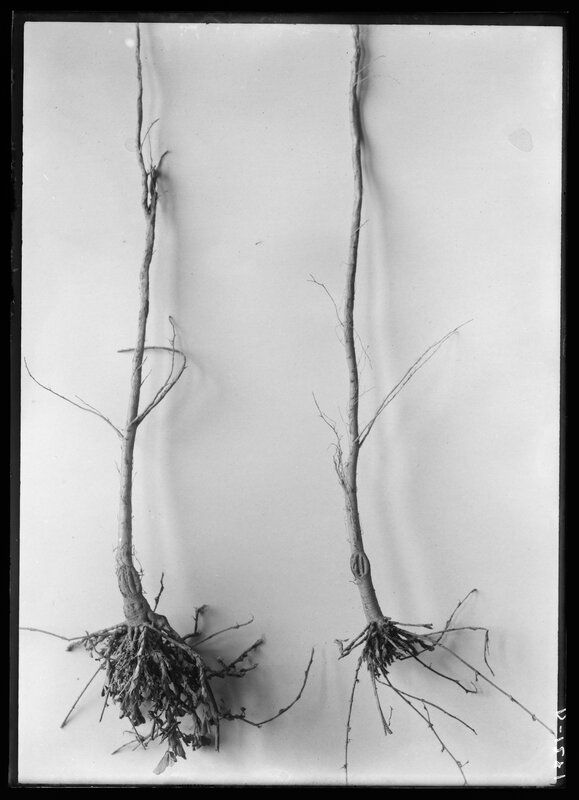 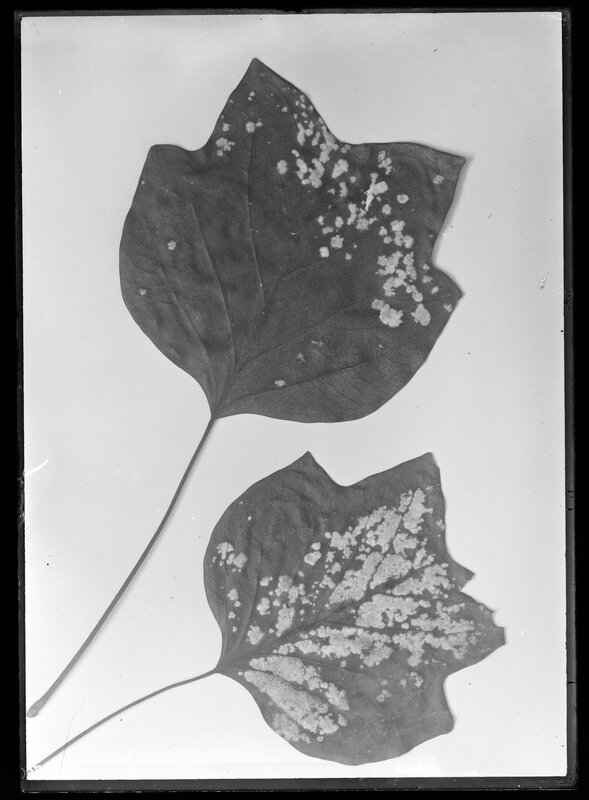 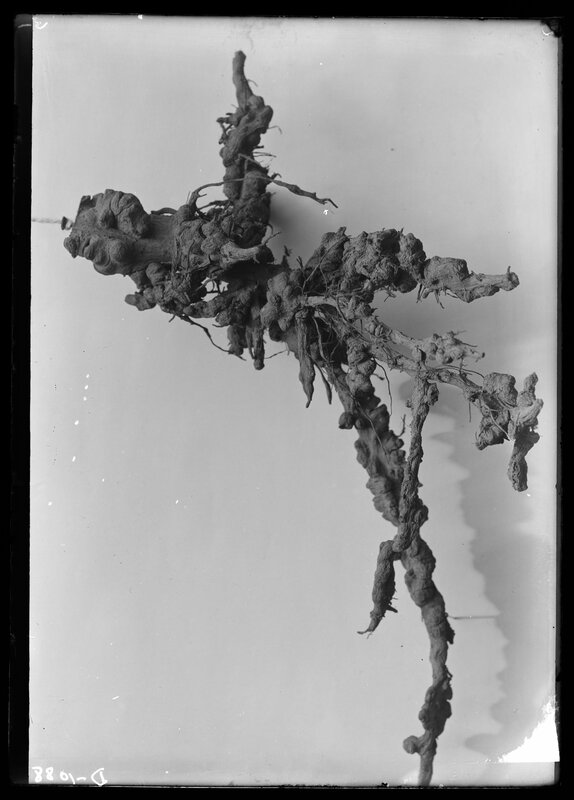 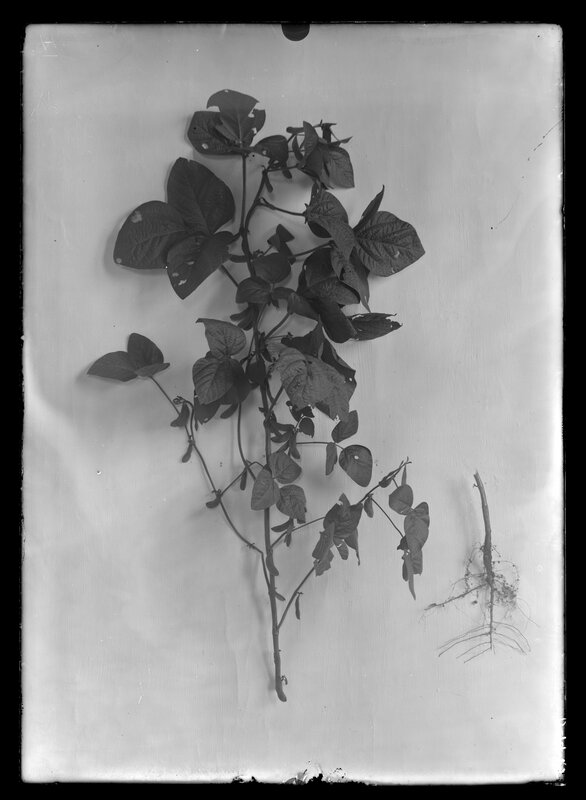 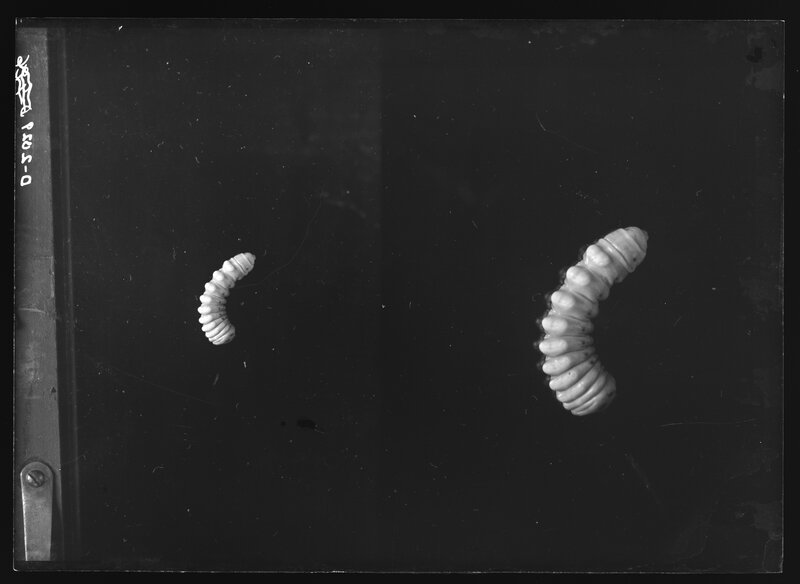 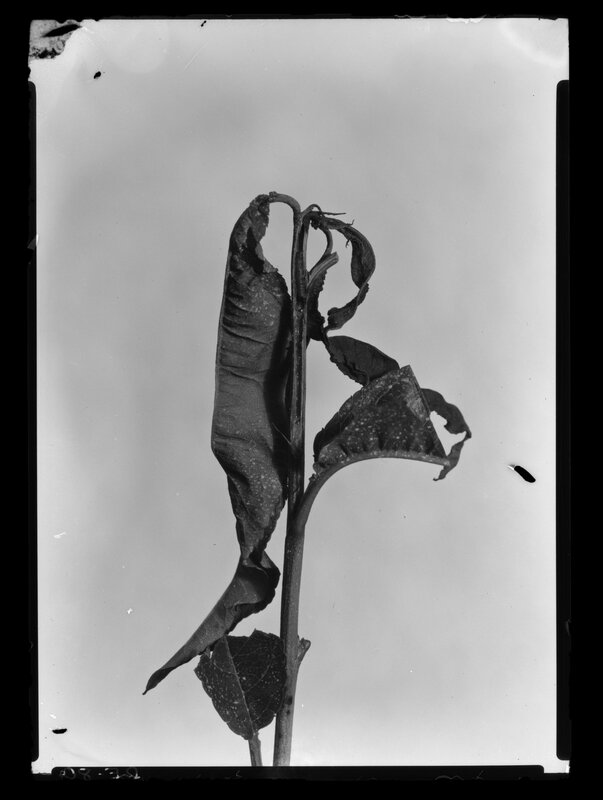 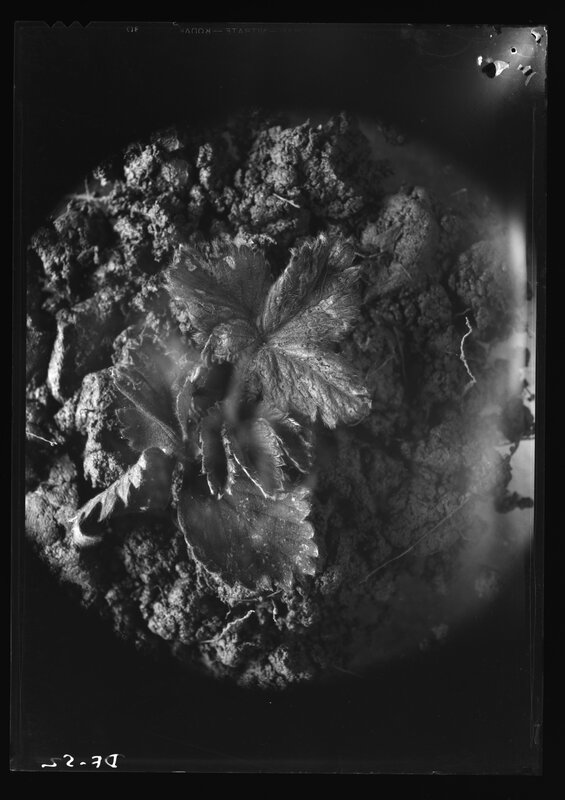 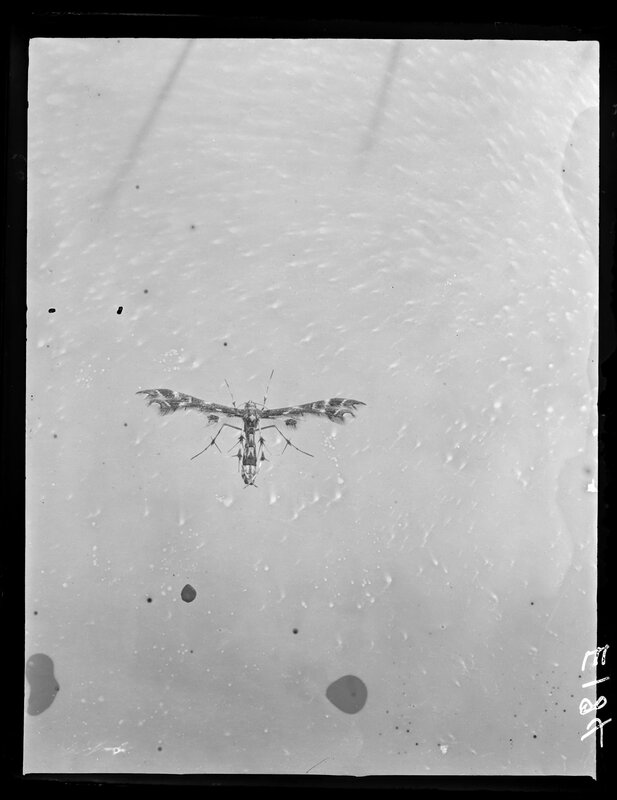 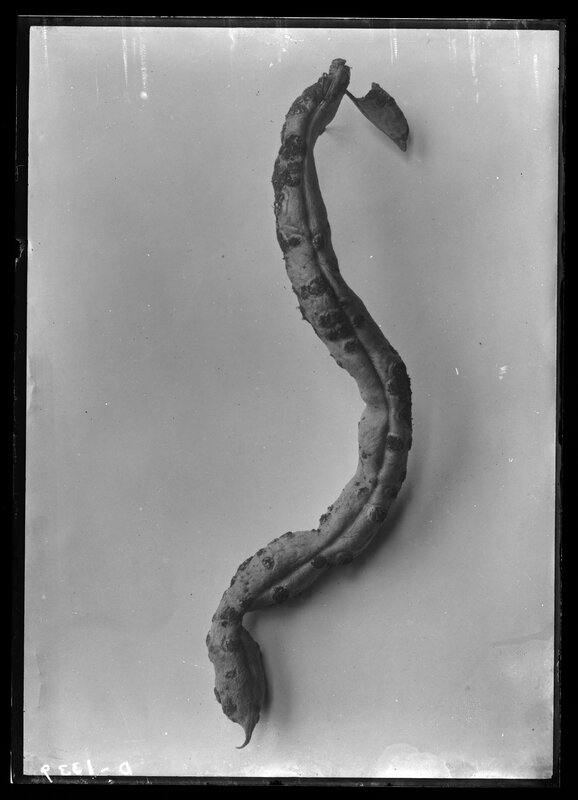 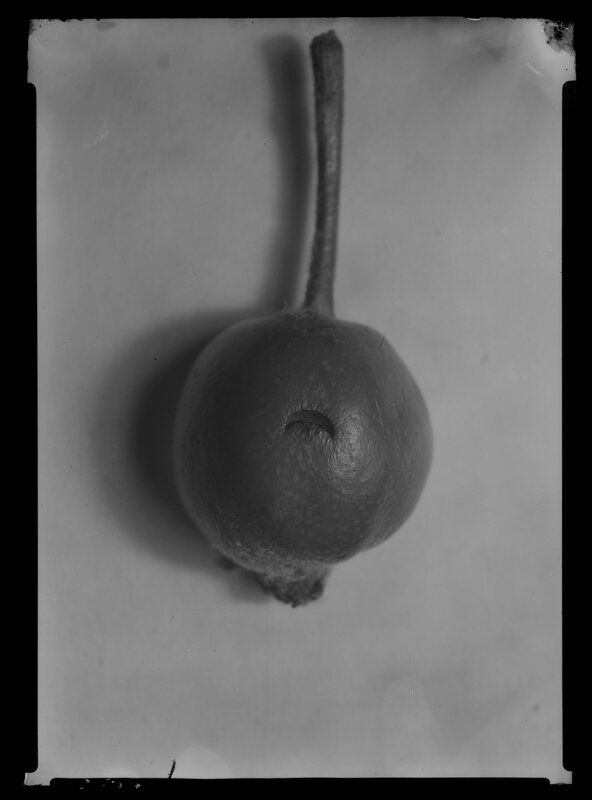 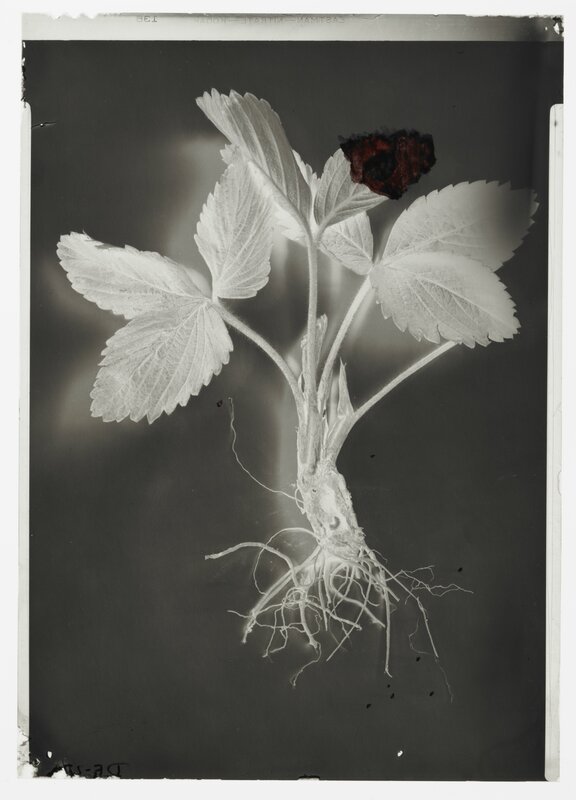 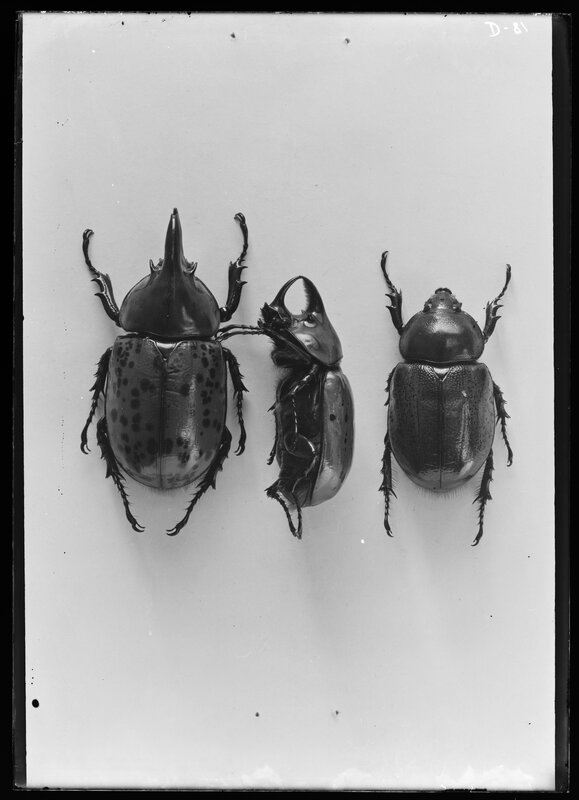 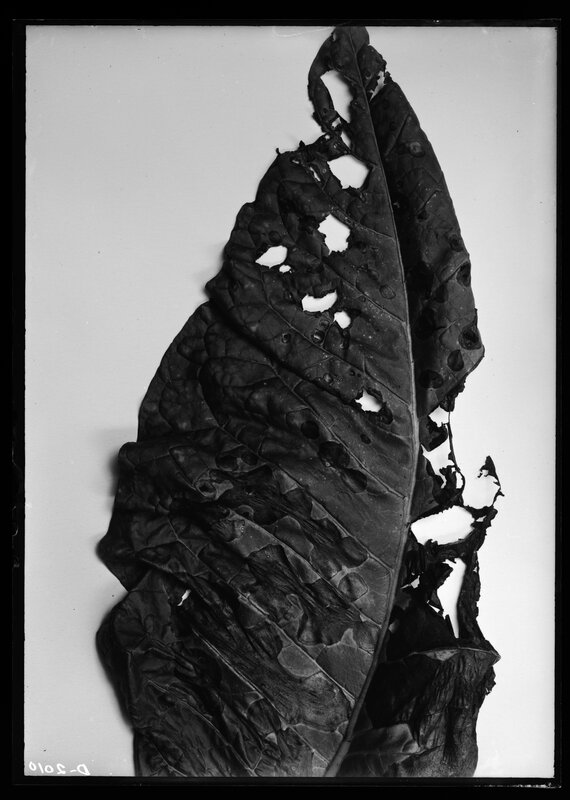 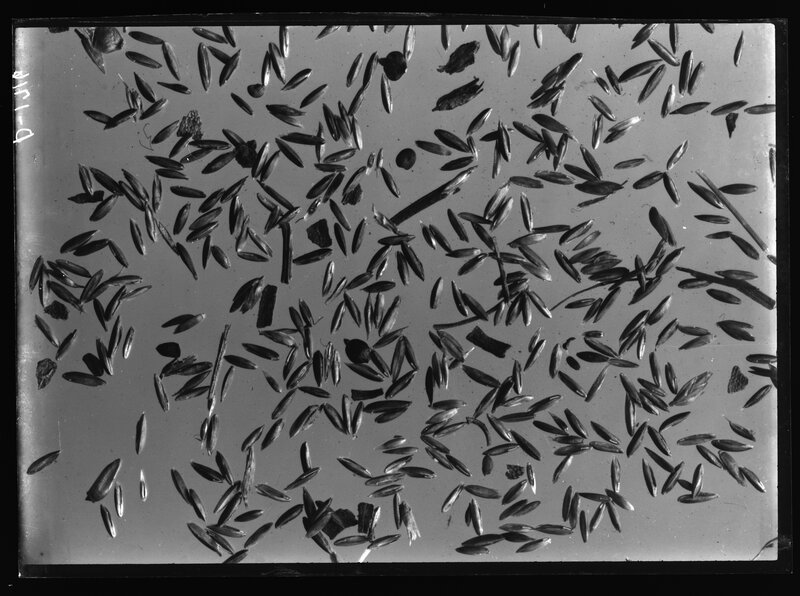 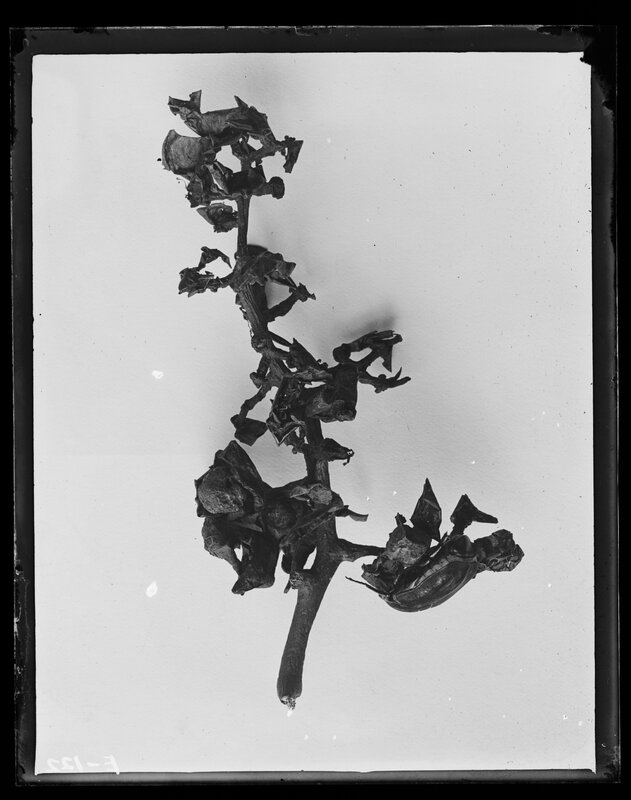 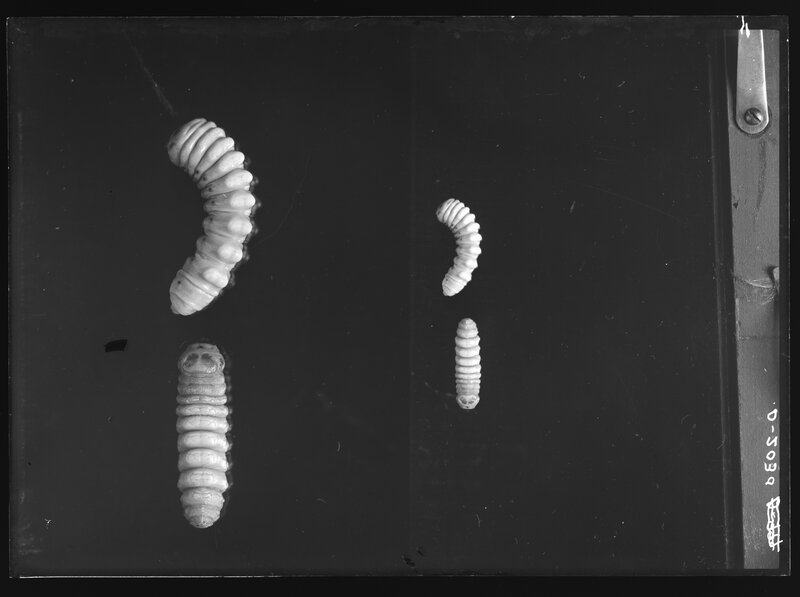 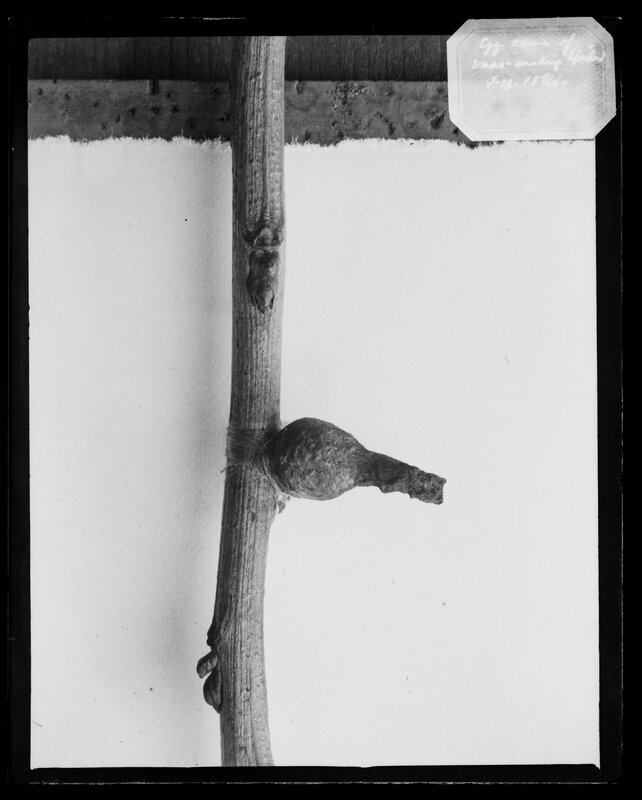 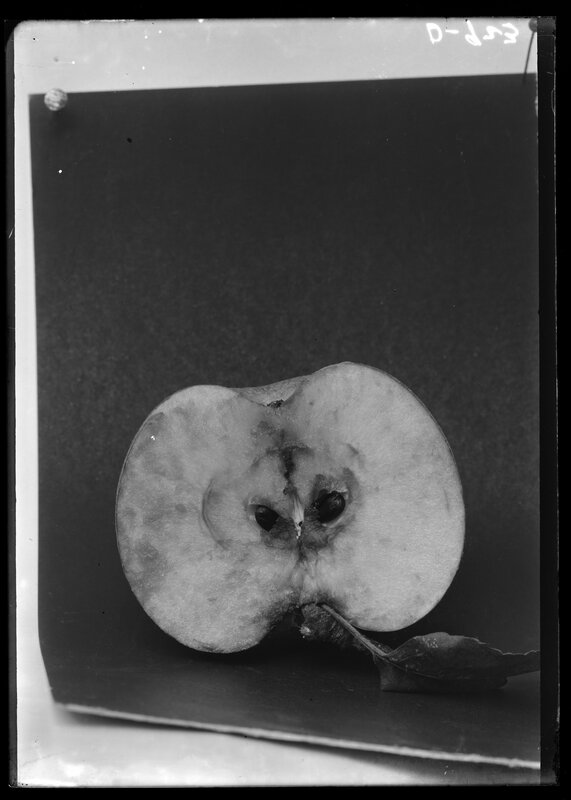 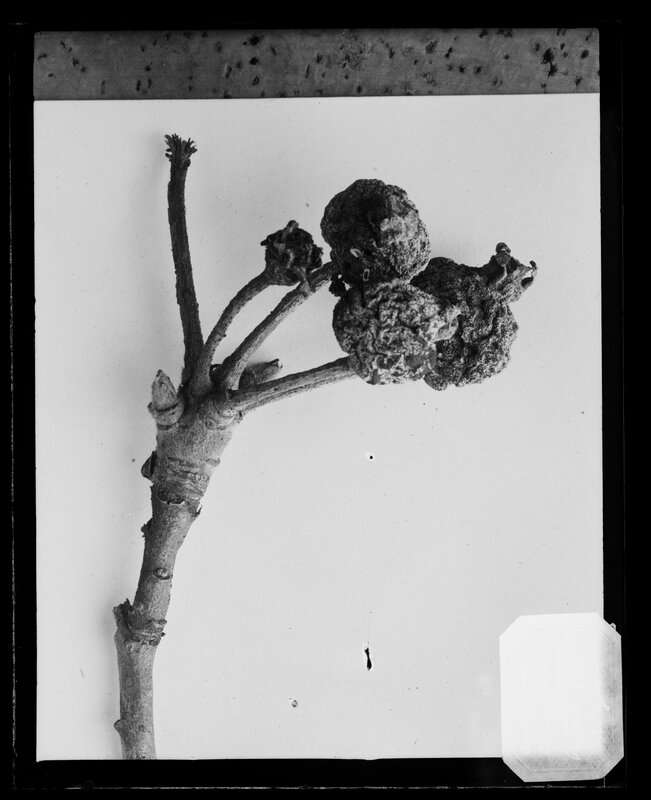 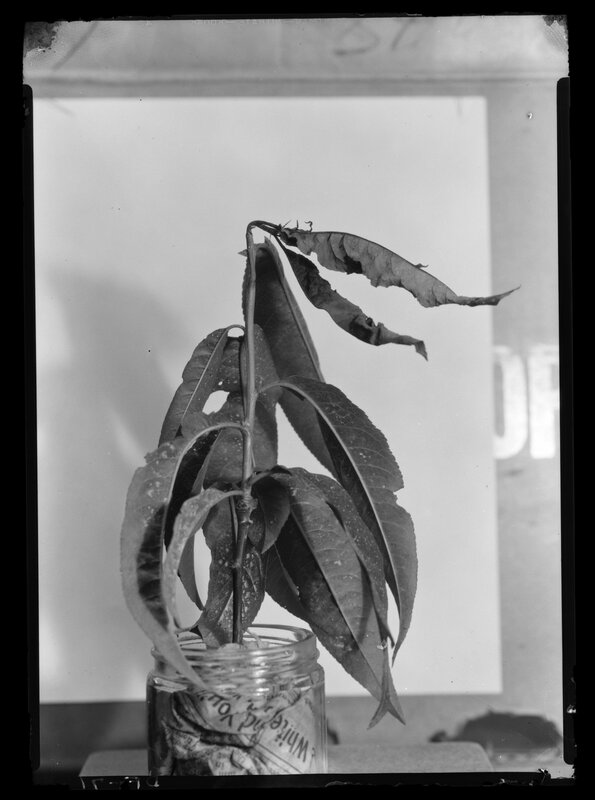 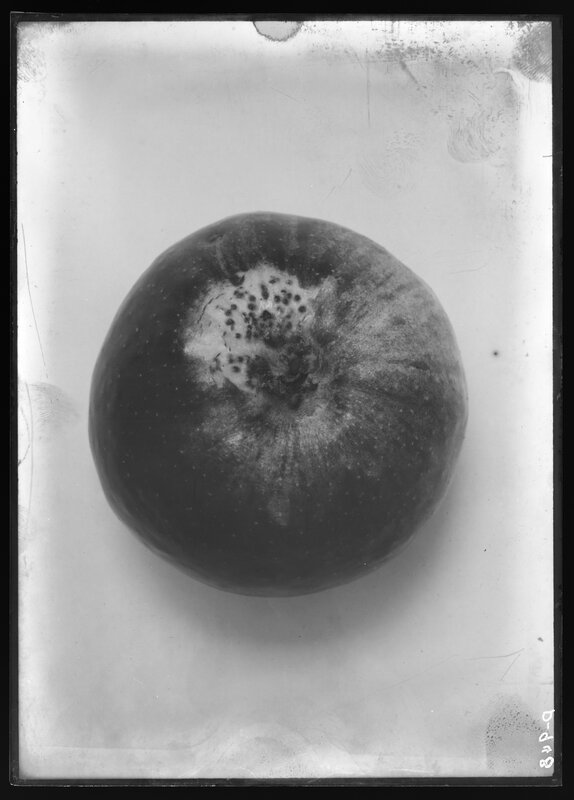 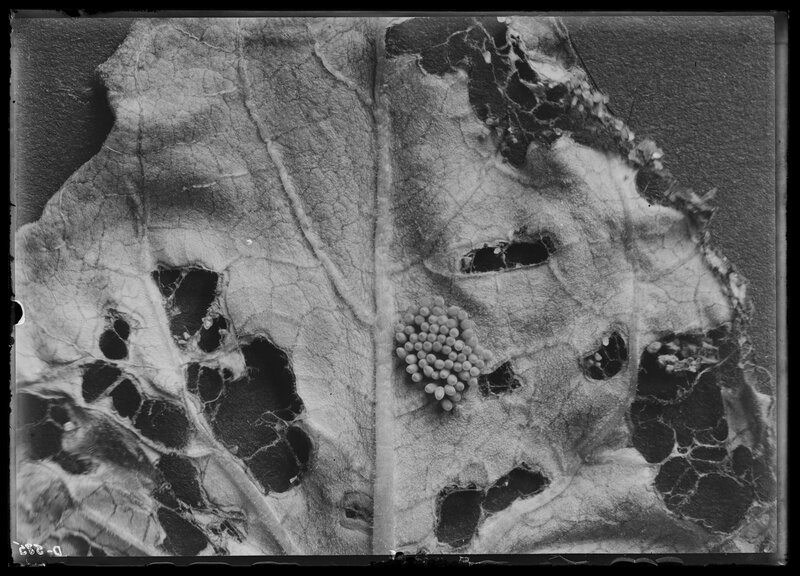 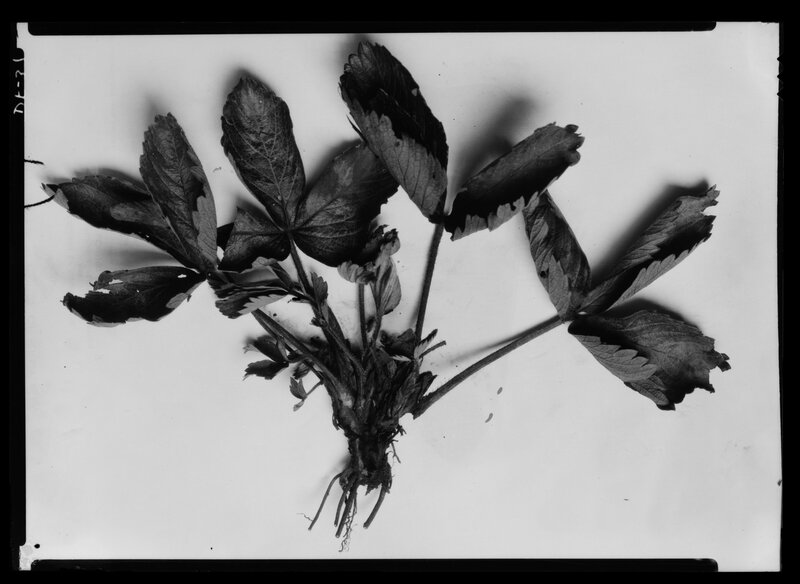 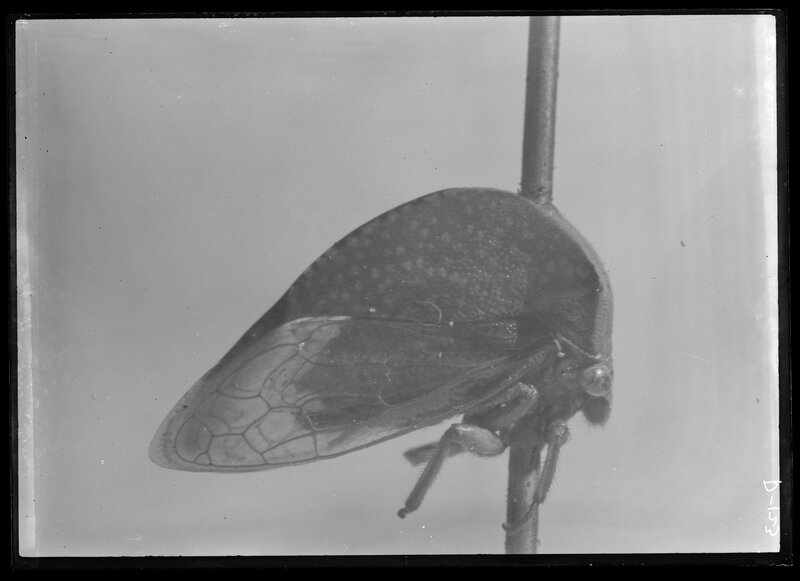 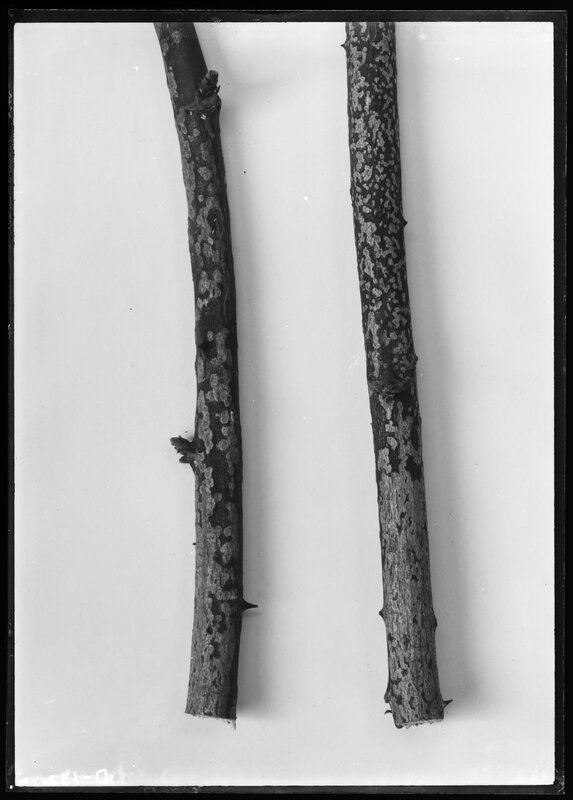 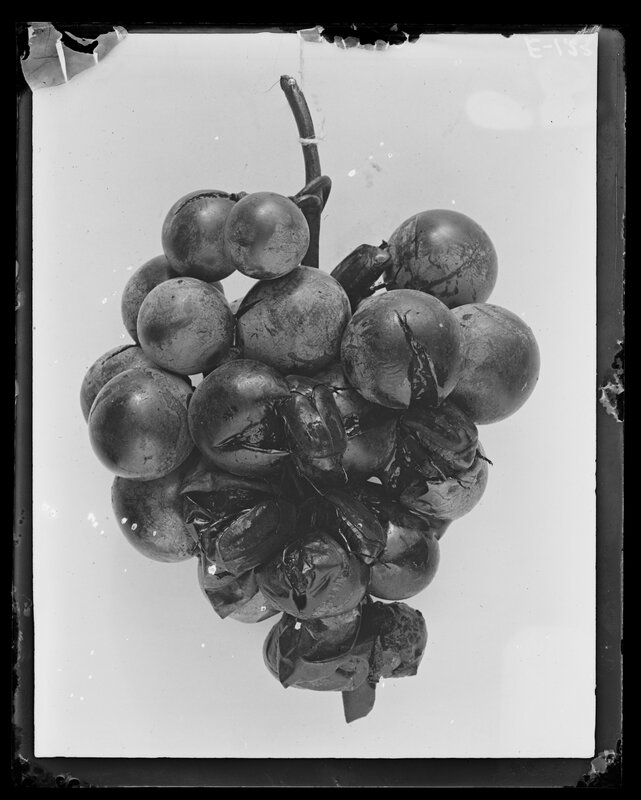 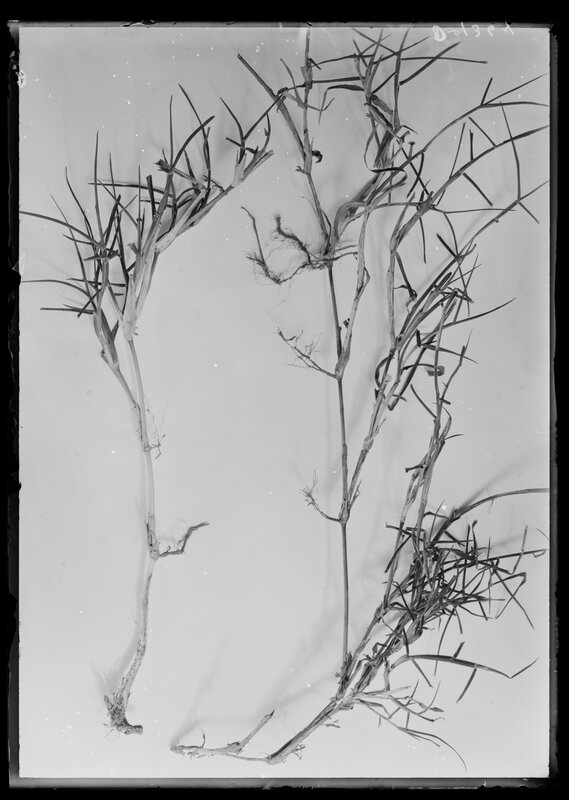 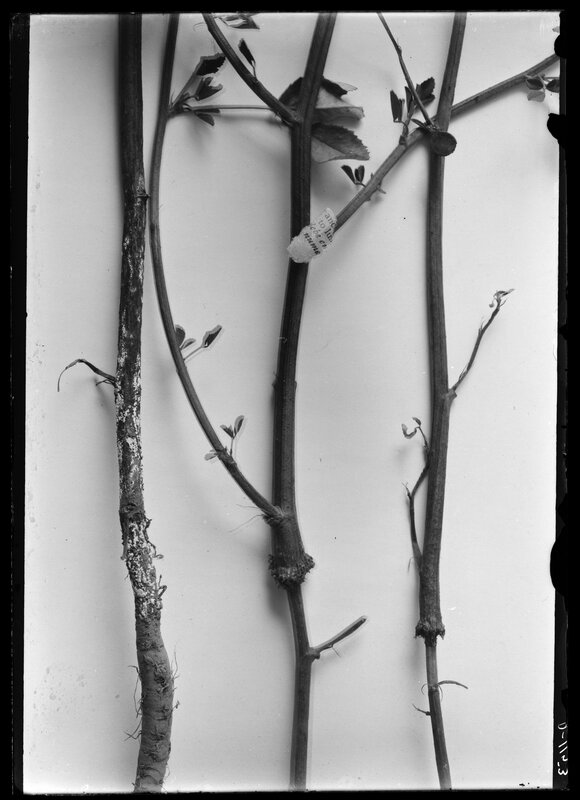 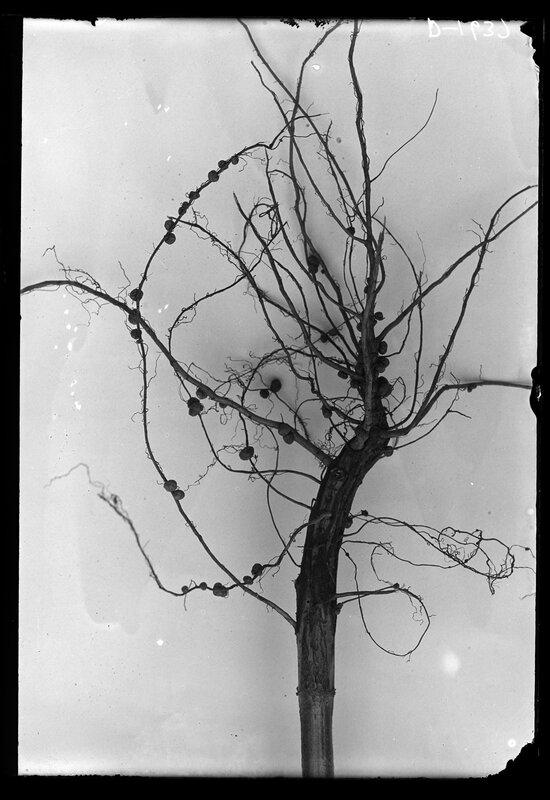 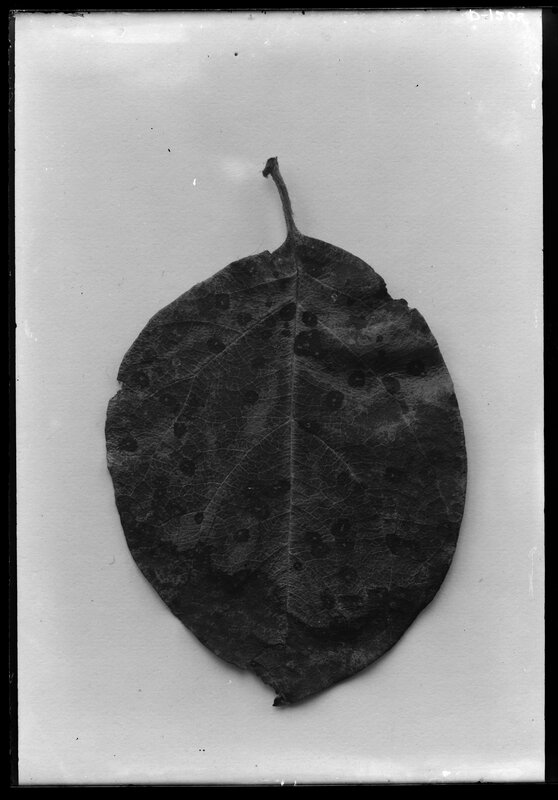 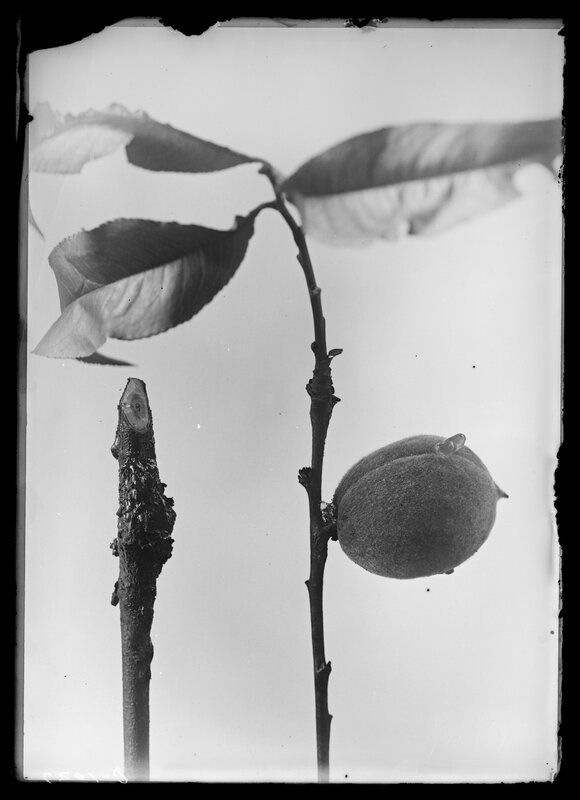 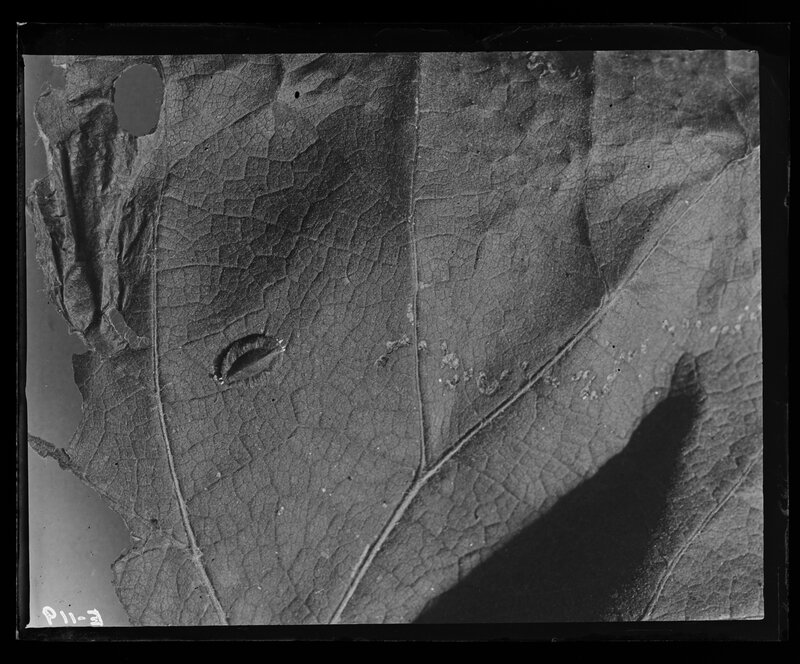 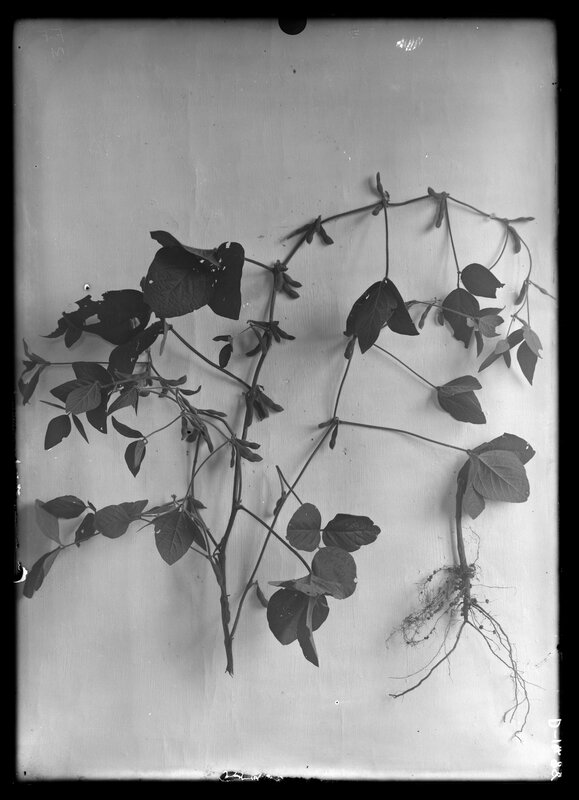 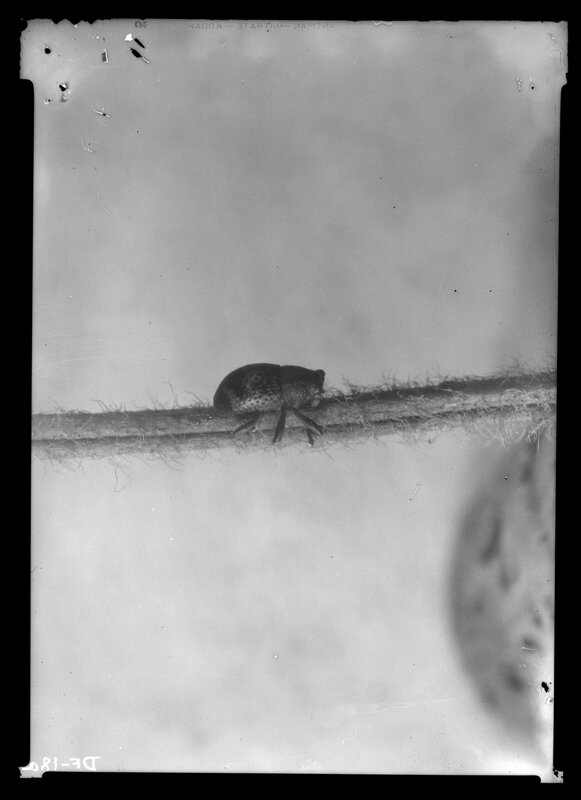 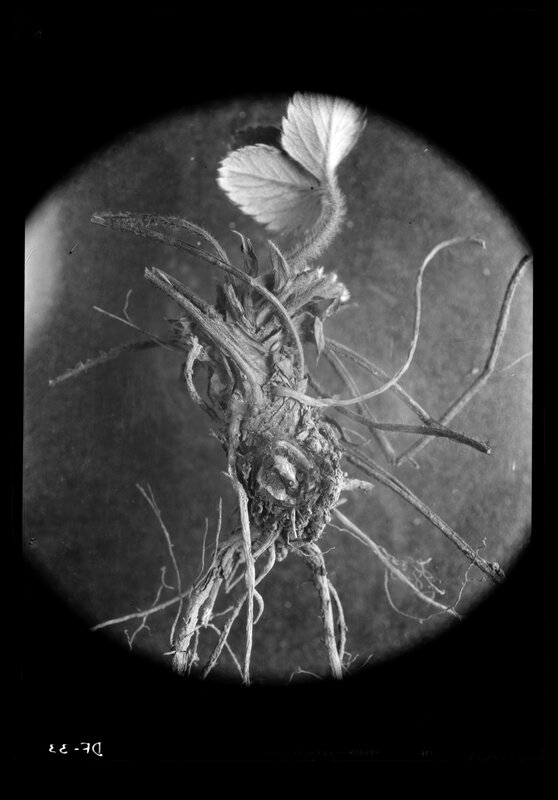 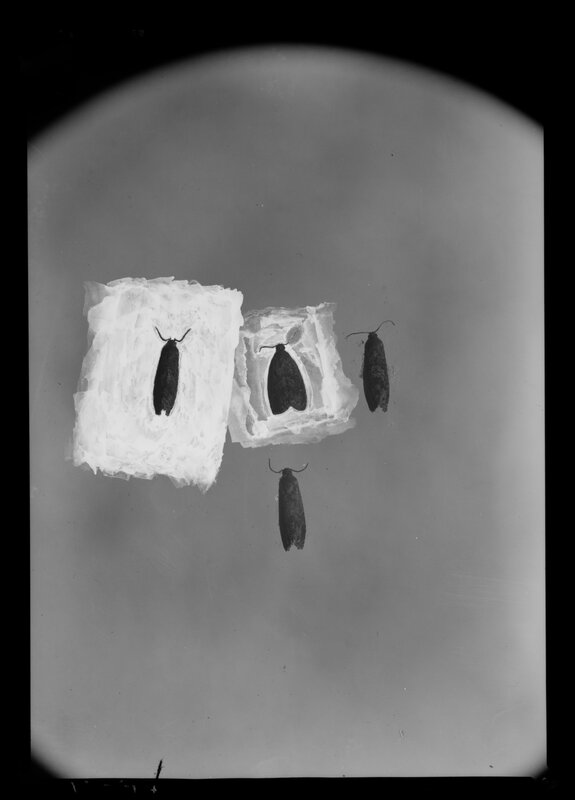 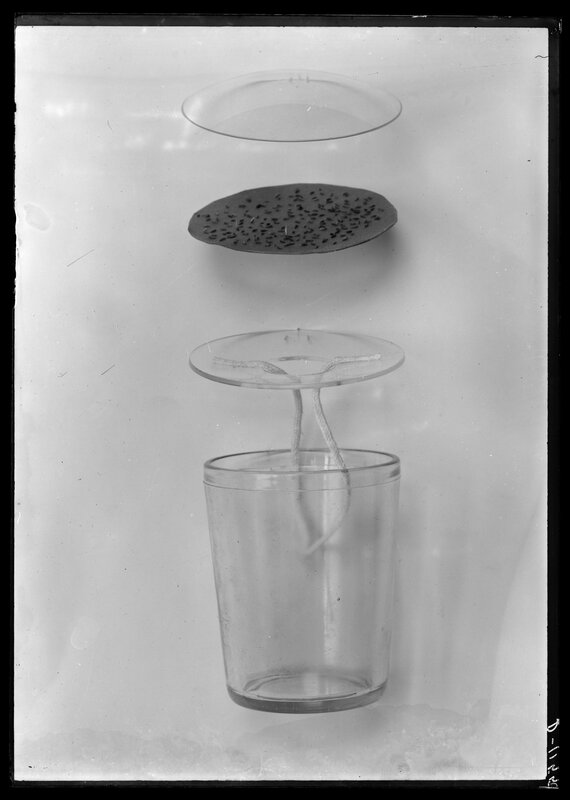 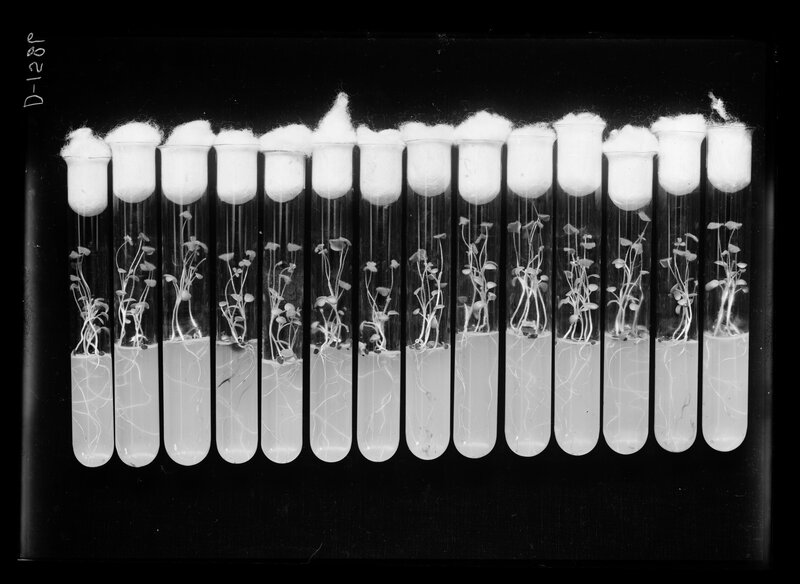 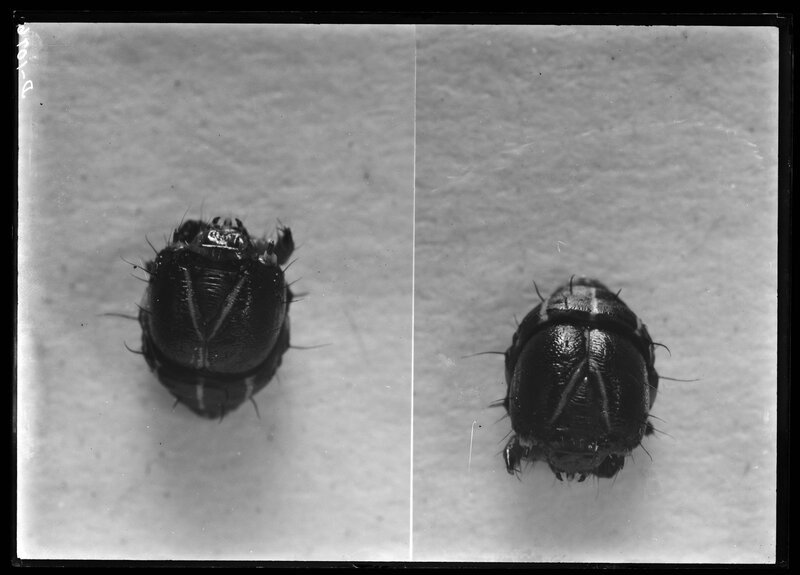 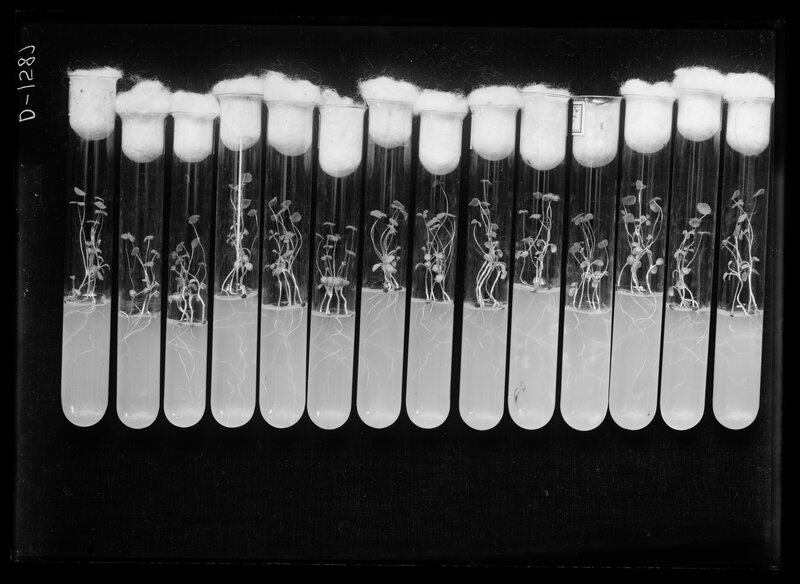 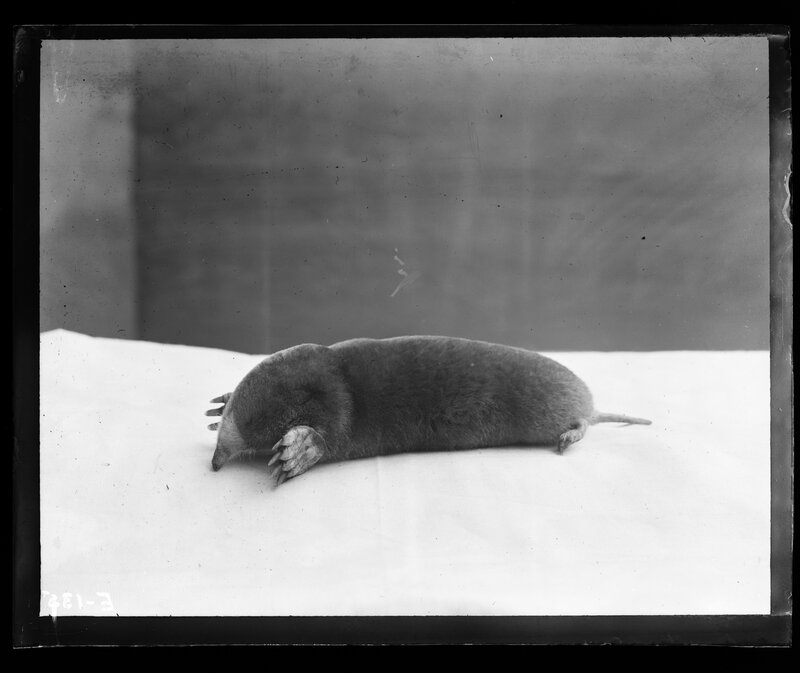 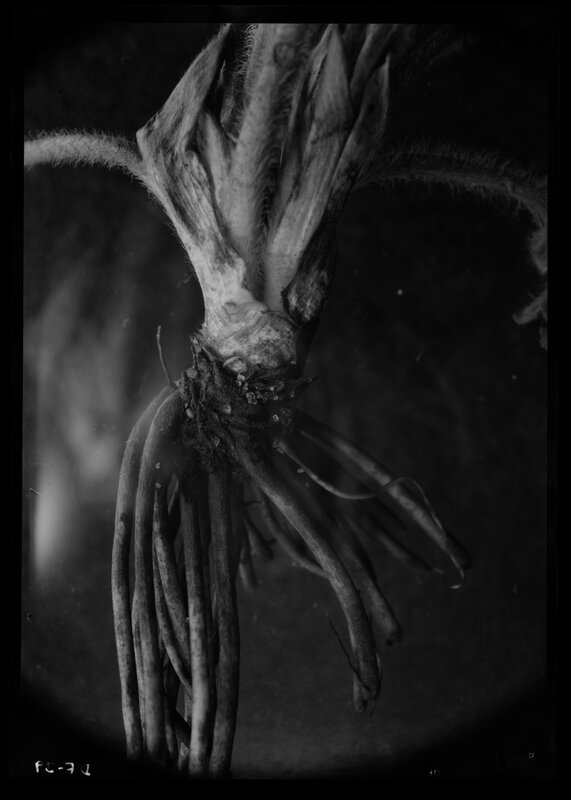 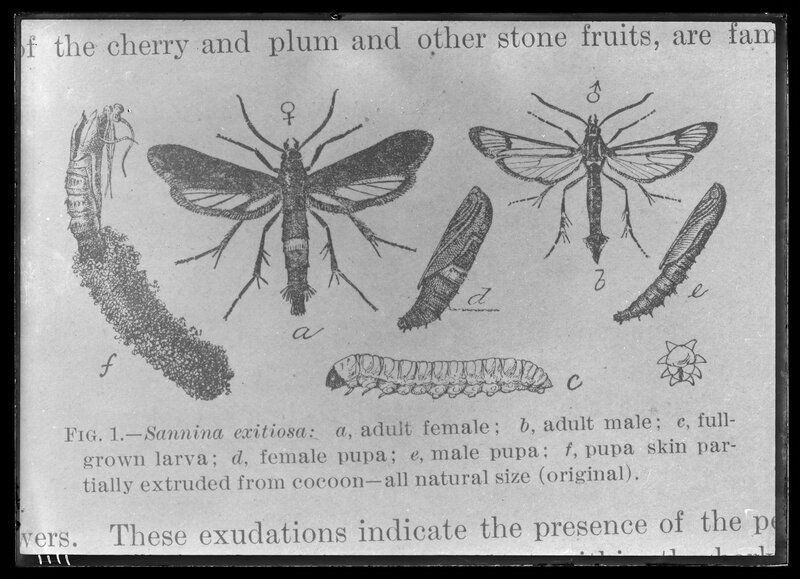 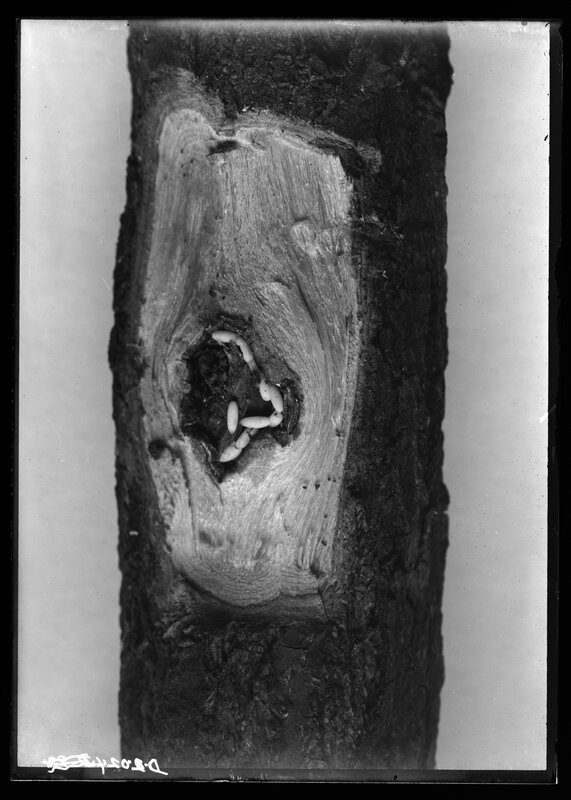 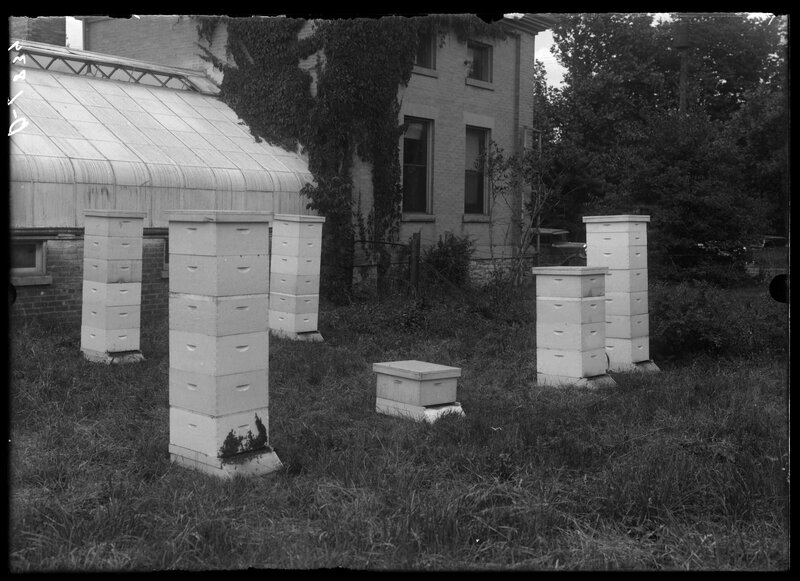 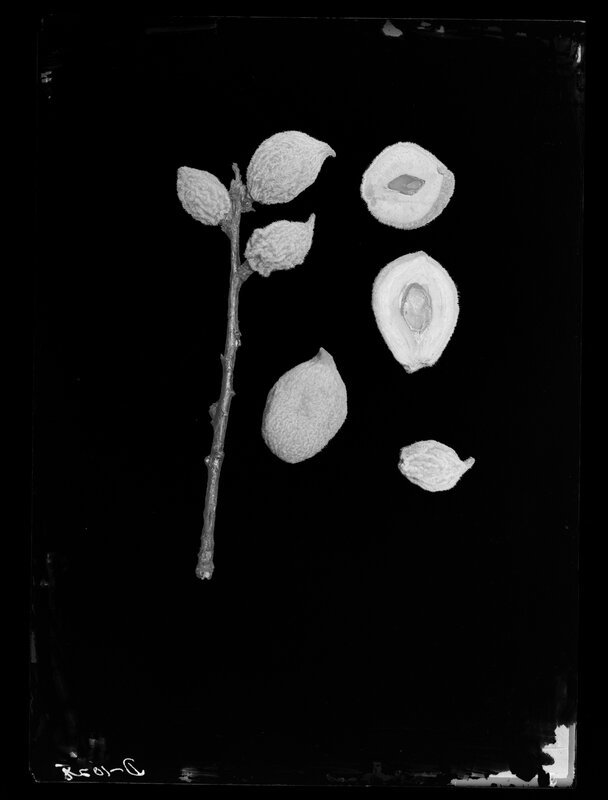 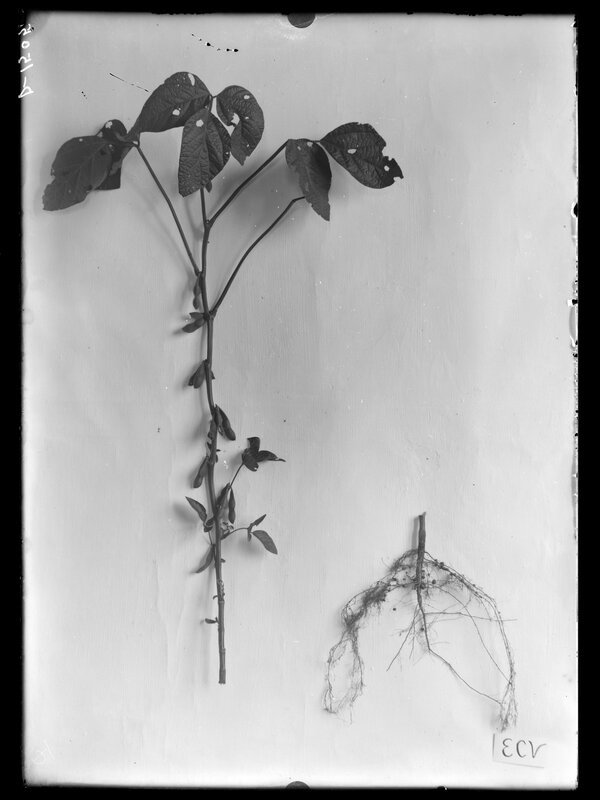 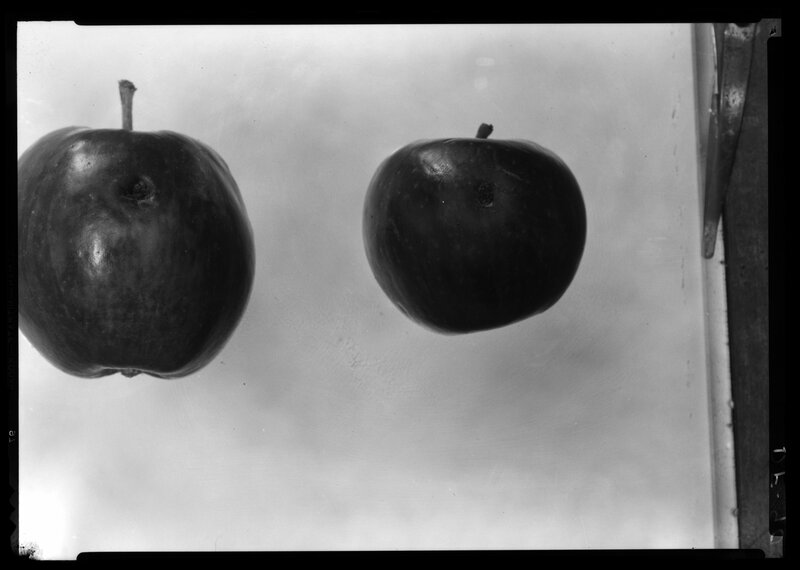 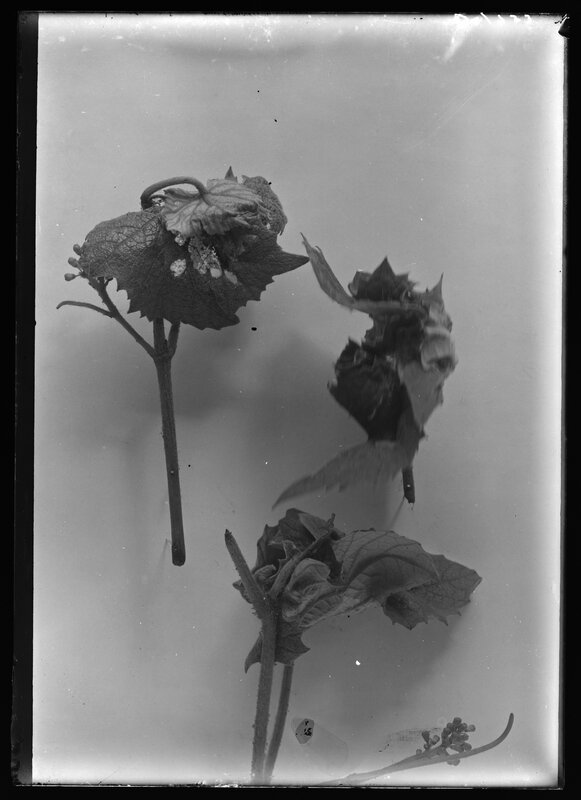 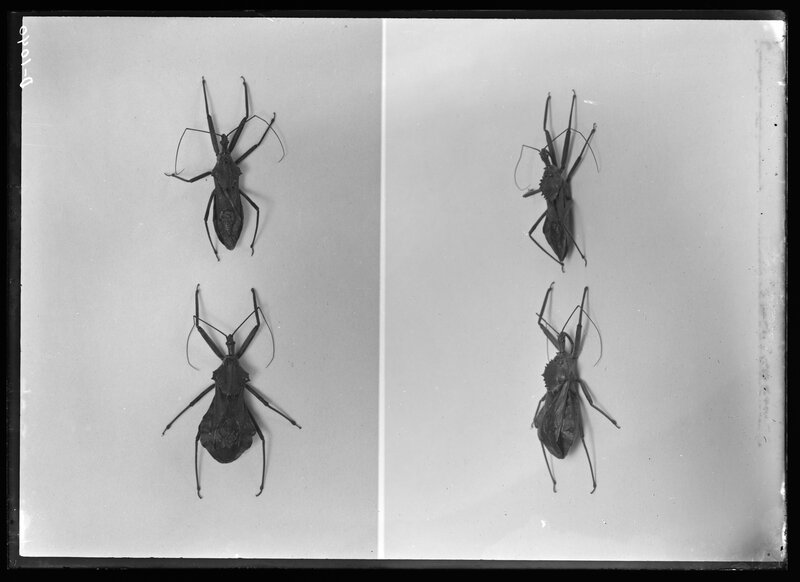 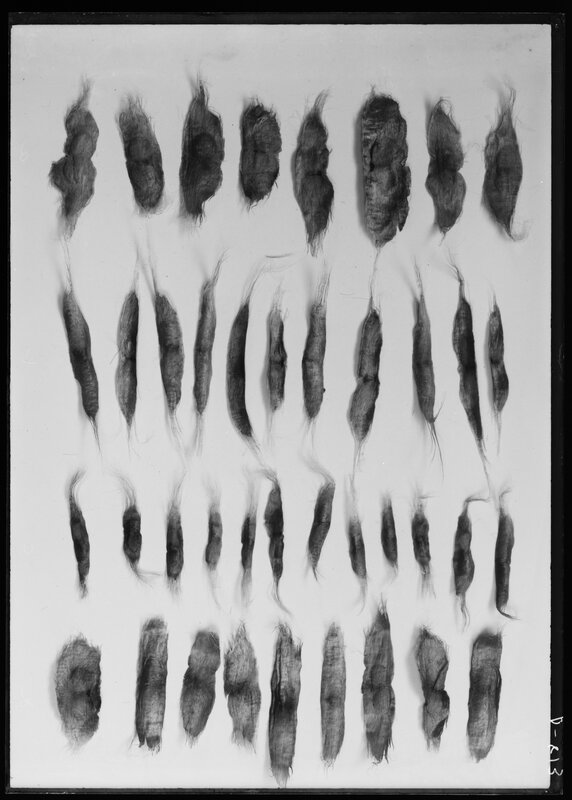 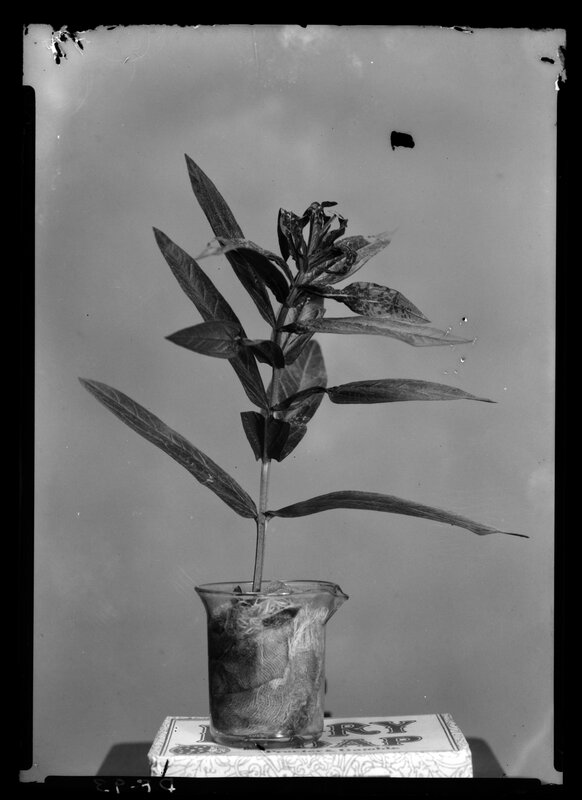 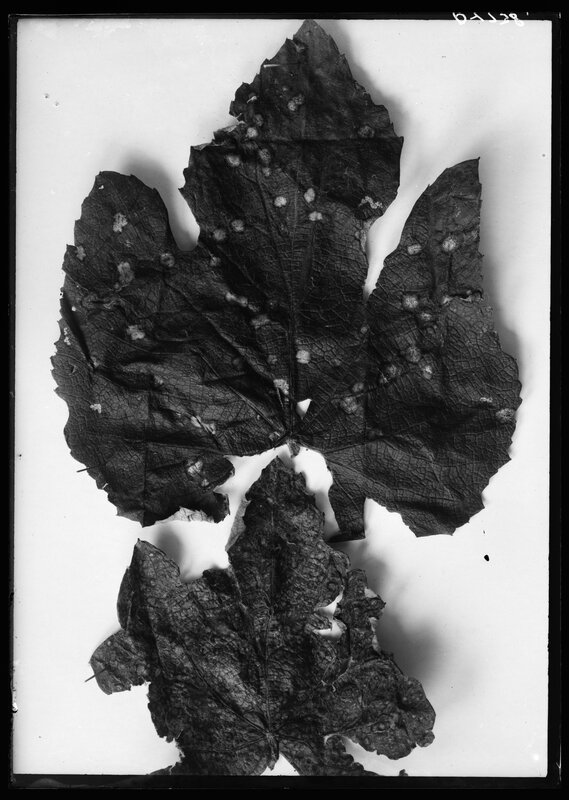 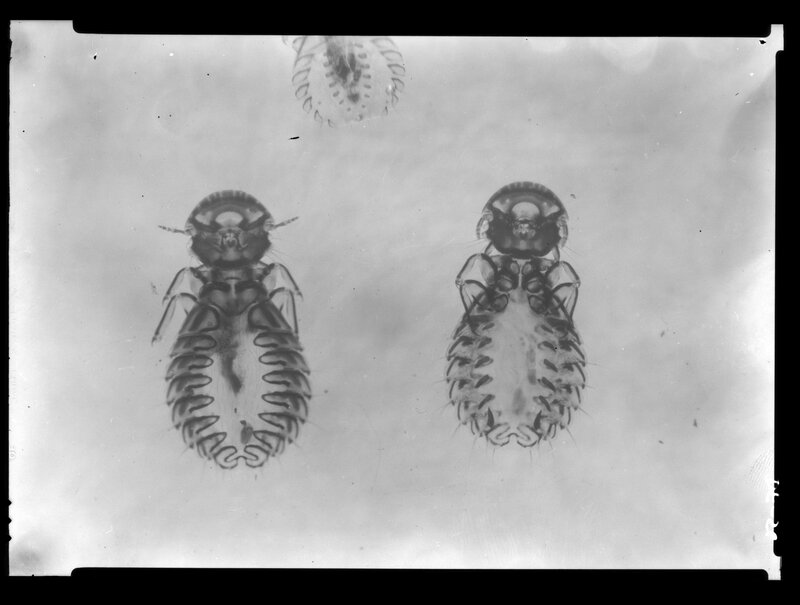 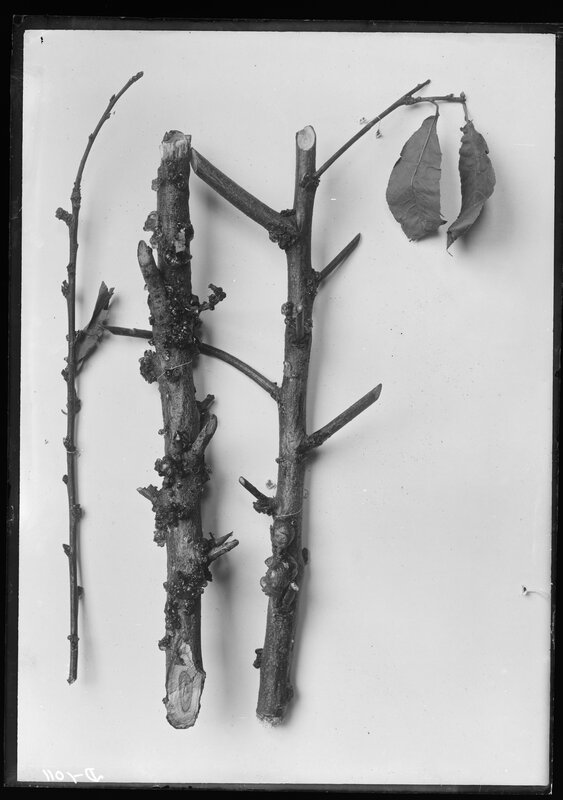 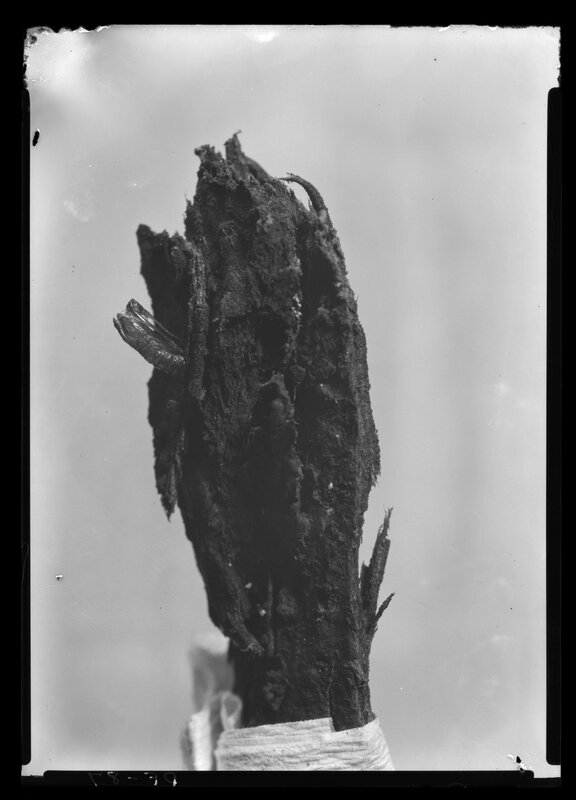 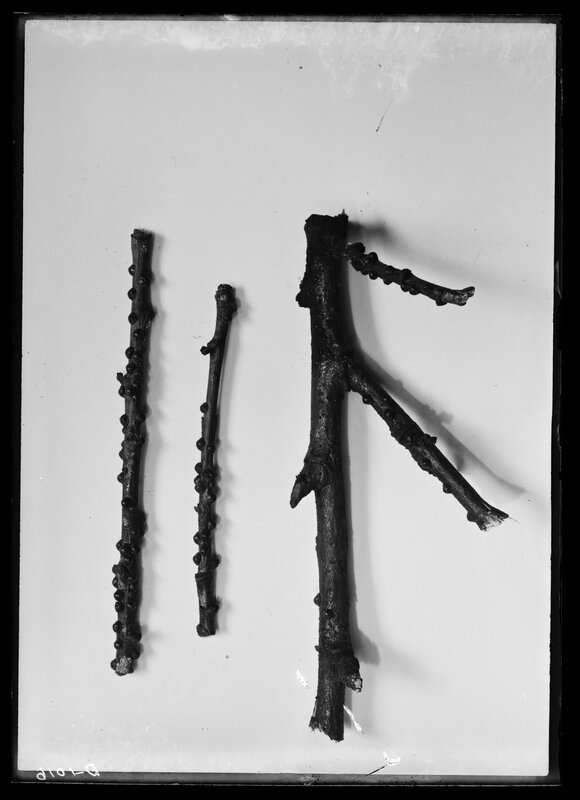 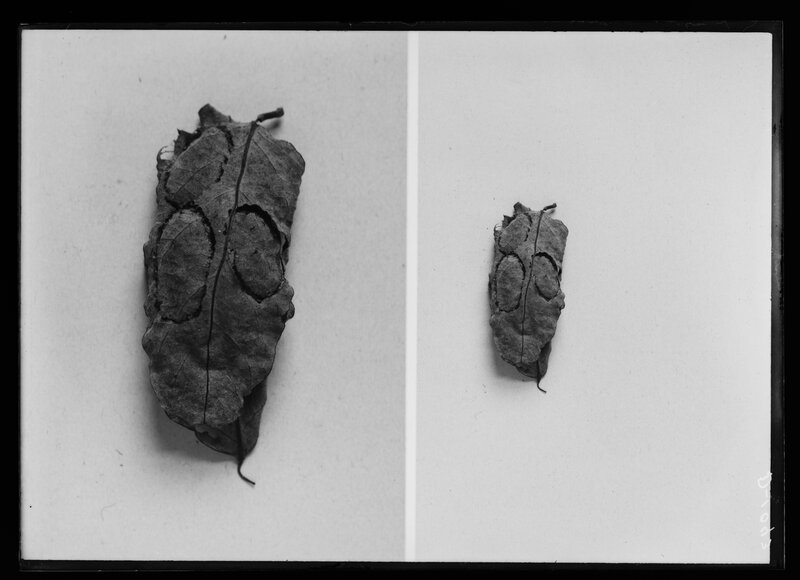 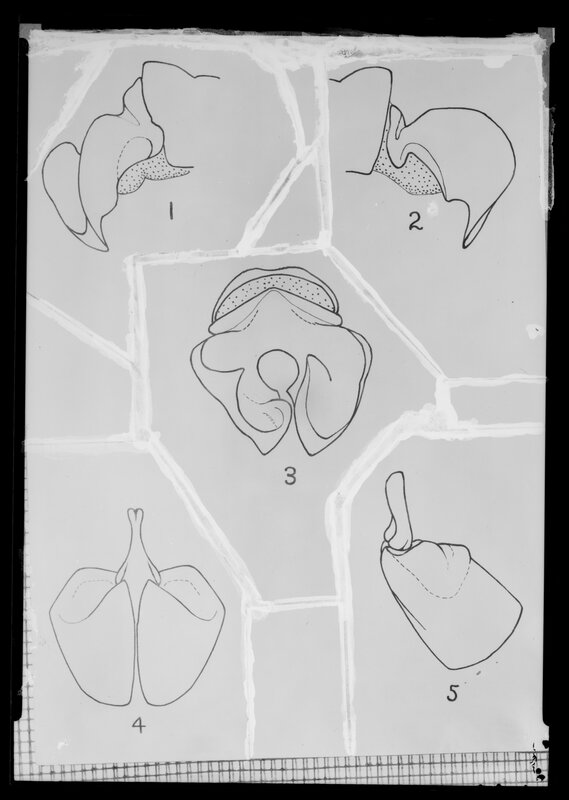 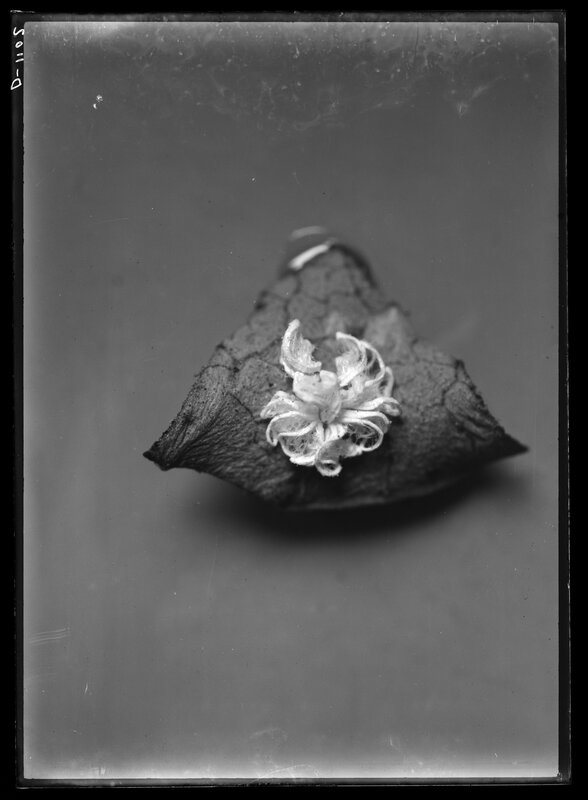 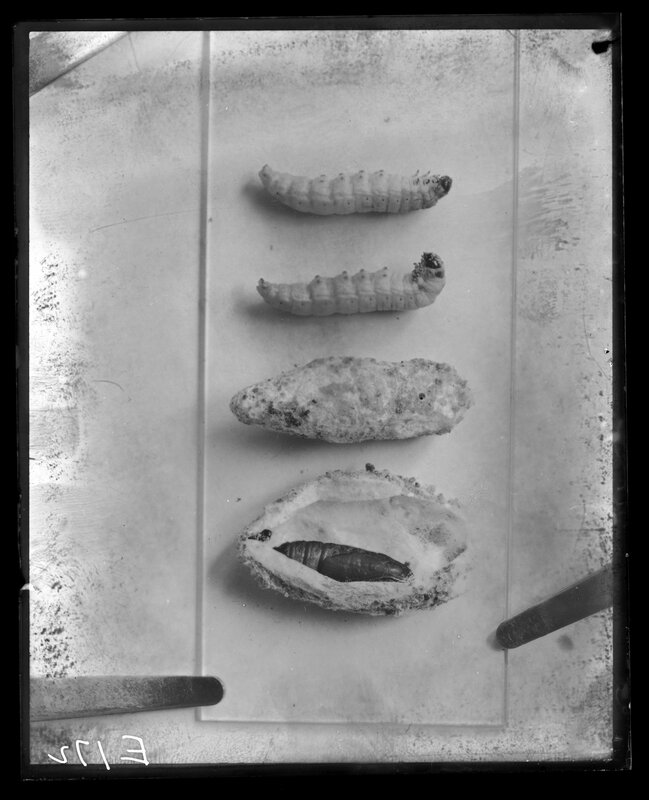 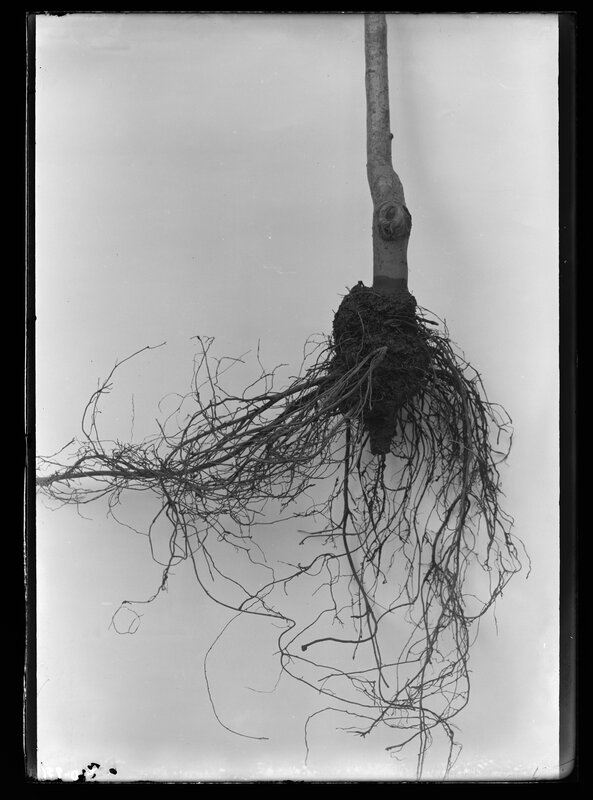 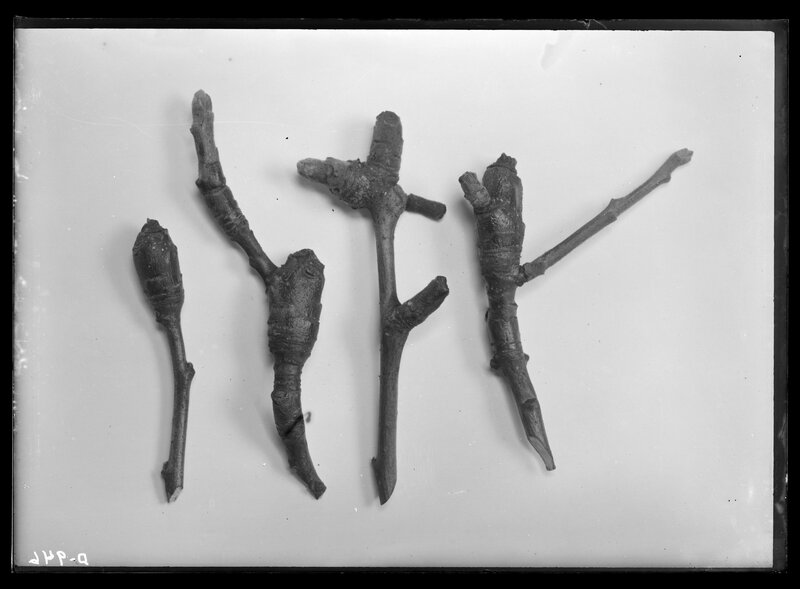 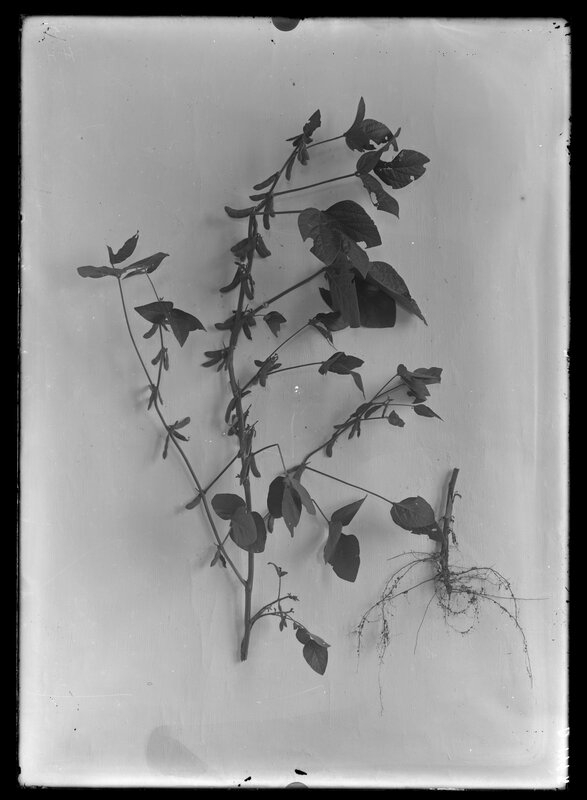 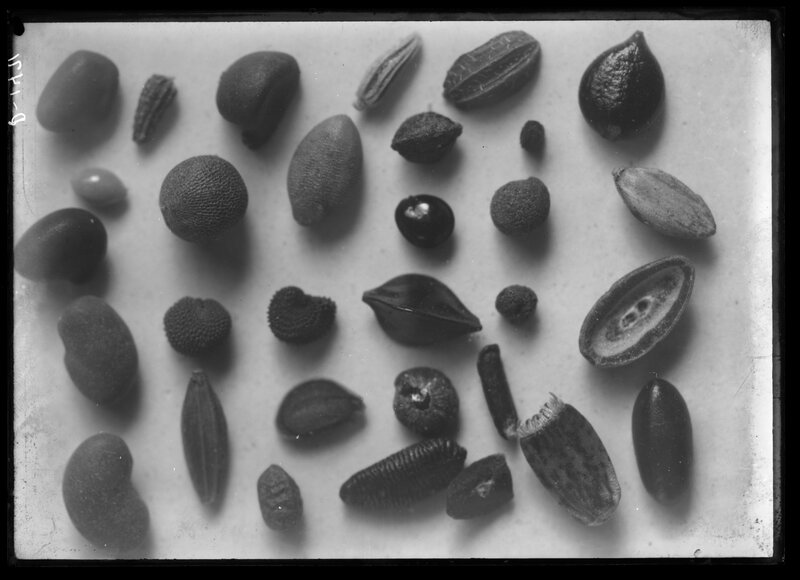 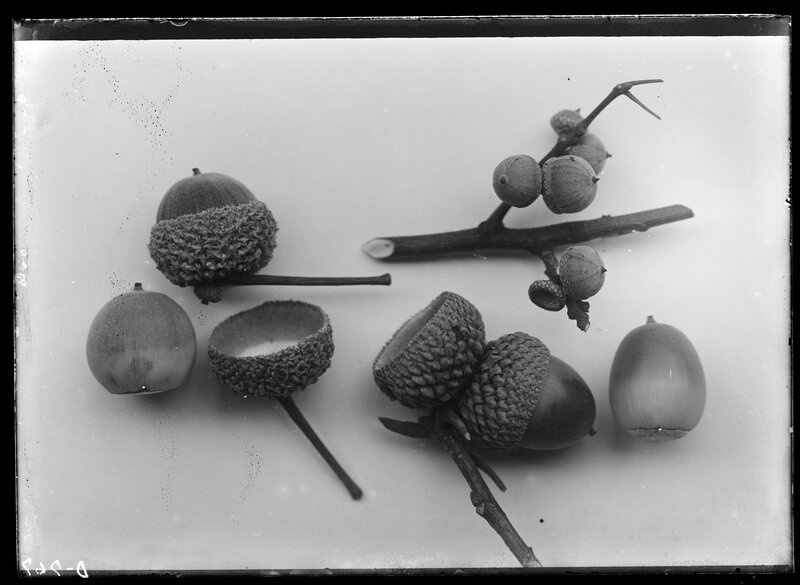 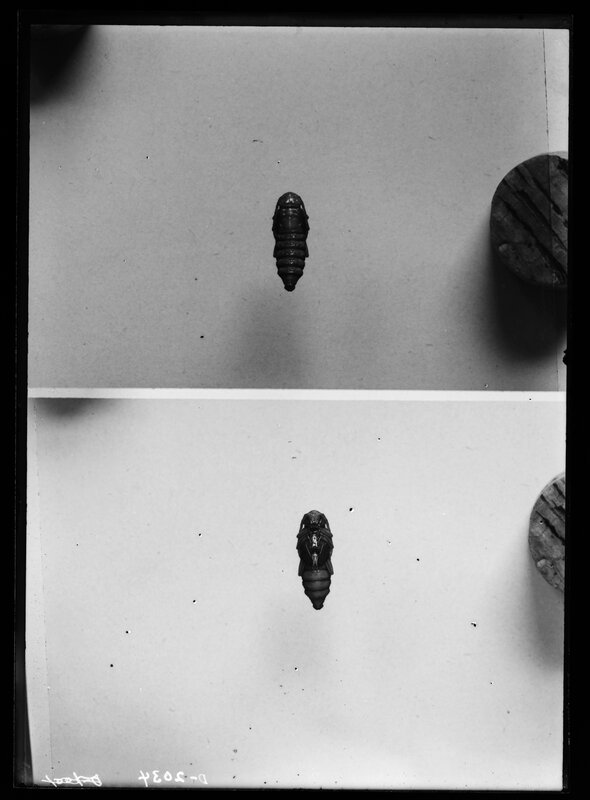 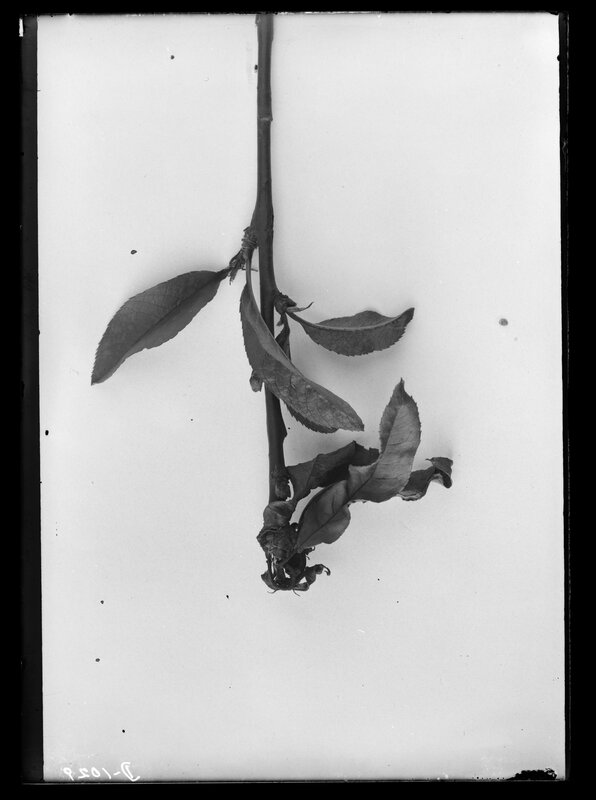 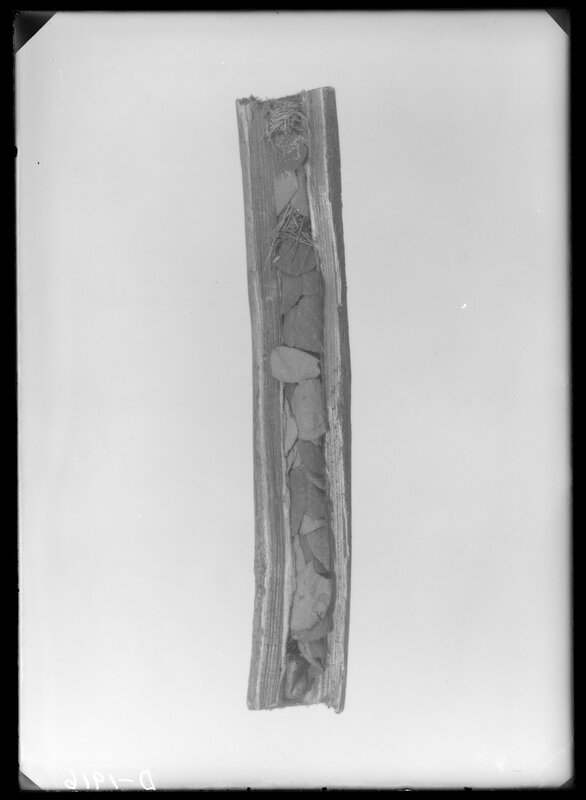 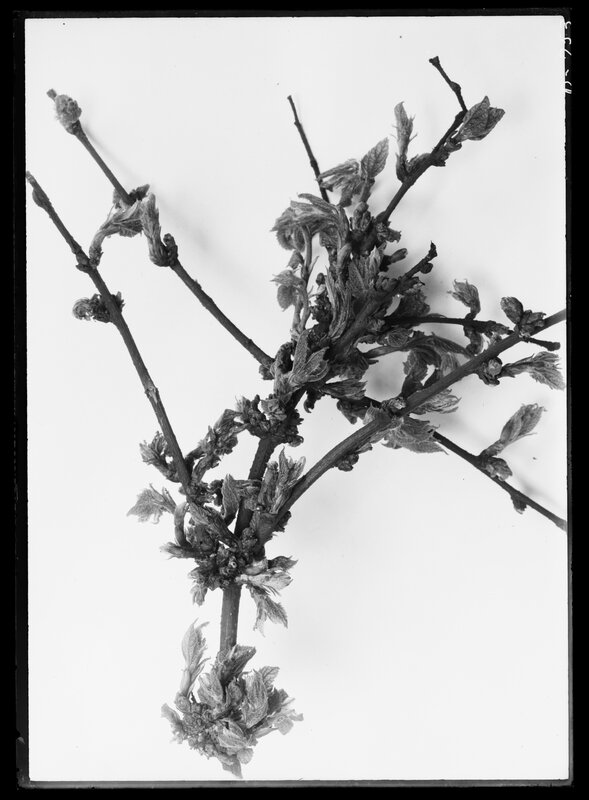 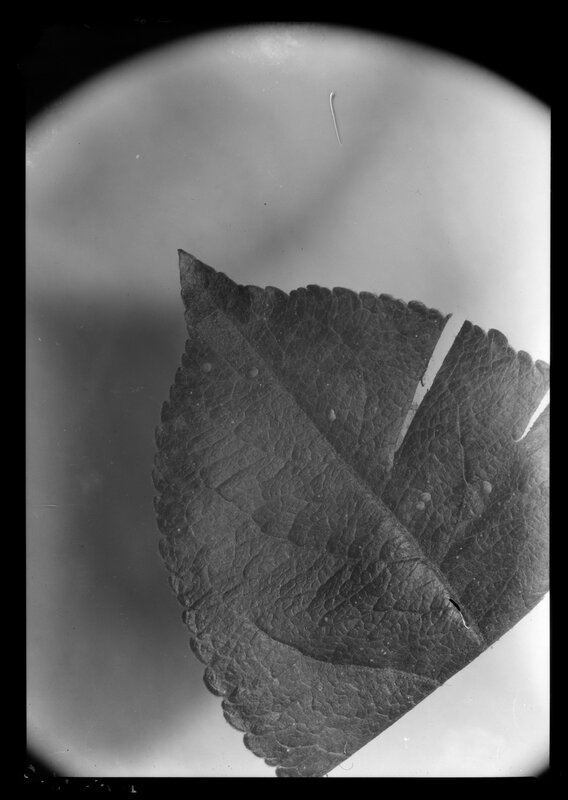 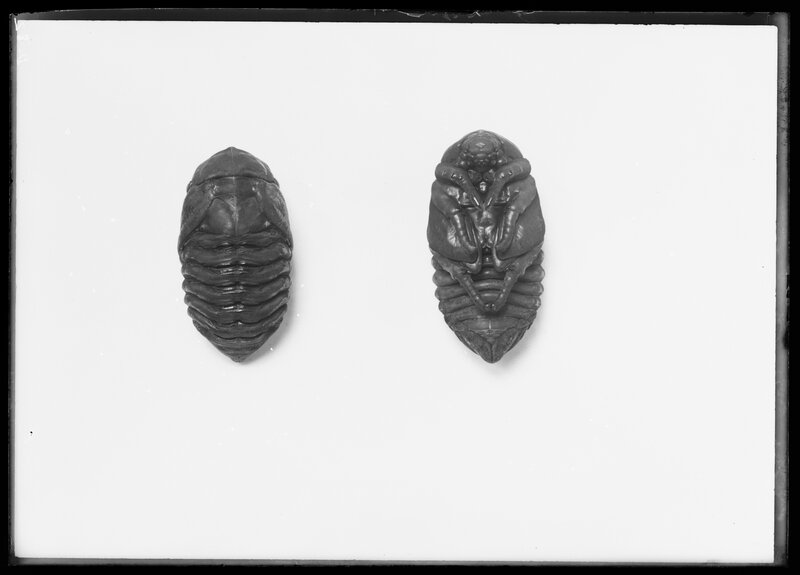 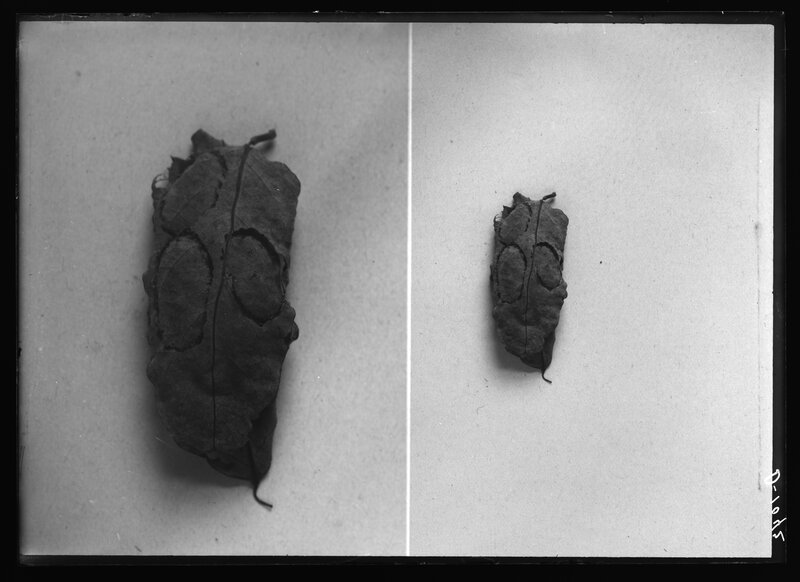 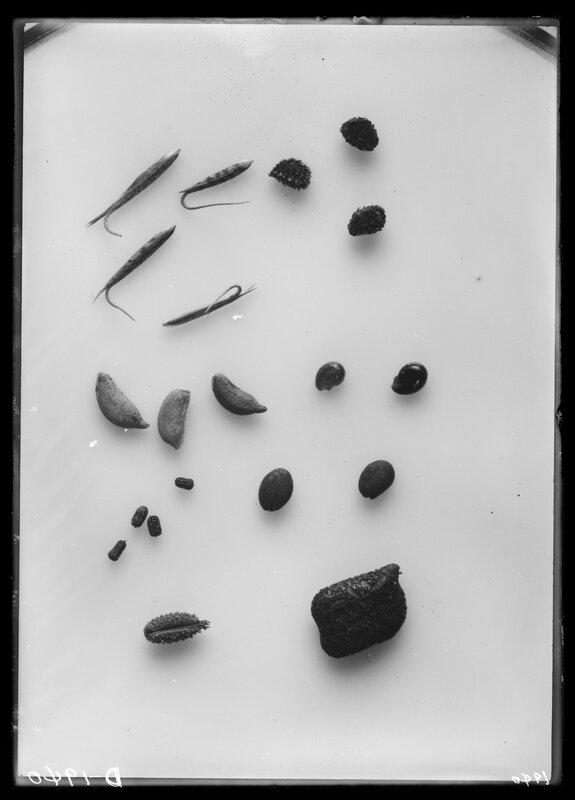 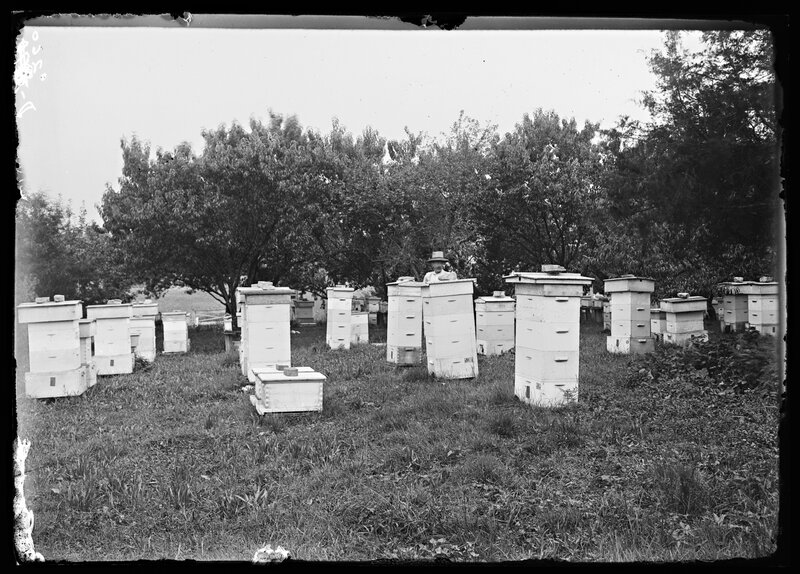 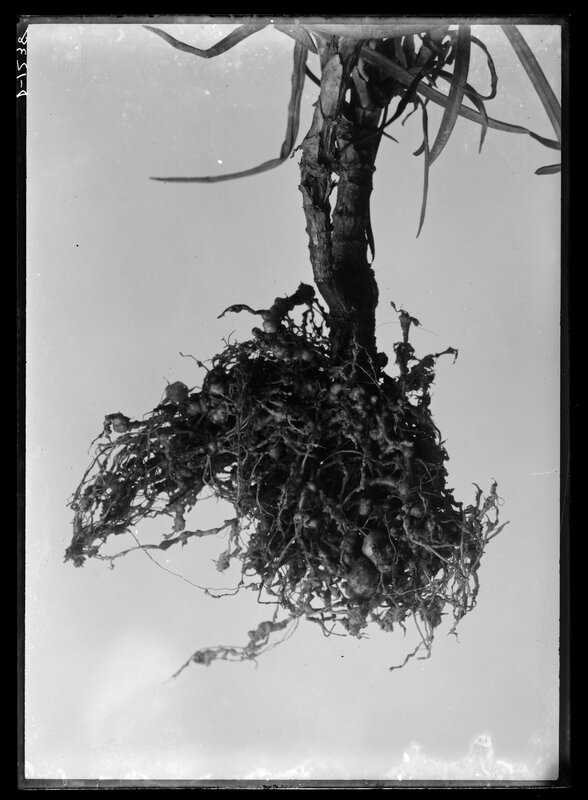 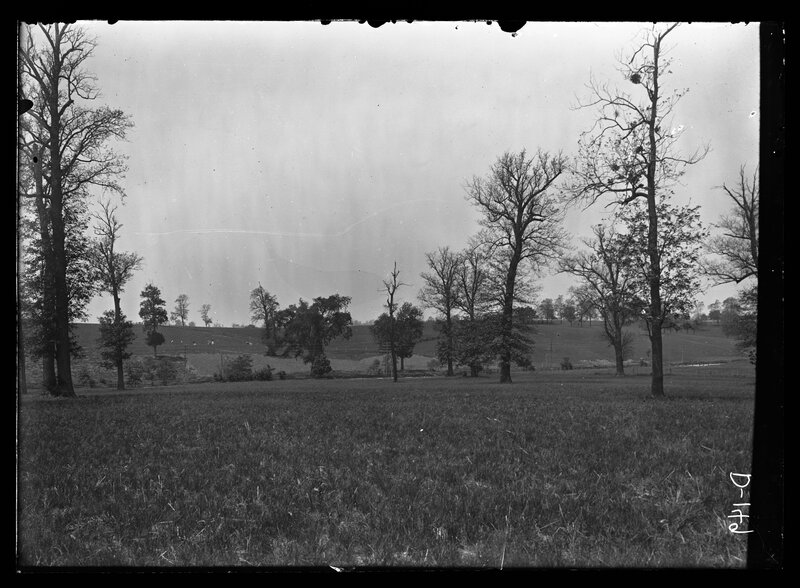 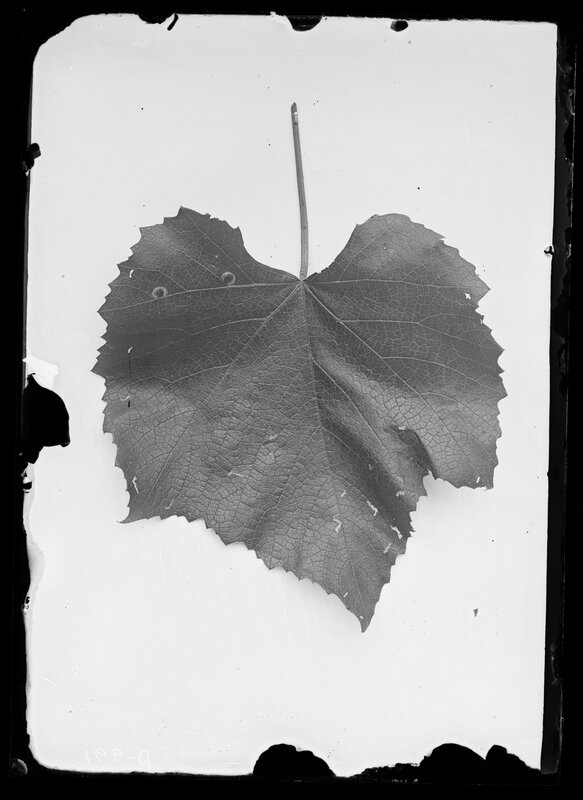 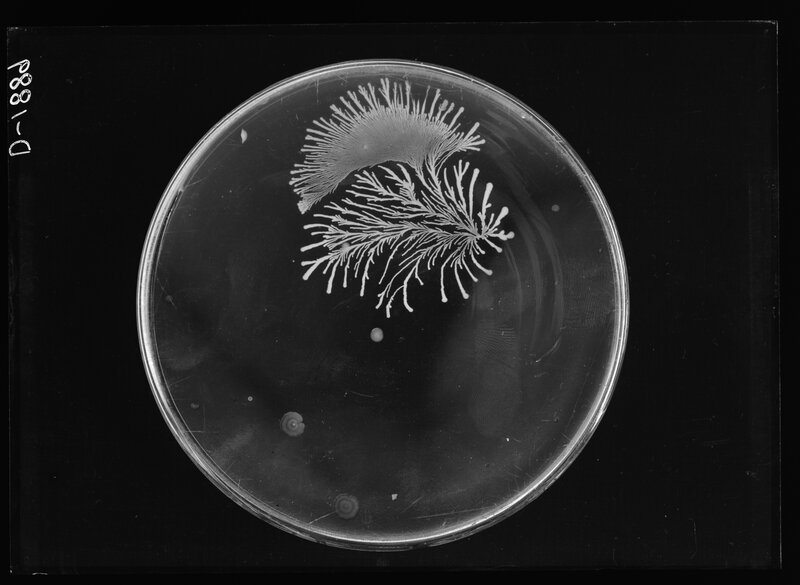 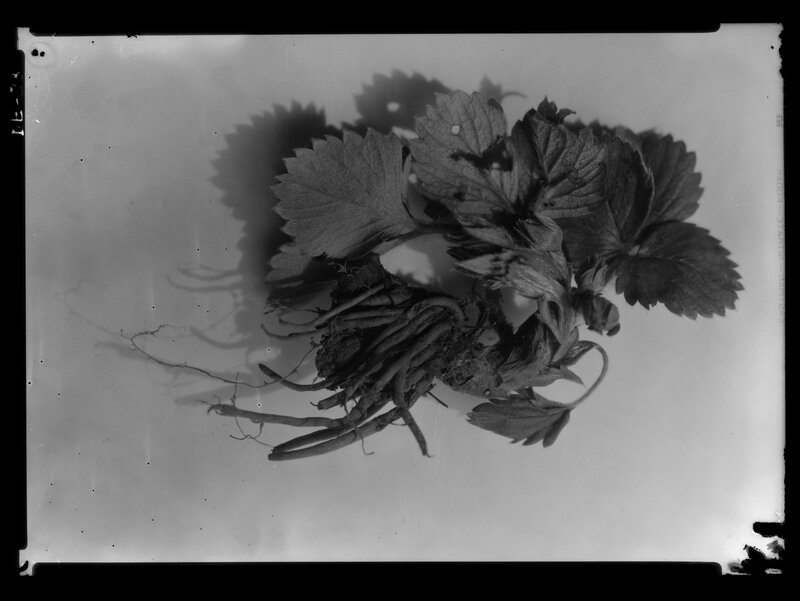 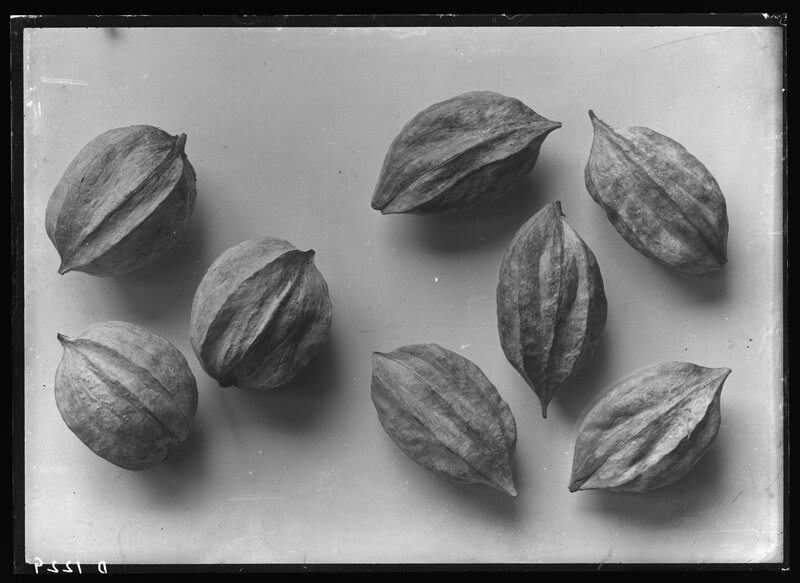 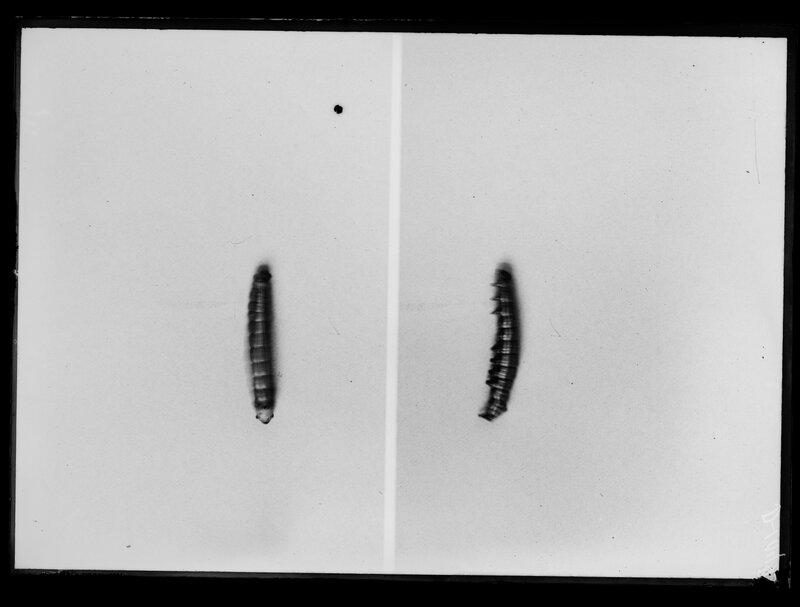 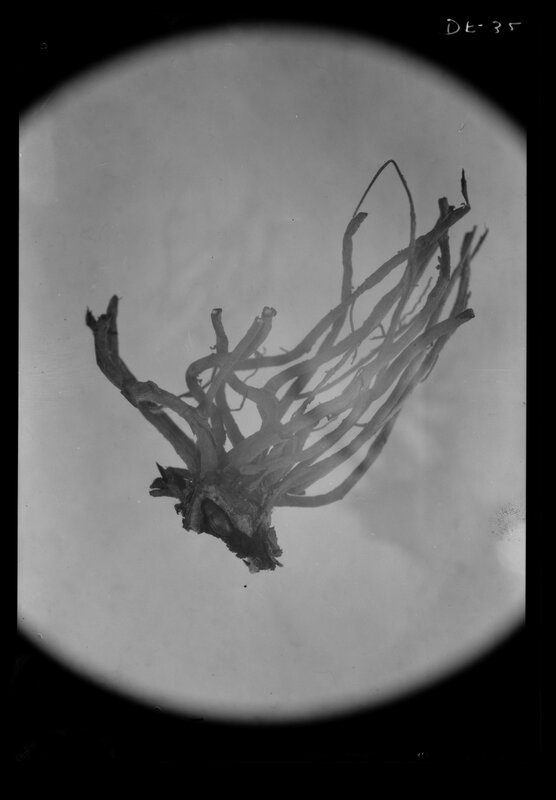 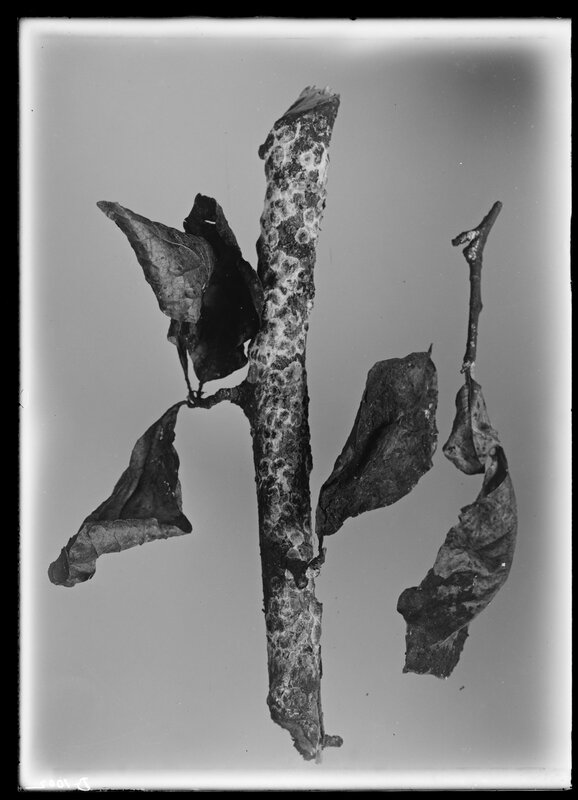 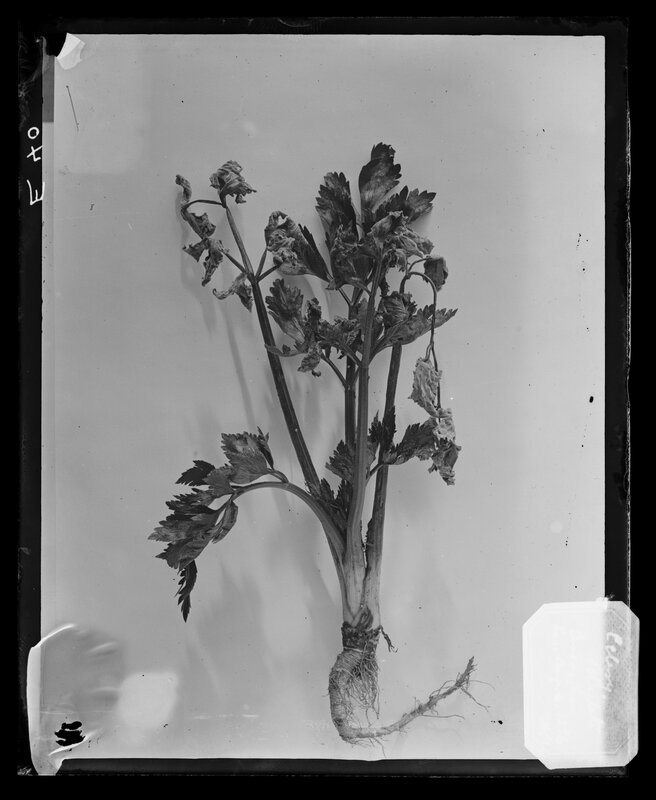 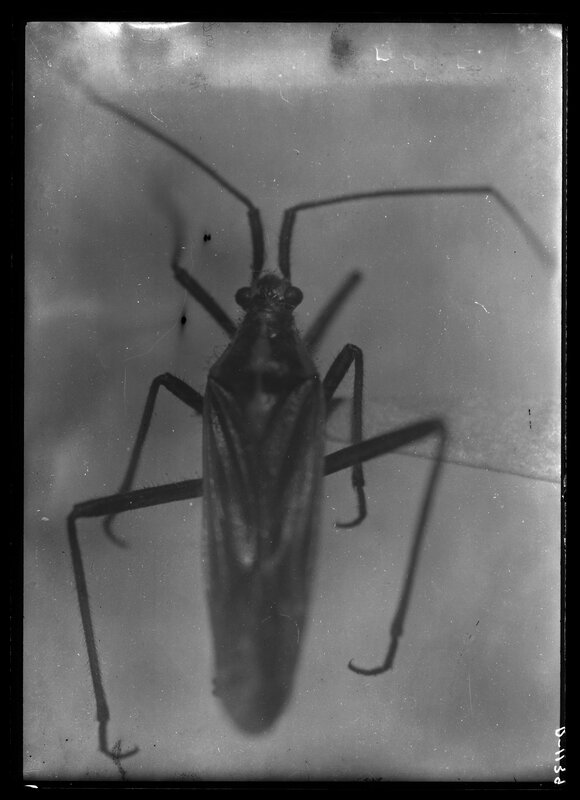 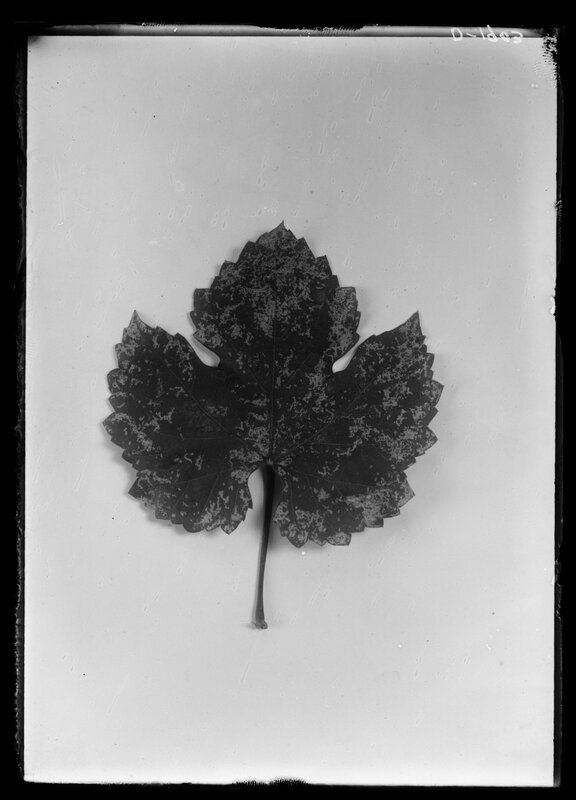 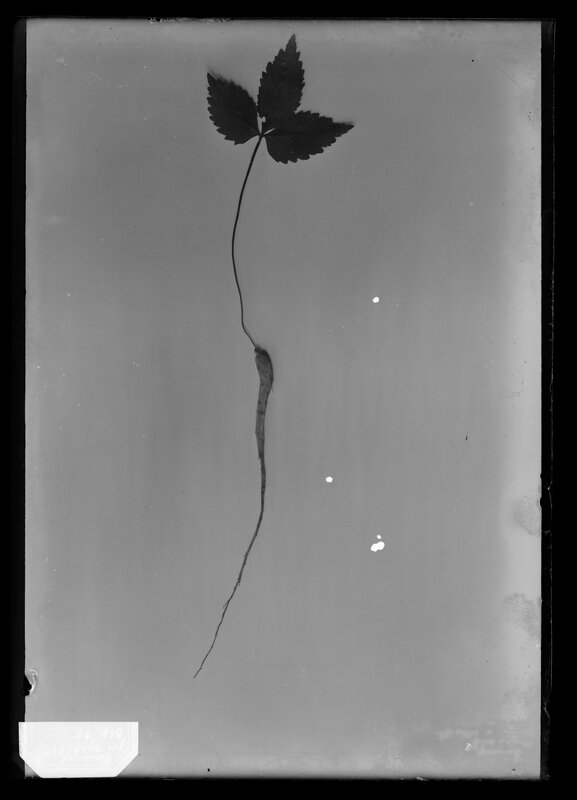 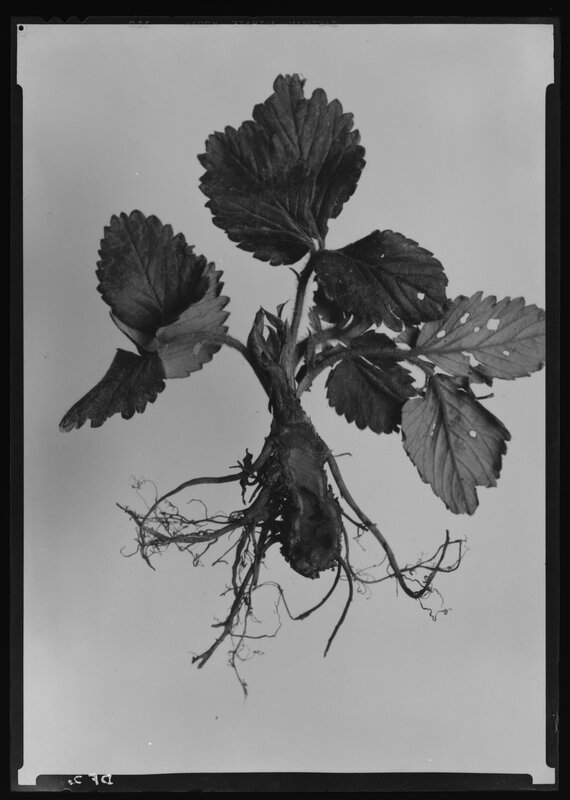 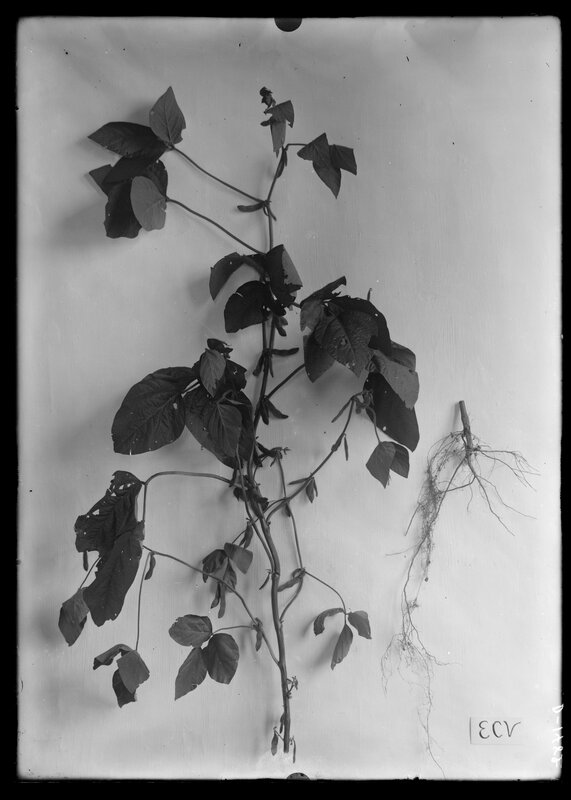 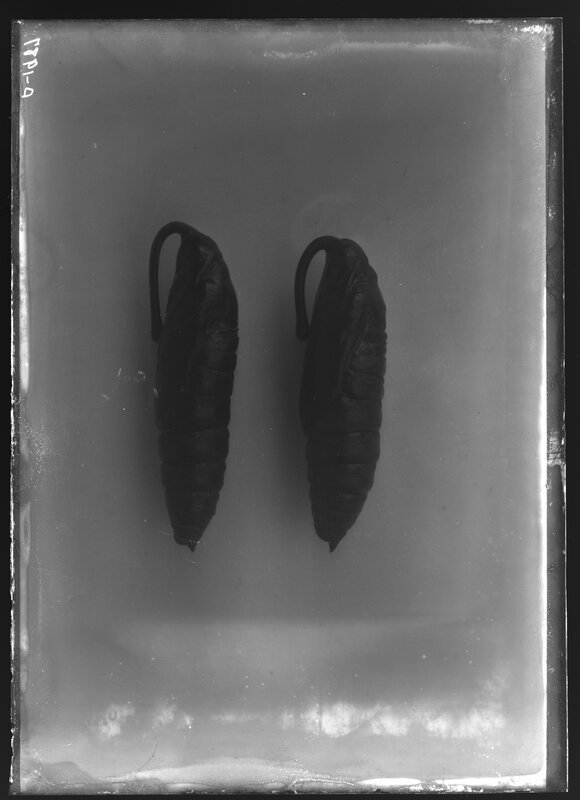 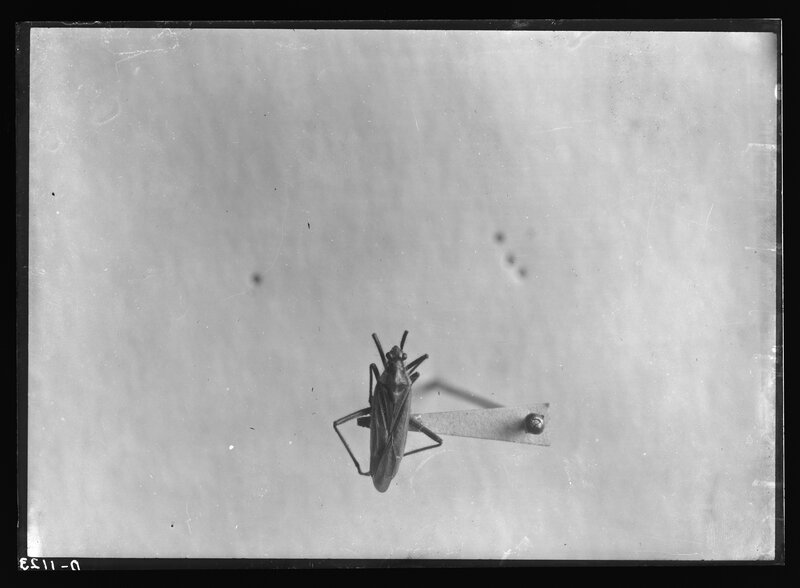 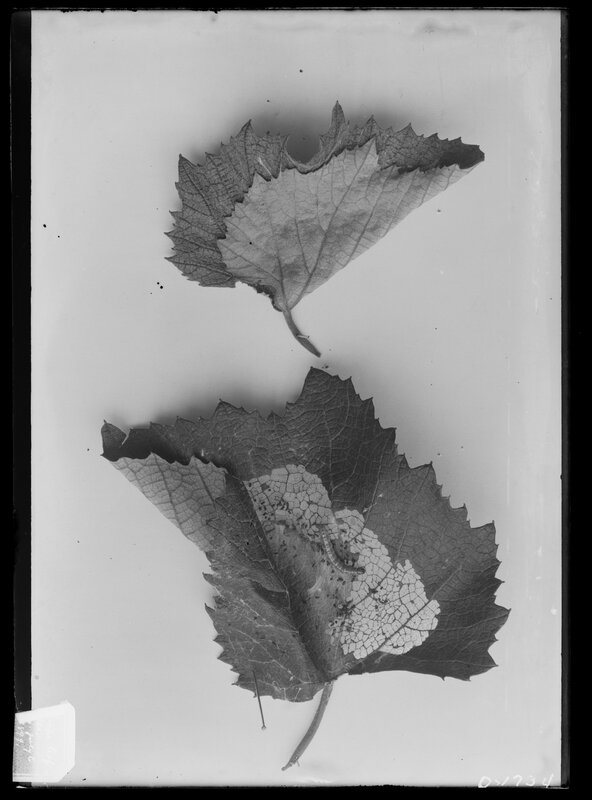 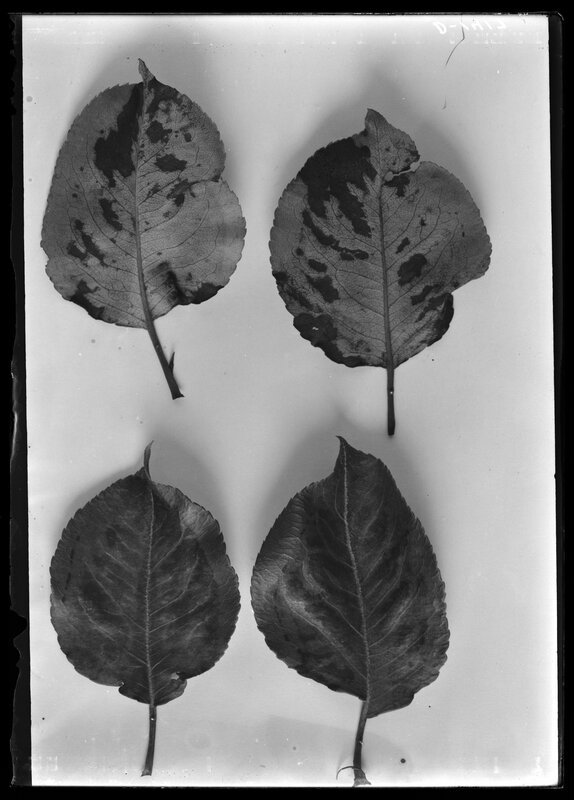 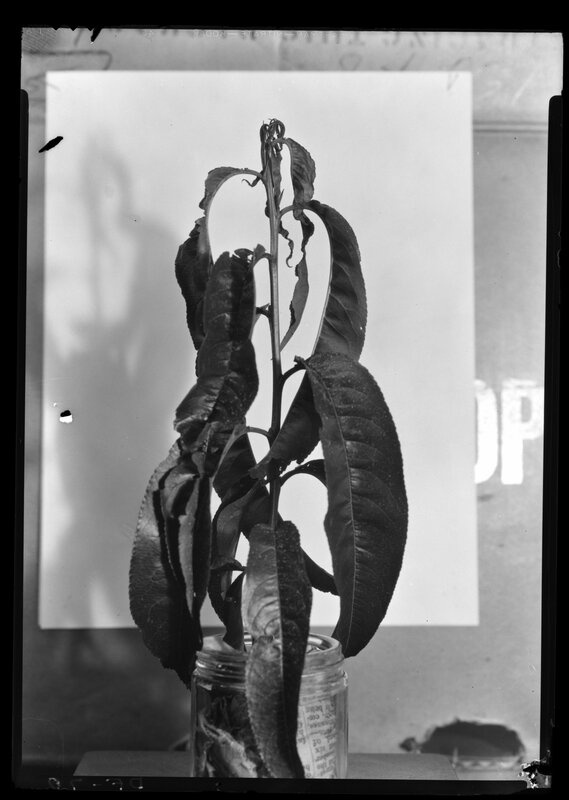 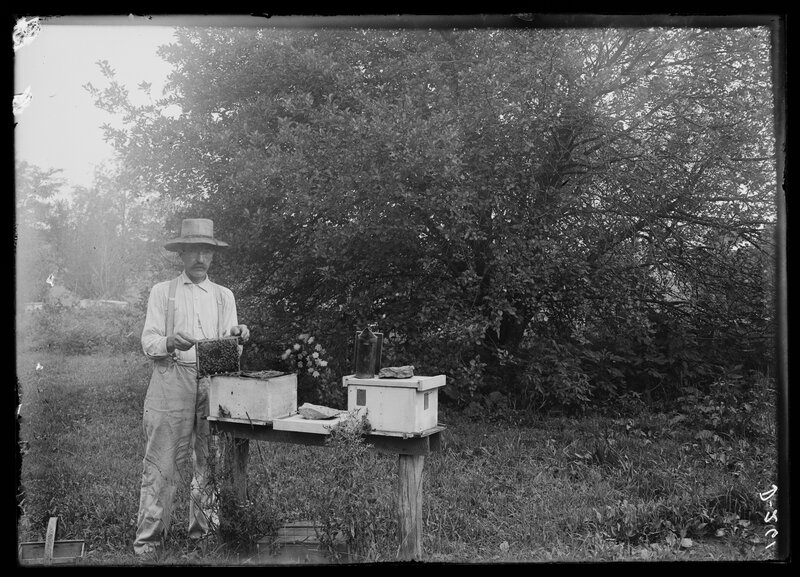 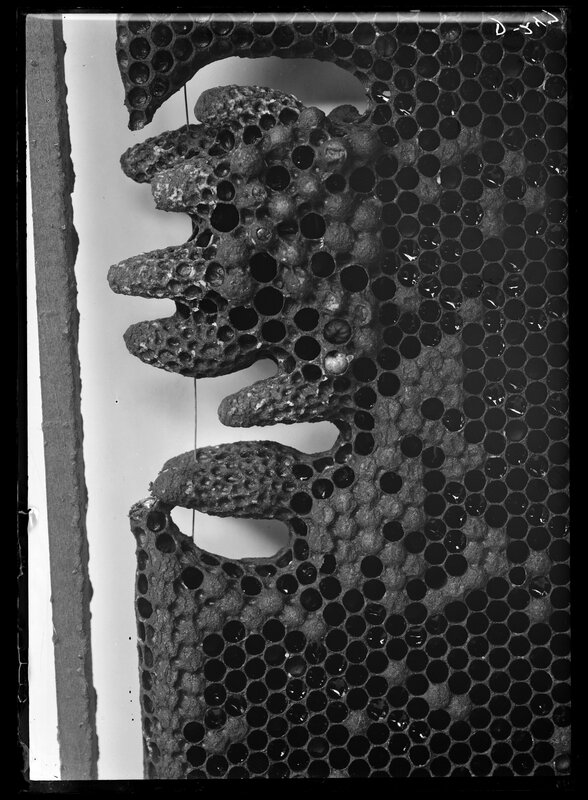 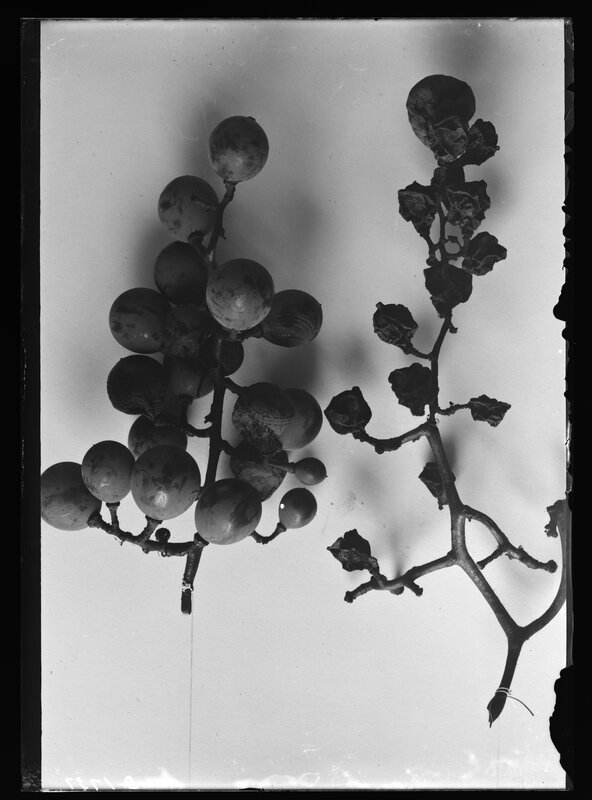 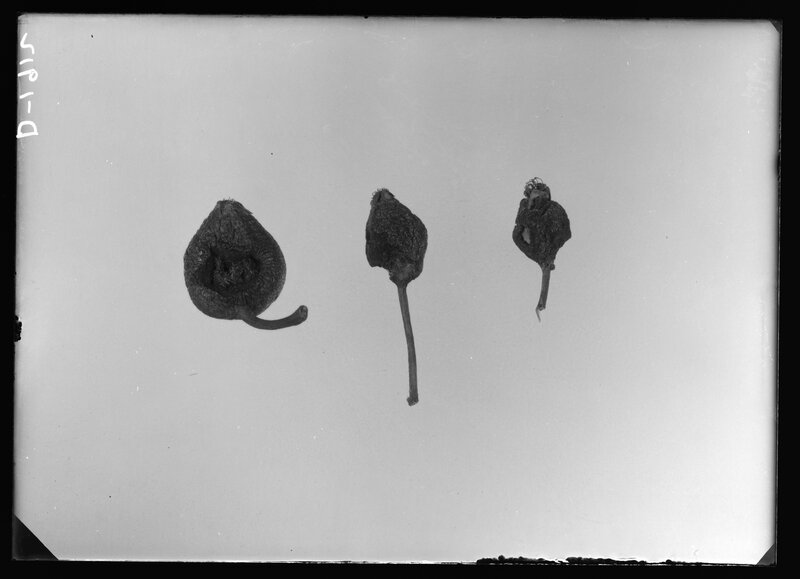 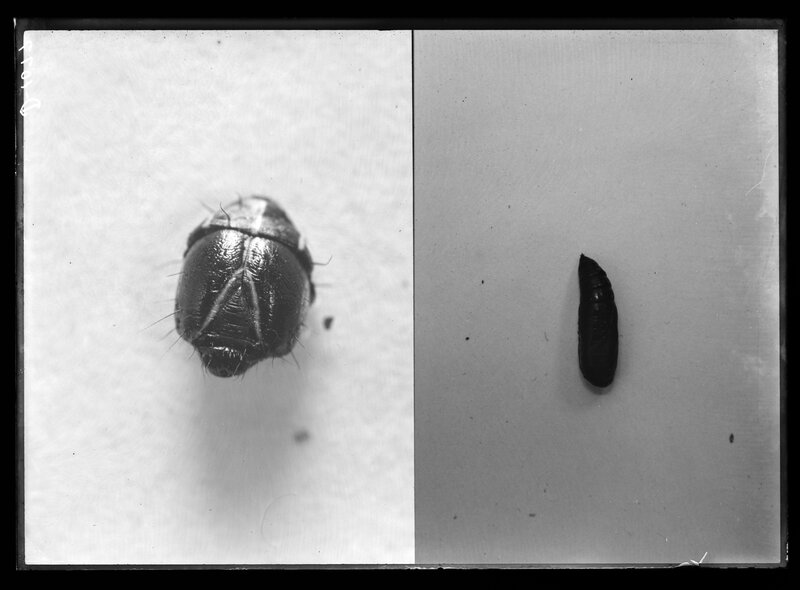 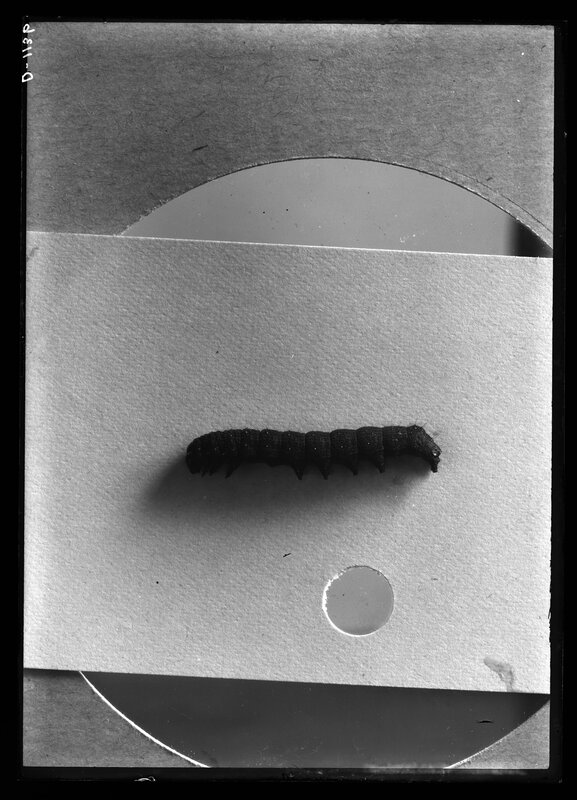 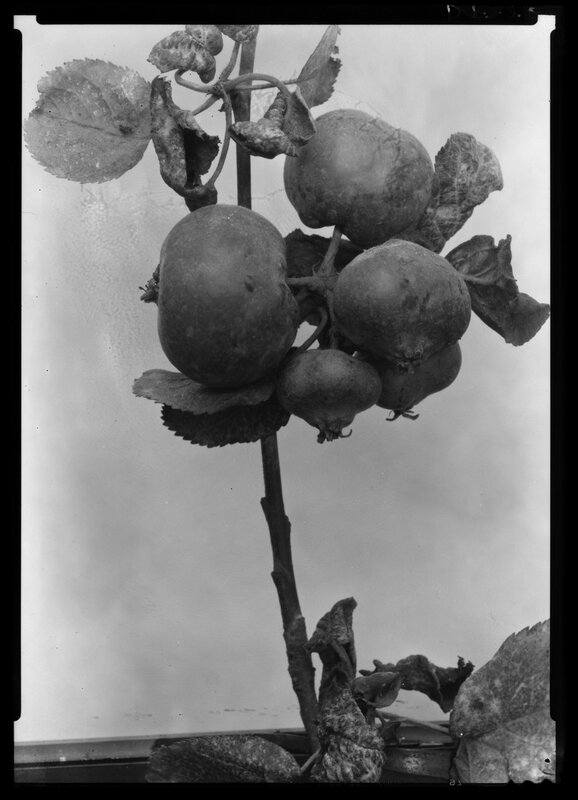 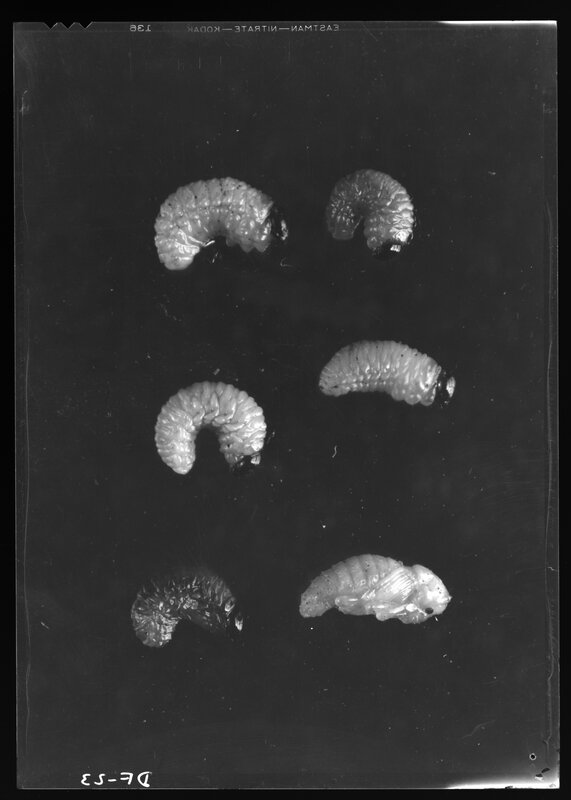 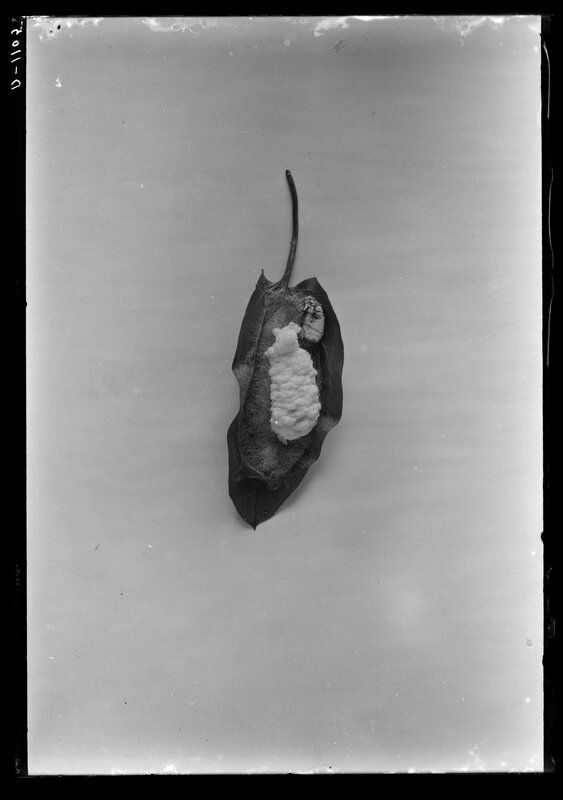 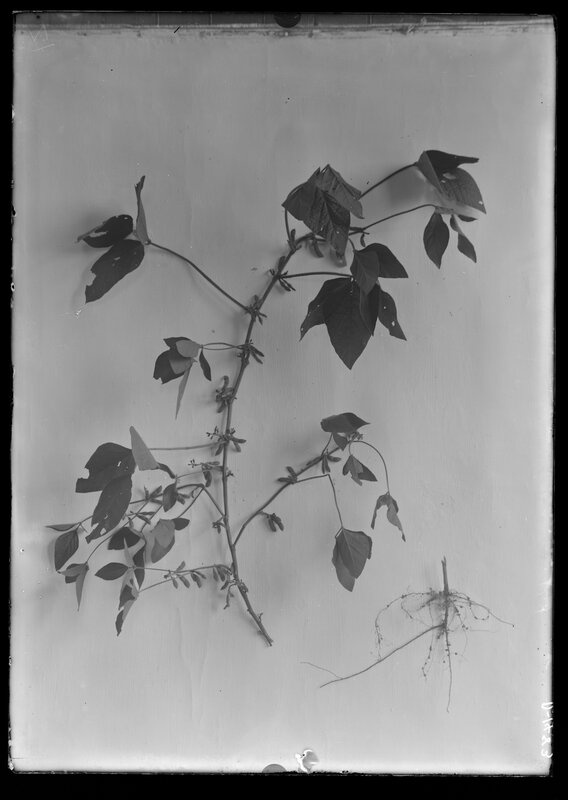 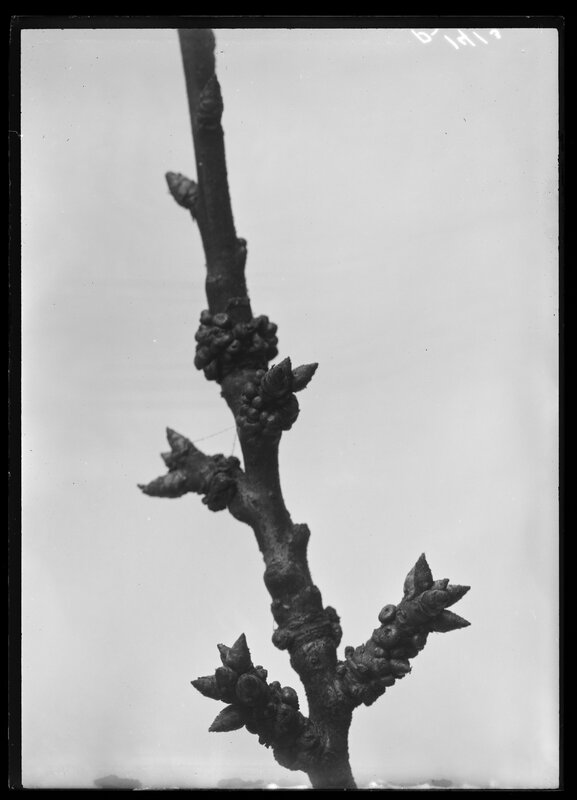 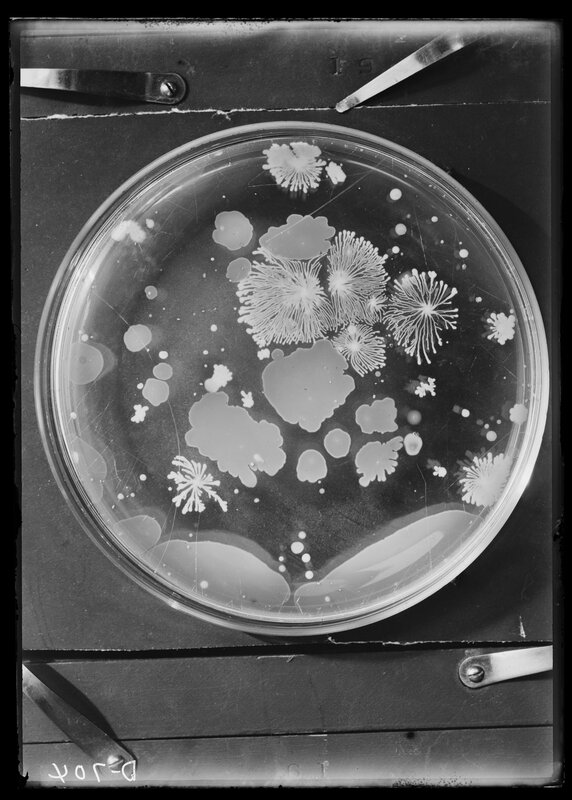 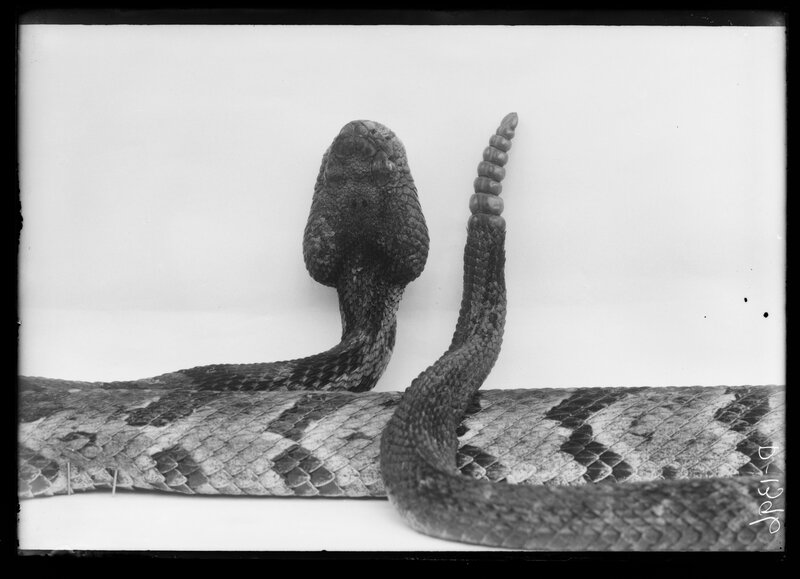 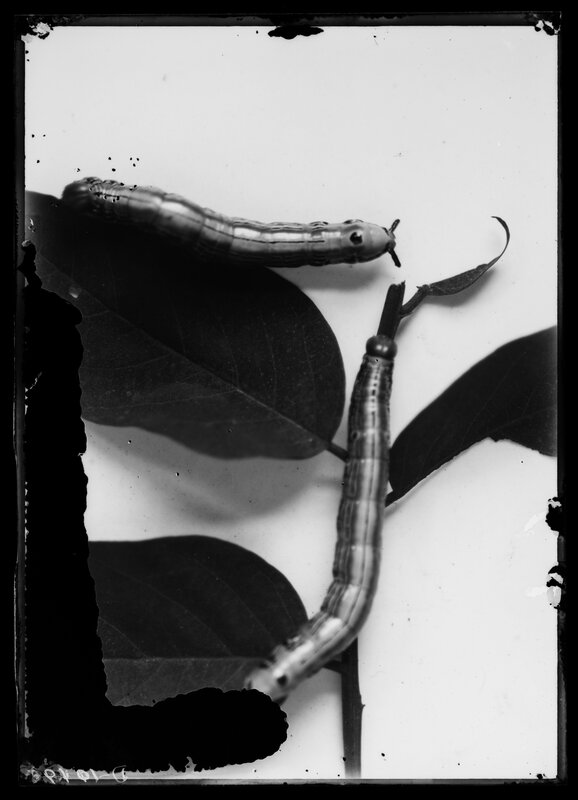 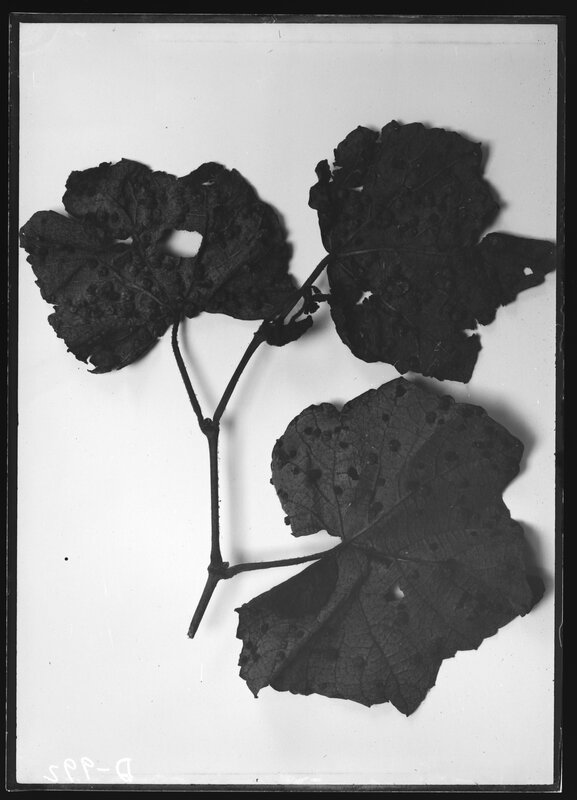 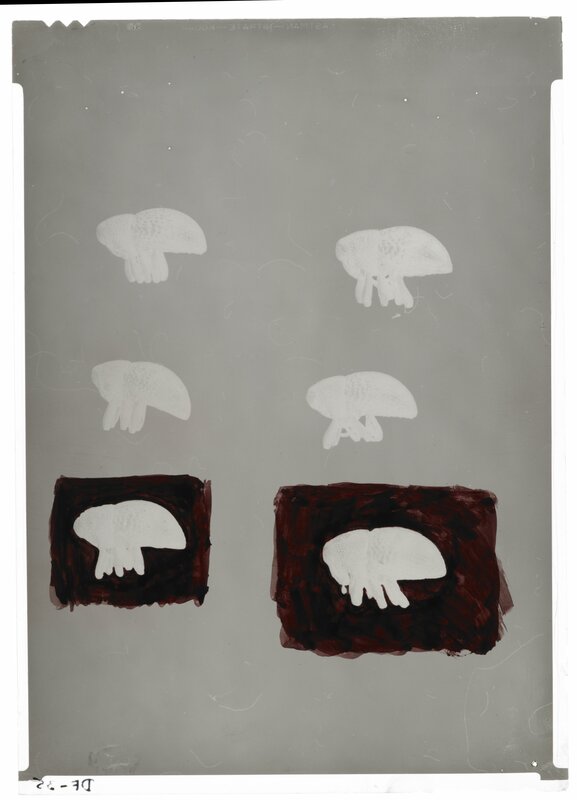 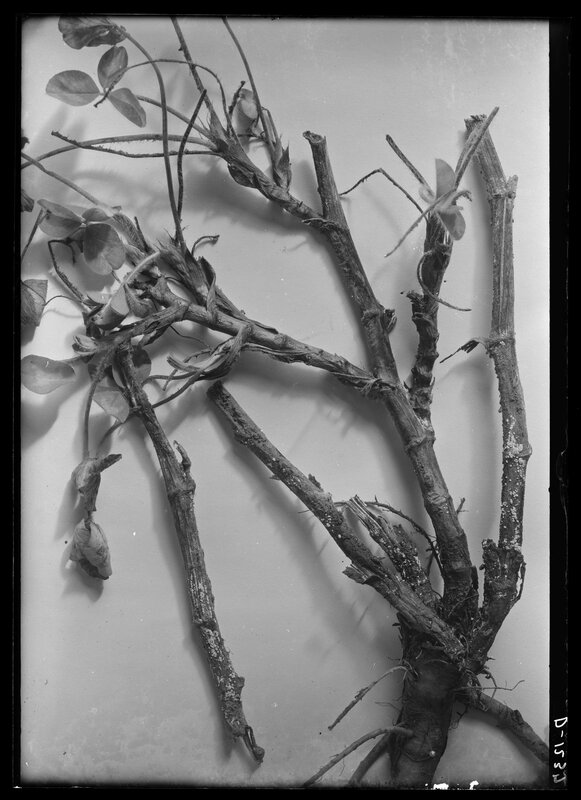 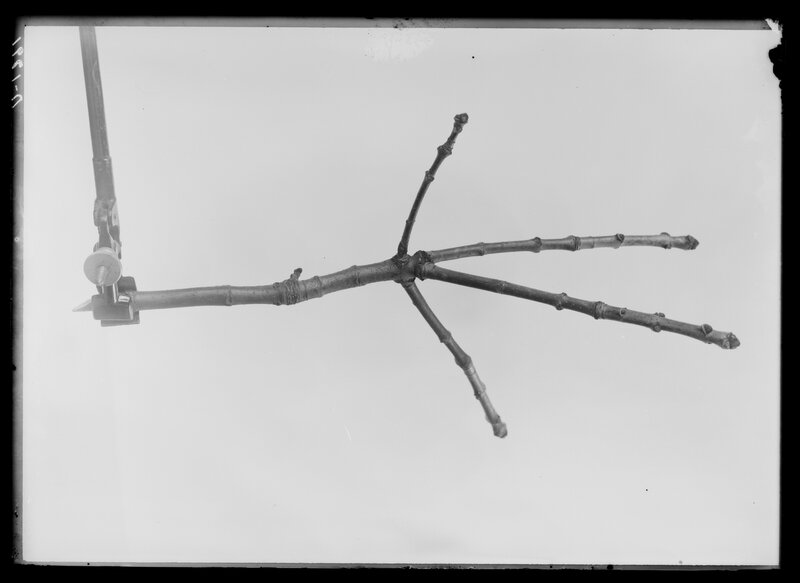 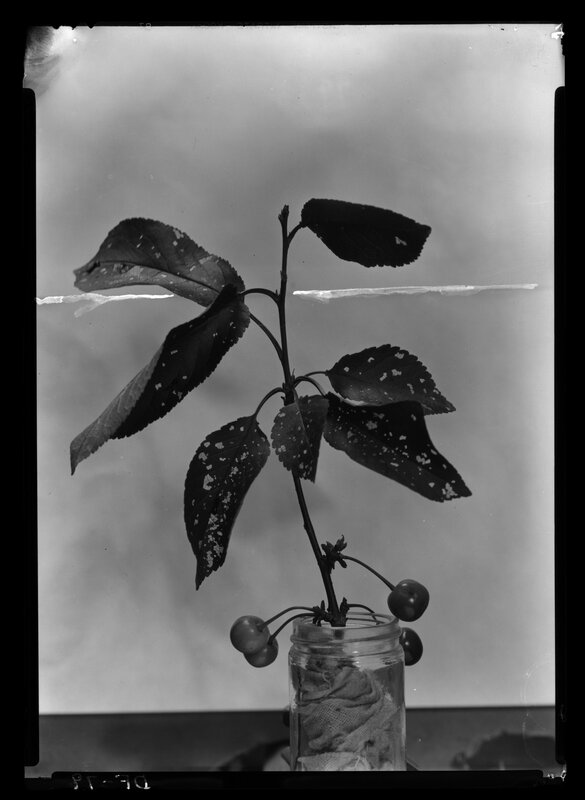 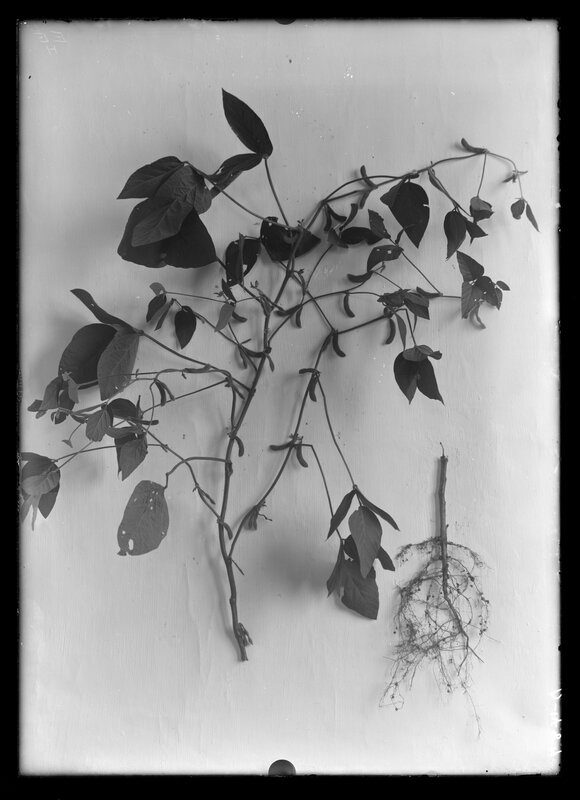 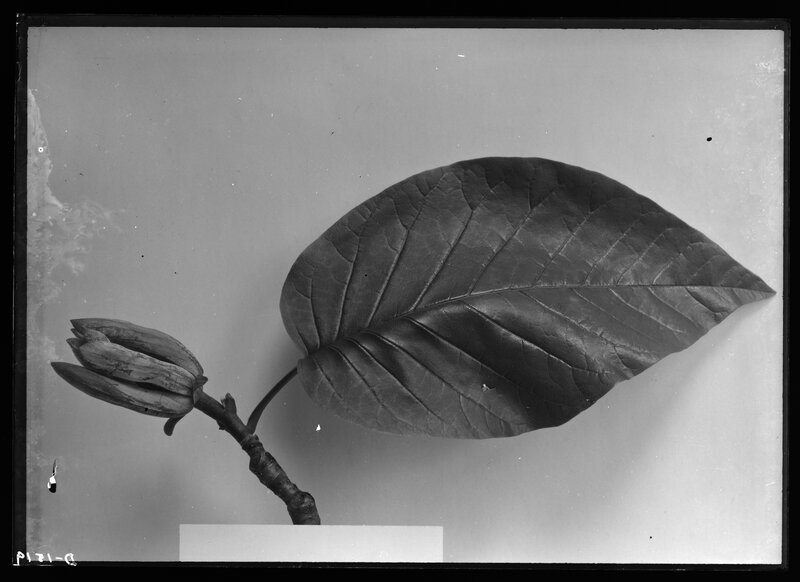 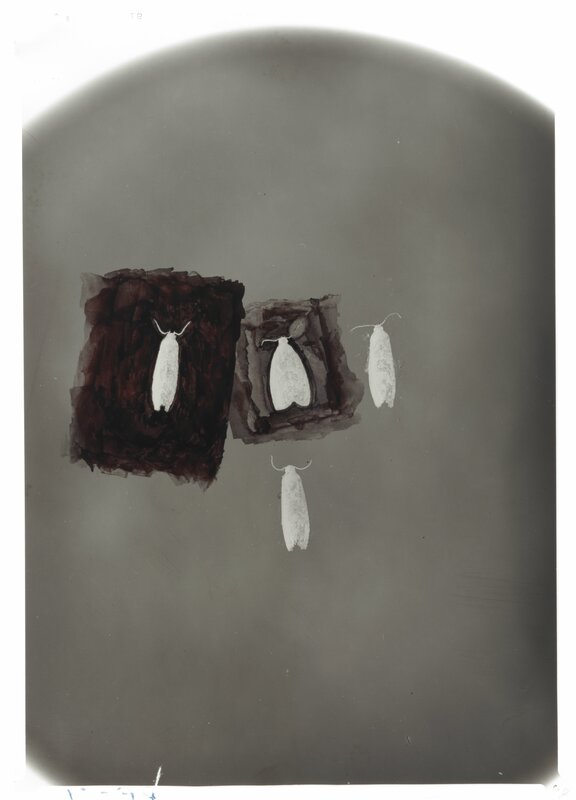 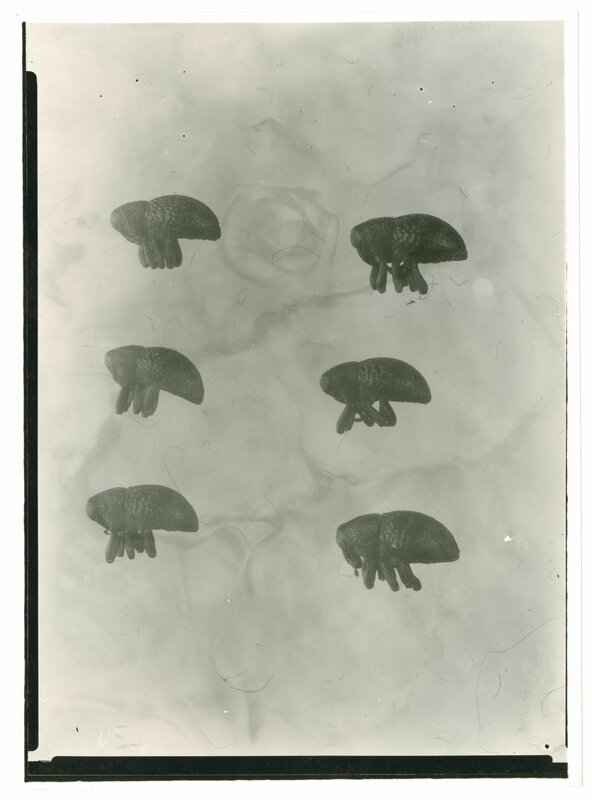 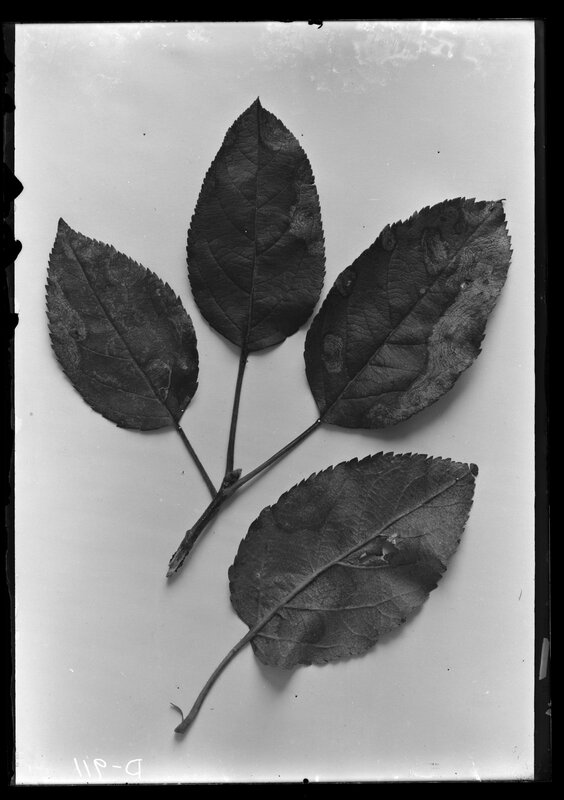 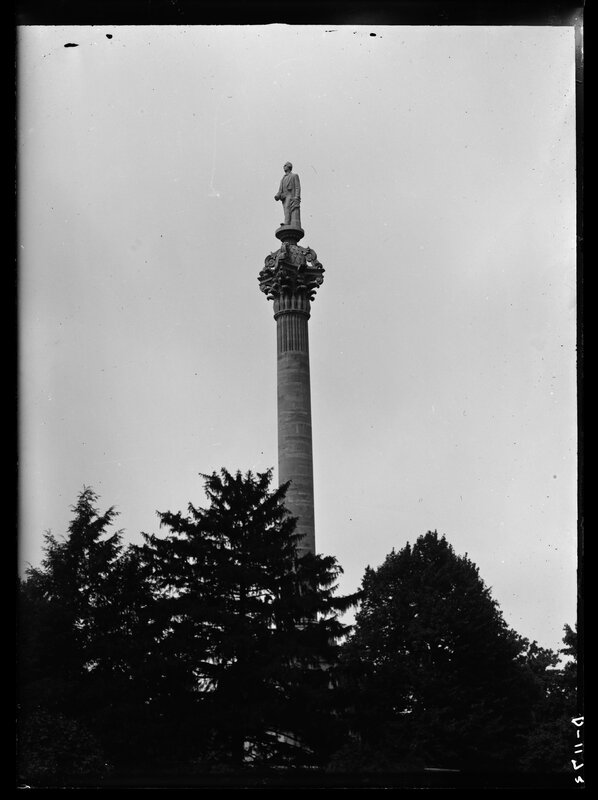 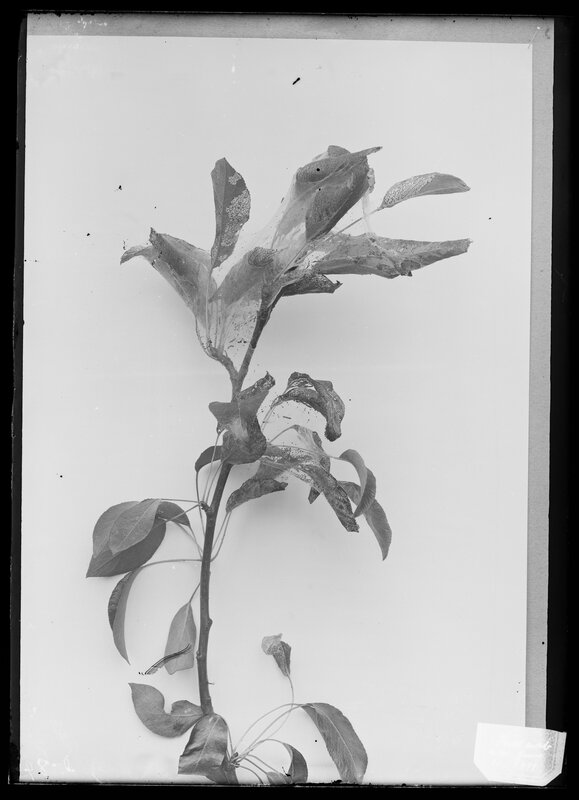 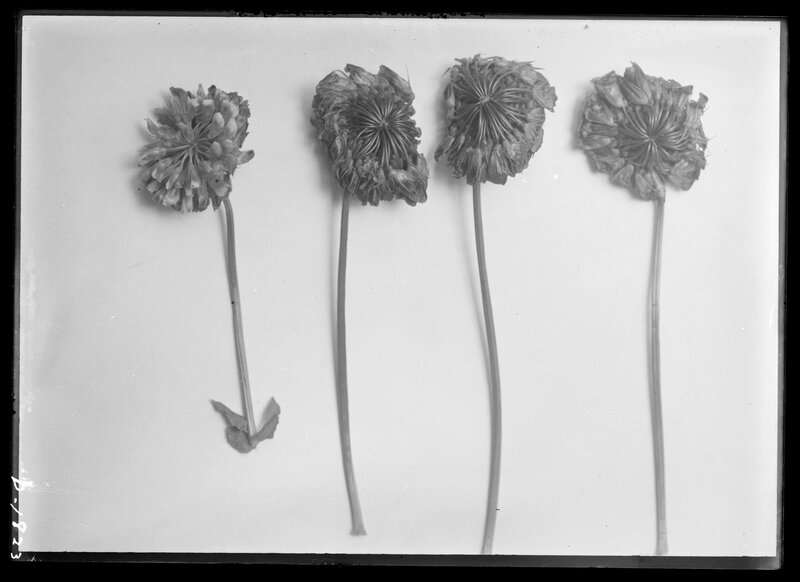 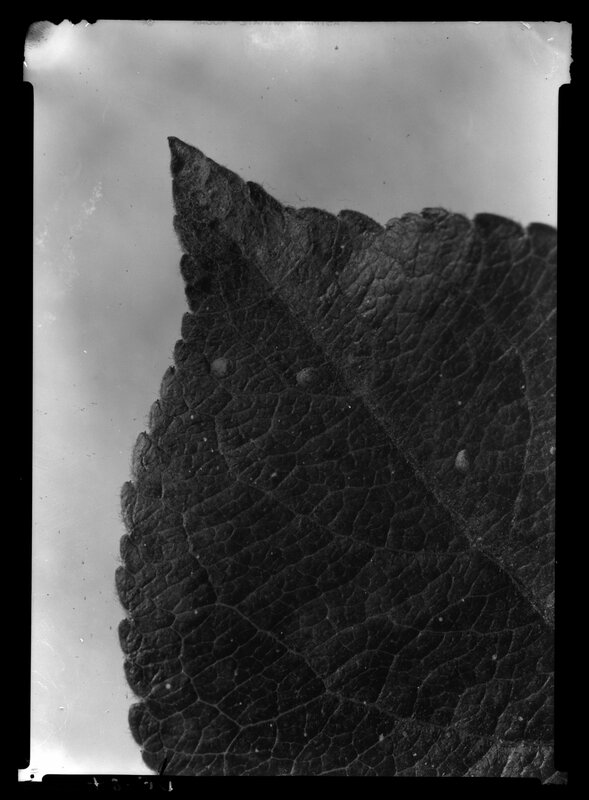 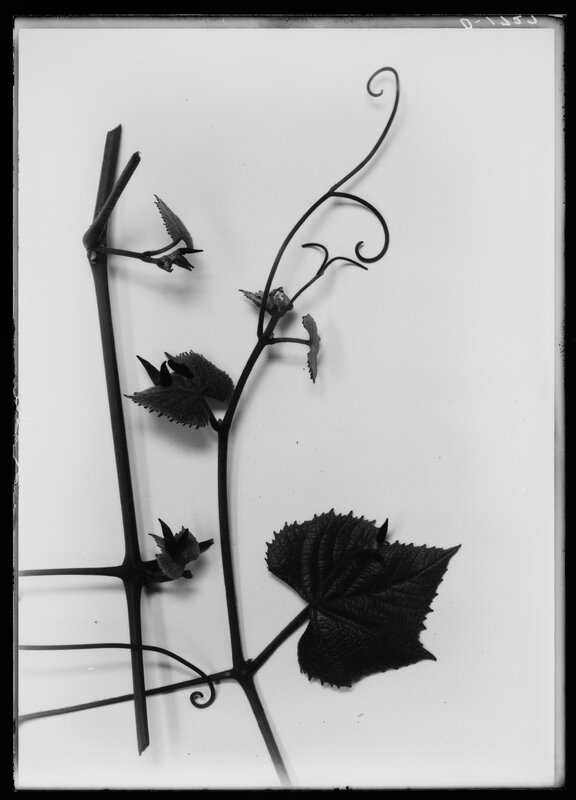 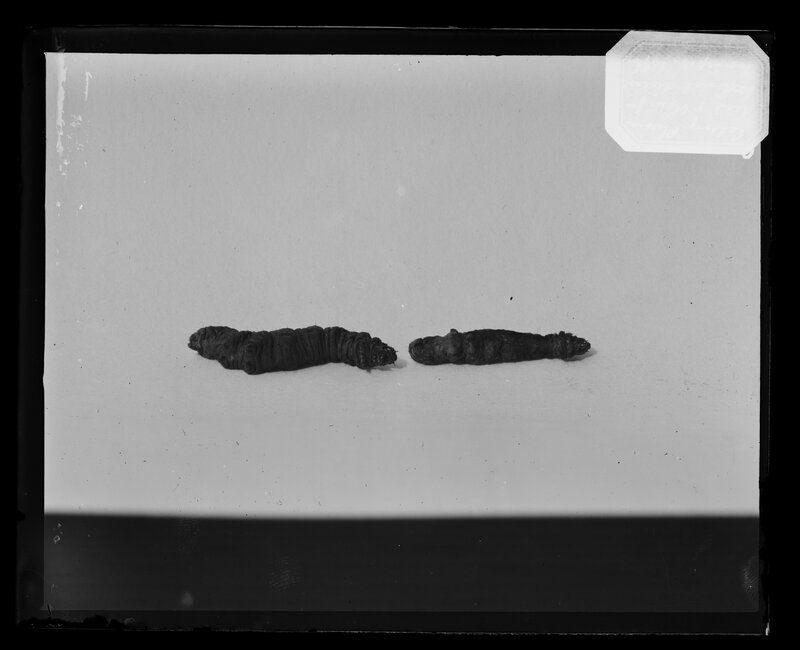 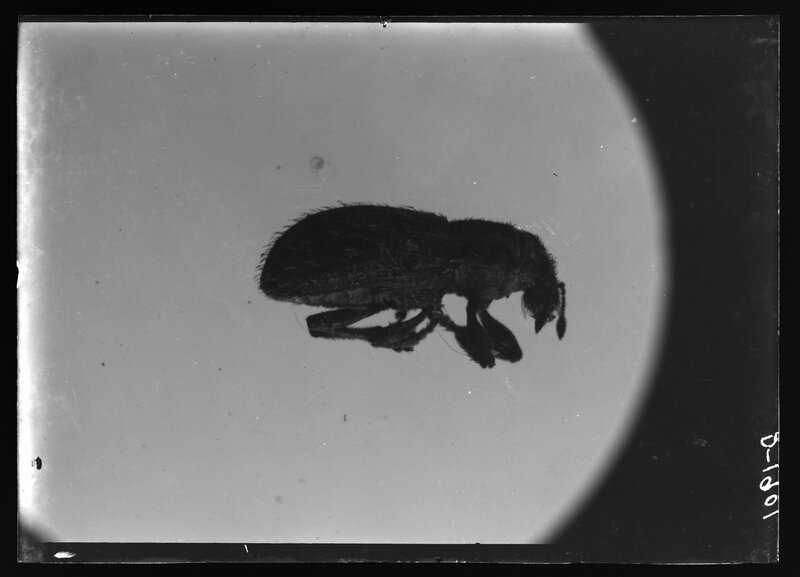 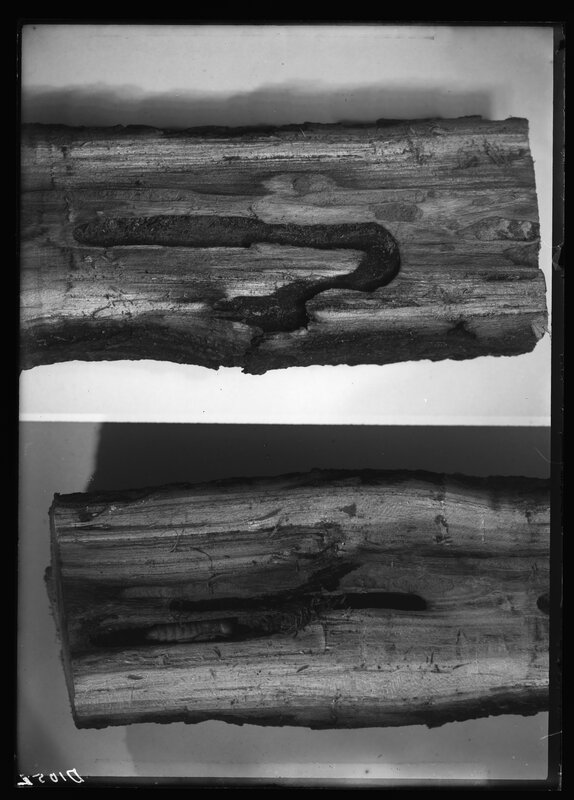 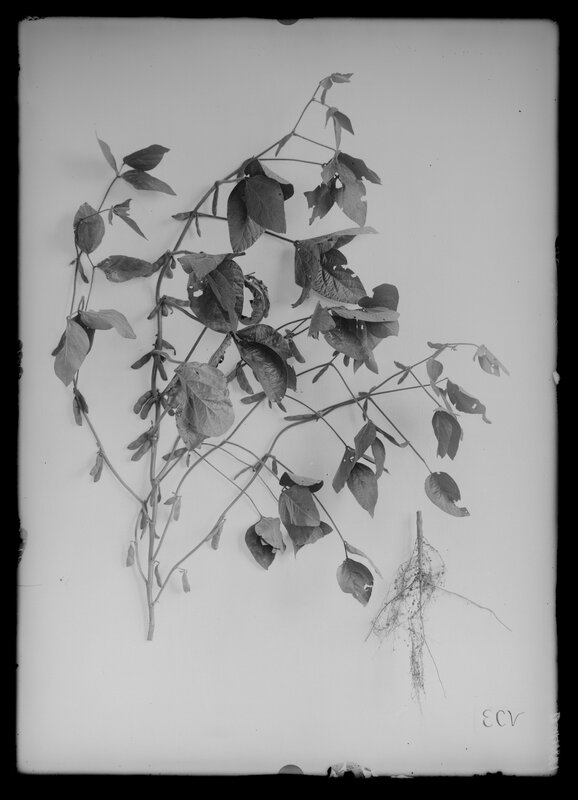 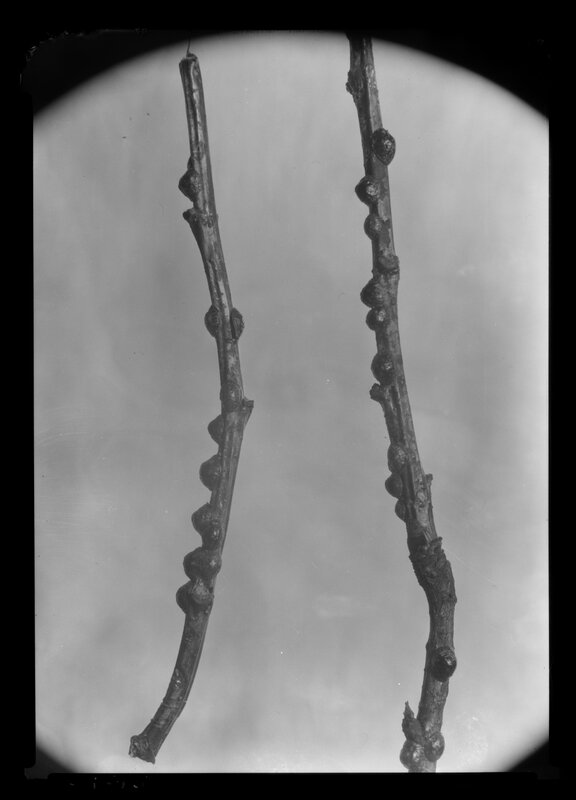 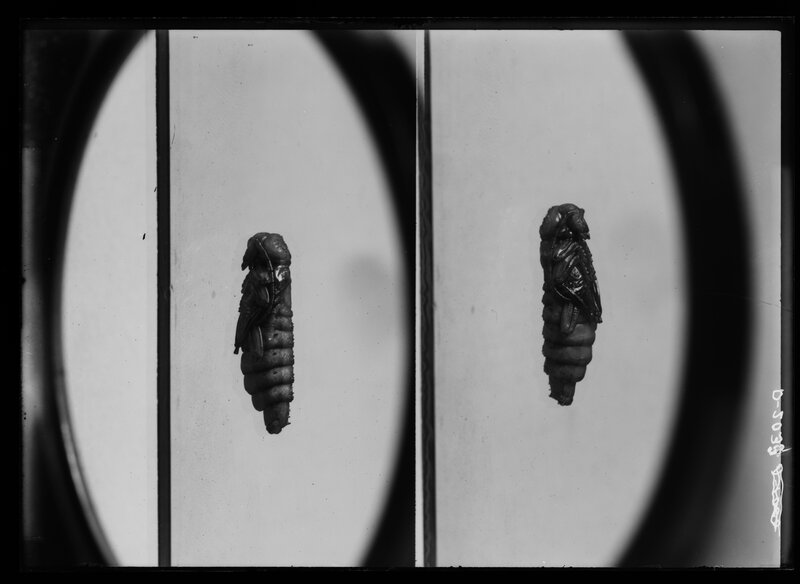 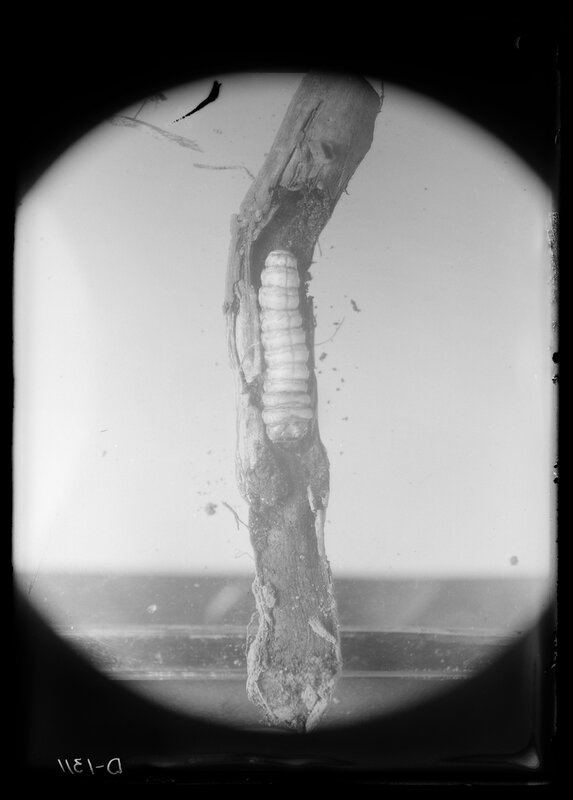 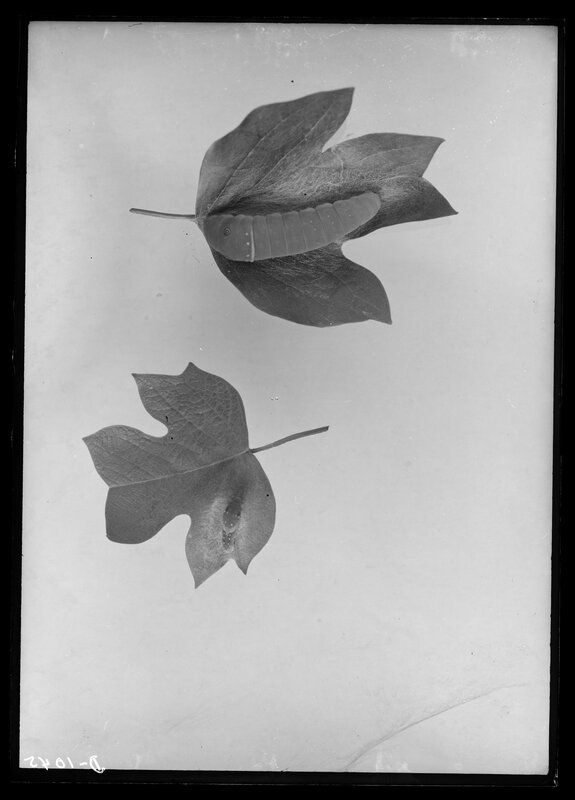 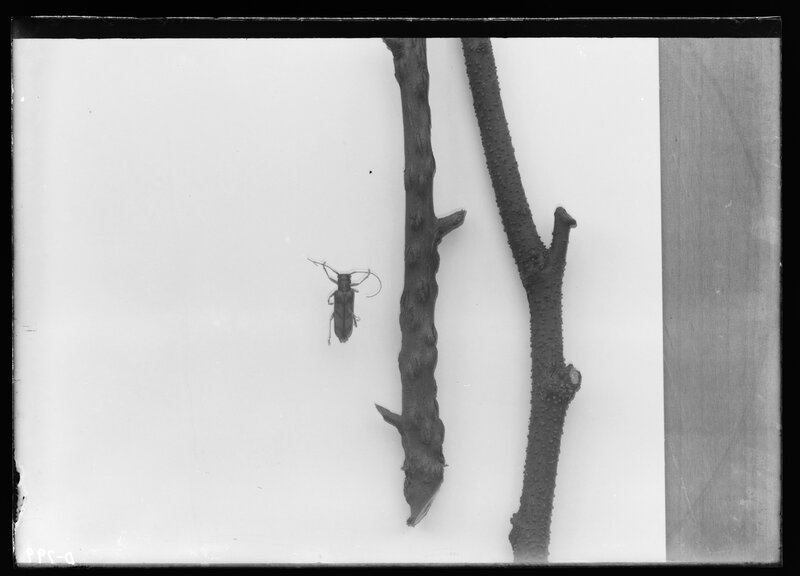 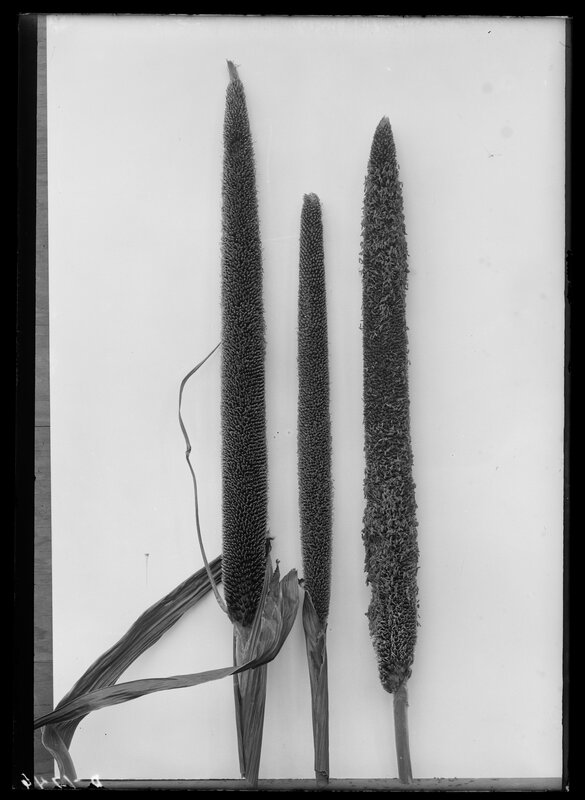 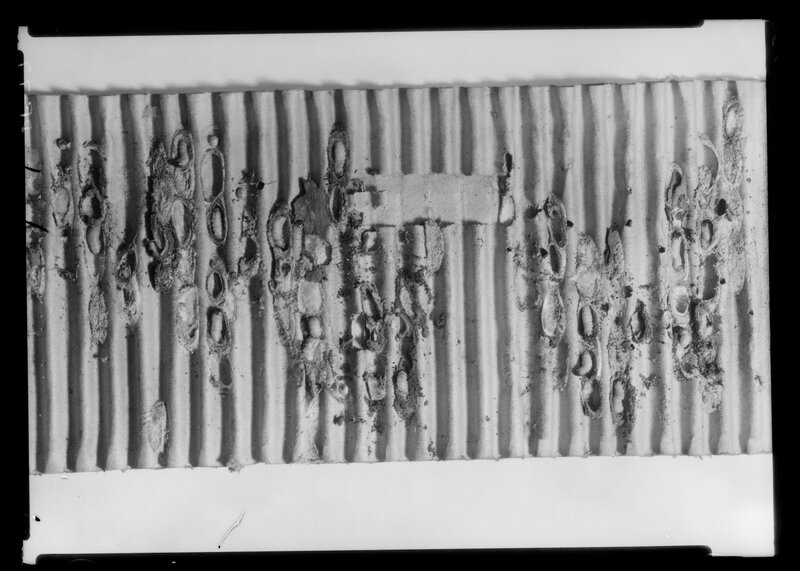 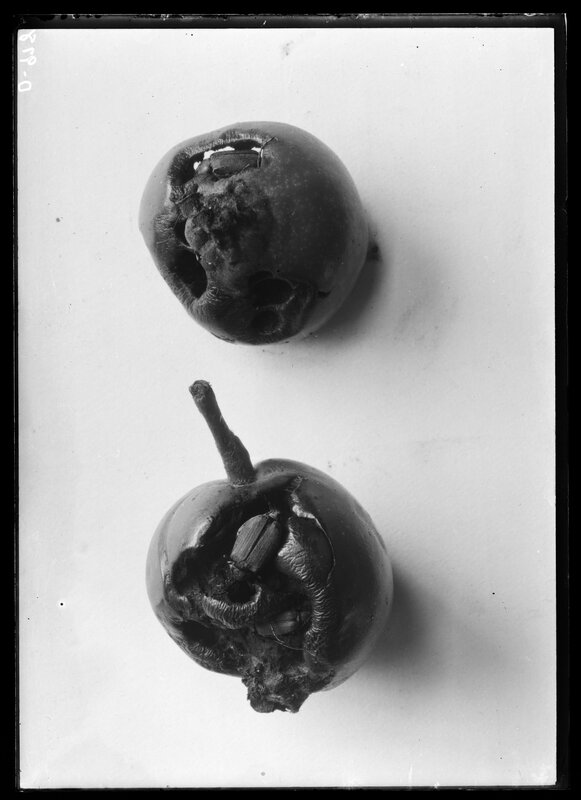 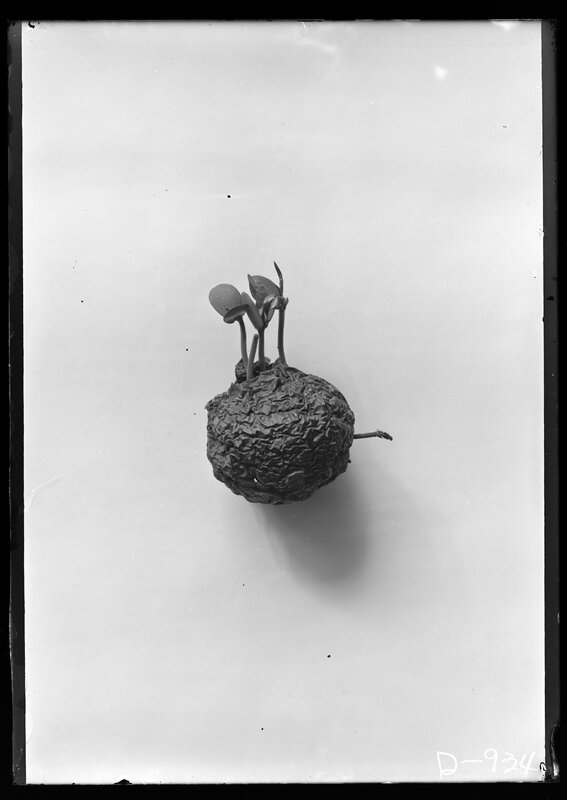 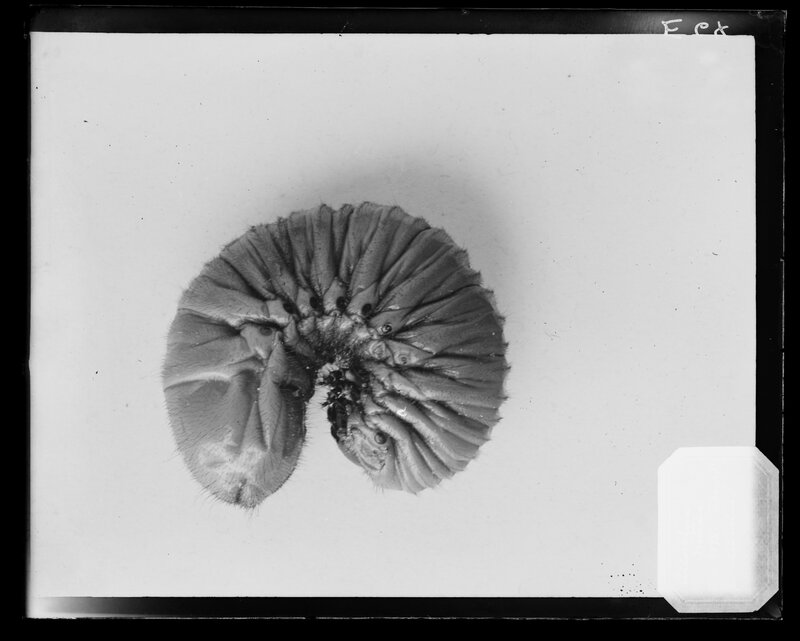 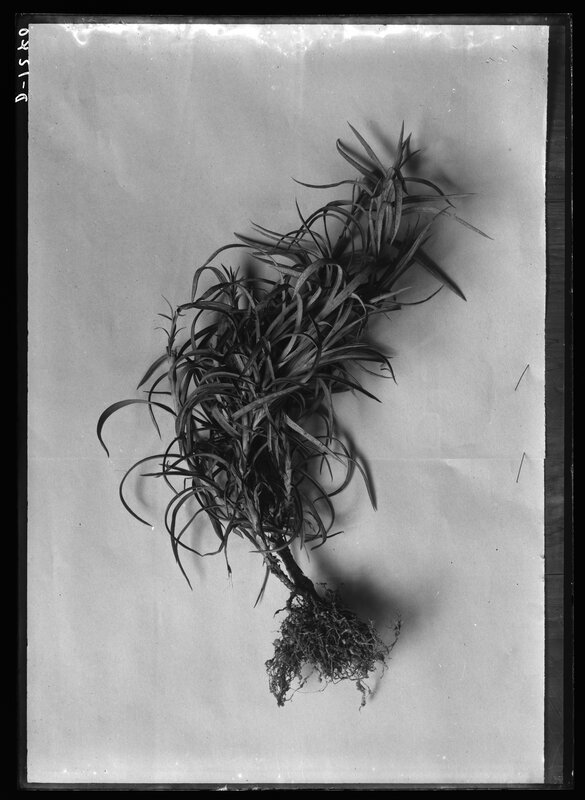 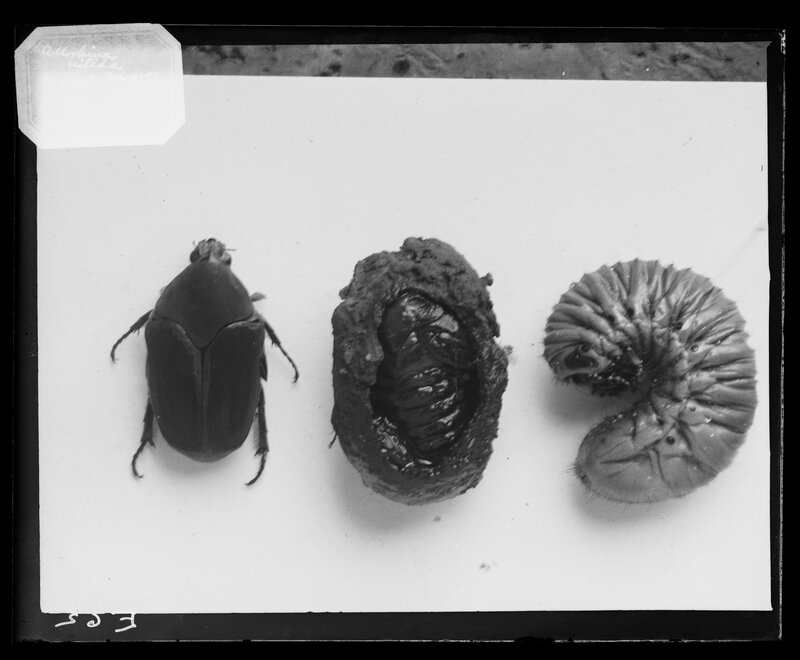 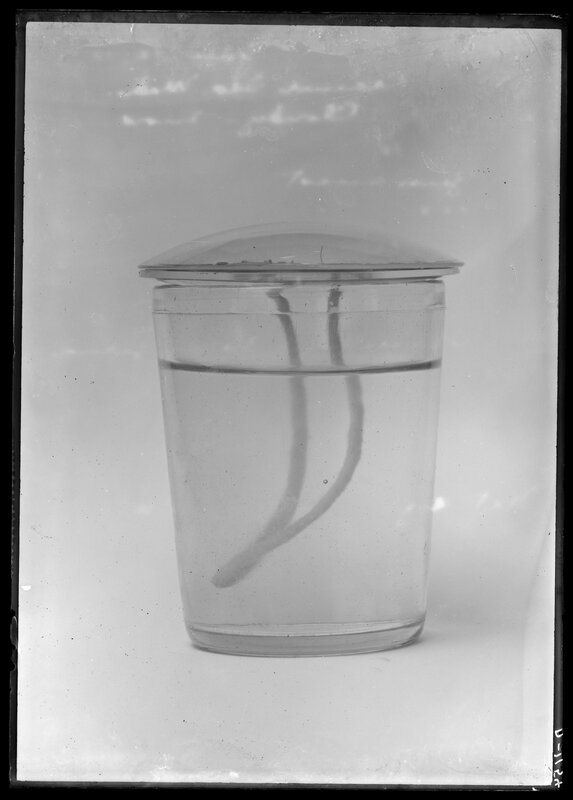 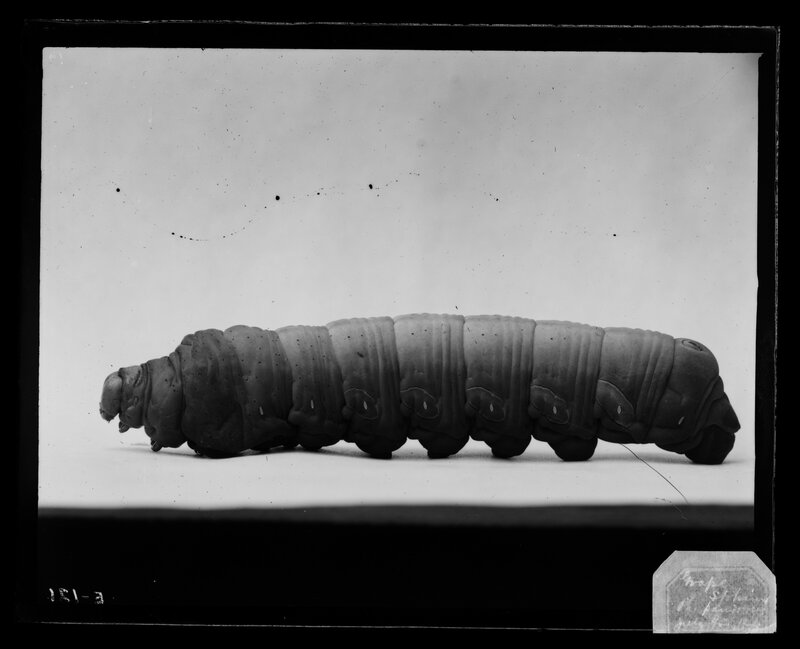 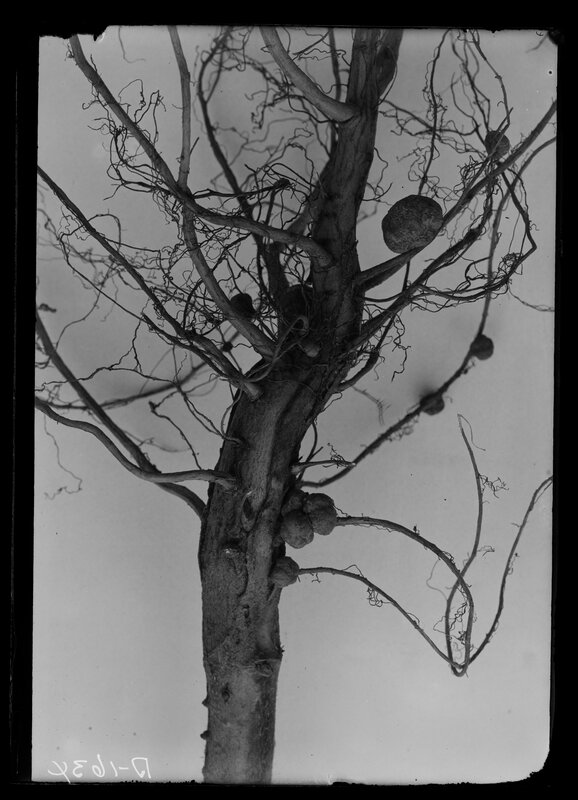 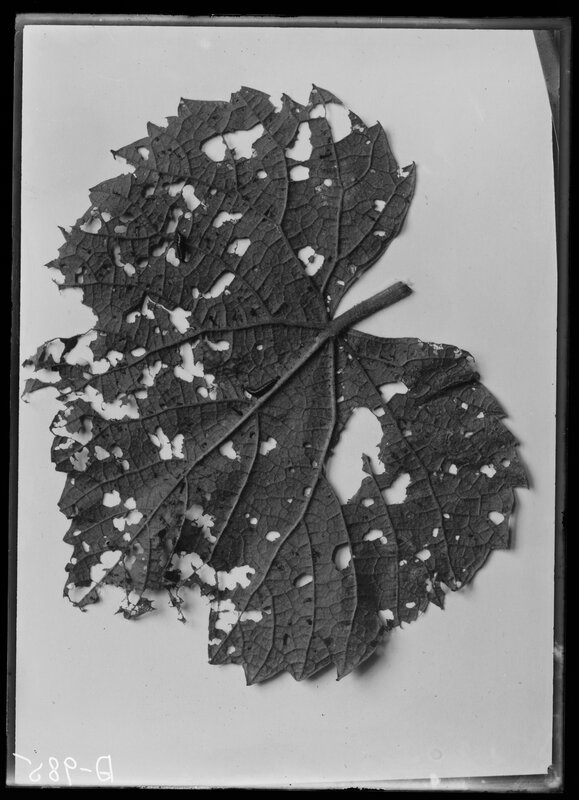 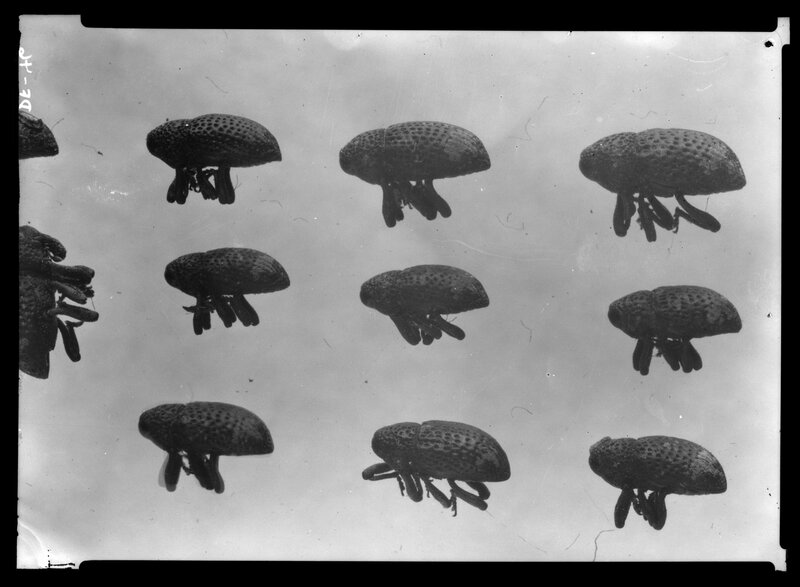 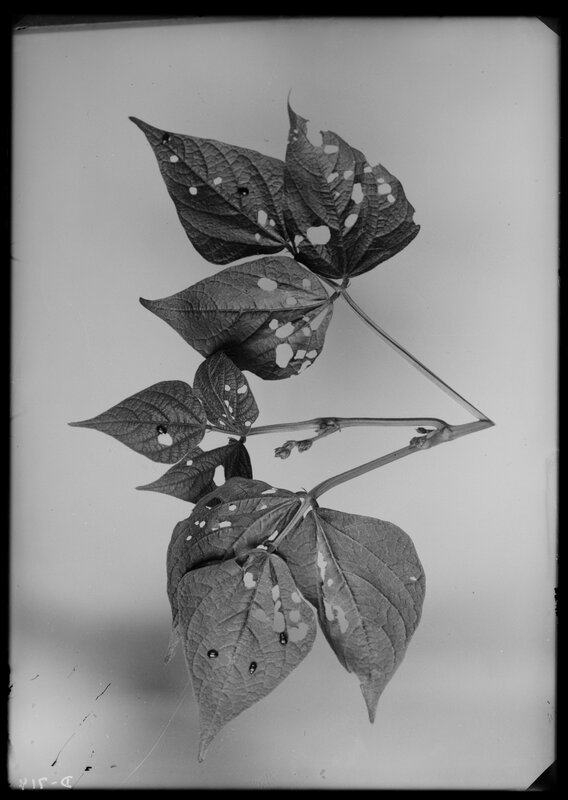 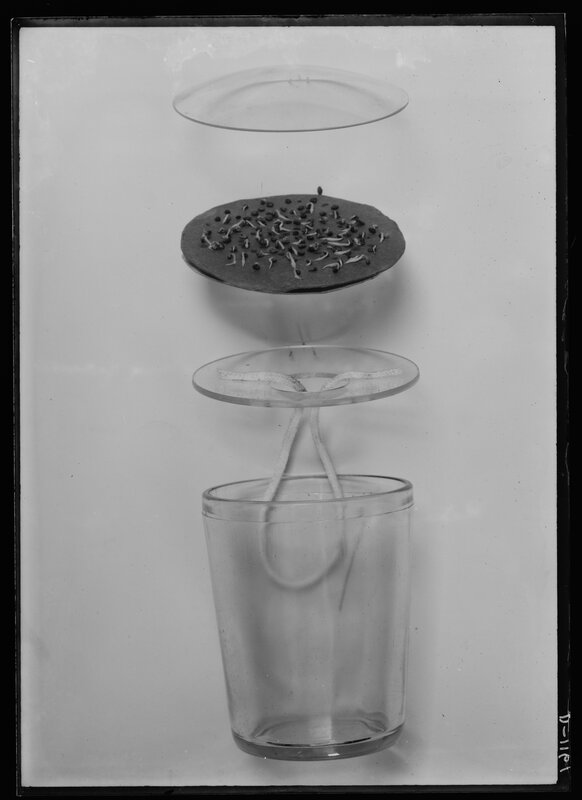 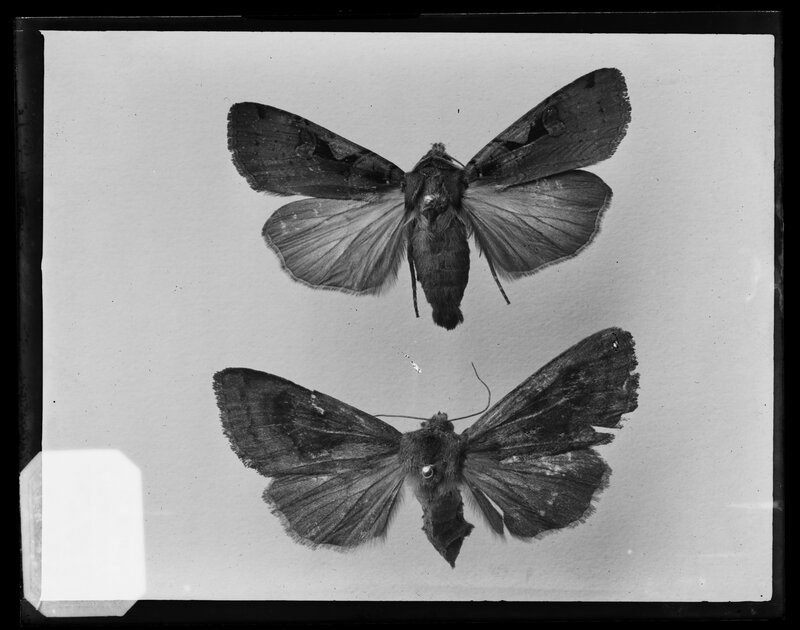 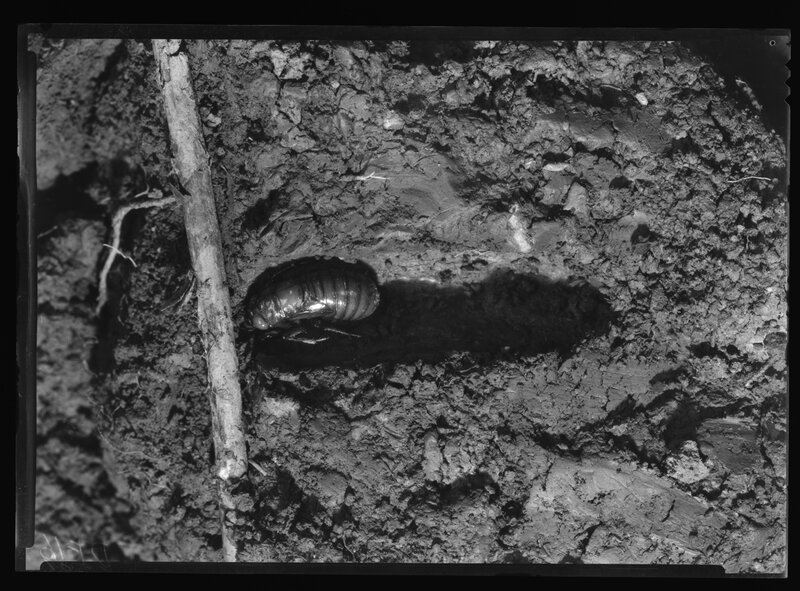 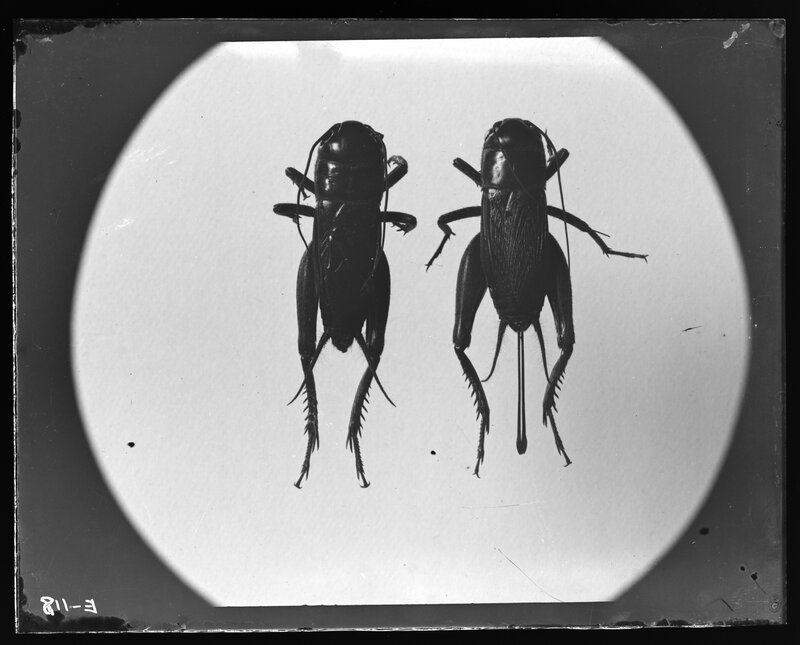 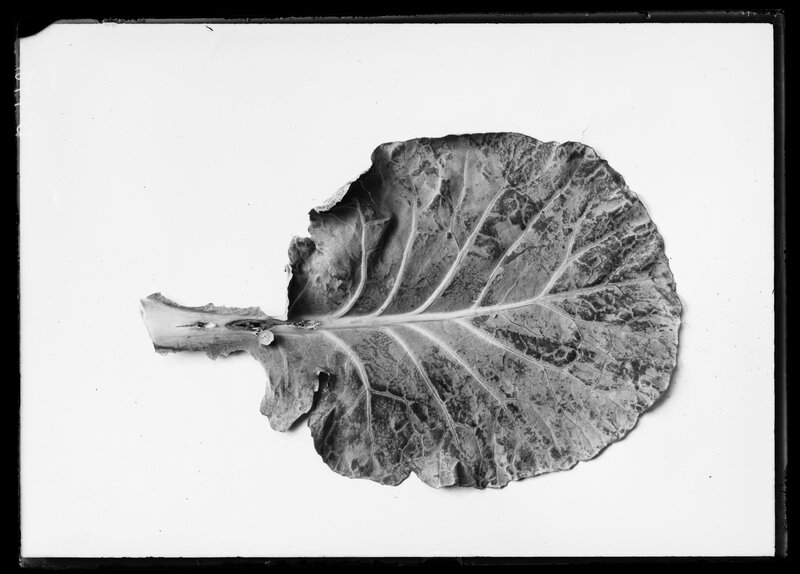 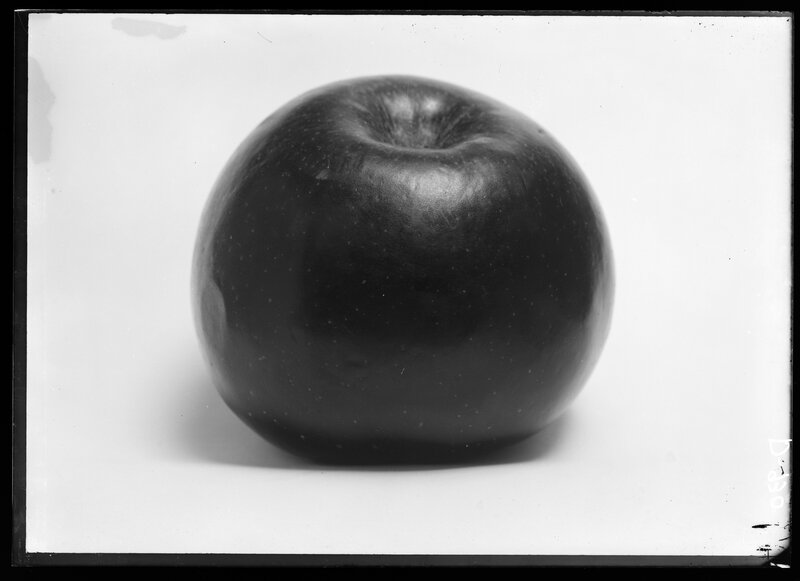 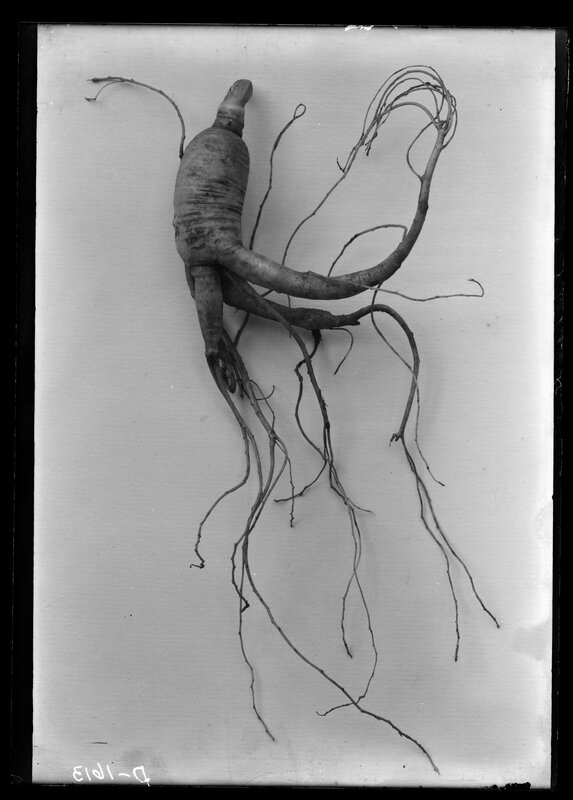 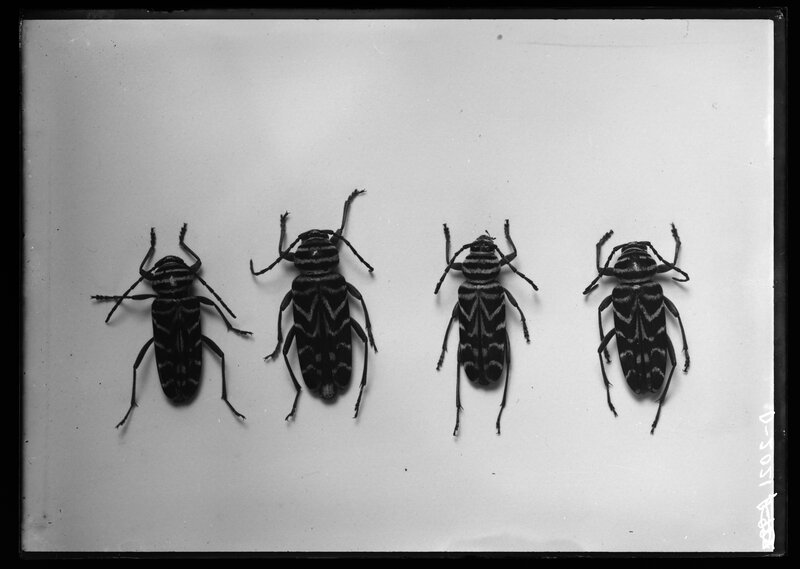 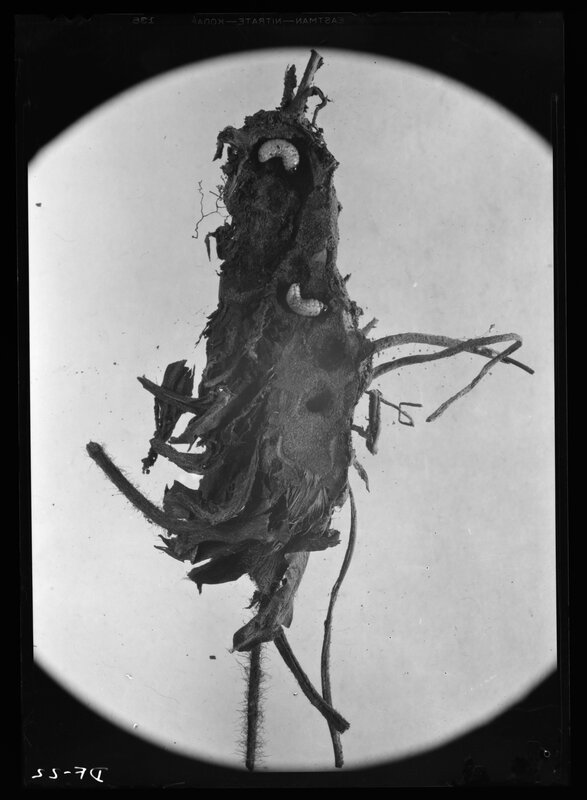 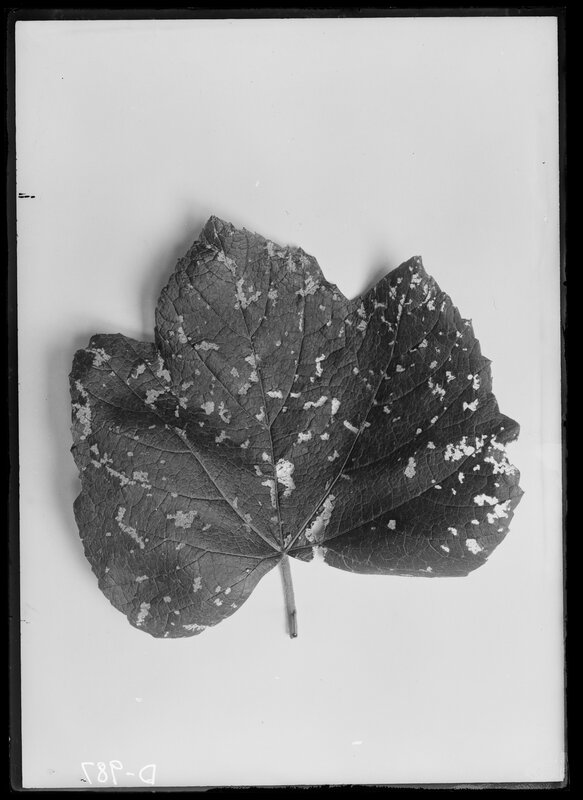 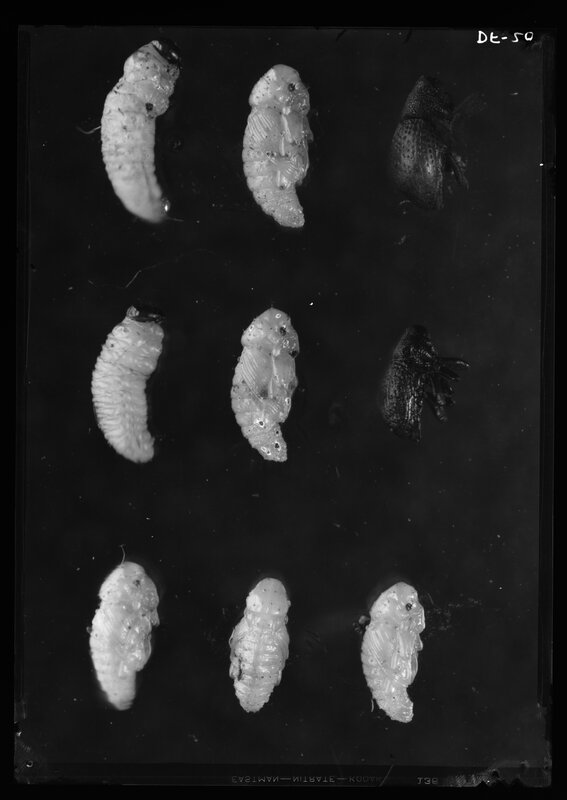 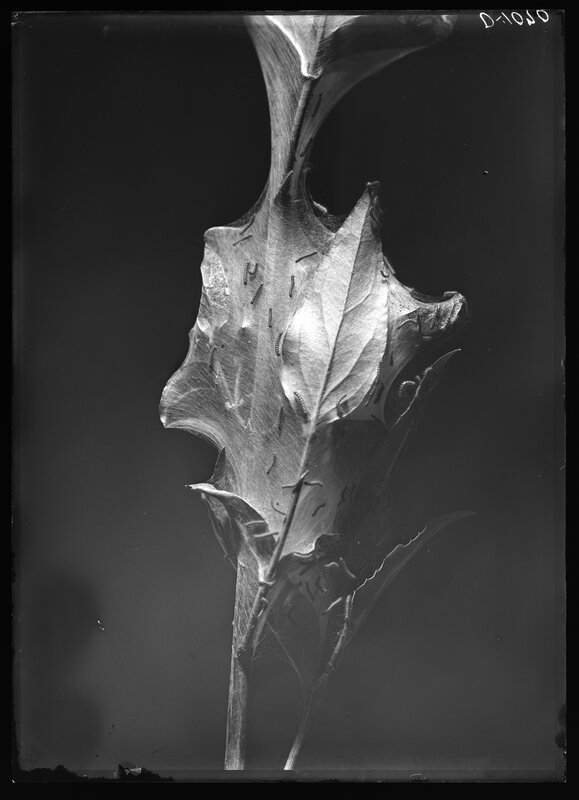 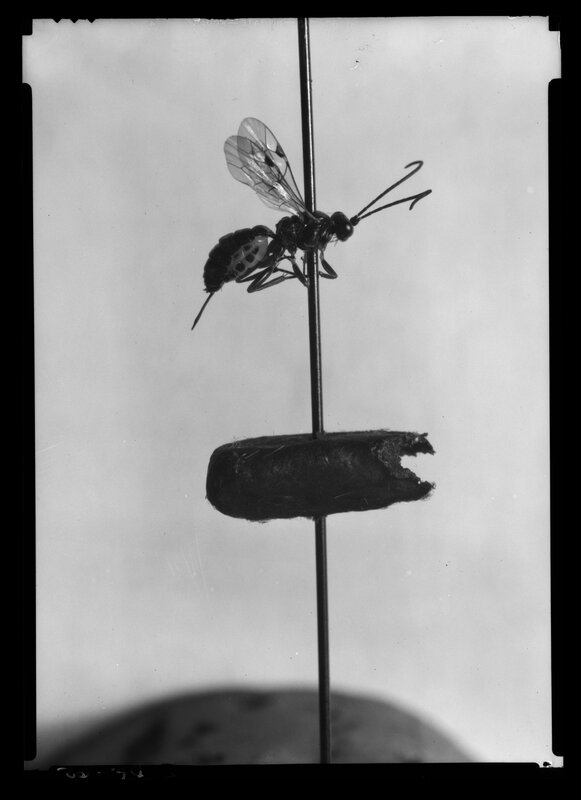 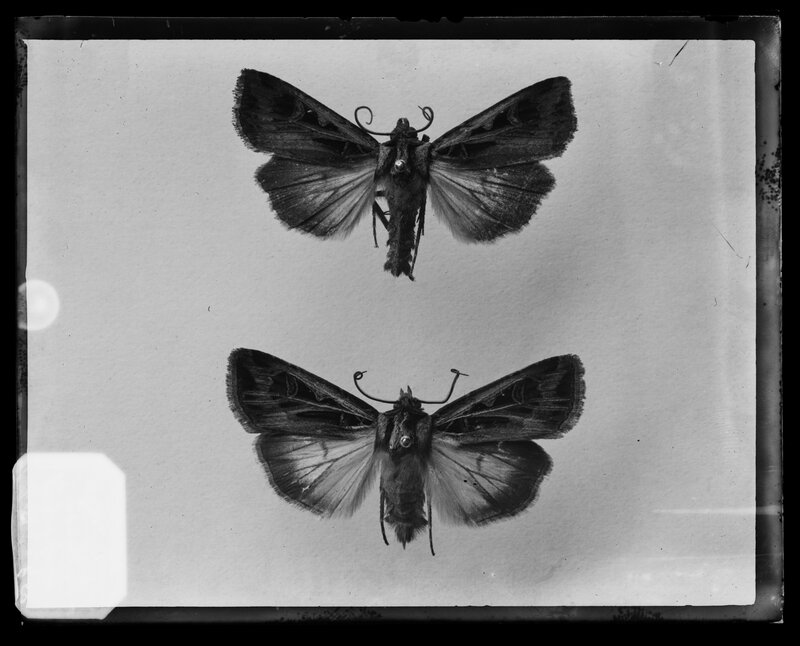 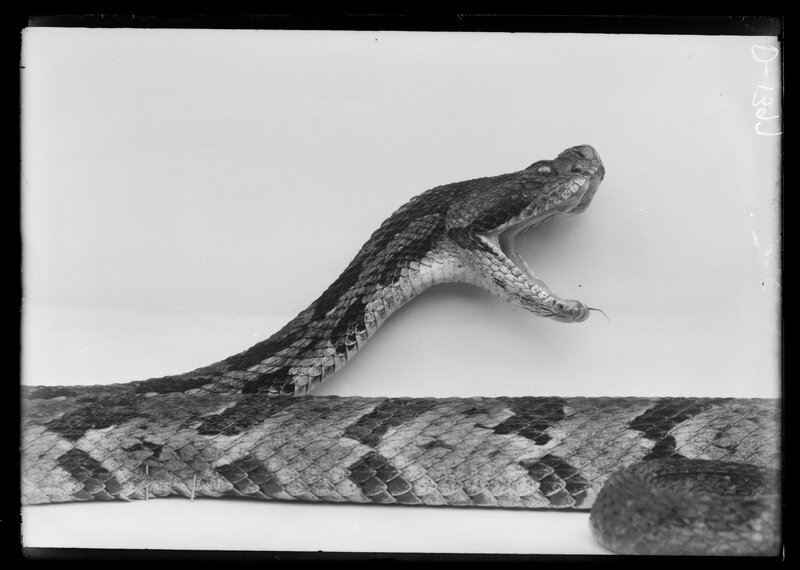 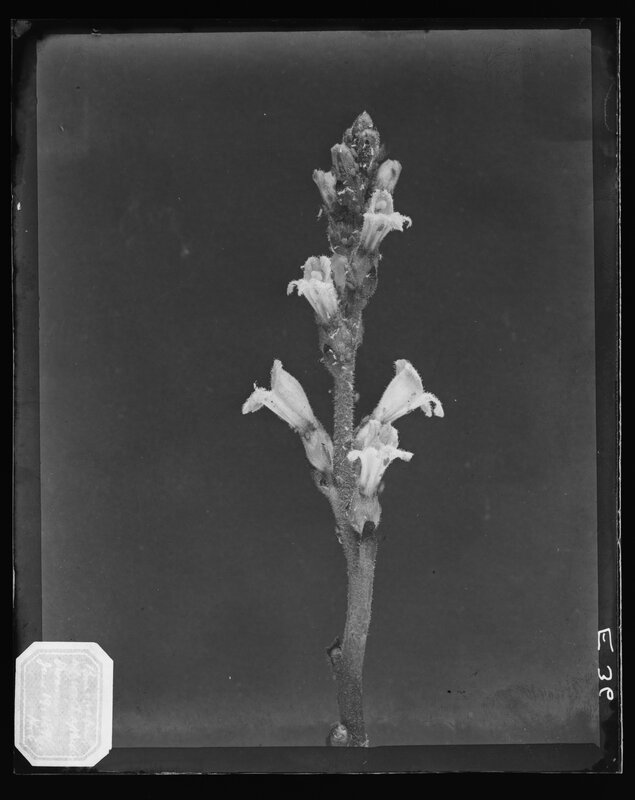 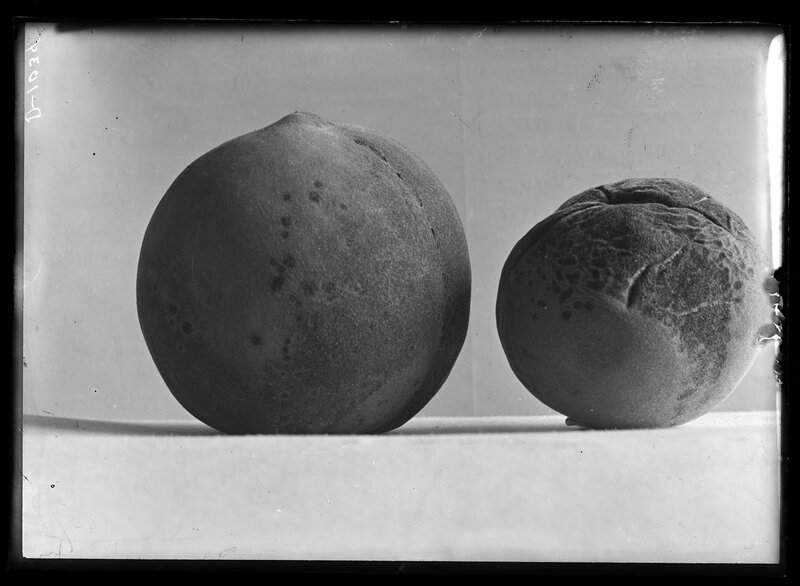 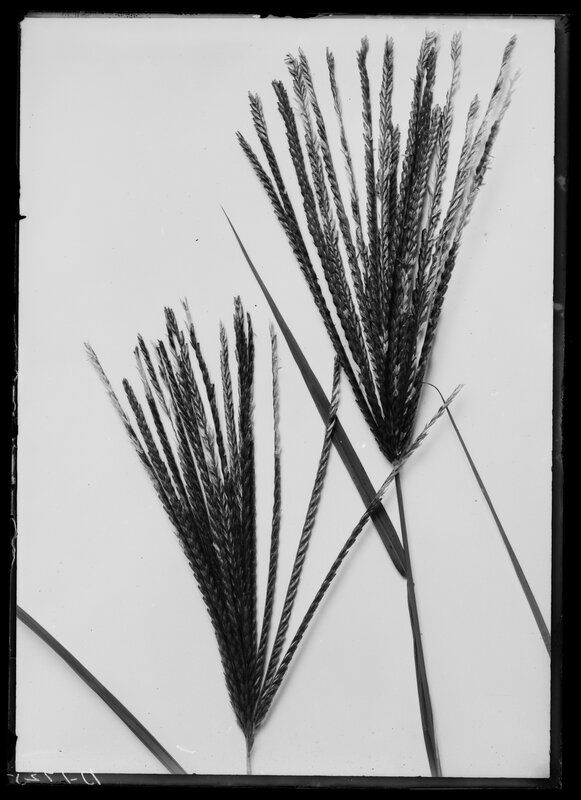 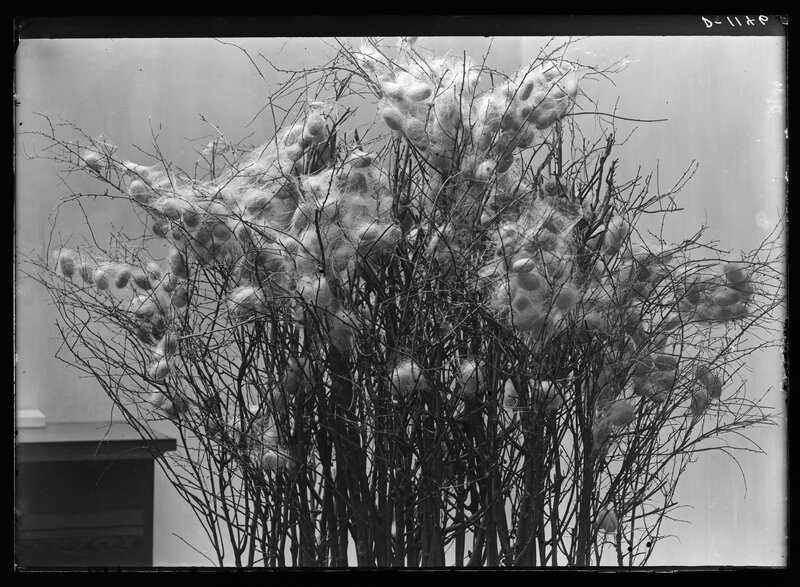 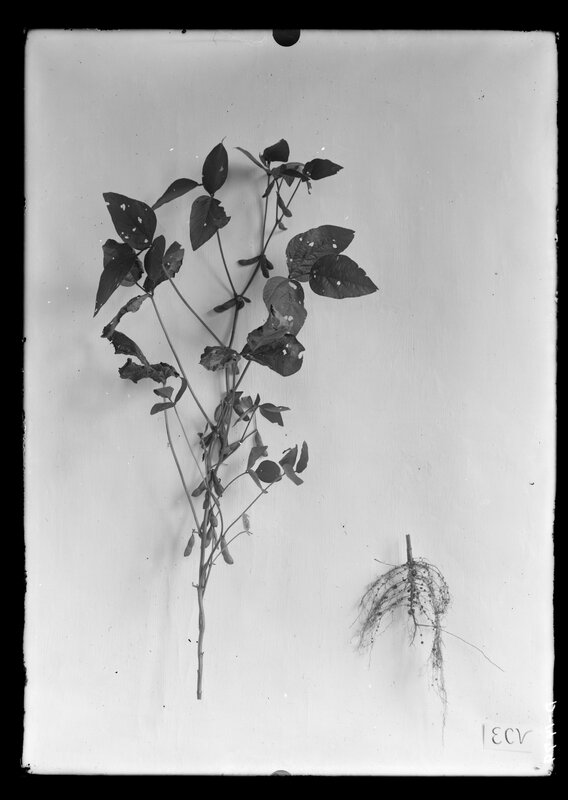 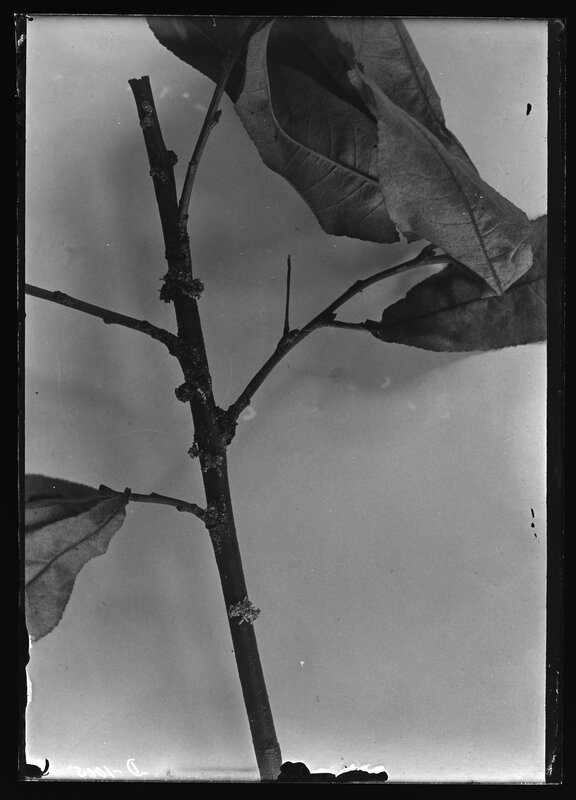 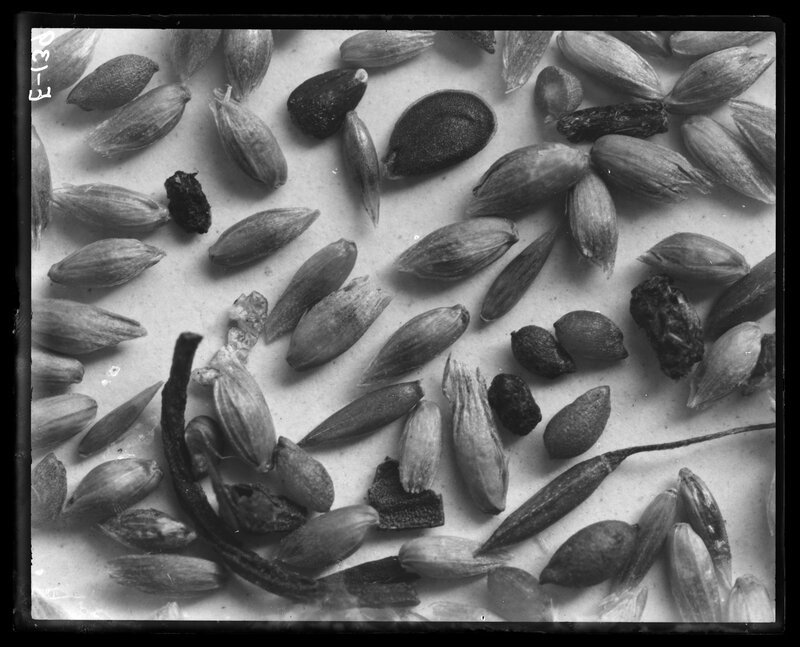 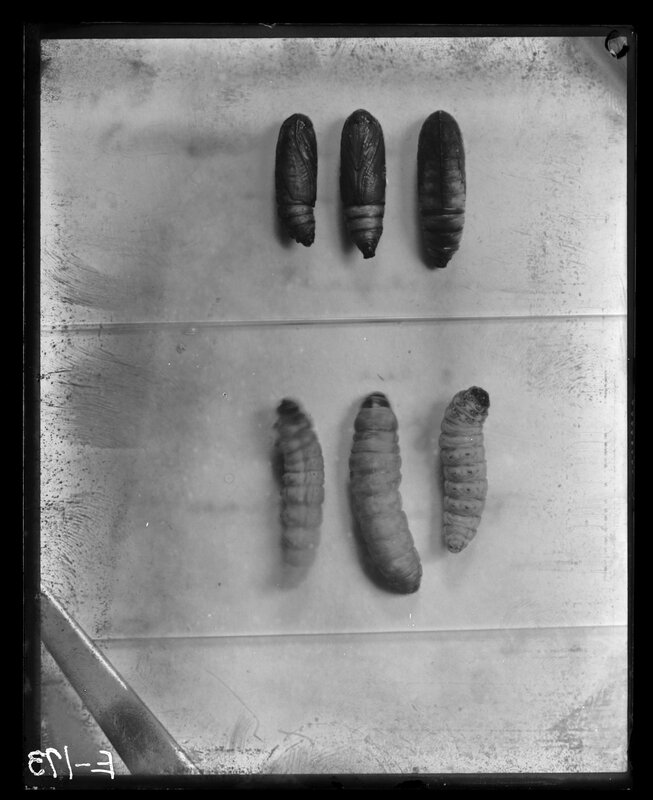 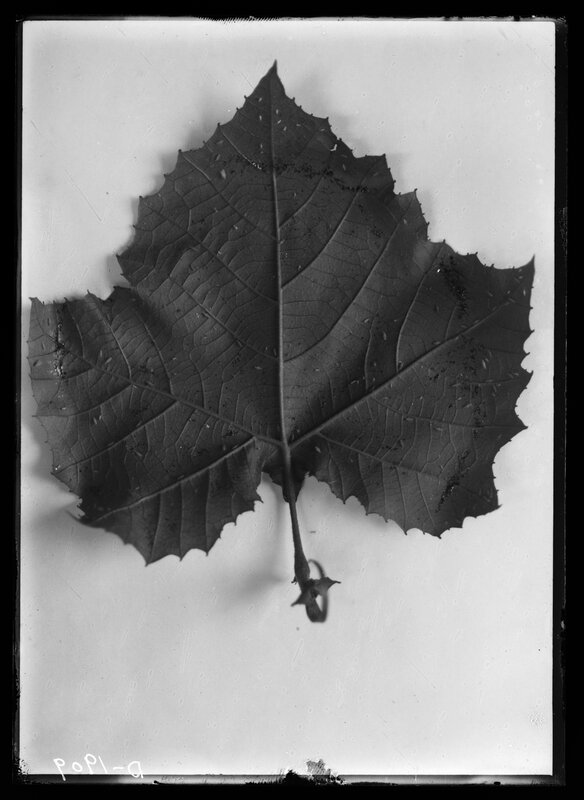 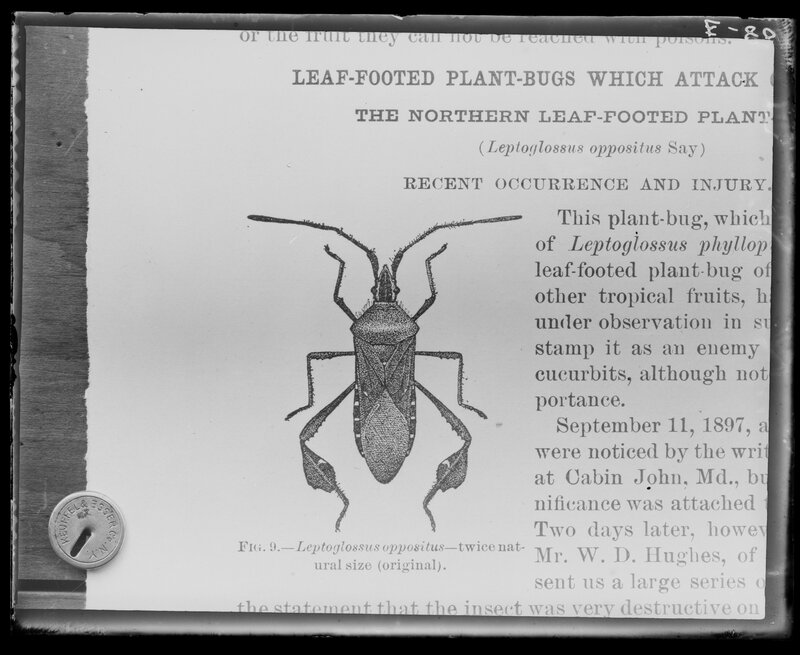 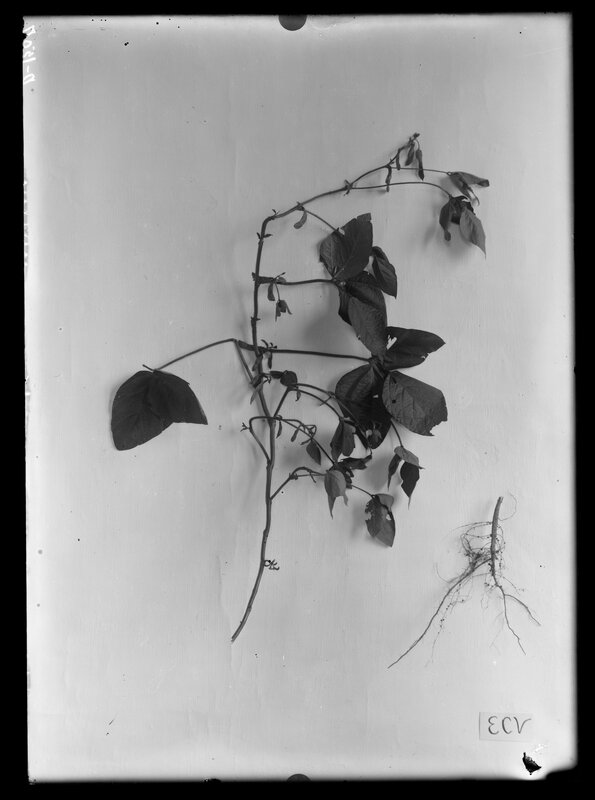 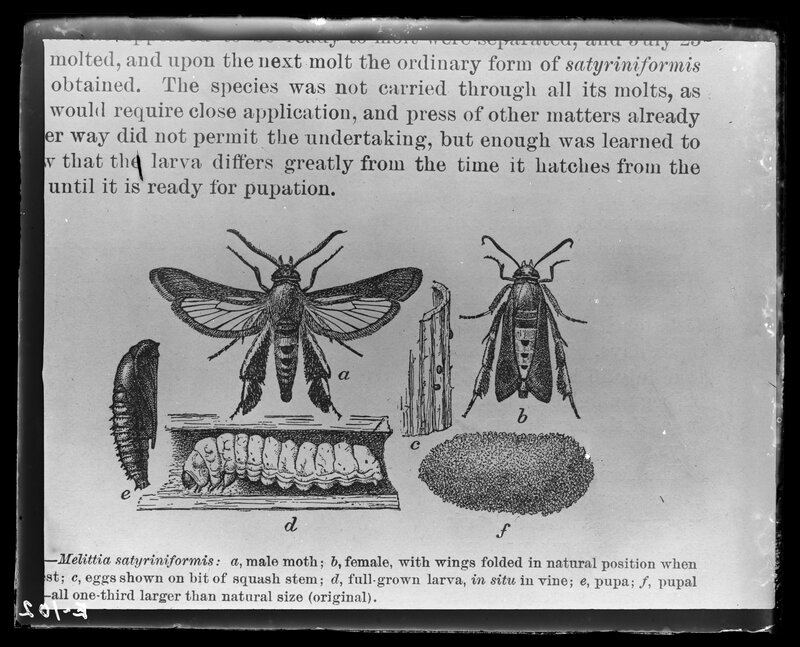 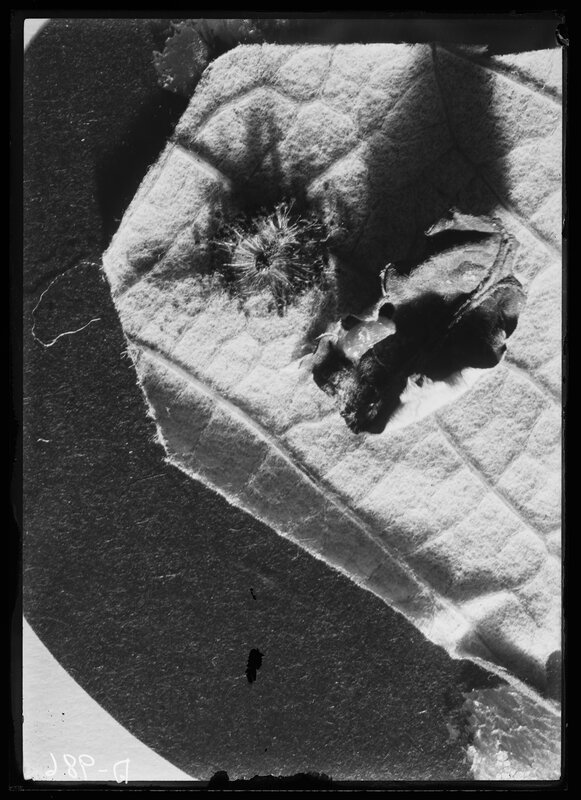 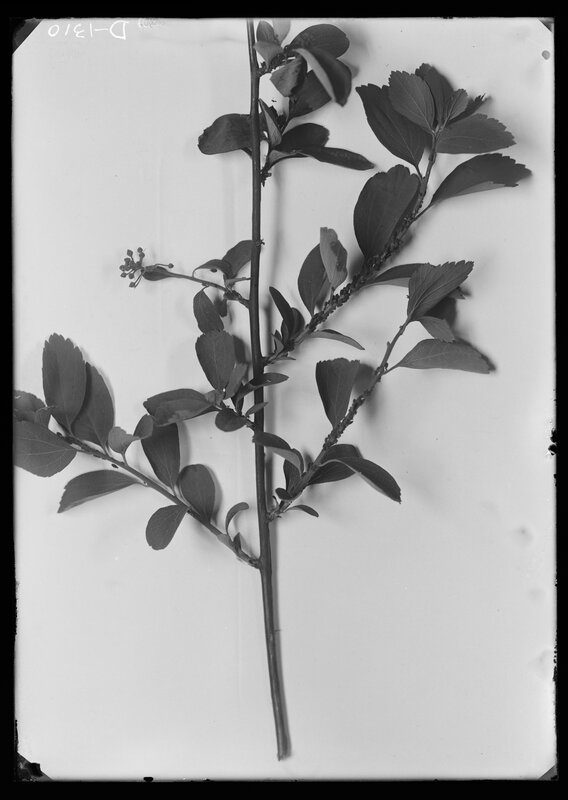 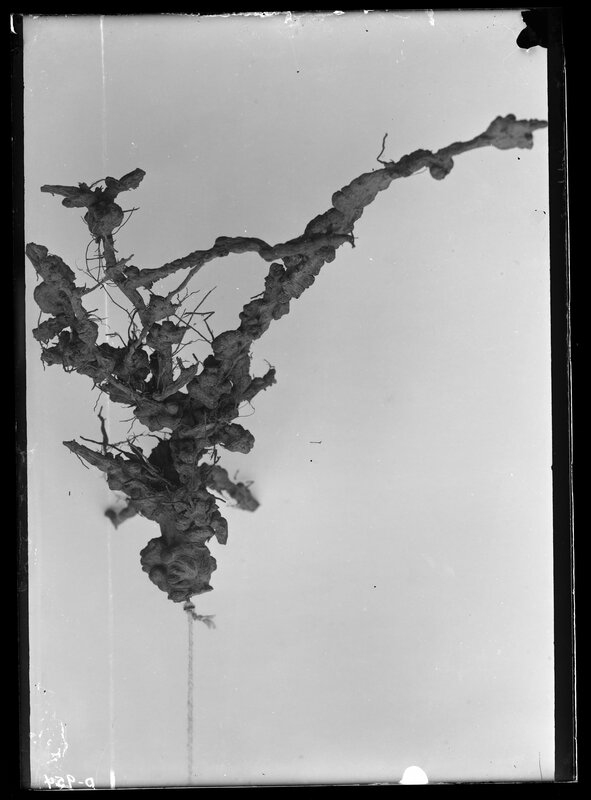 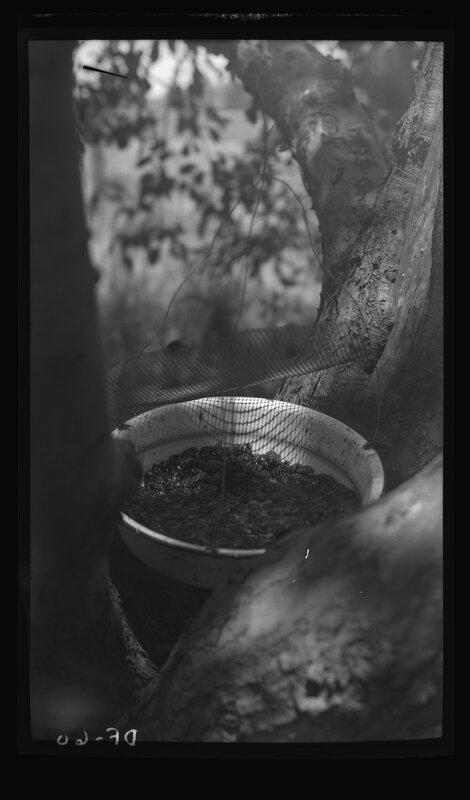 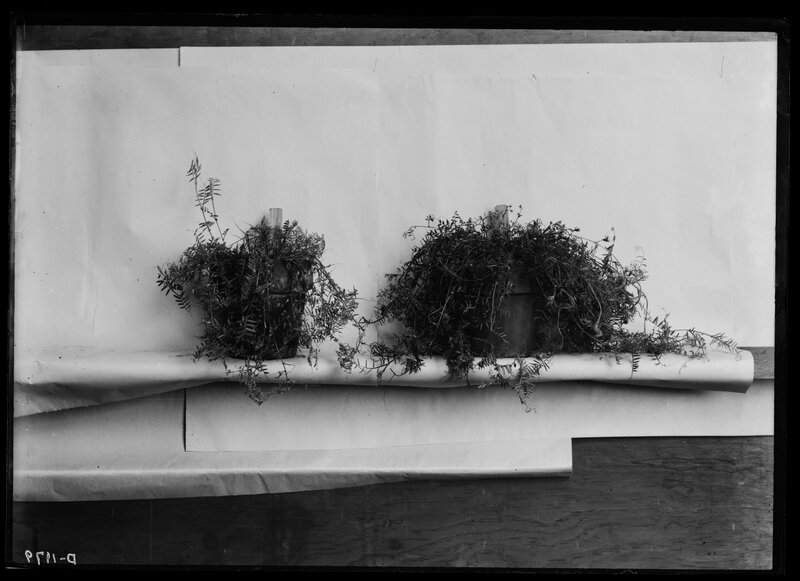 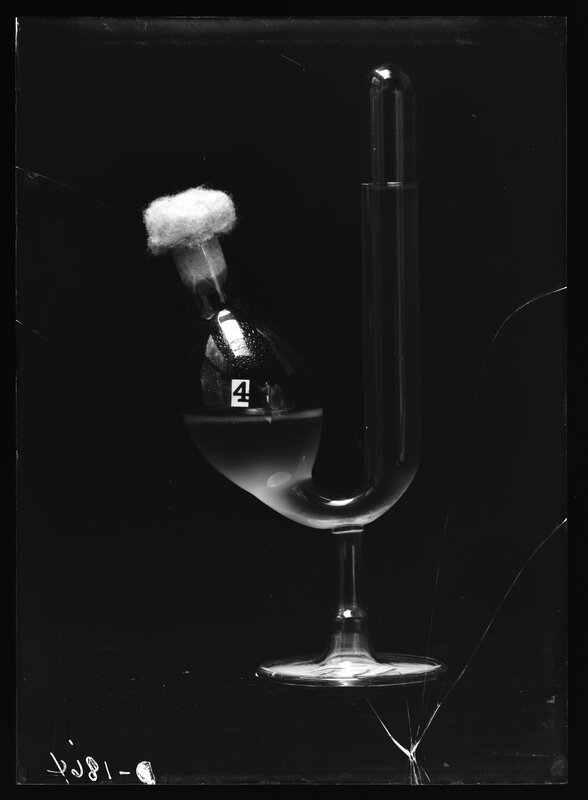 The Entomology and Botany series consists of over 900 negatives and nearly 100 prints taken by members of the Department of Entomology and Botany of the Agricultural Experiment Station at the University of Kentucky. 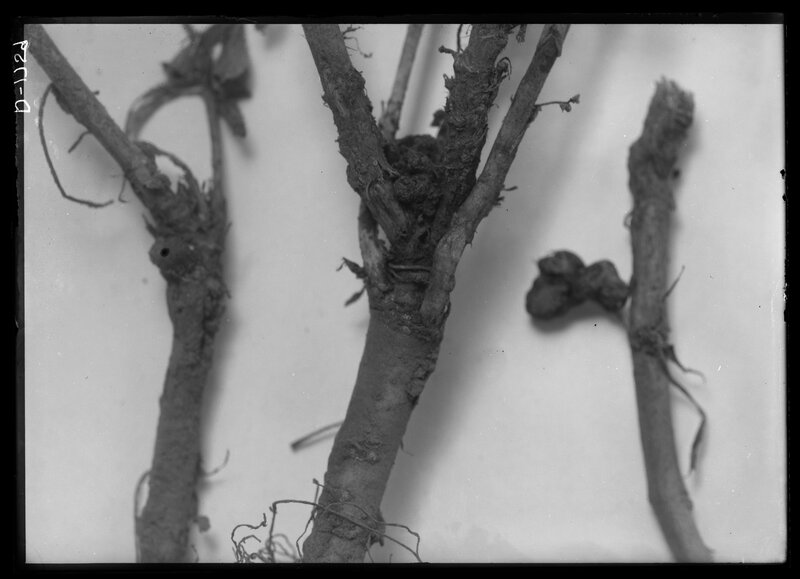 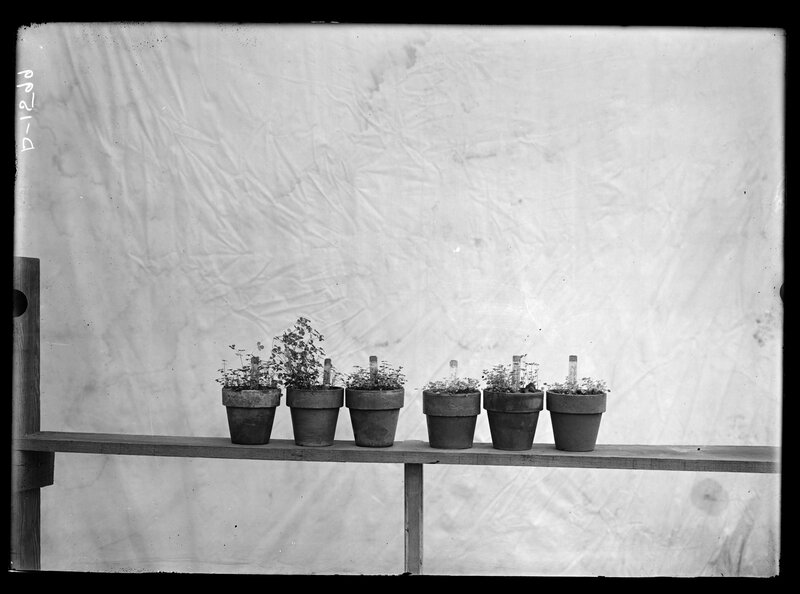 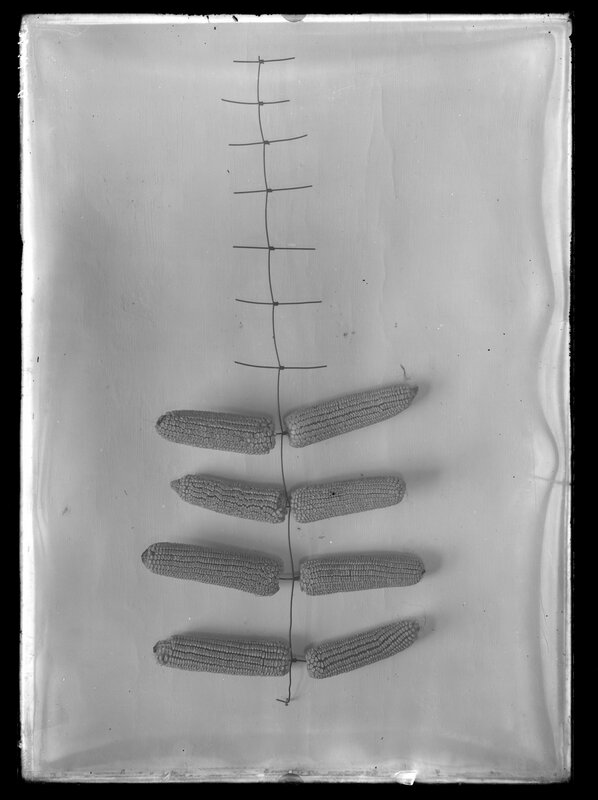 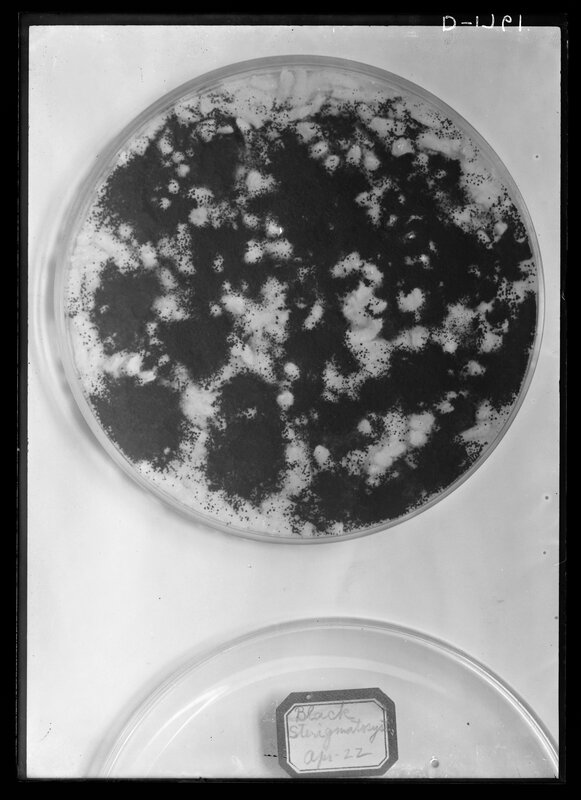 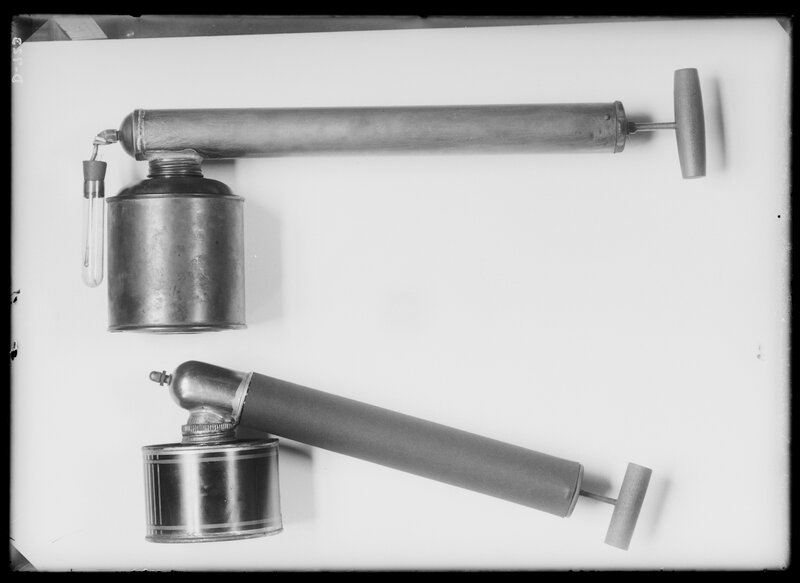 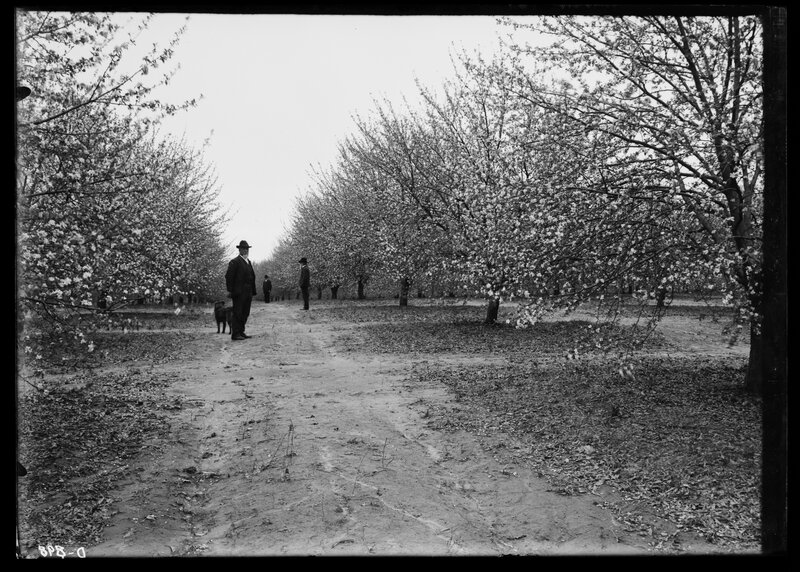 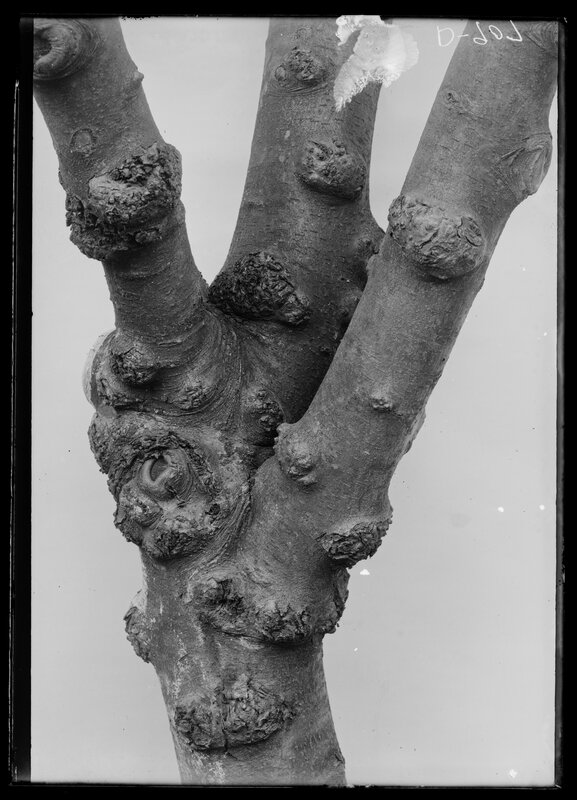 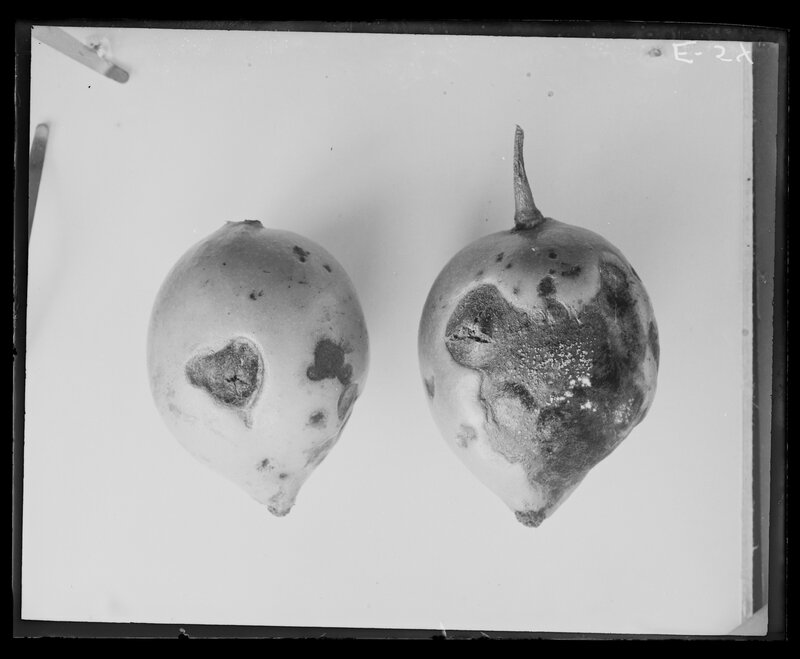 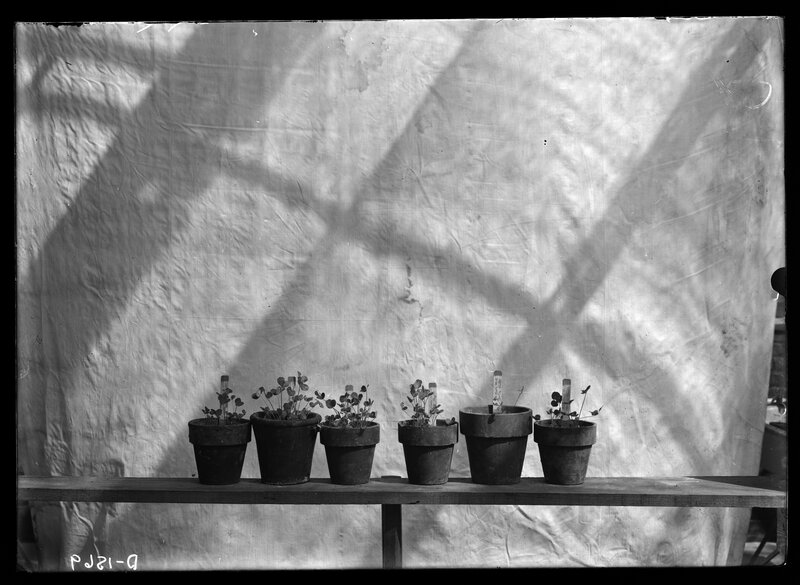 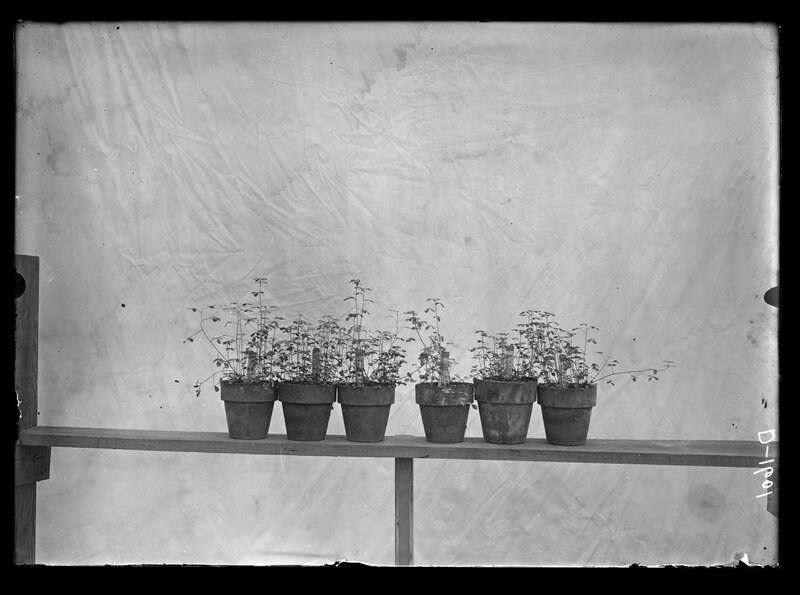 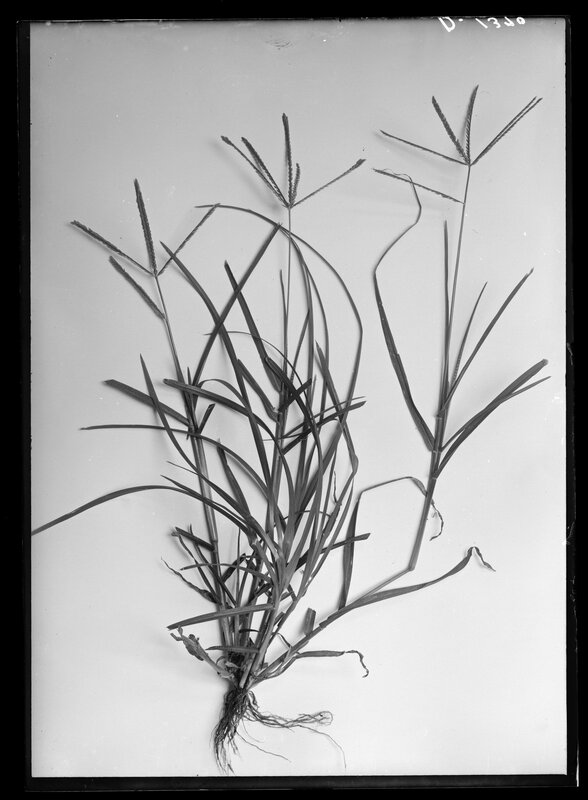 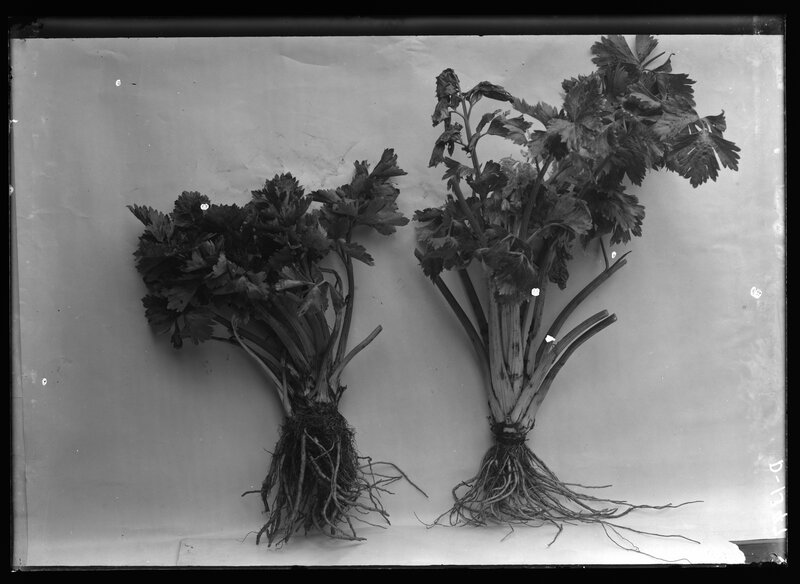 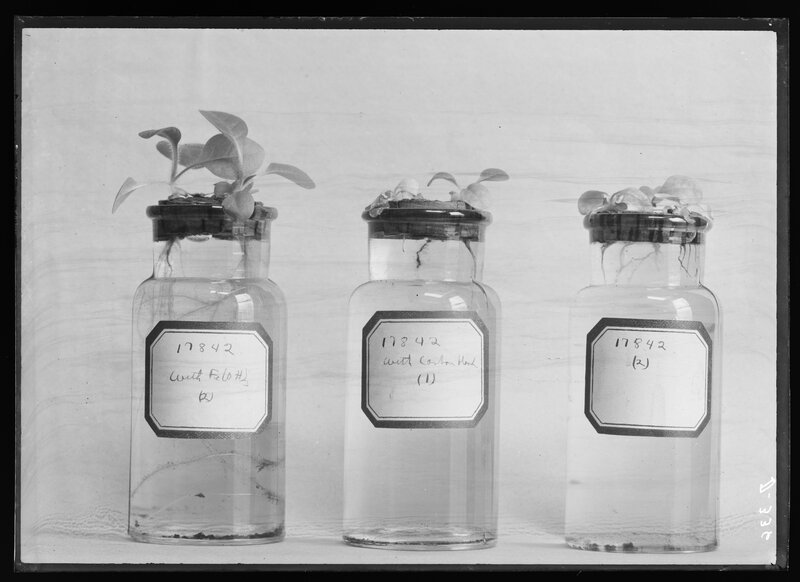 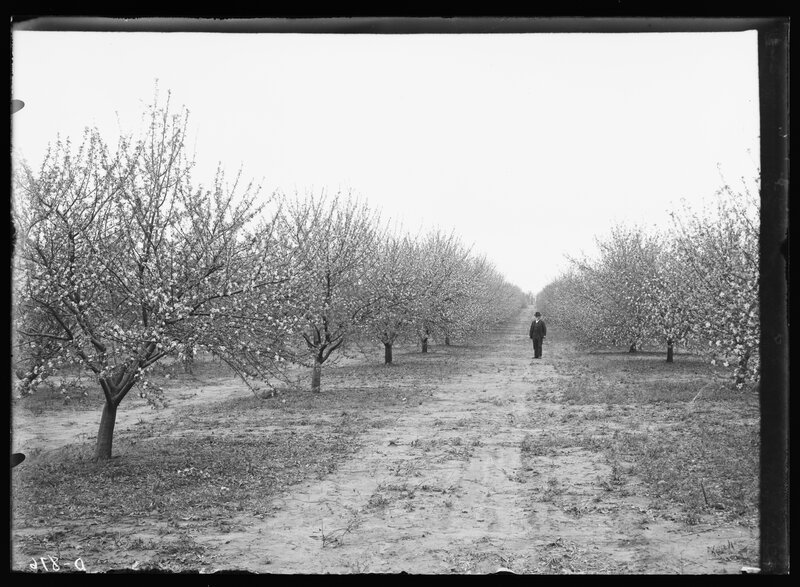 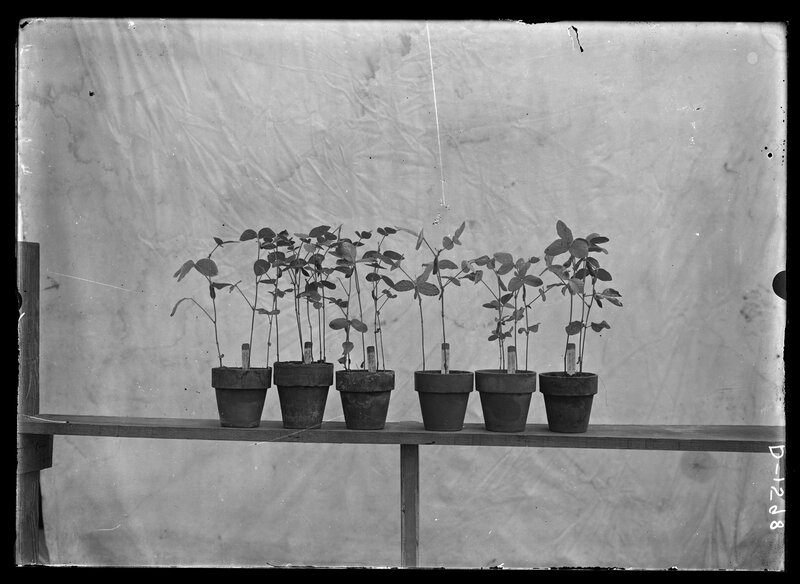 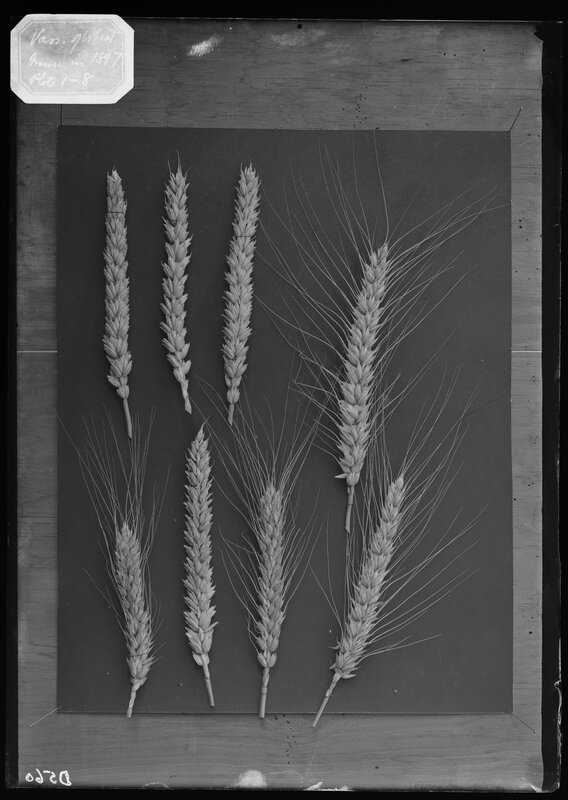 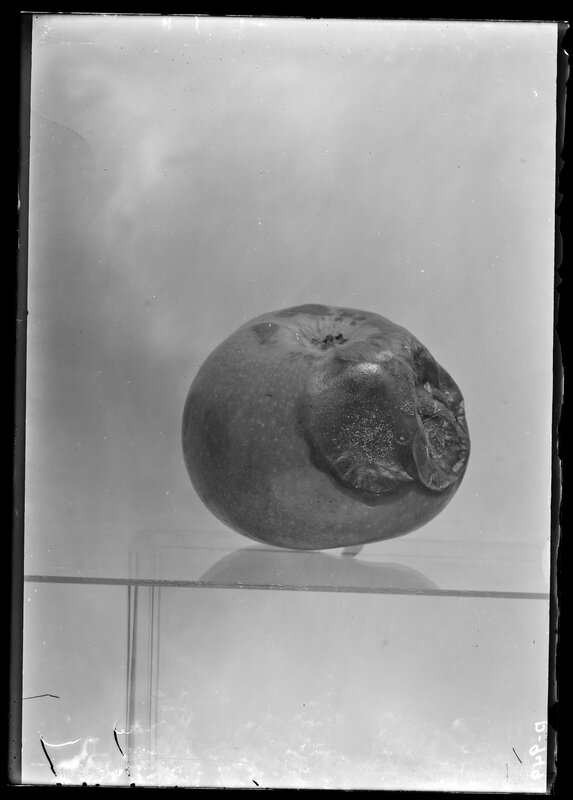 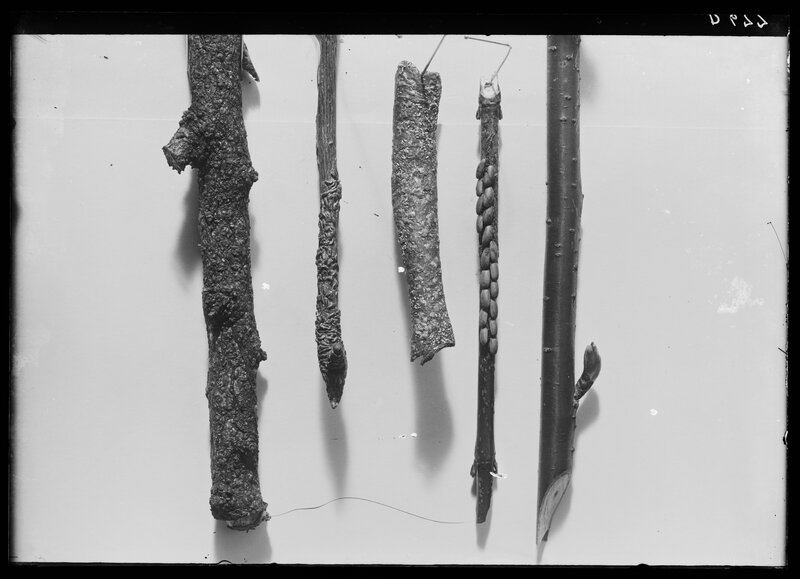 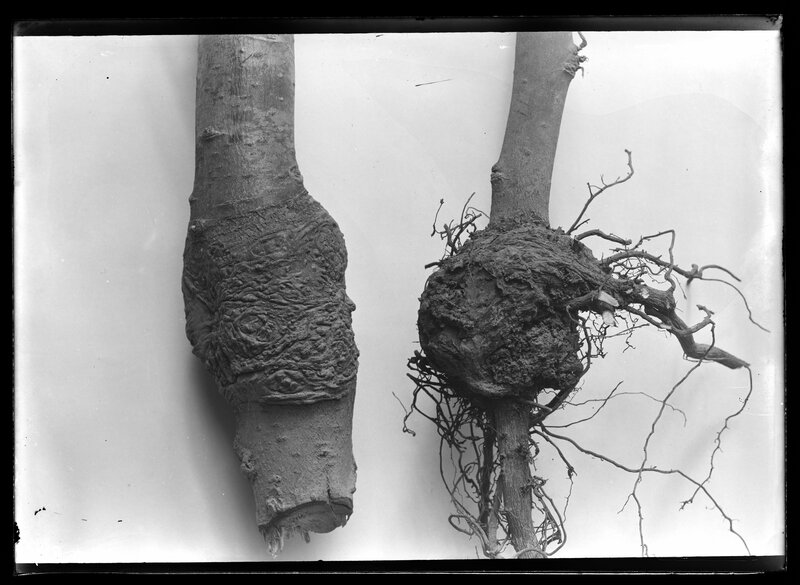 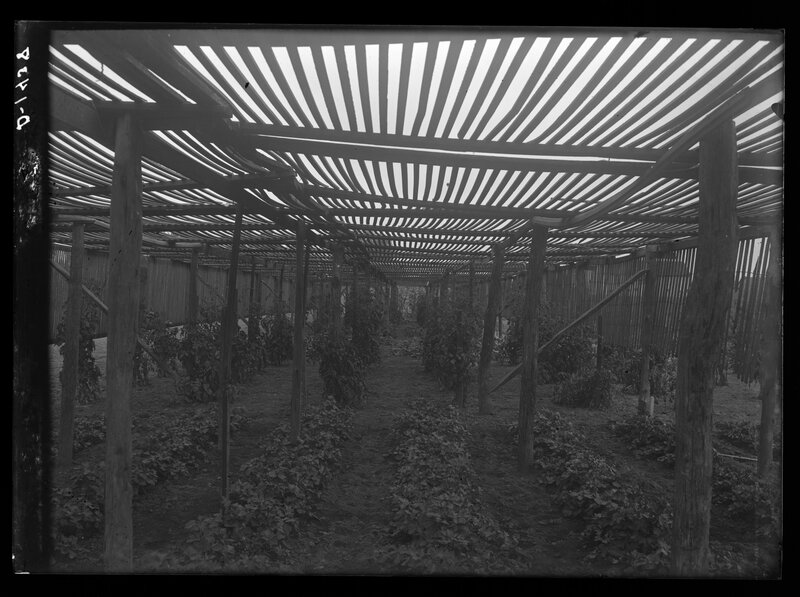 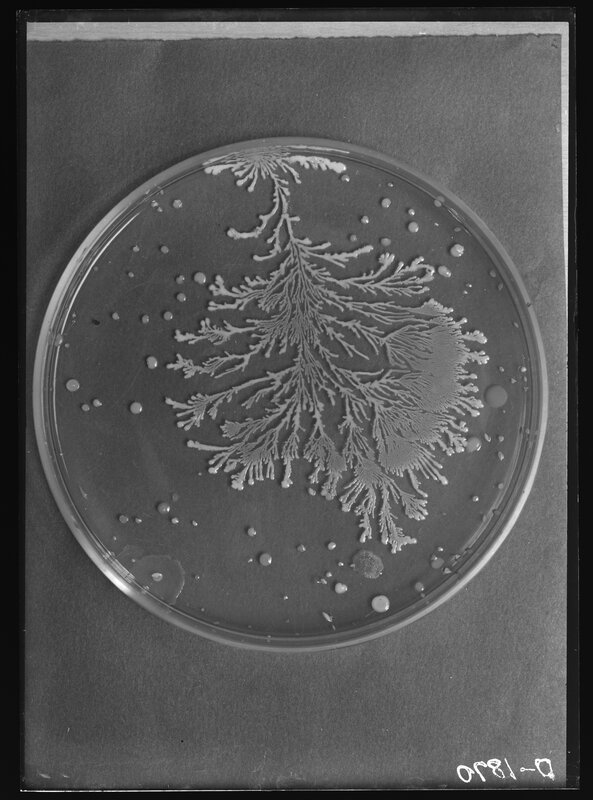 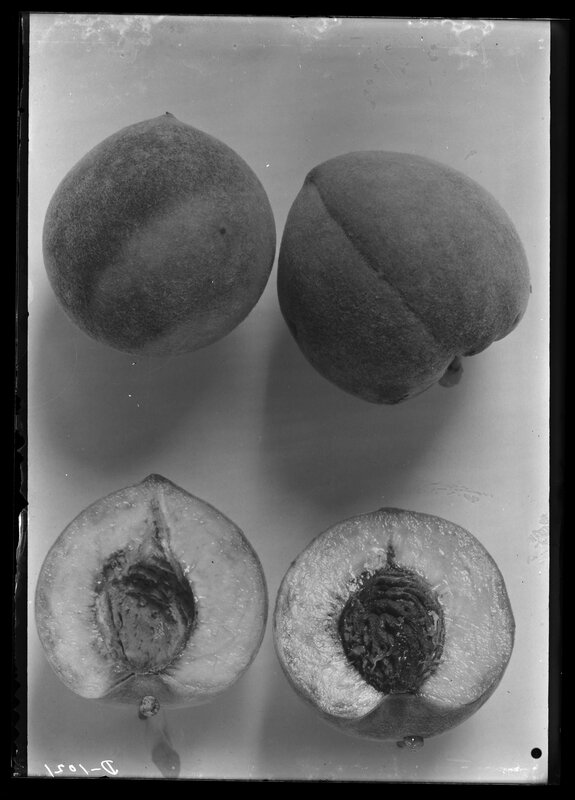 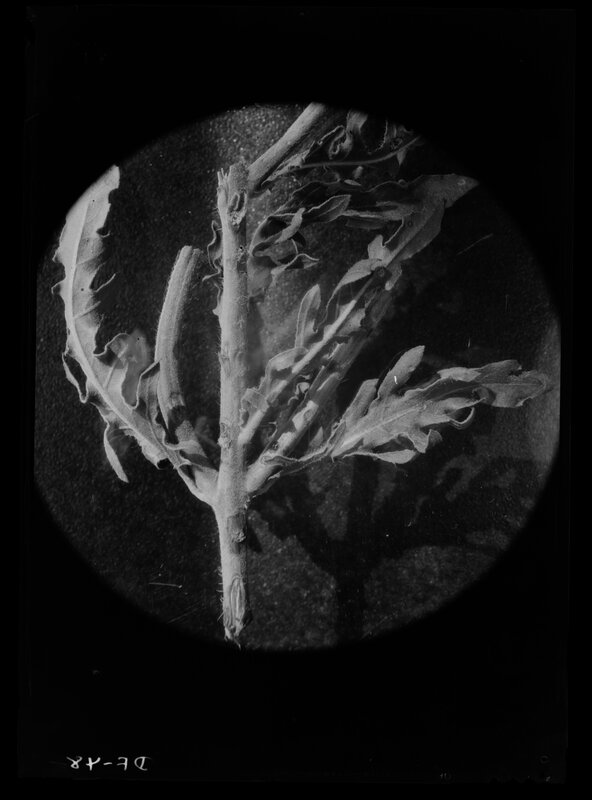 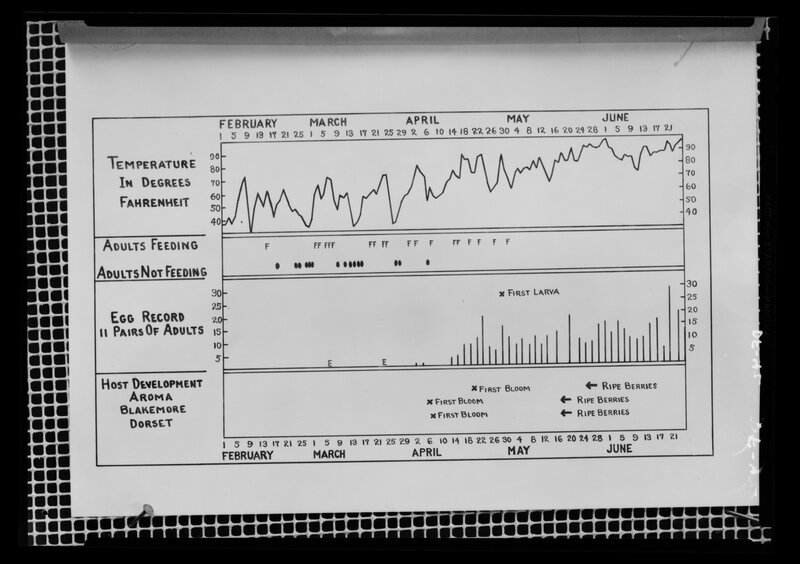 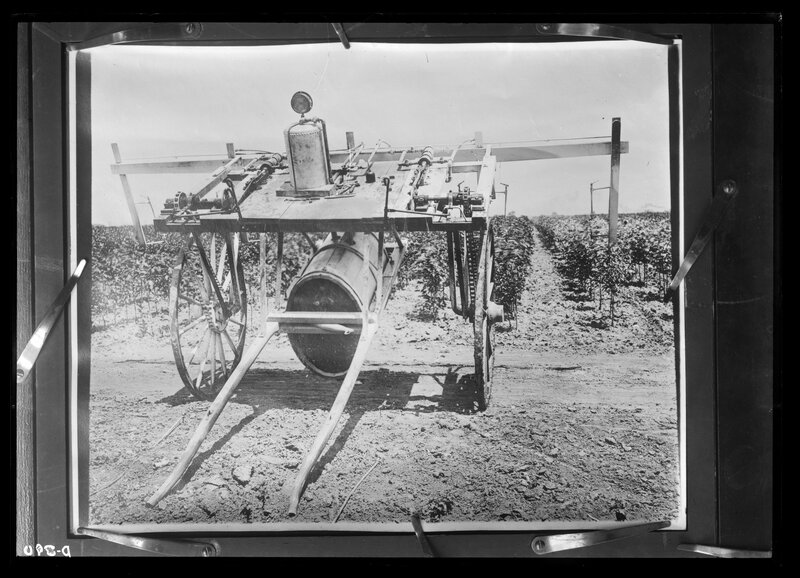 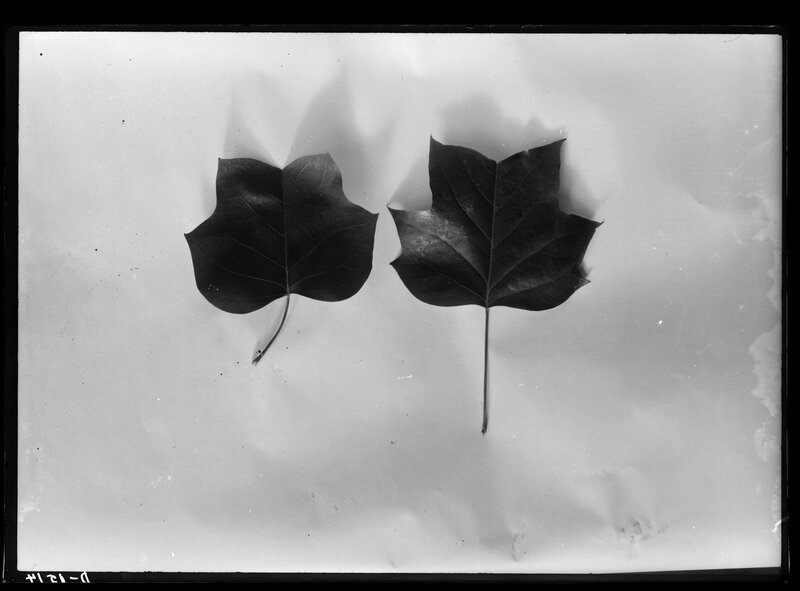 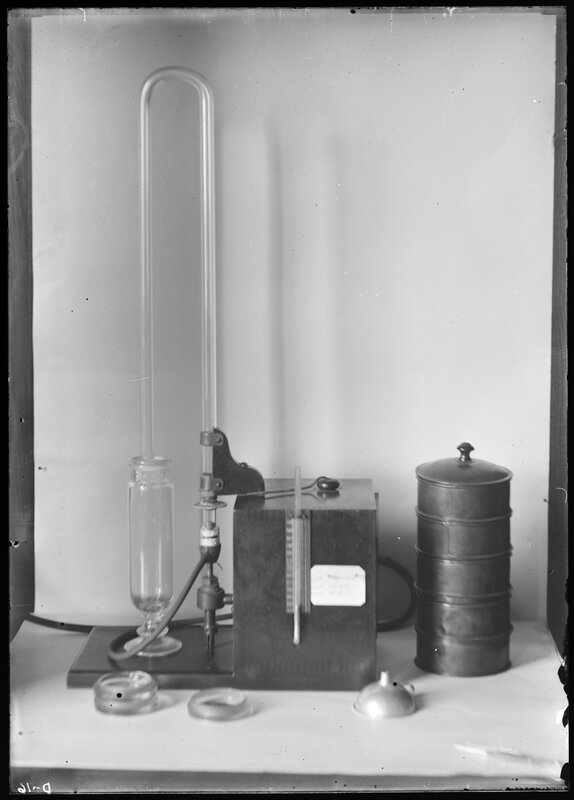 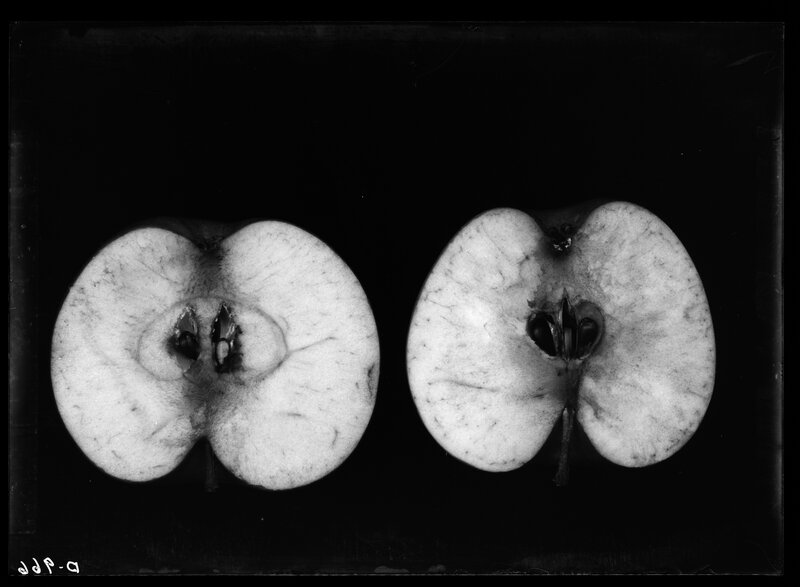 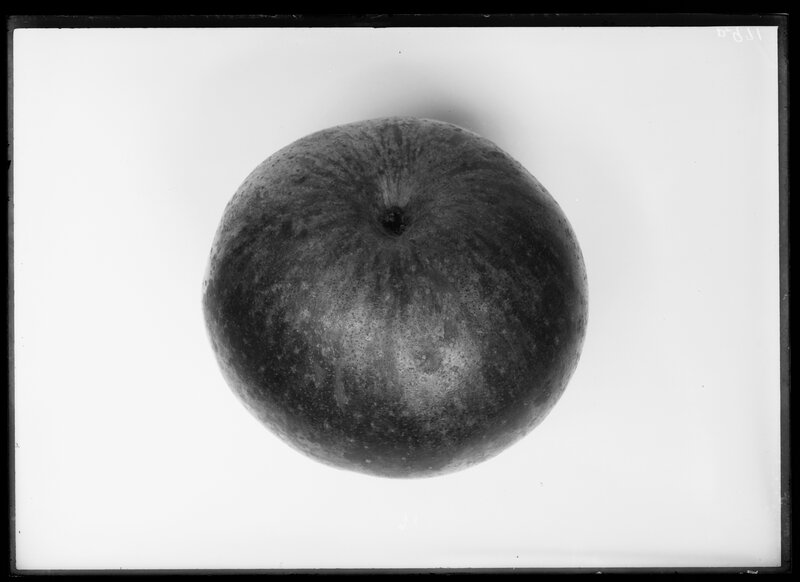 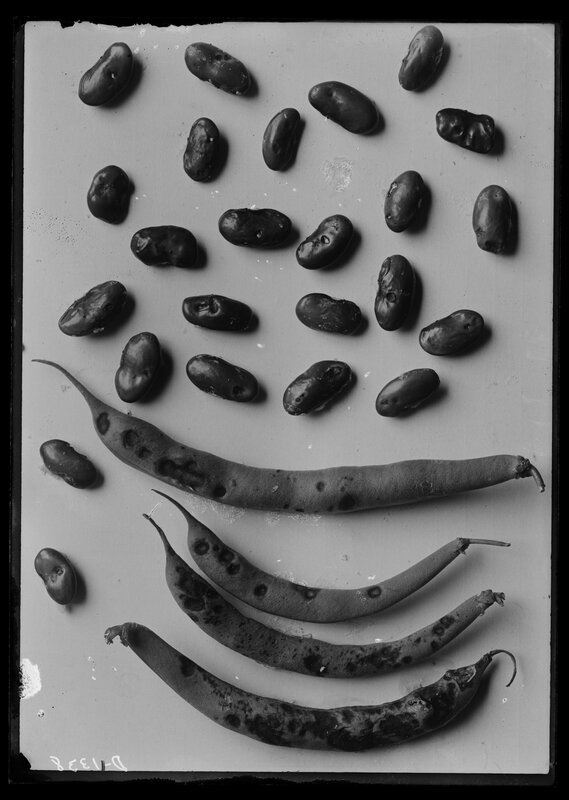 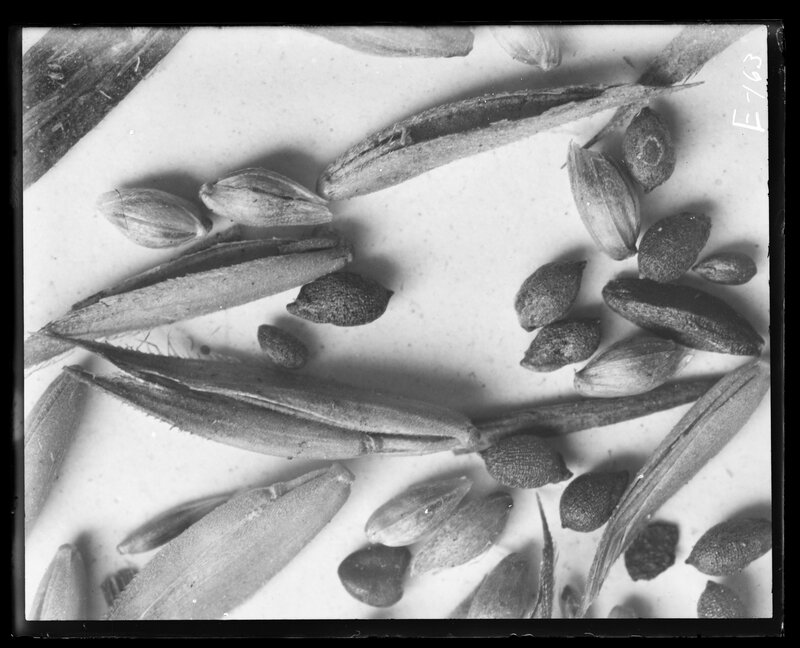 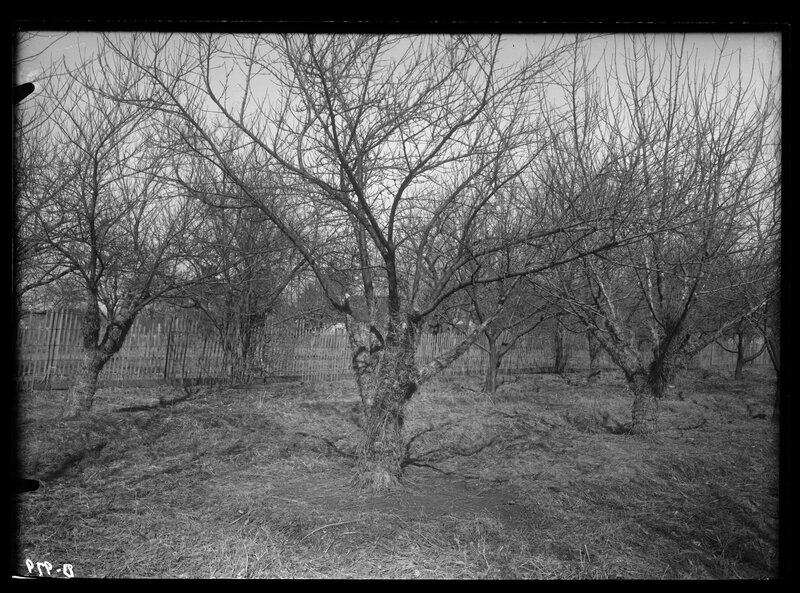 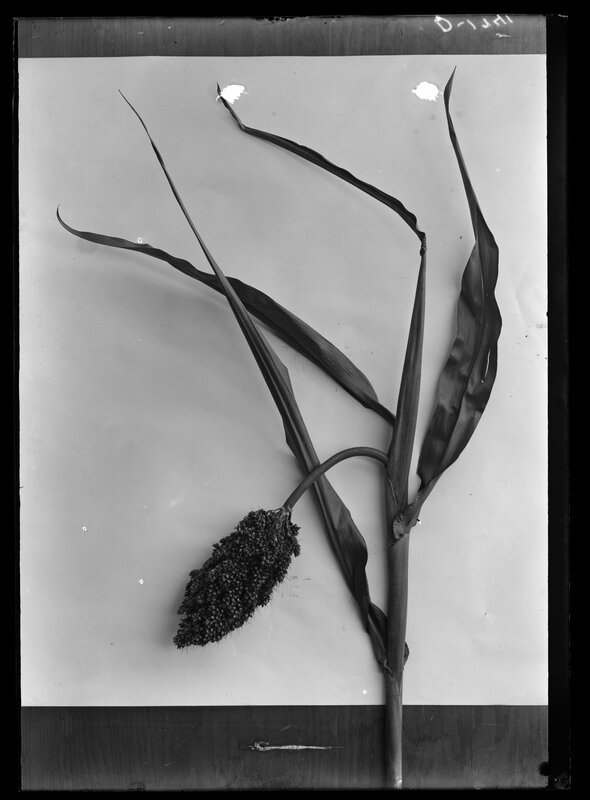 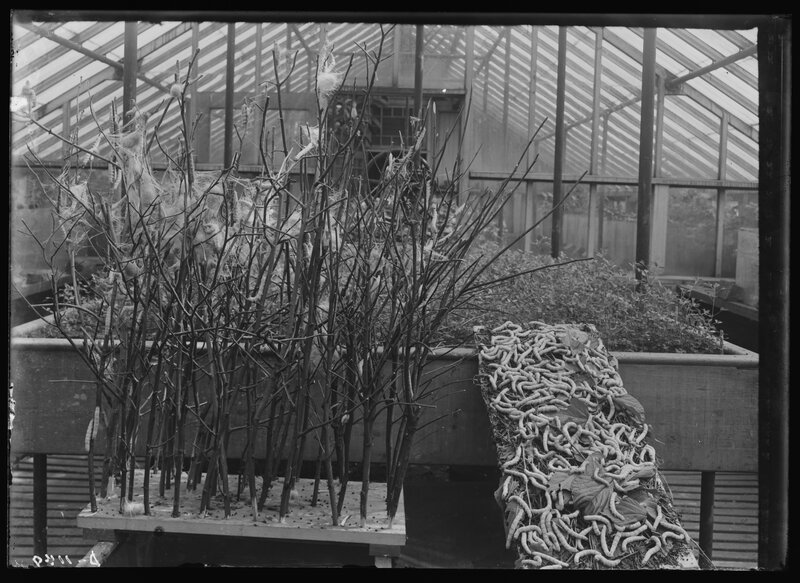 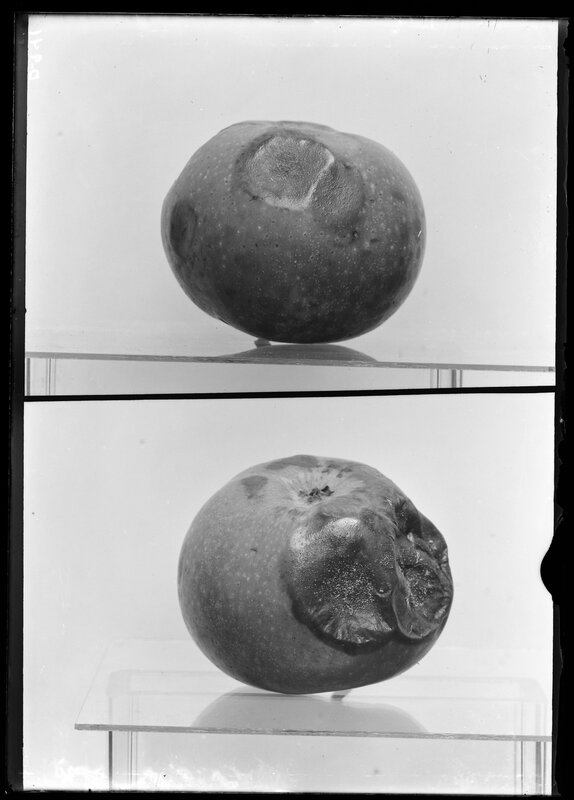 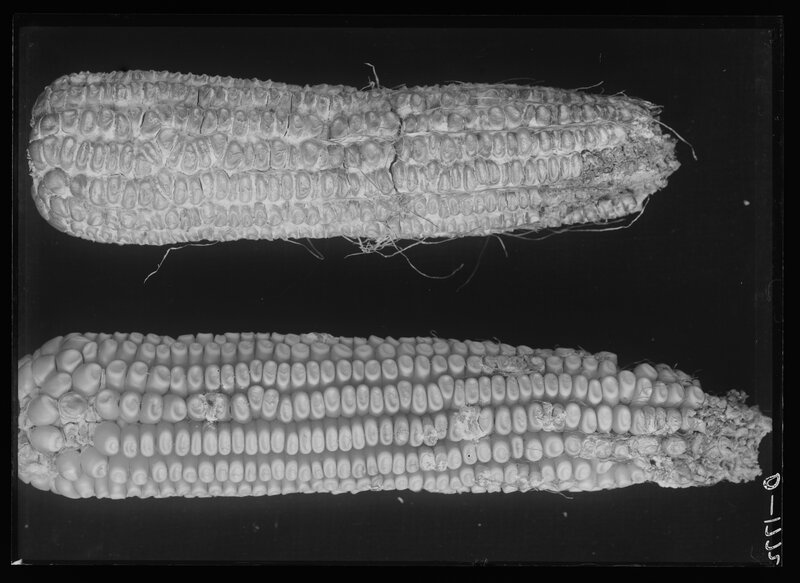 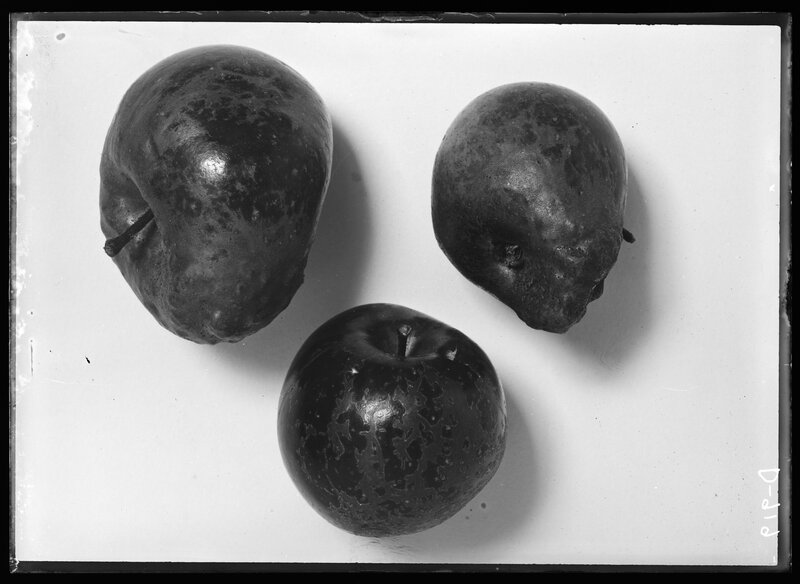 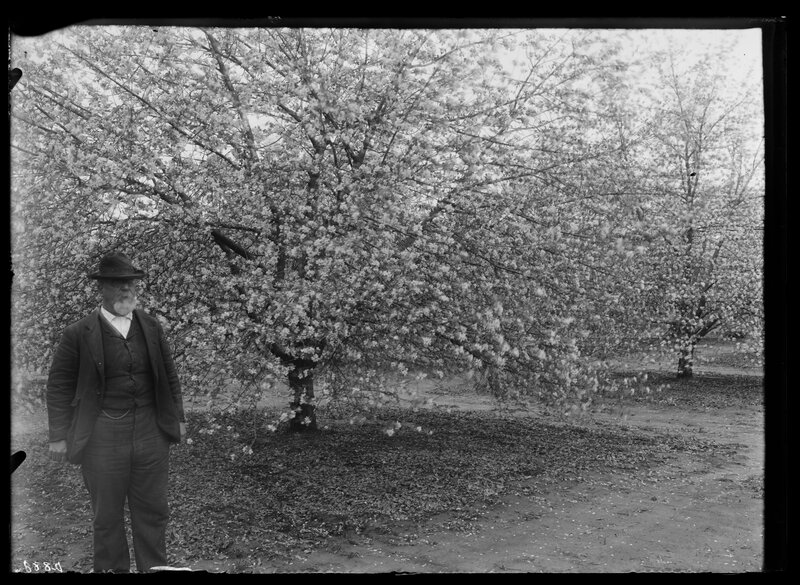 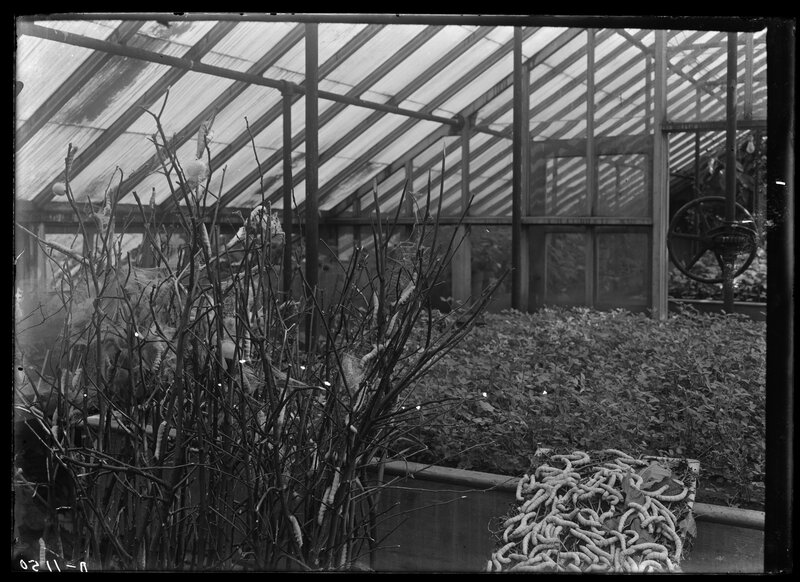 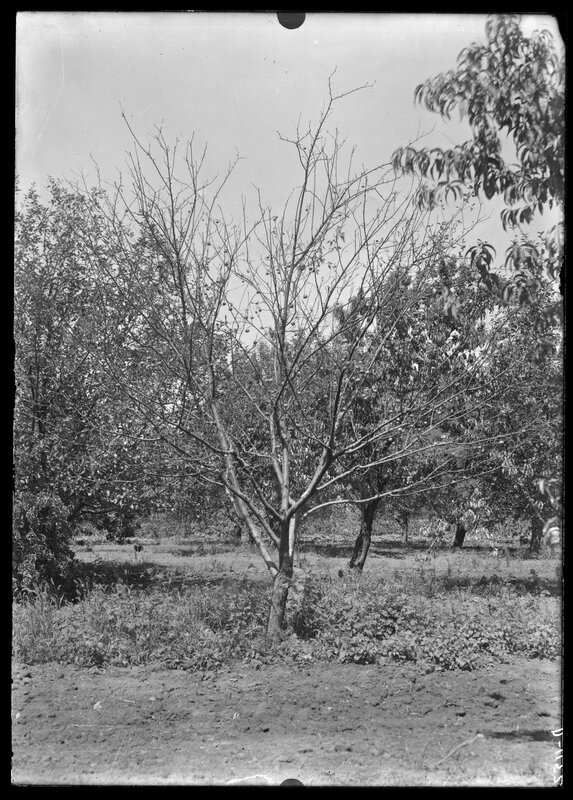 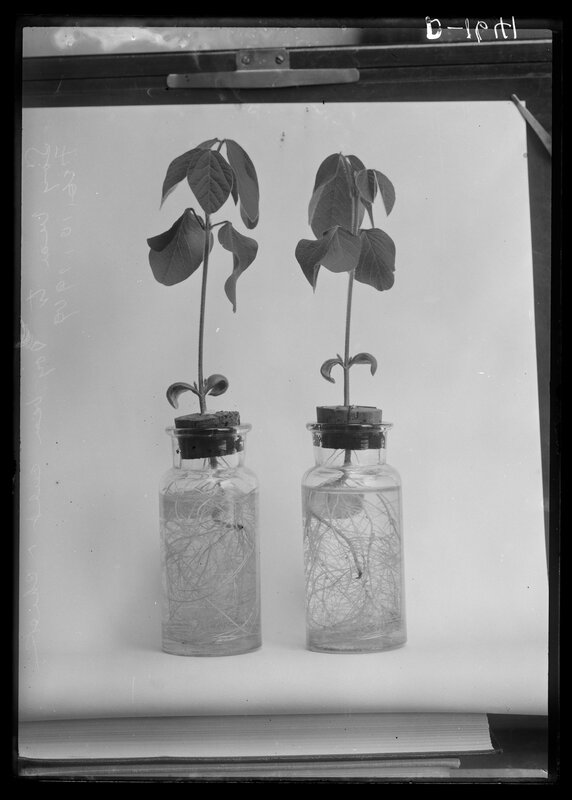 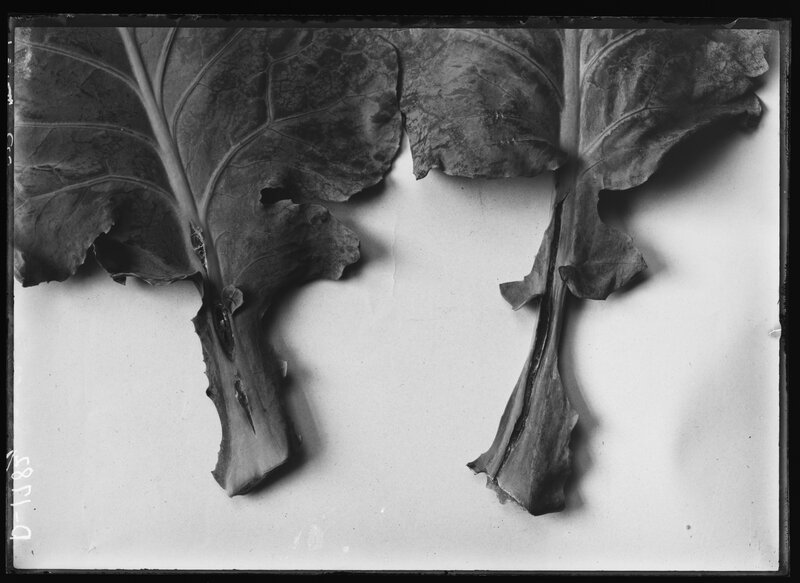 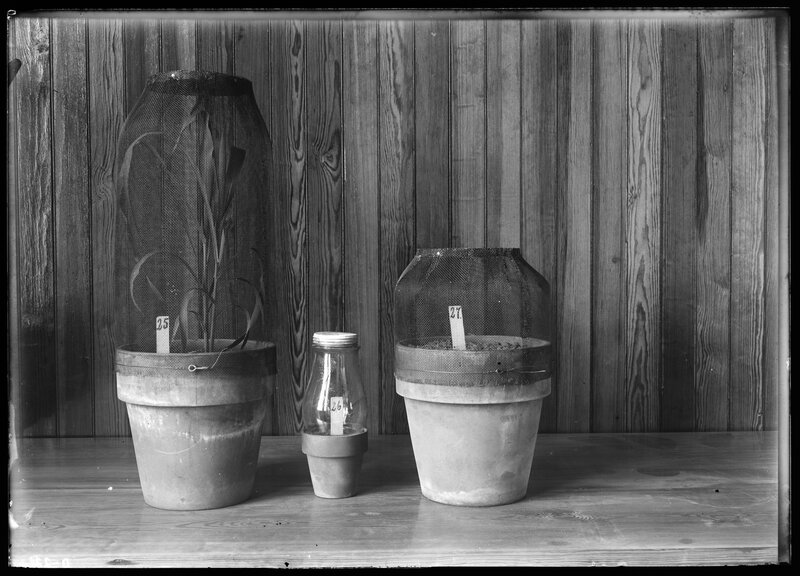 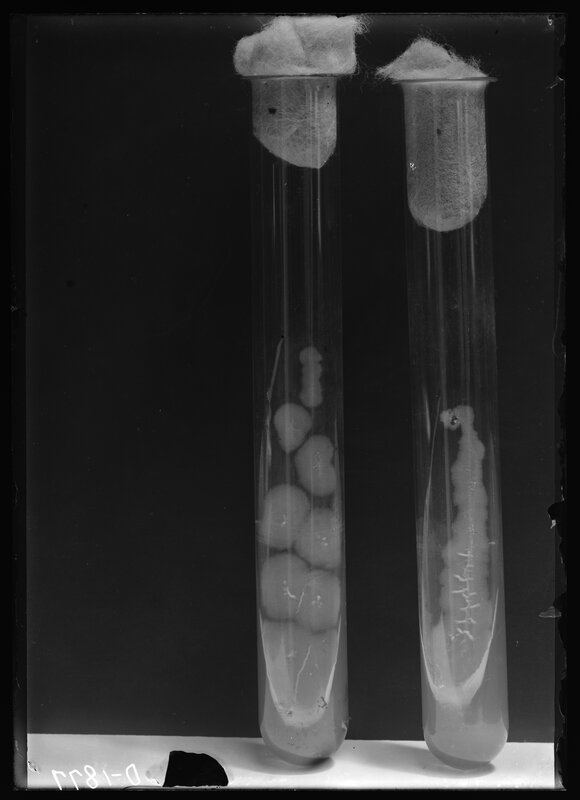 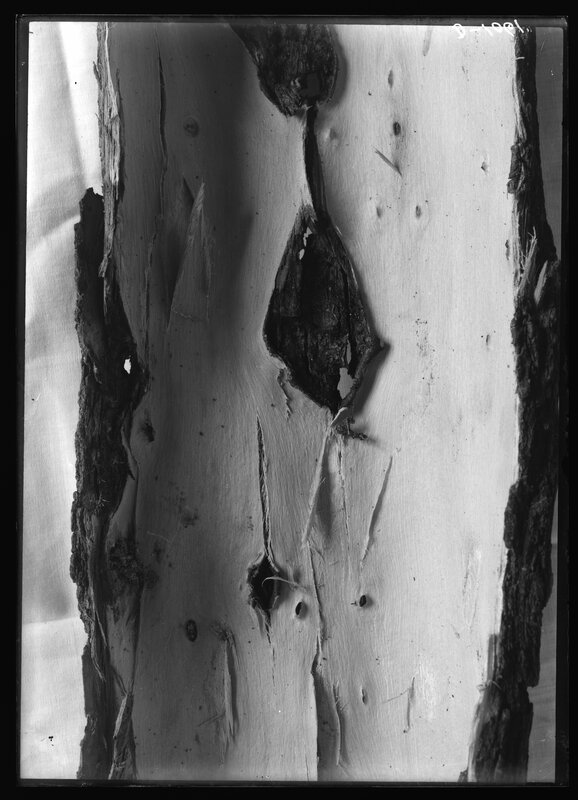 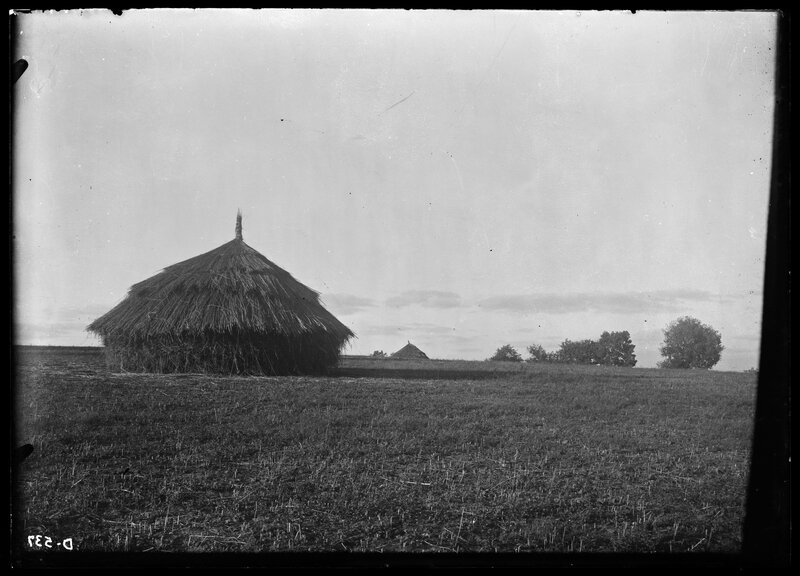 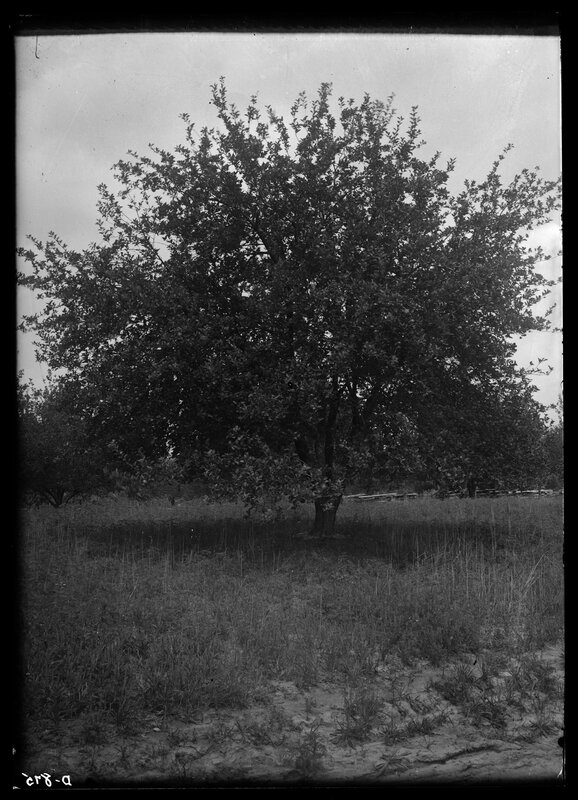 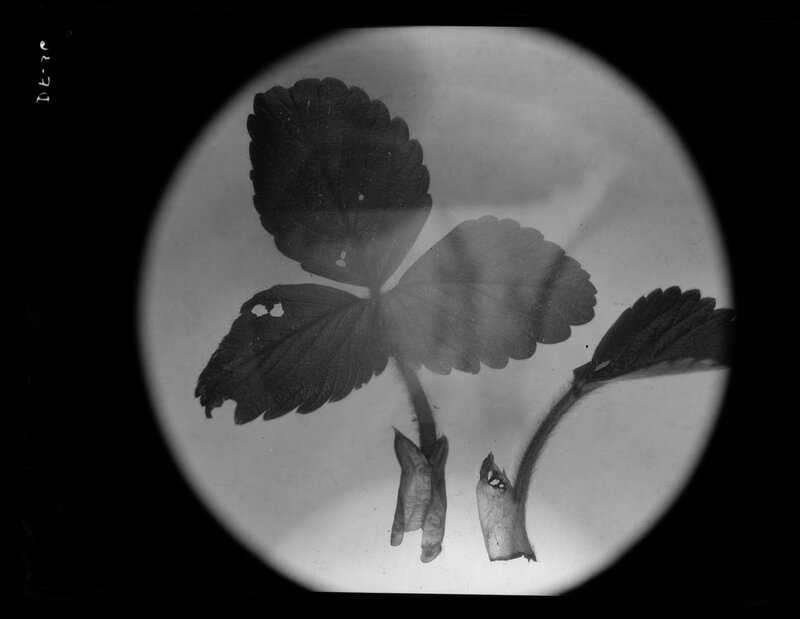 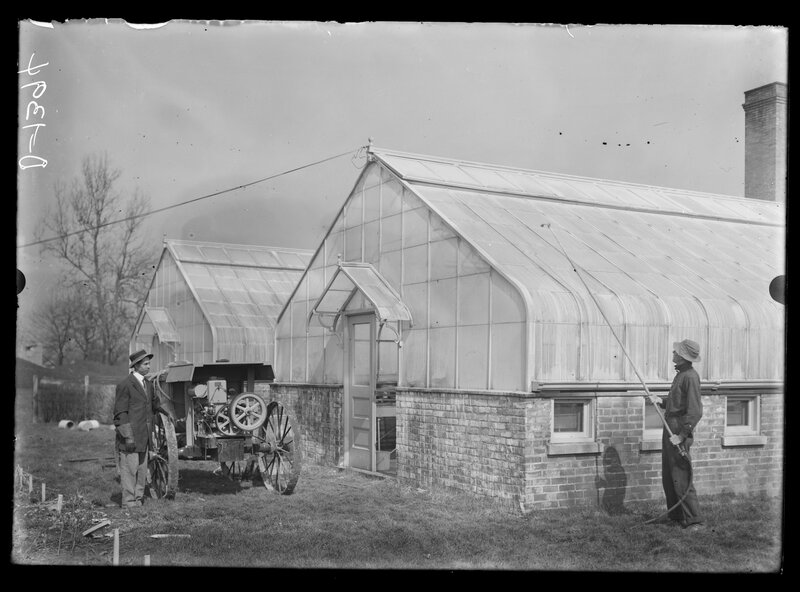 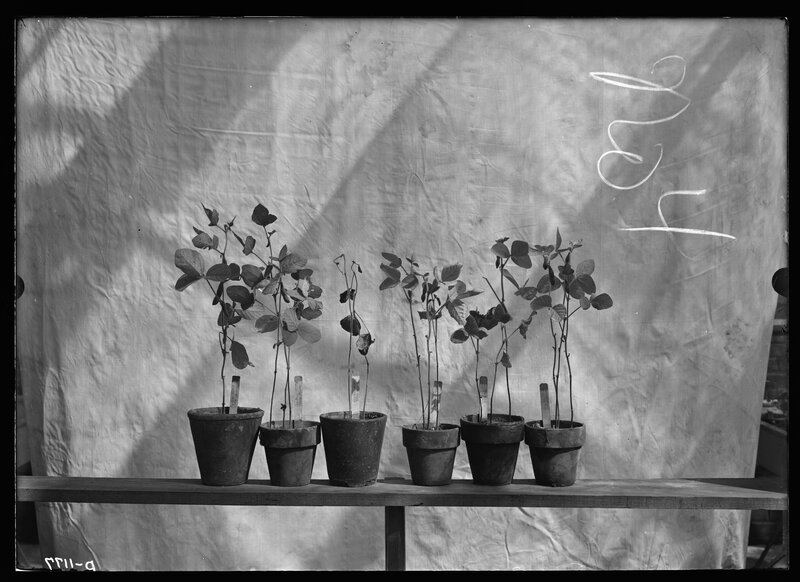 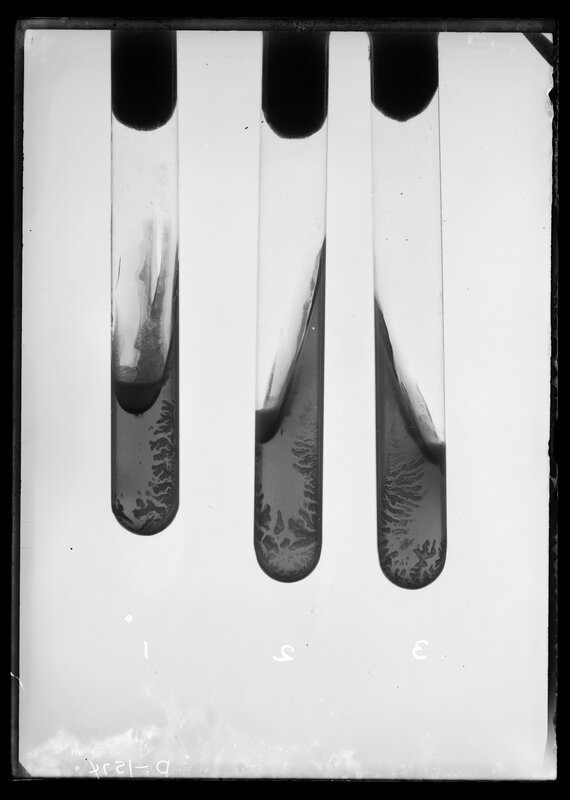 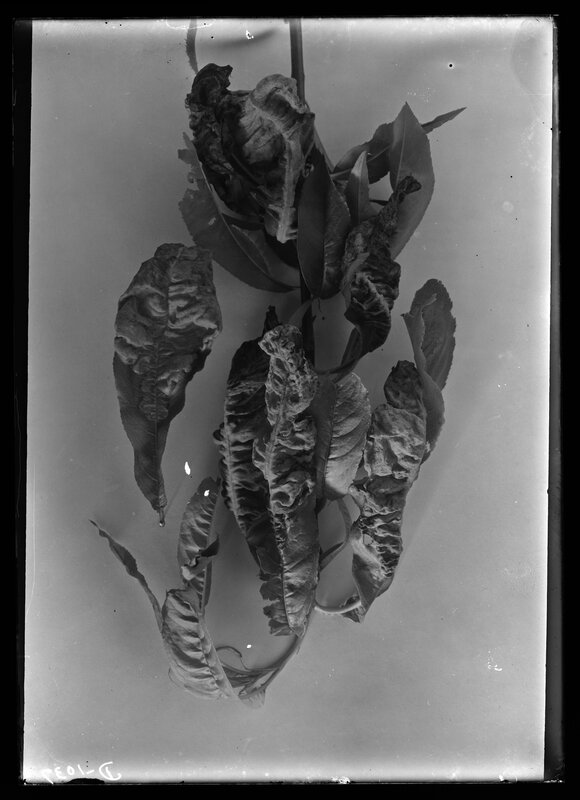 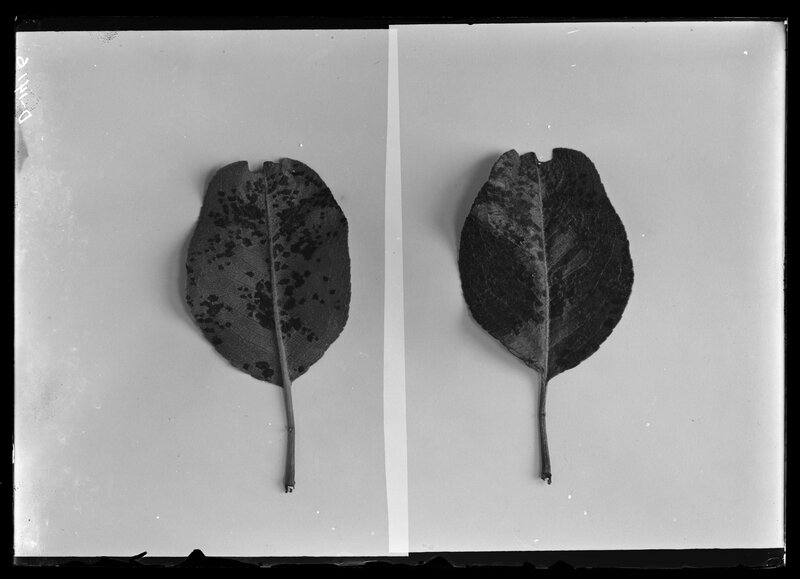 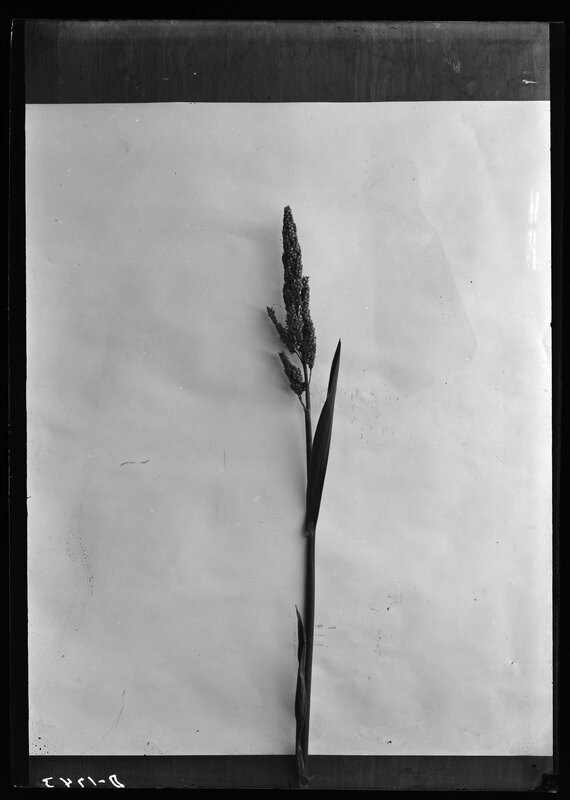 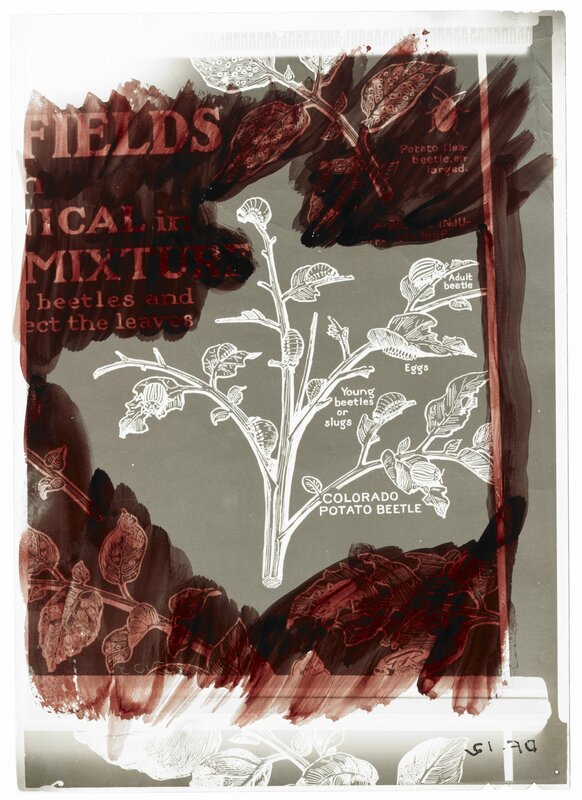 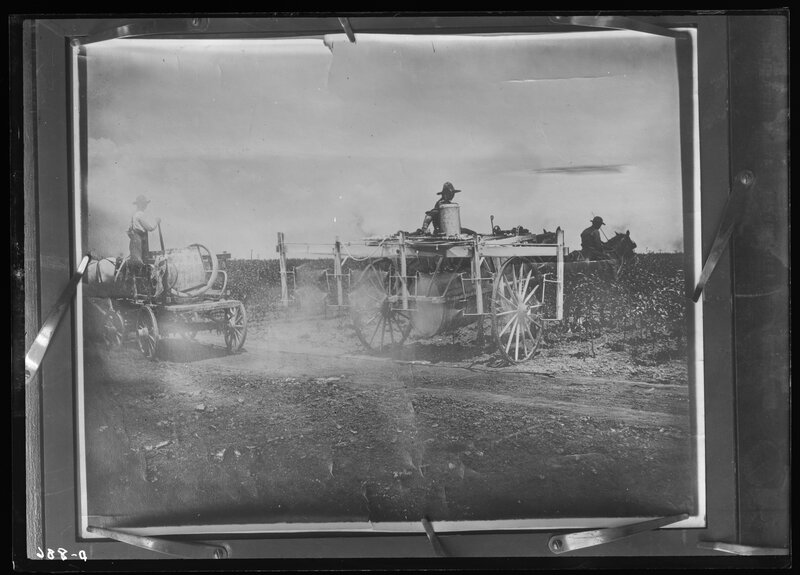 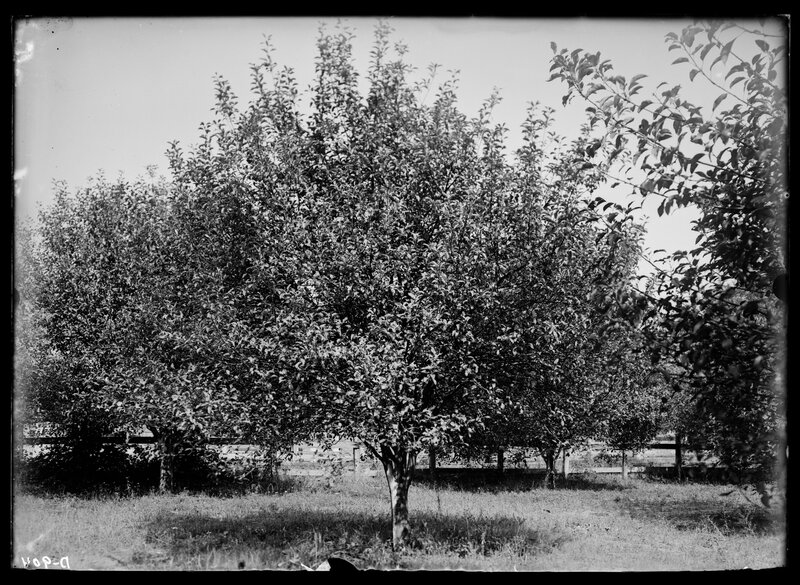 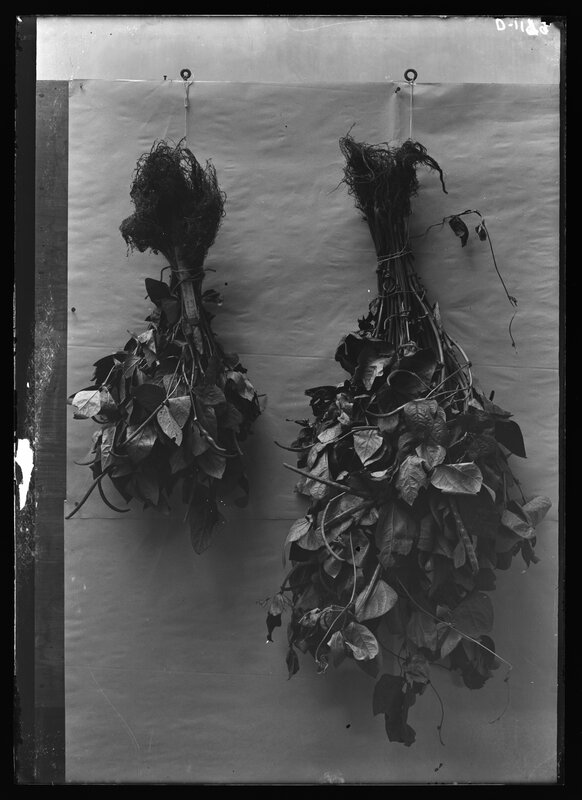 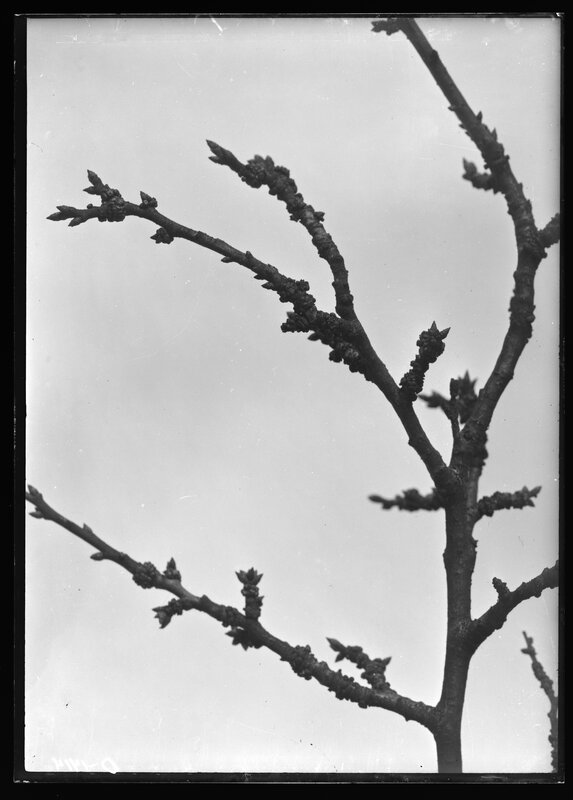 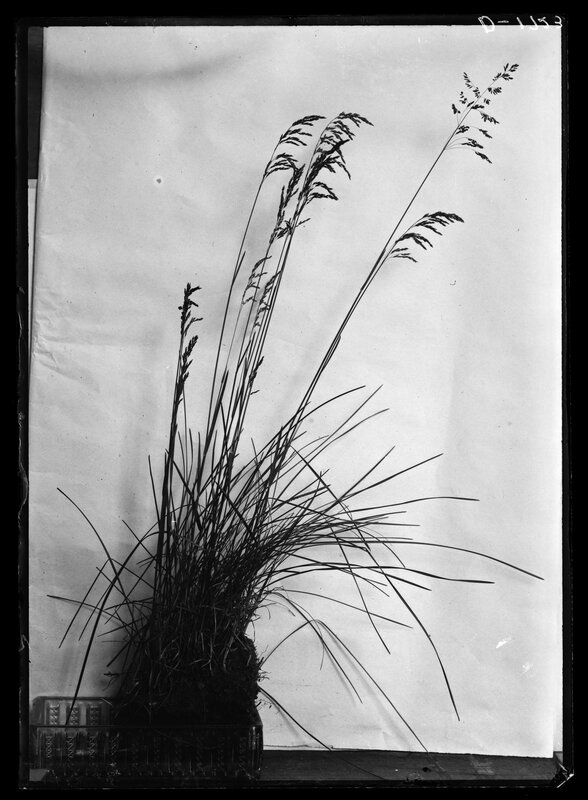 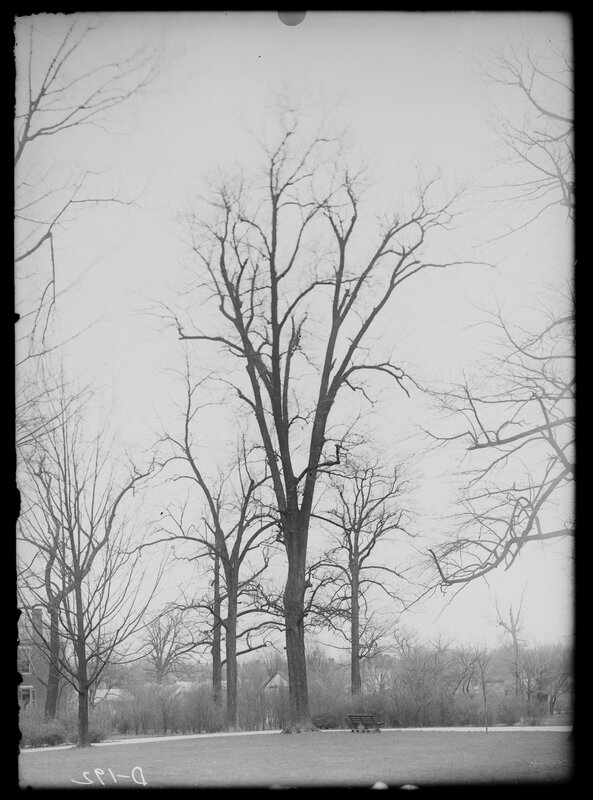 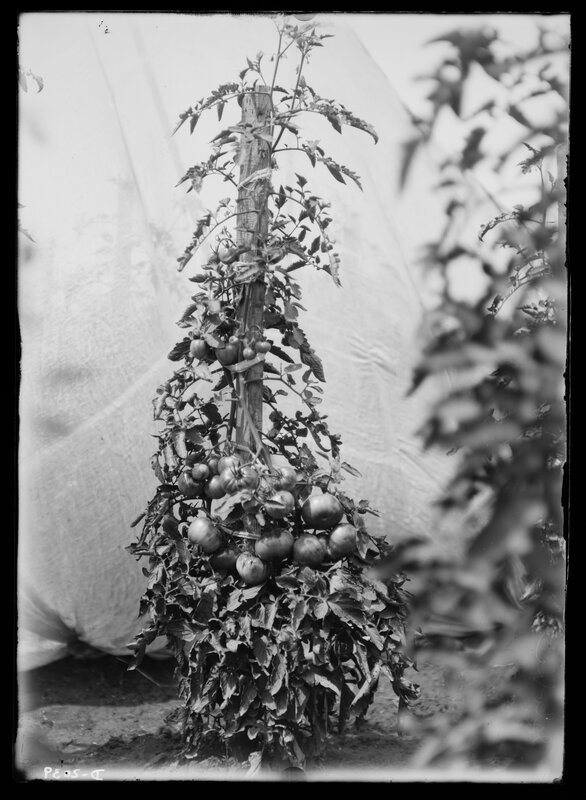 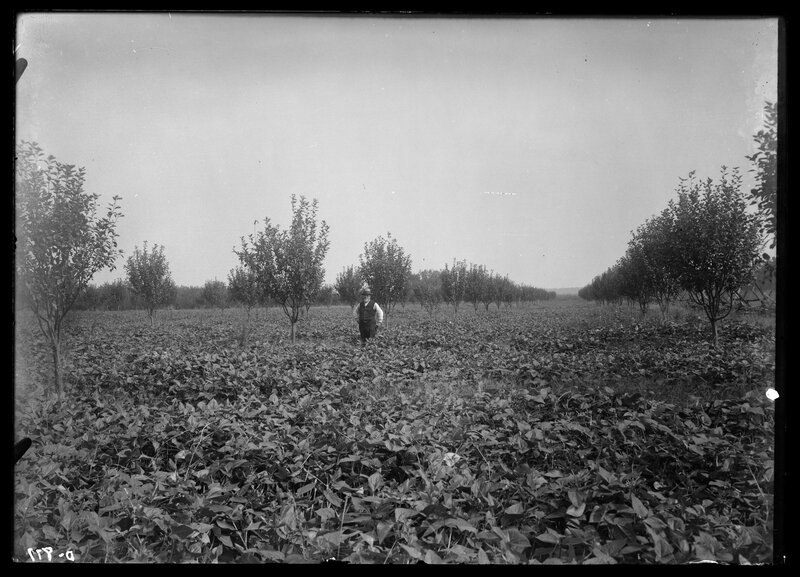 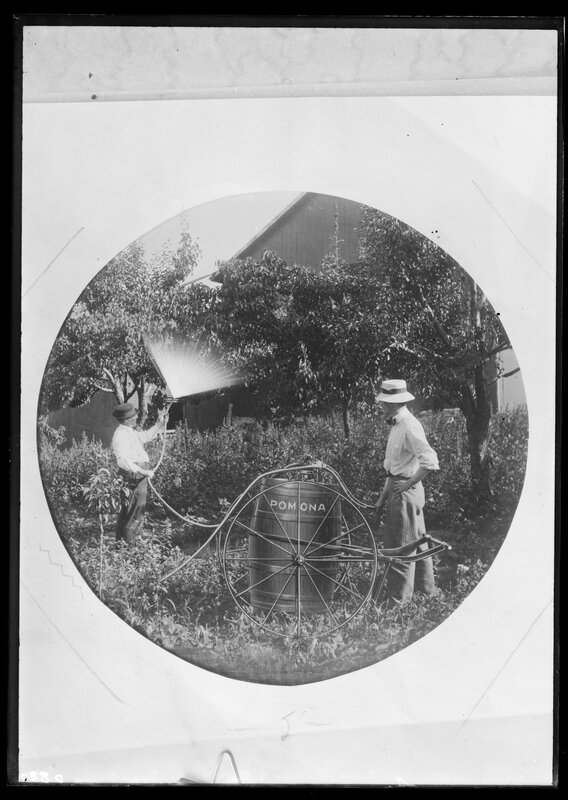 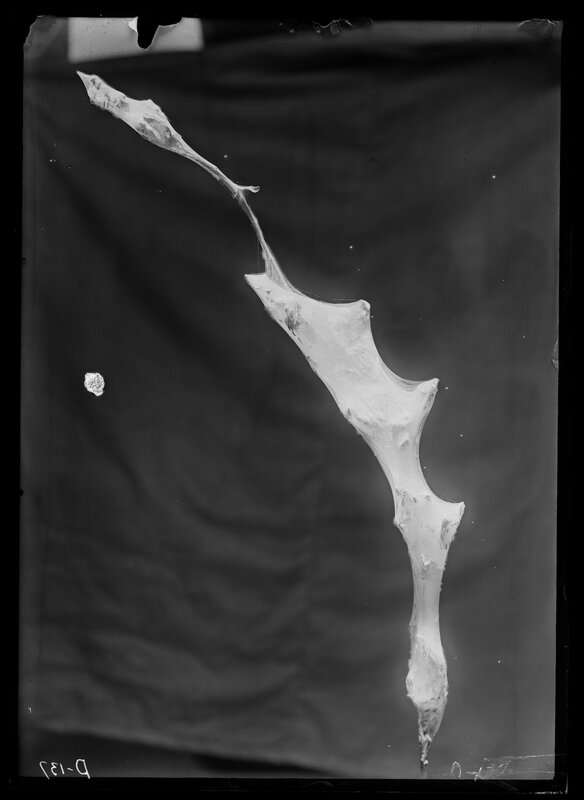 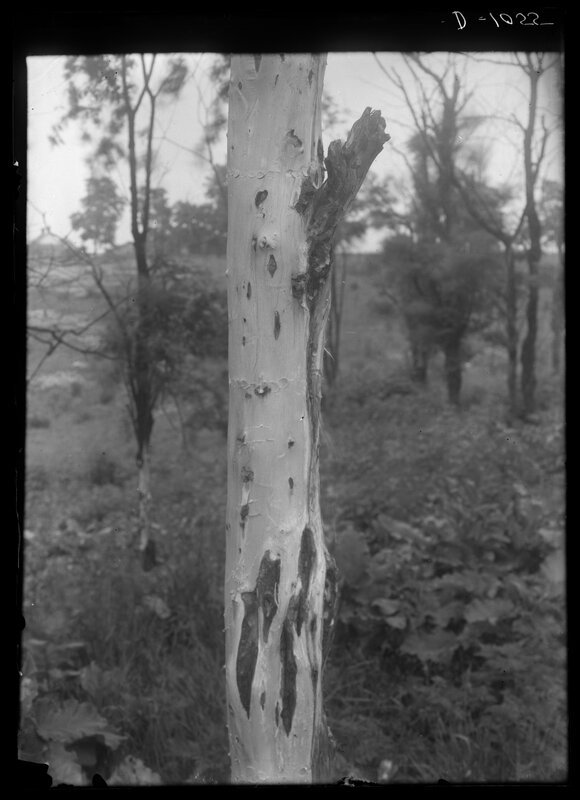 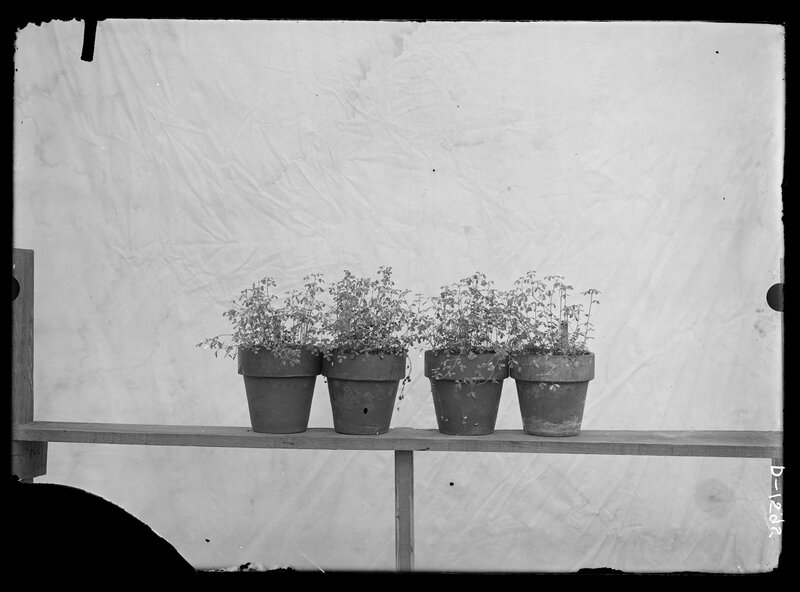 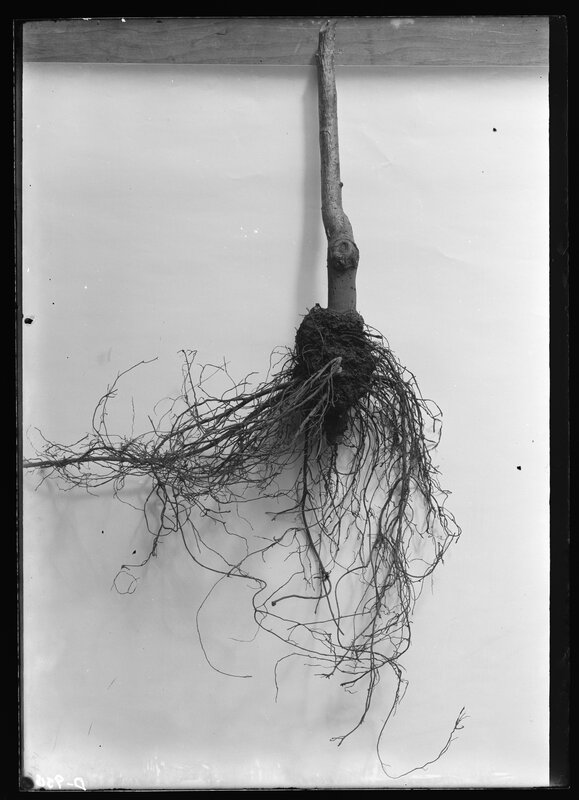 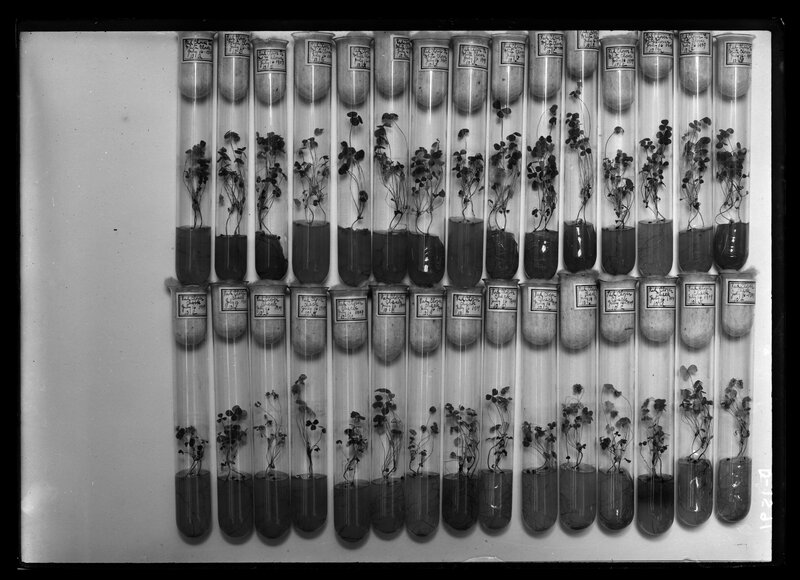 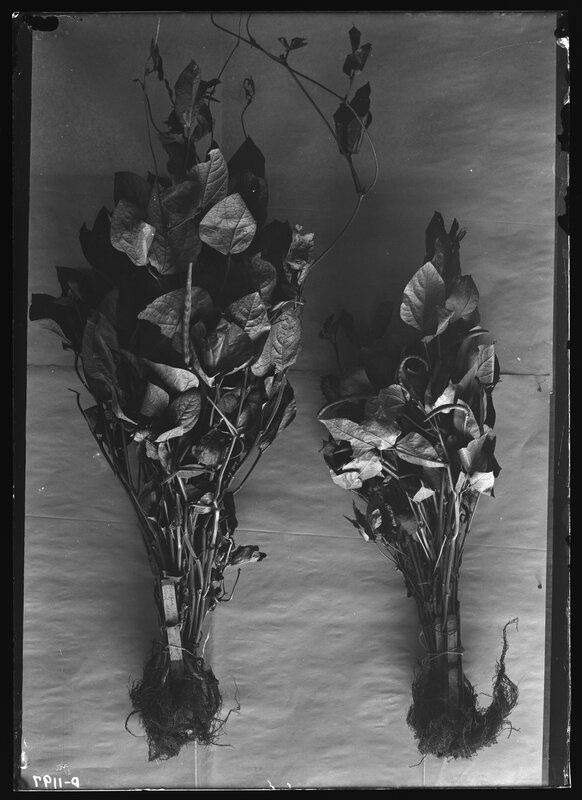 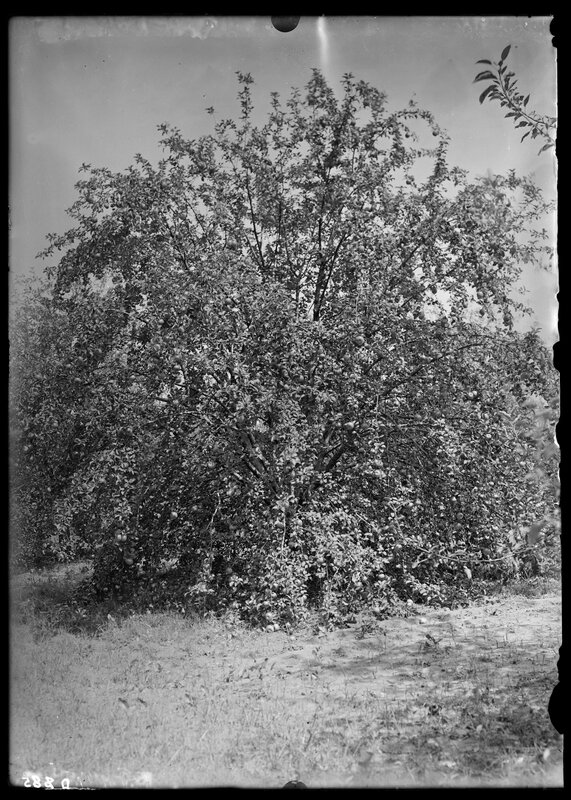 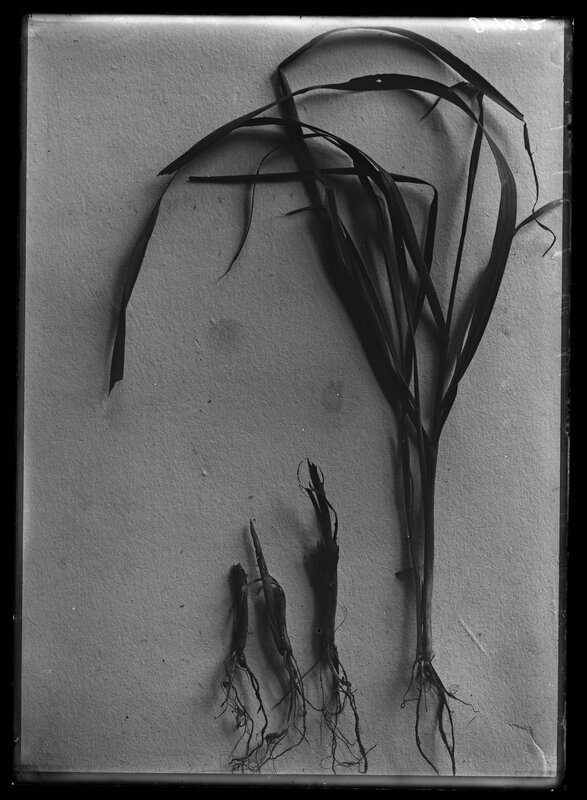 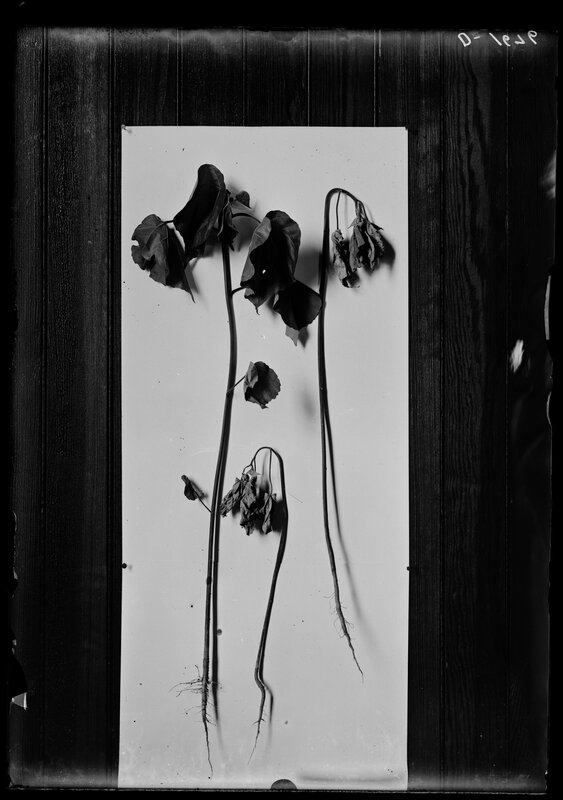 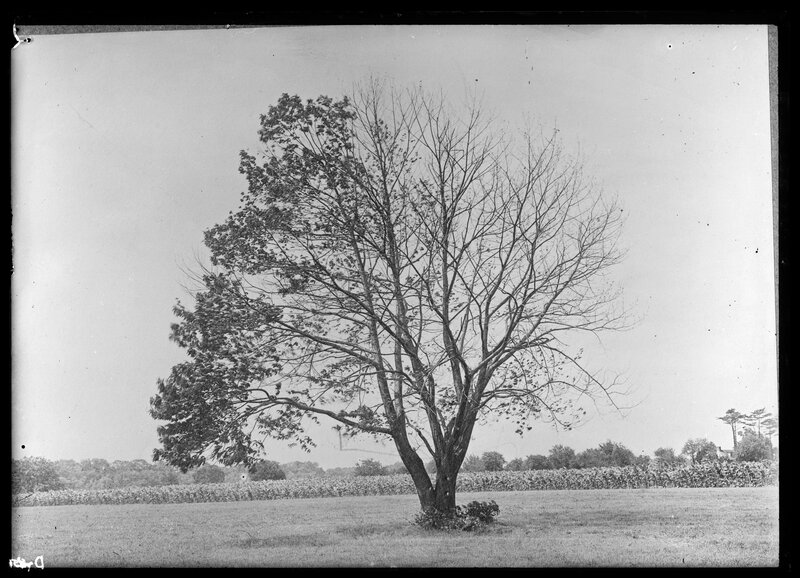 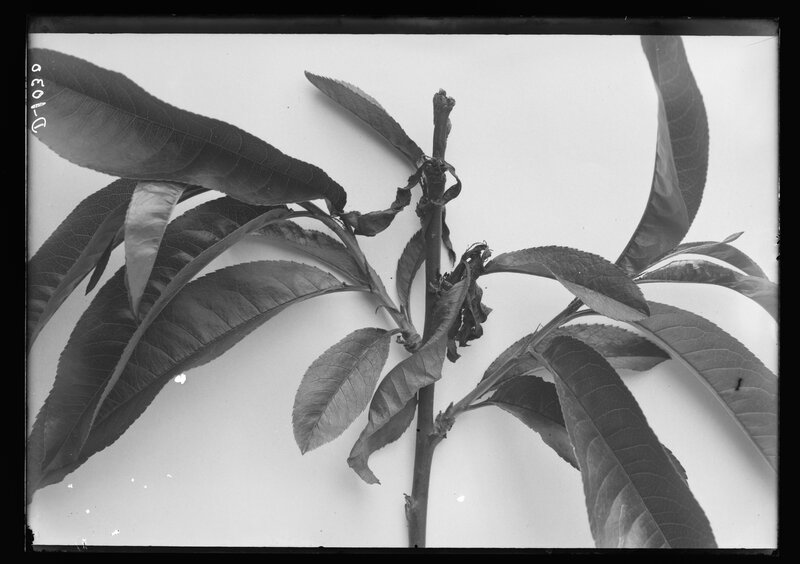 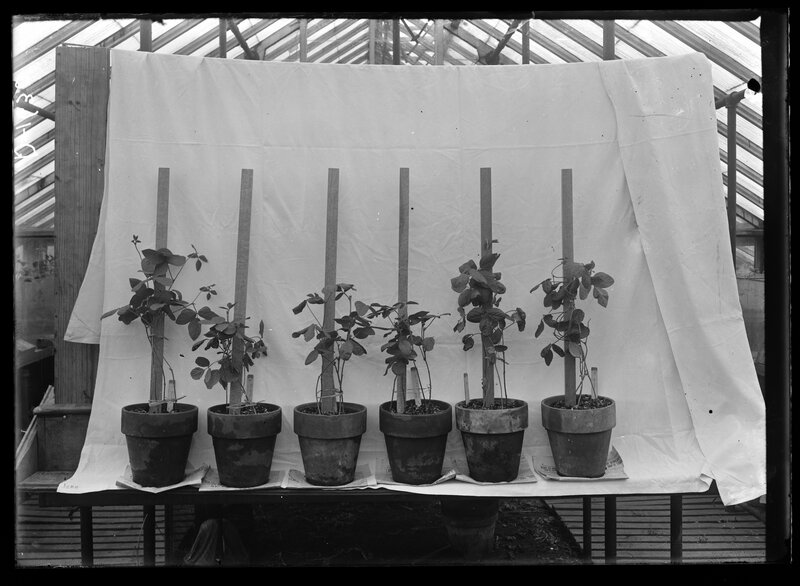 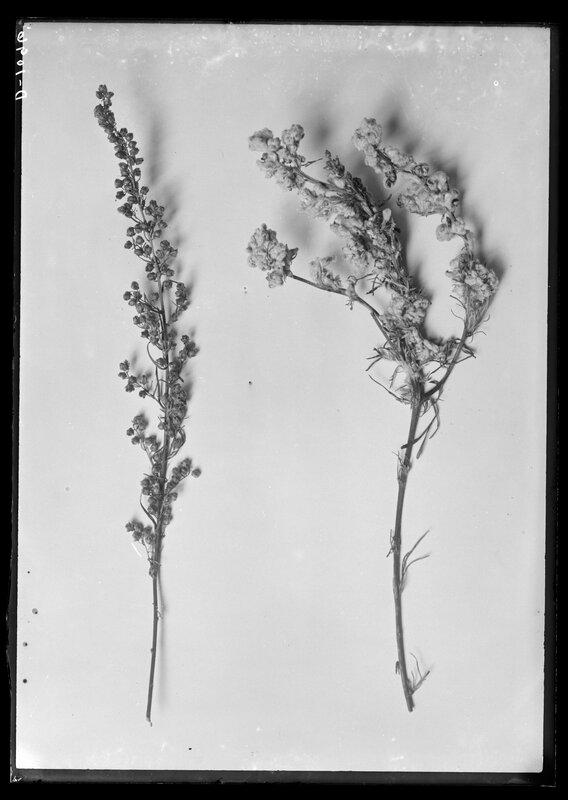 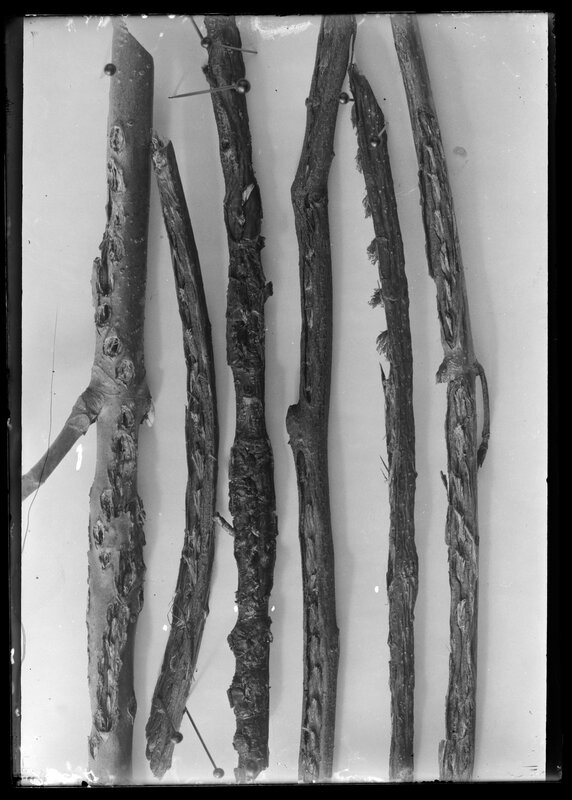 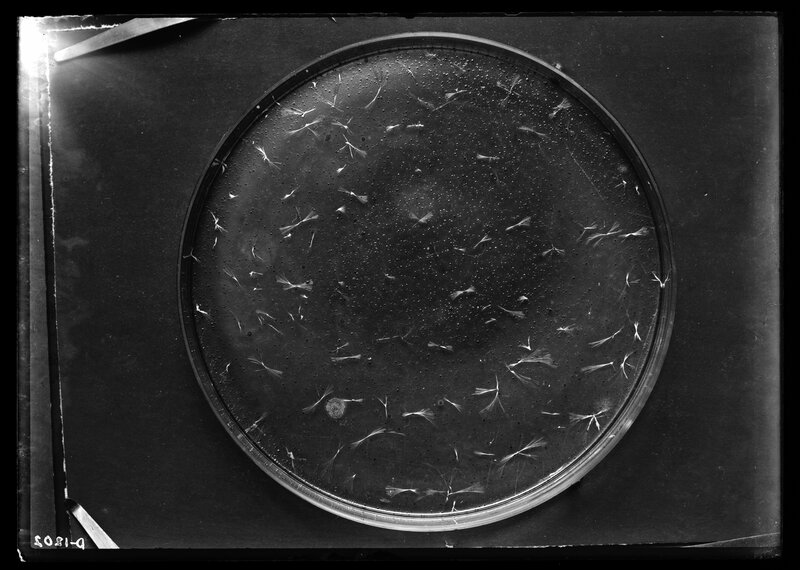 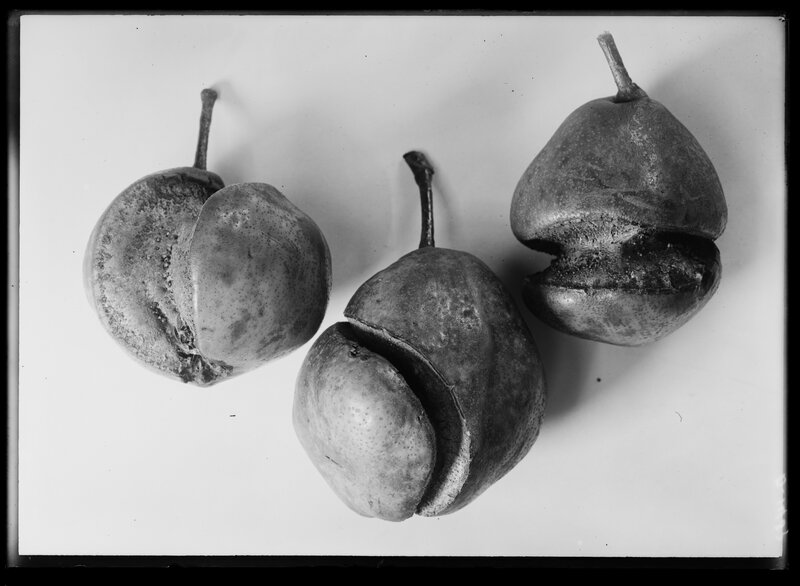 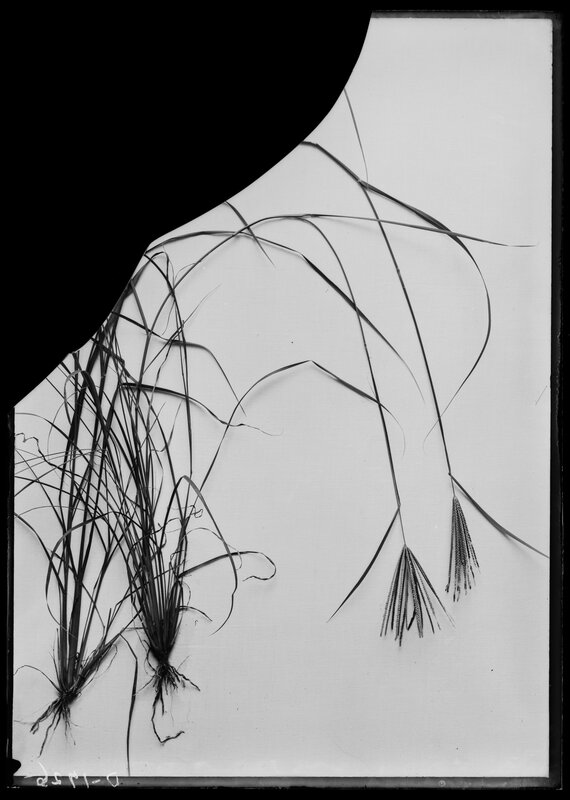 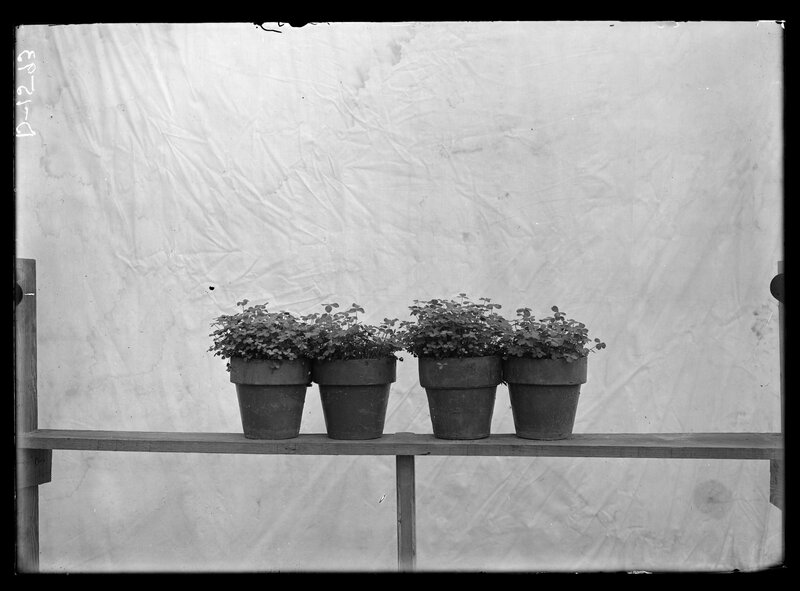 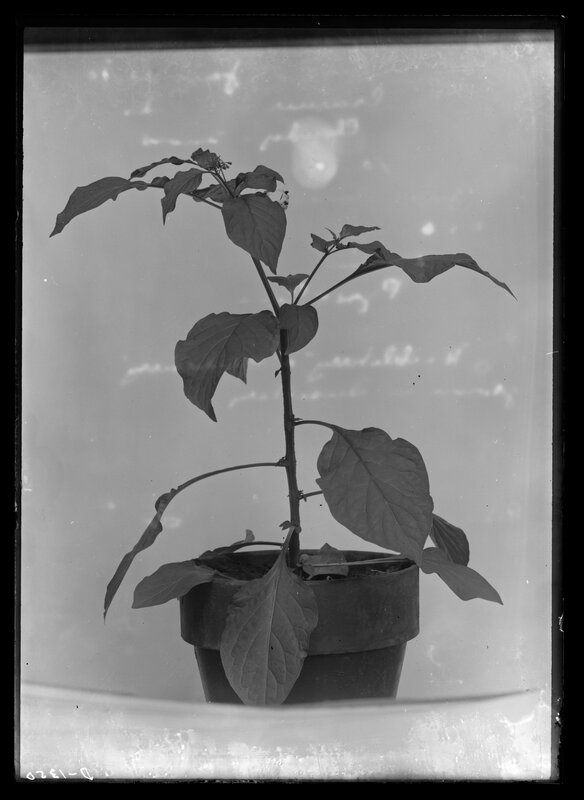 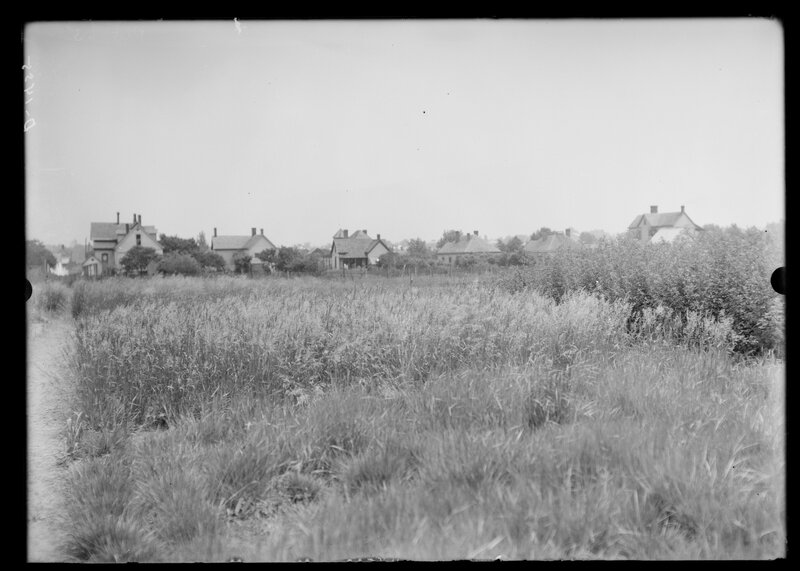 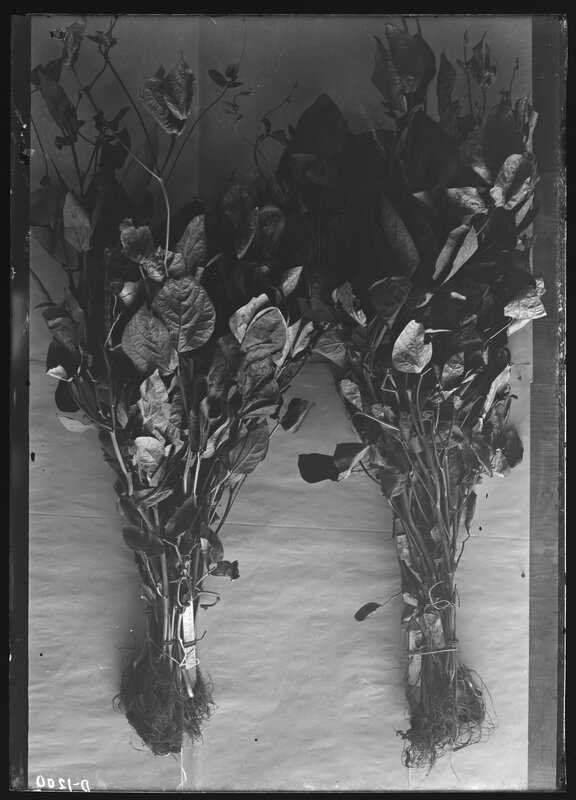 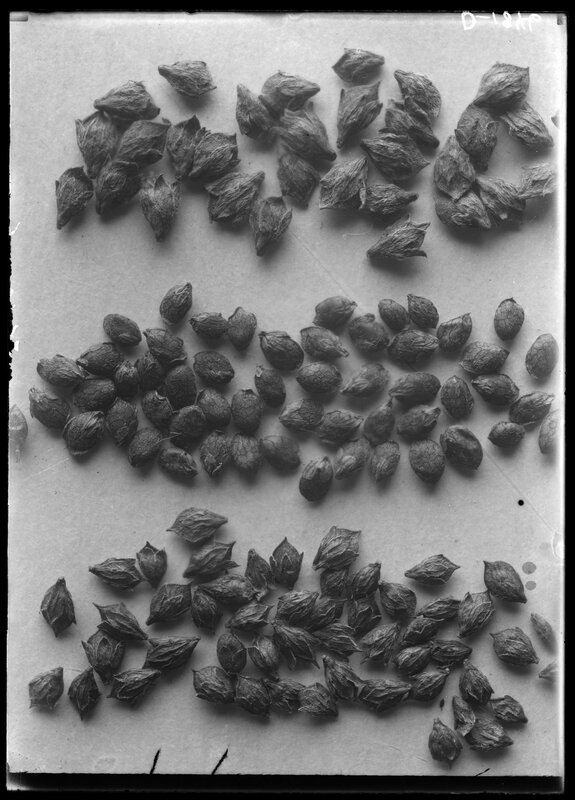 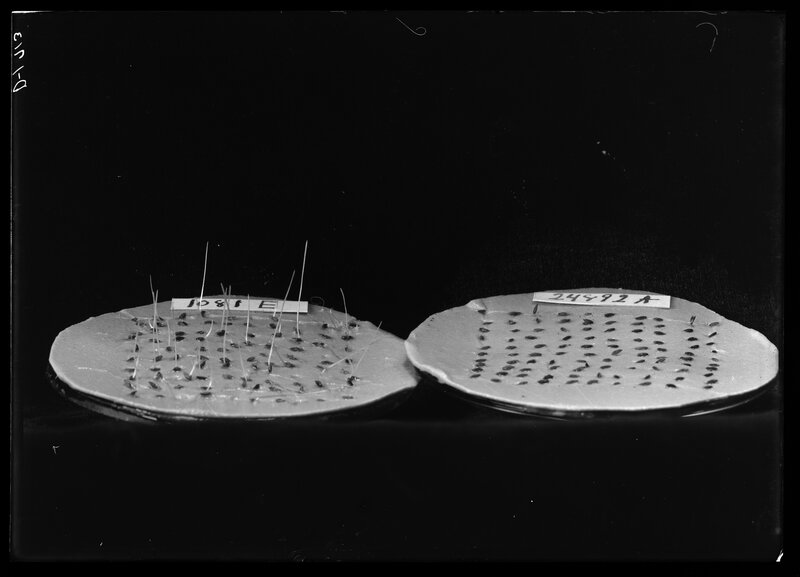 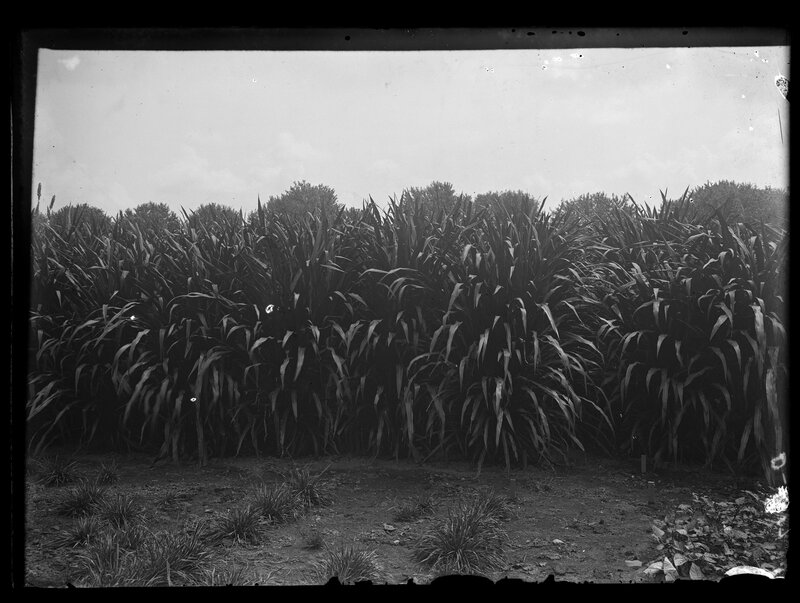 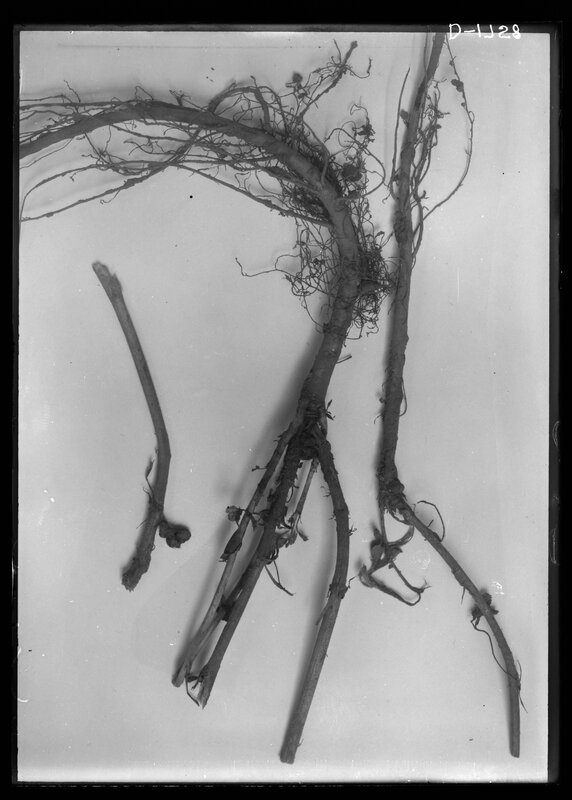 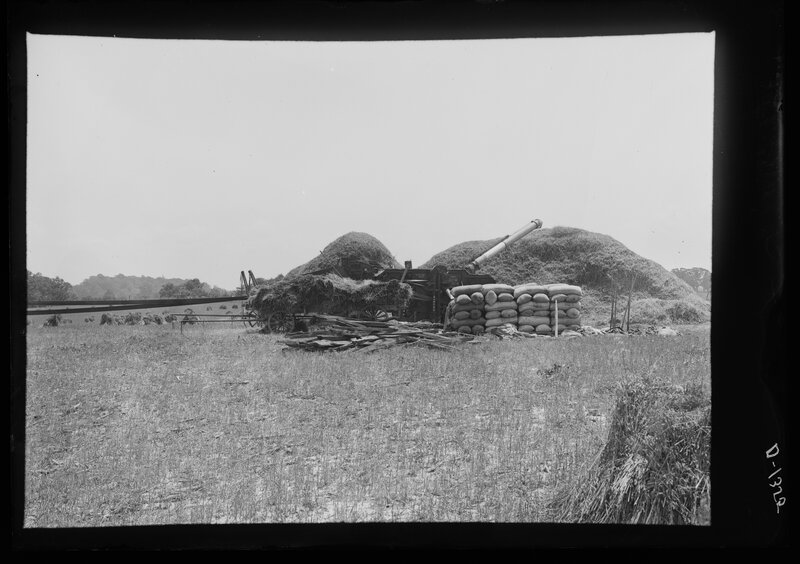 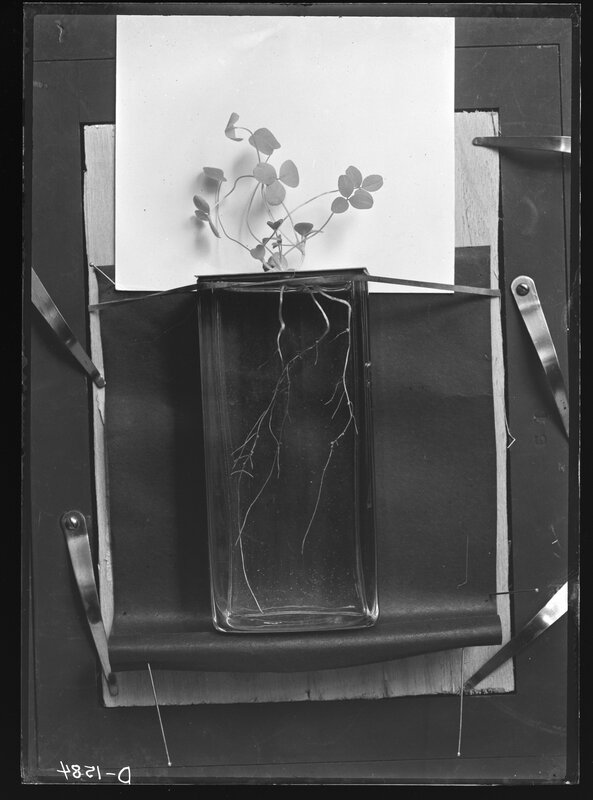 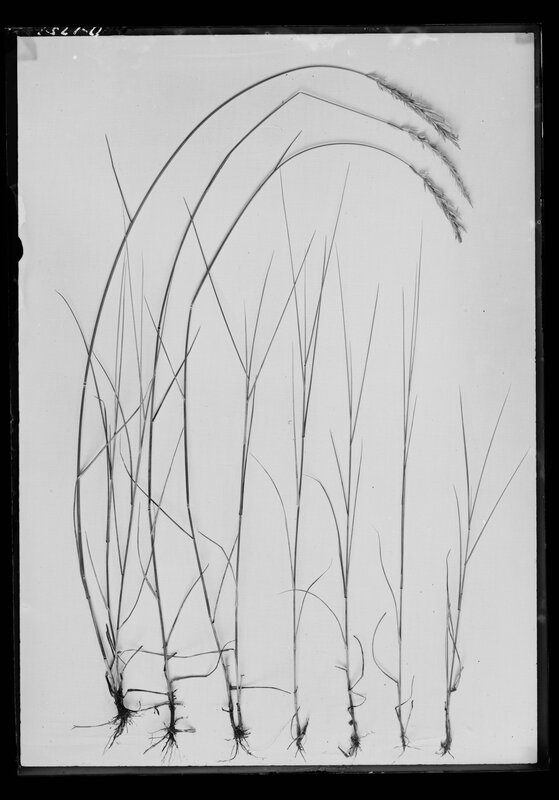 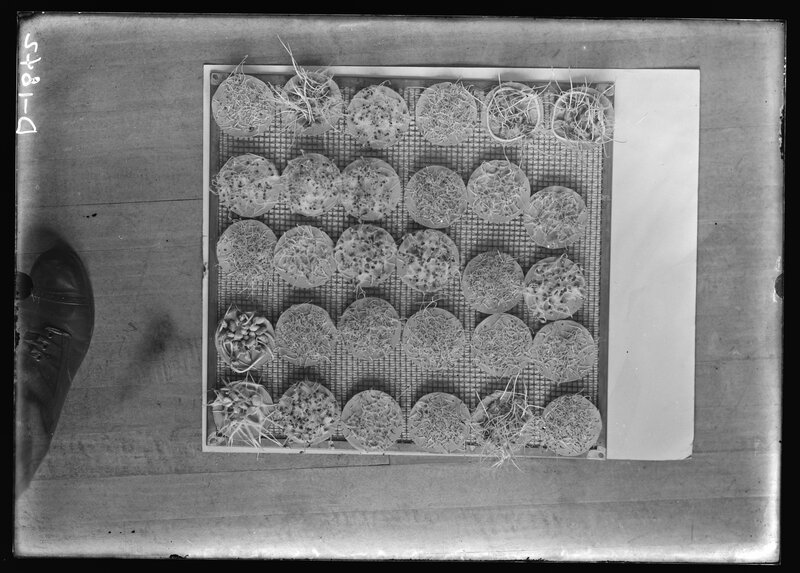 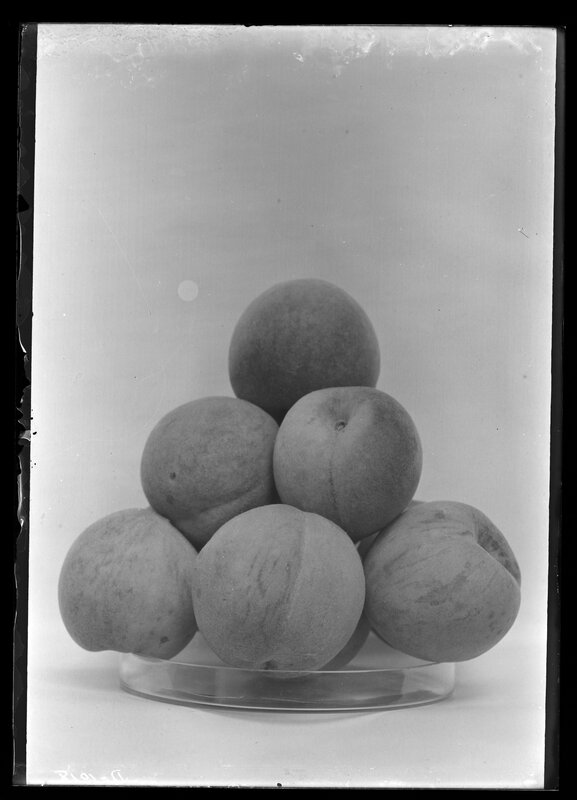 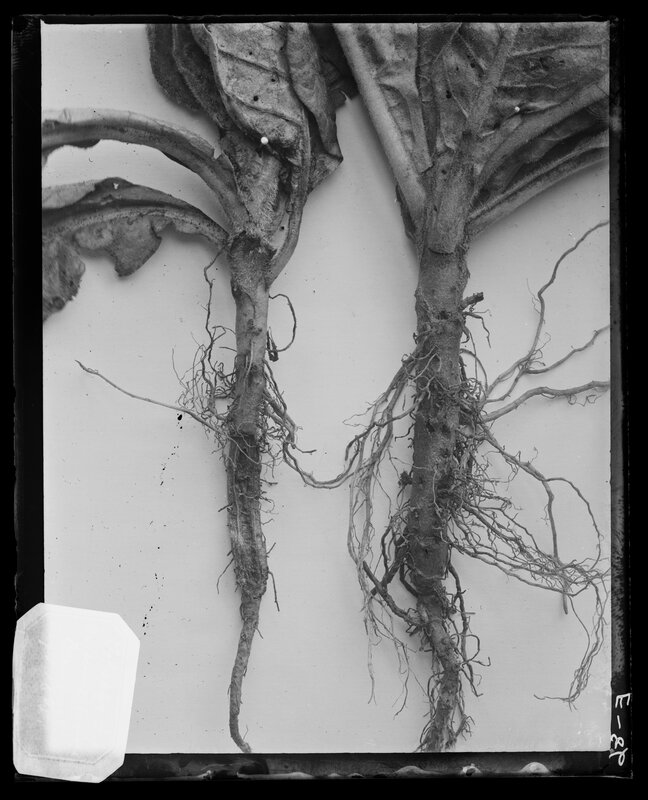 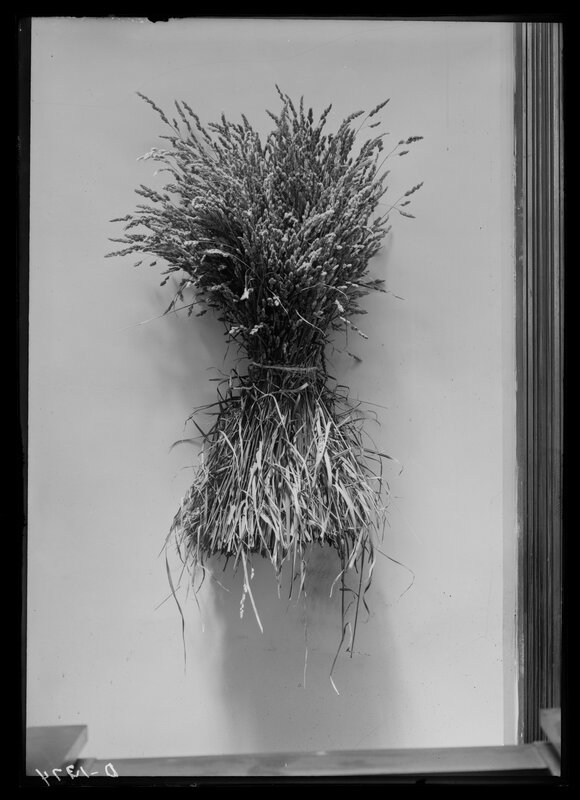 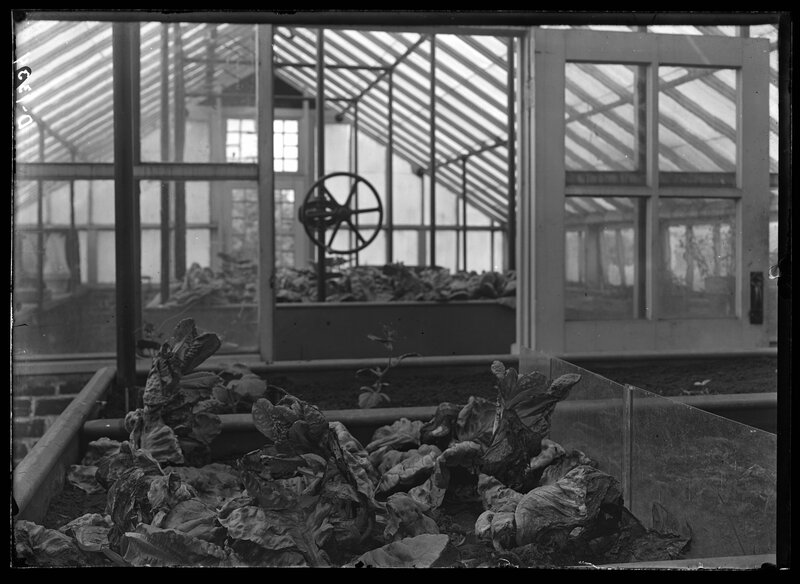 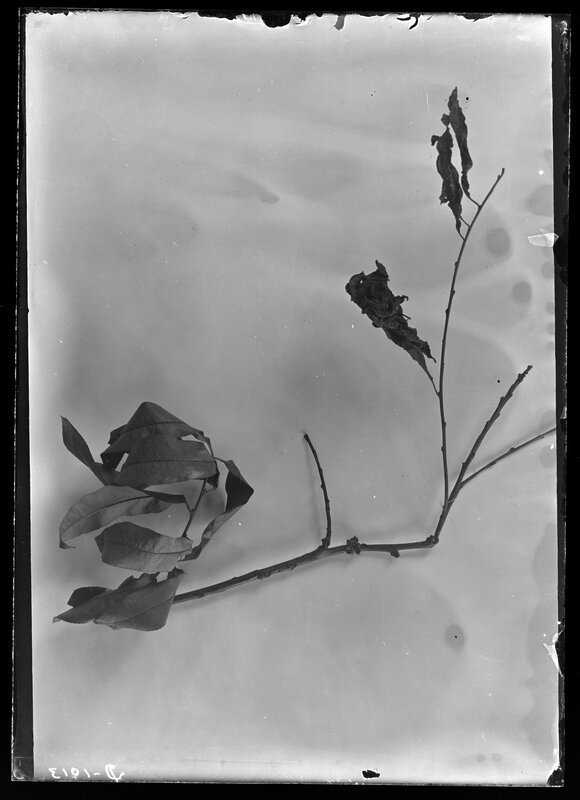 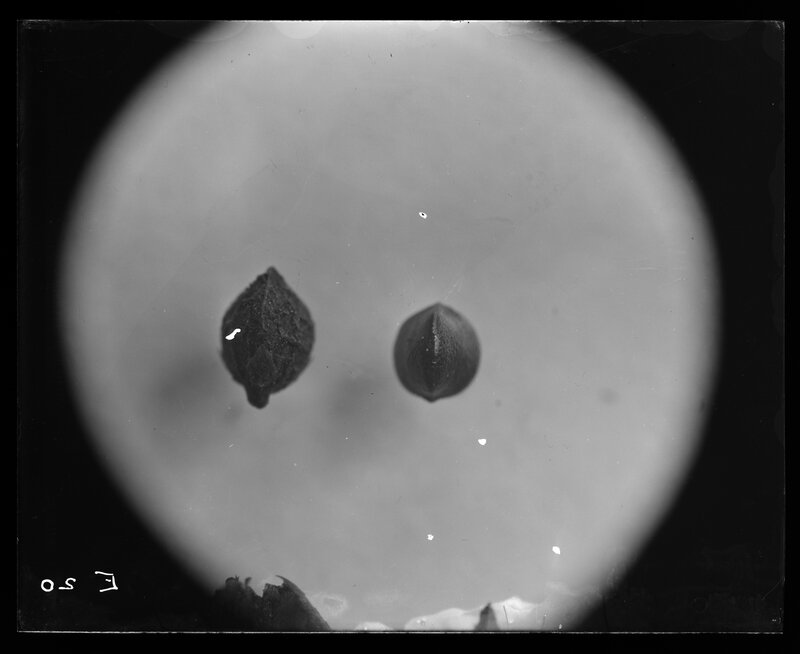 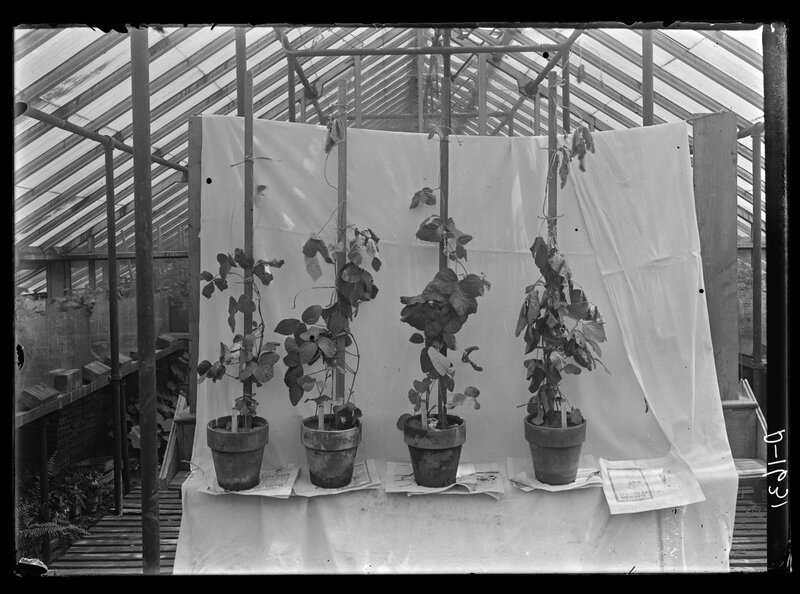 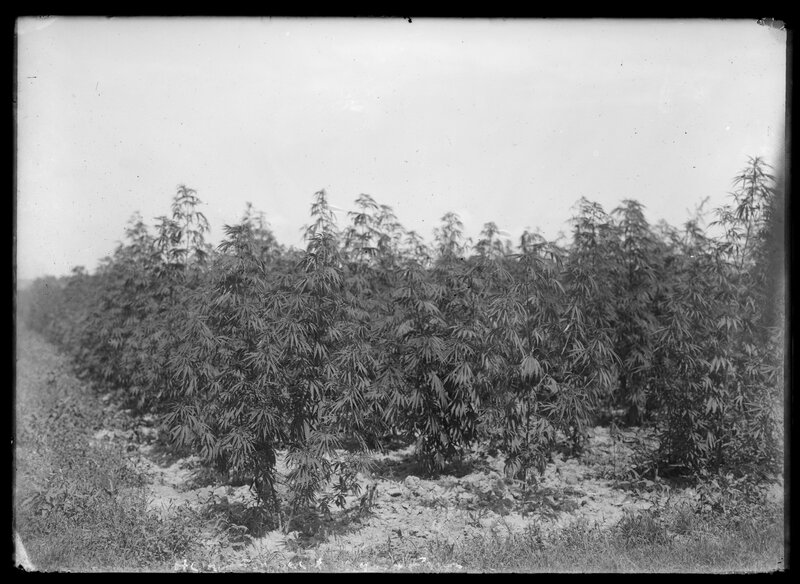 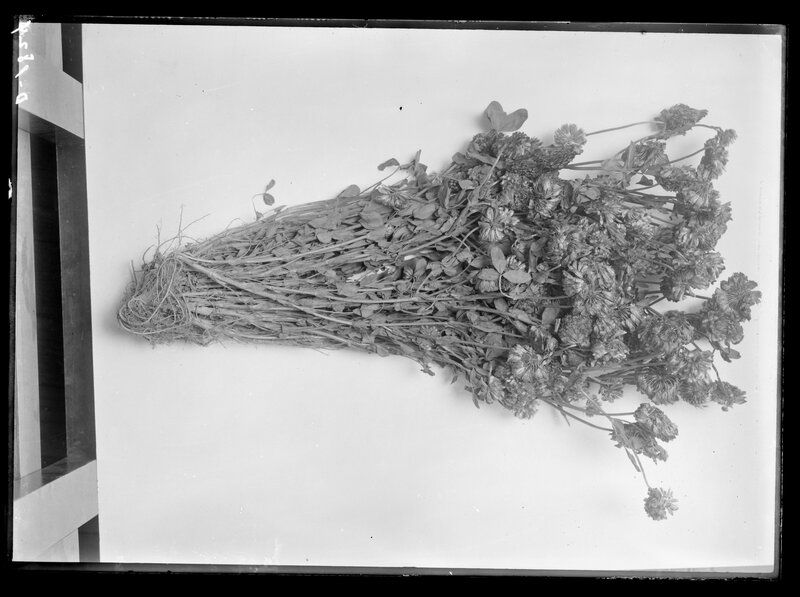 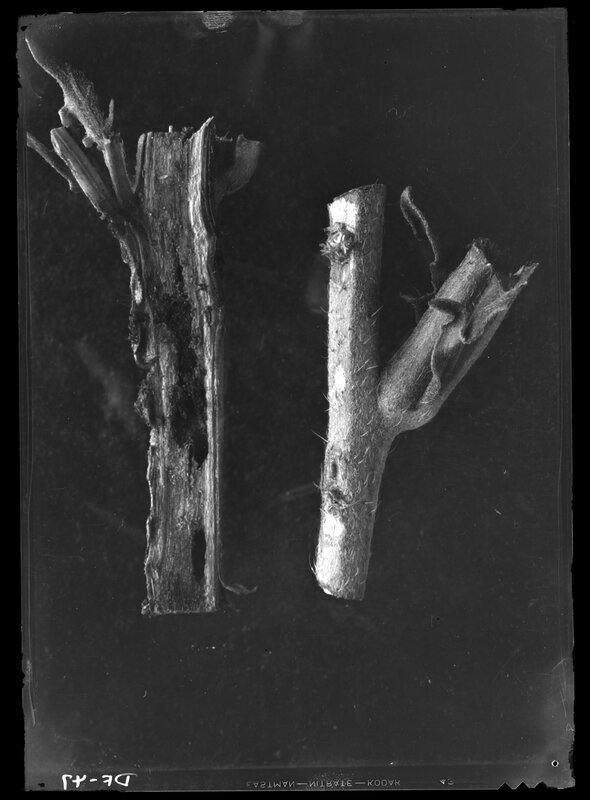 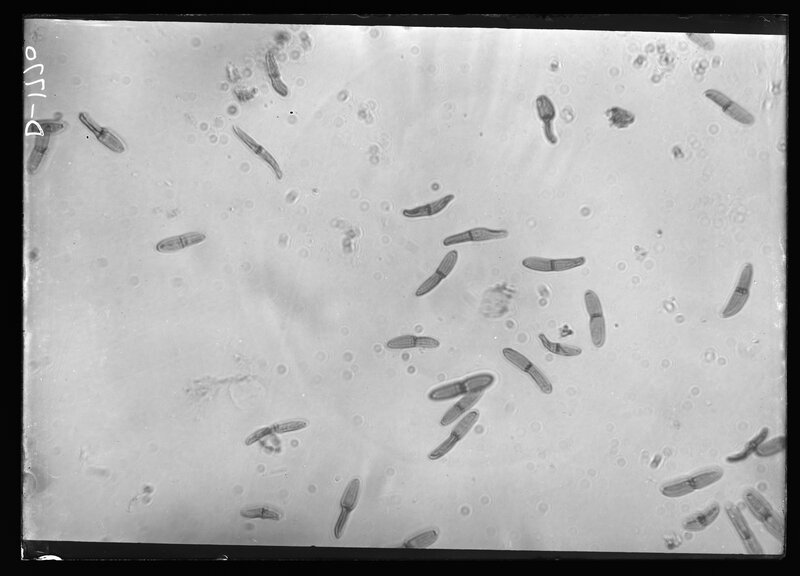 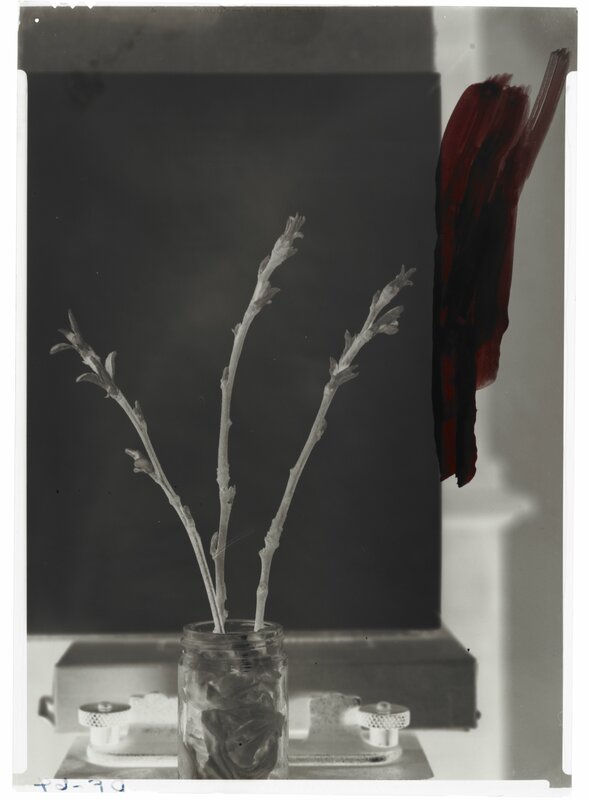 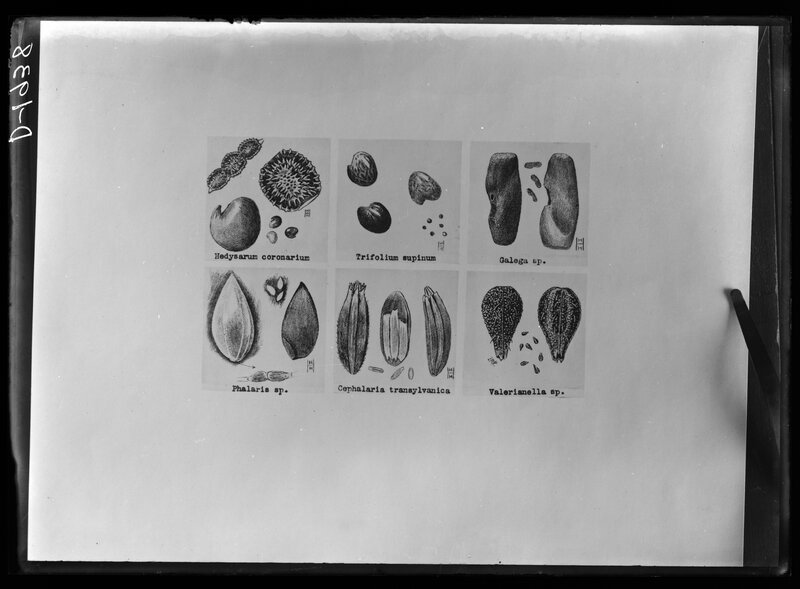 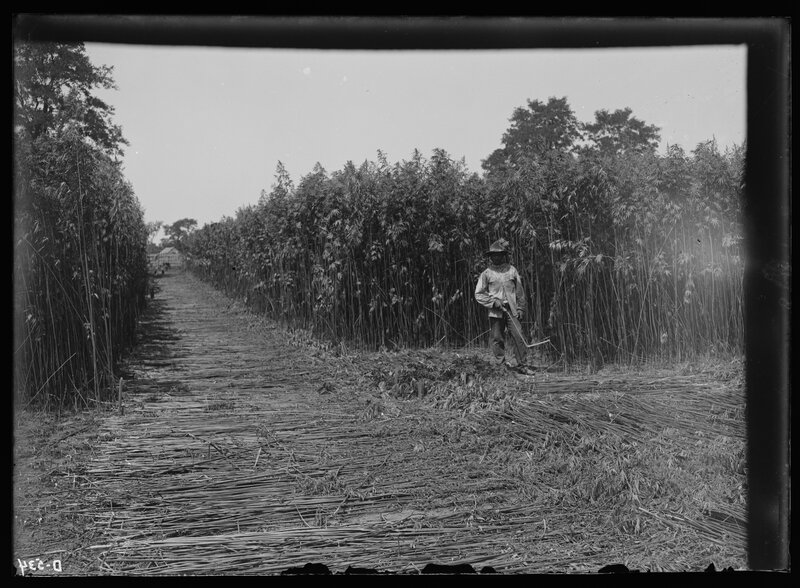 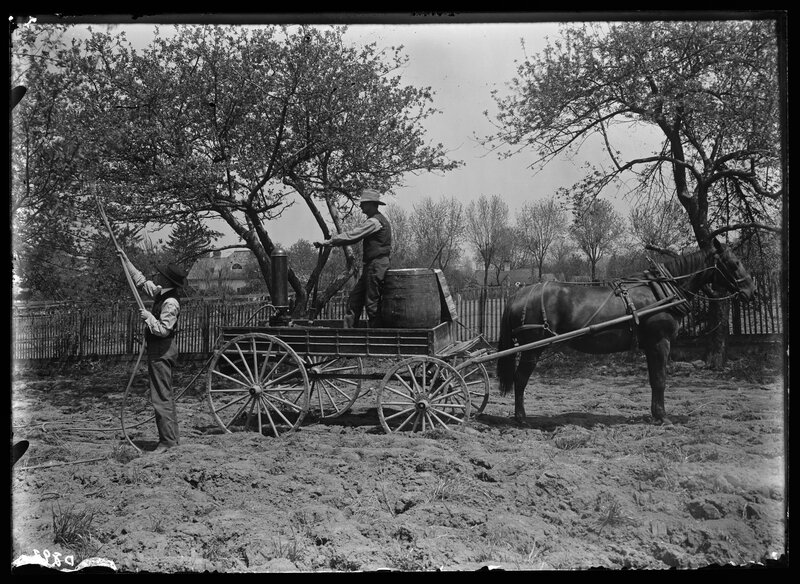 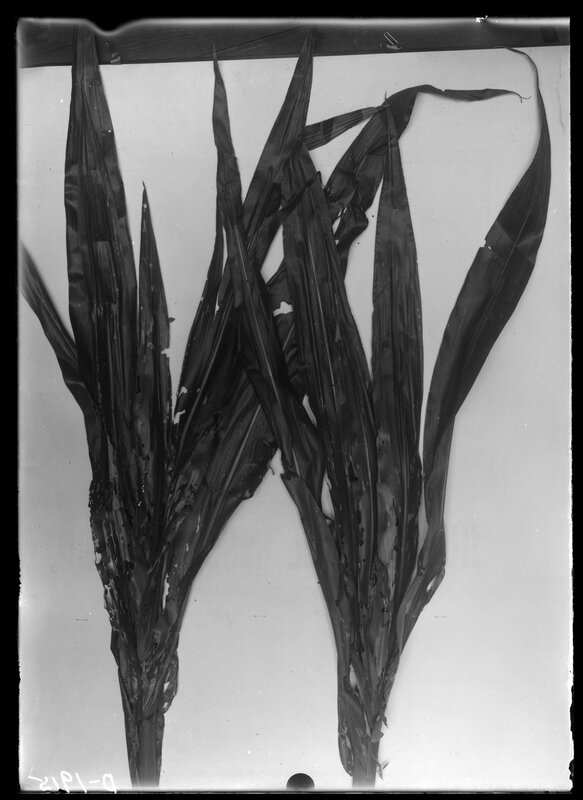 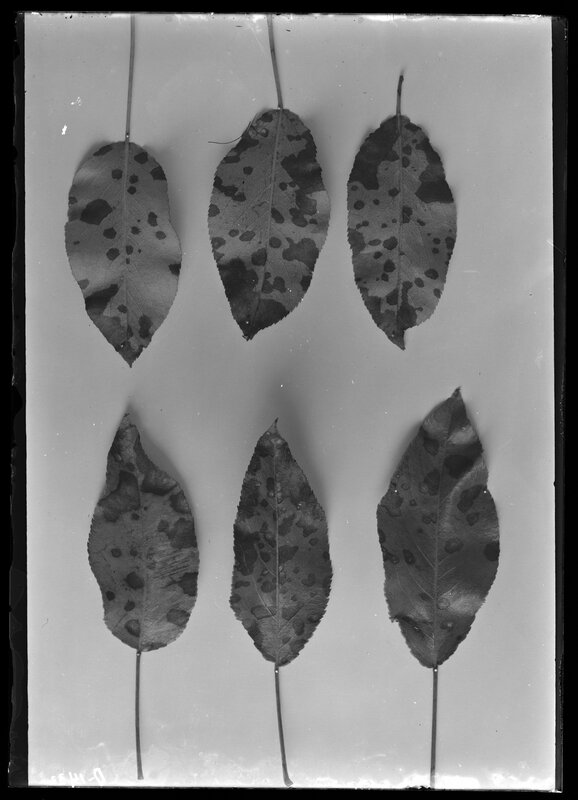 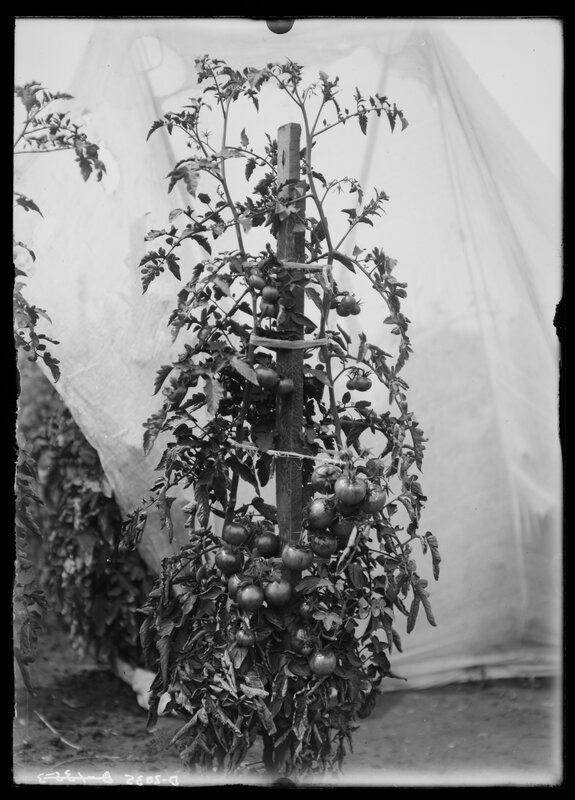 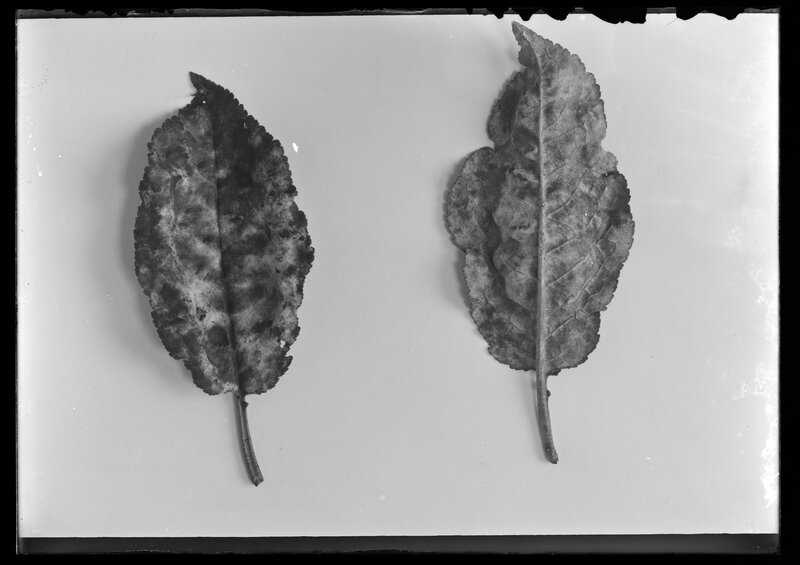 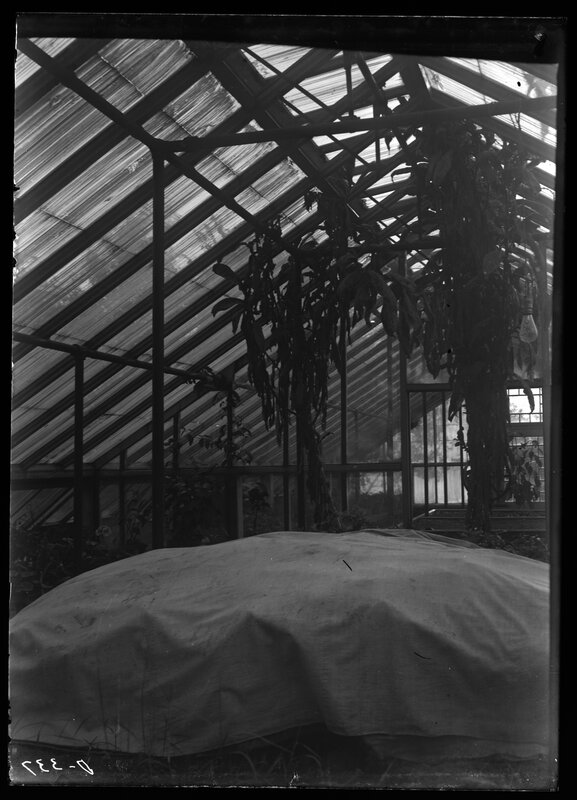 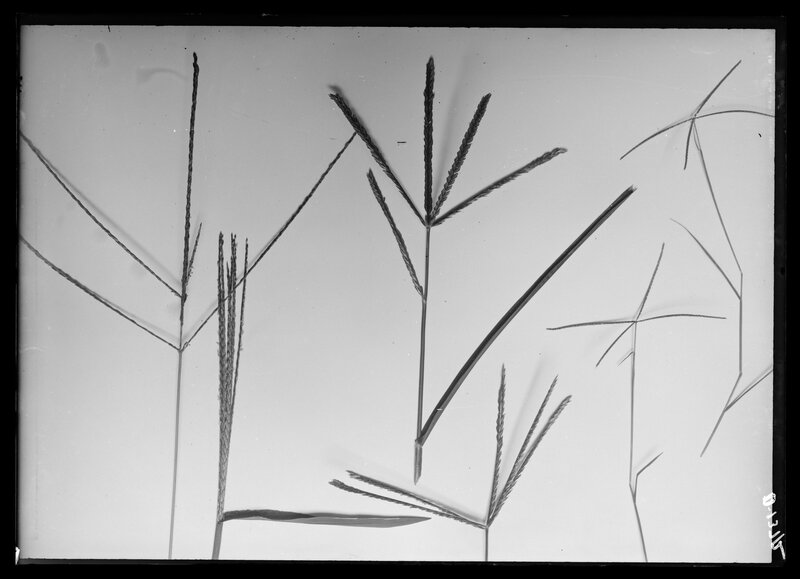 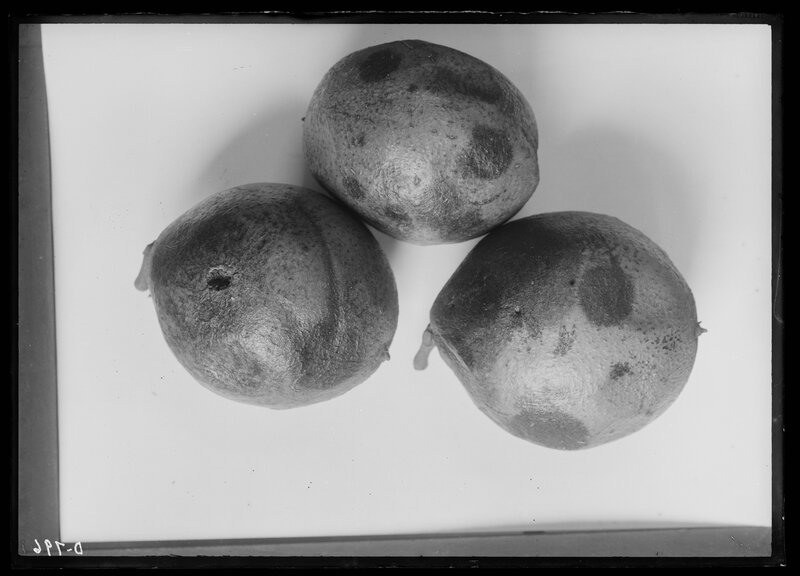 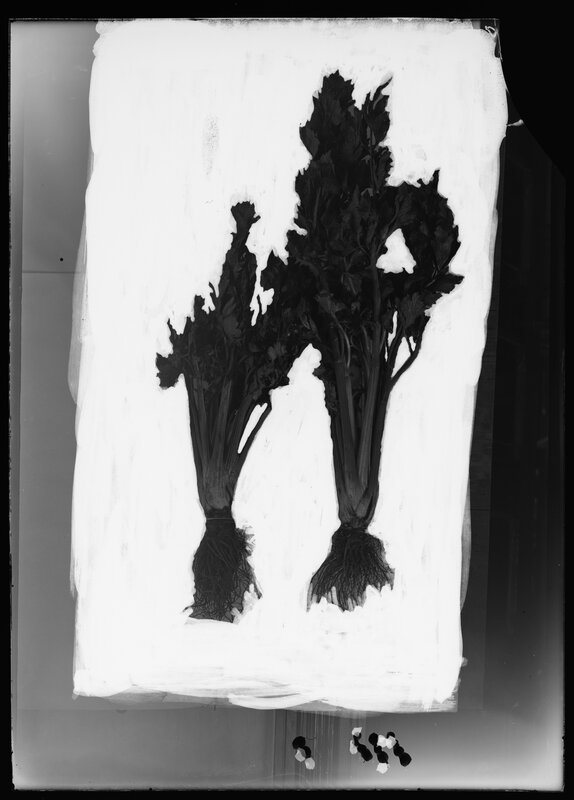 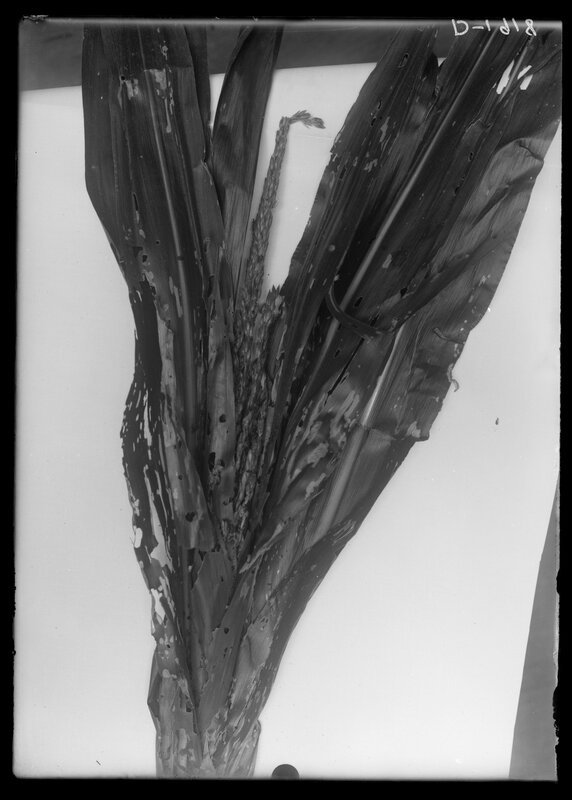 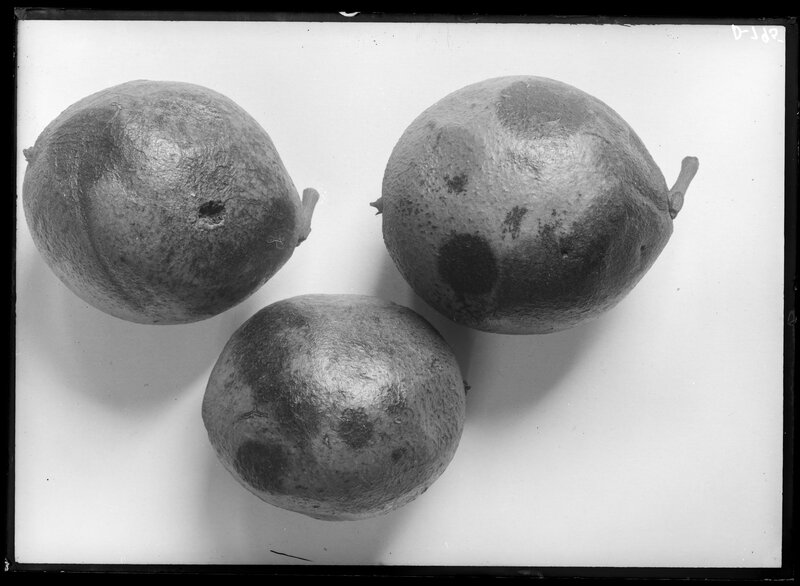 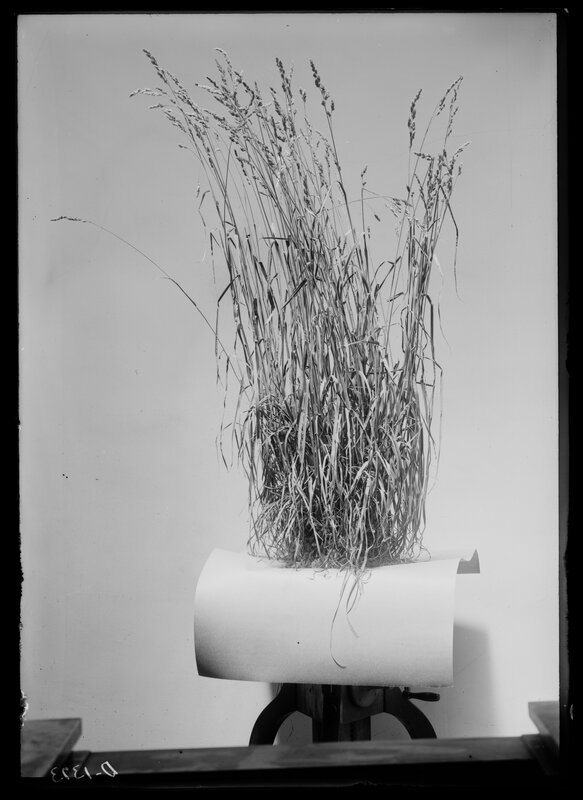 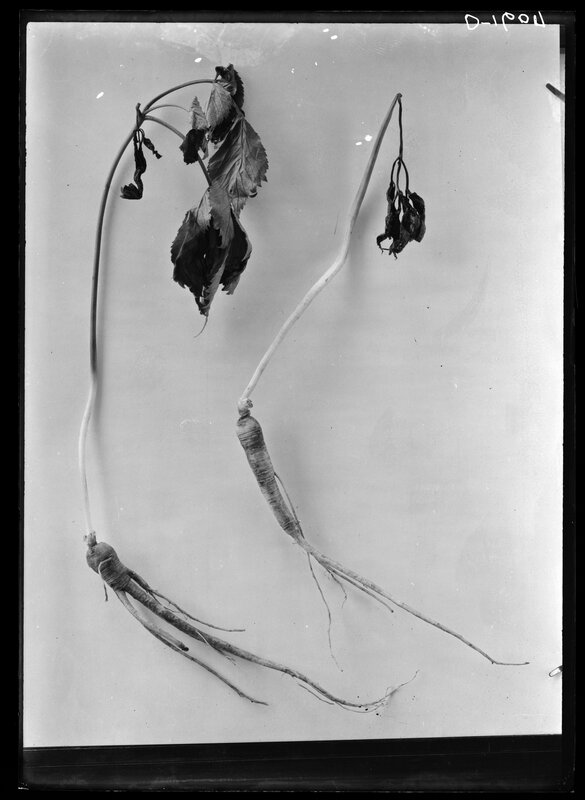 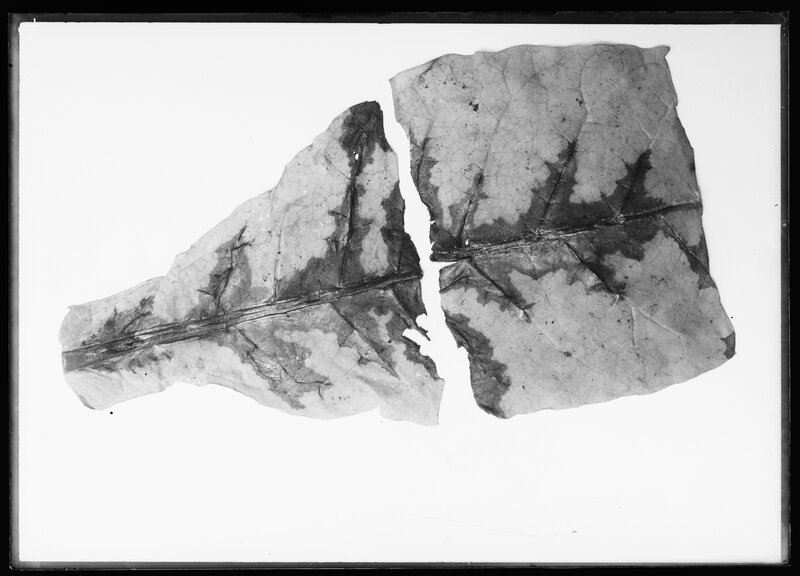 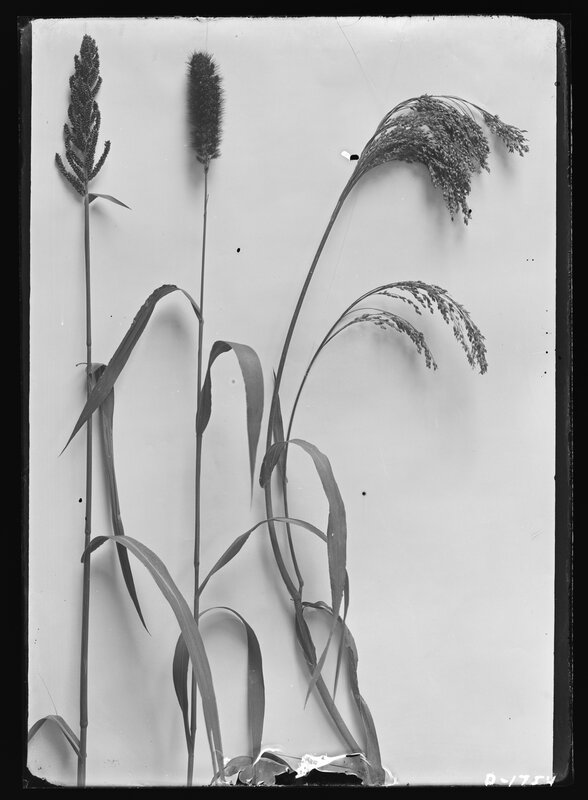 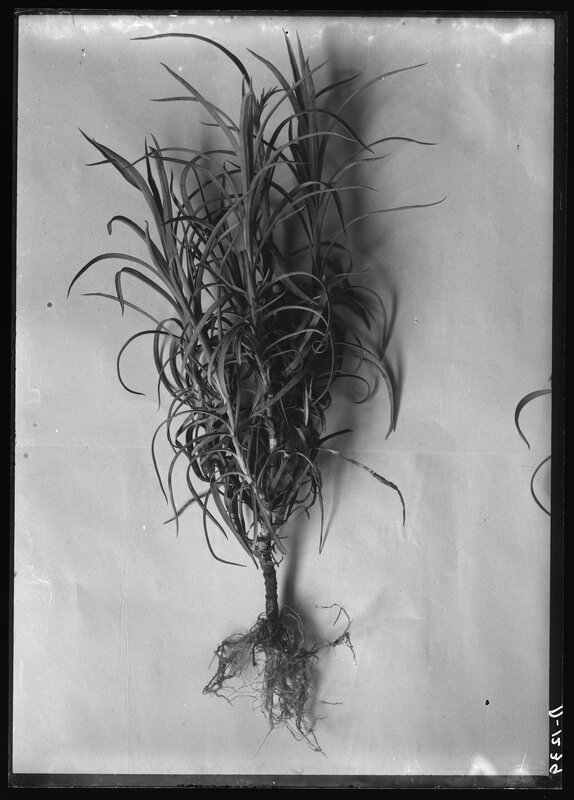 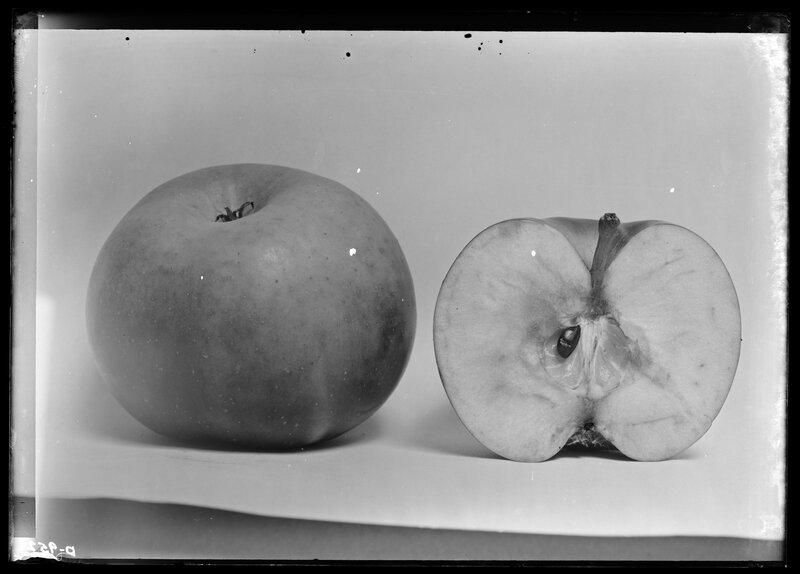 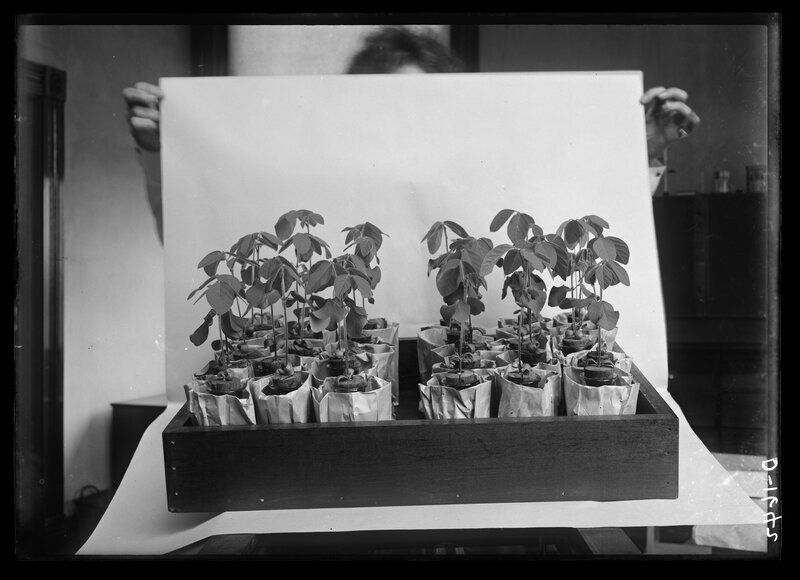 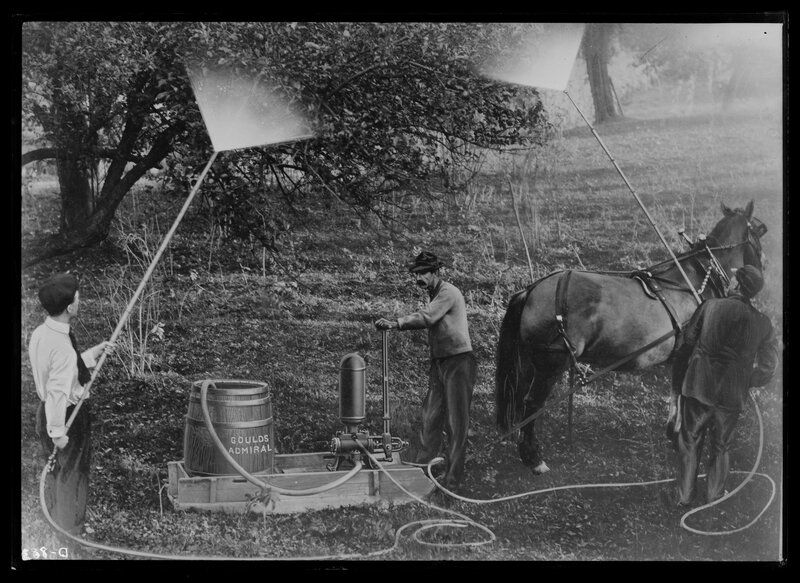 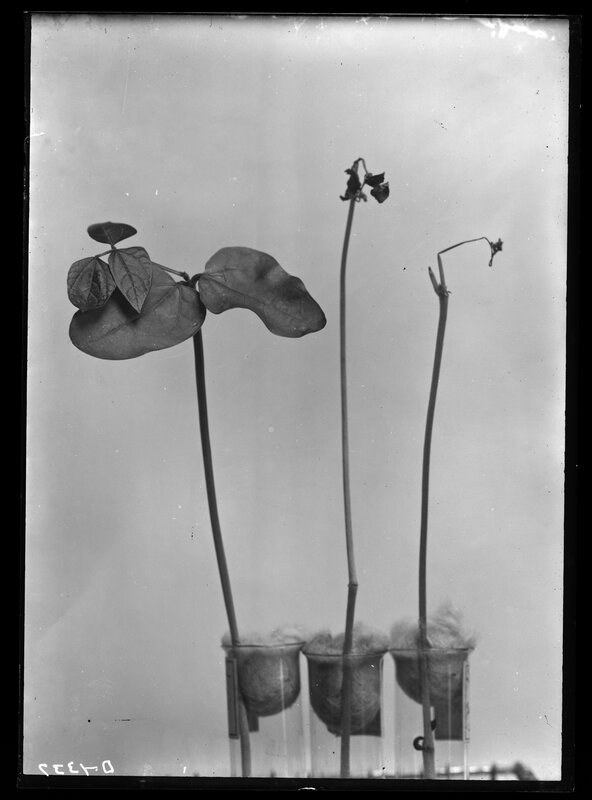 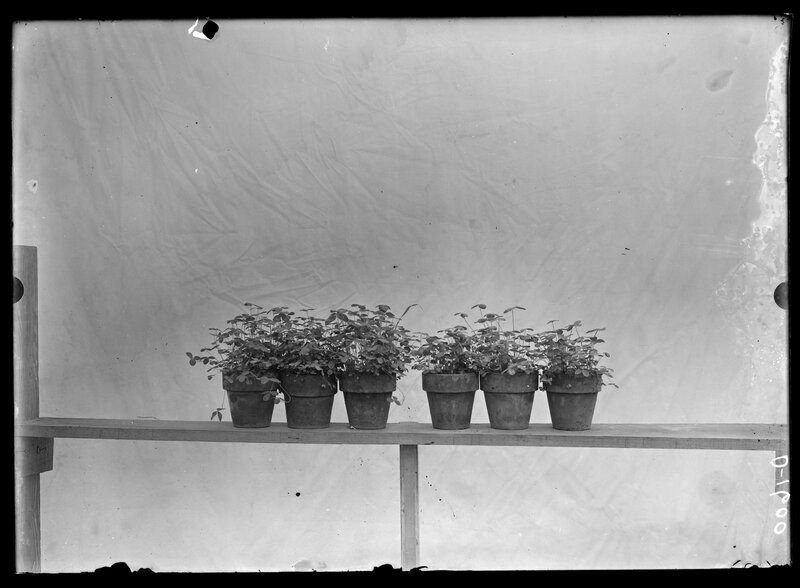 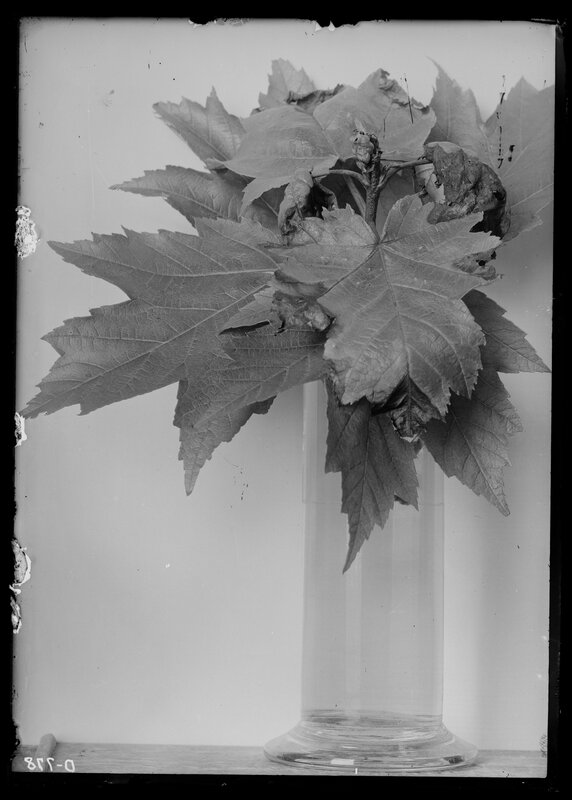 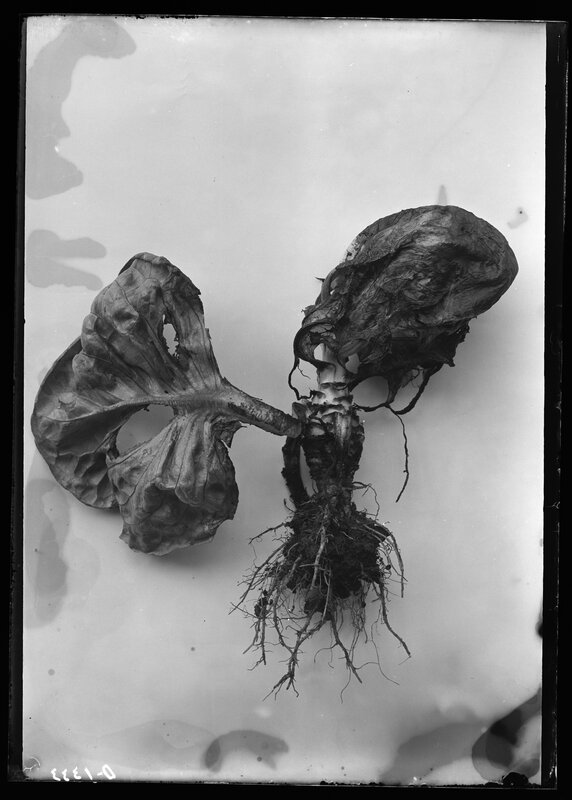 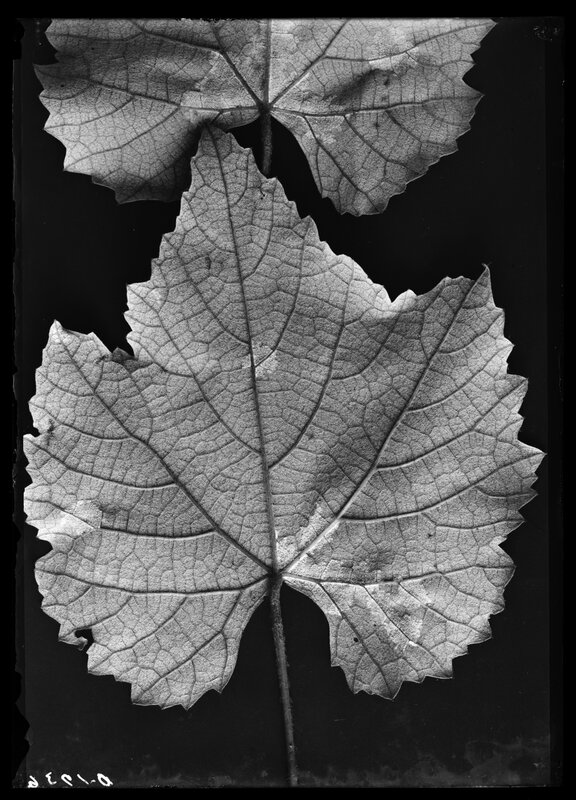 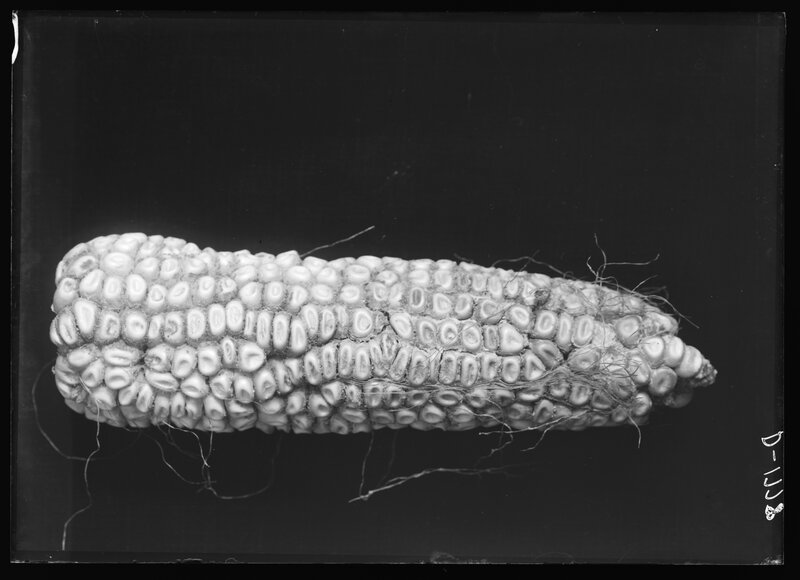 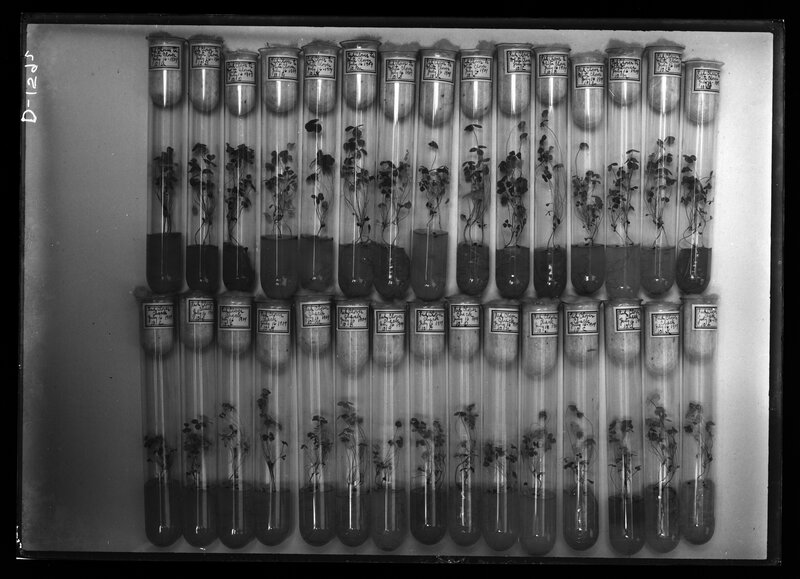 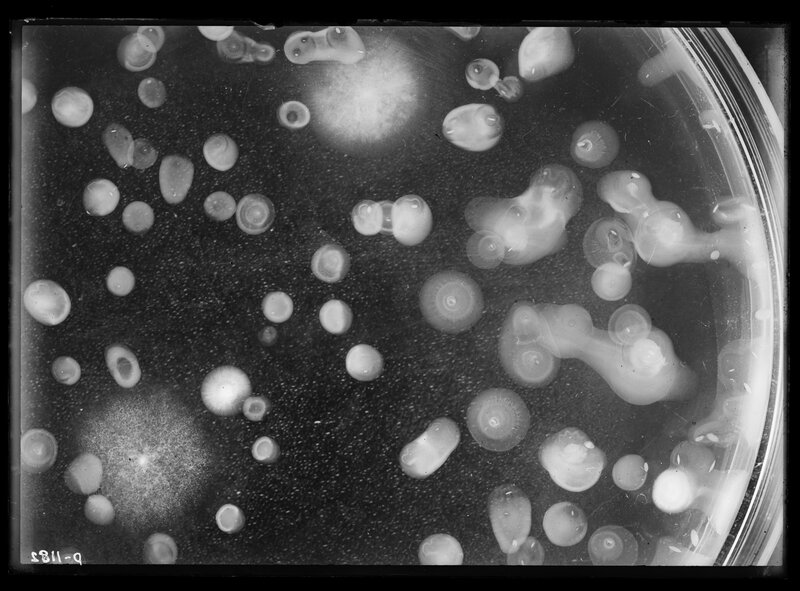 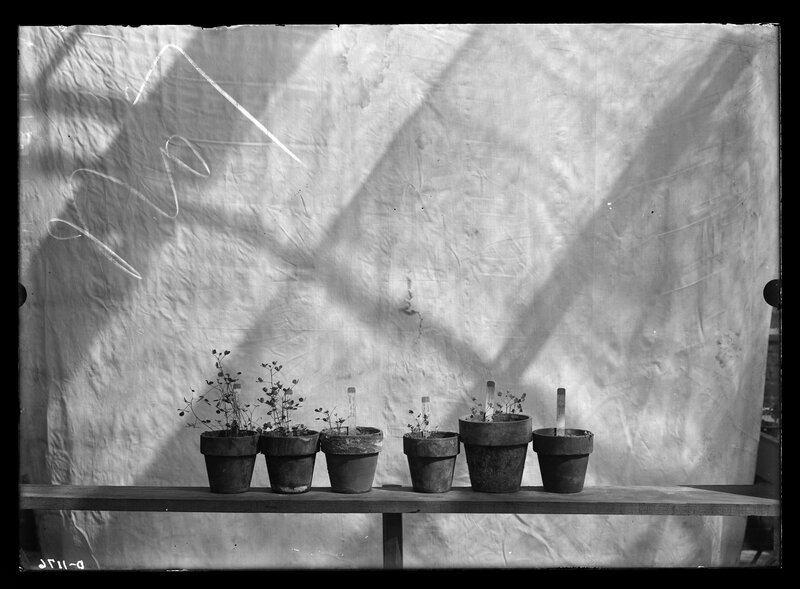 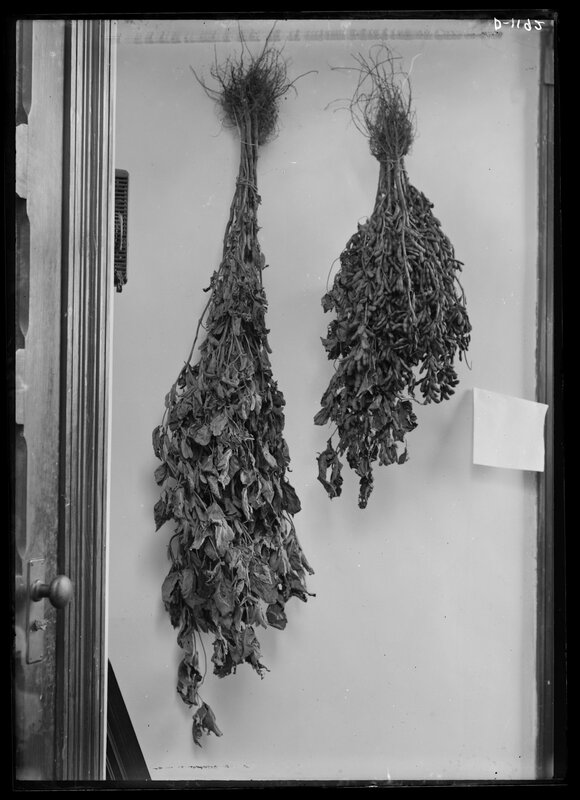 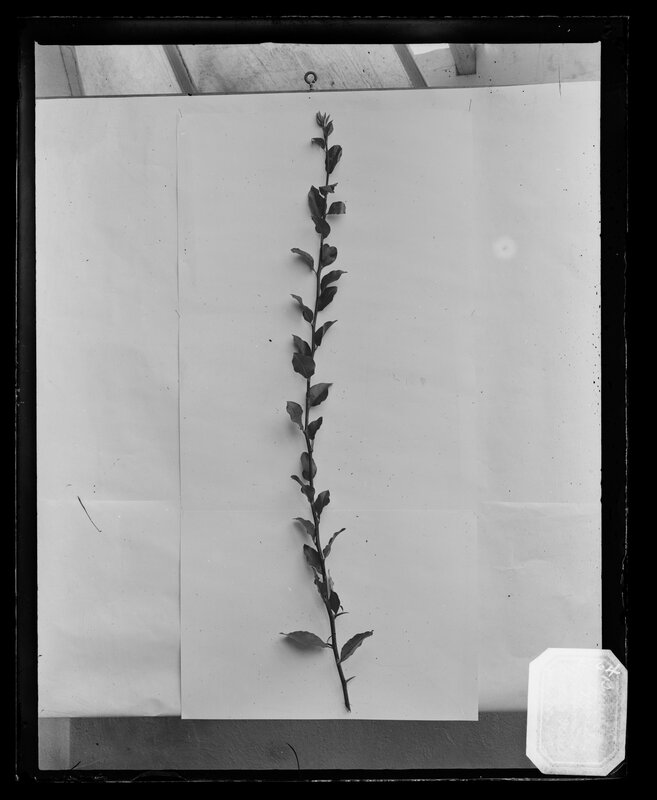 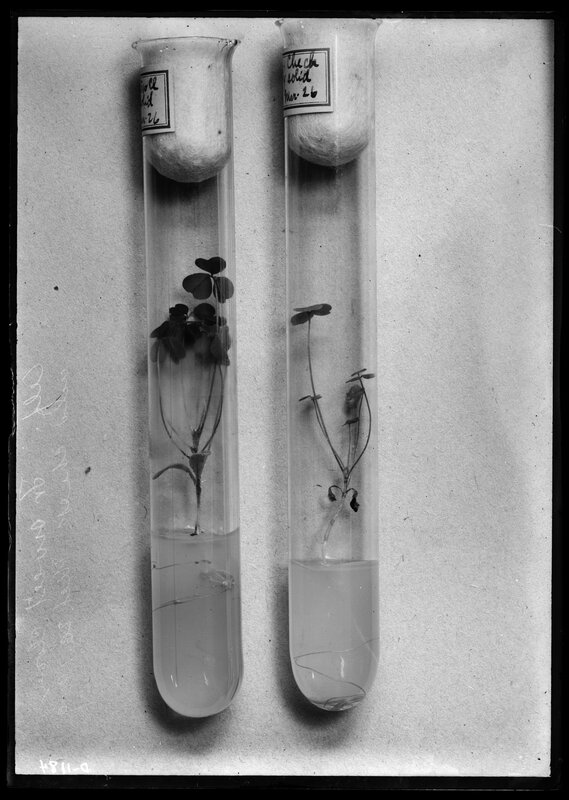 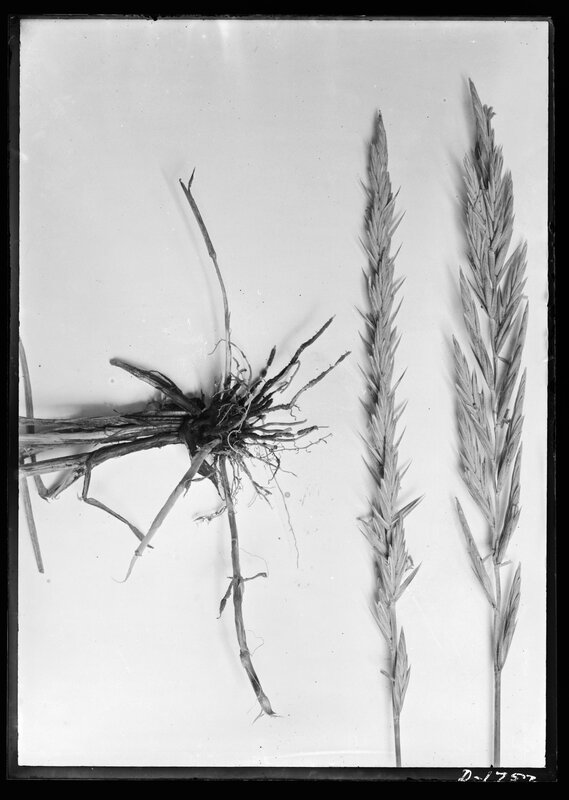 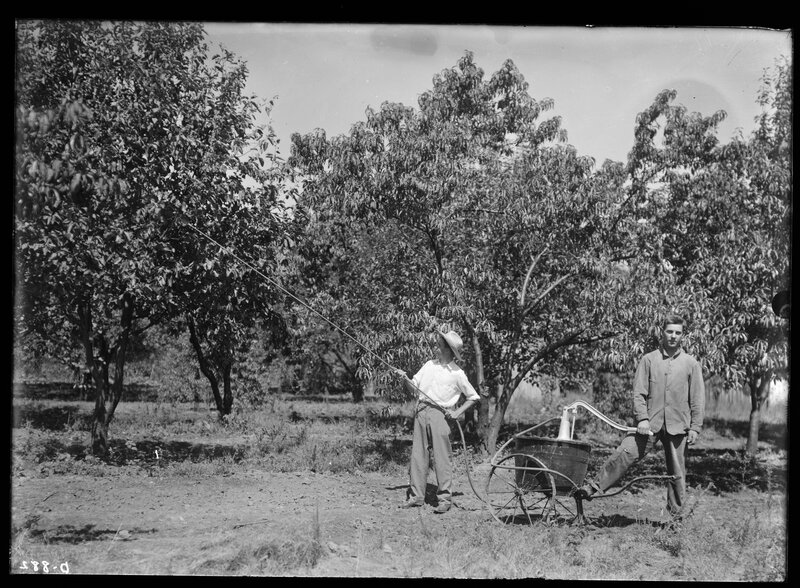 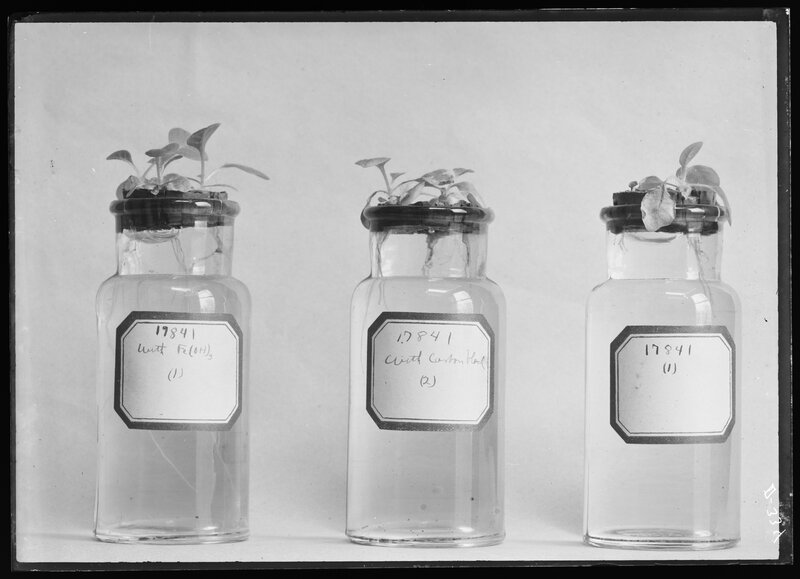 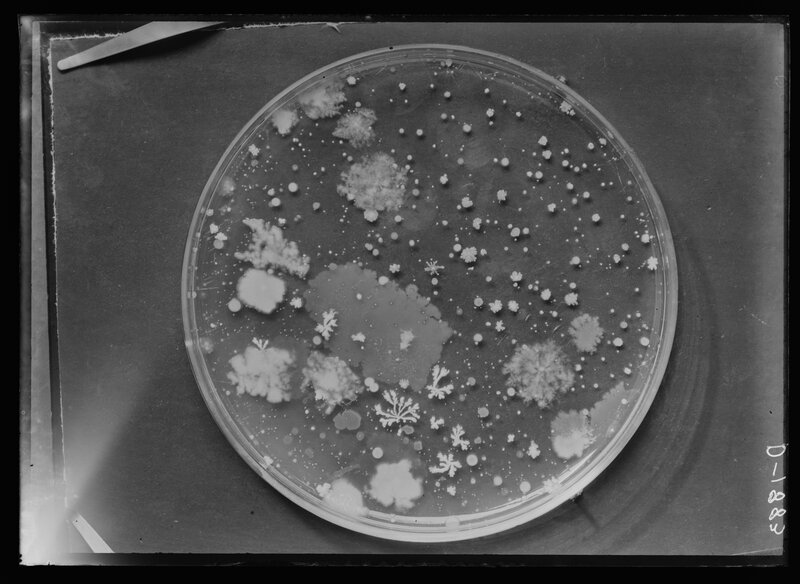 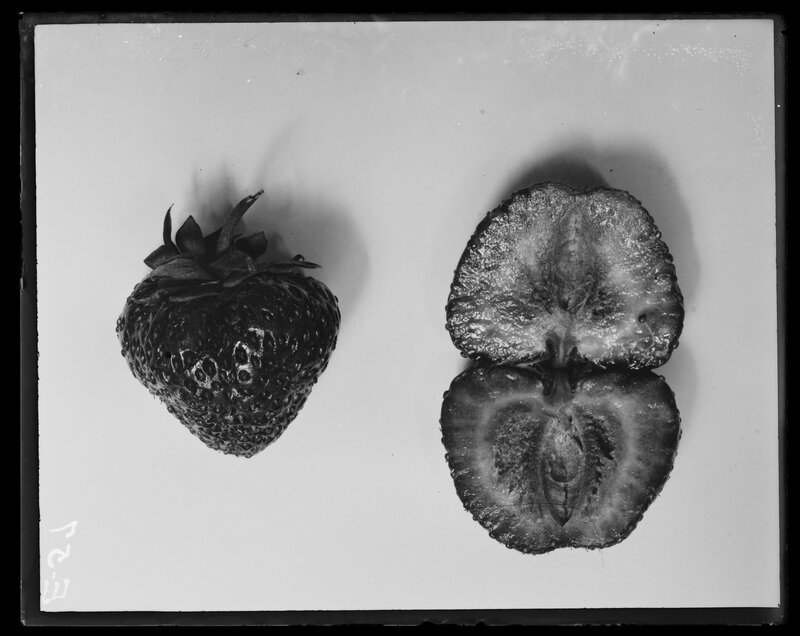 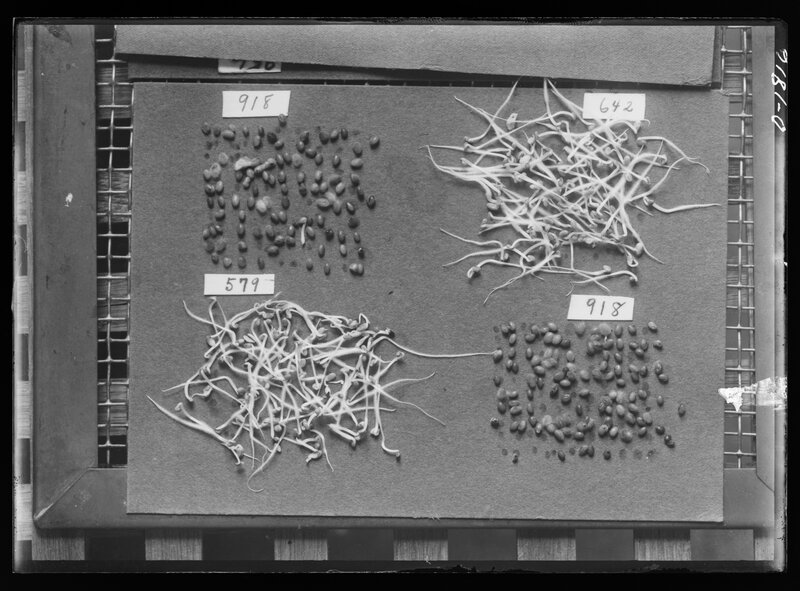 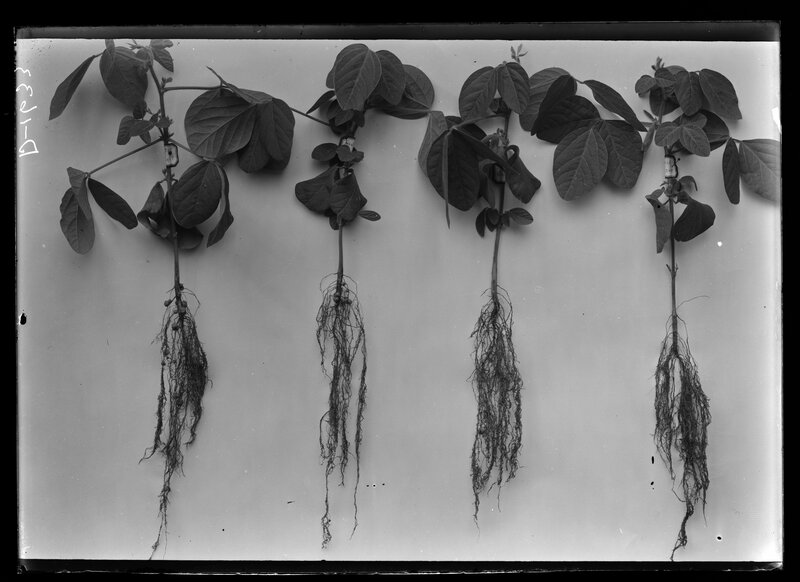 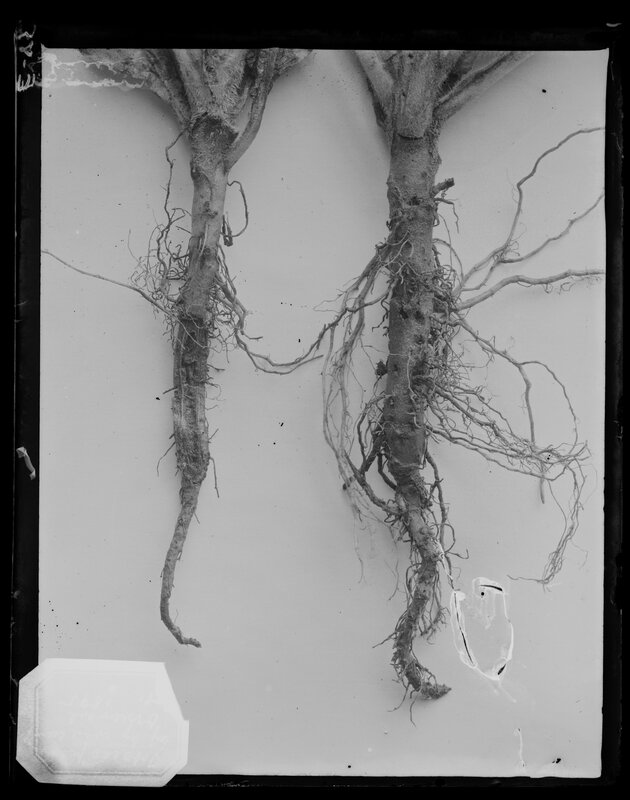 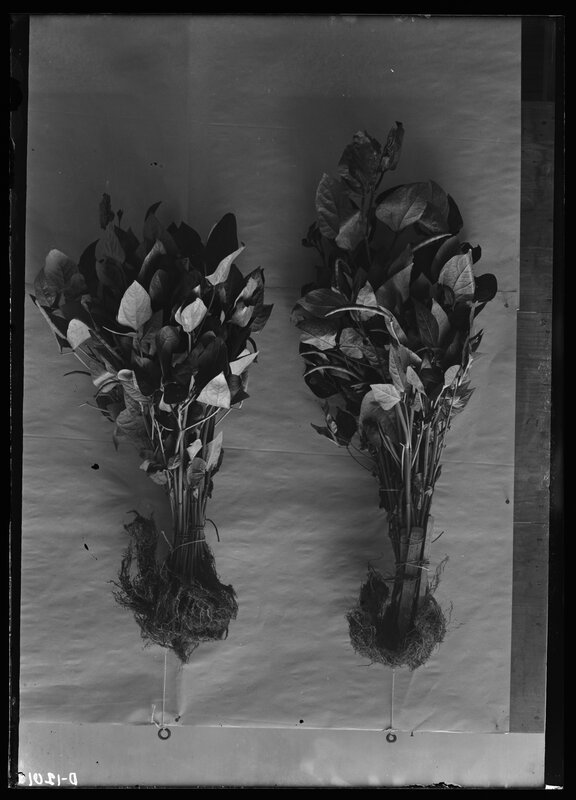 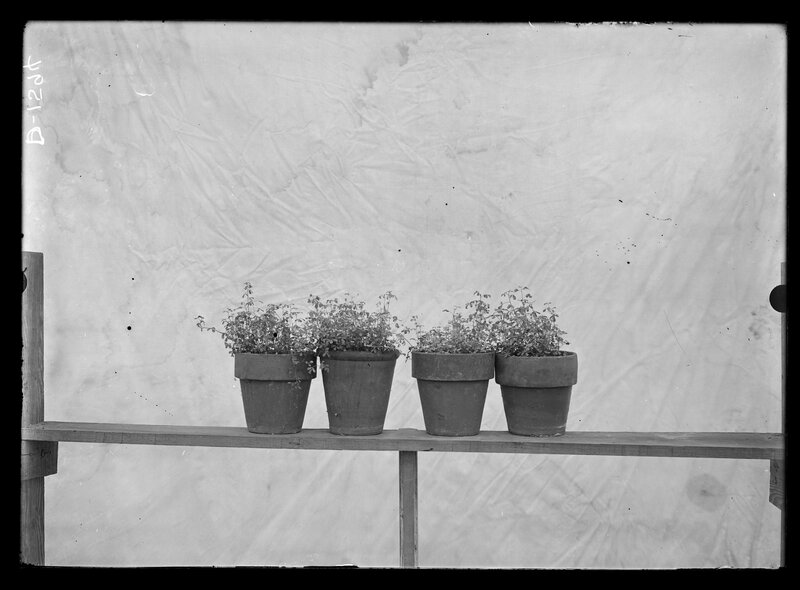 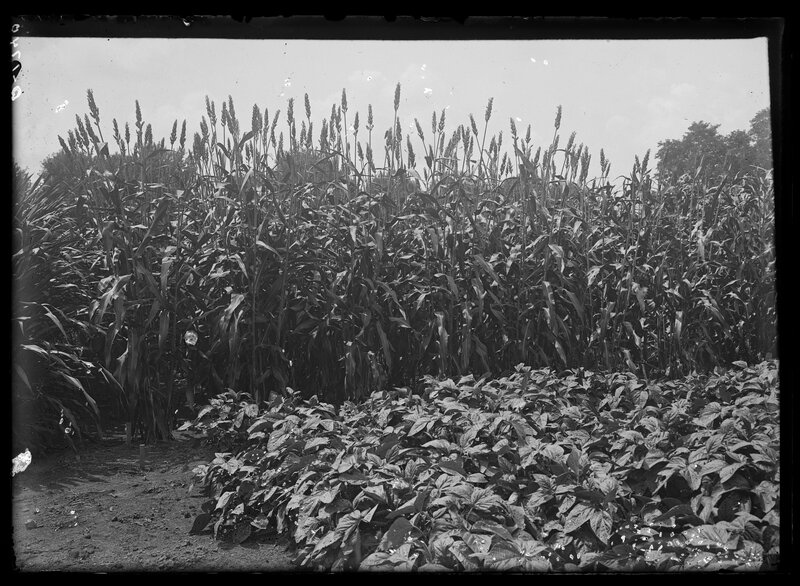 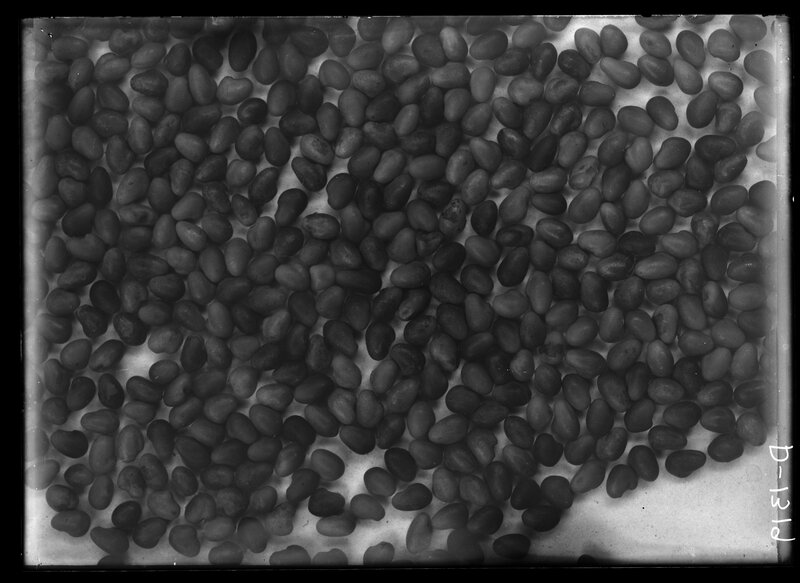 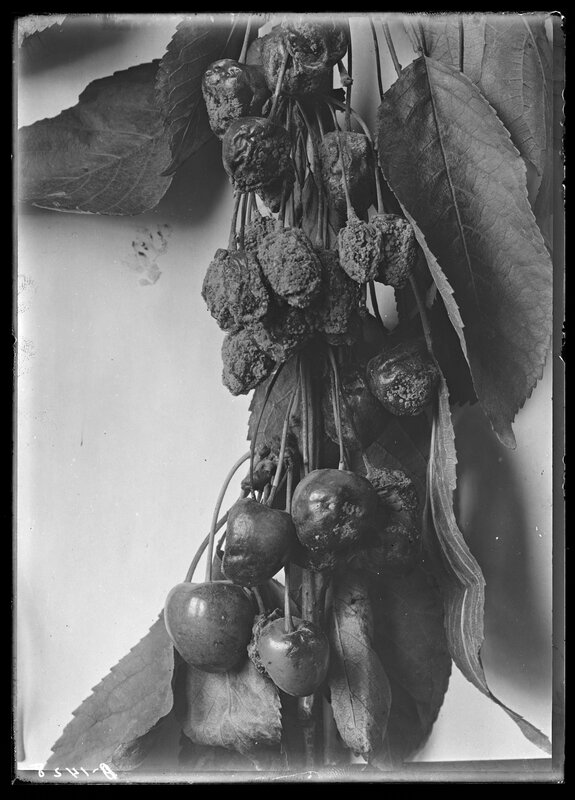 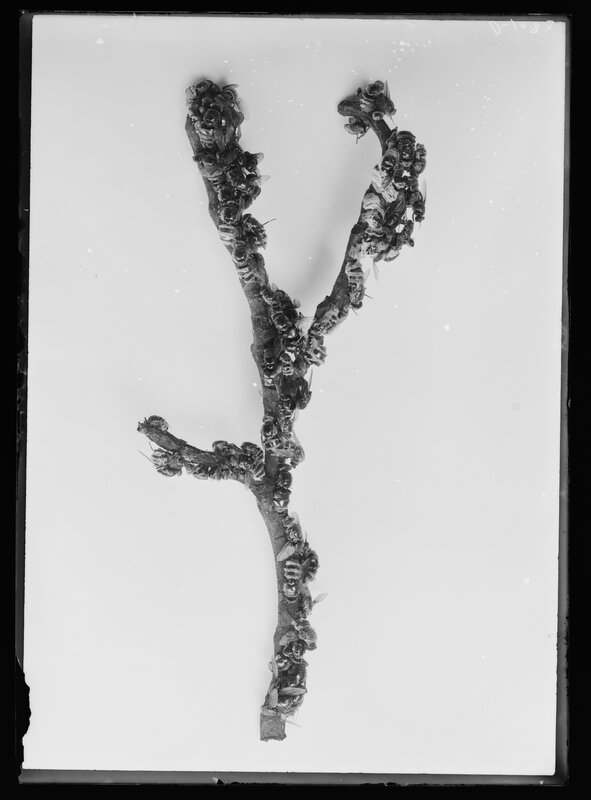 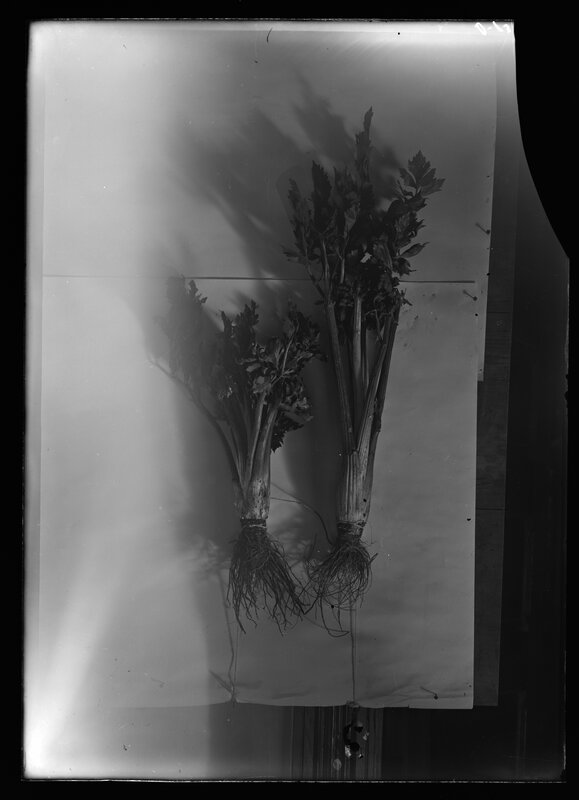 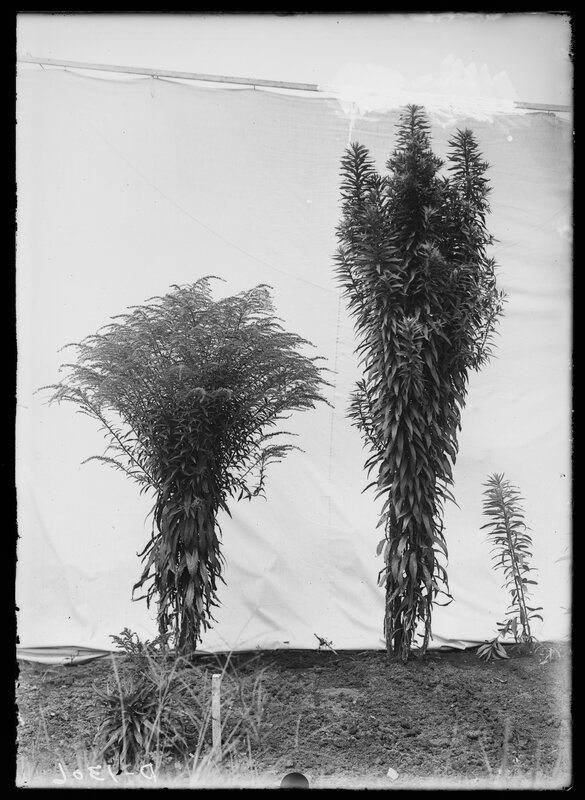 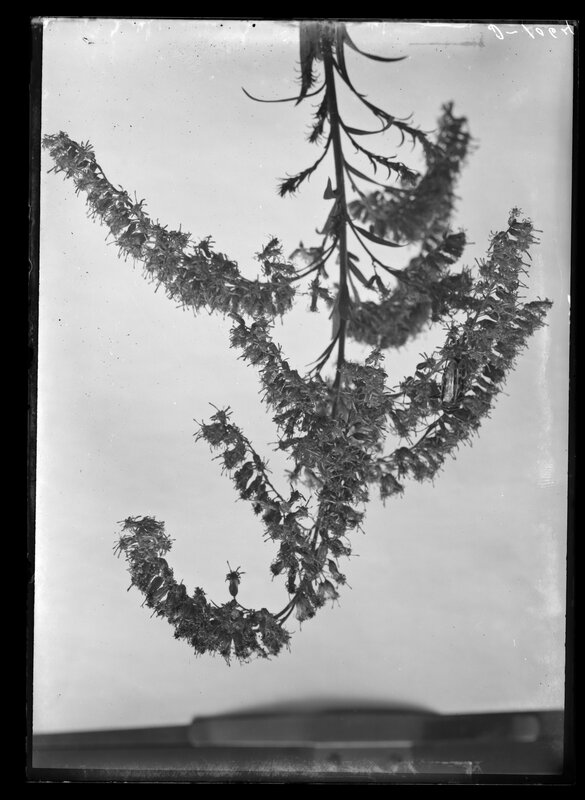 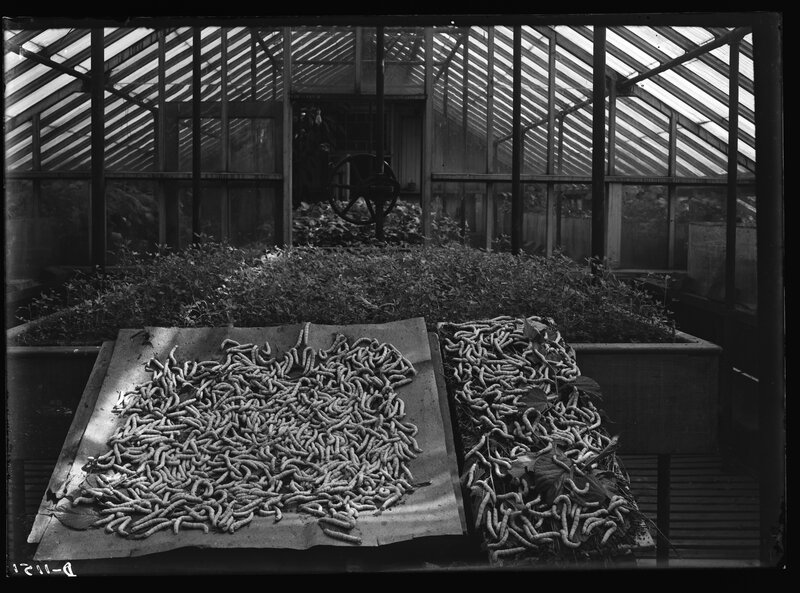 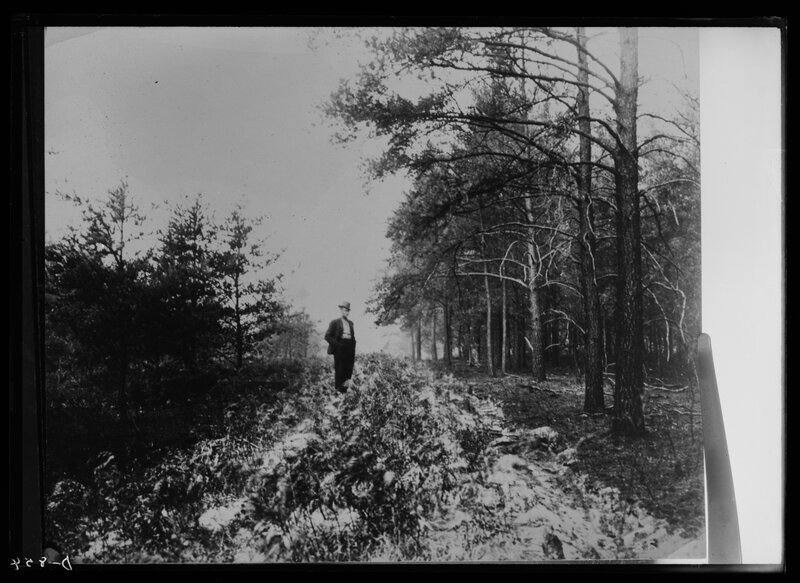 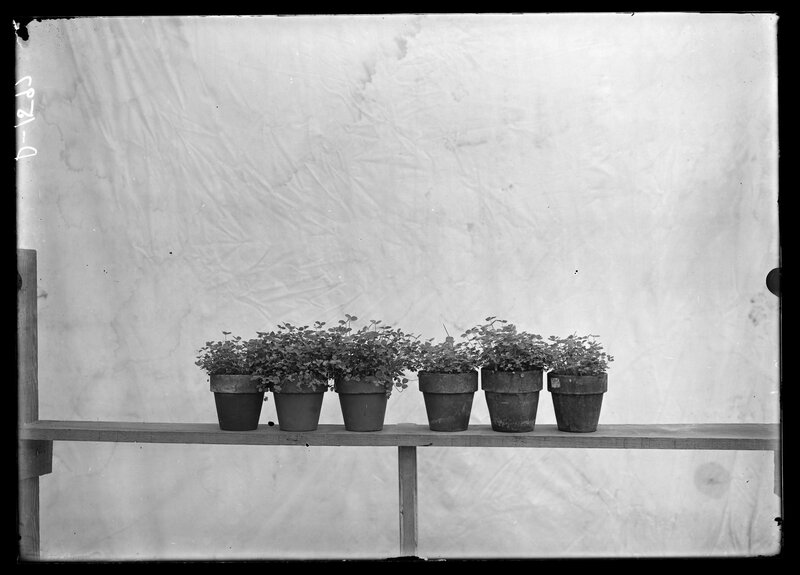 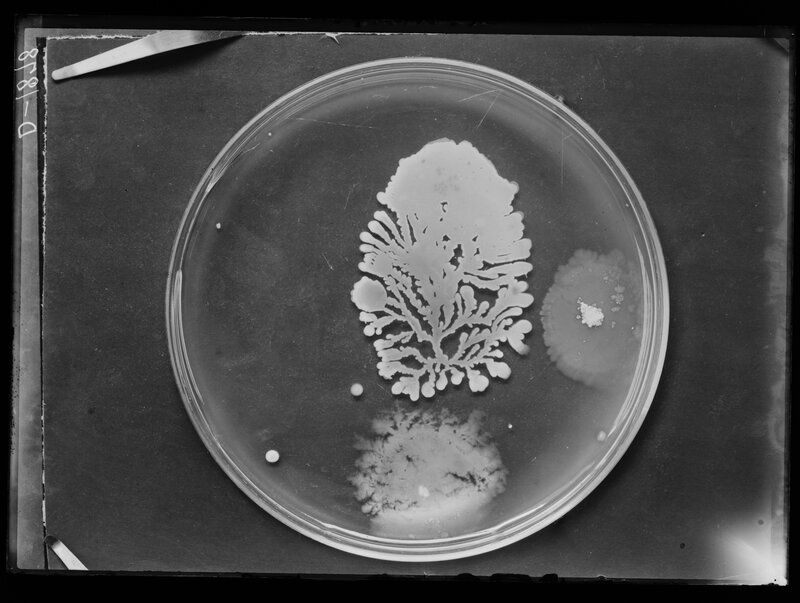 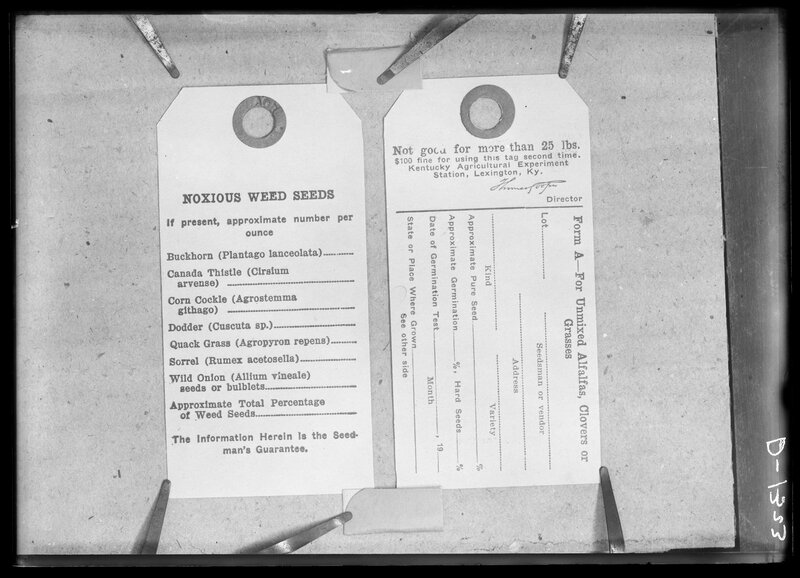 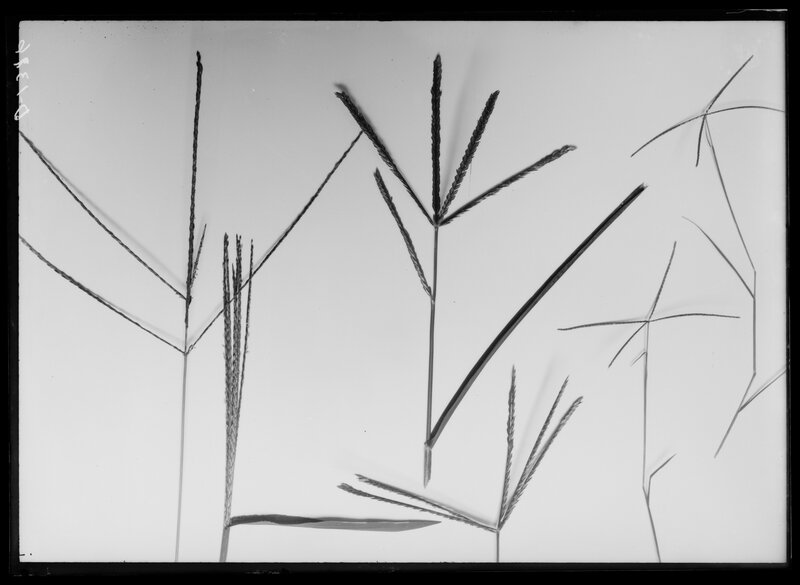 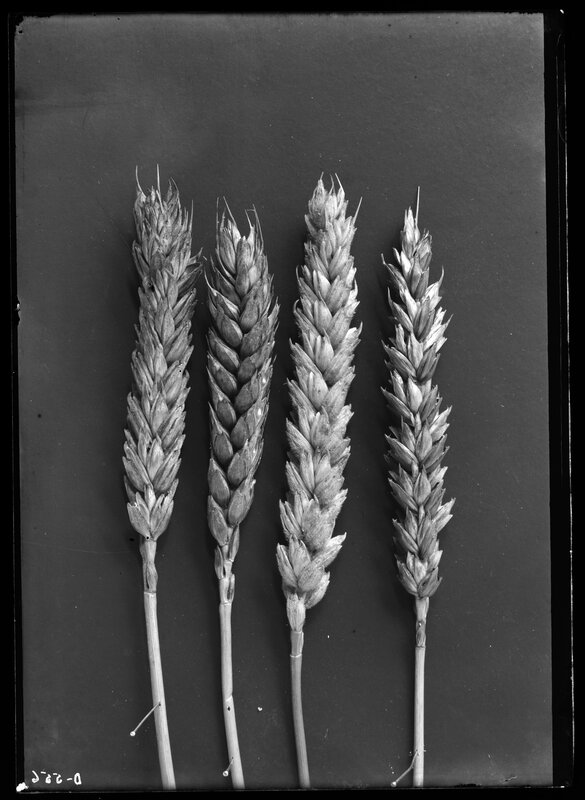 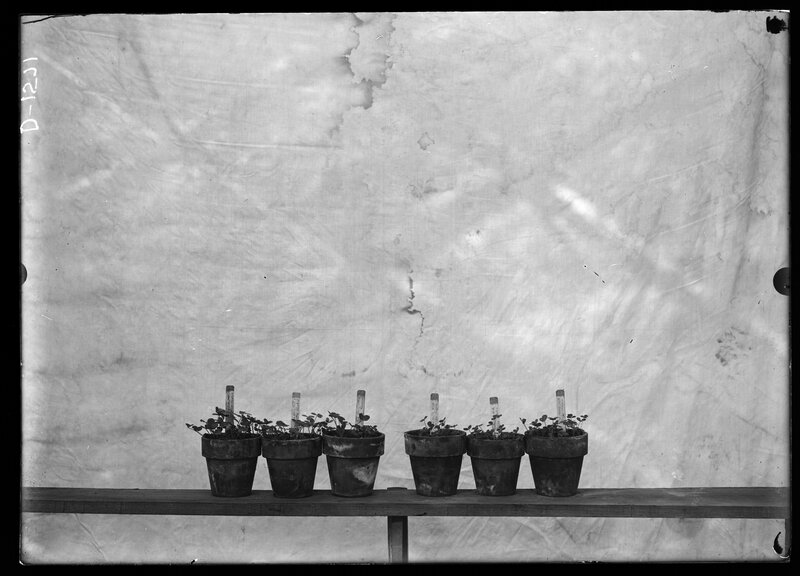 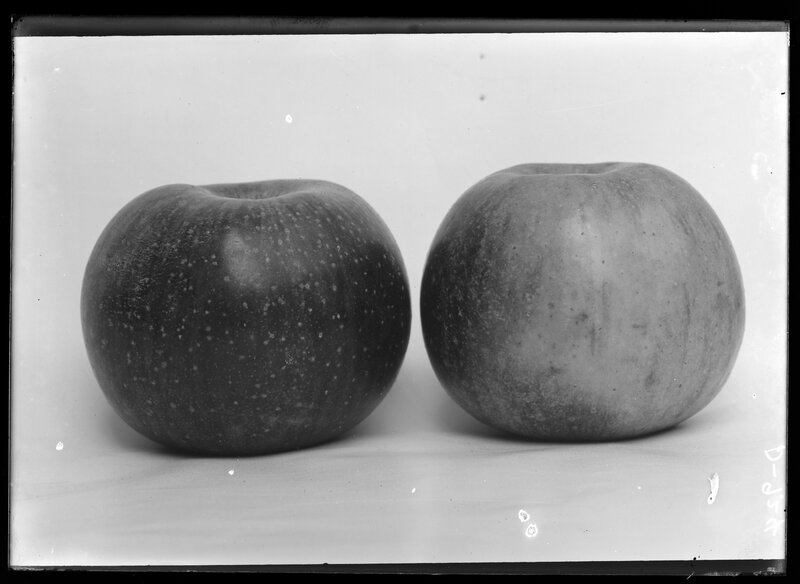 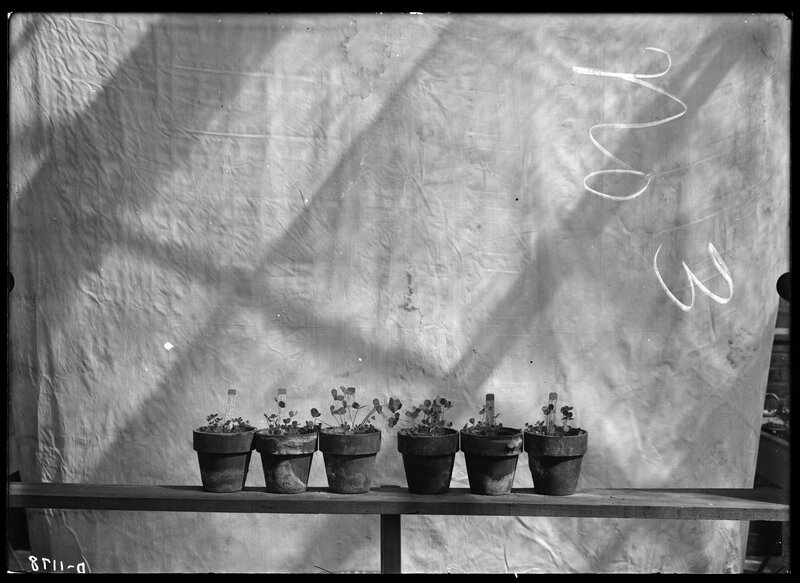 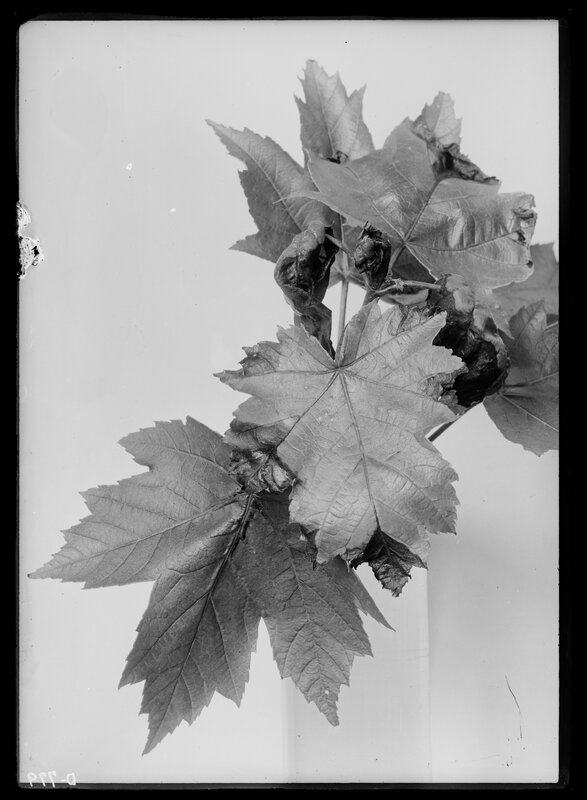 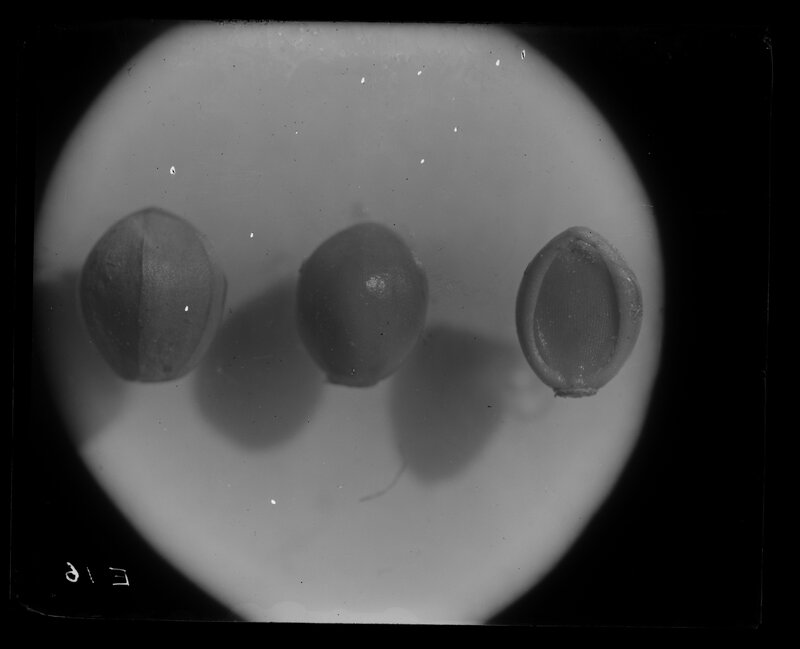 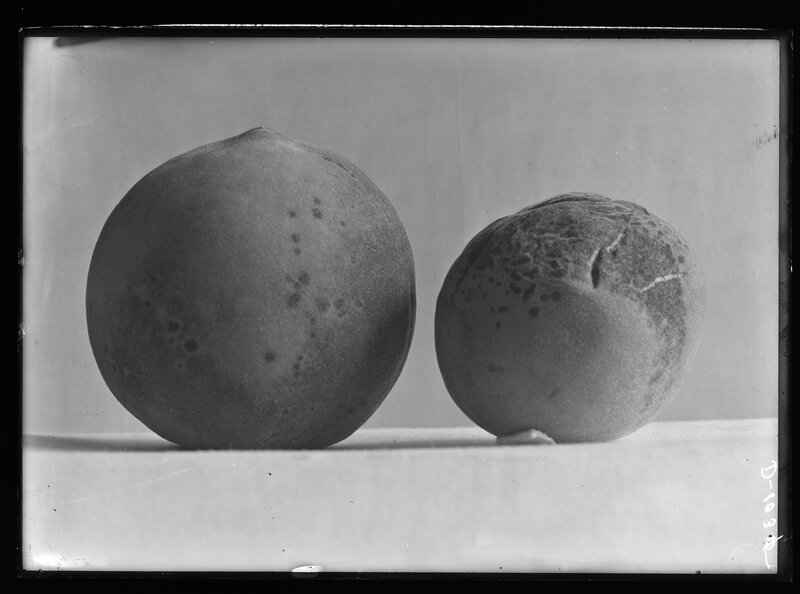 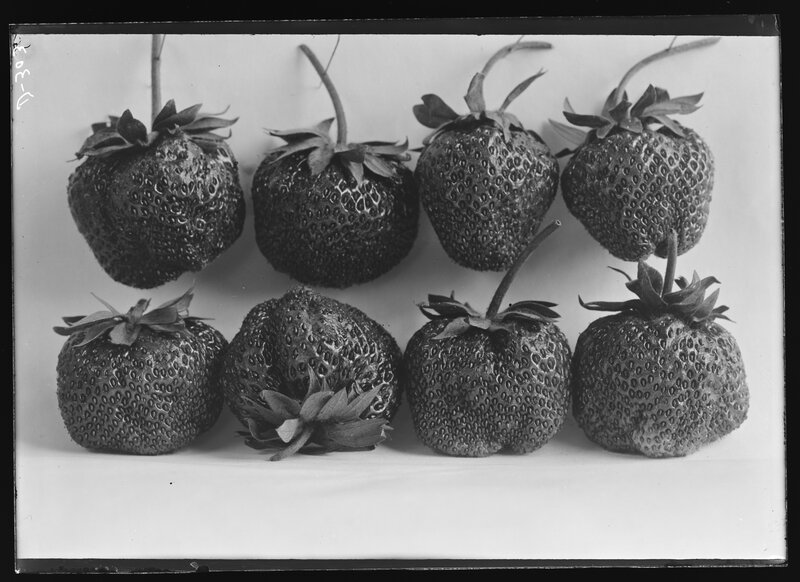 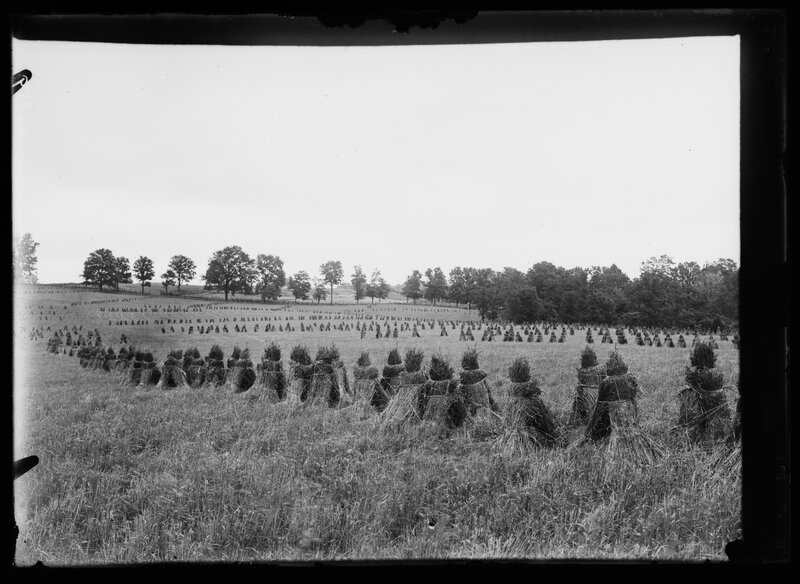 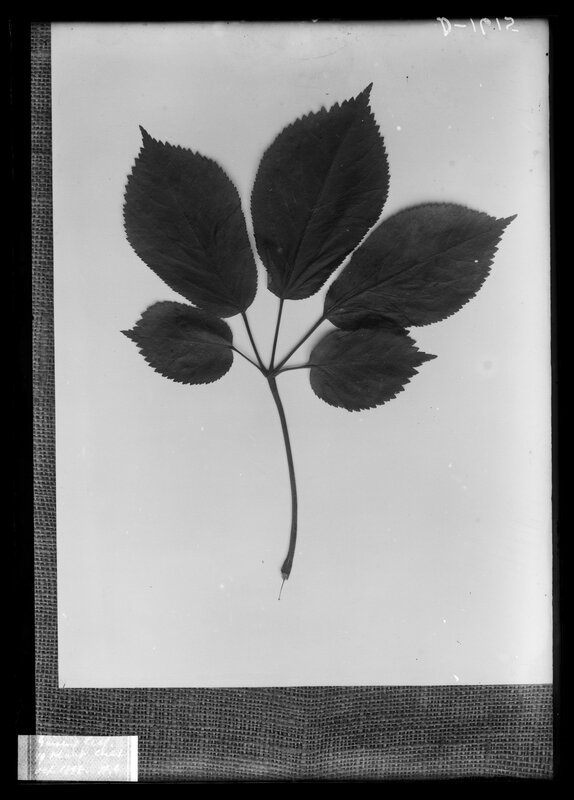 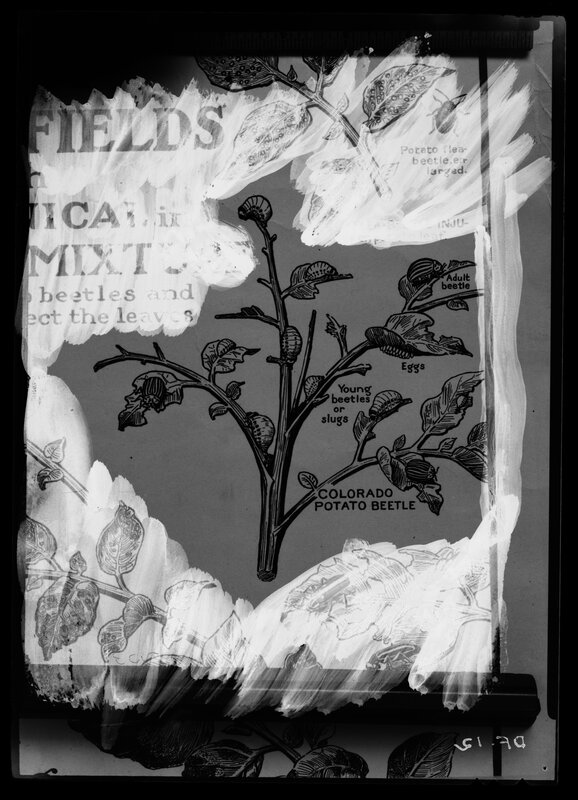 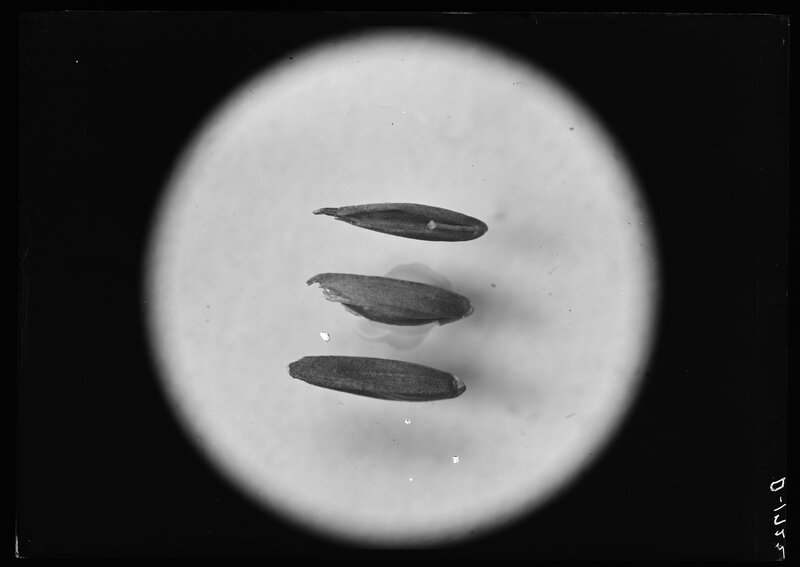 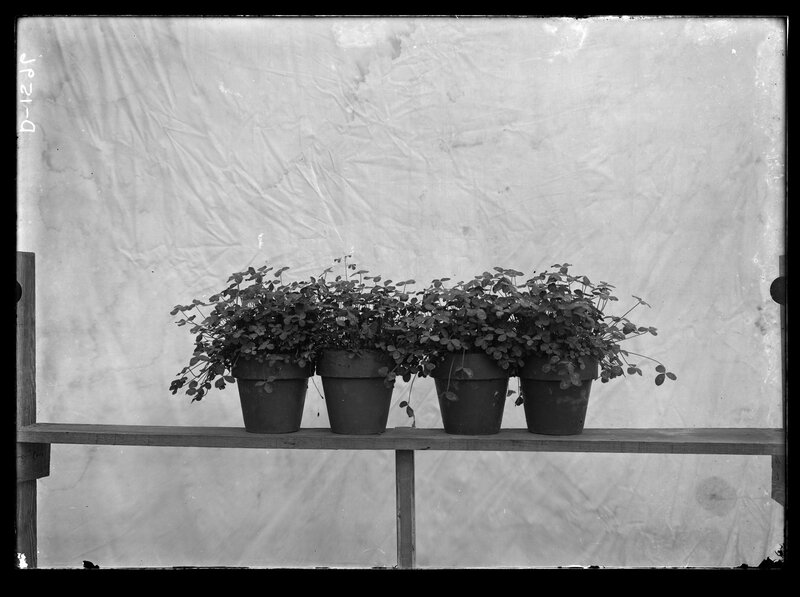 Negatives date from 1895 to 1948, and subject matter includes crops, plant life, insects, and examples of the effects of various diseases on plants and crops. 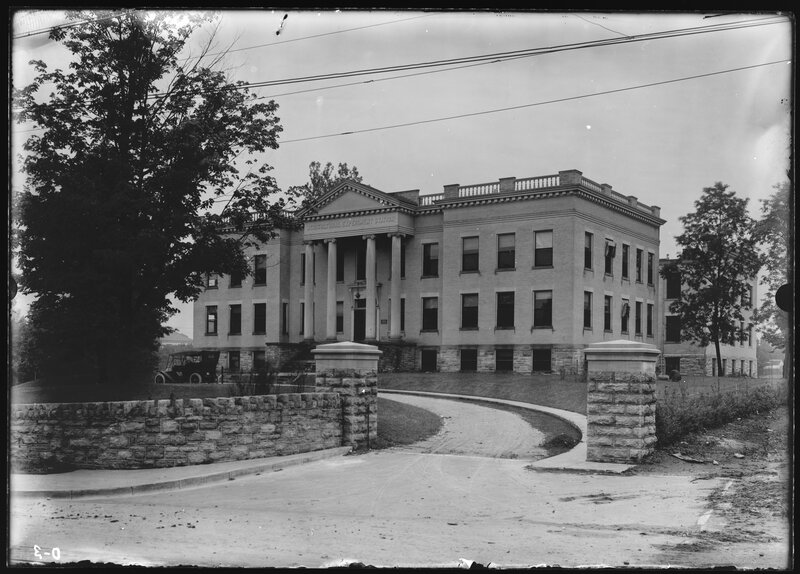 Locations include the University of Kentucky campus in Lexington, other areas in the state of Kentucky, and other states. 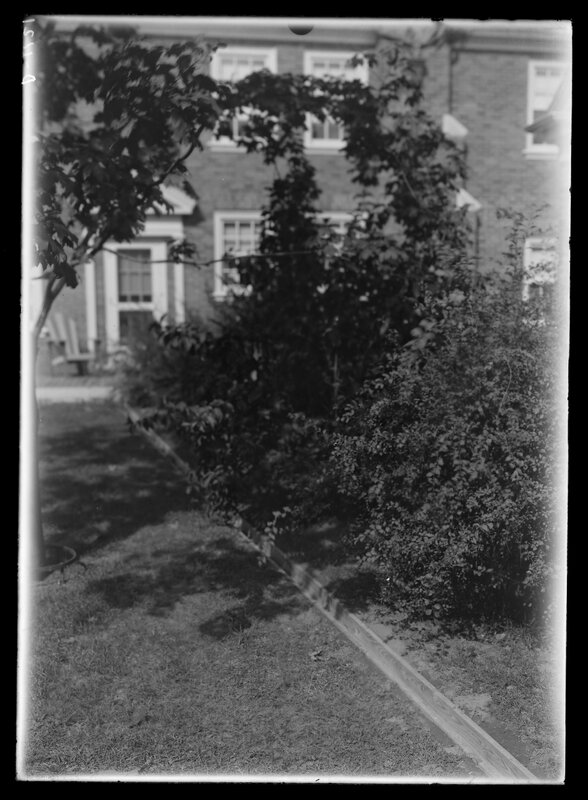 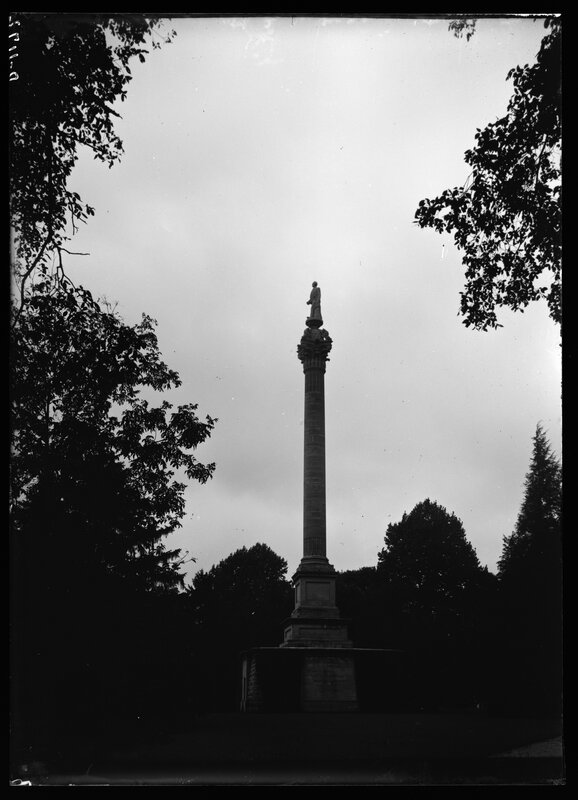 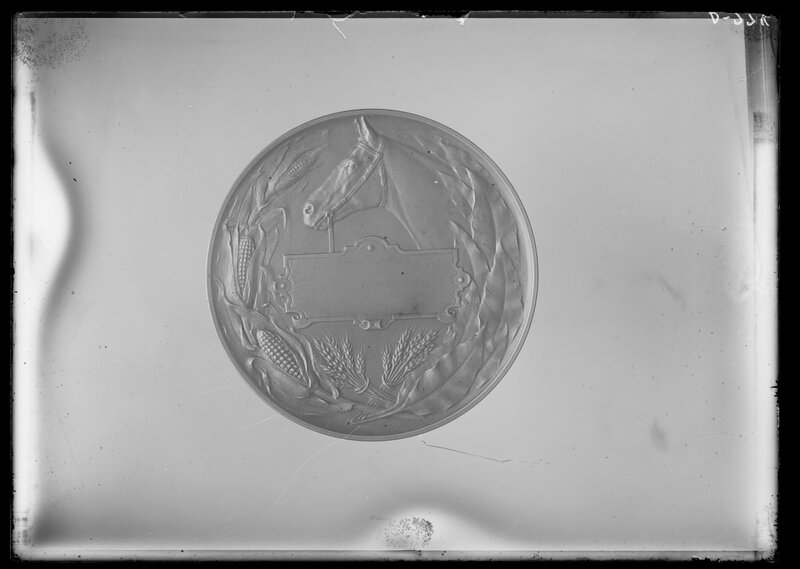 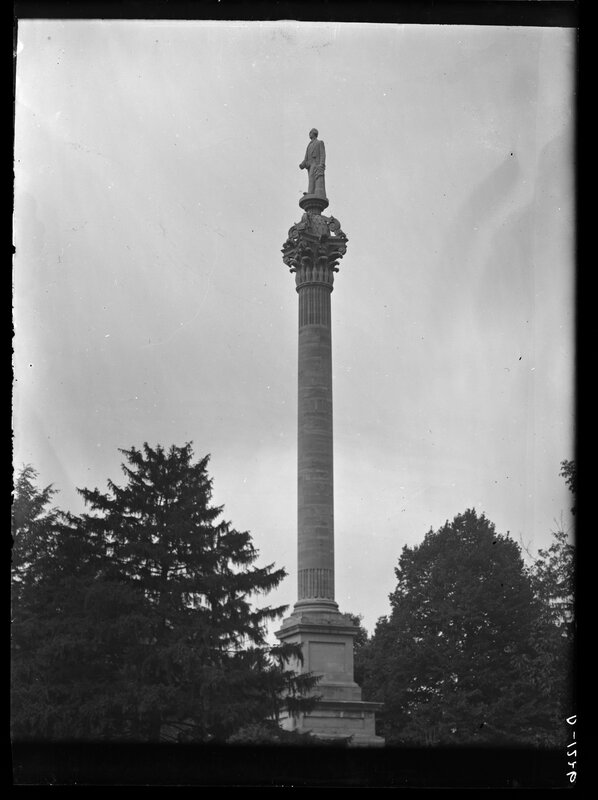 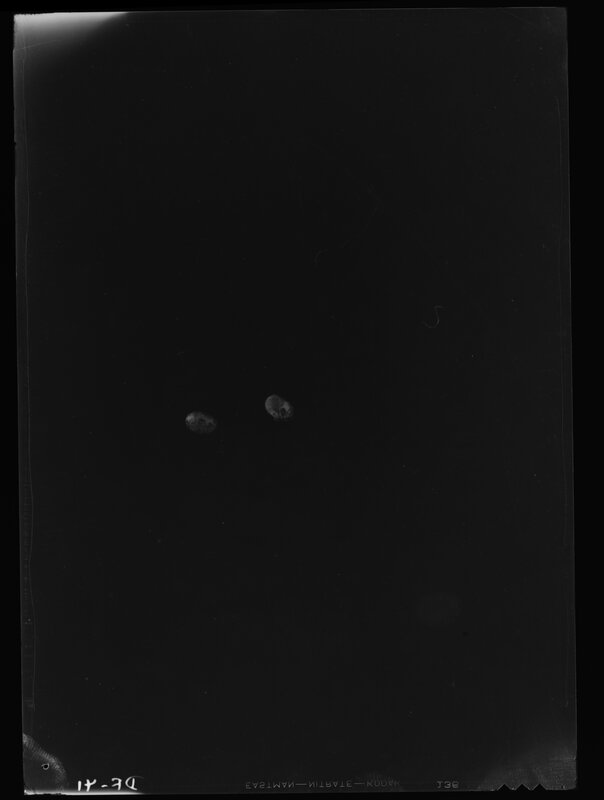 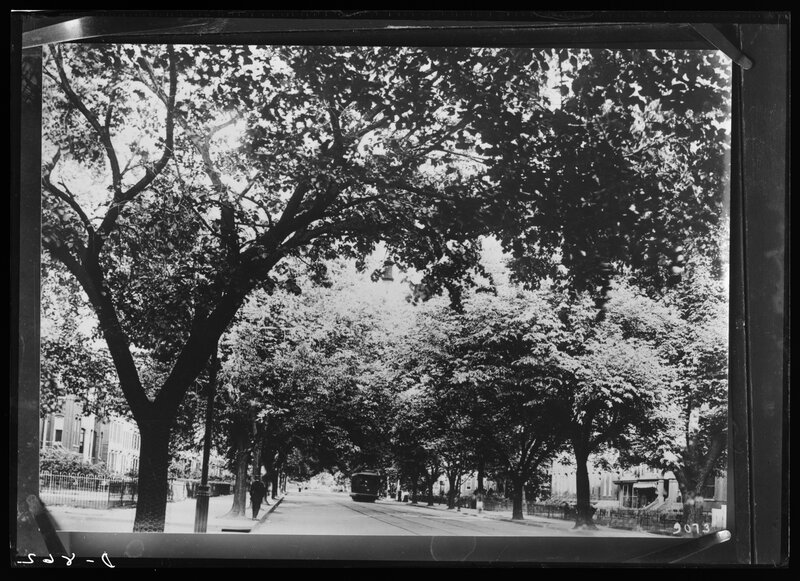 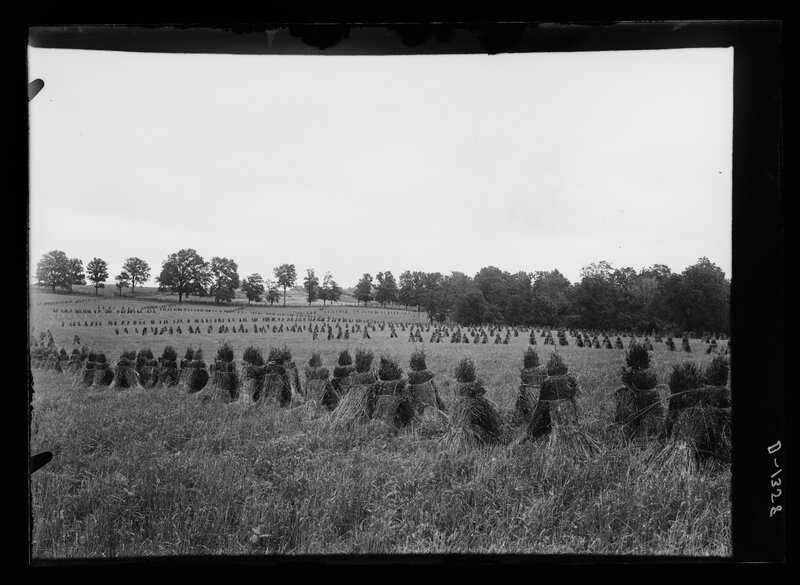 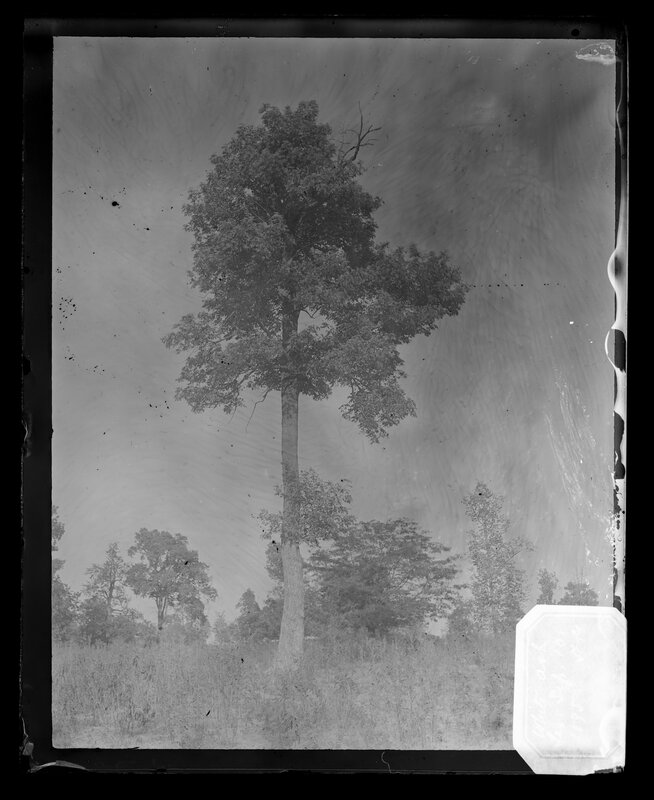 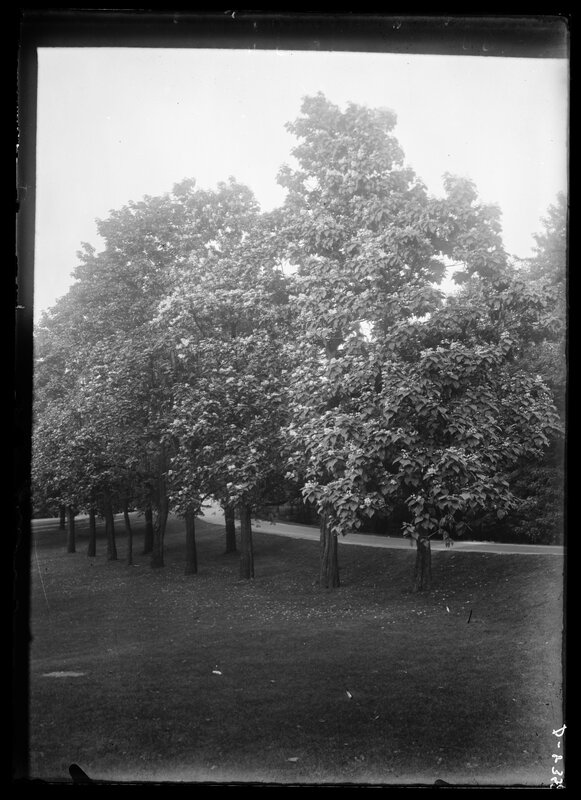 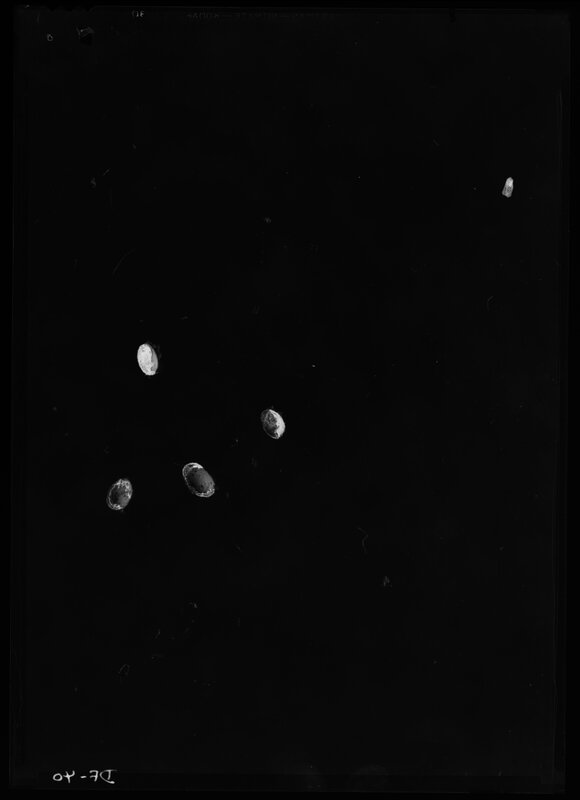 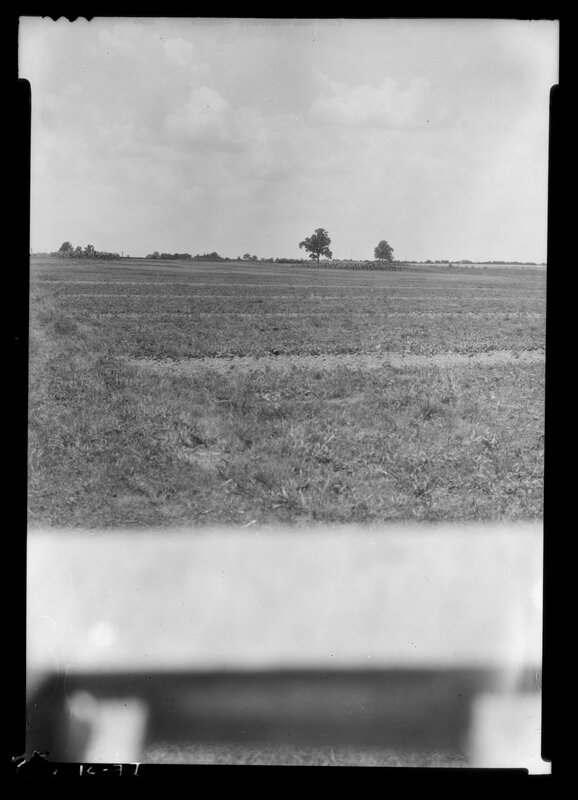 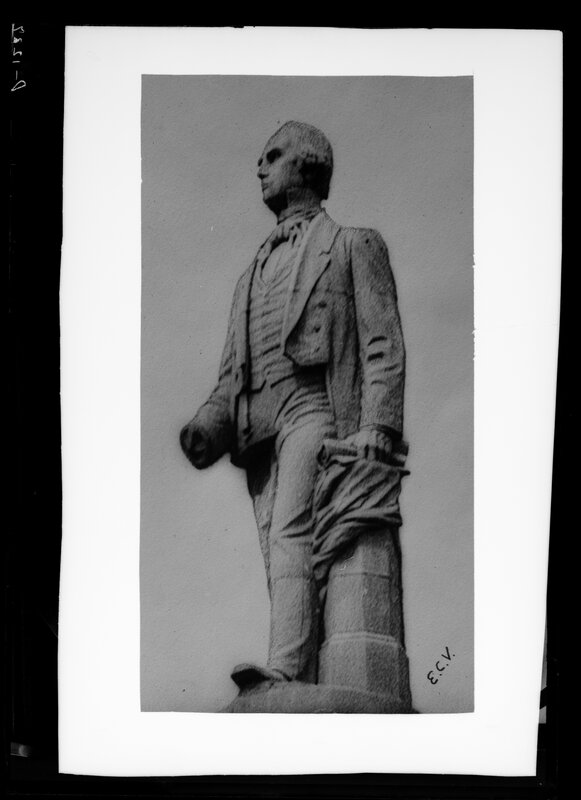 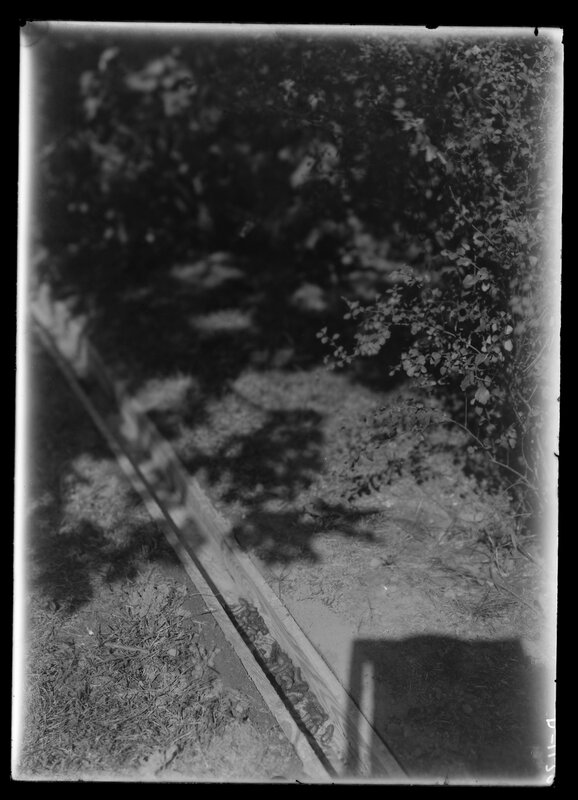 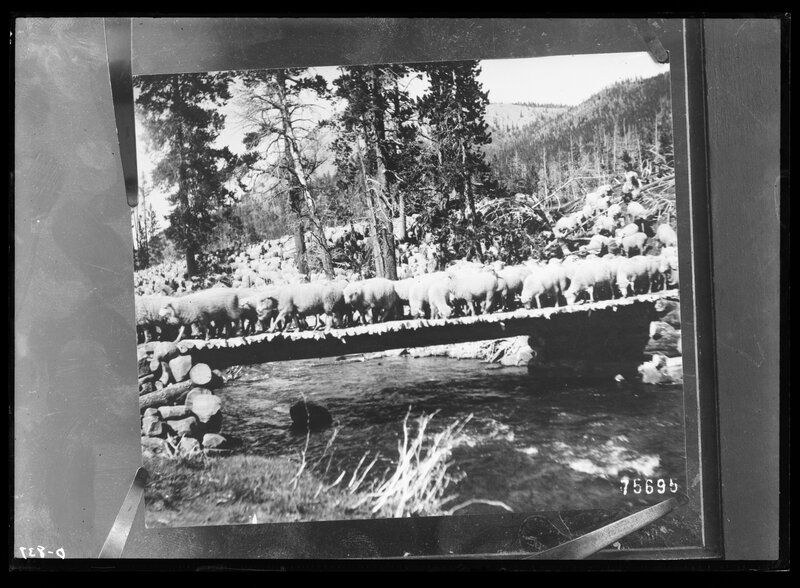 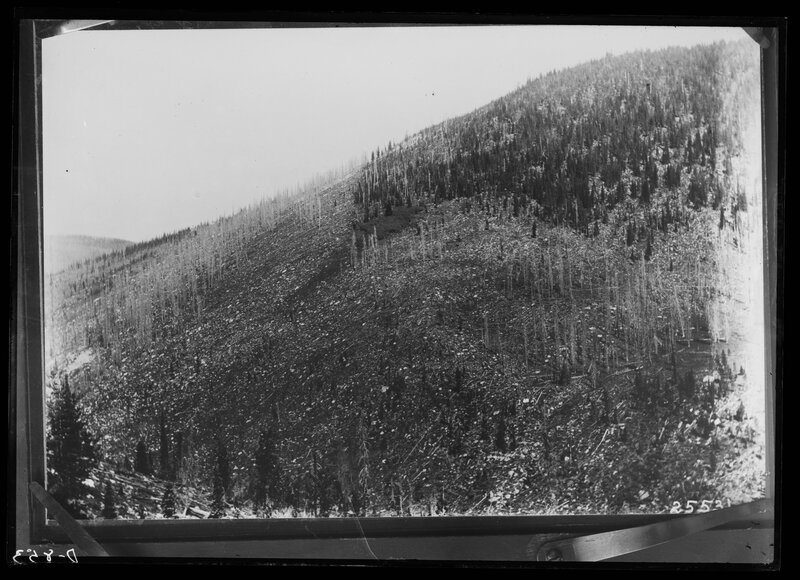 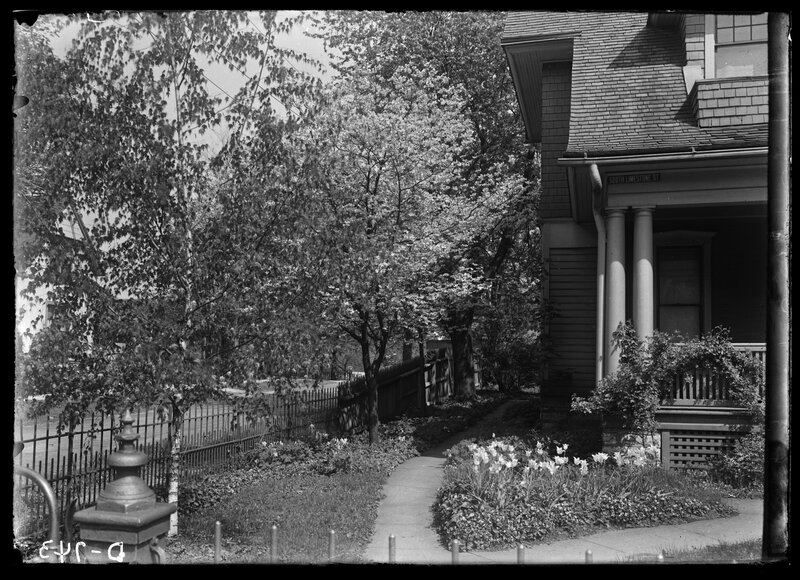 Subseries D consists of nearly 700 5" x 7" glass negatives, taken between 1897-1936. 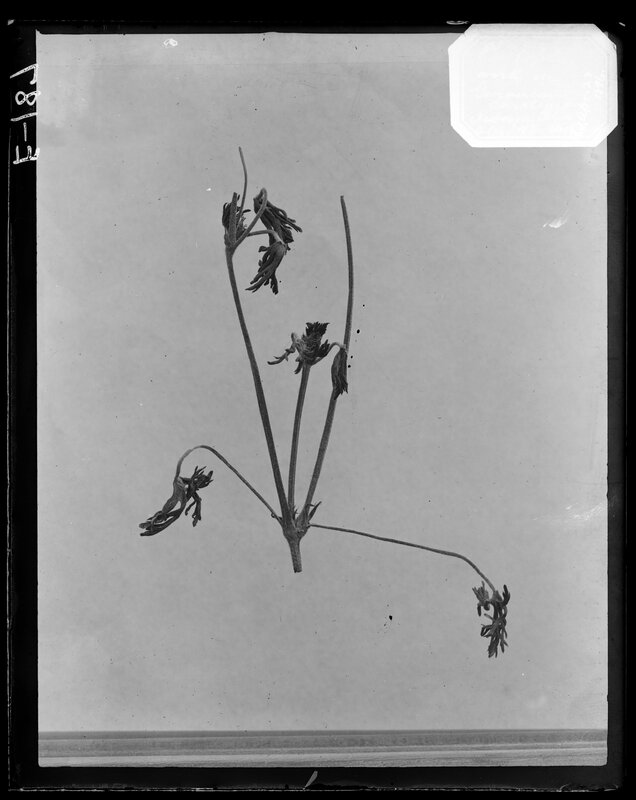 The photographer, when identified, is listed in the scope note. 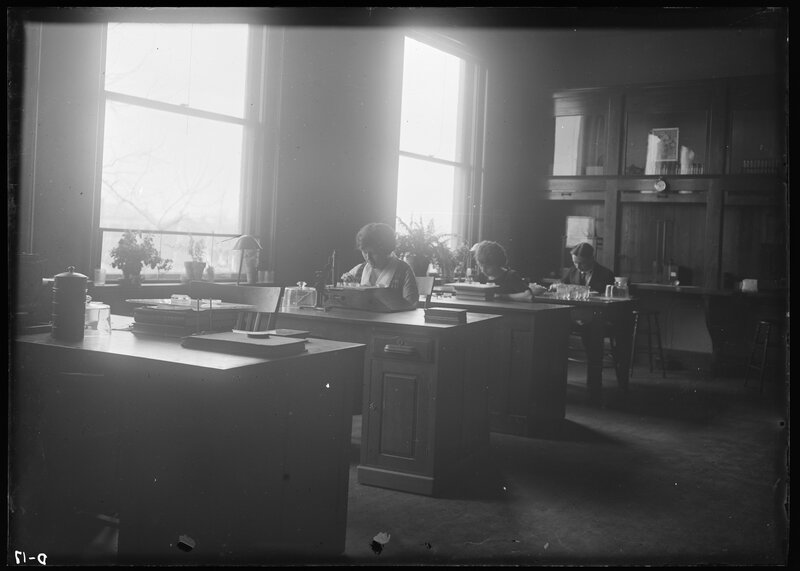 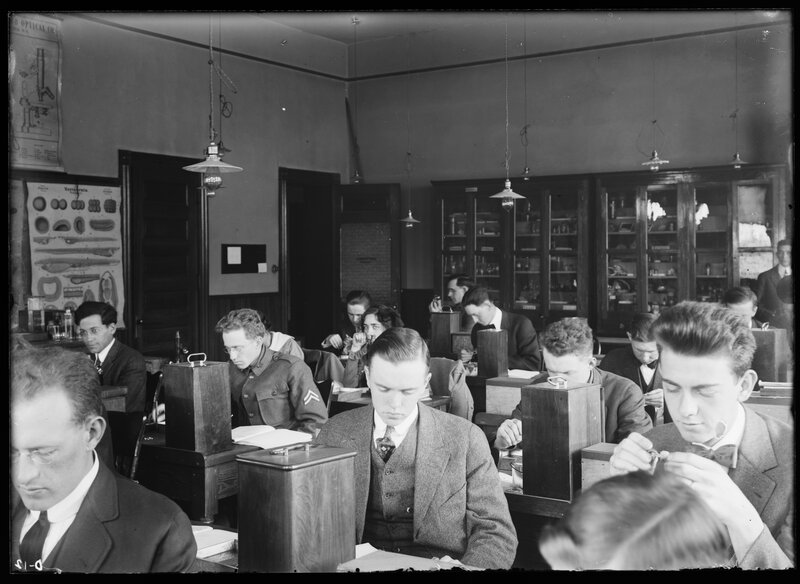 Old seed laboratory general view of workers at the Experiment Station Building. 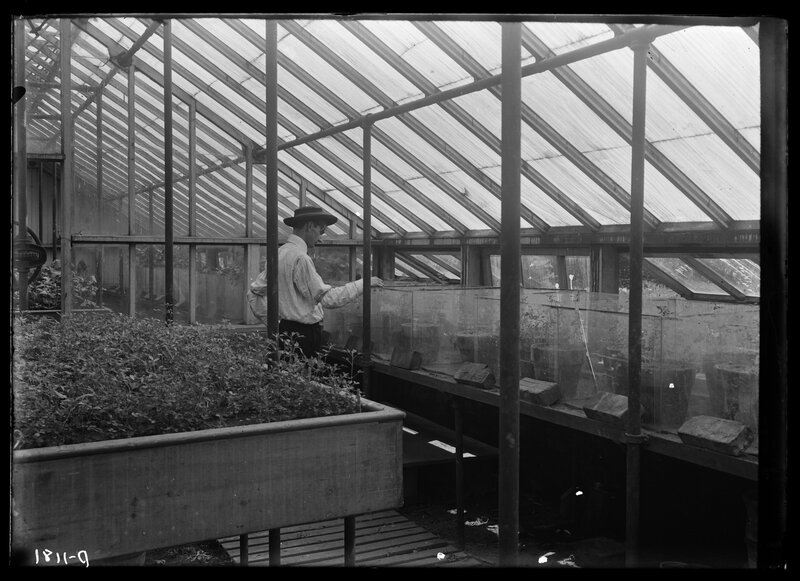 Insect breeding cages used in Vivarium Department of Entomology and Botany. 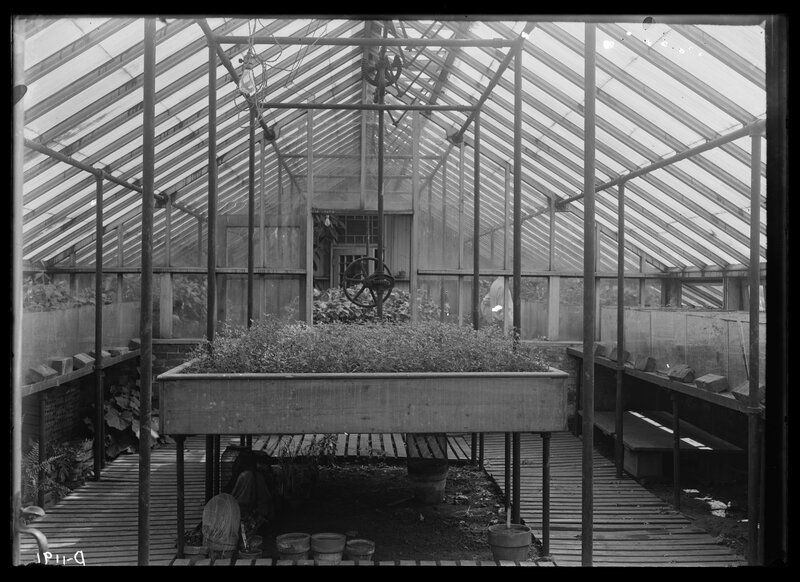 Vivarium, interior at the Agricultural Experiment Station. 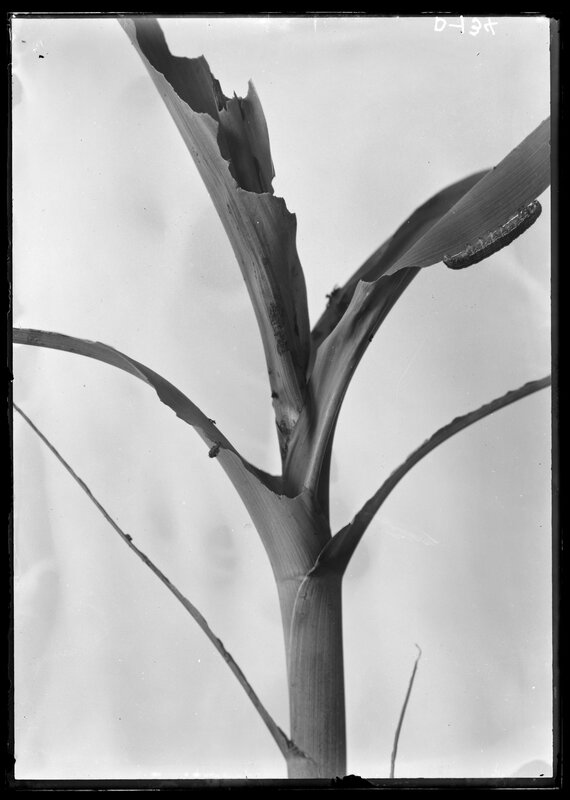 Bean leaf beetle and injury. 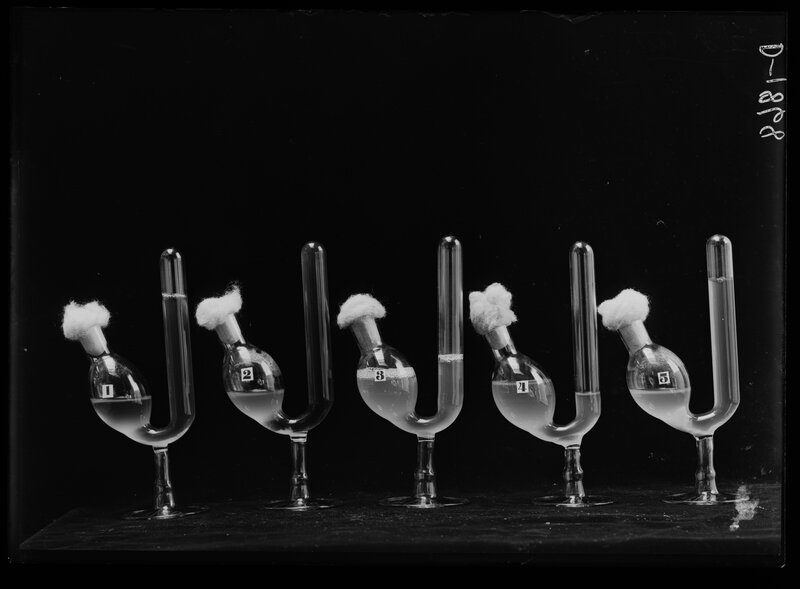 Venturi tube atomizer nozzle designed by Calfee. 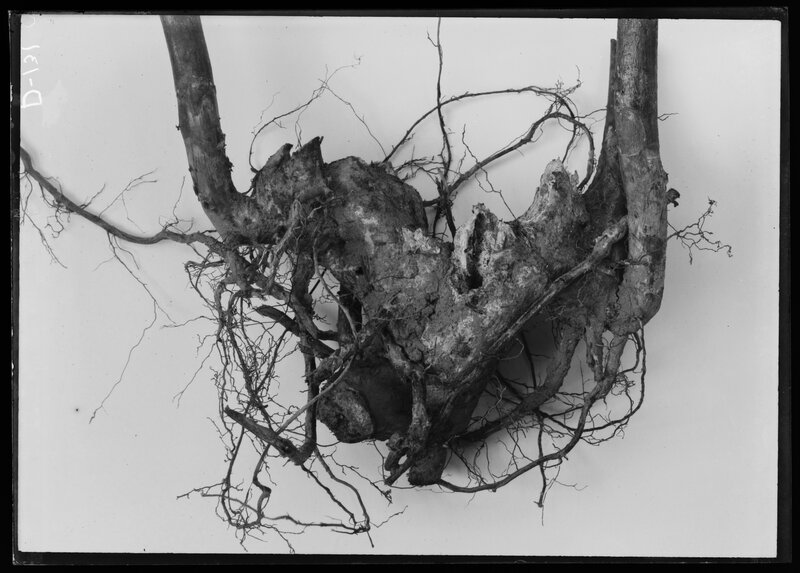 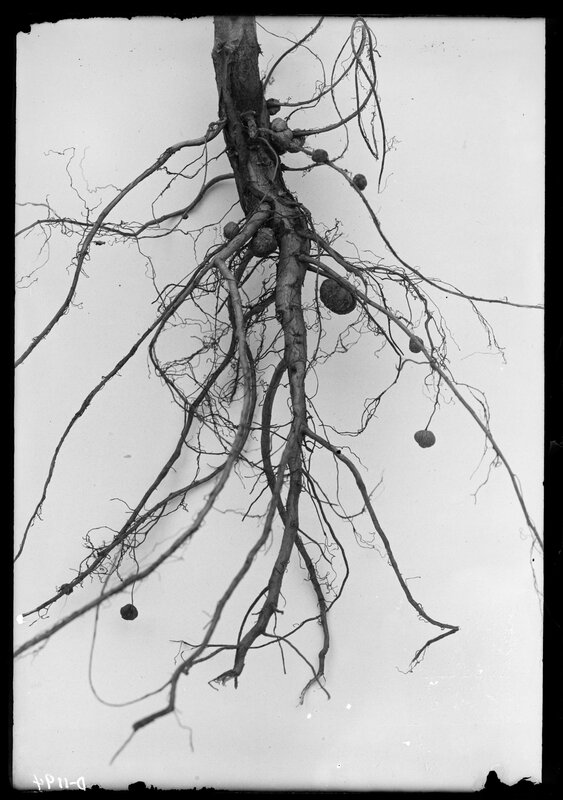 Apple roots showing crown gall. 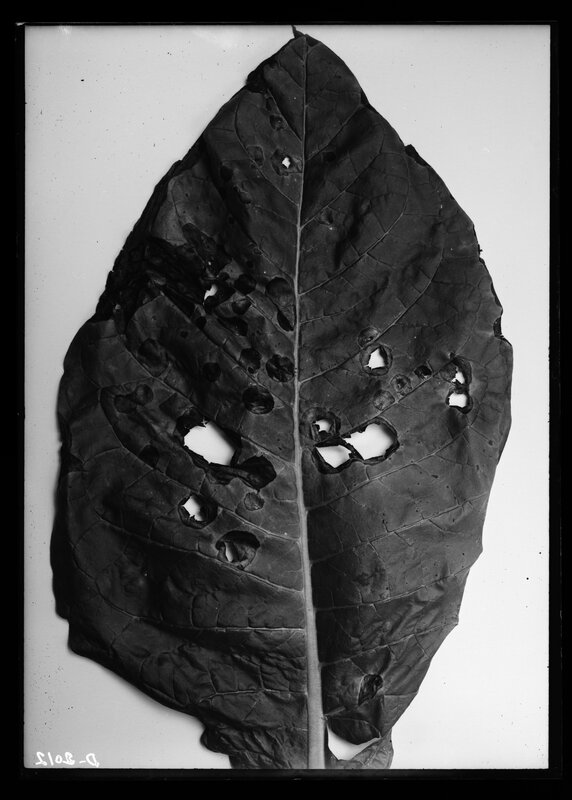 Peach shot-hole fungus (enlargement of injured peach leaf). 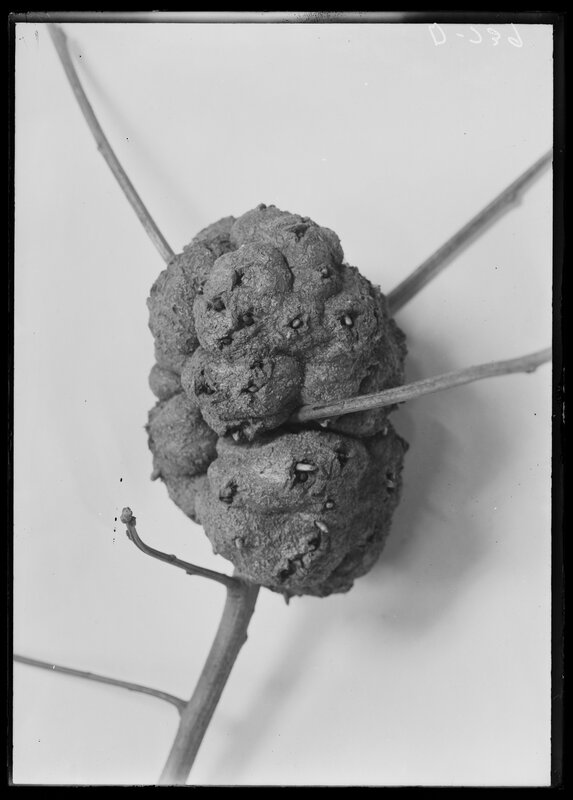 Wooly aphid galls in roots of apple, natural size in Winchester, Kentucky. 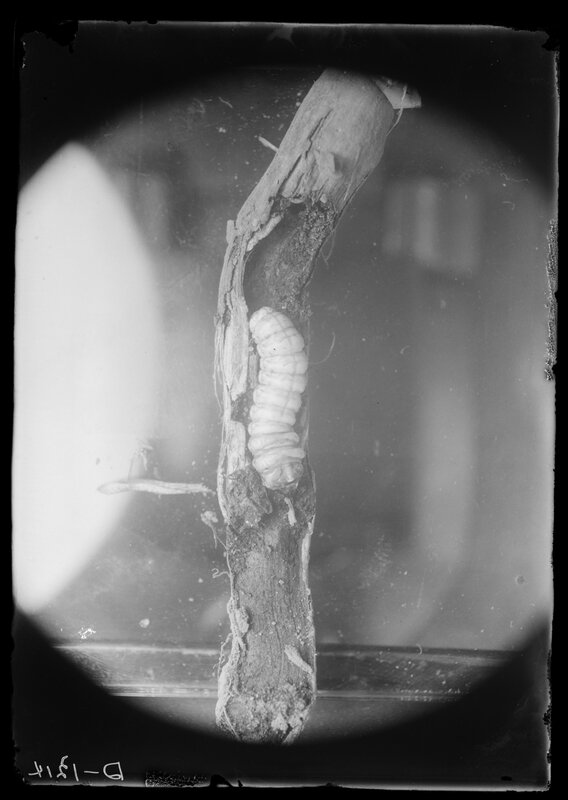 Silk worm ready to spin in Viv. 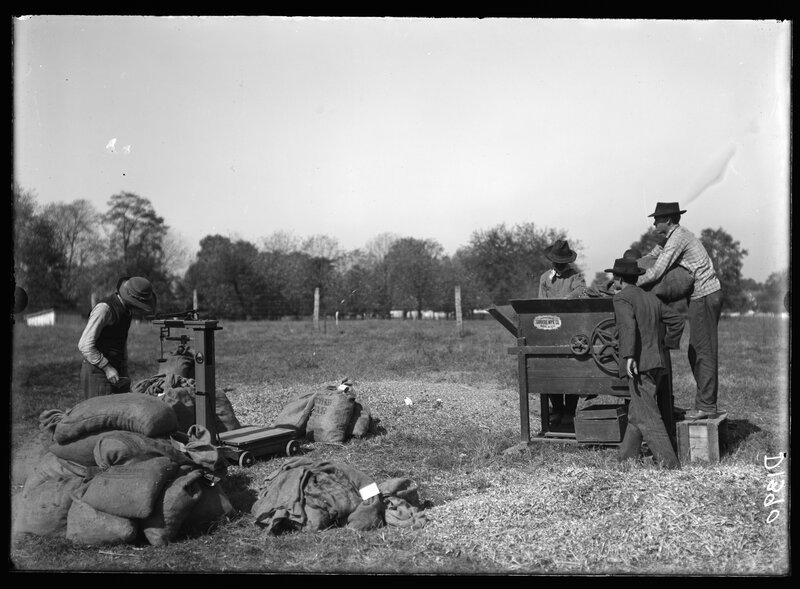 Threshing oats at Experiment farm. 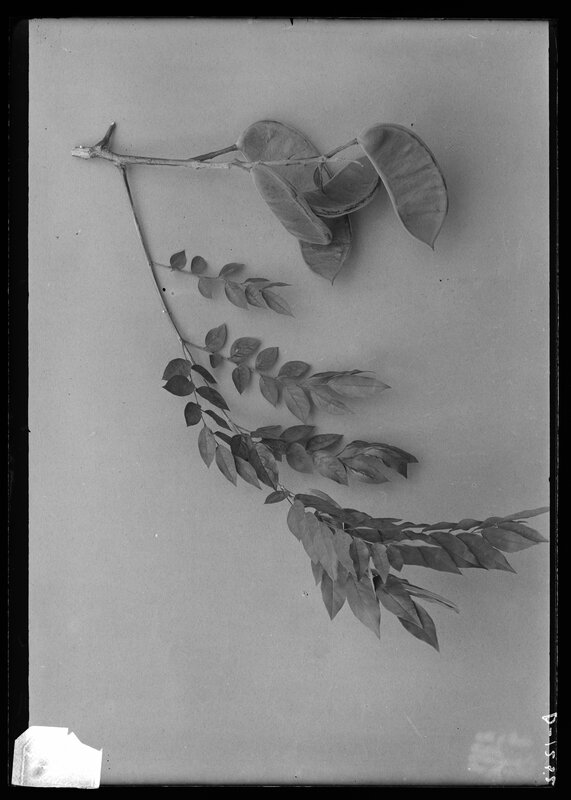 Kentucky coffee tree leaf & fruit. 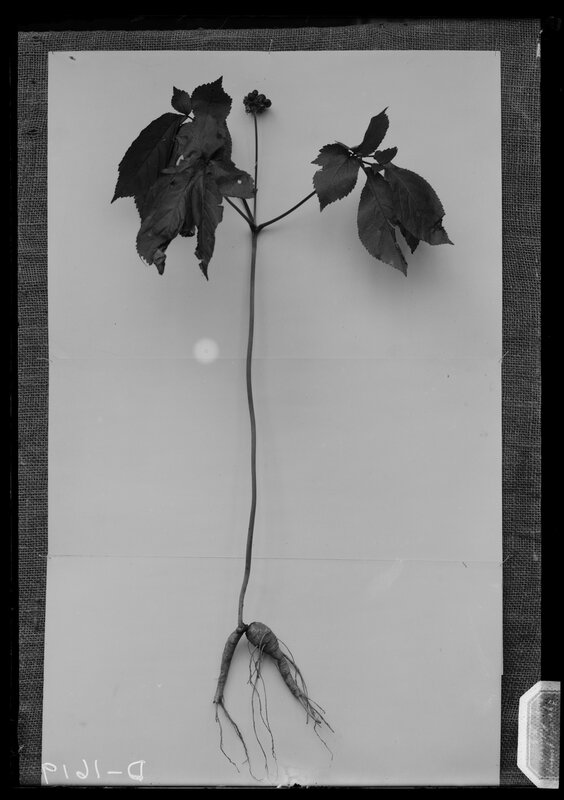 Ginseng plant 3 year old, culture. 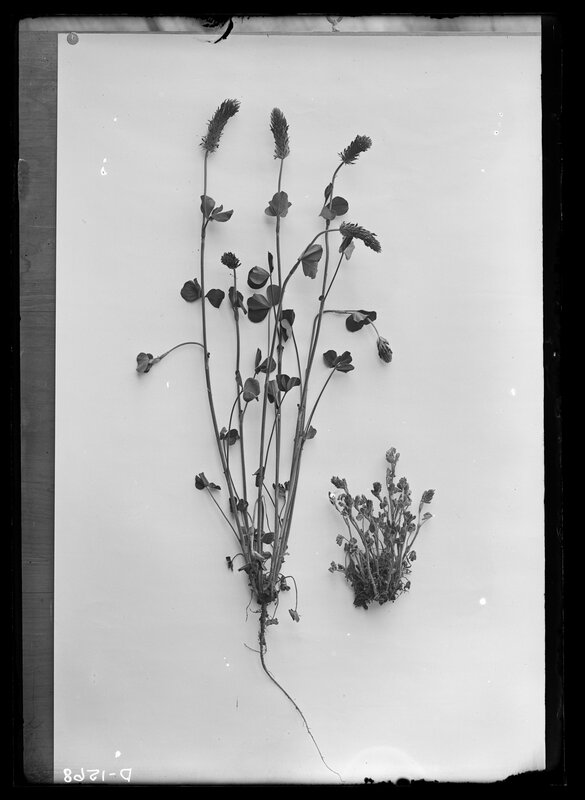 Good sample of red clover. 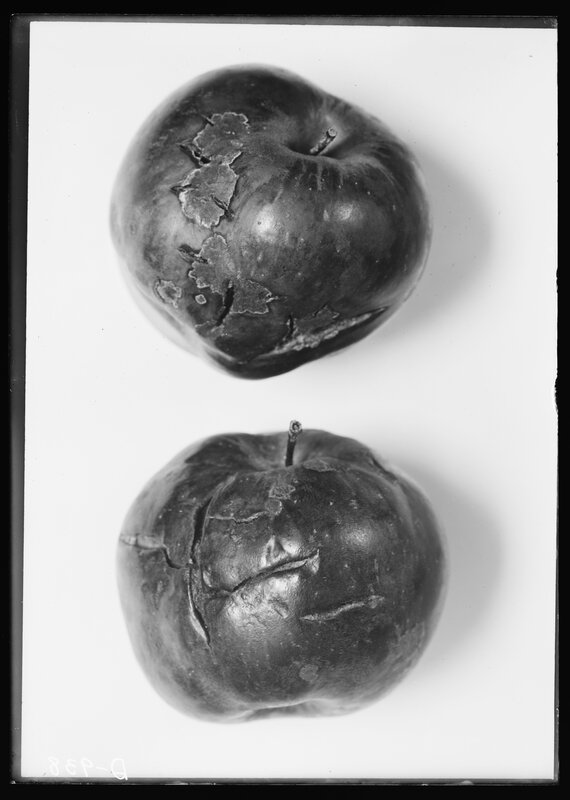 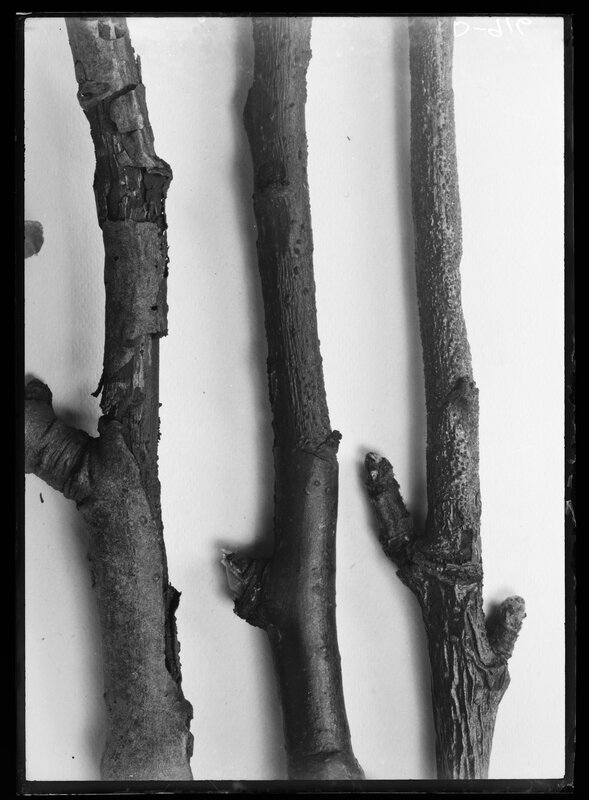 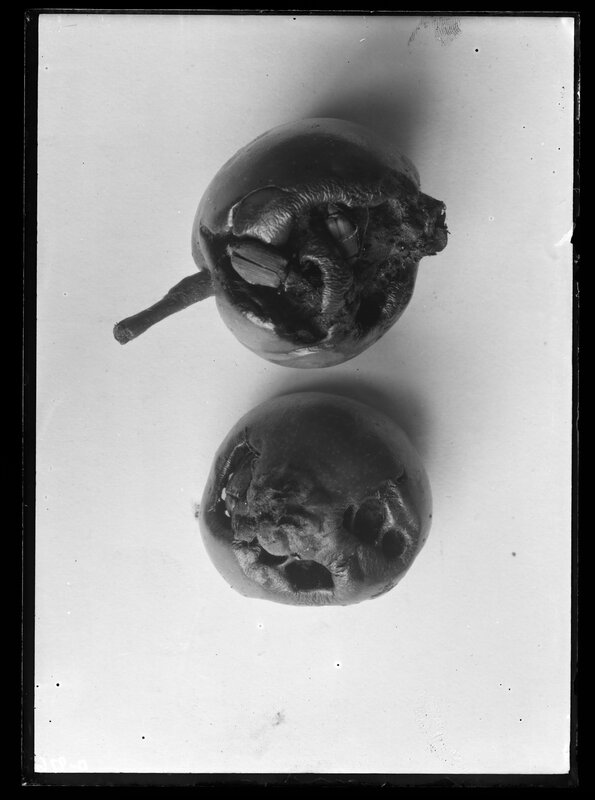 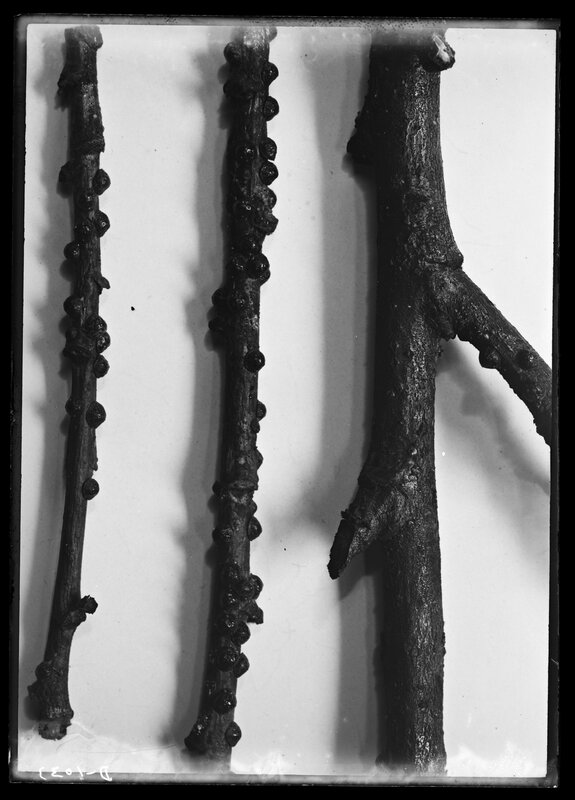 Small apples injured by strigoderma arboricola. 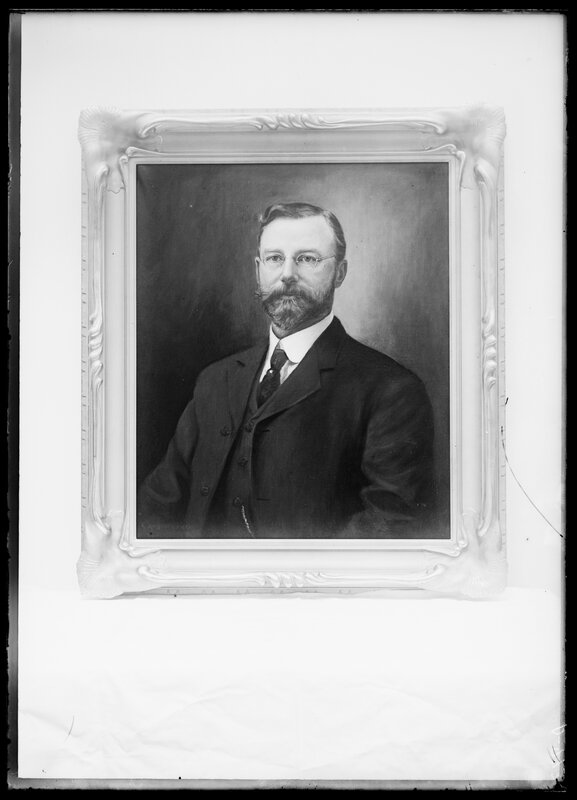 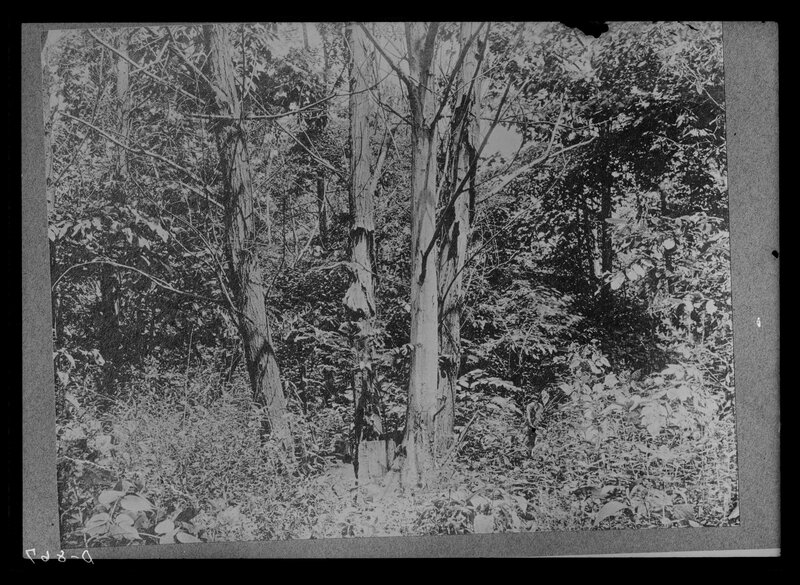 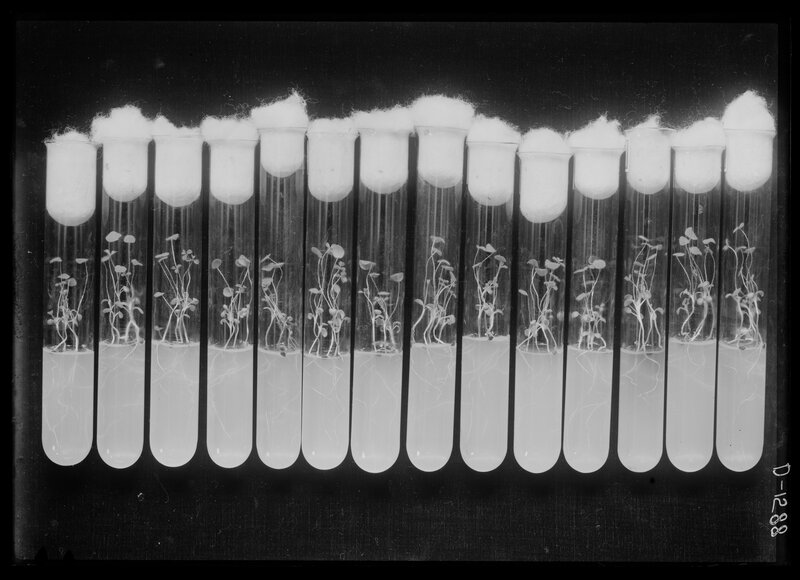 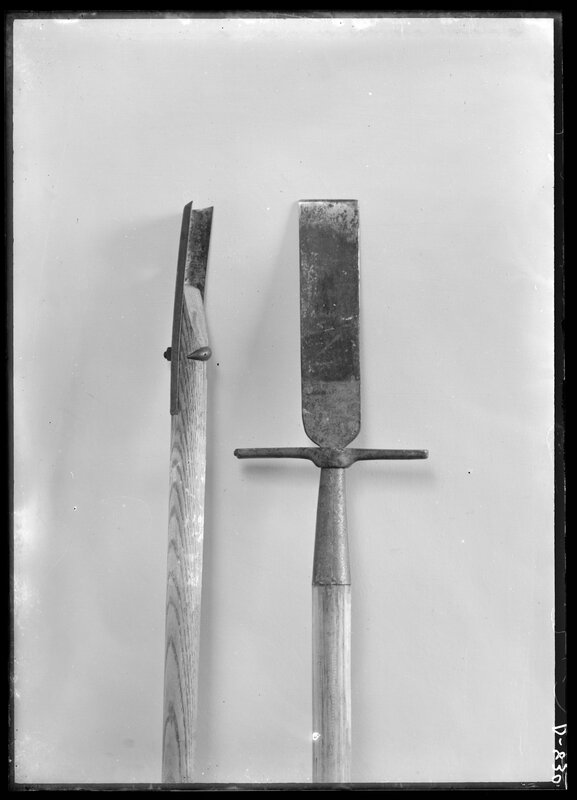 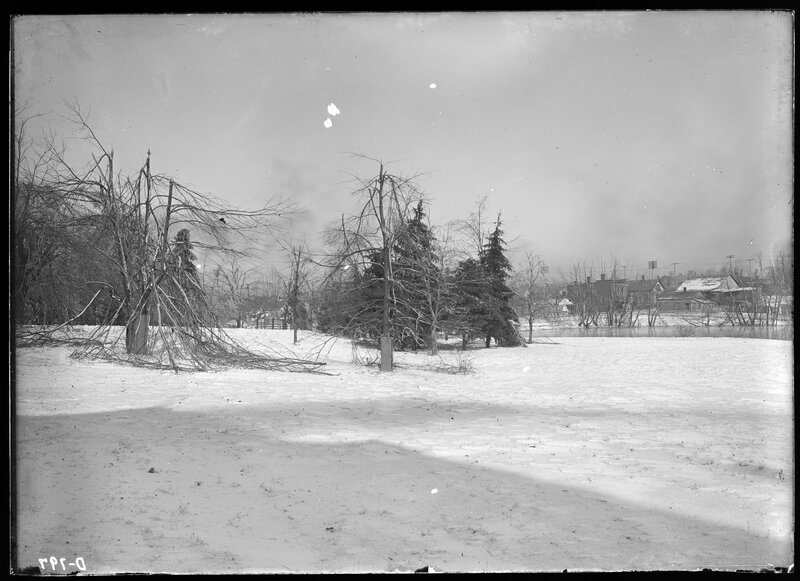 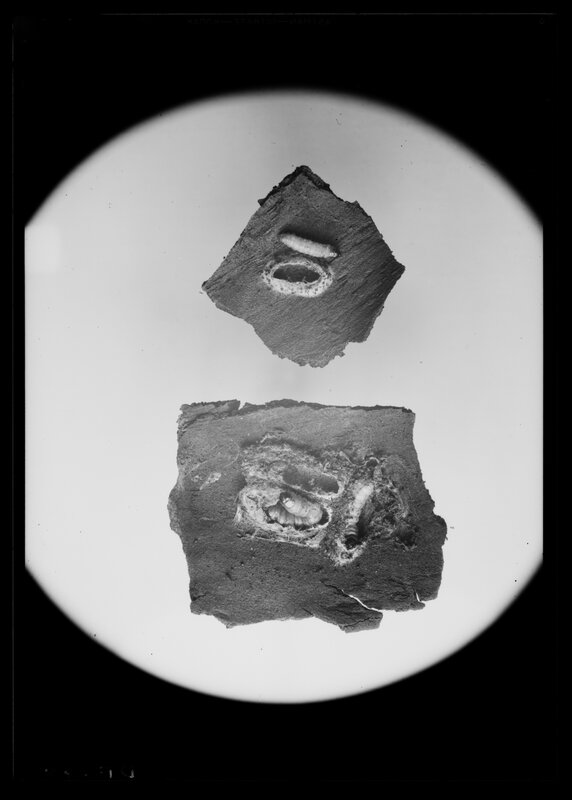 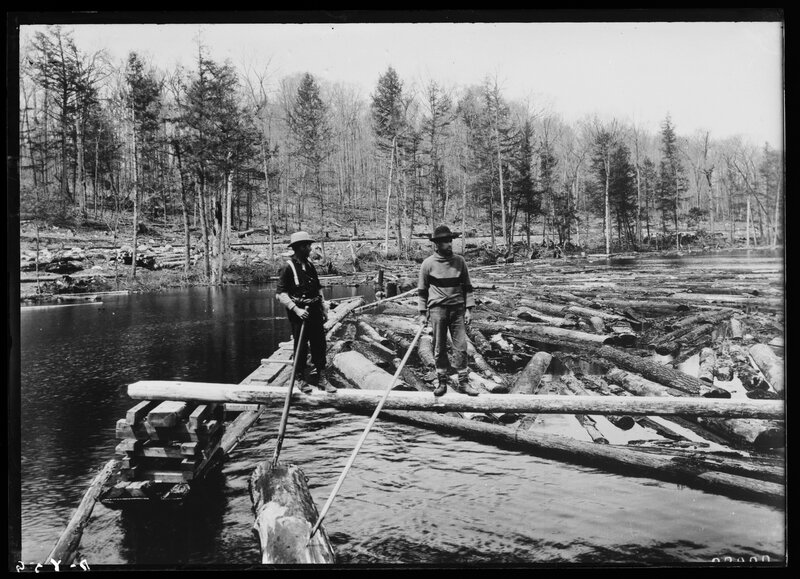 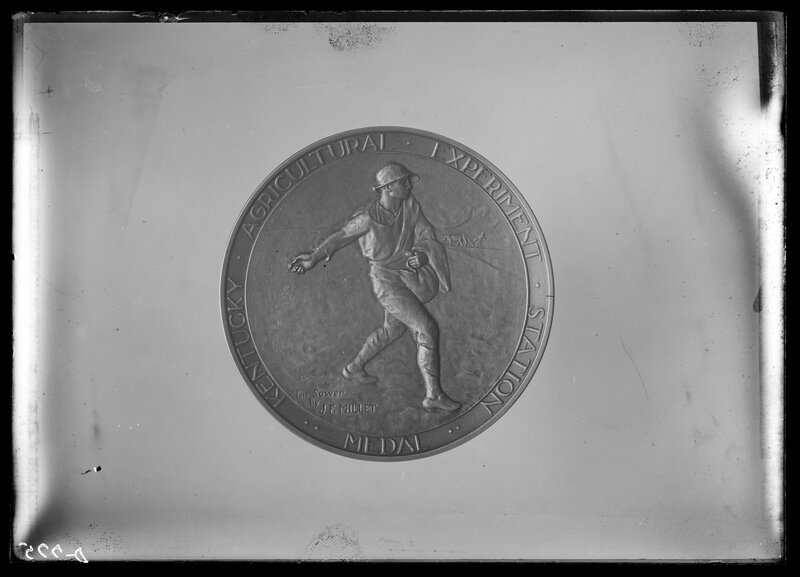 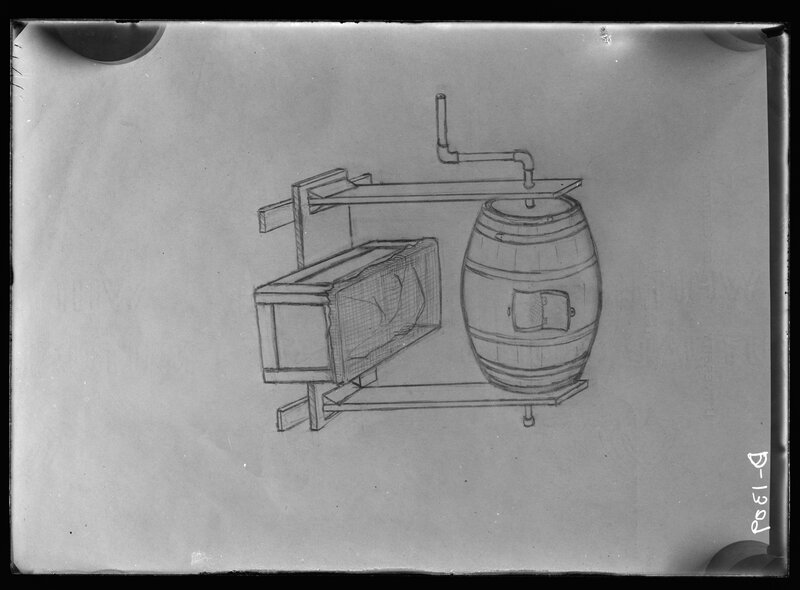 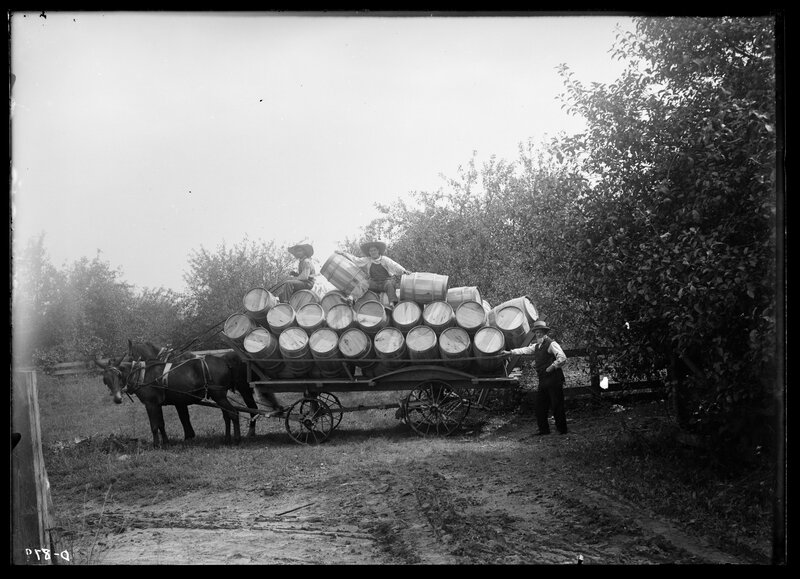 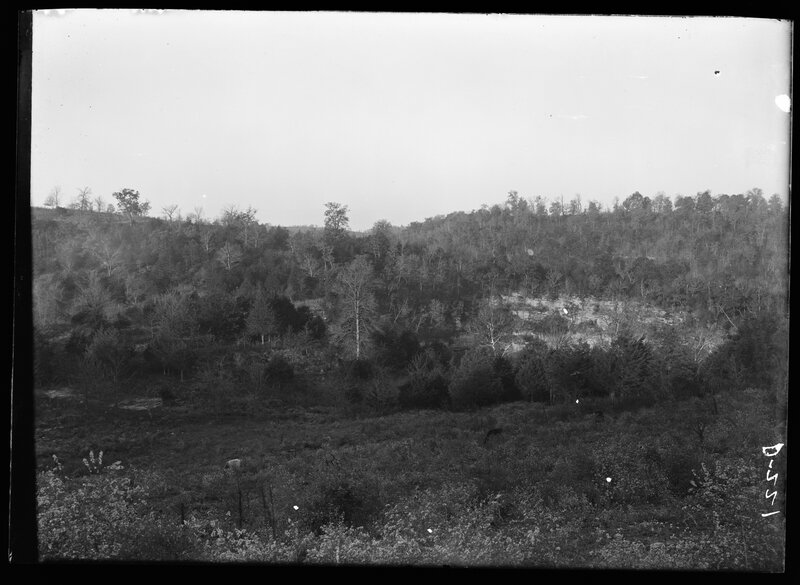 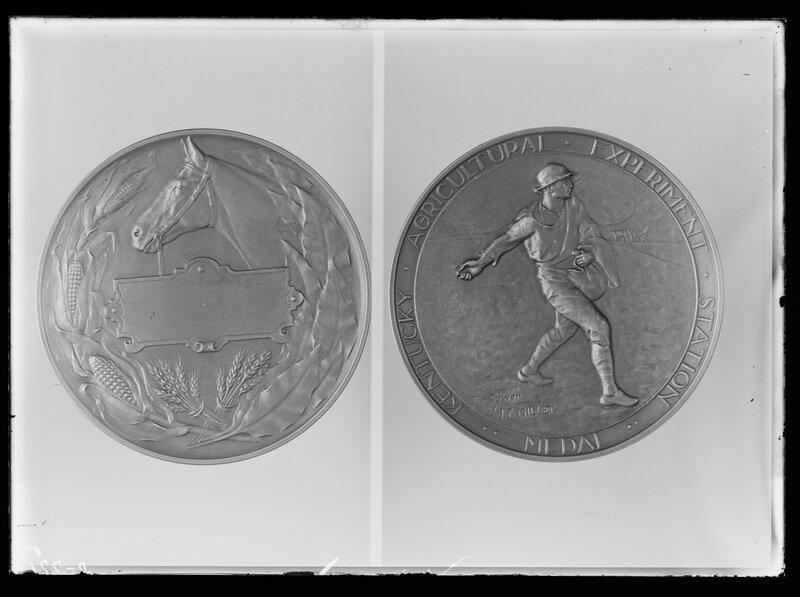 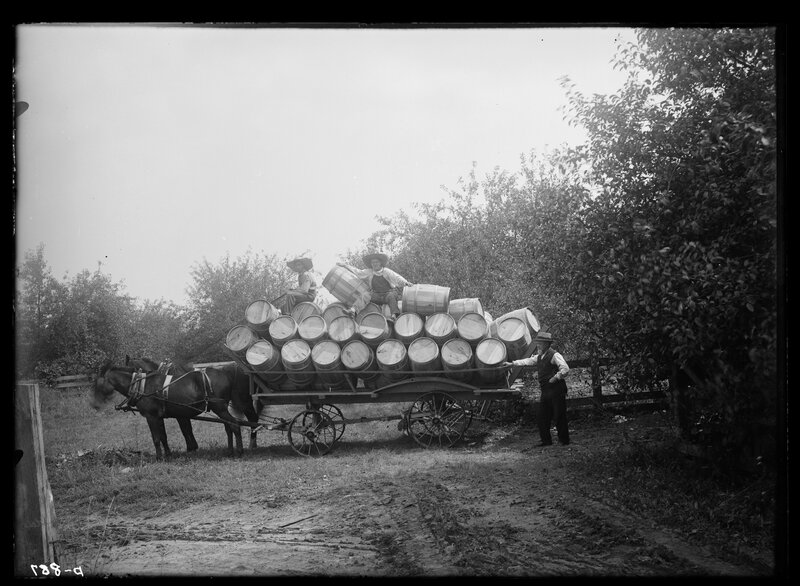 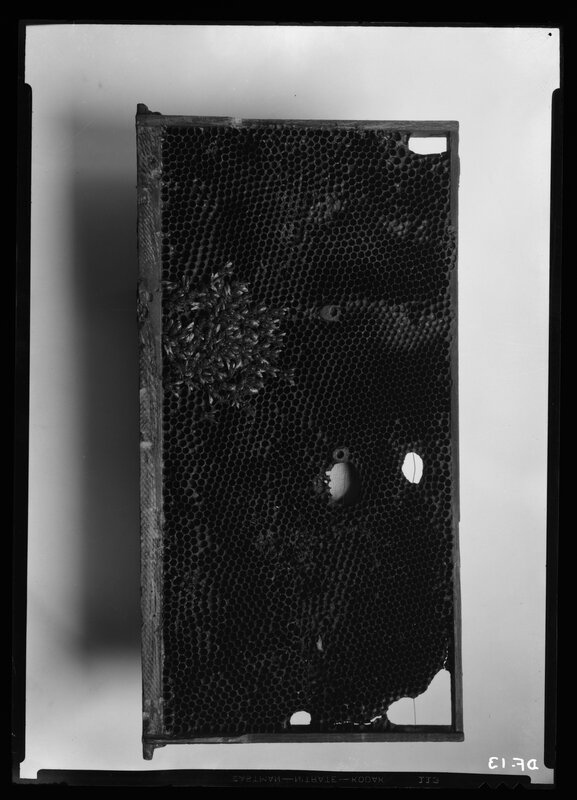 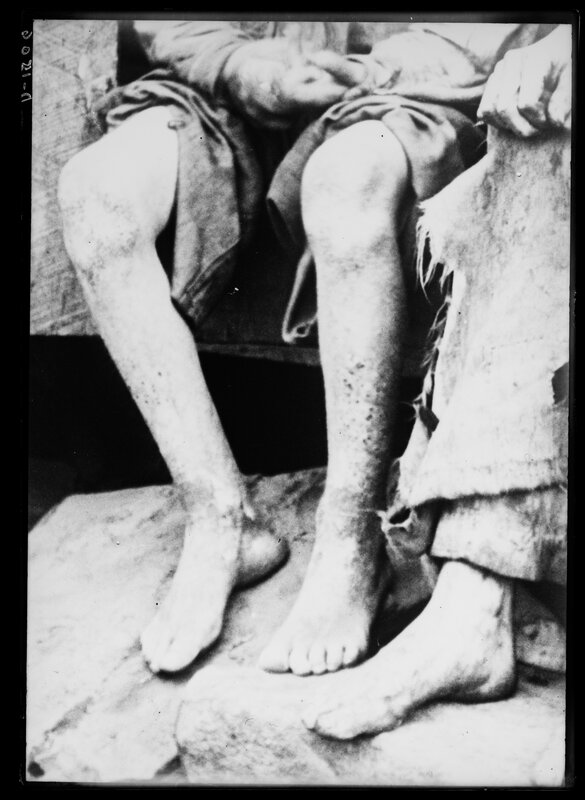 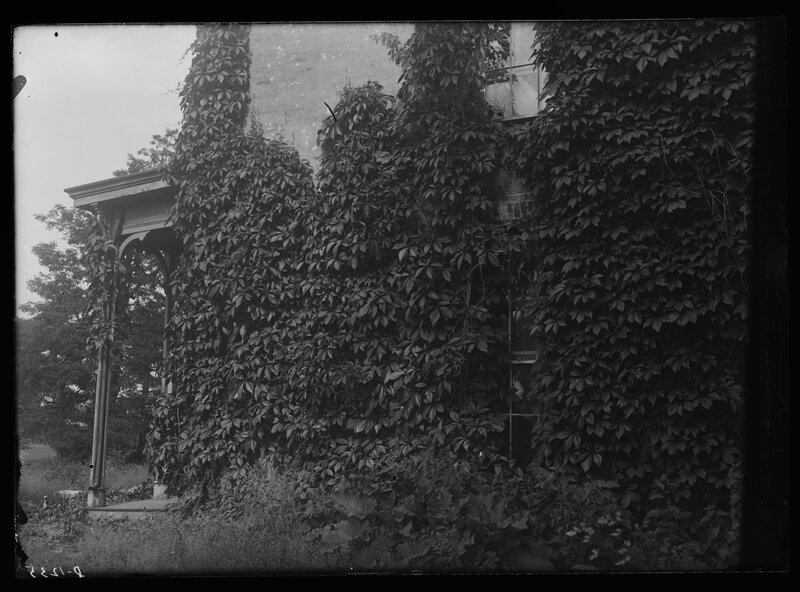 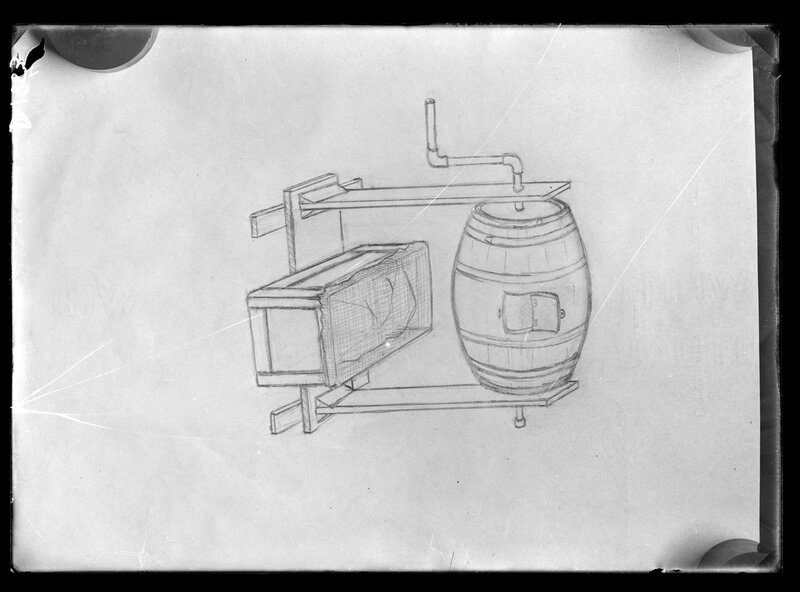 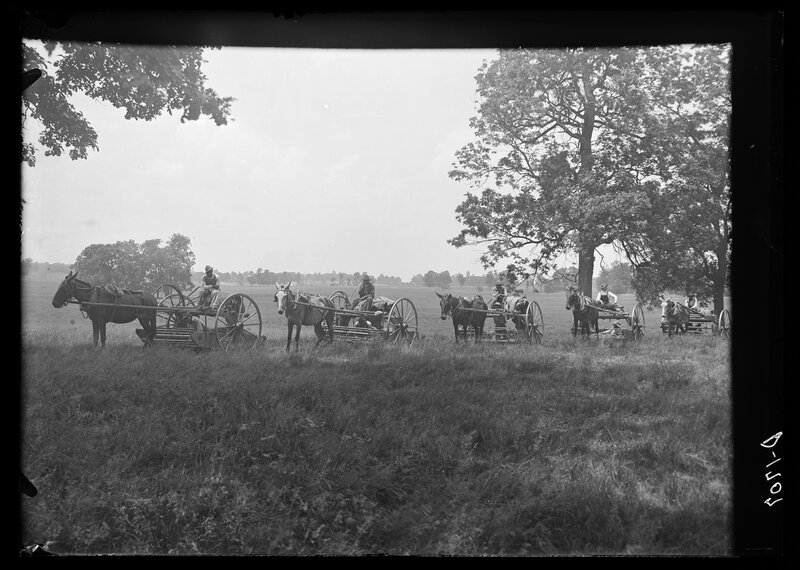 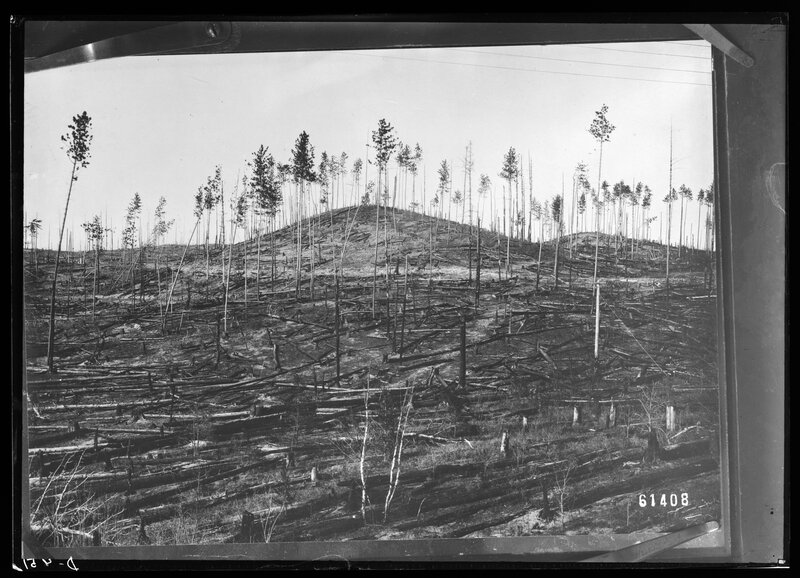 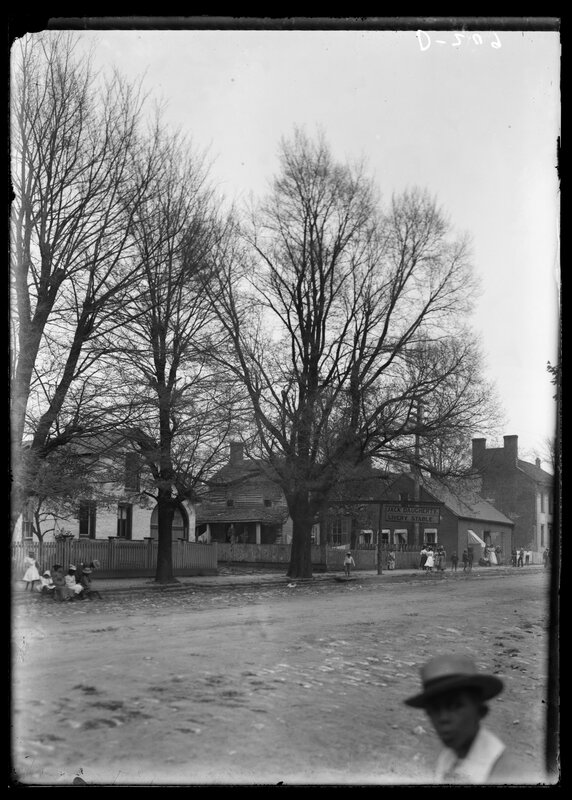 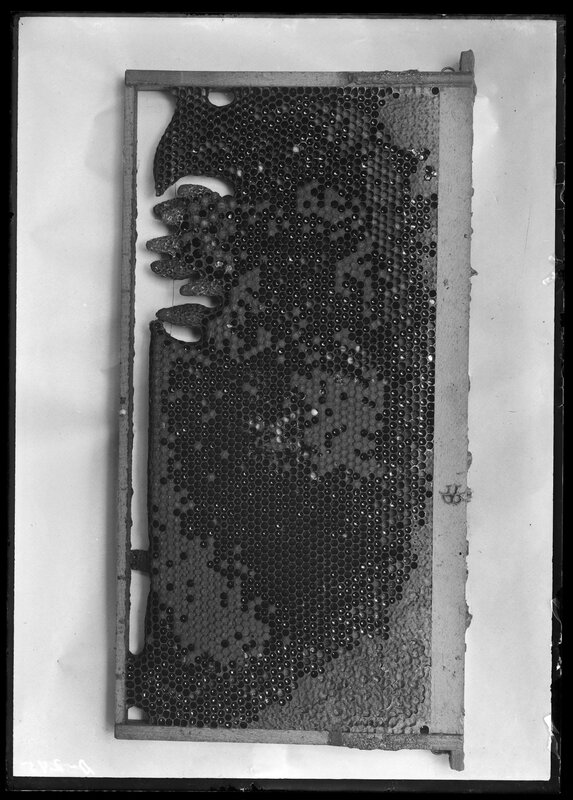 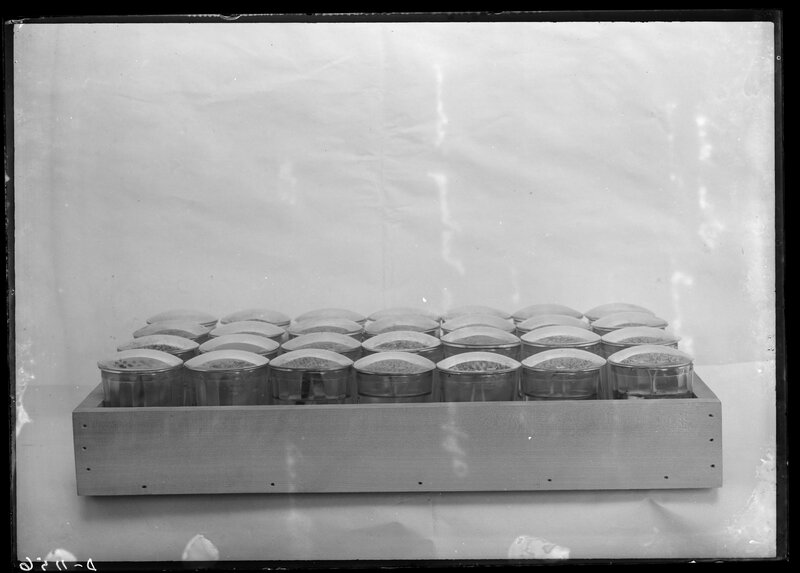 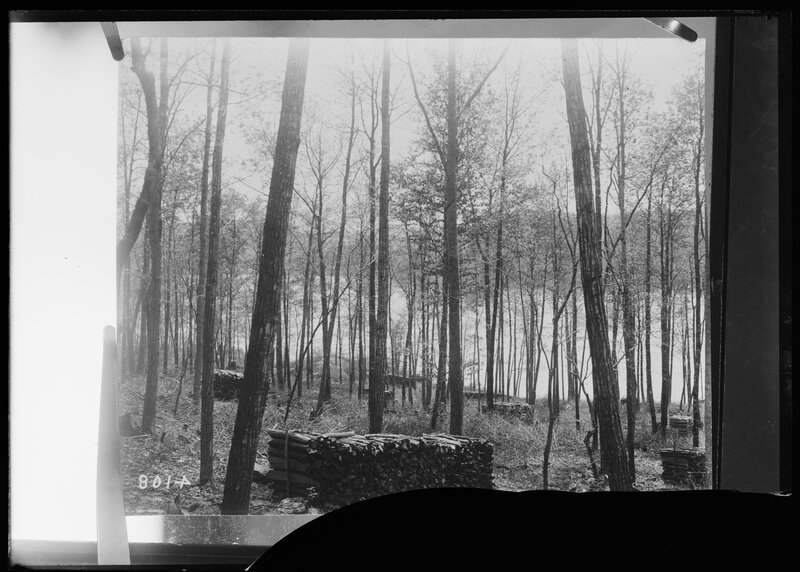 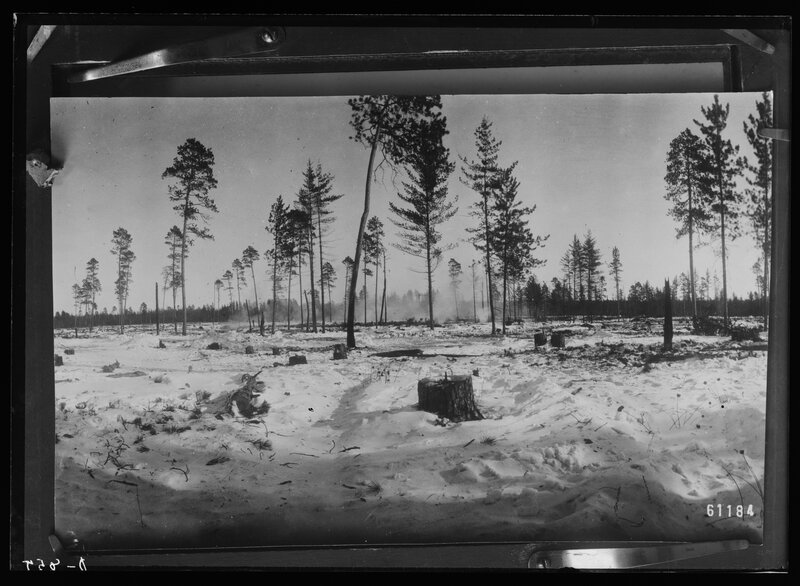 Subseries E consists of 60 4" x 5" glass negatives, dated between 1895 and 1911. 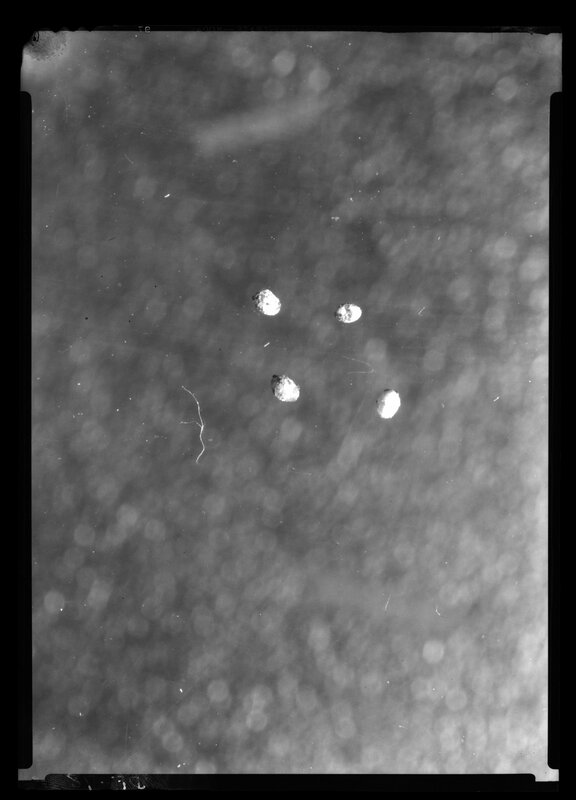 The photographer, when identified, is listed in the scope note. 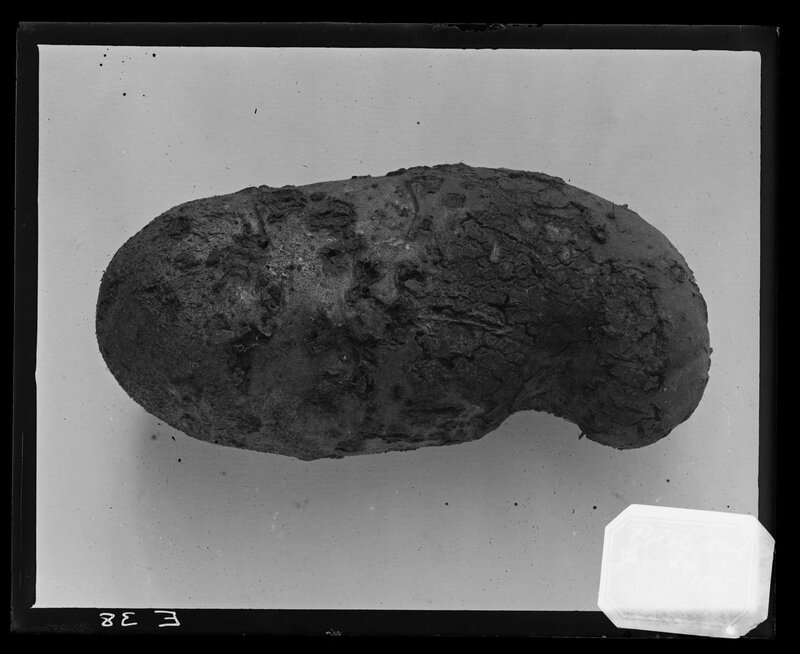 Potato injurey by white grub. 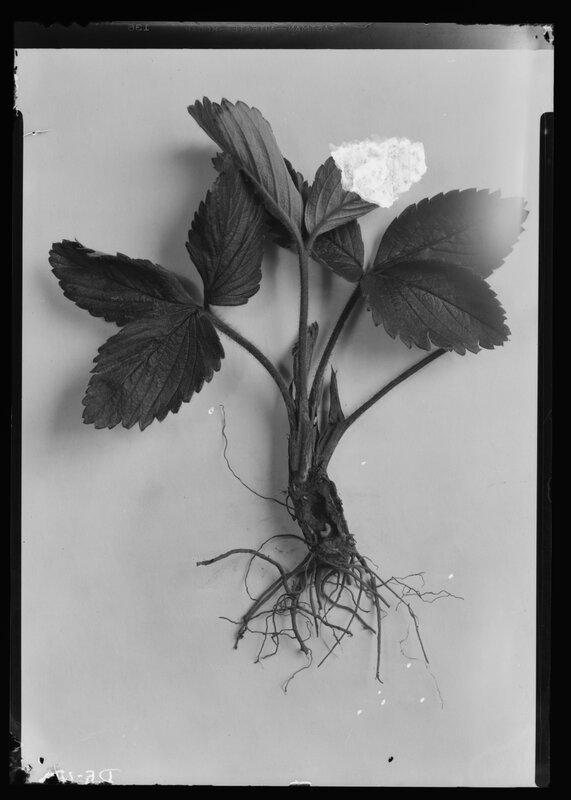 Strawberry at Johnson, New York. 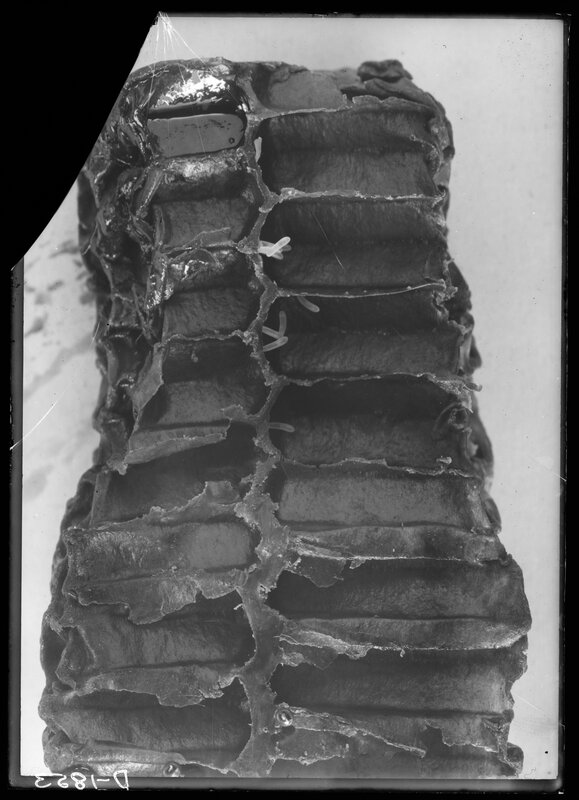 Egg case of vase-making spider. 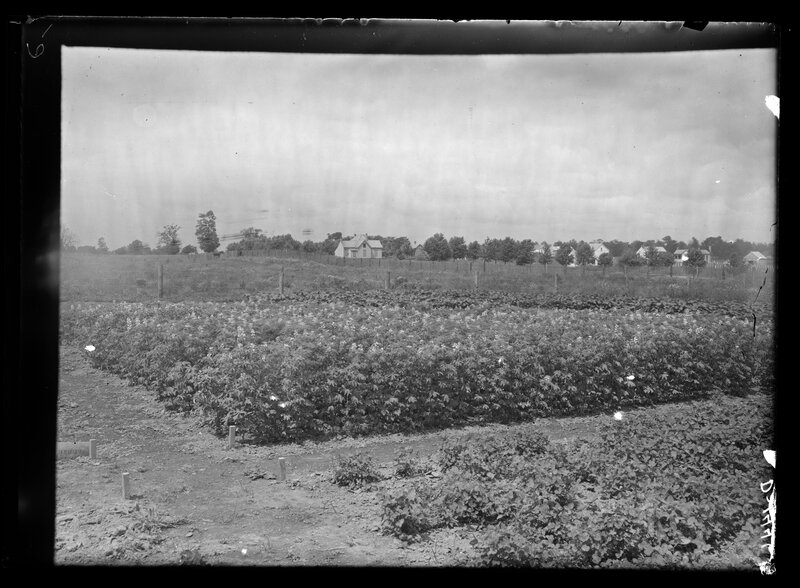 Crickets injuring strawberries at O. Schradler Bank Lick, Kenton County. 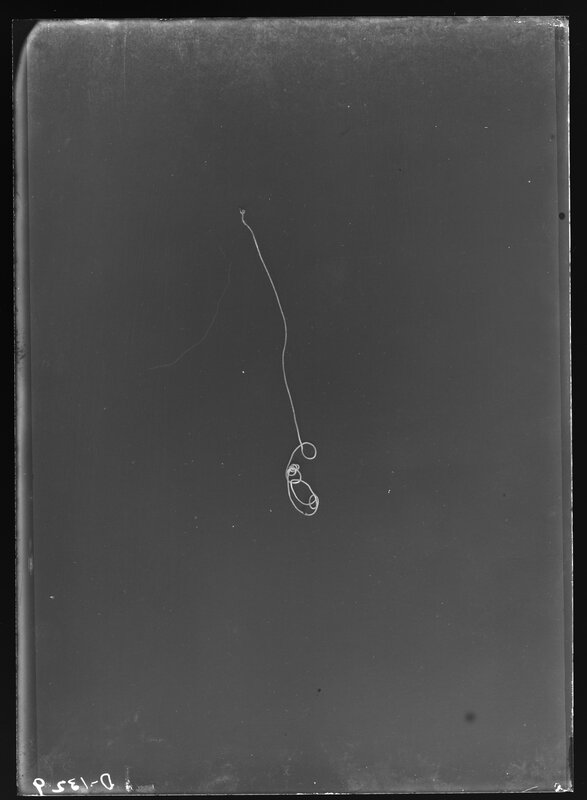 Wire worm & eggs of squashbug. 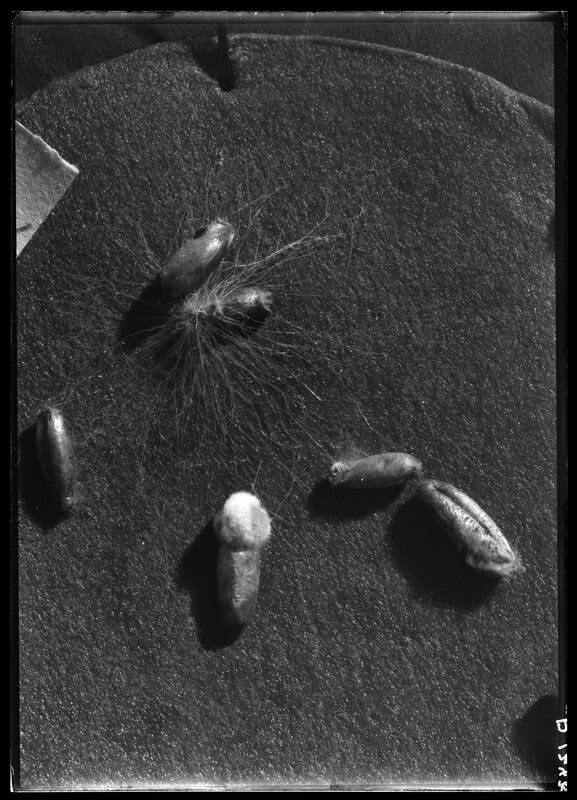 Blue grass seed, poa pratensis. 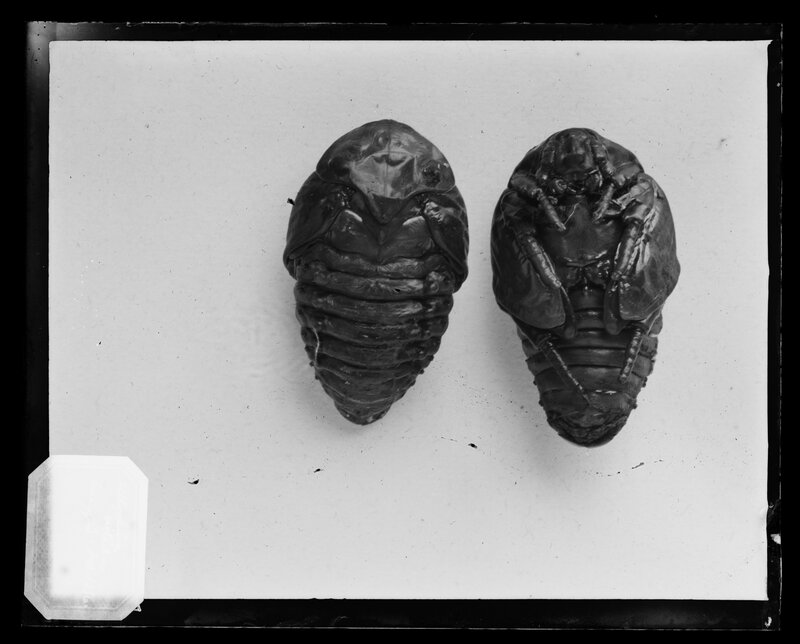 Anasa tristis & bruchus pisorum. 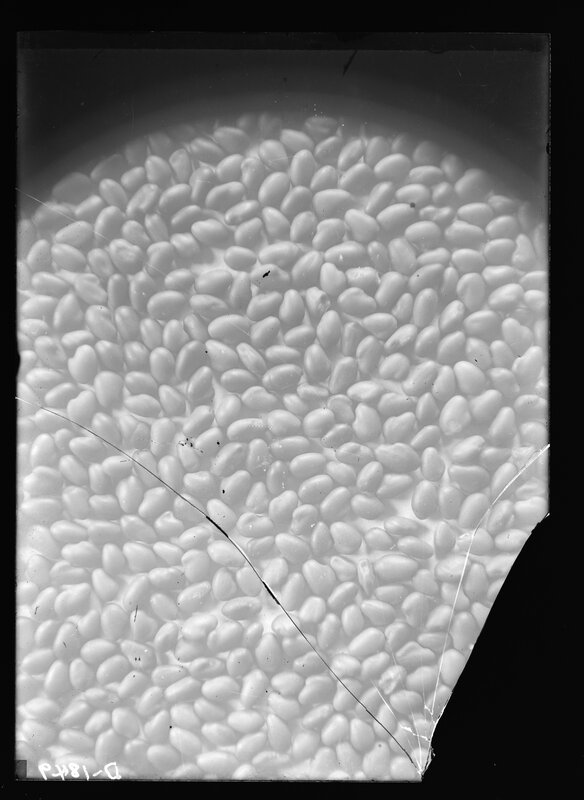 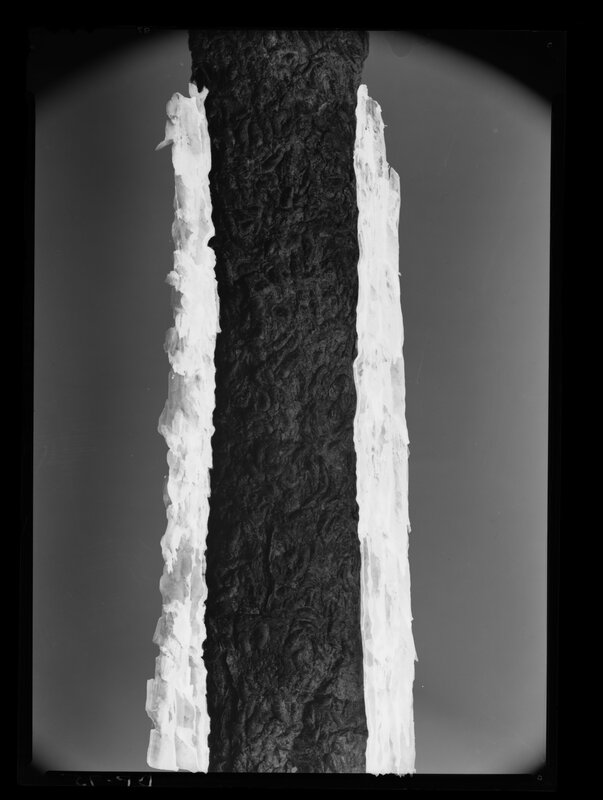 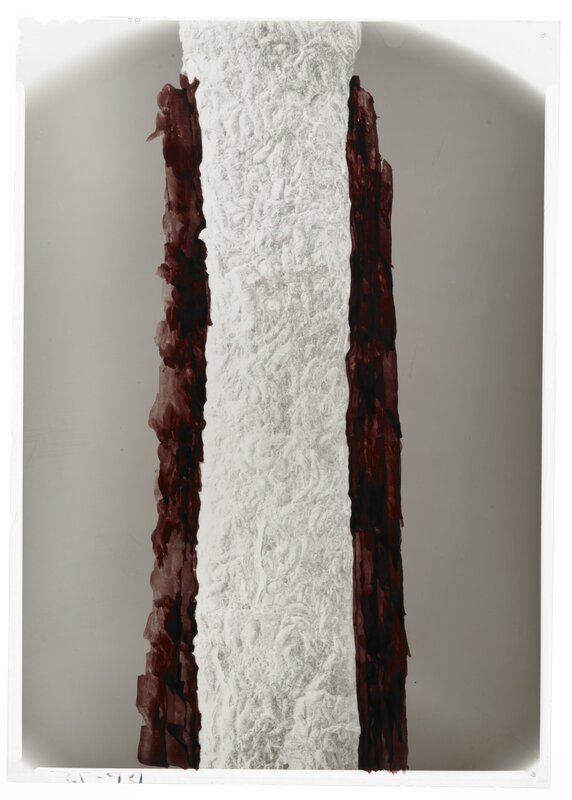 Subseries DF consists of nearly 250 5" x 7" flexible film negatives, dated between 1936-1948. 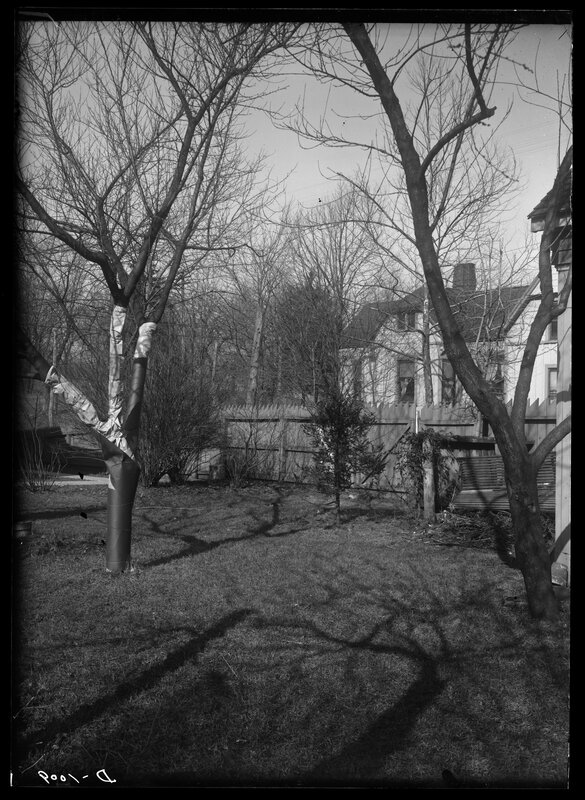 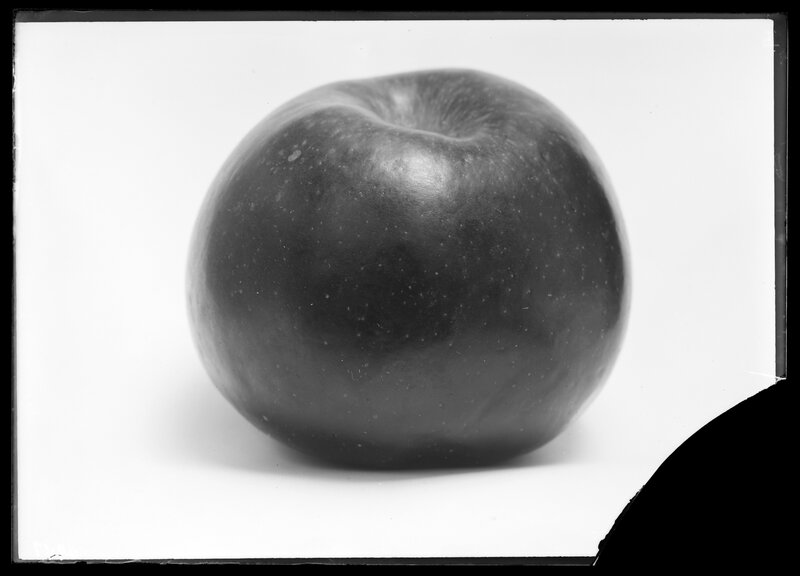 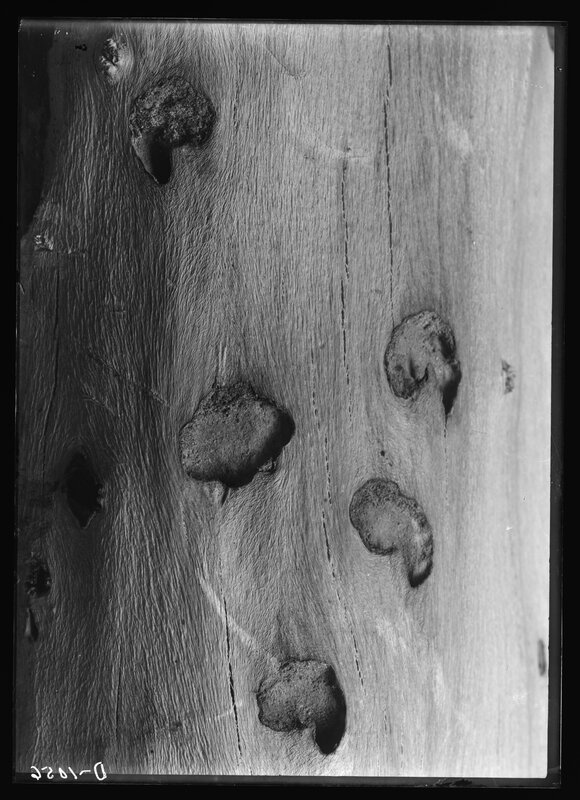 This subseries includes nearly 100 5 x 7 prints of some negatives, located in Boxes 58 and 59. 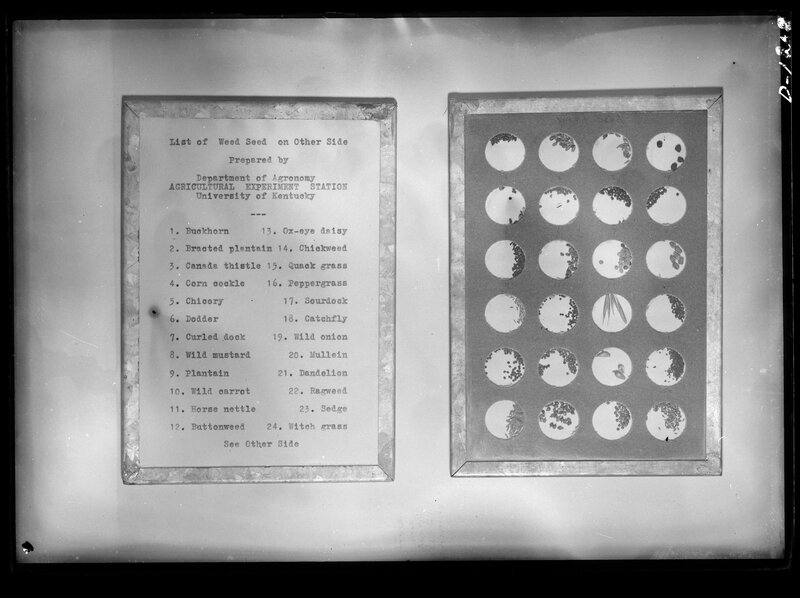 Those negatives which have prints are specified in the database. 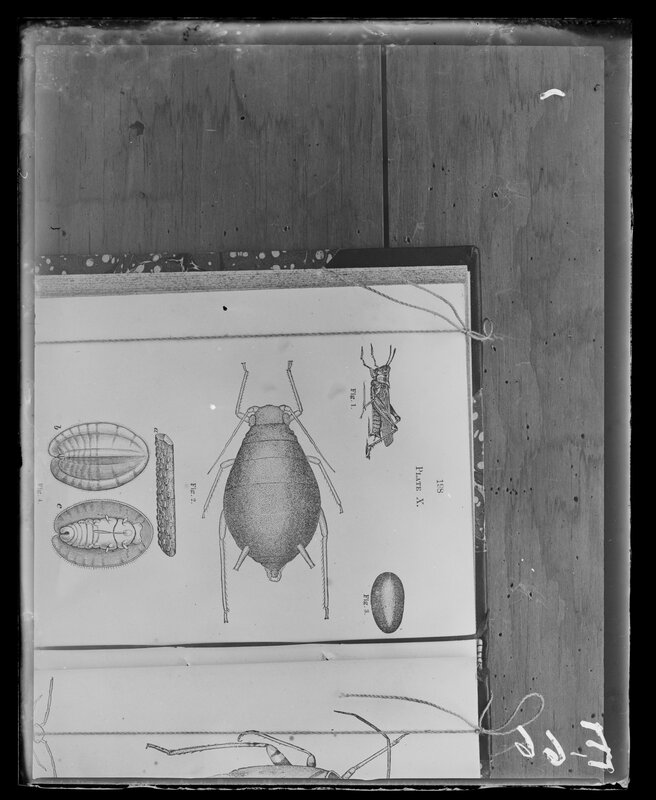 The photographer, when identified, is listed in the scope note. 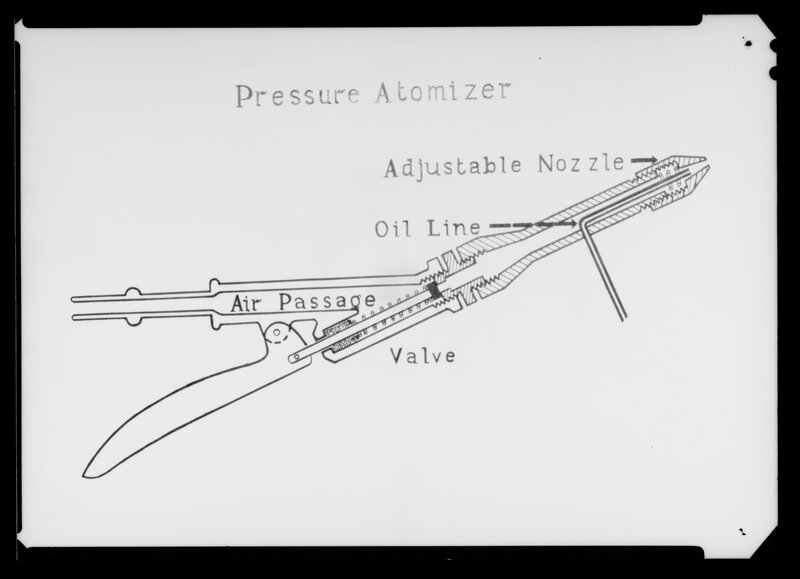 Venturi tube atomizer nozzle designed by Calfee. 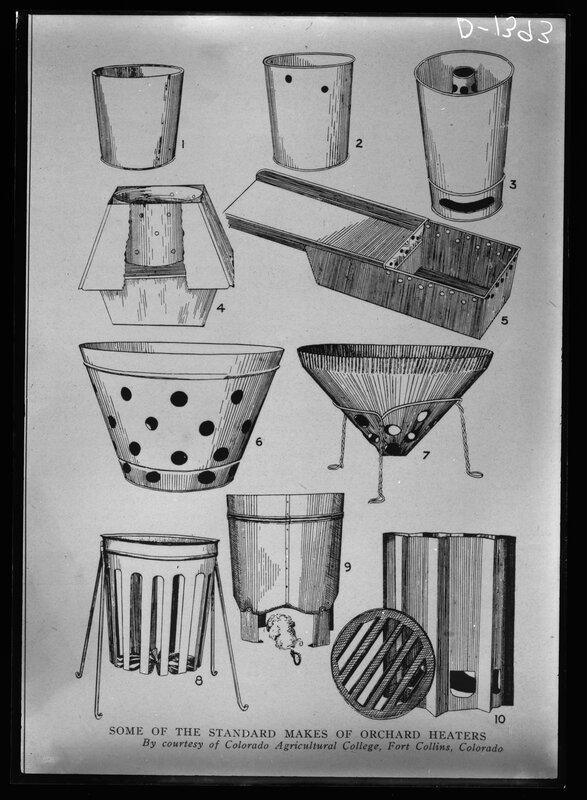 Drawn by Calfee. 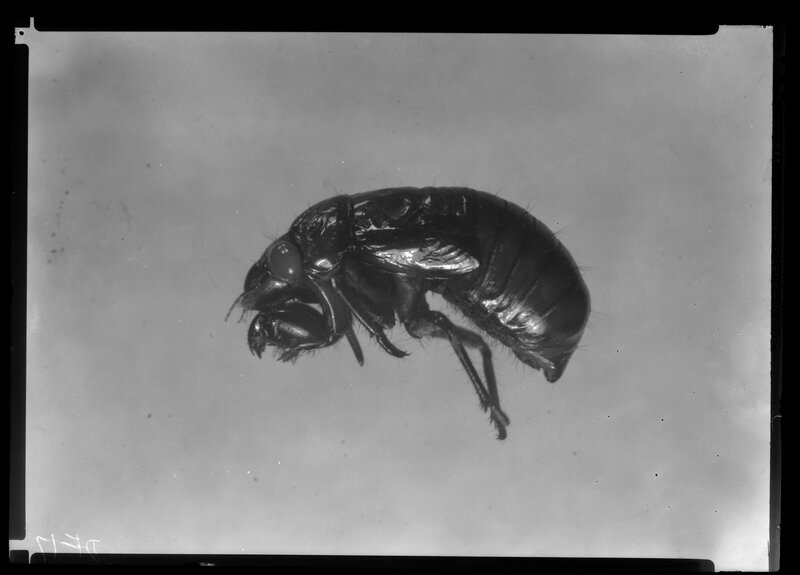 Microbracon analcidis, adult parasite of crown borer. 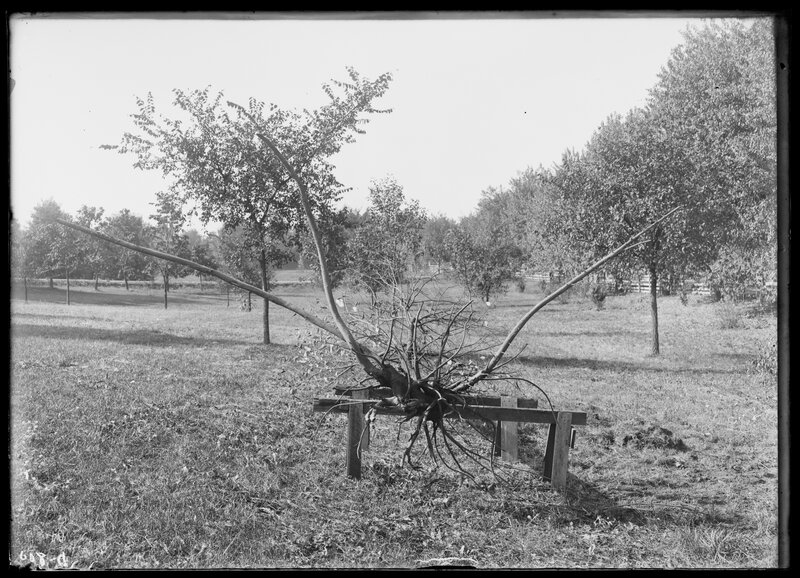 Plant injured by crown borer. 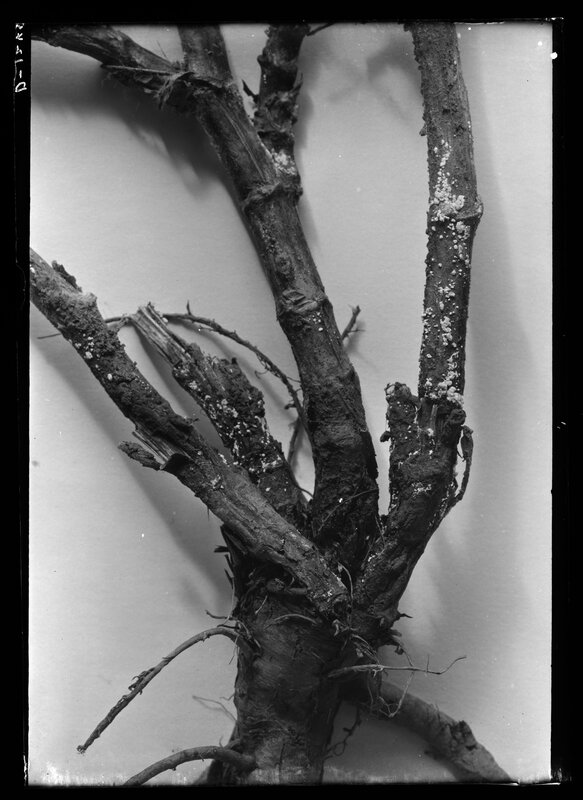 Strawberry plant showing adult crown borer injury to older leaves. 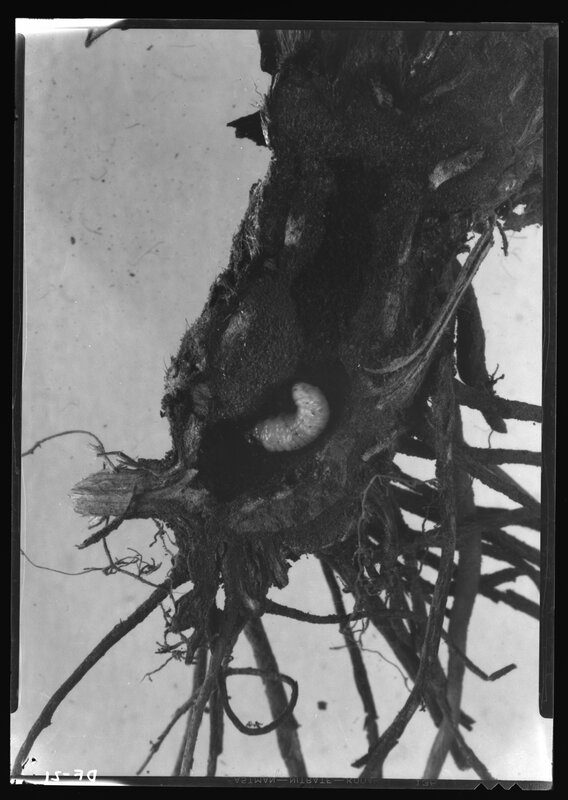 Cocoon of M. analcidis crown borer parasite. 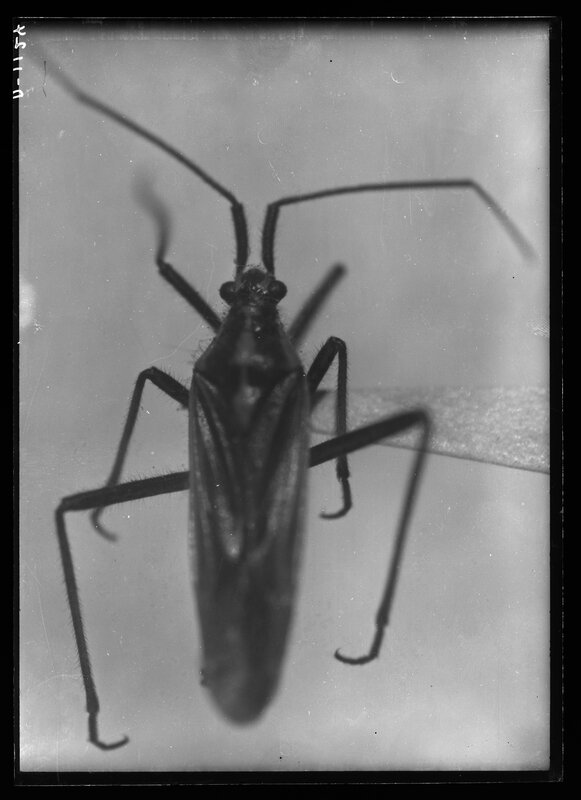 Adult crown borer posed on leaf petiole. 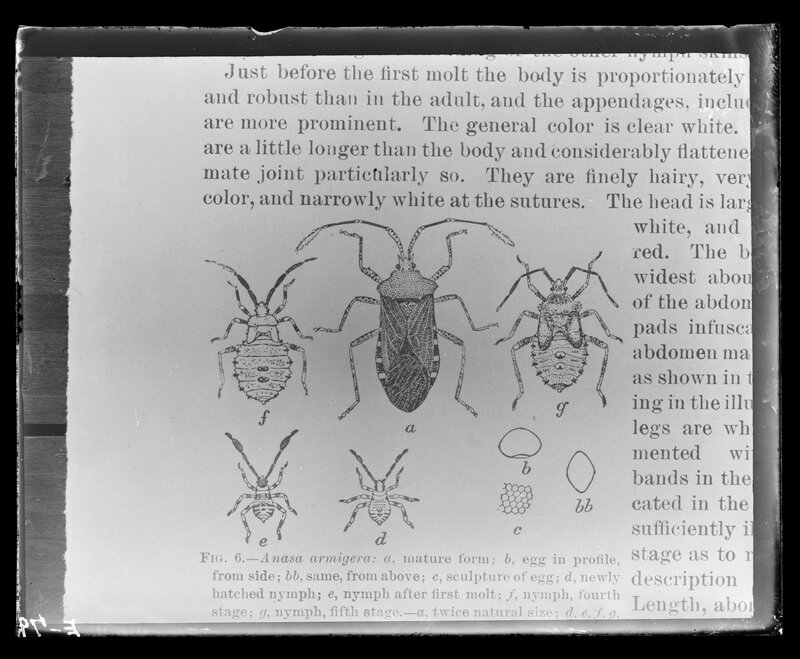 Crown borer adults, opossum position. 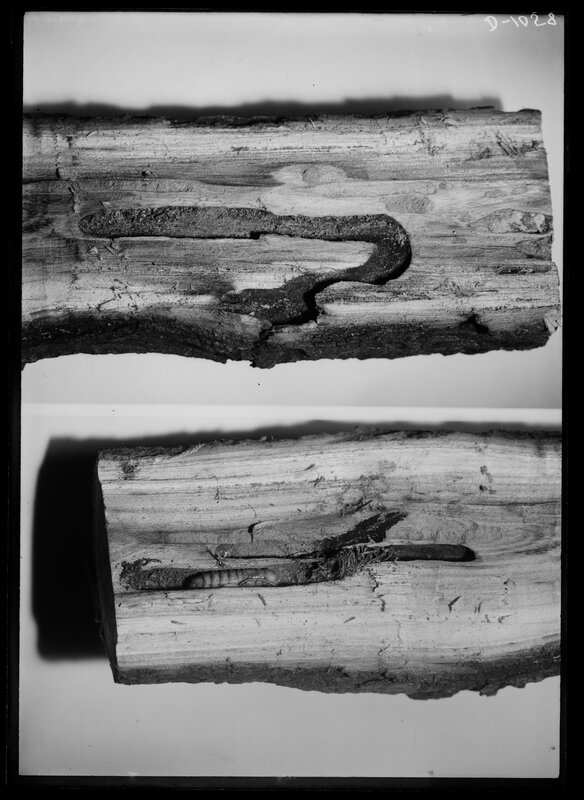 Crown borer injury to leaf and stipules. 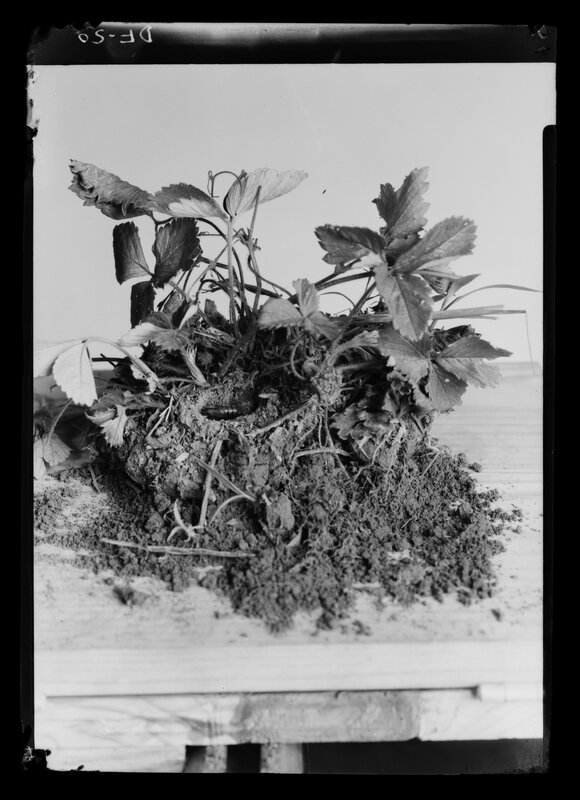 Strawberry plant injured by crown borer eating out crown. 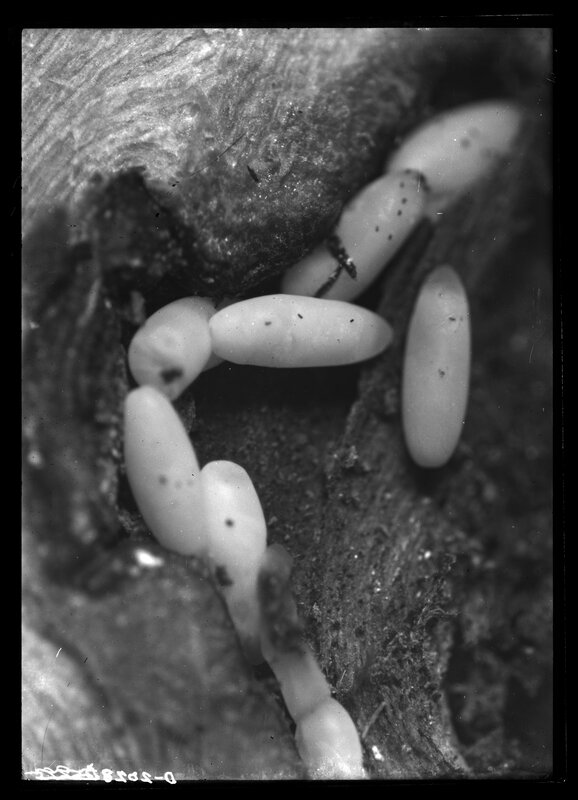 Crown borer eggs exposed on plant and adult feeding. 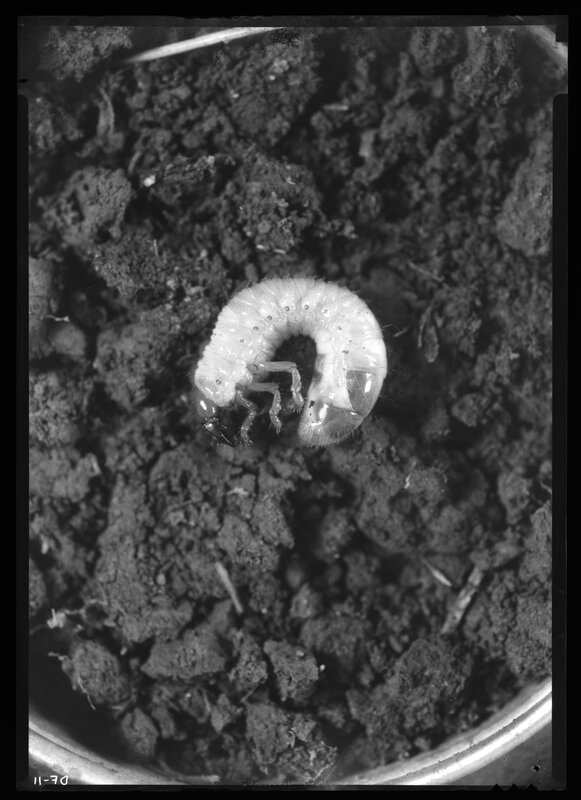 Strawberry plant showing where and how crown borer eggs are placed. 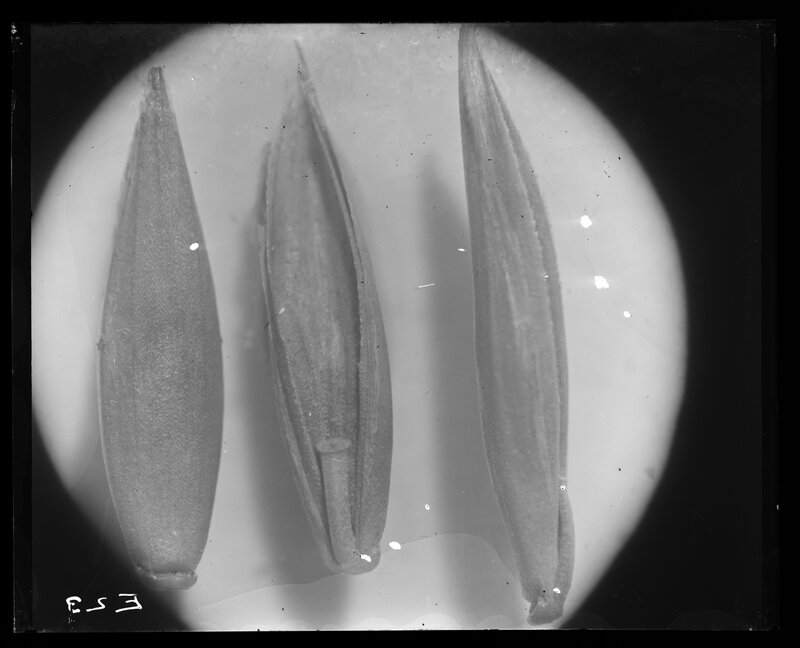 Oenothera laciniata showing egg scars of T. faveolata. 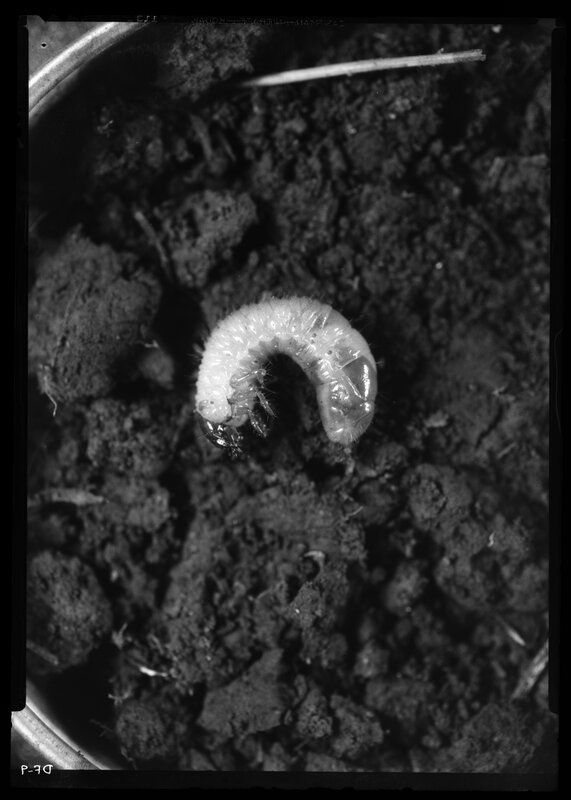 Early spring injury of overwintering larvae of apantesis rectilinia on strawberries in Princeton, Kentucky. 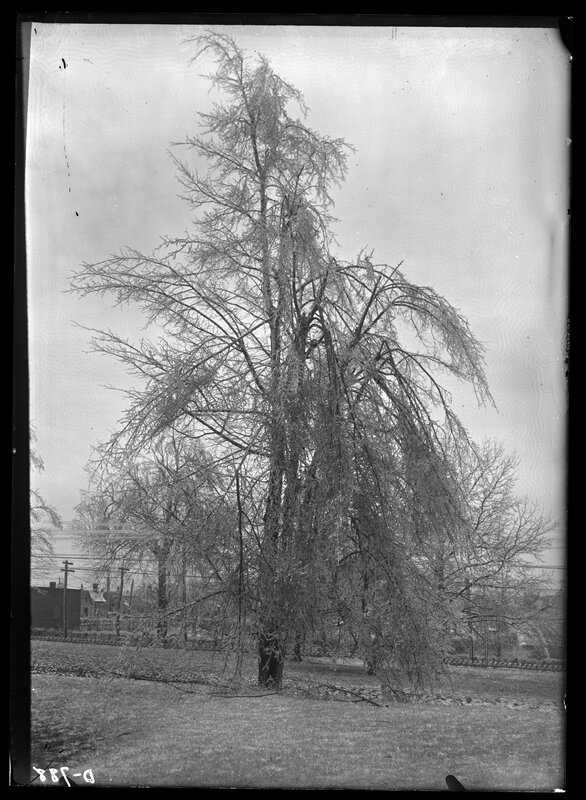 Early injury of apantesis rectilinia in Princeton, Kentucky. 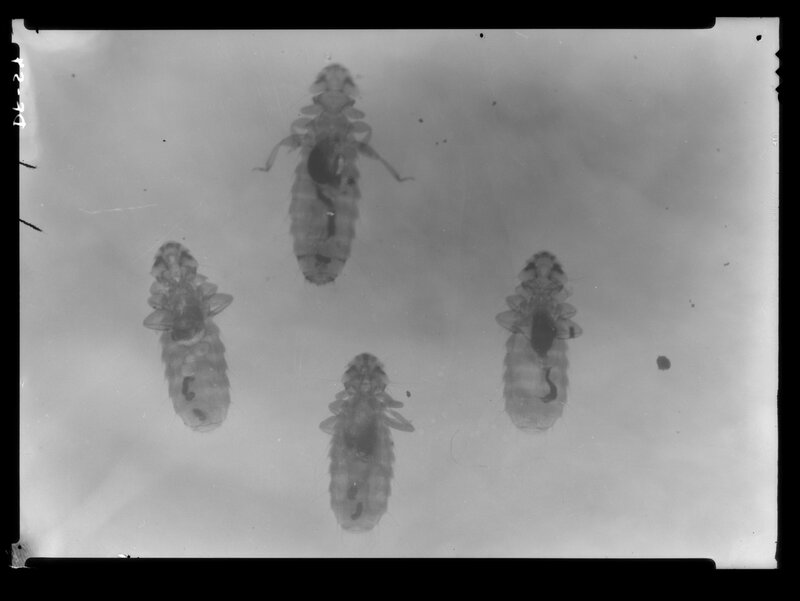 Large body louse of chicken. 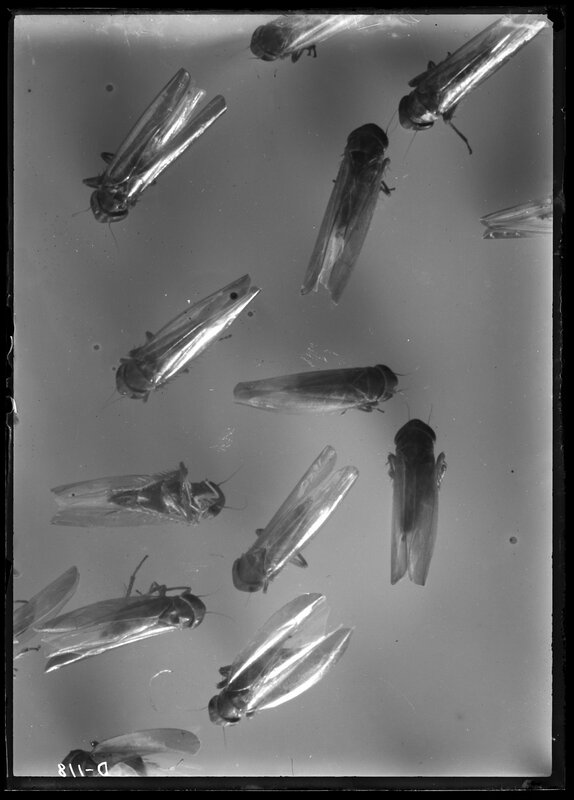 Rearing cabinet for crown borer project. 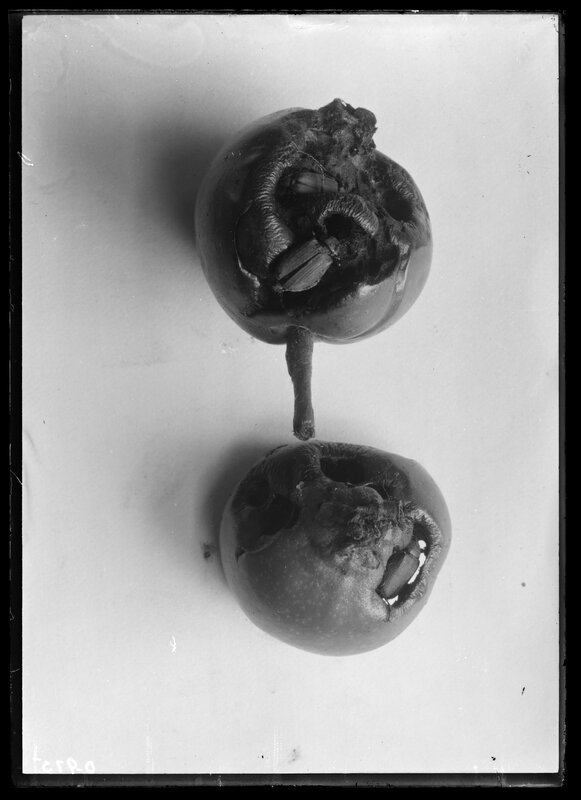 Codling moth injury to apple. 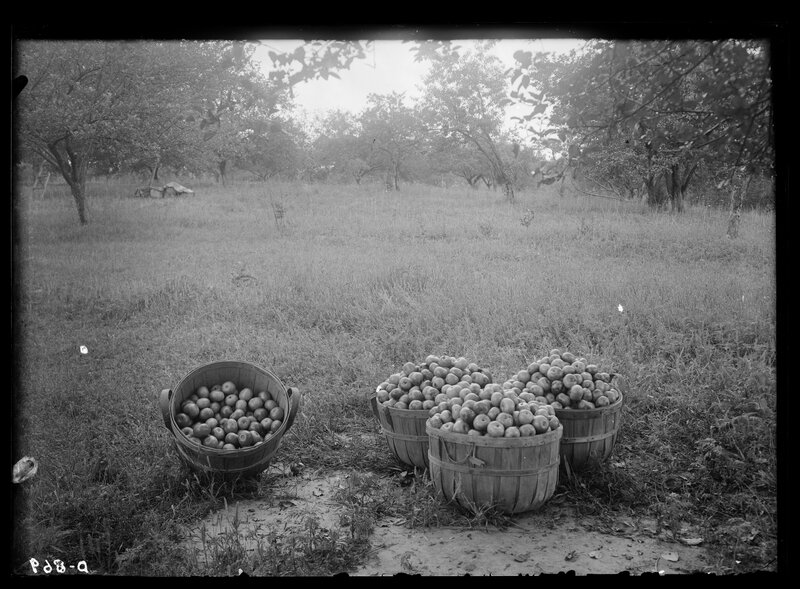 Apples ready for closed cluster spray. 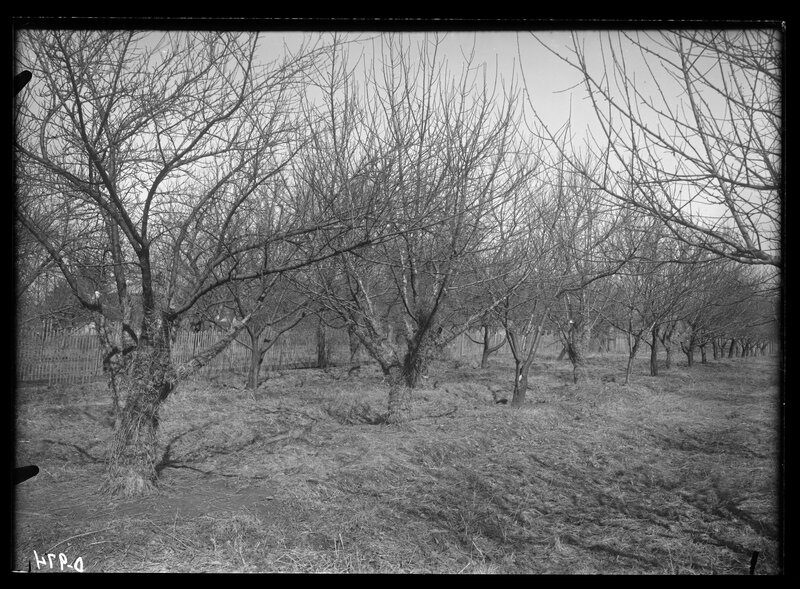 Apples ready for delayed dormant spray. 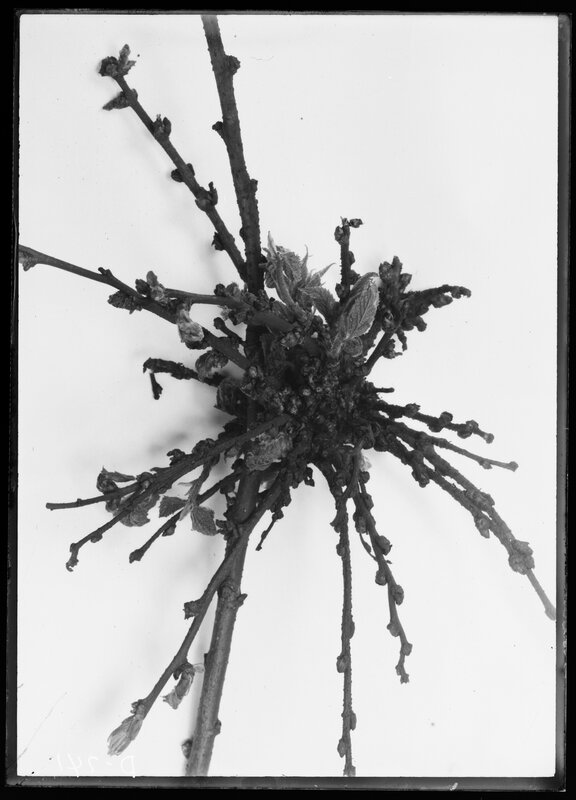 Apple ready for full bloom spray. 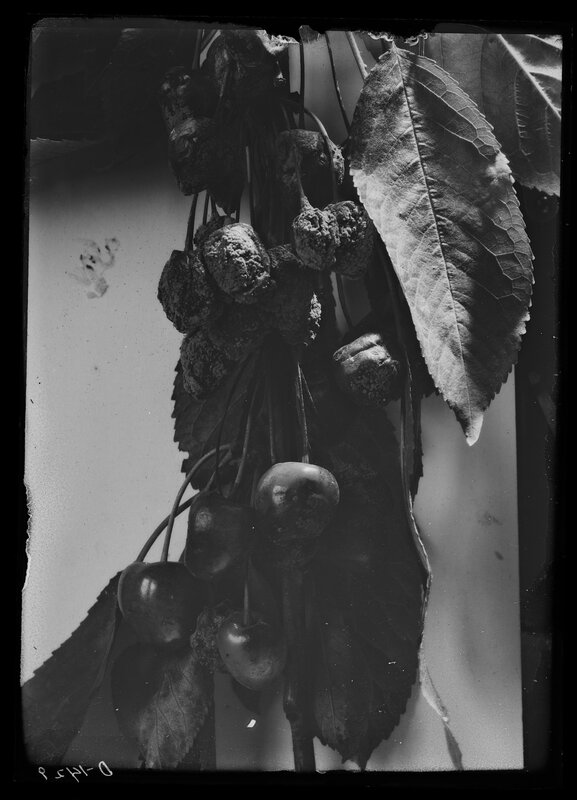 Apples ready for calyx spray. 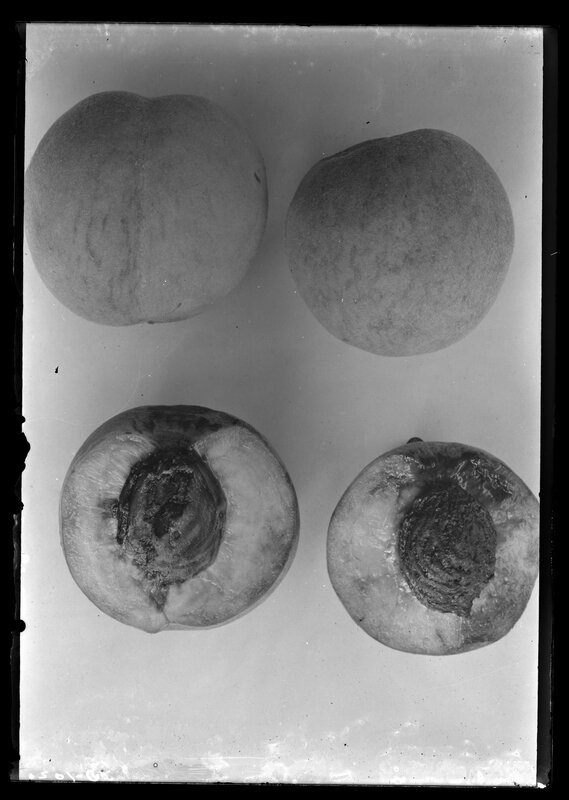 Apples ready for pink spray. 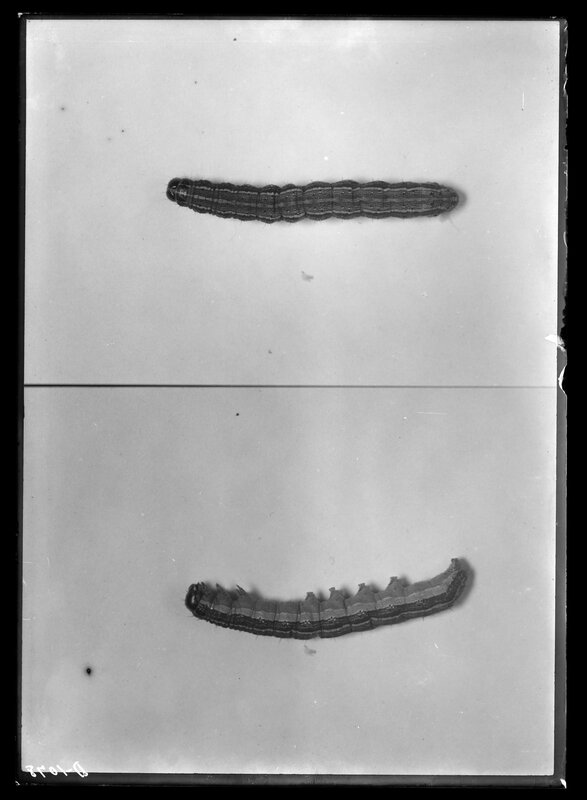 Codling moth band with worms caught. 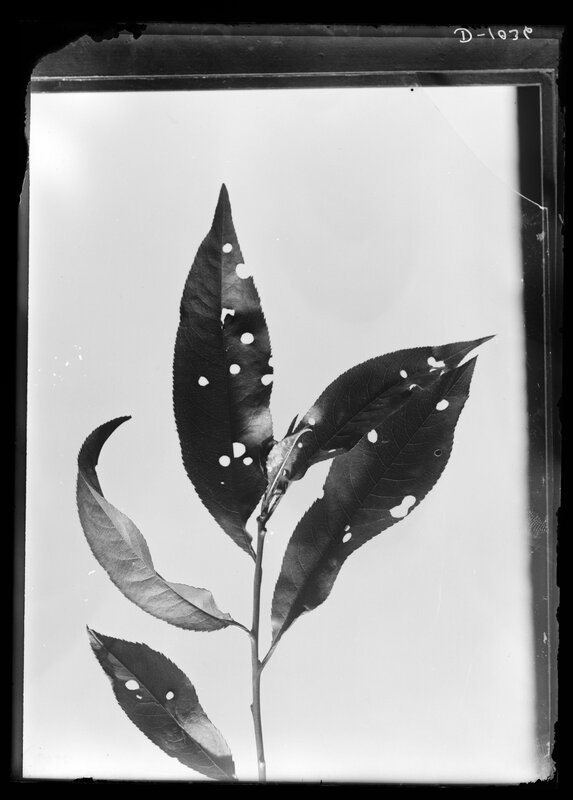 Codling moth eggs on apple leaf. 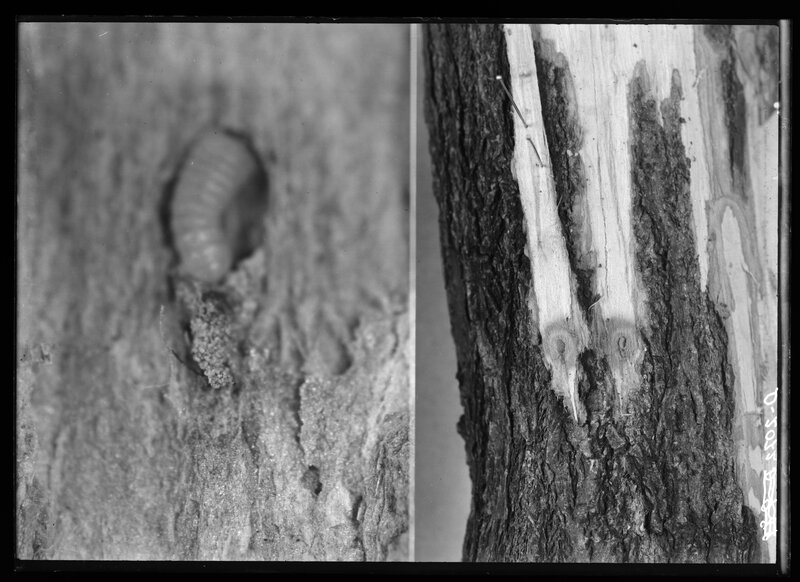 Codling moth larvae in hibernating quarters. 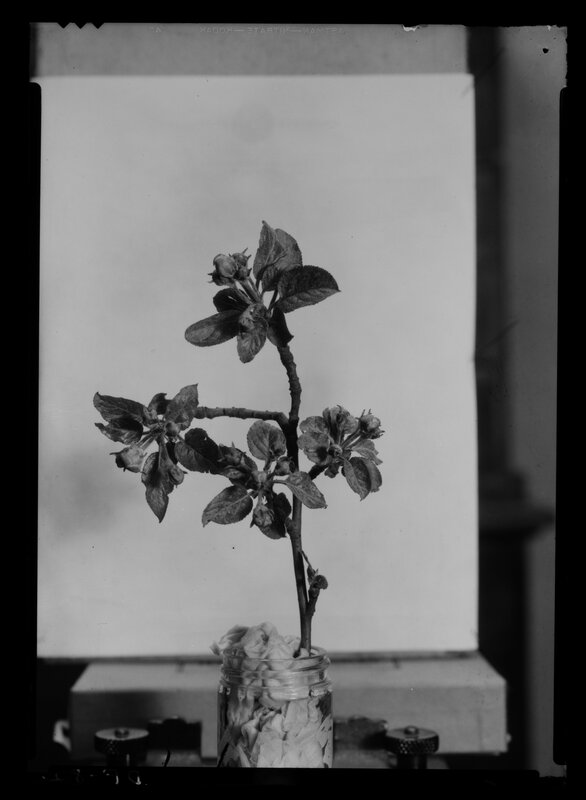 Apples ready for calyx spraying.